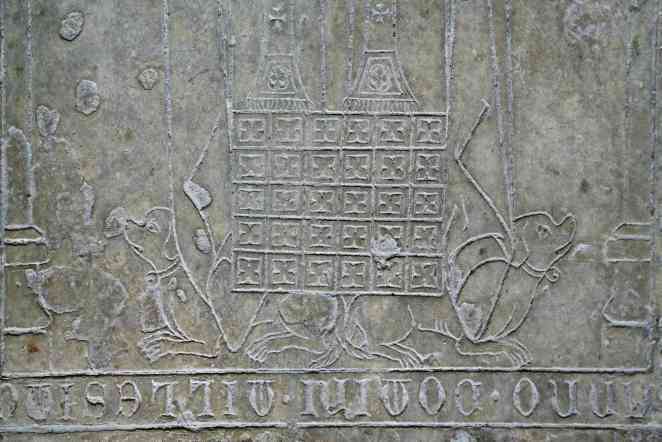 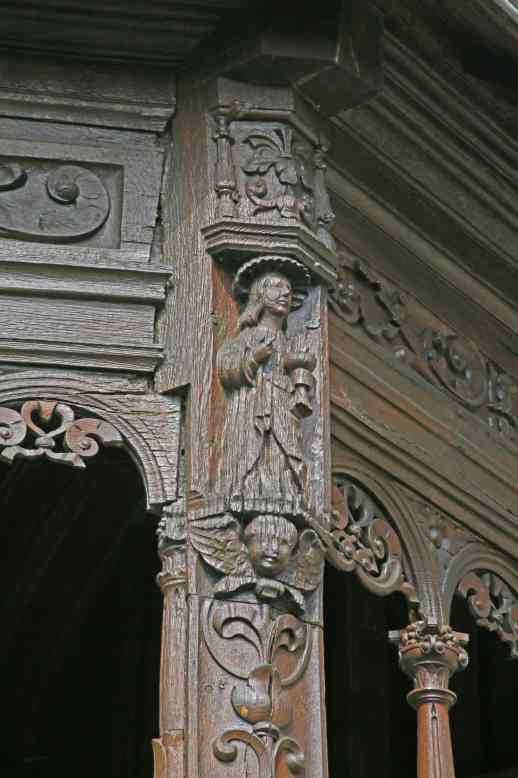 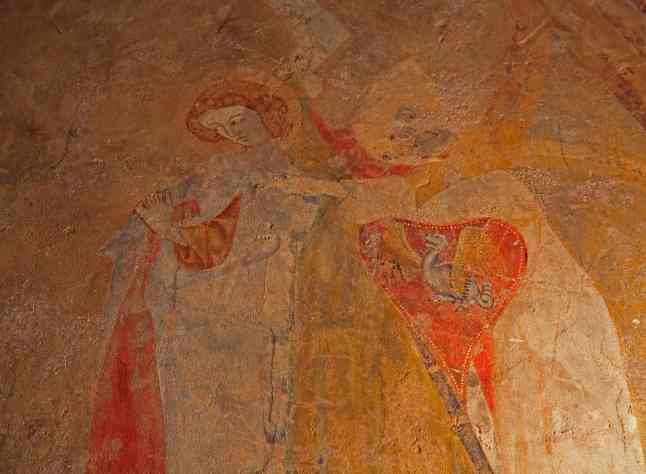 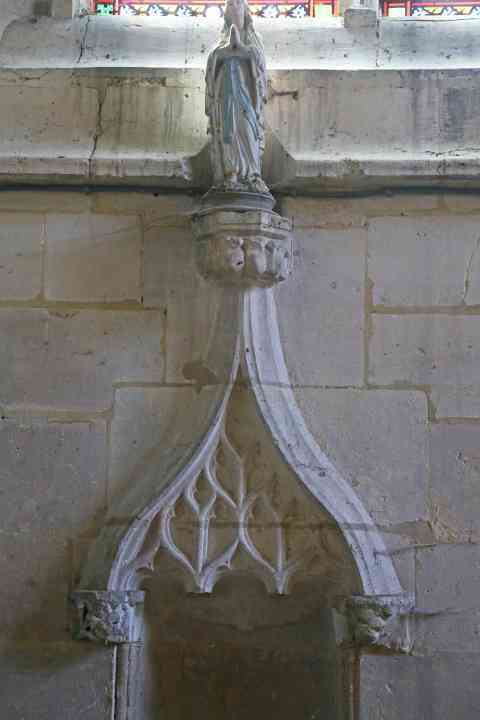 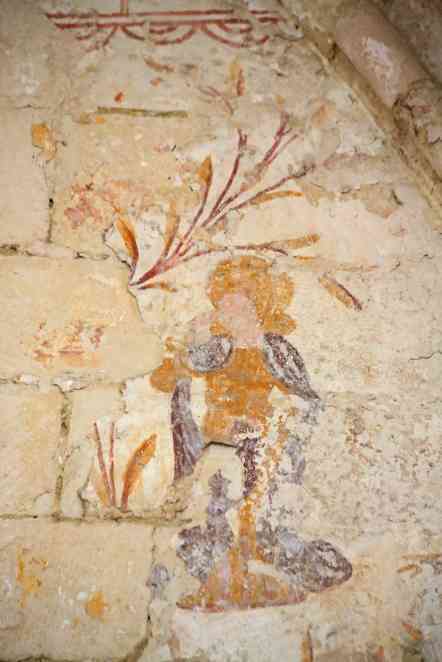 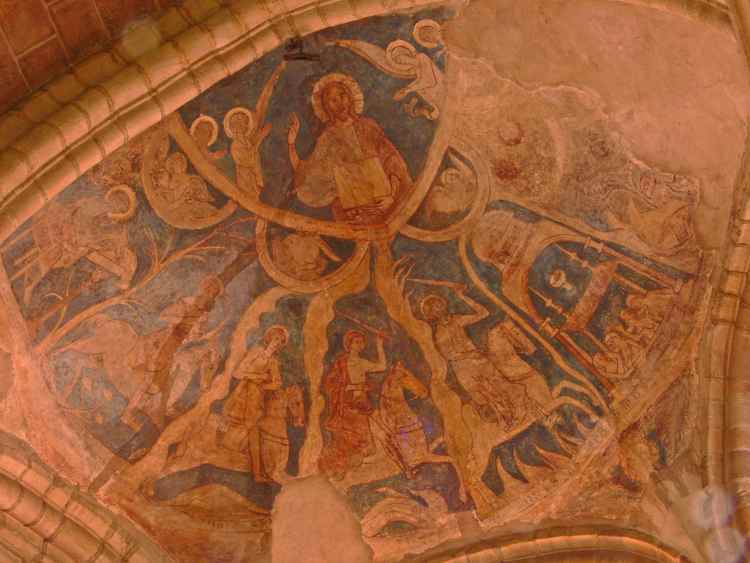 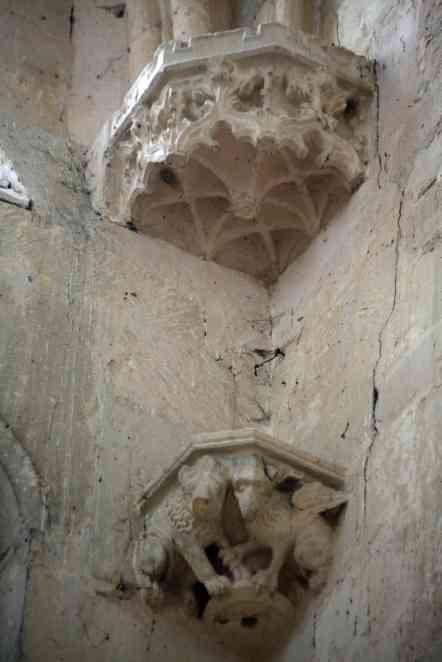 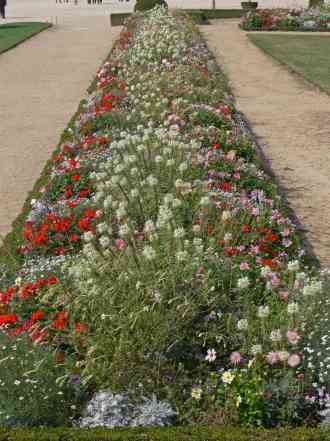 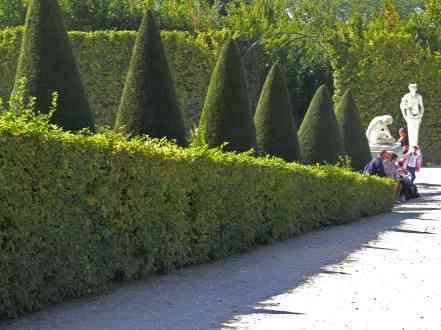 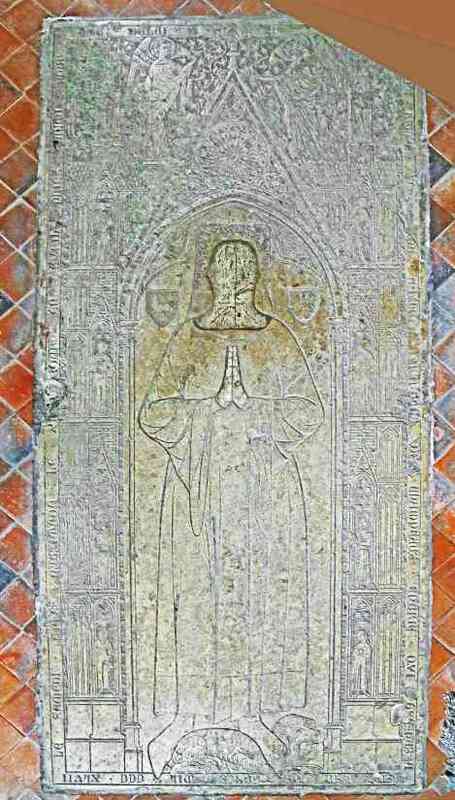 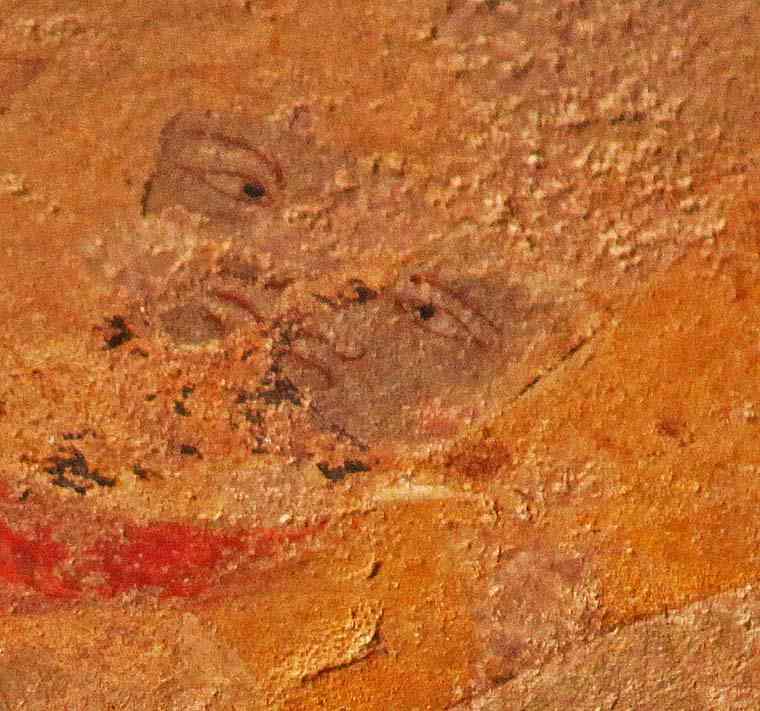 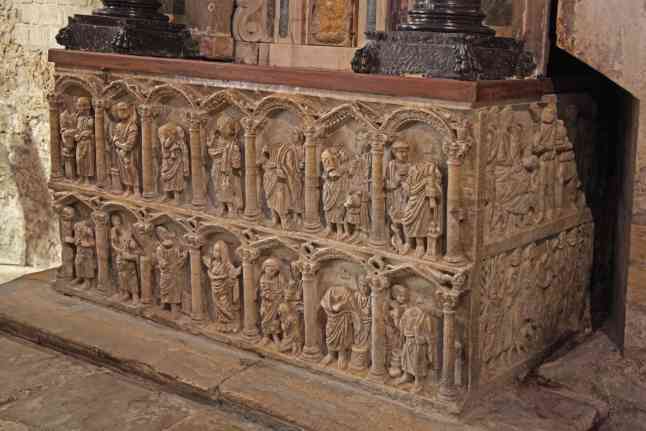 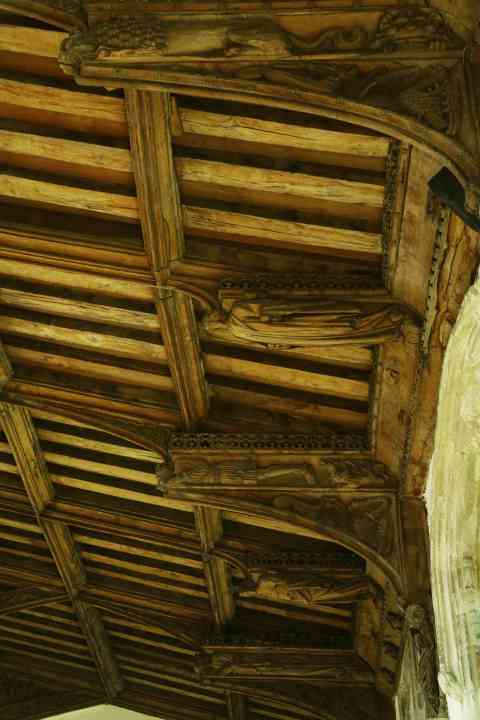 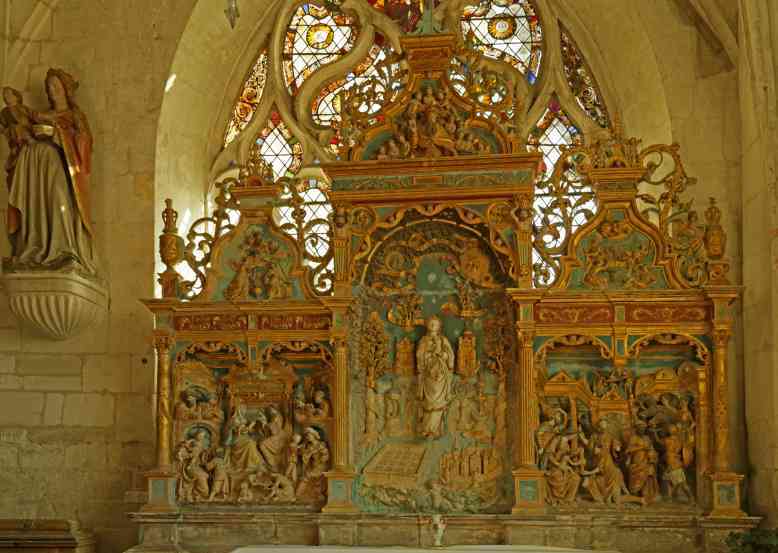 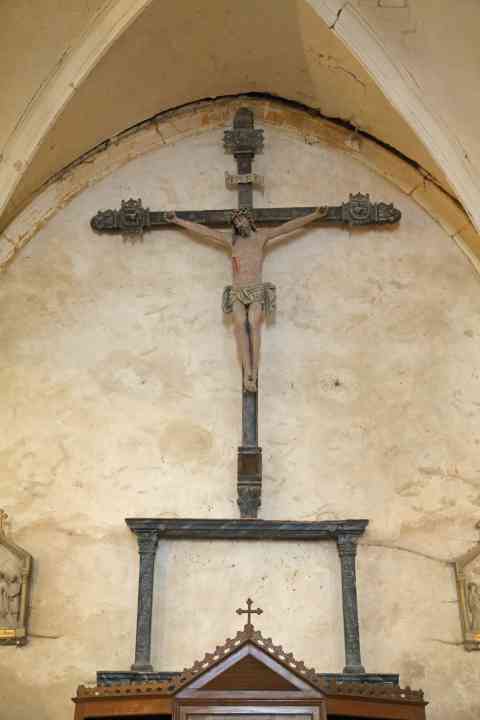 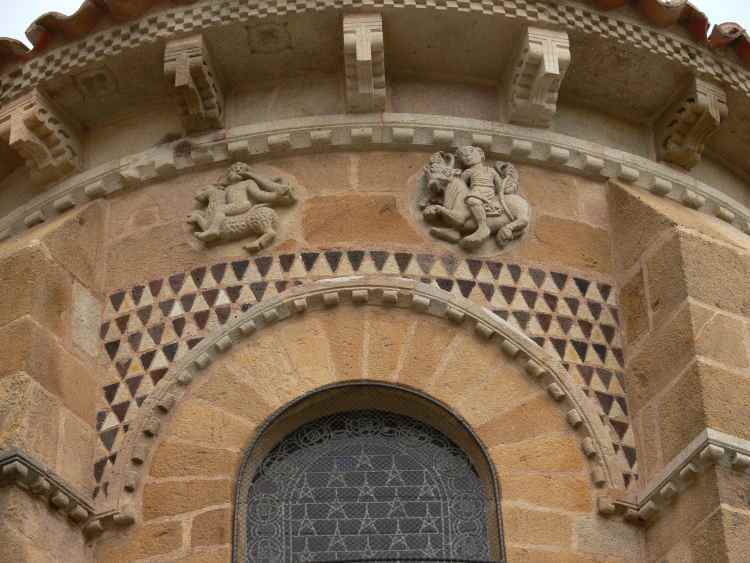 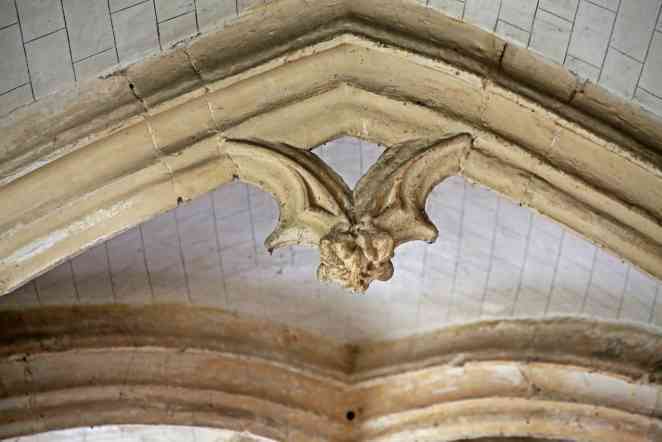 France Auxon eglise St Mary Magdalene? 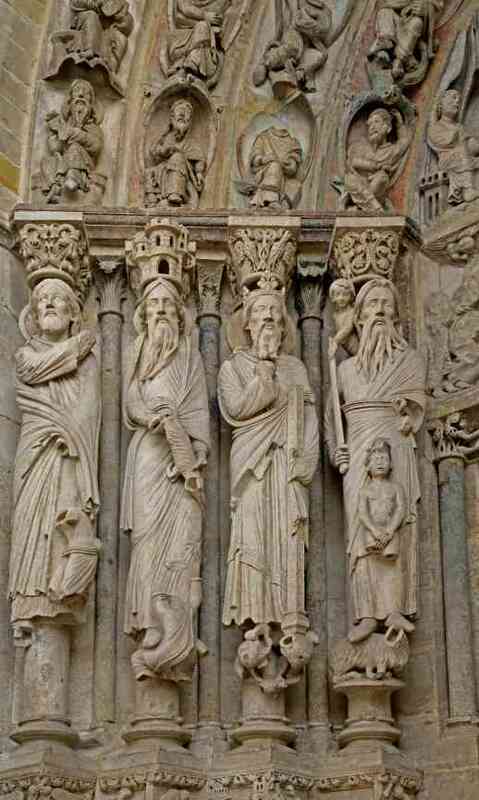 France Chartres Cathedral Crypt: the "Black Virgin"
France Reims Cathedral West façade - right portal right side: Simeon, John the Baptist, Isaiah, Moses, Abraham, and Aaron. 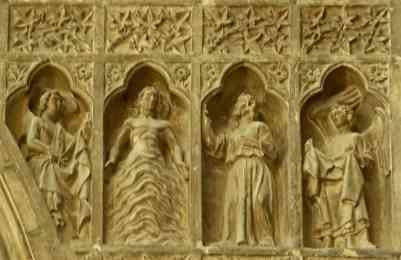 Britain Wells Cathedral West front 3 sculptured figures - Souls rising at Last Judgement? 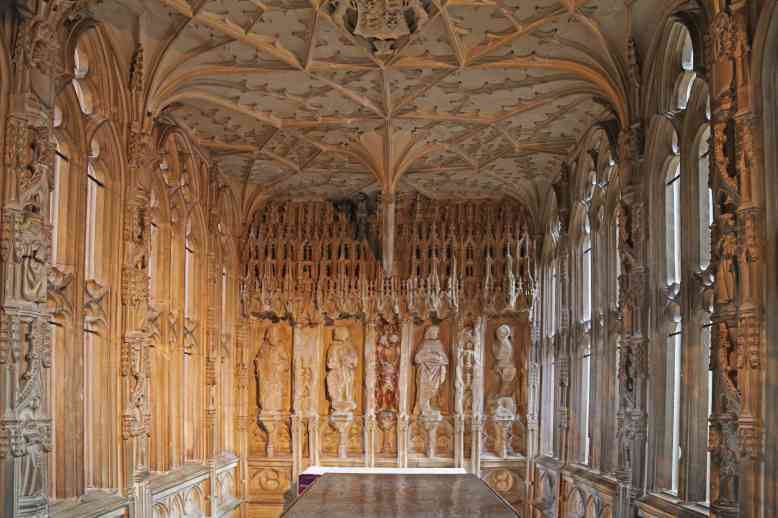 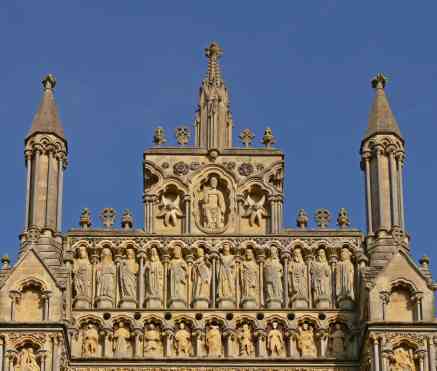 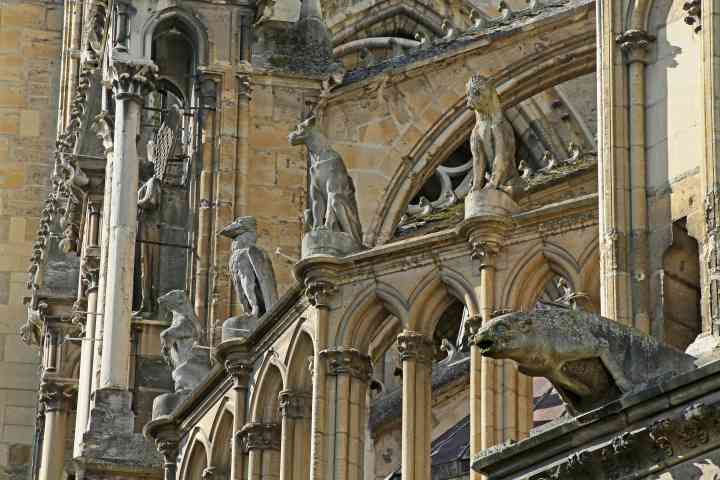 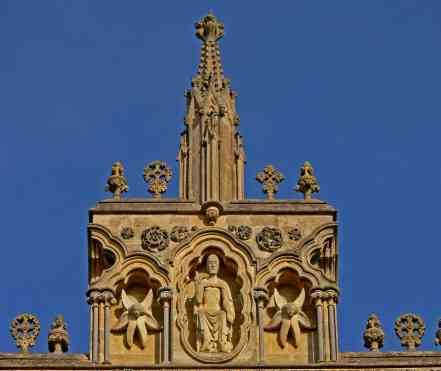 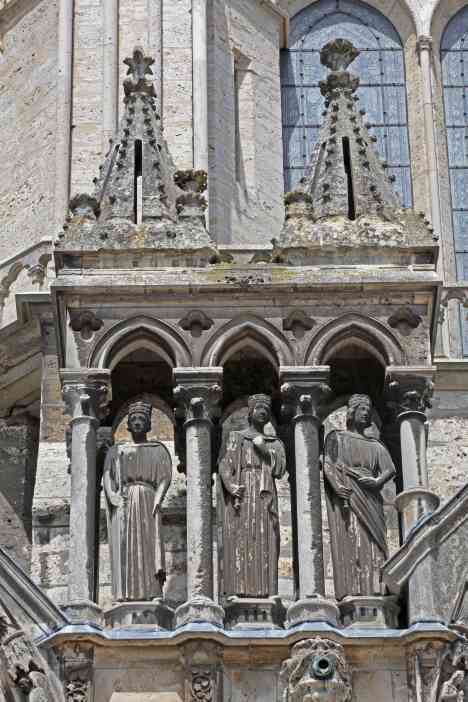 Britain Wells Cathedral West front 2 sculptured figures - Souls rising at Last Judgement? 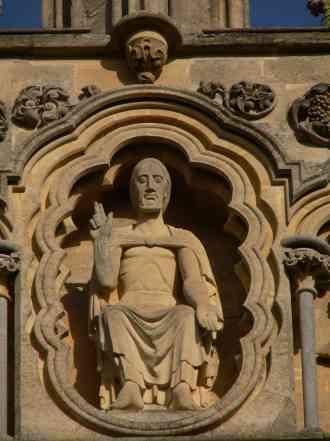 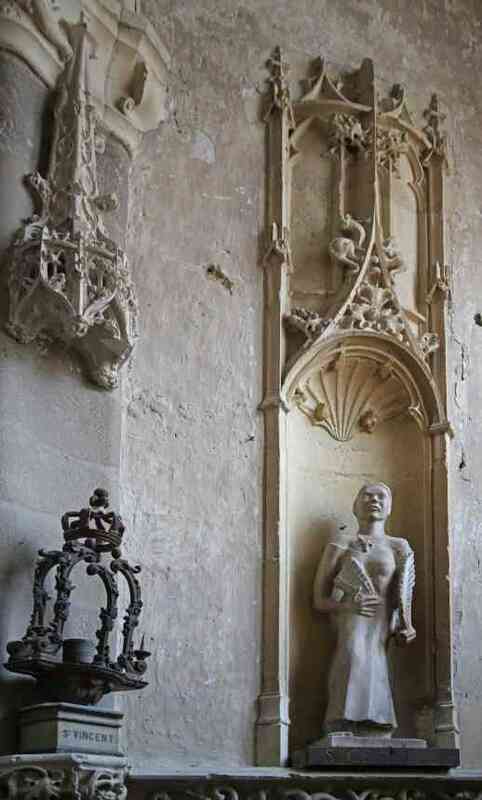 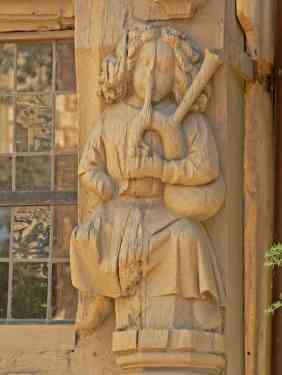 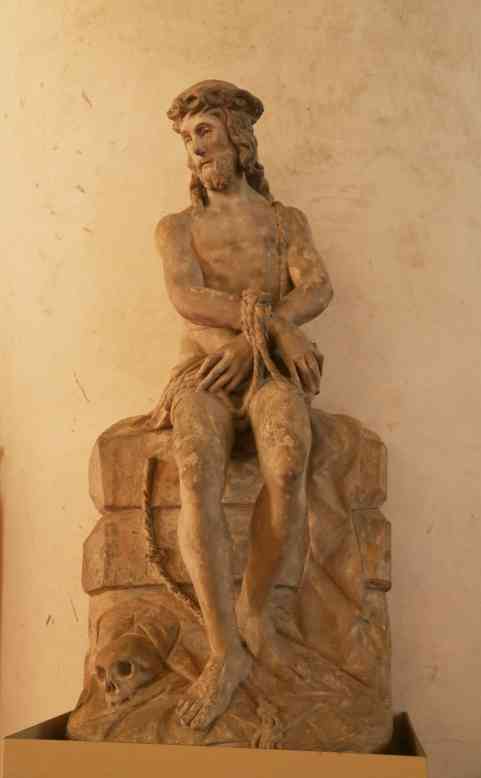 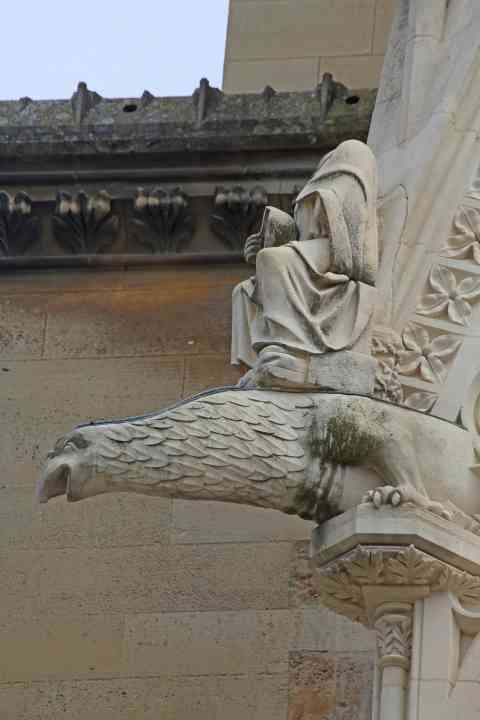 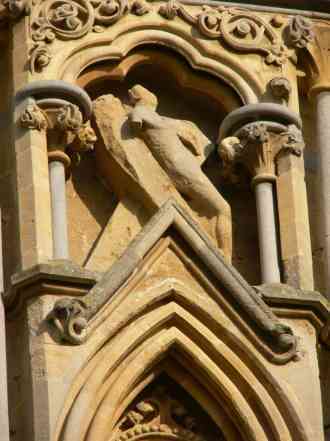 Britain Wells Cathedral West front 1 sculptured figure - Soul rising at Last Judgement? 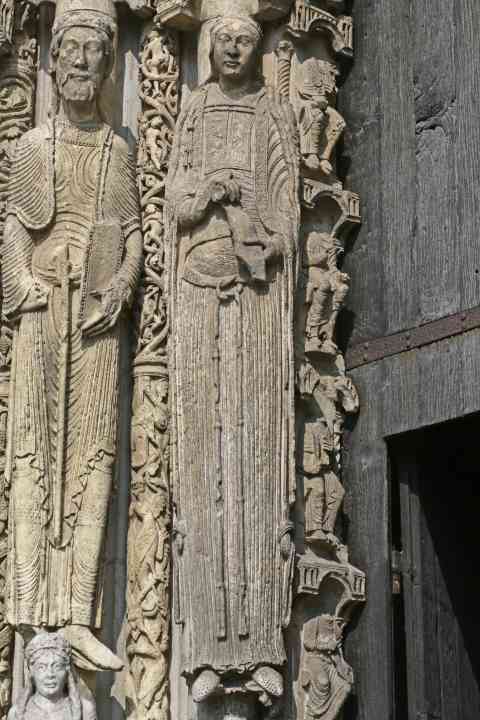 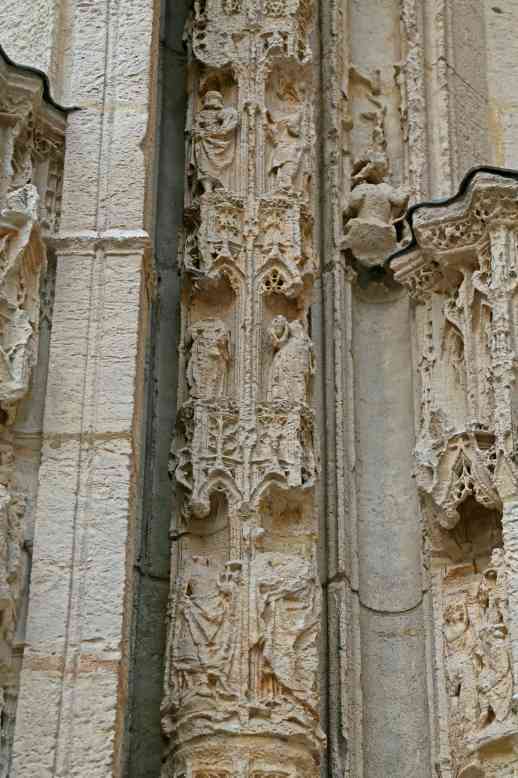 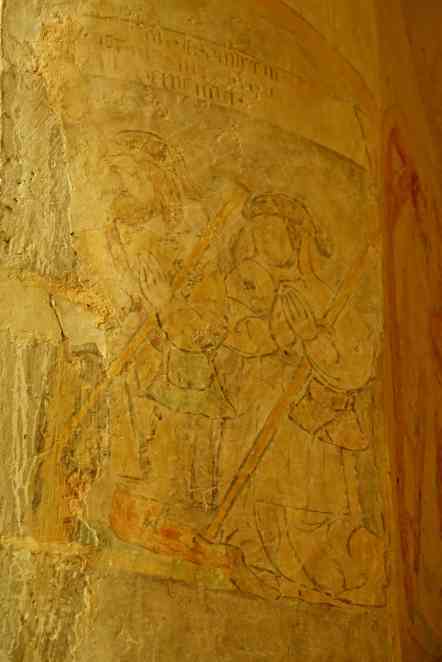 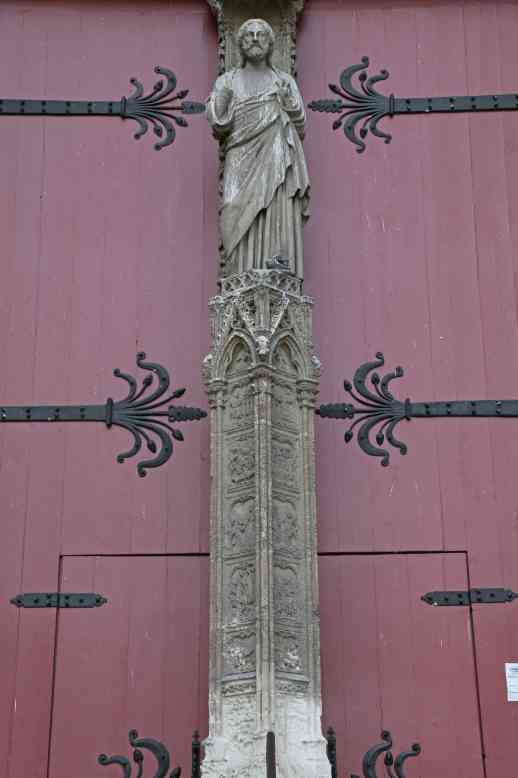 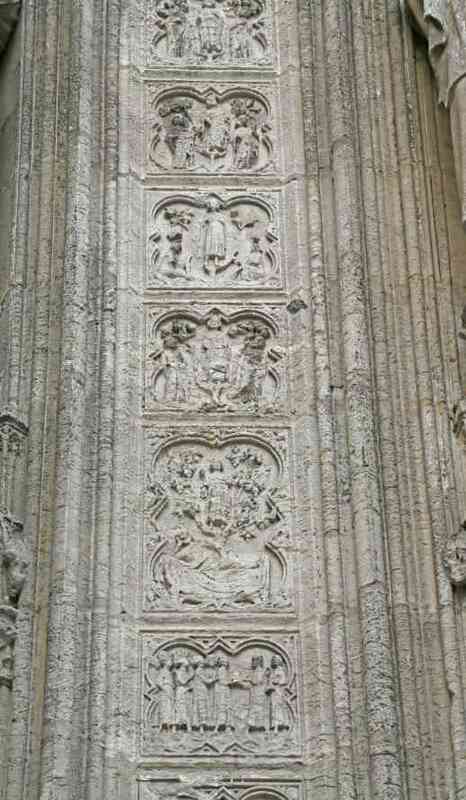 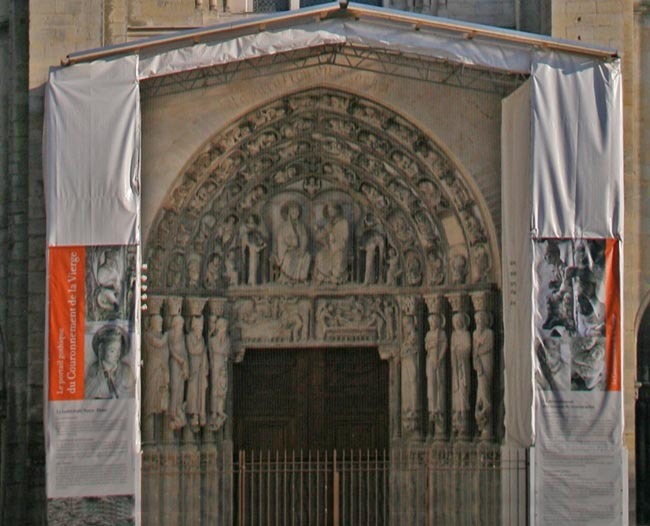 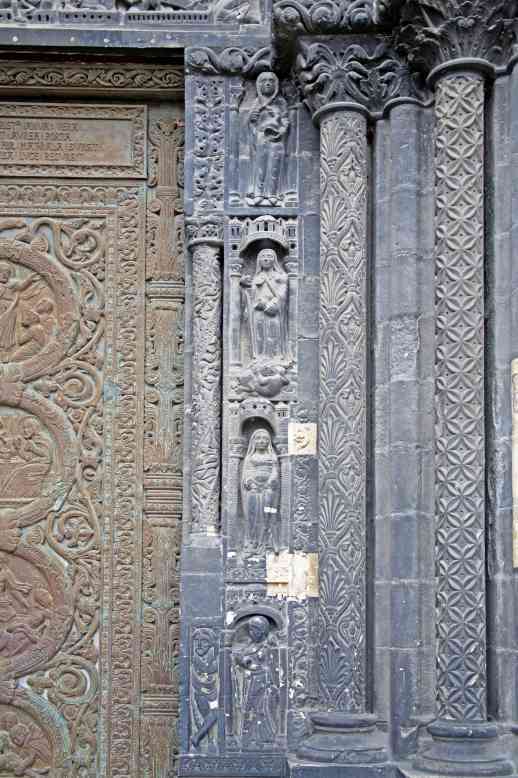 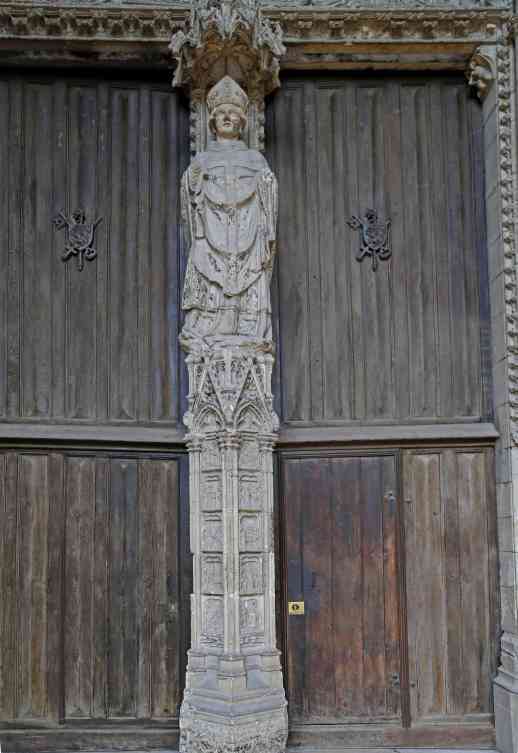 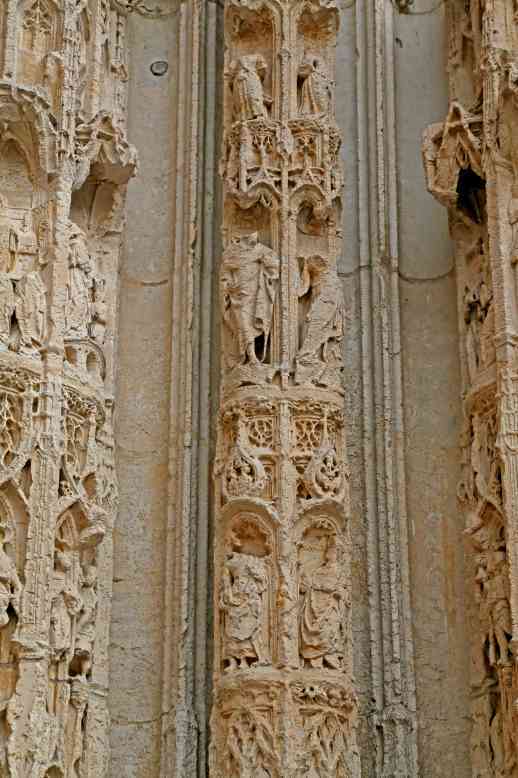 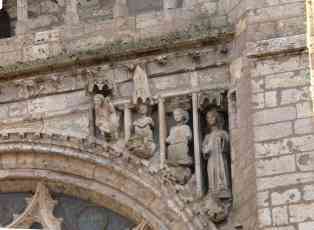 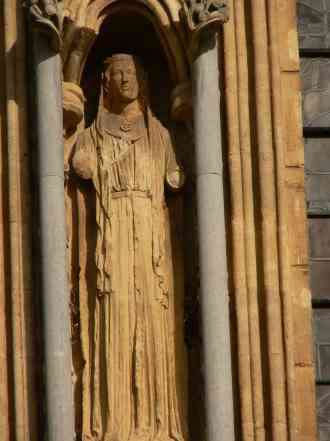 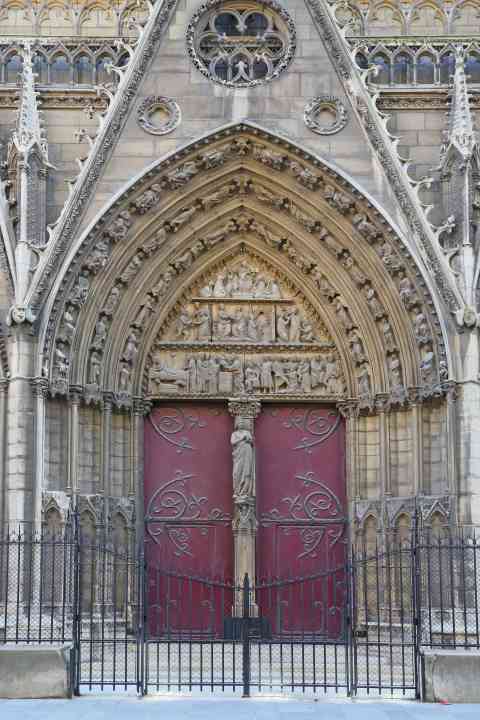 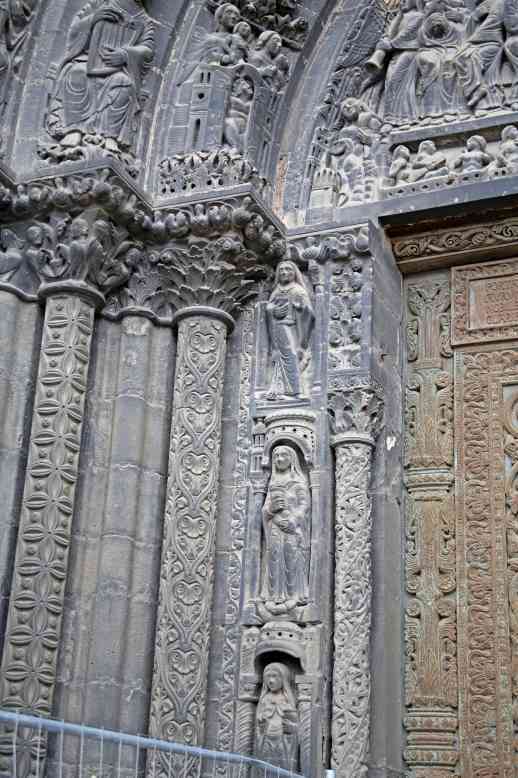 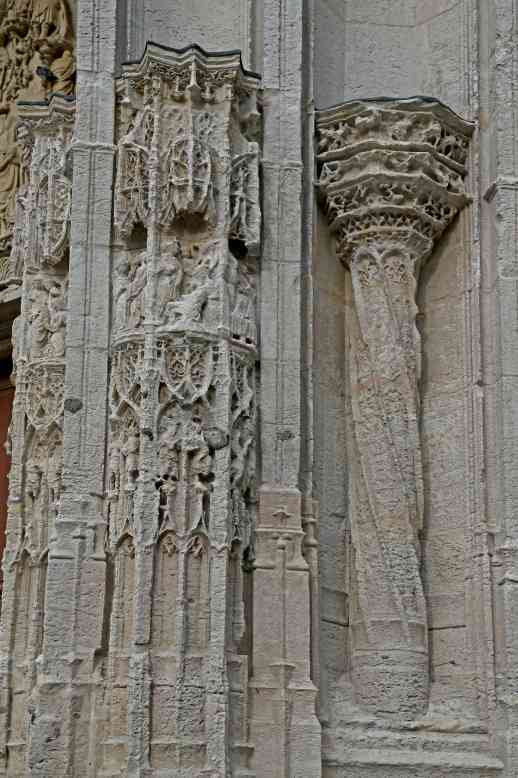 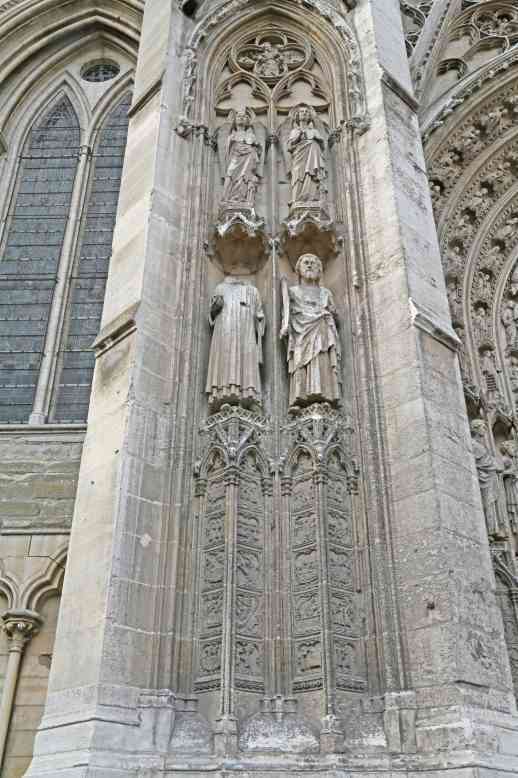 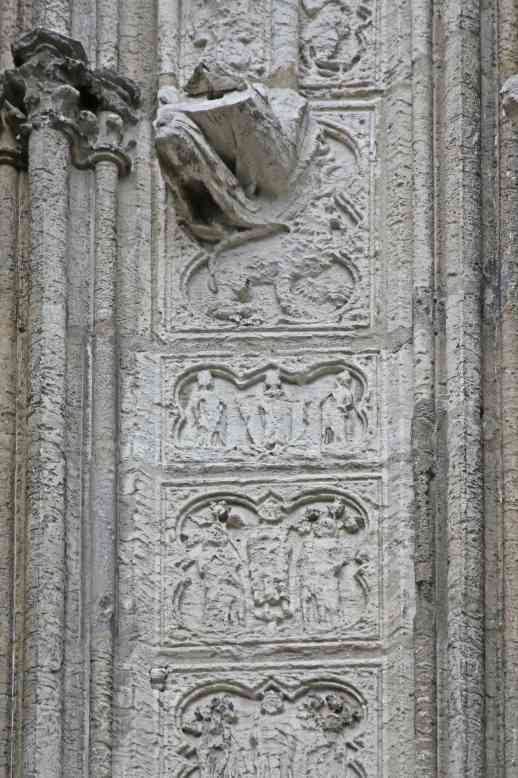 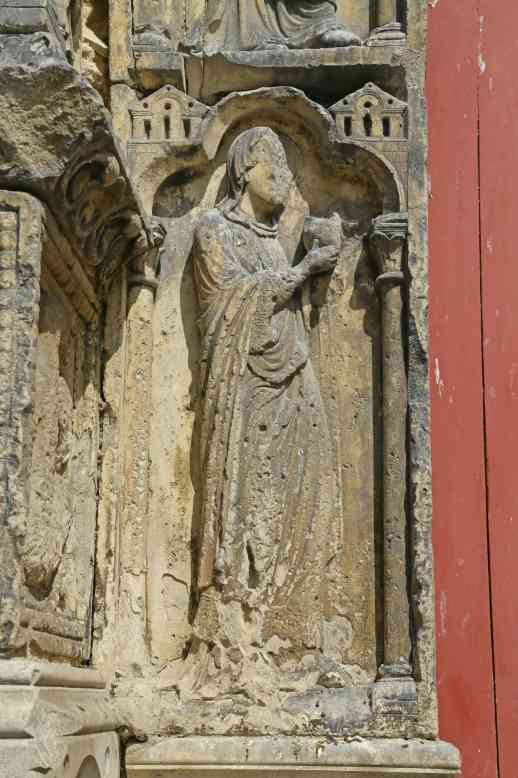 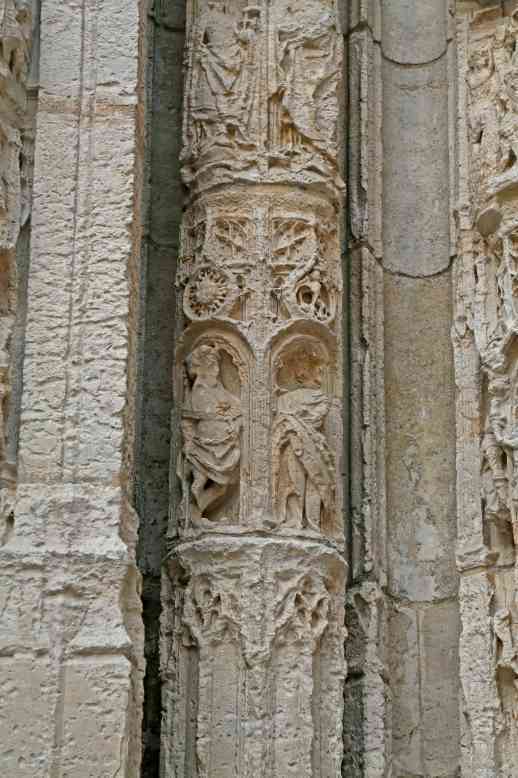 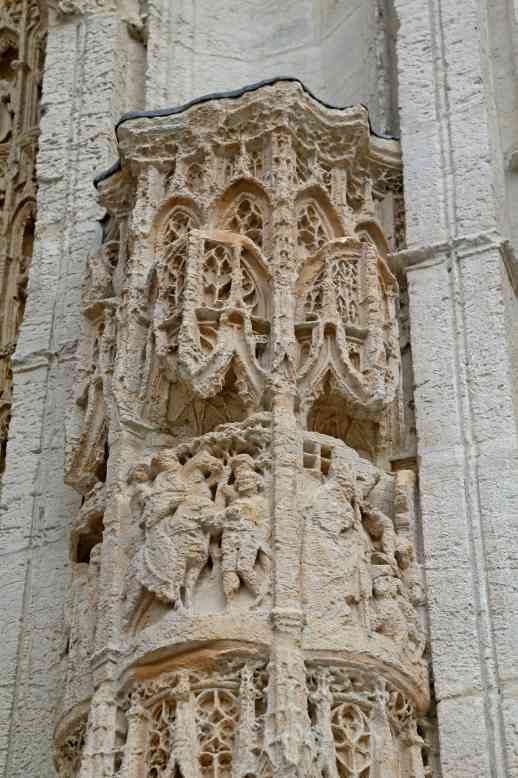 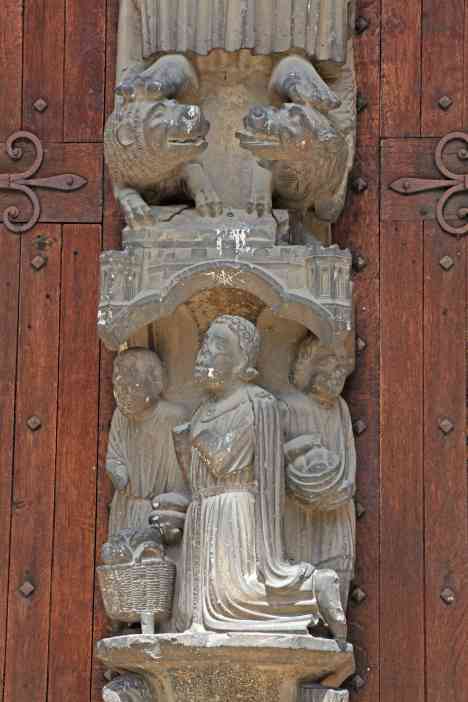 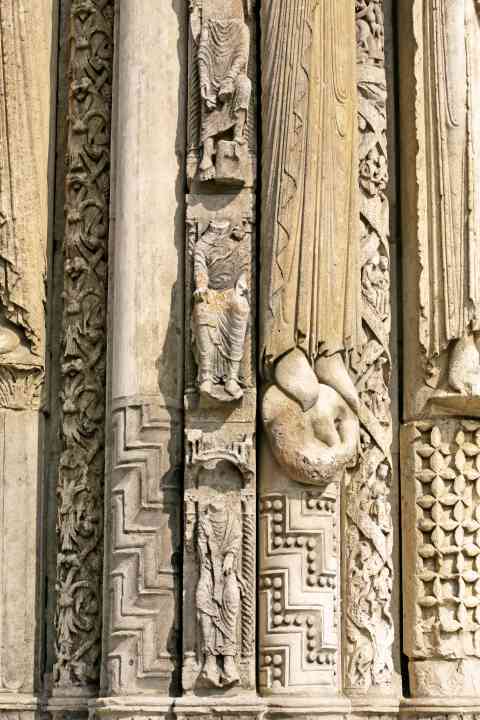 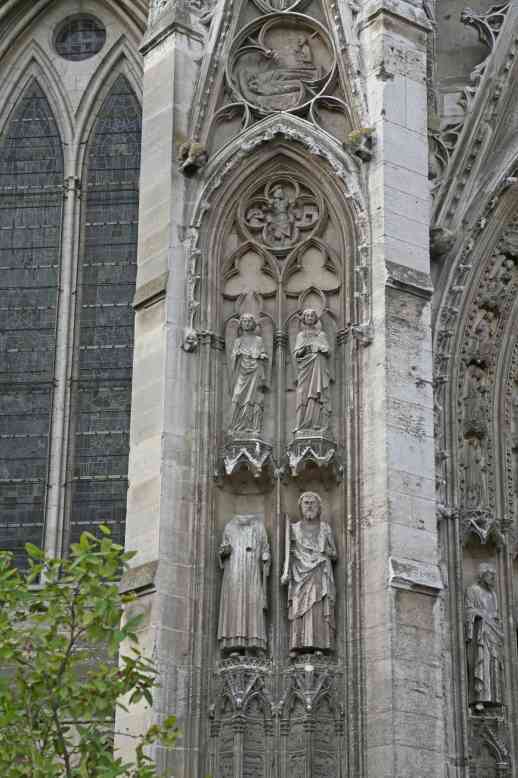 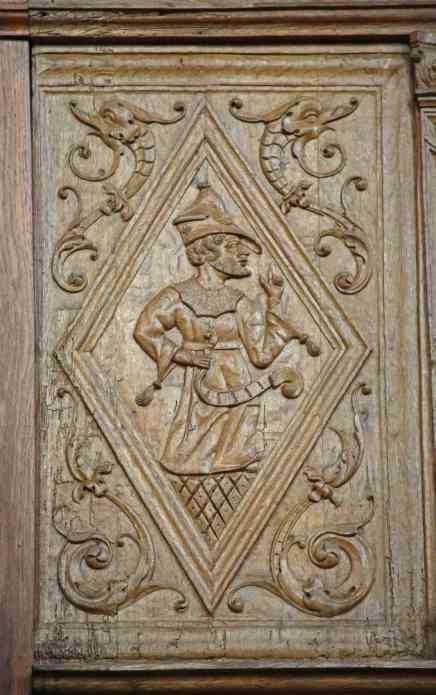 France Amiens Cathedral South door: right archivolt figures: a woman with sword and head - Salome? 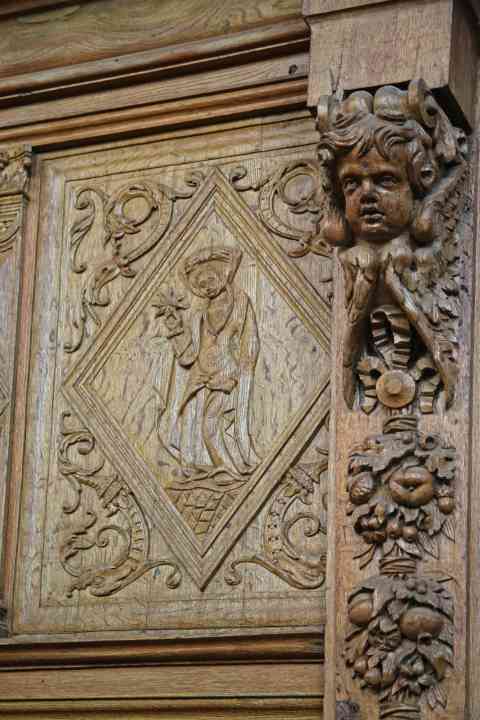 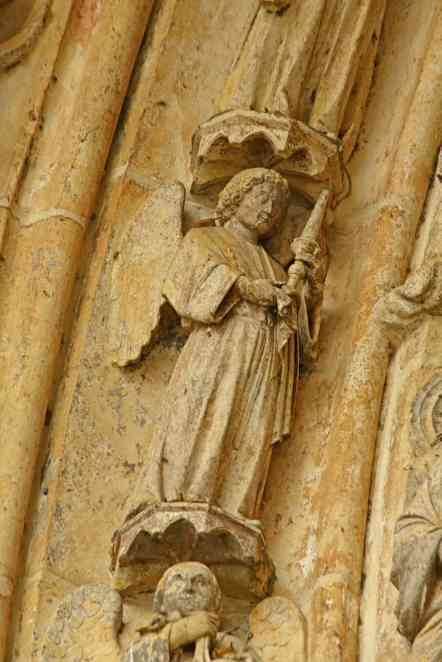 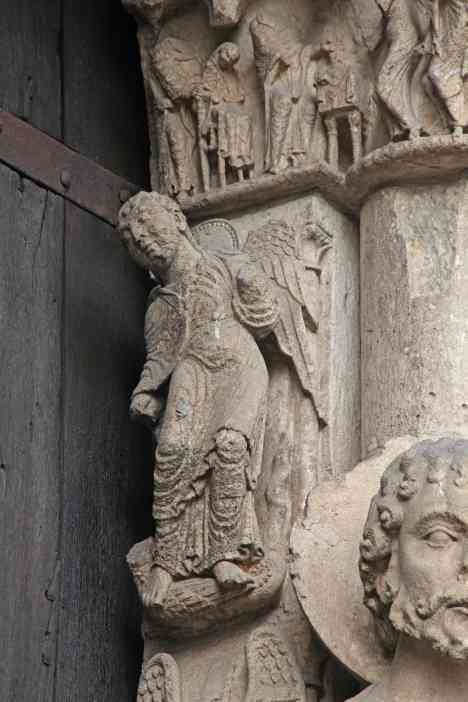 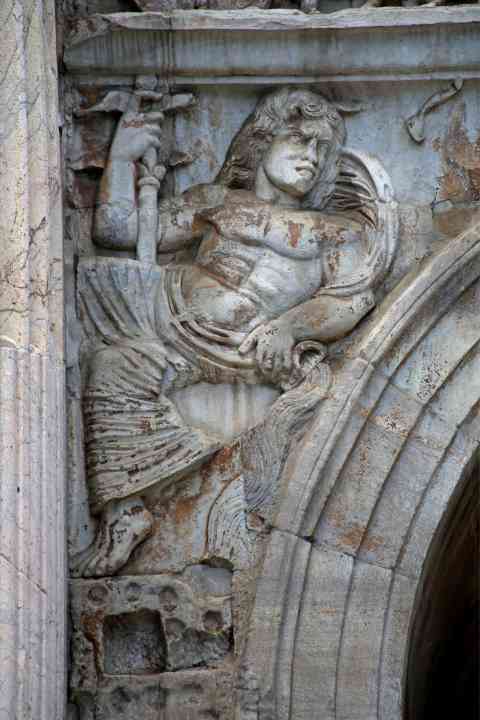 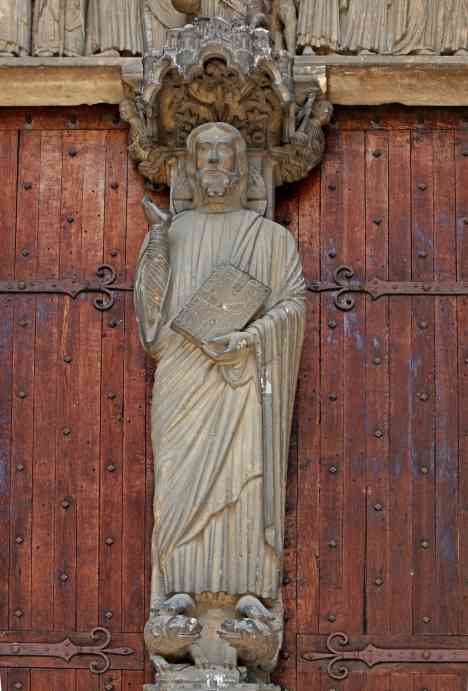 France Amiens Cathedral West door: center door right archivolts: a figure on a horse - St Michael with scales? 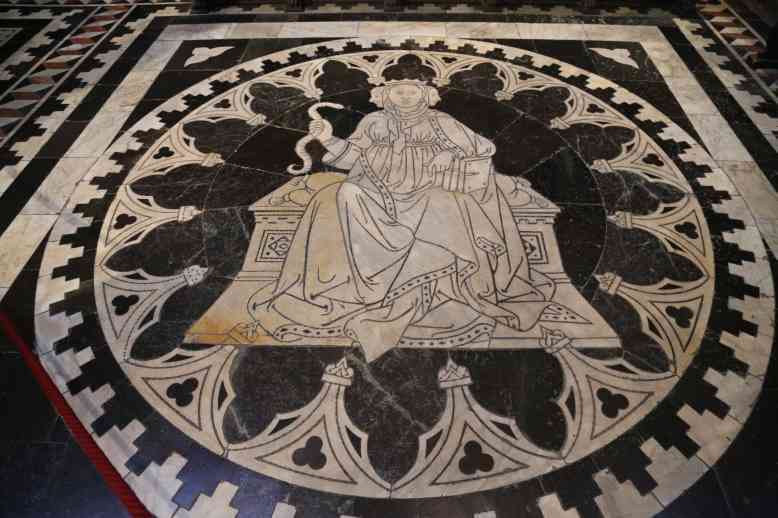 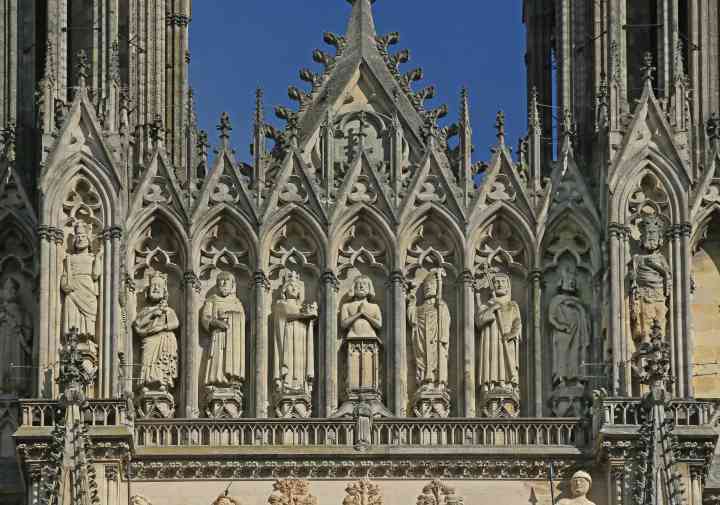 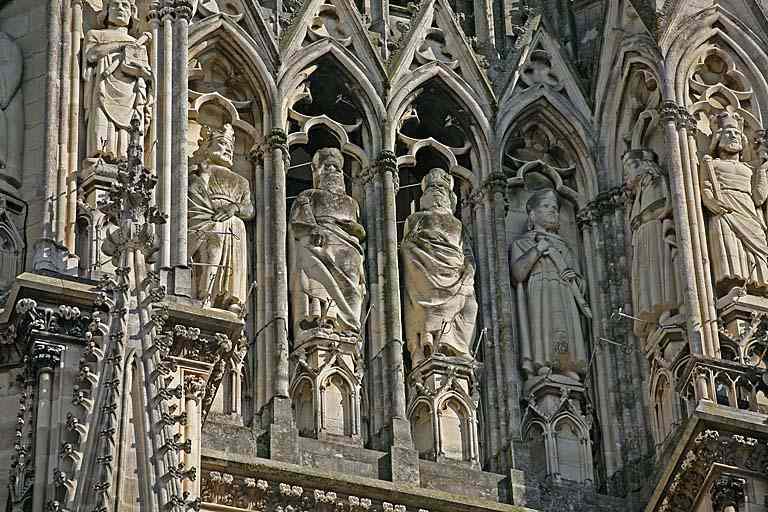 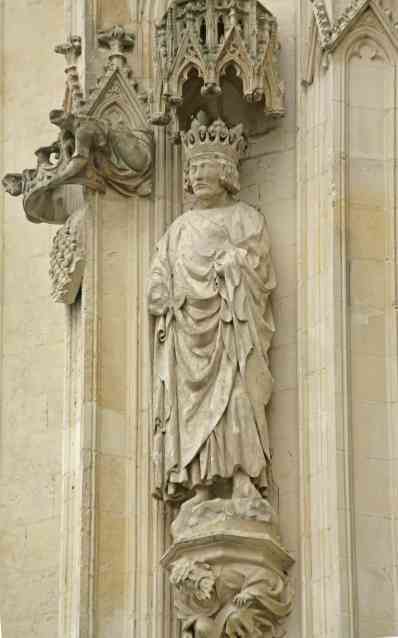 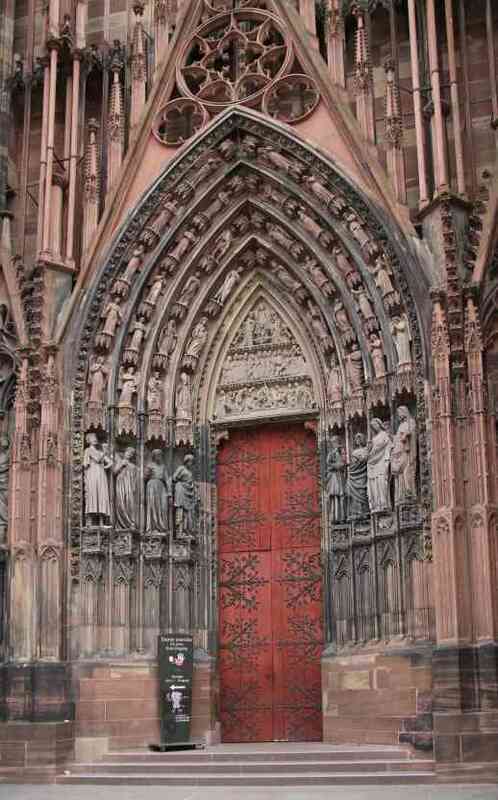 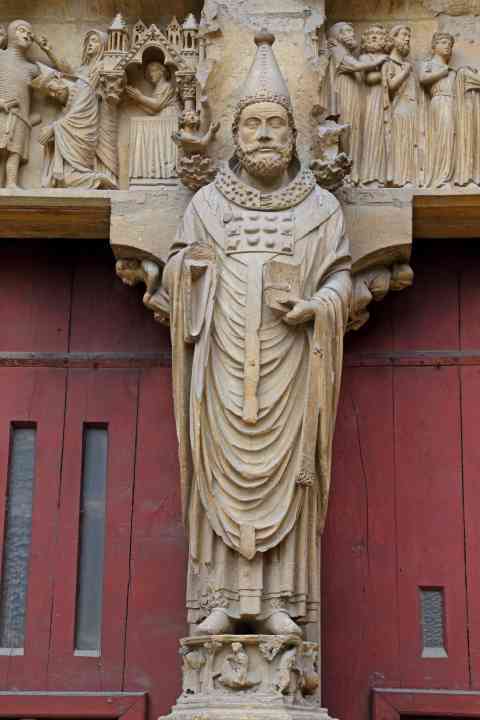 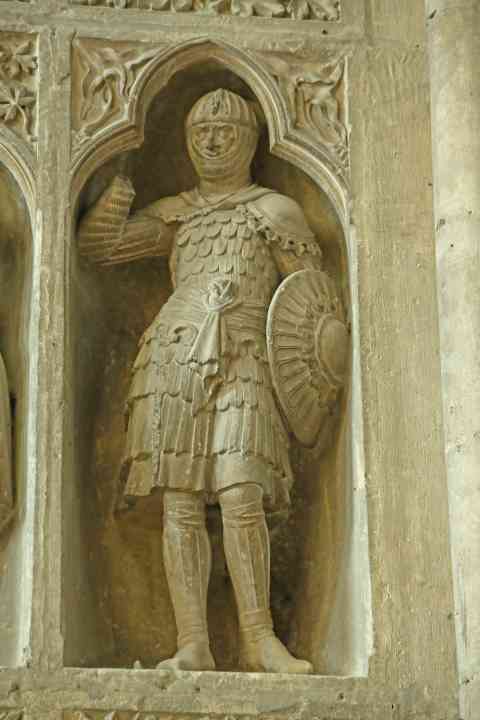 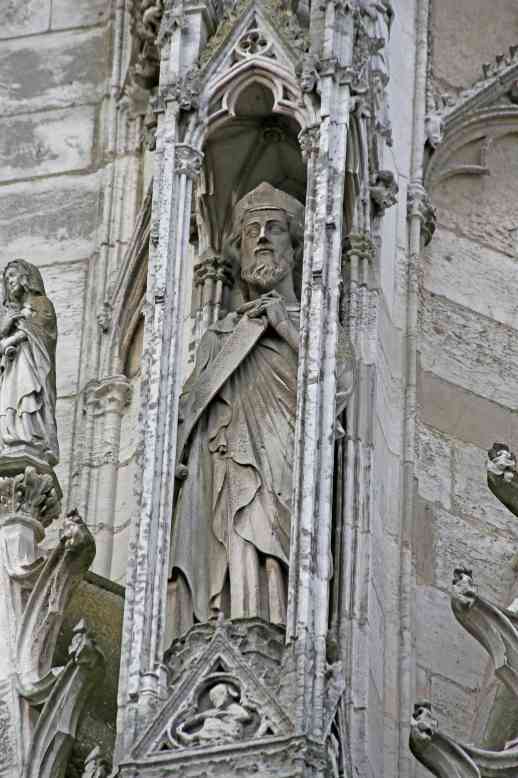 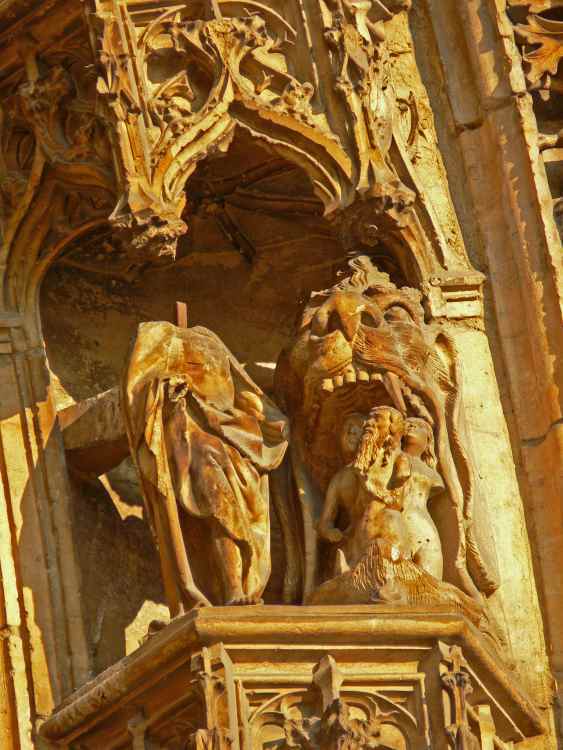 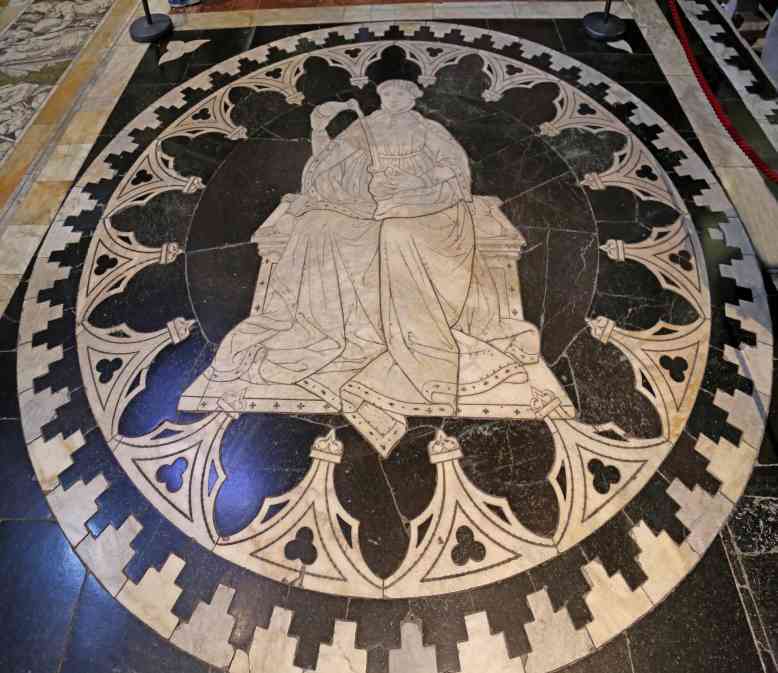 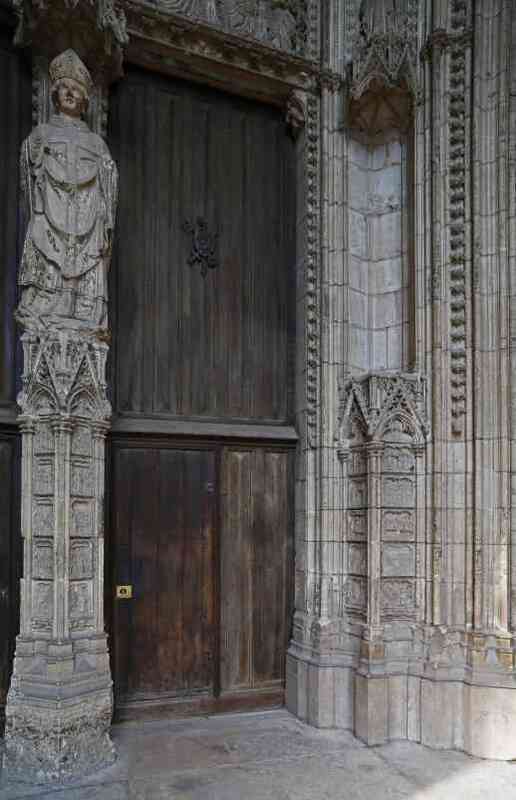 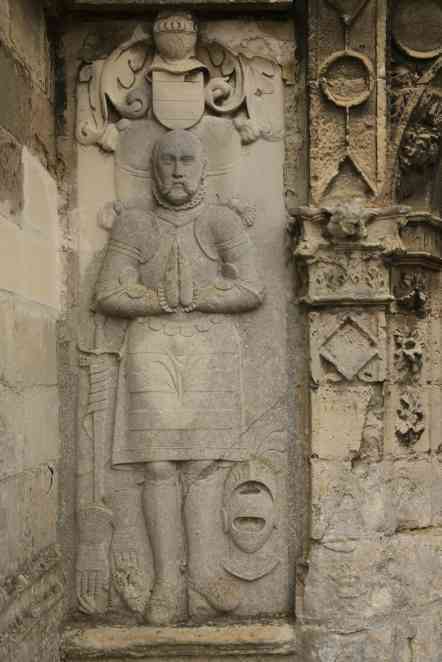 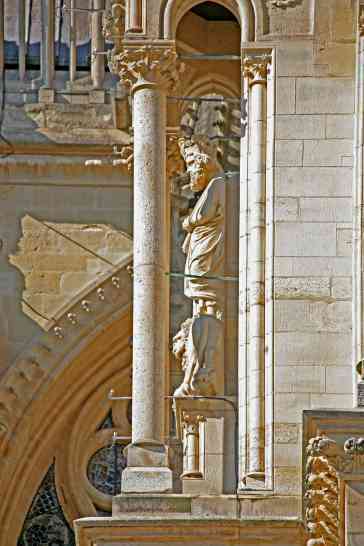 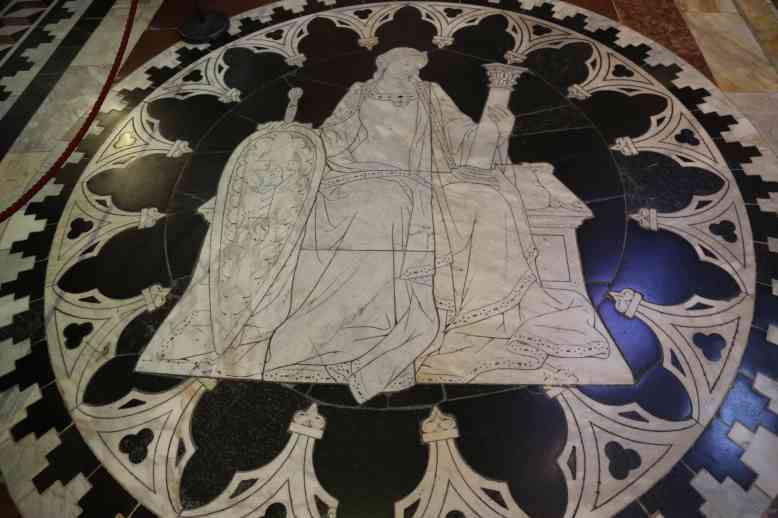 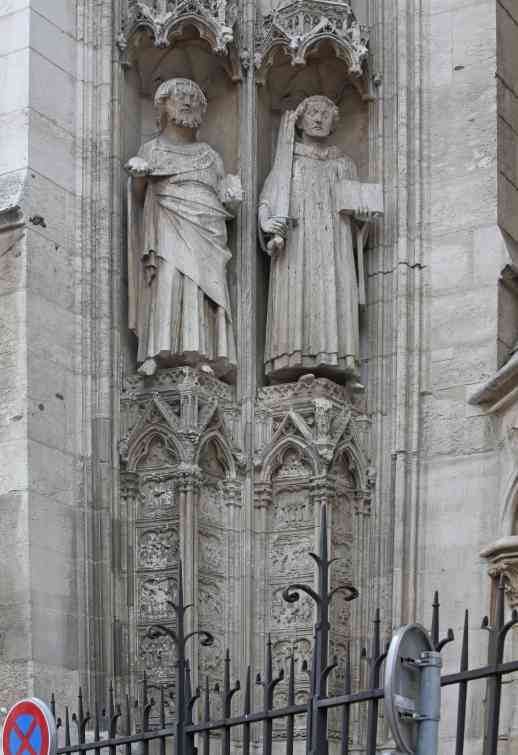 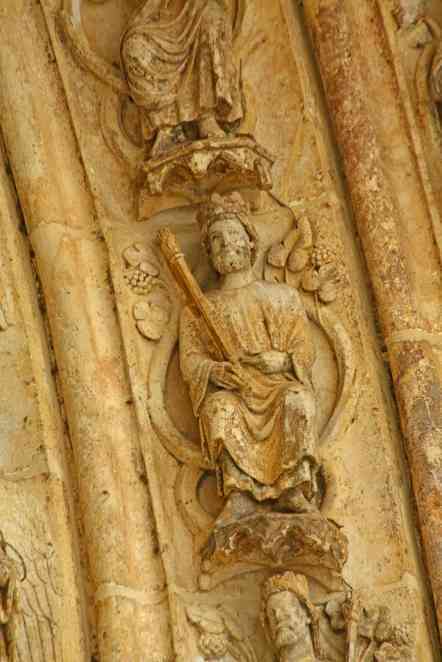 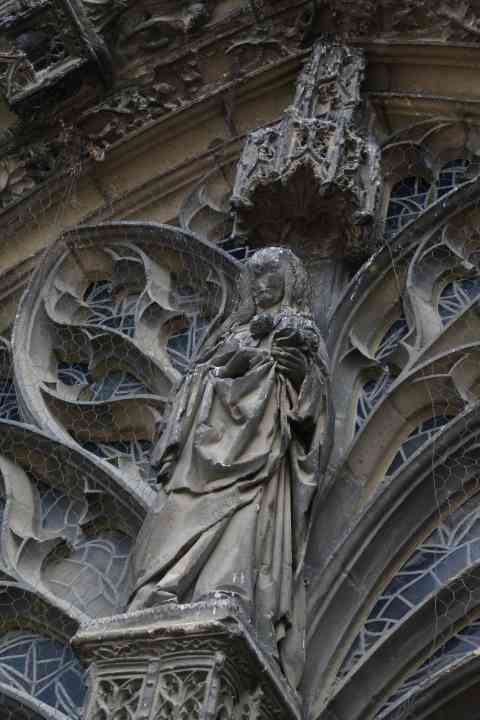 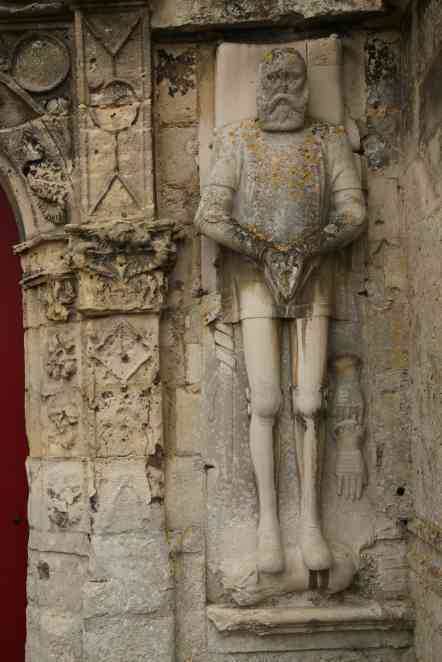 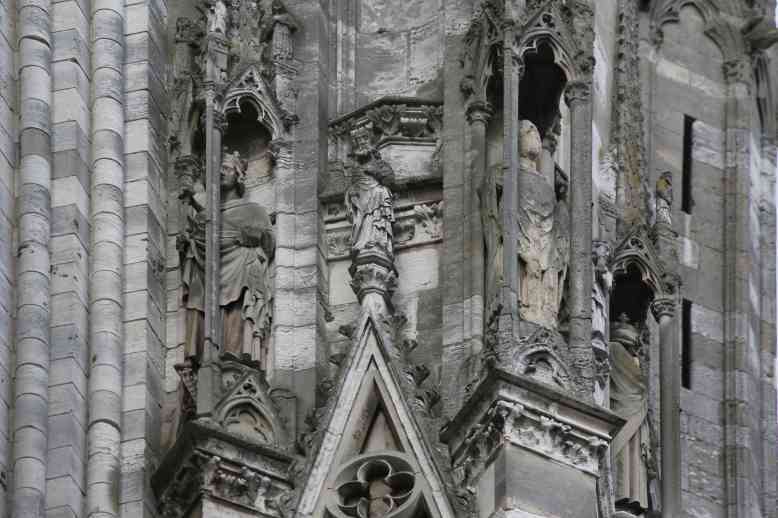 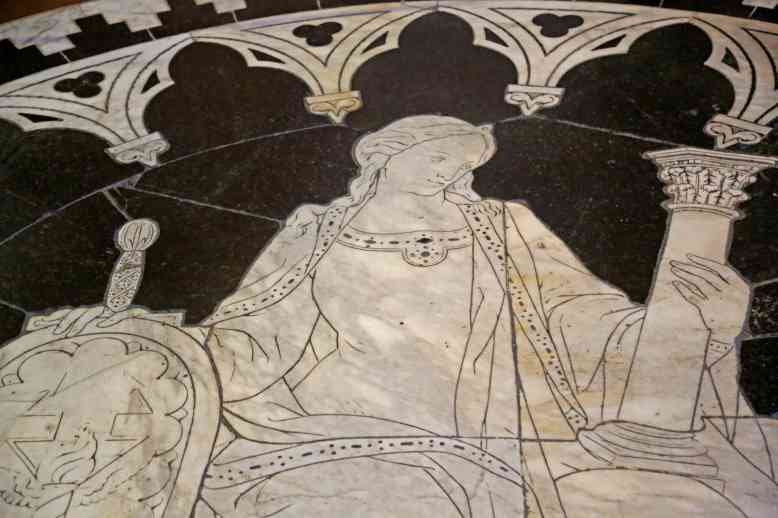 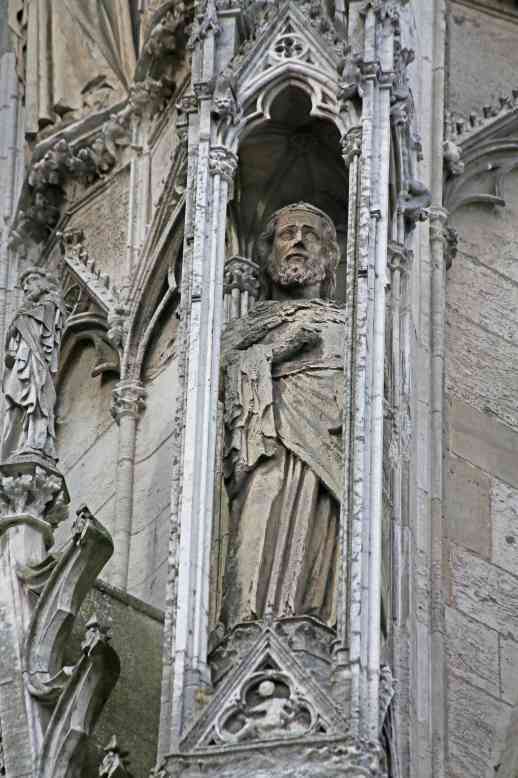 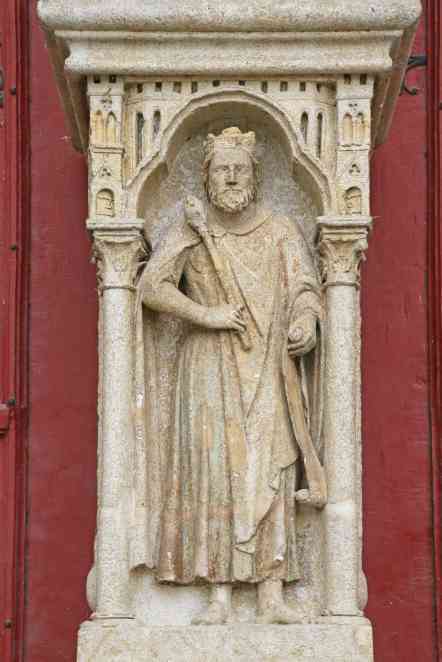 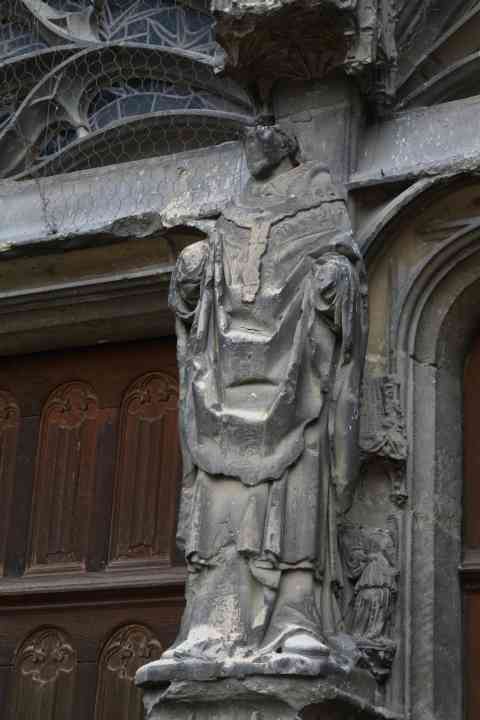 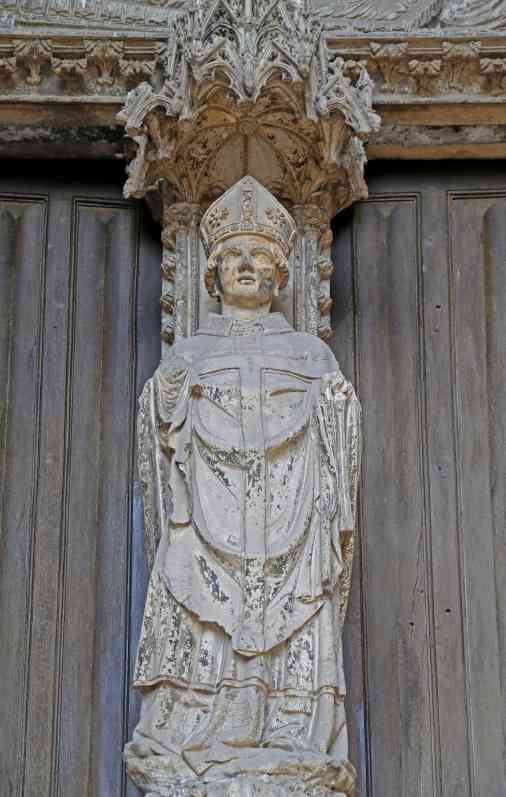 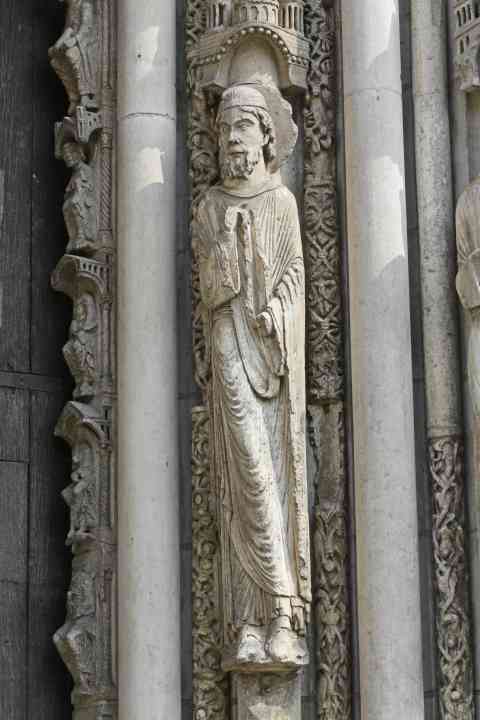 France Amiens Cathedral West door: center door right figure beneath statue: a king? 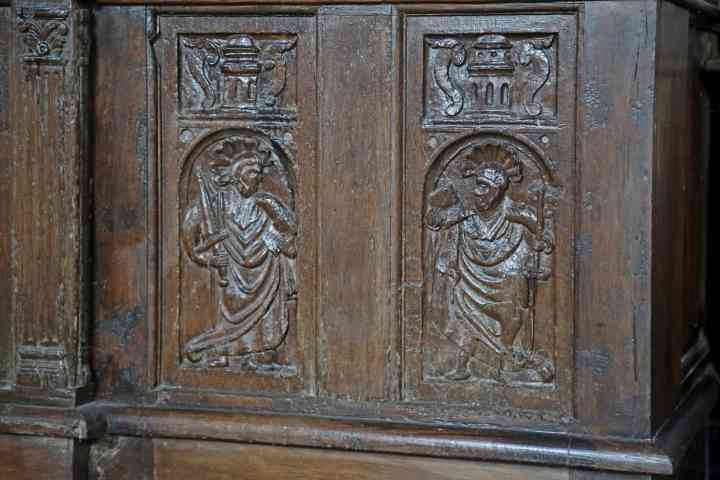 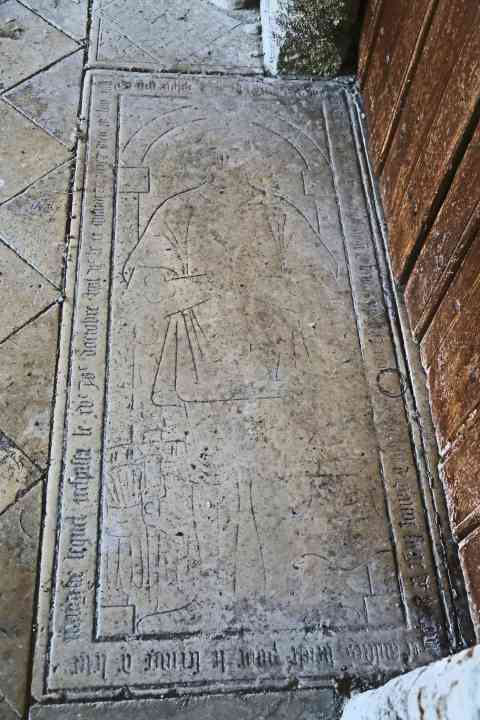 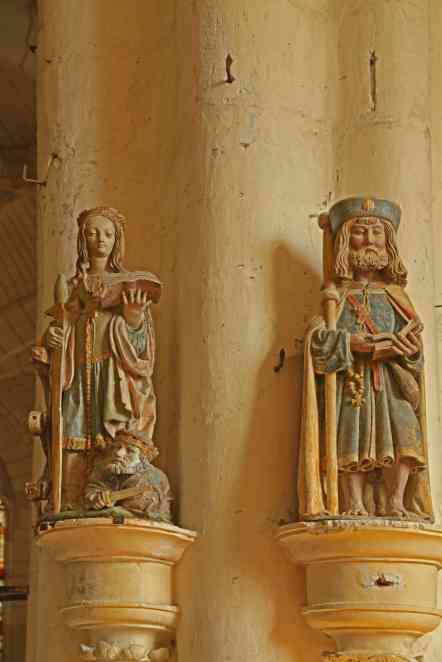 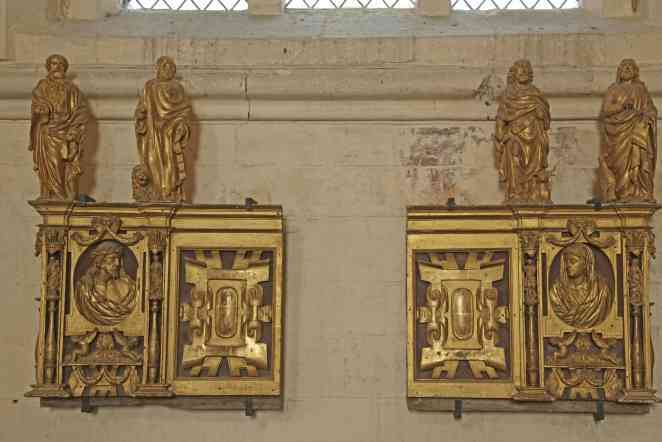 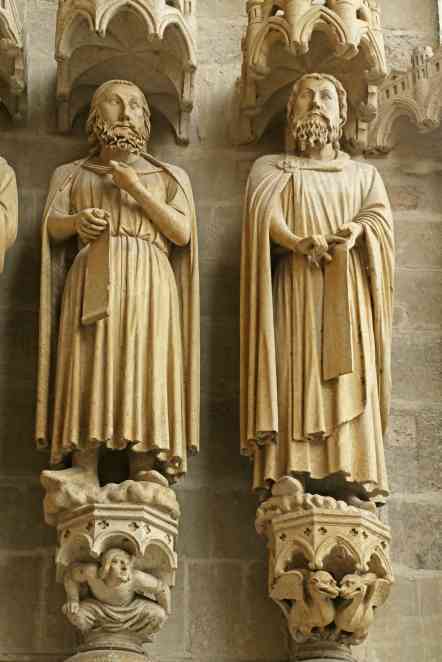 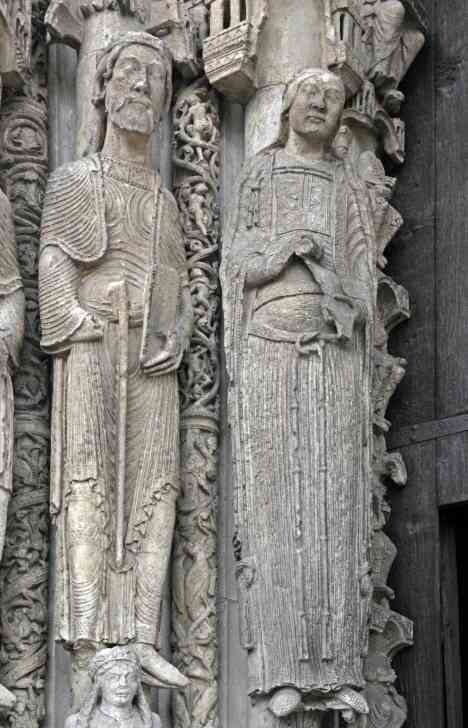 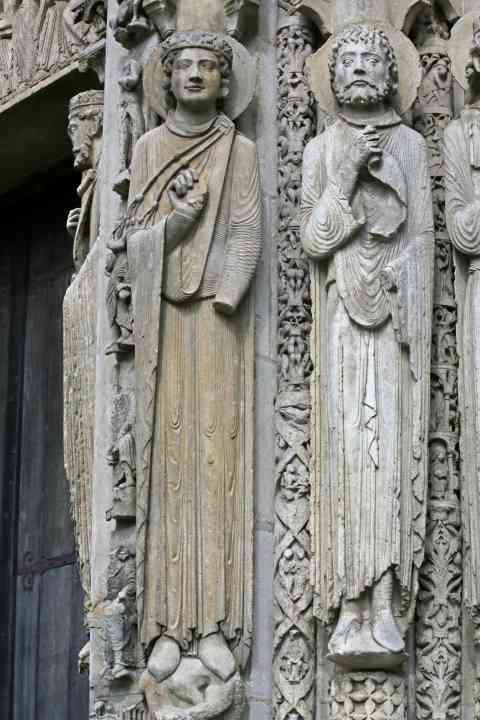 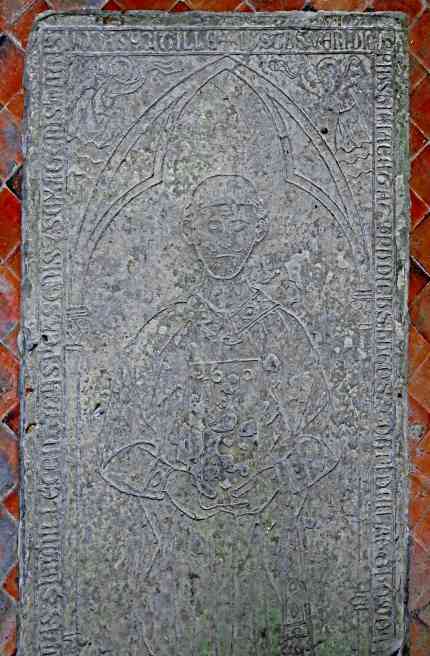 France Amiens Cathedral West door: left door right figure: A bishop - St Salve? 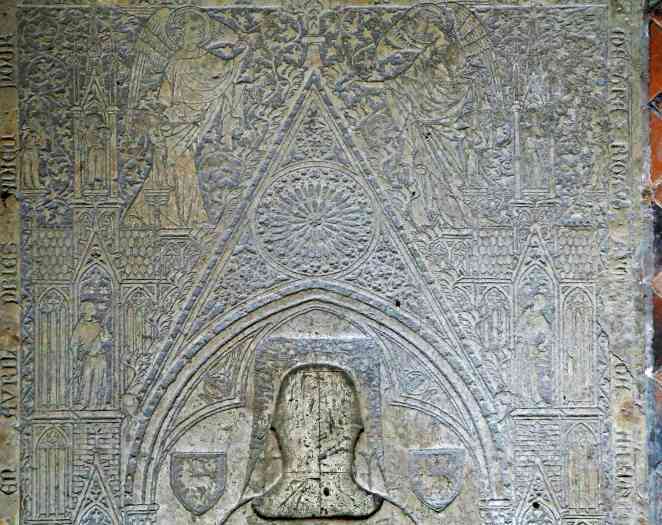 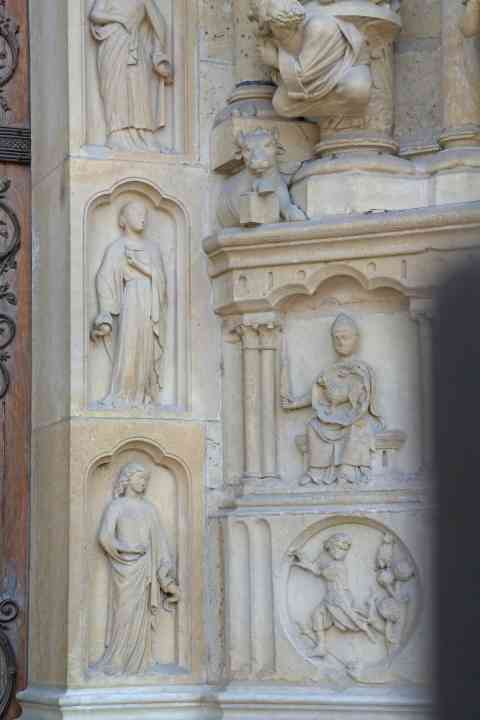 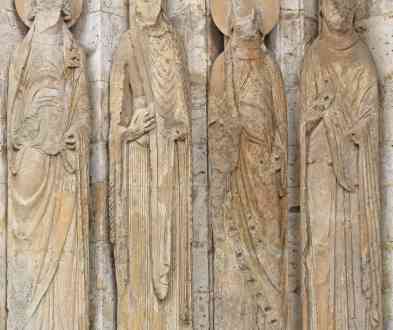 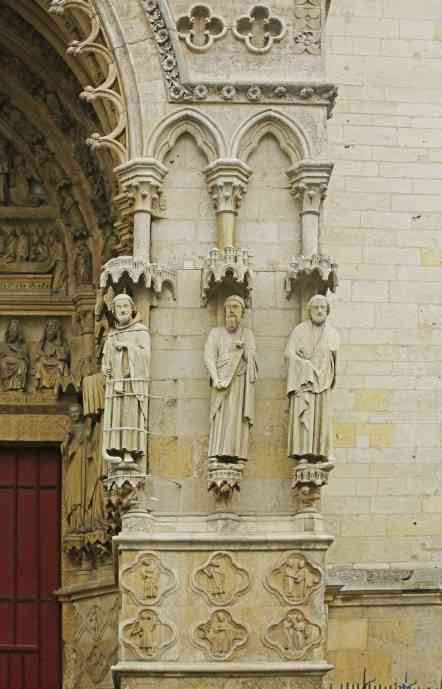 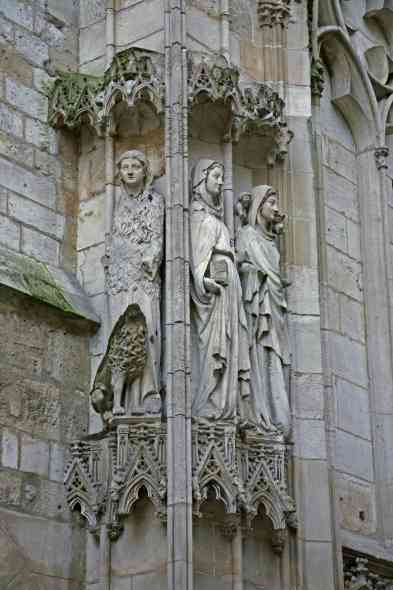 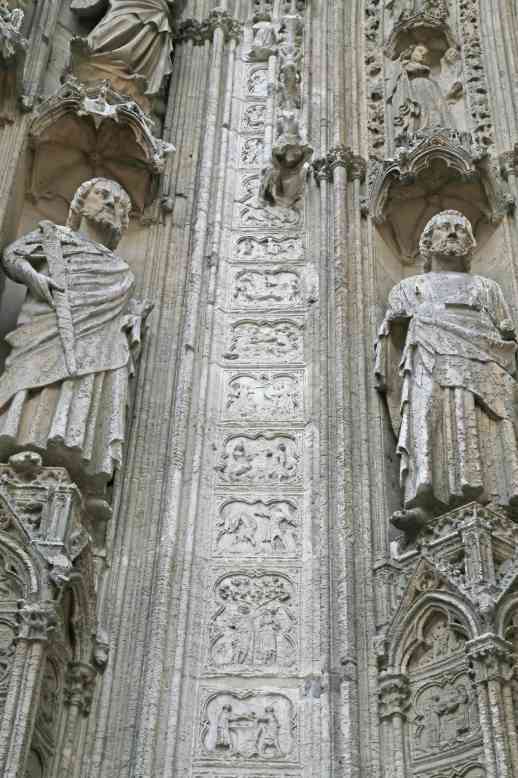 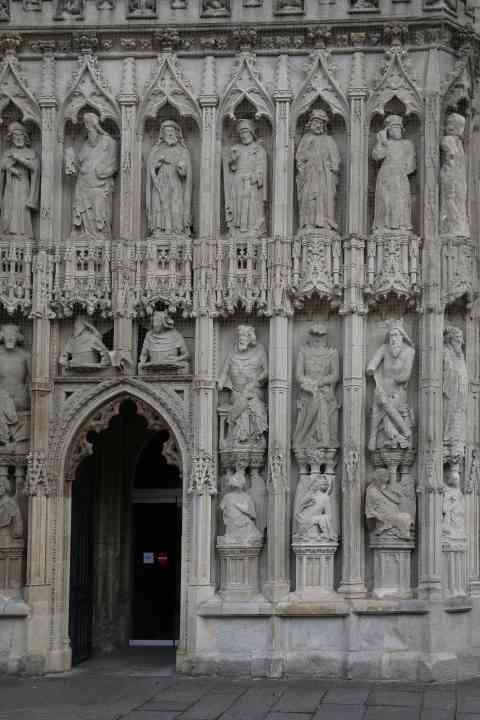 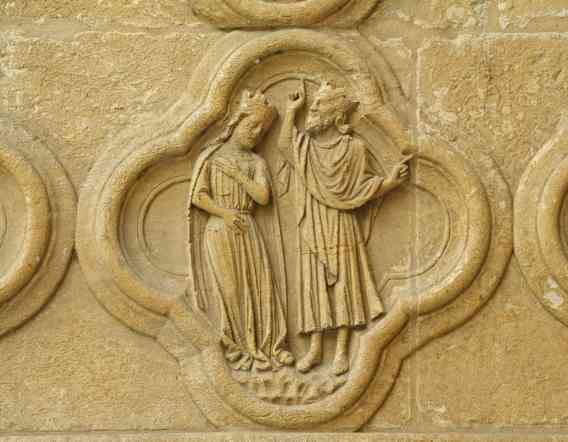 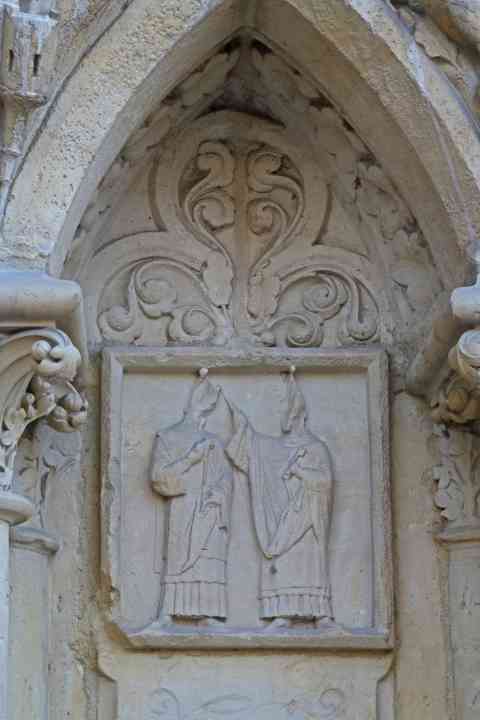 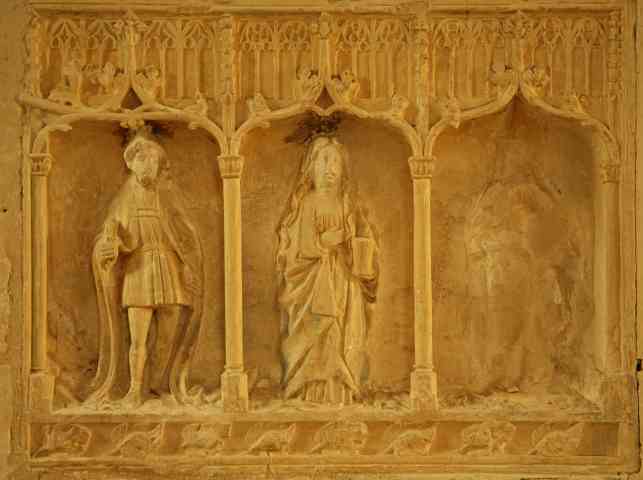 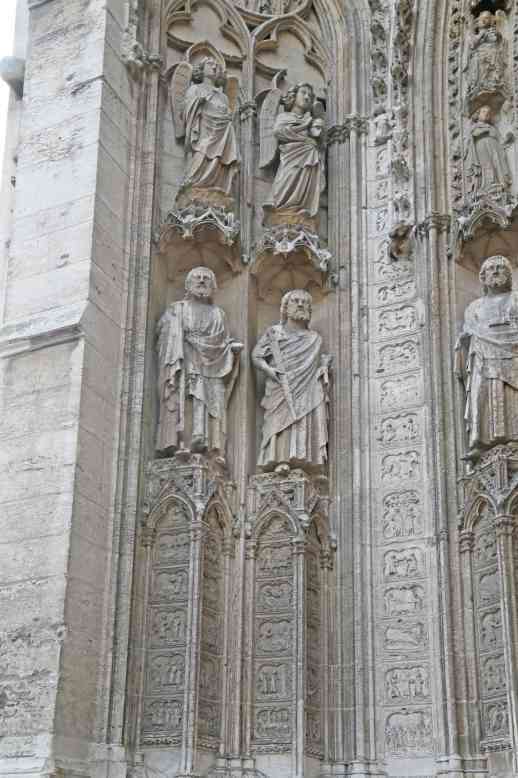 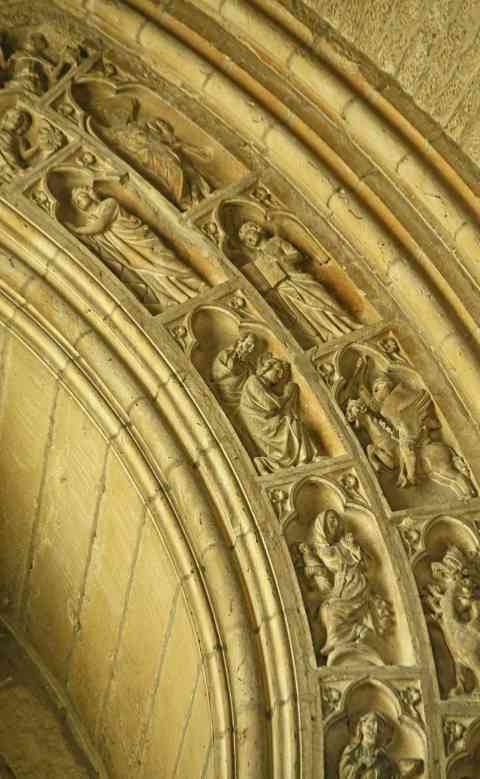 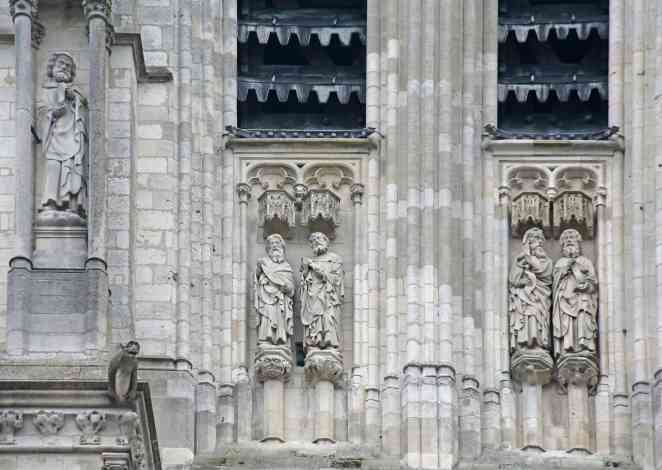 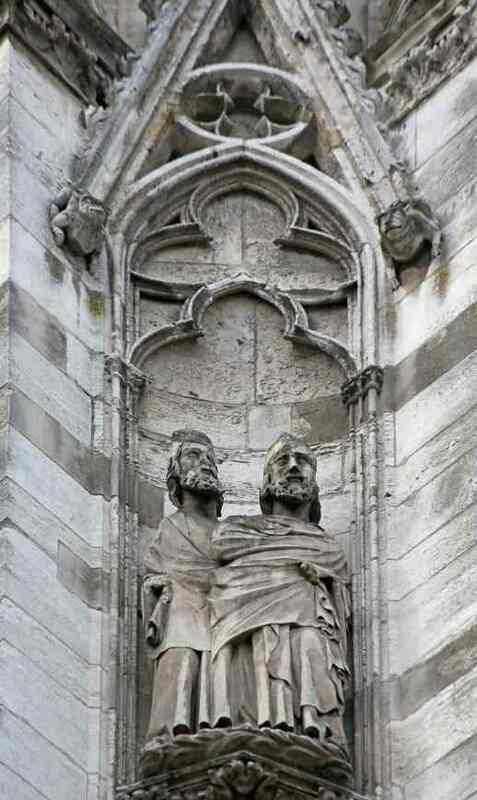 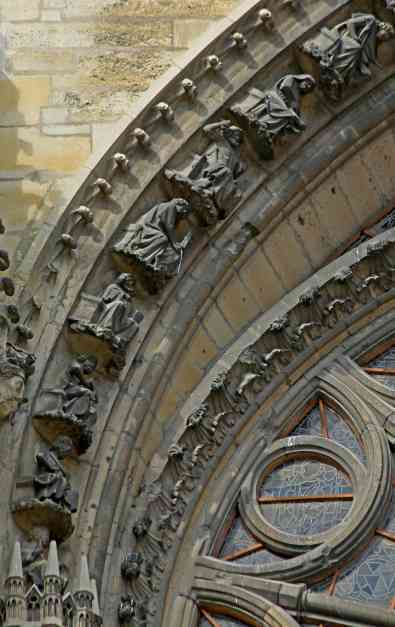 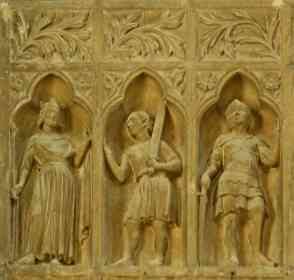 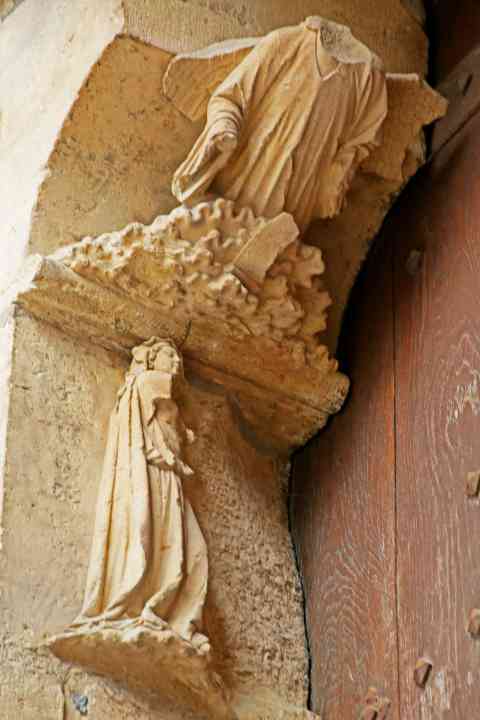 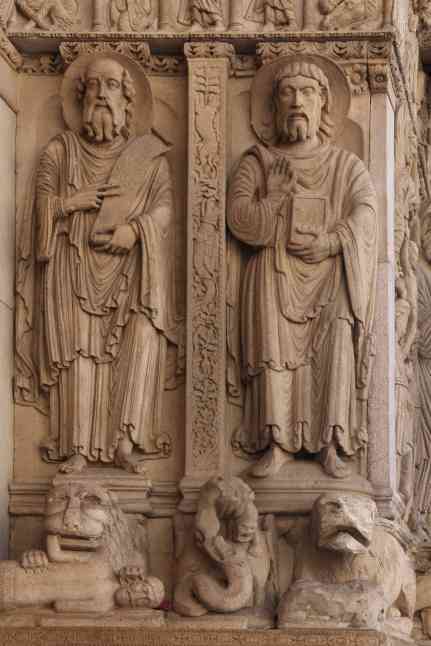 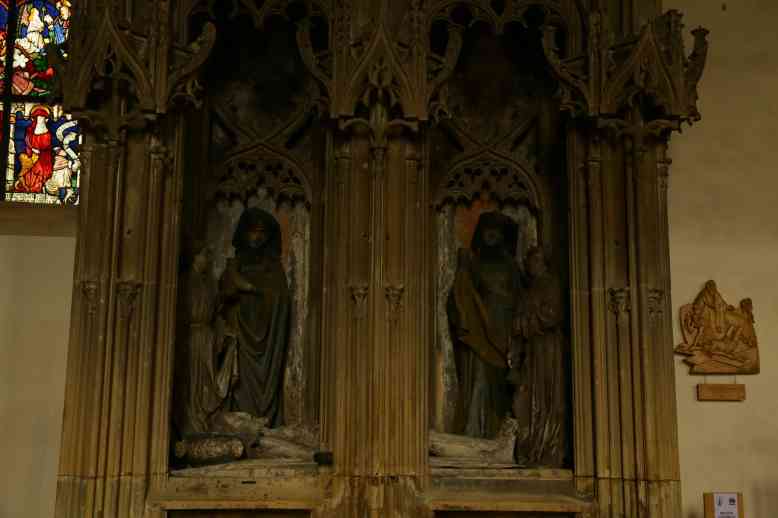 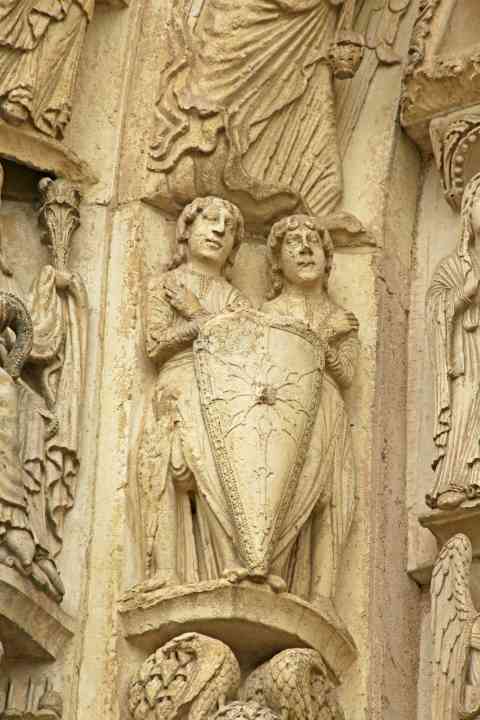 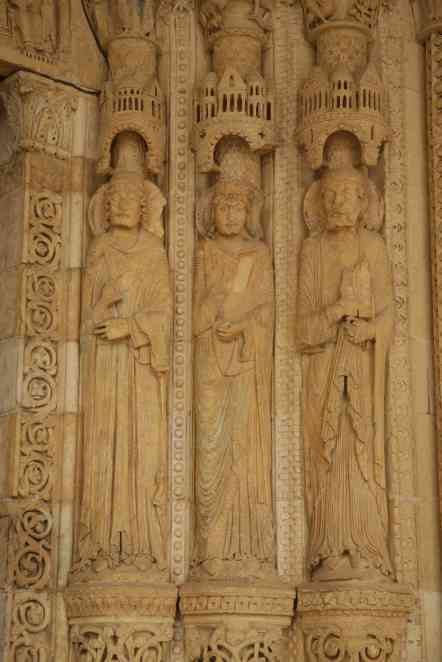 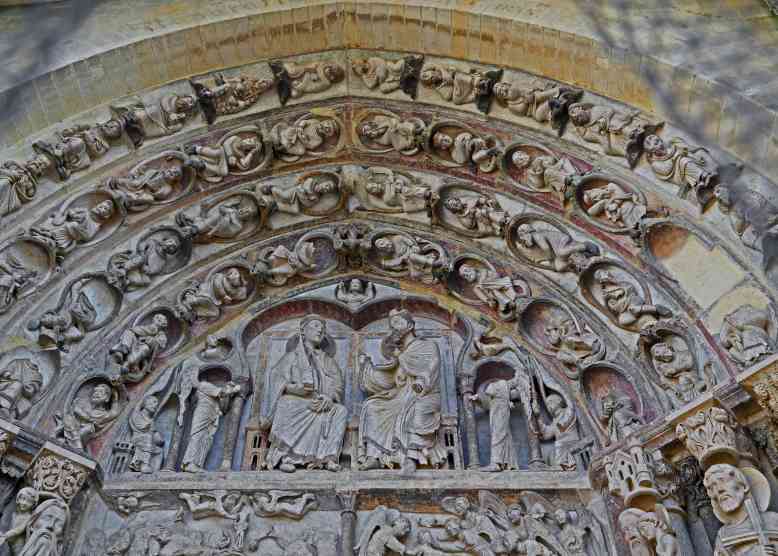 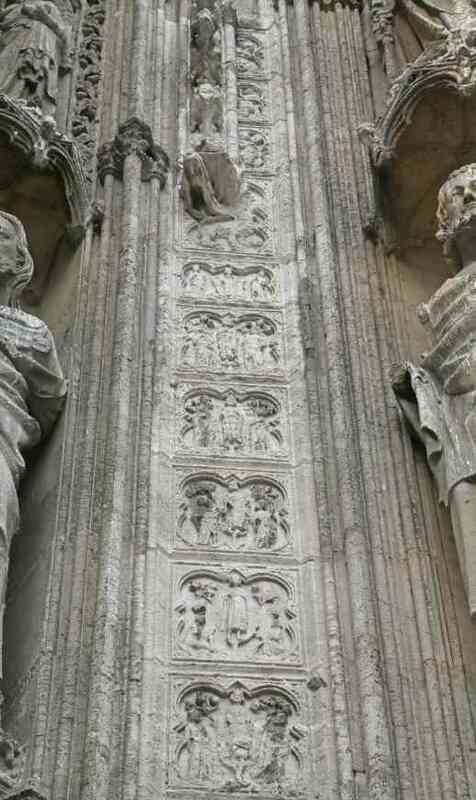 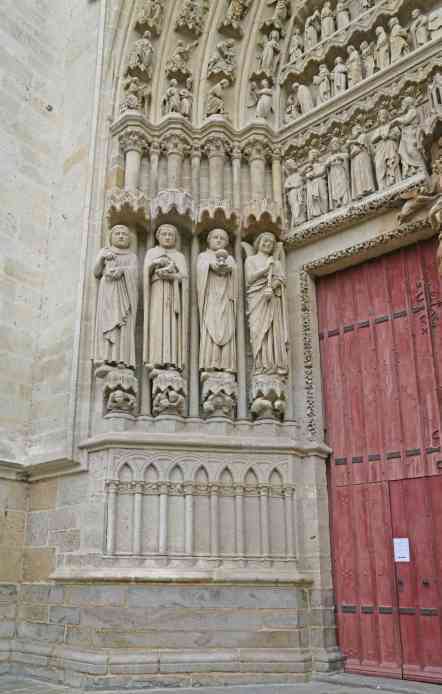 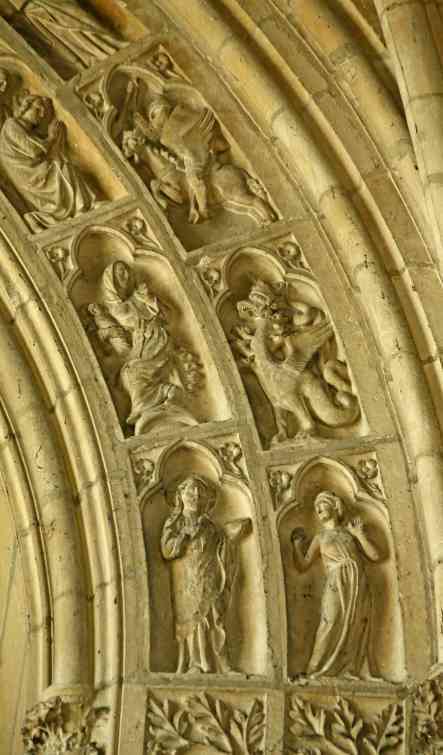 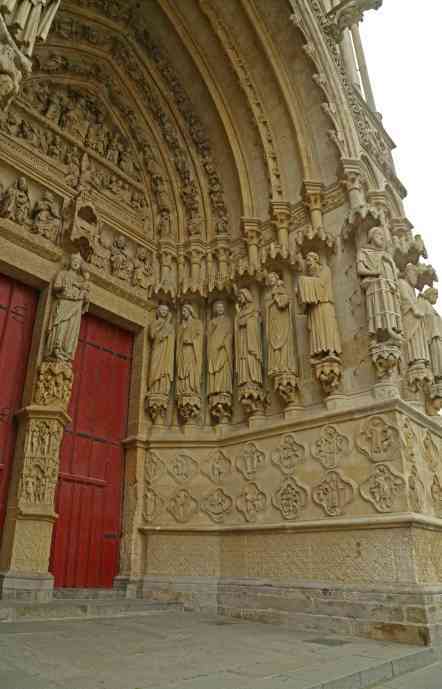 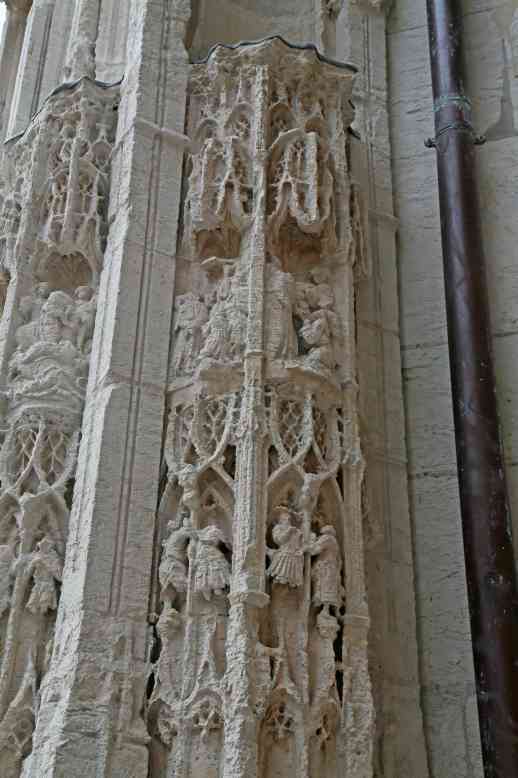 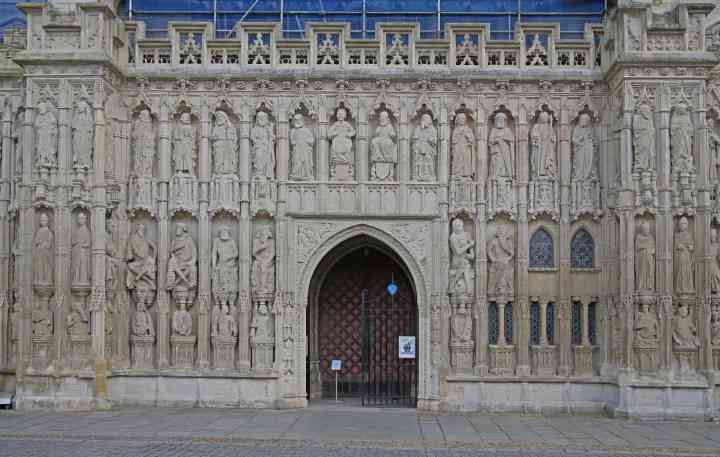 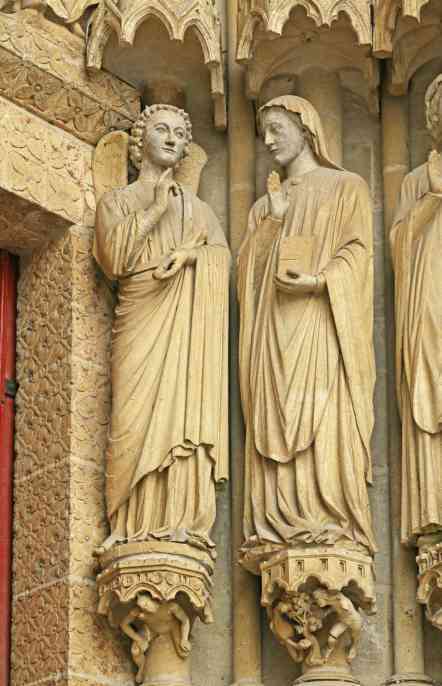 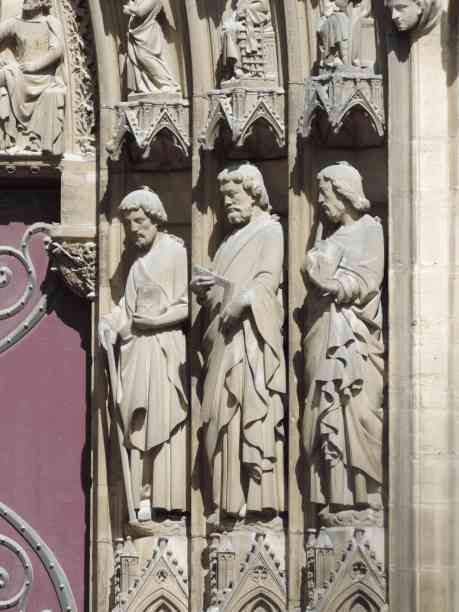 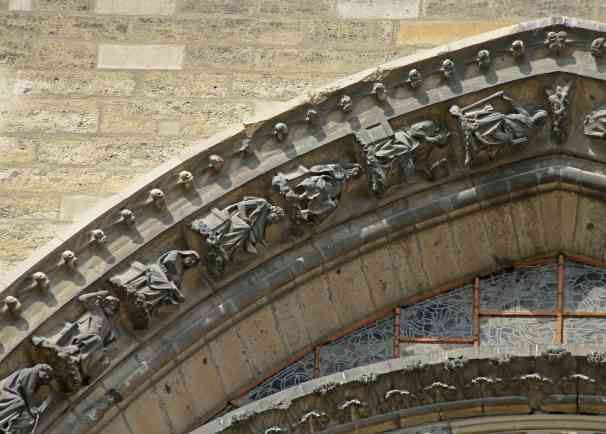 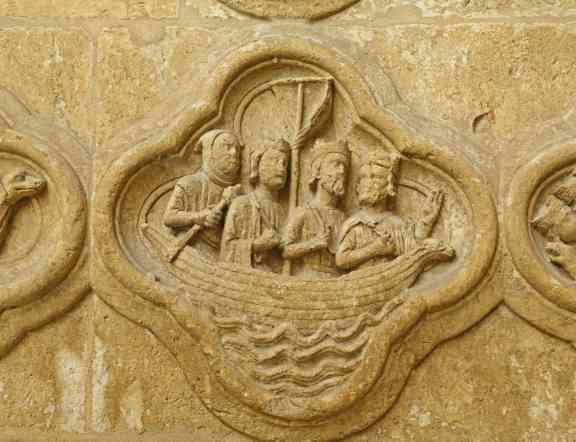 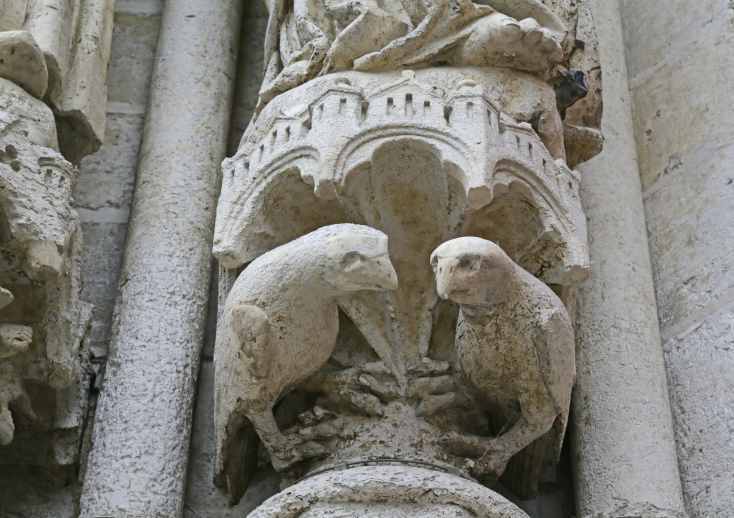 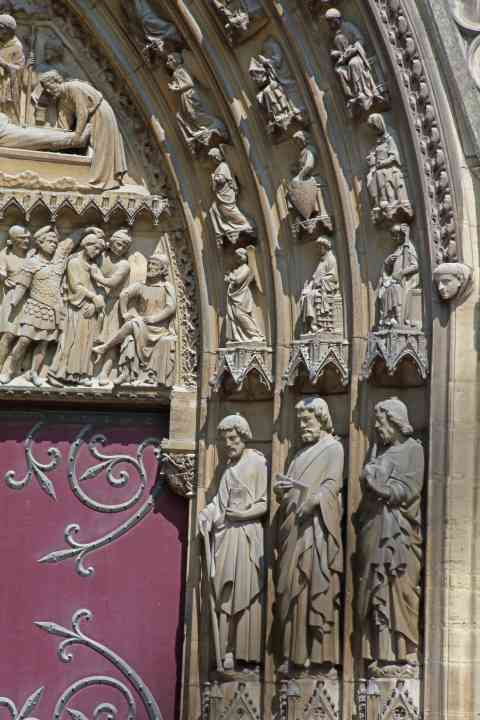 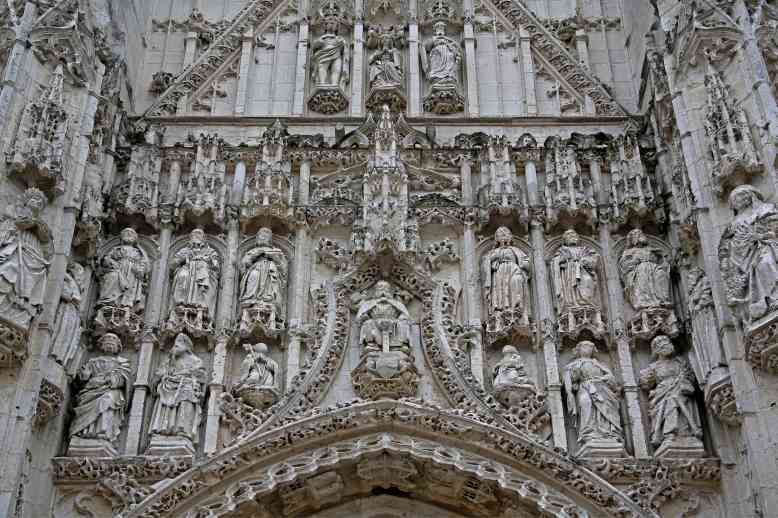 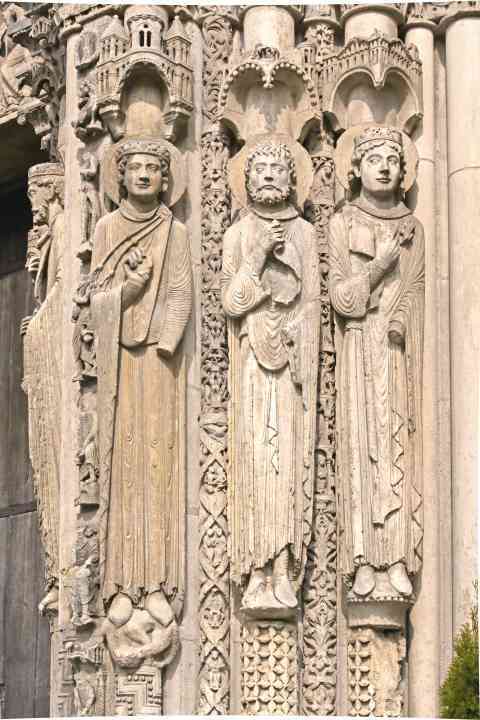 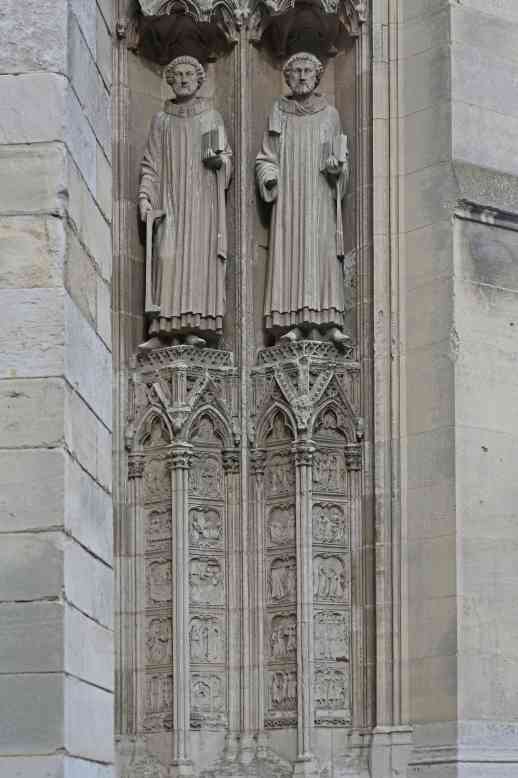 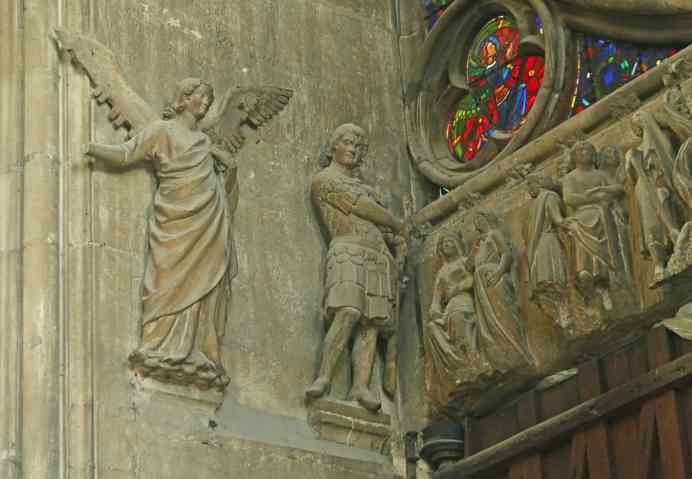 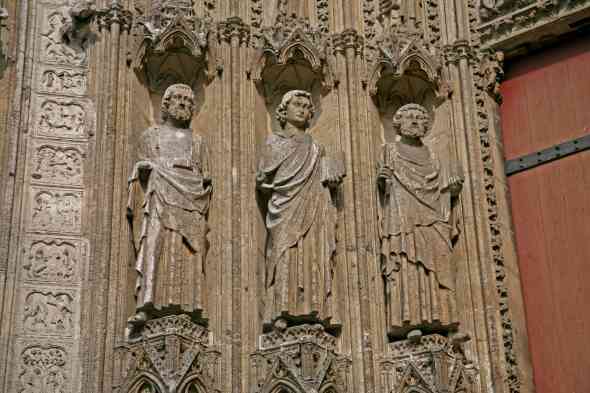 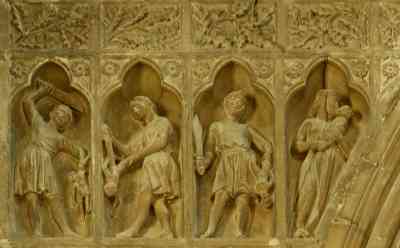 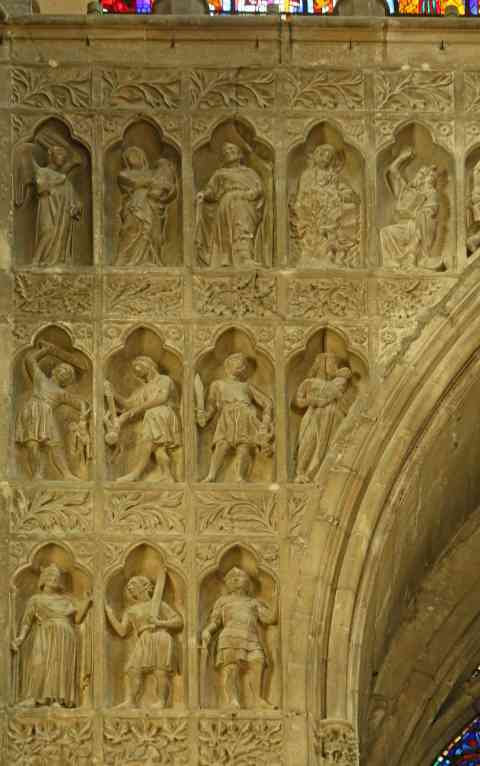 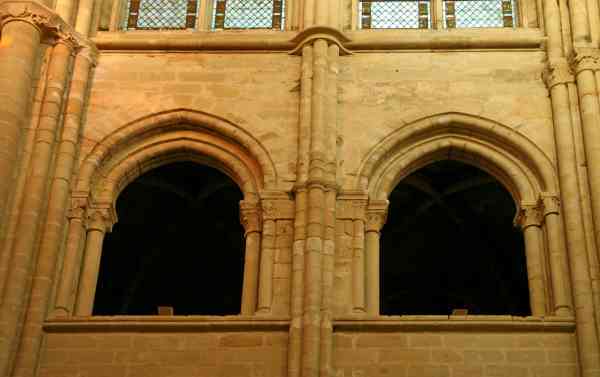 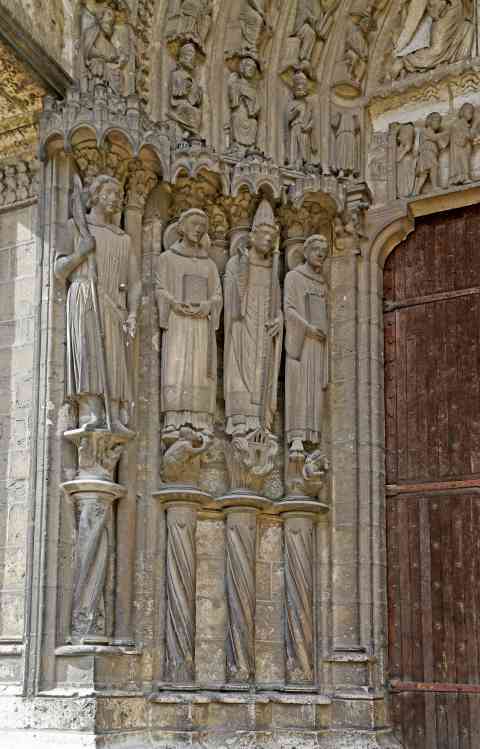 France Amiens Cathedral West door: right door left bas relief figures: ? 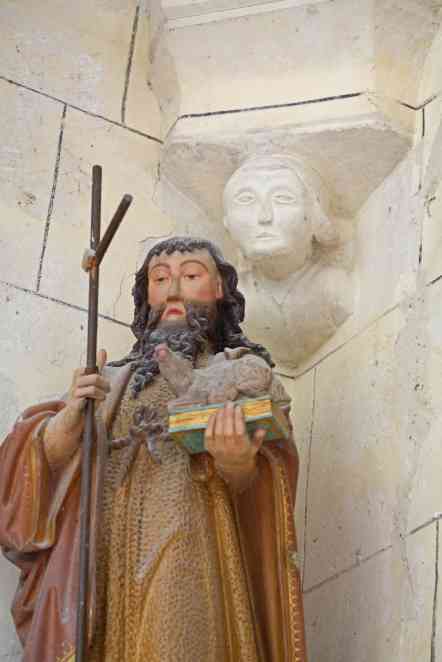 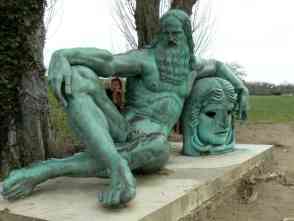 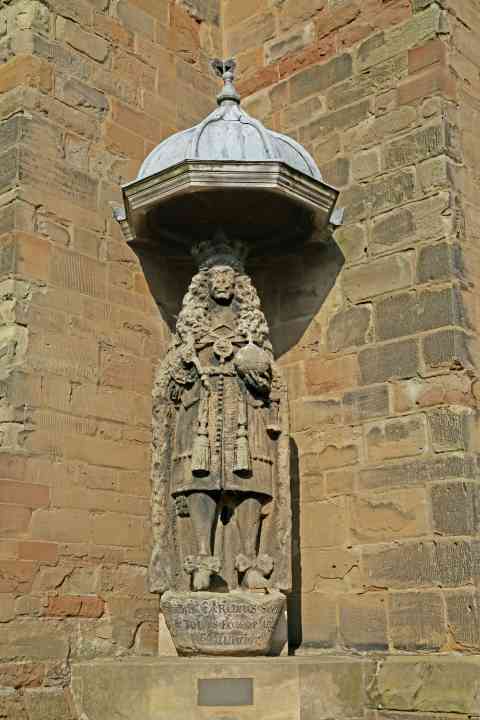 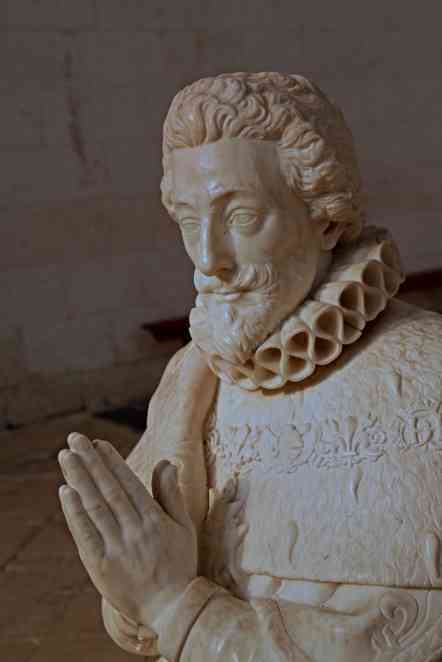 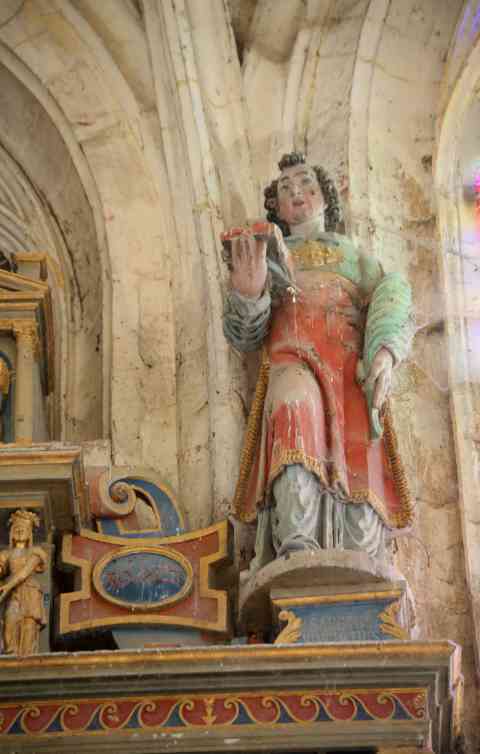 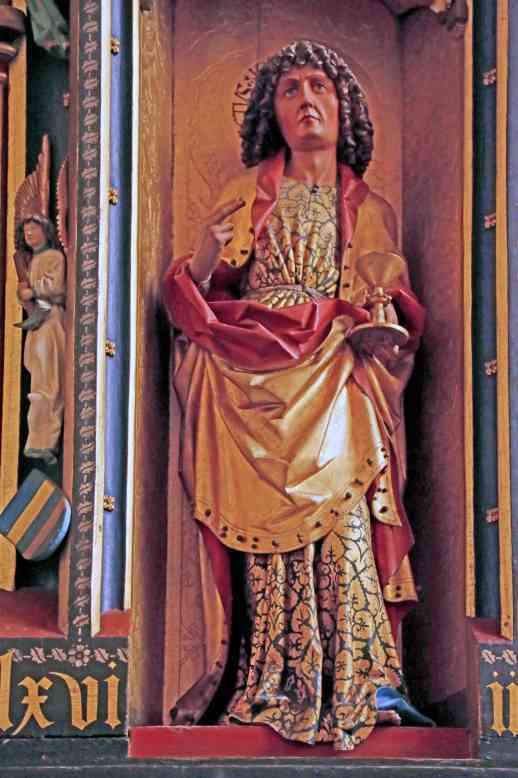 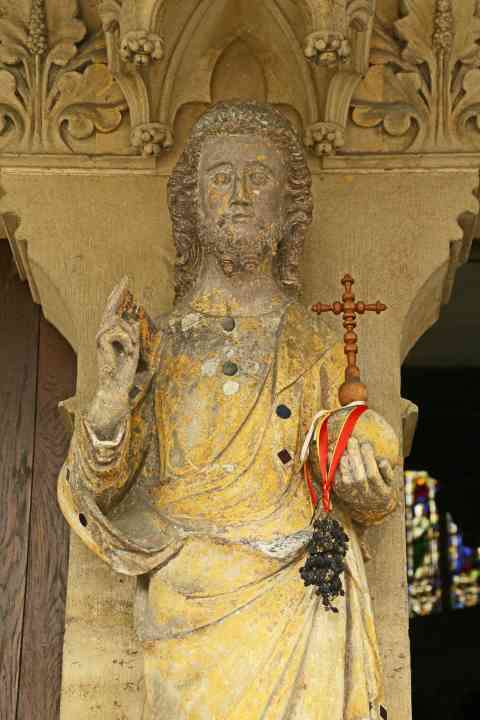 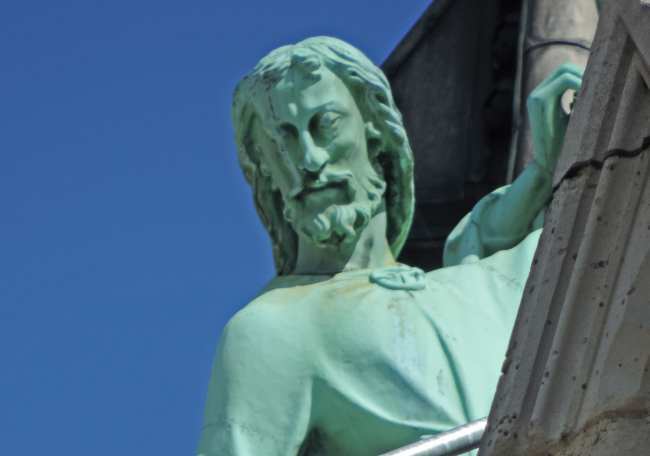 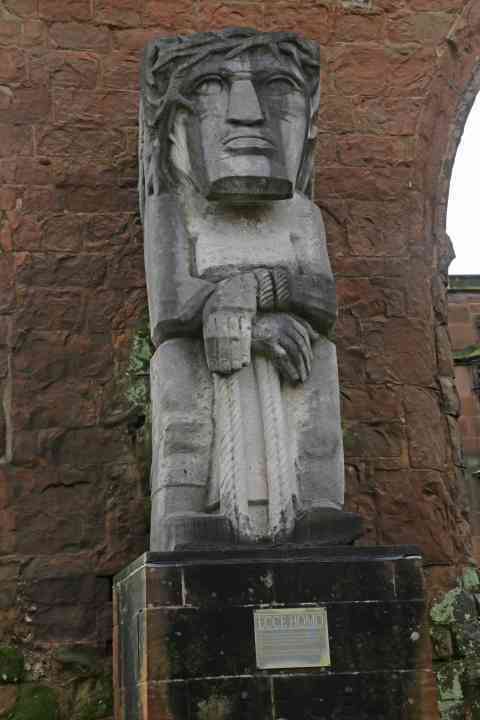 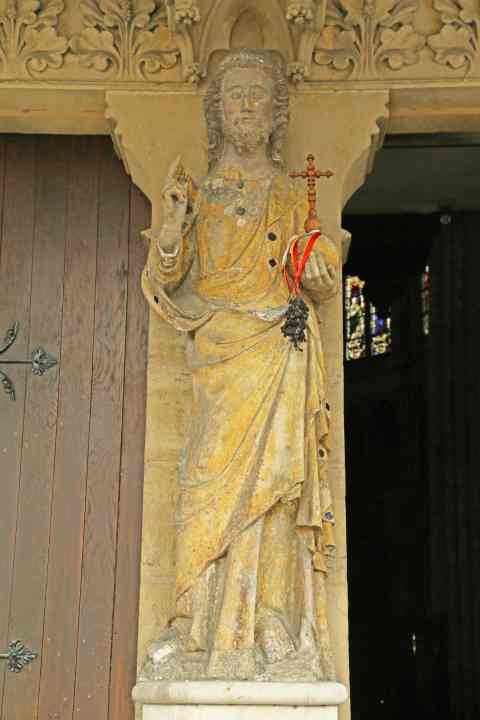 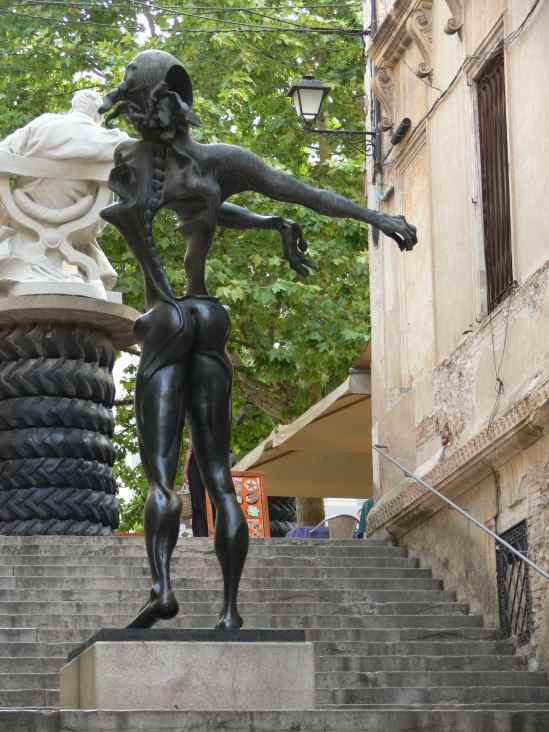 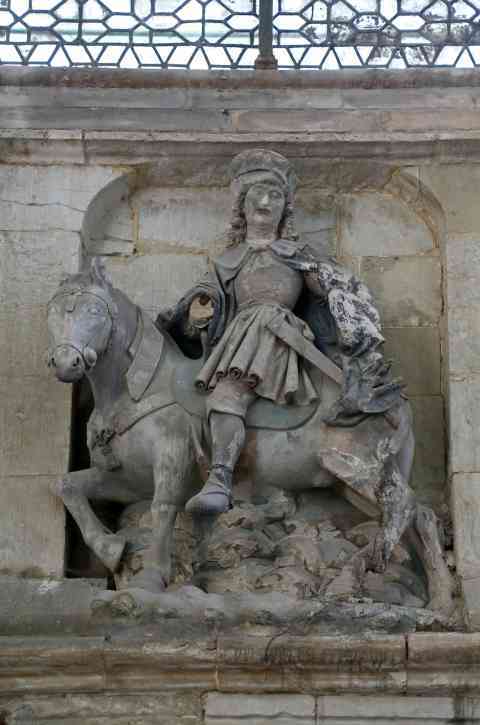 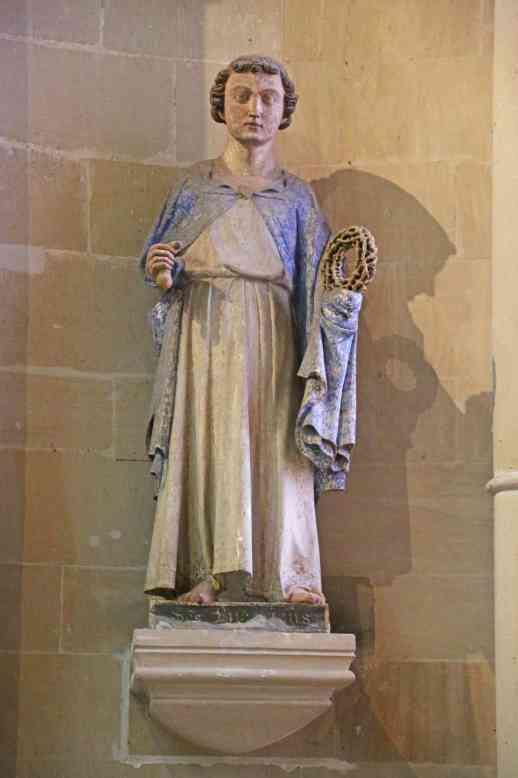 France Auppegard St Pierre Statue of St James? 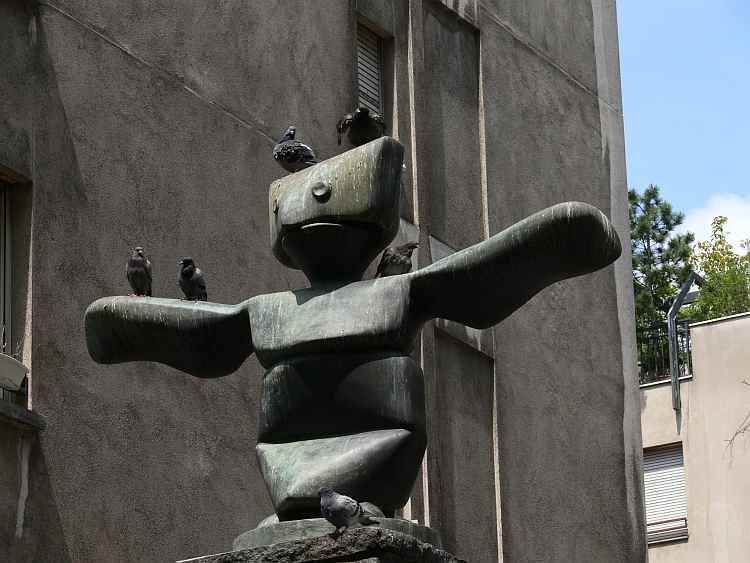 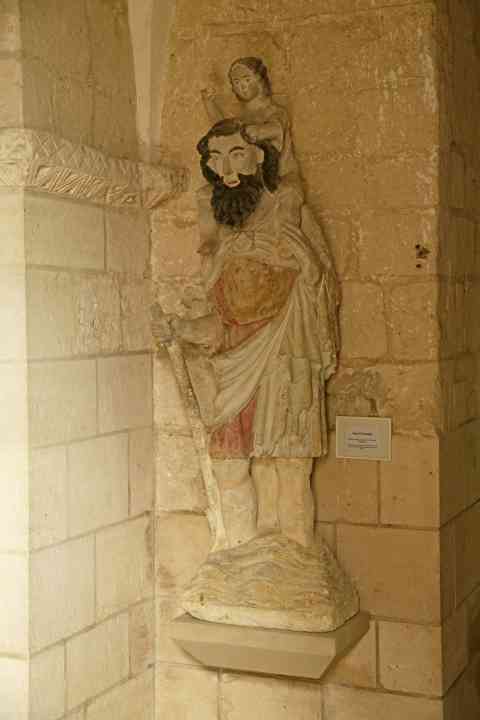 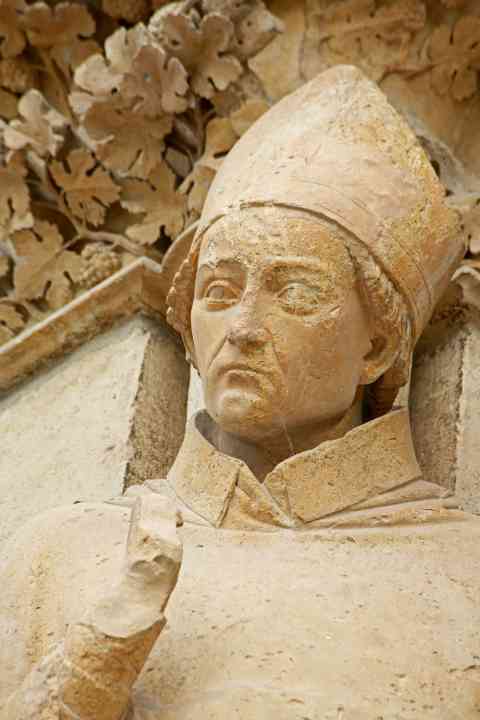 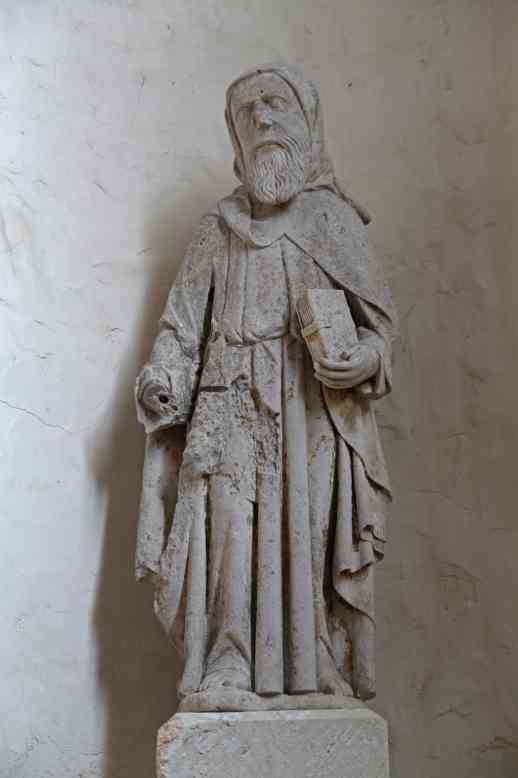 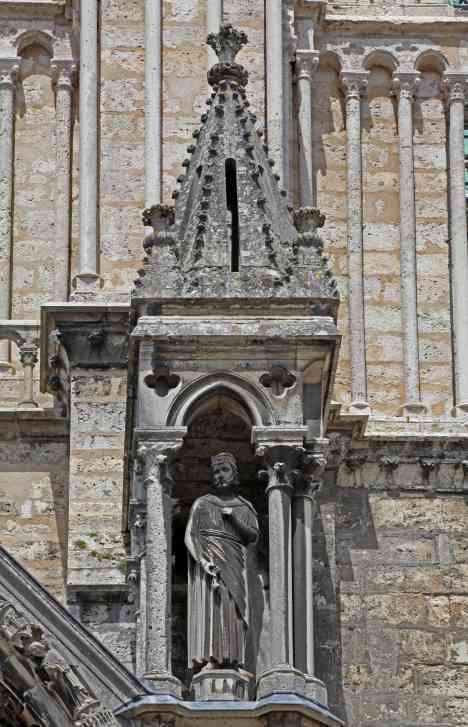 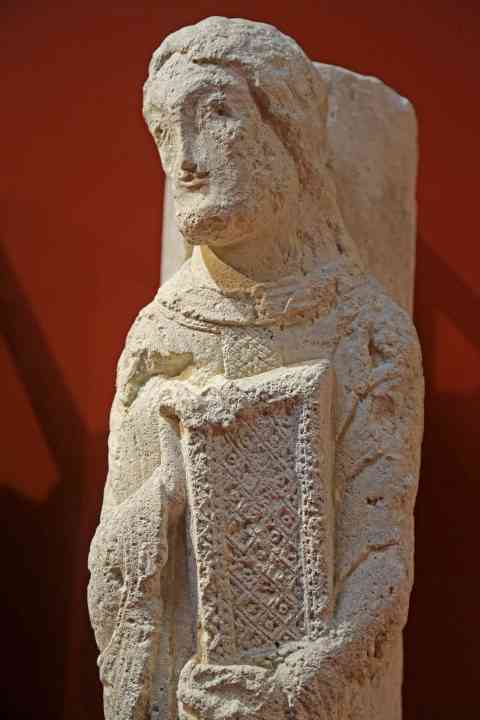 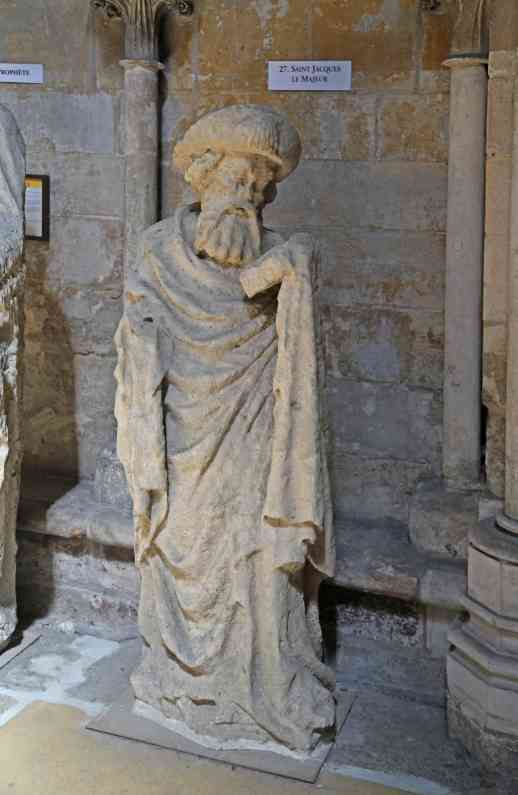 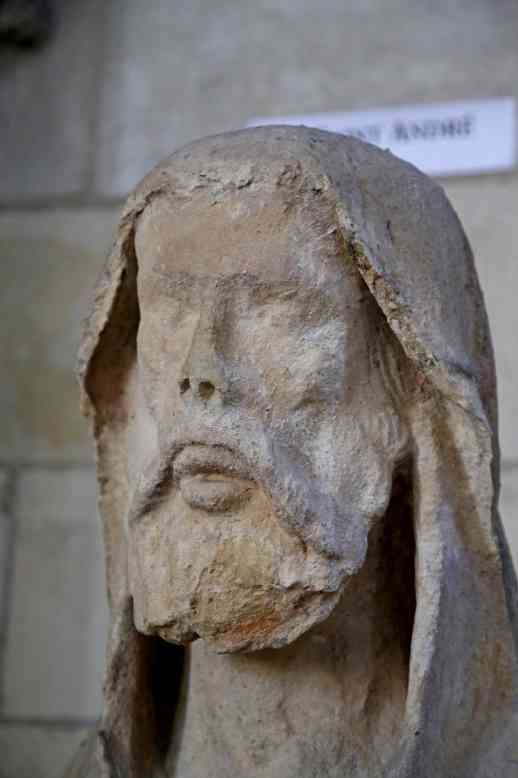 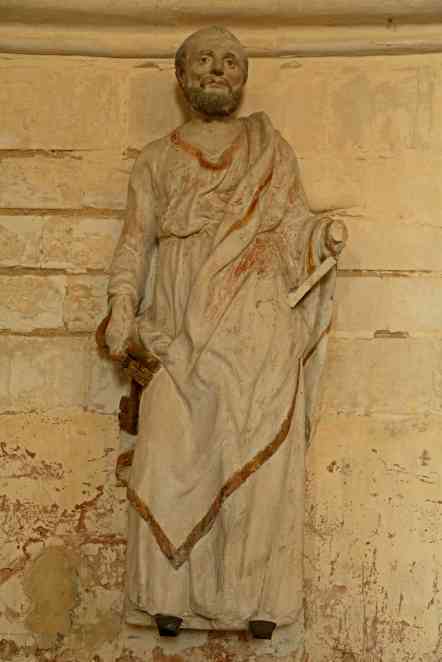 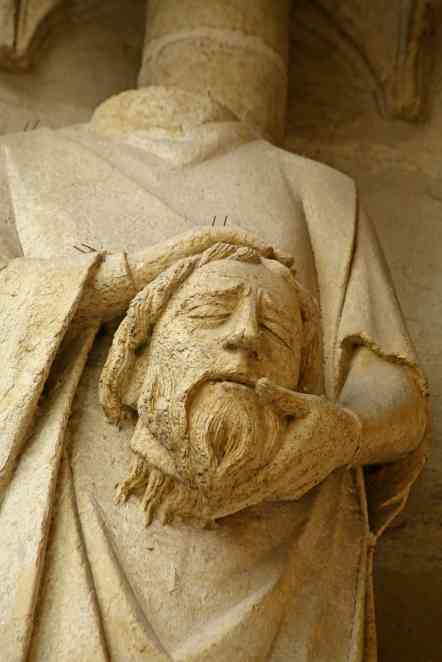 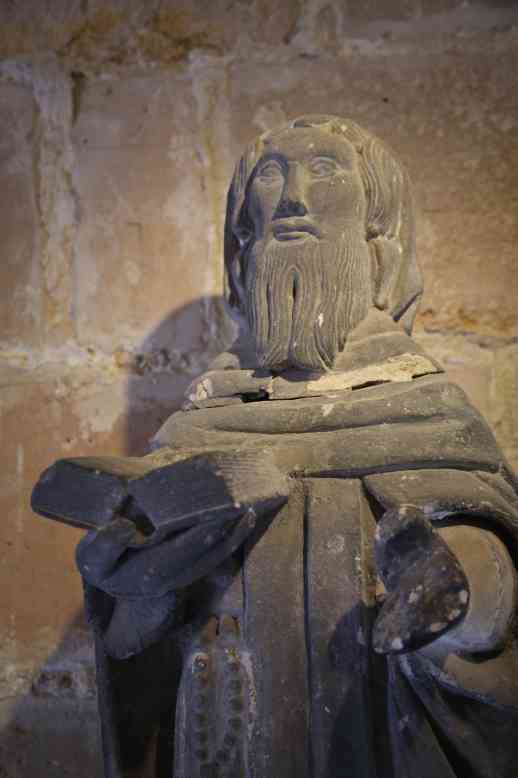 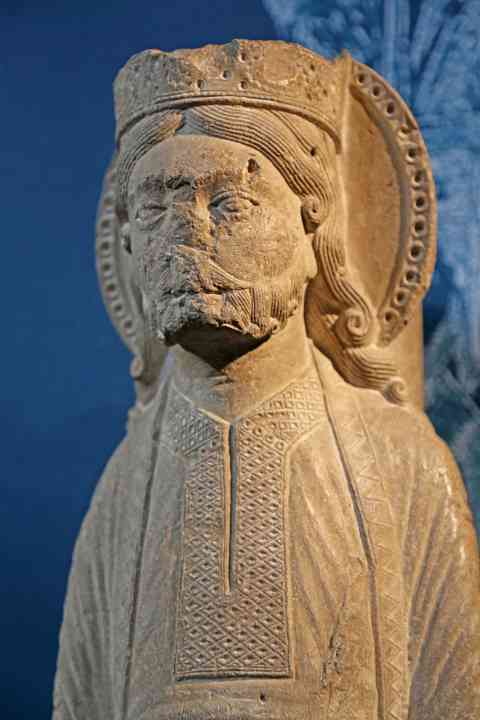 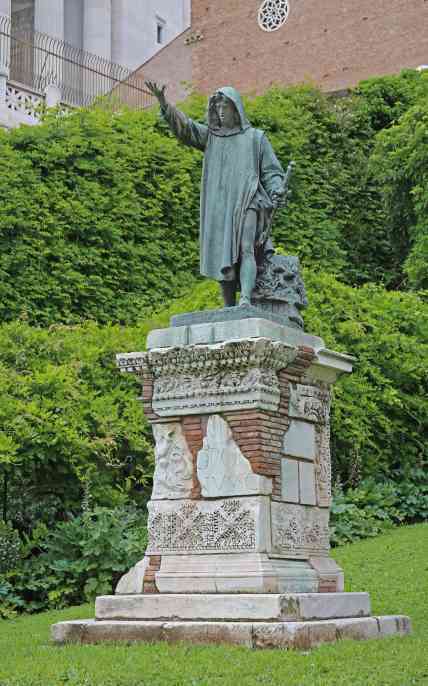 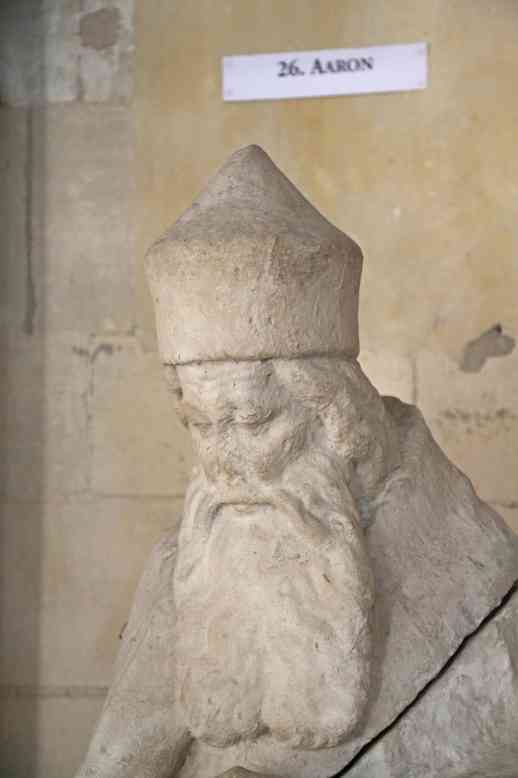 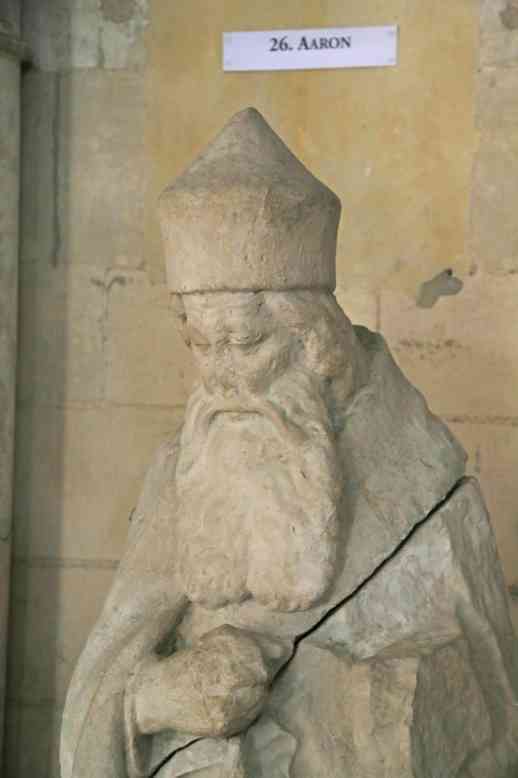 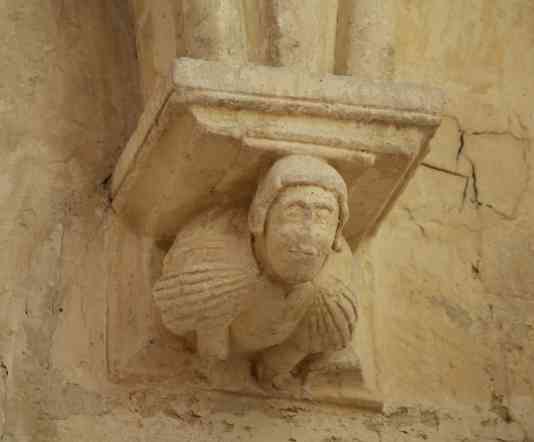 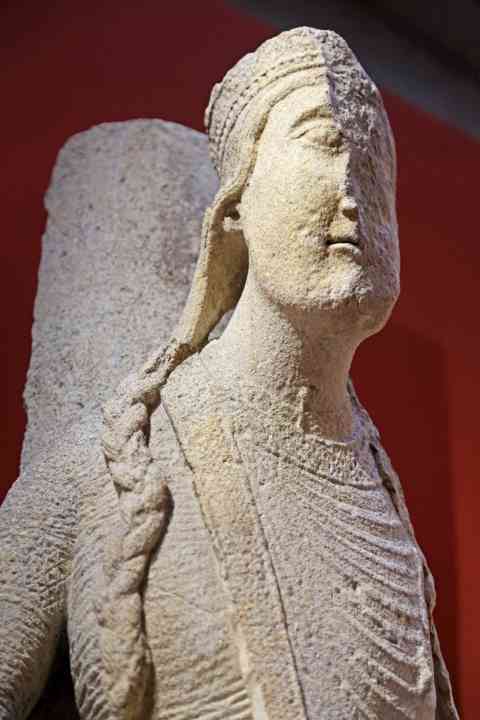 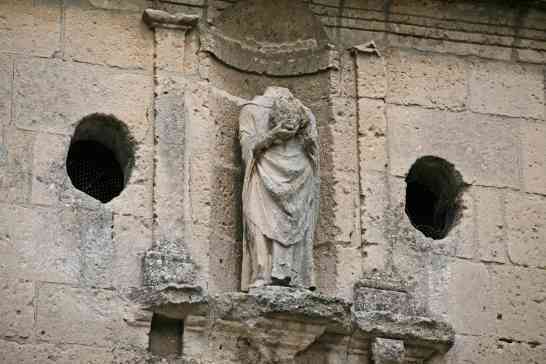 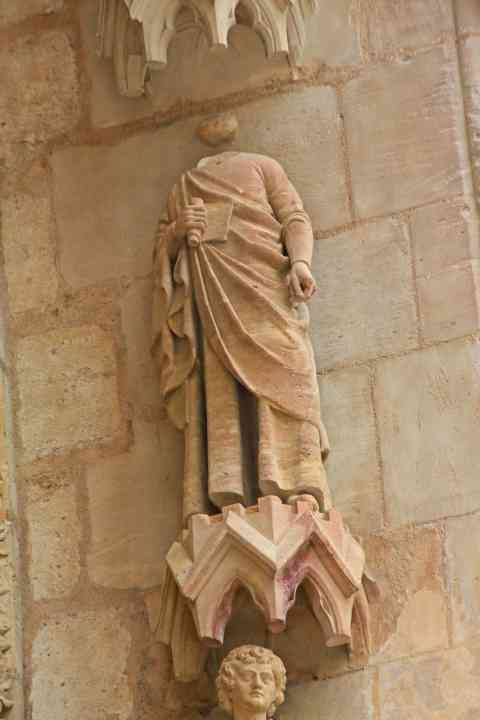 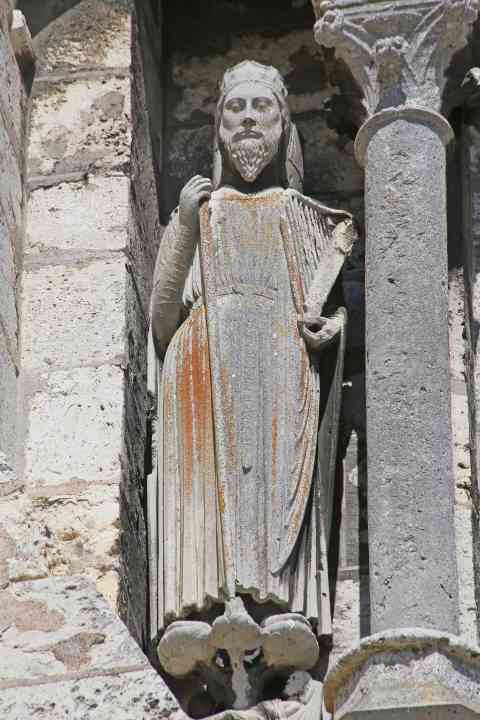 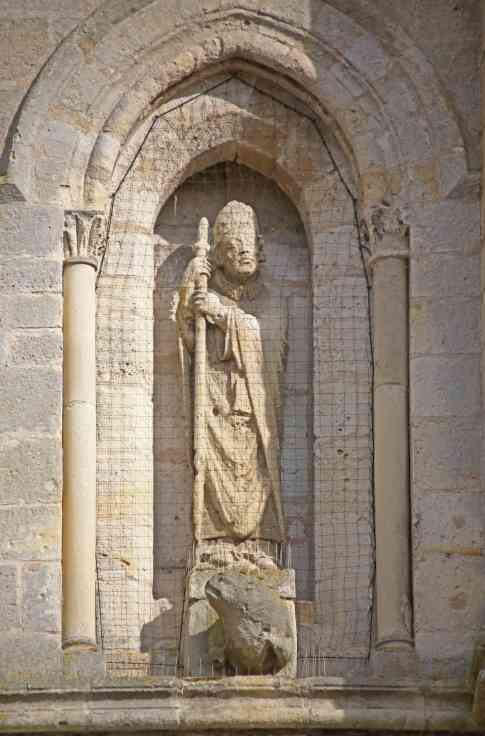 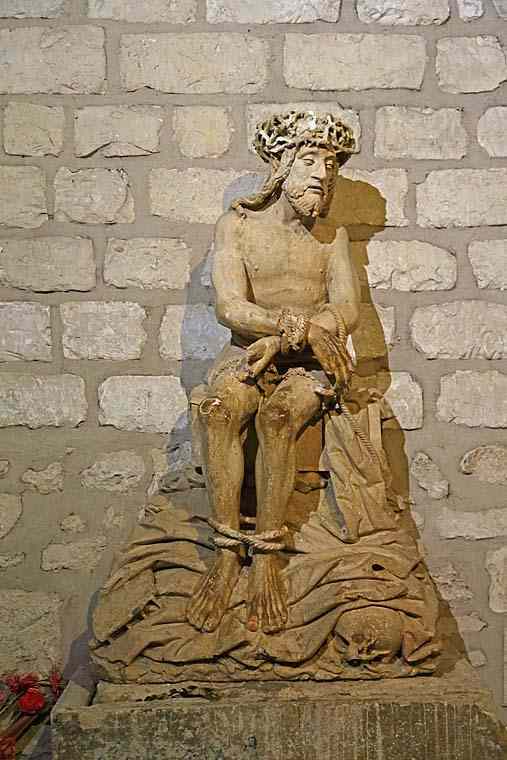 France Brienon-sur-Armançon St Loup Statue of a bishop carrying his head - St Denis? 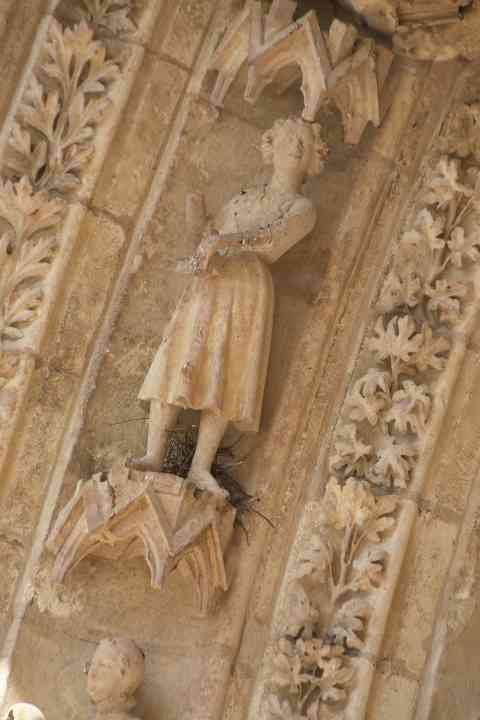 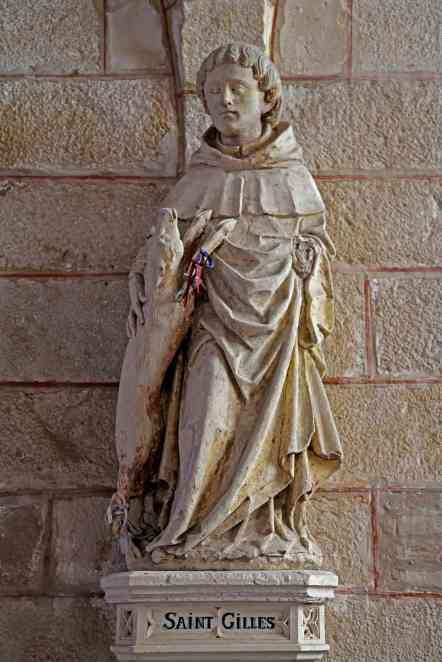 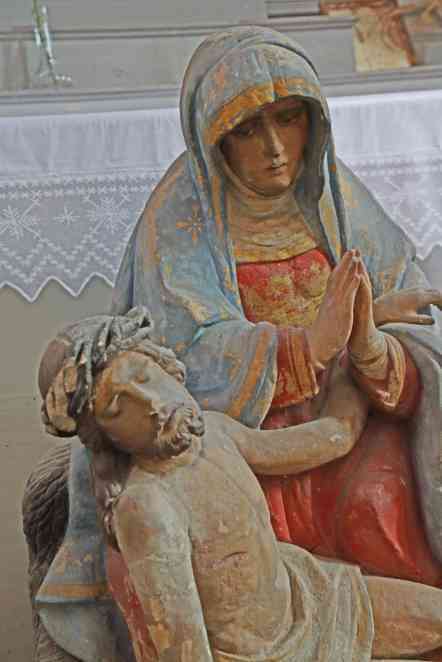 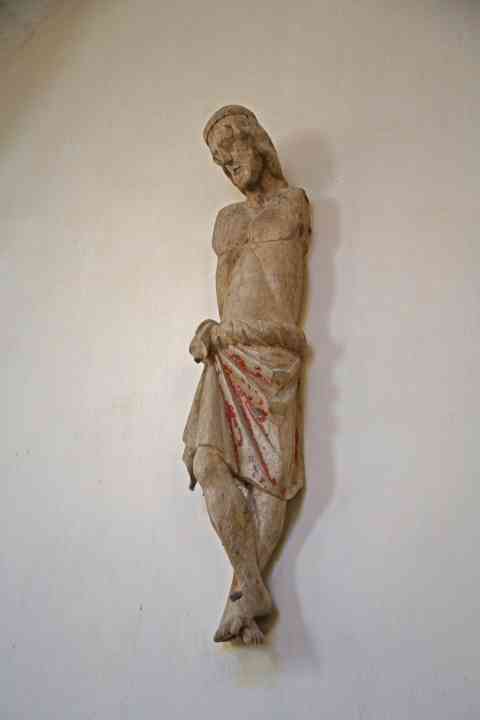 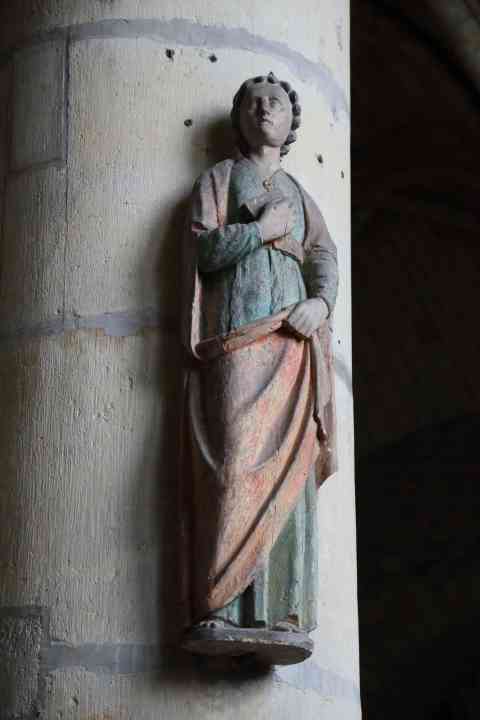 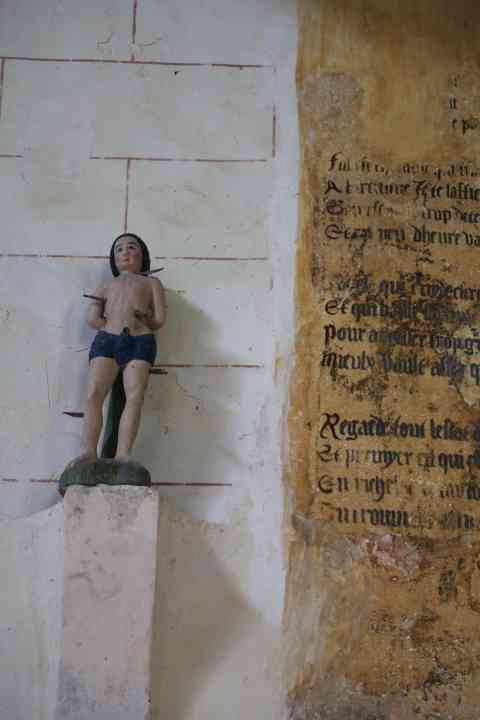 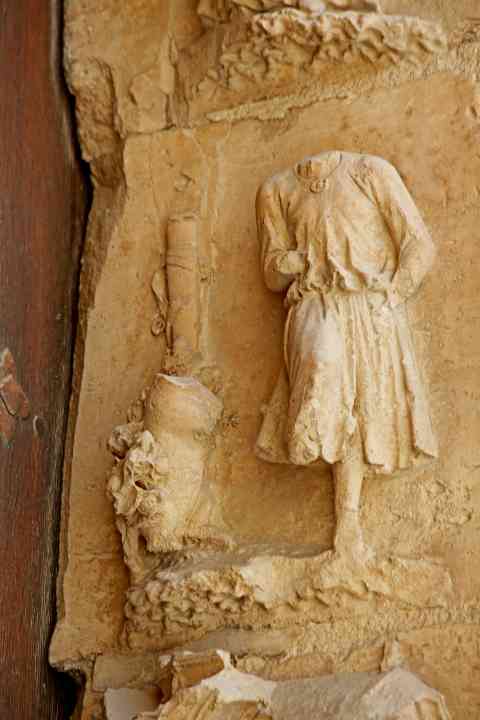 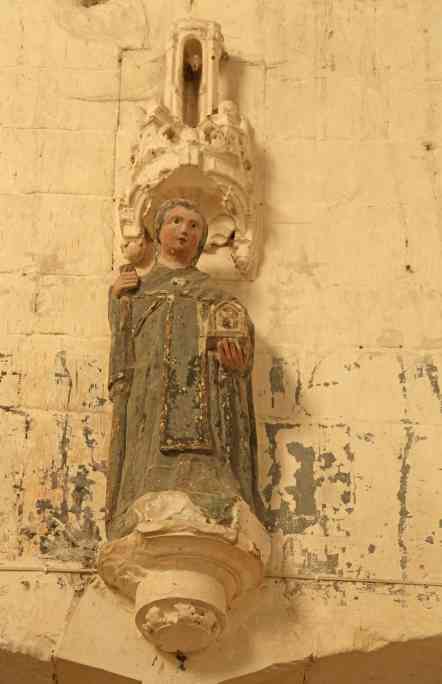 France Brienon-sur-Armançon St Loup Statue of a youthful martyr with a palm and a book - St Vincent? 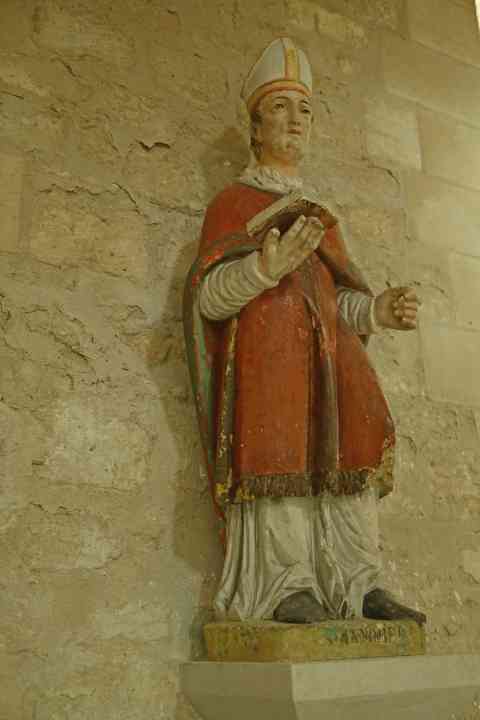 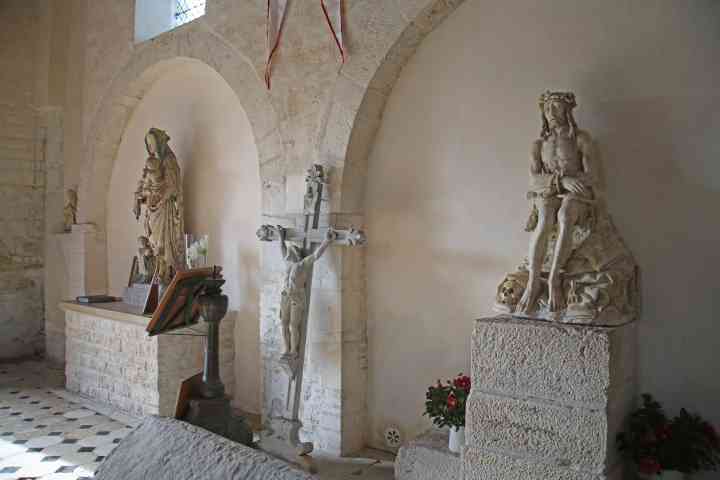 France Brienon-sur-Armançon St Loup Statue of a bishop blessing - St Honoré ? 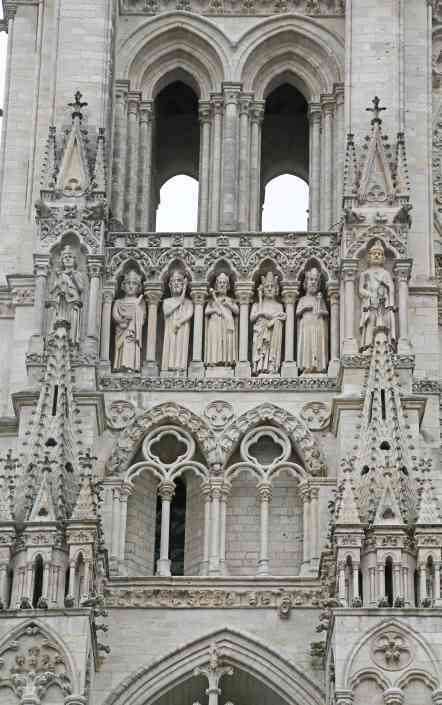 France Chartres Cathedral North façade: central porch: left side vaults: figure(s)in the "Celestial Heart"
France Chartres Cathedral North façade: left door: statues: Below St Elizabeth - ? 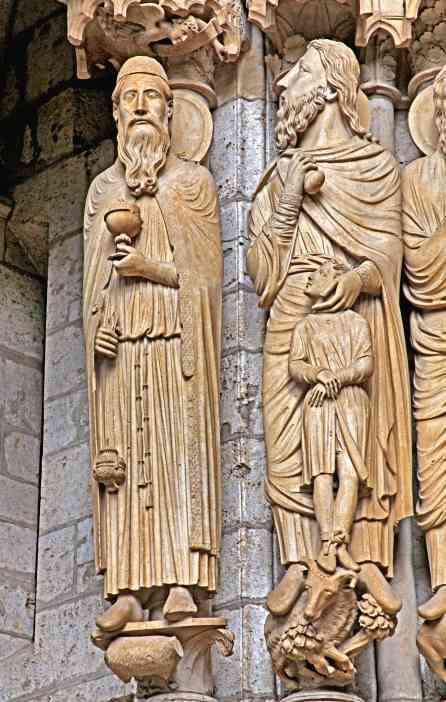 France Chartres Cathedral West door: left door left side figure: Abraham and Agar? 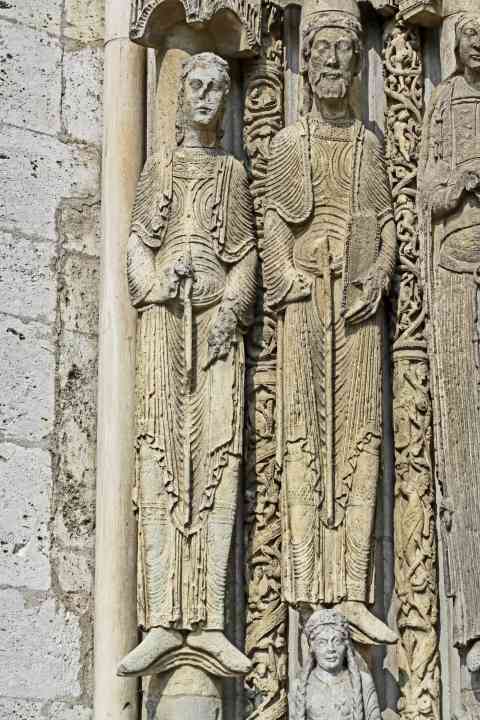 France Chartres Cathedral West door: left door left side figure: Eve? 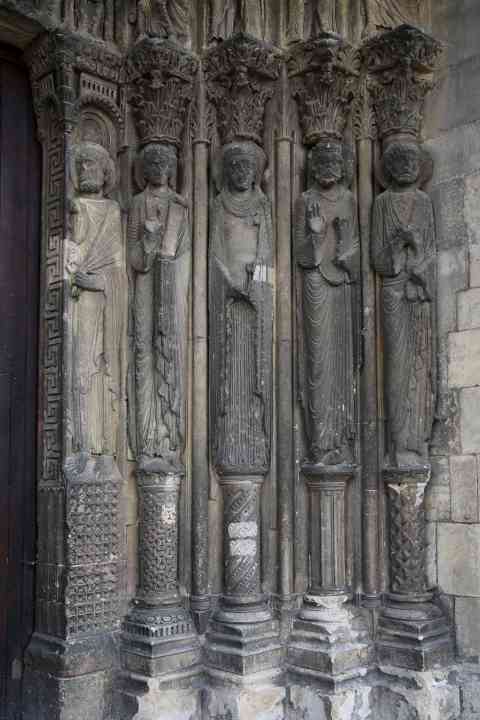 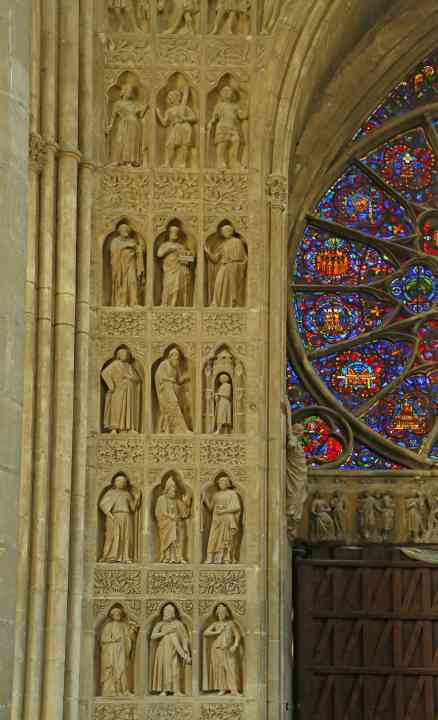 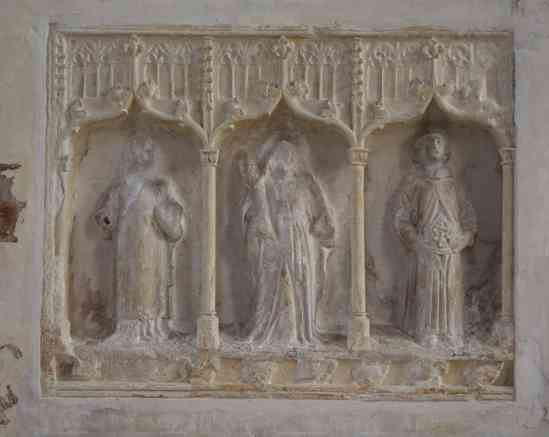 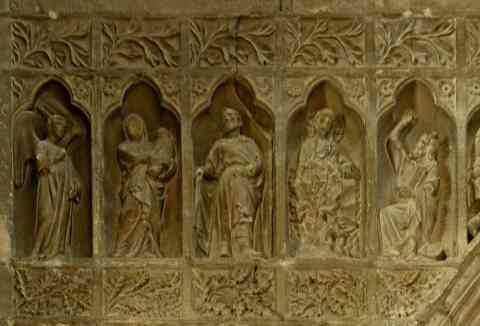 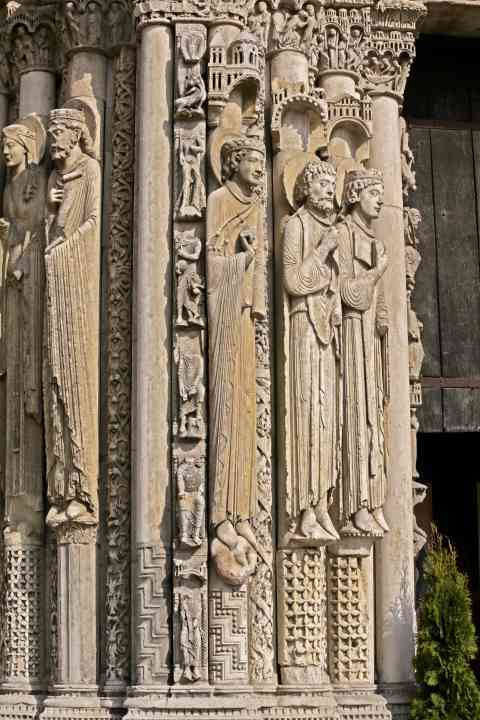 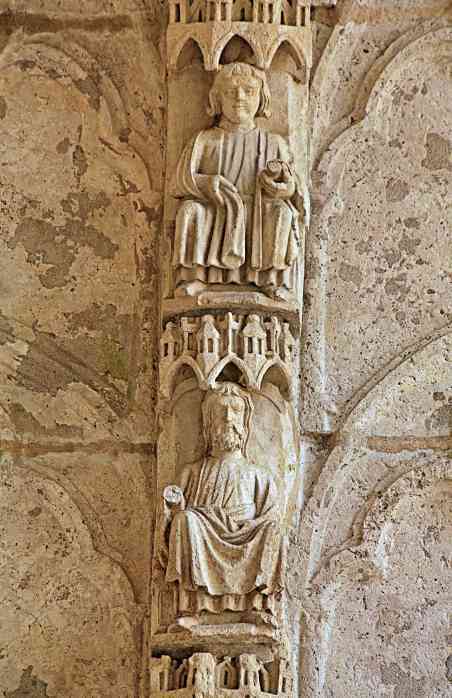 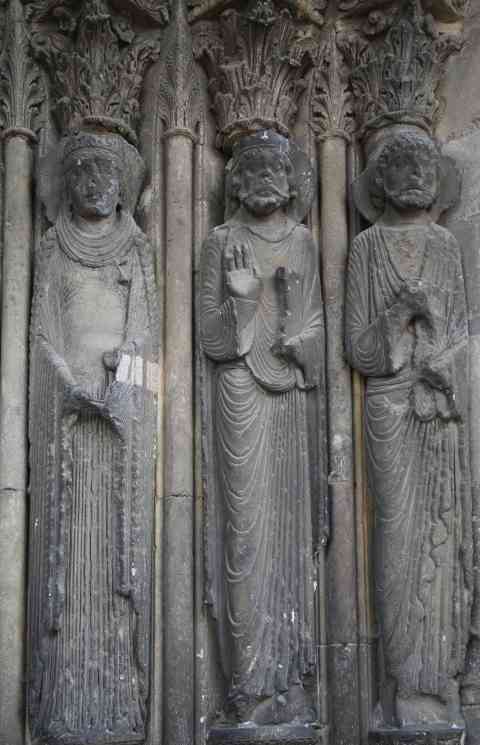 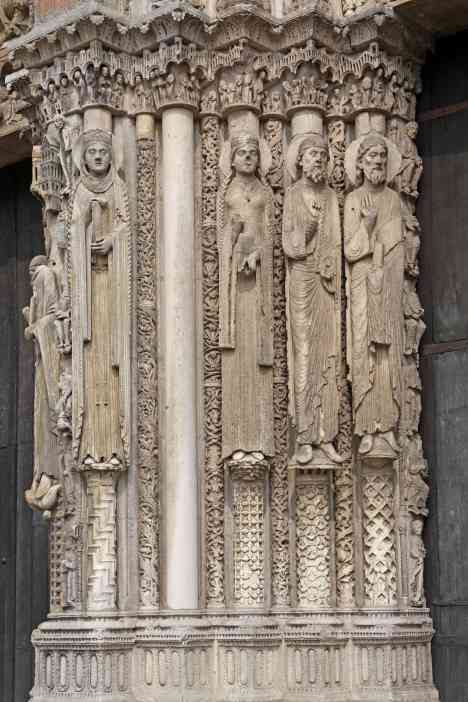 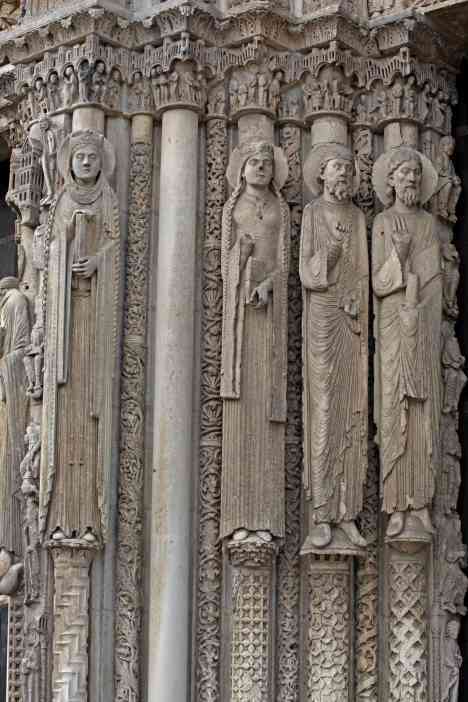 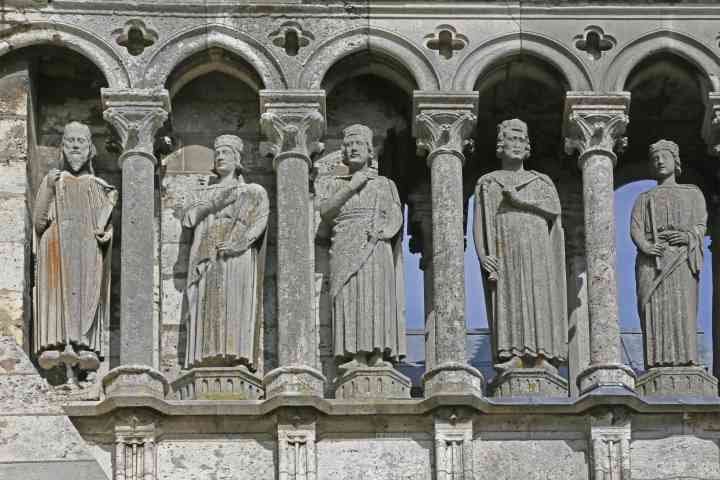 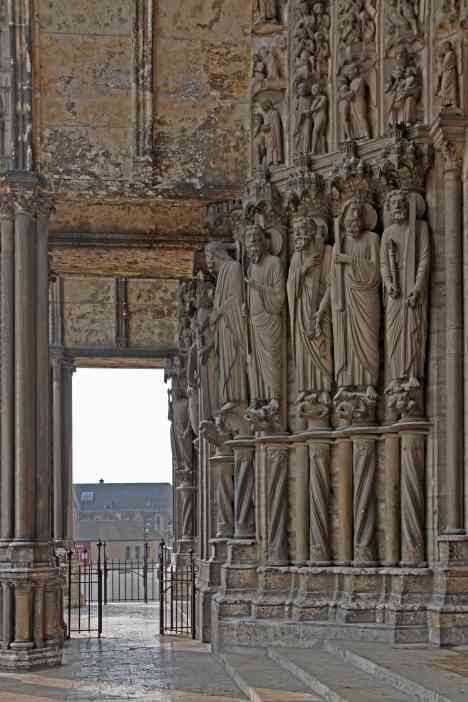 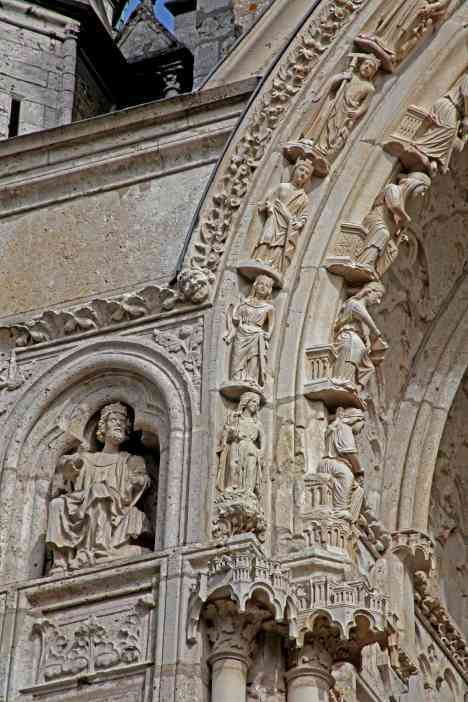 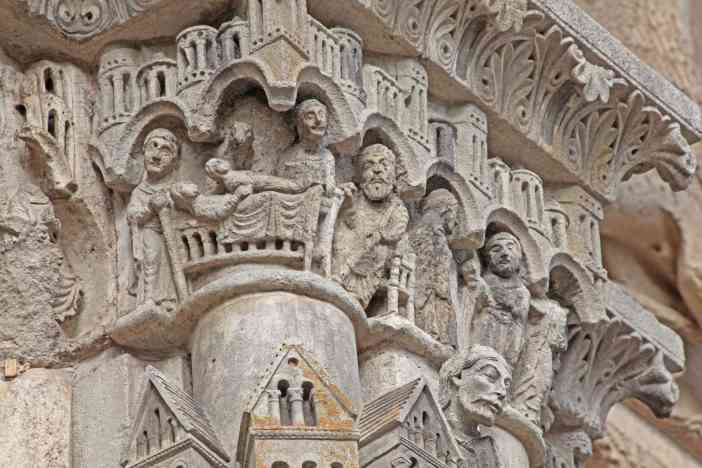 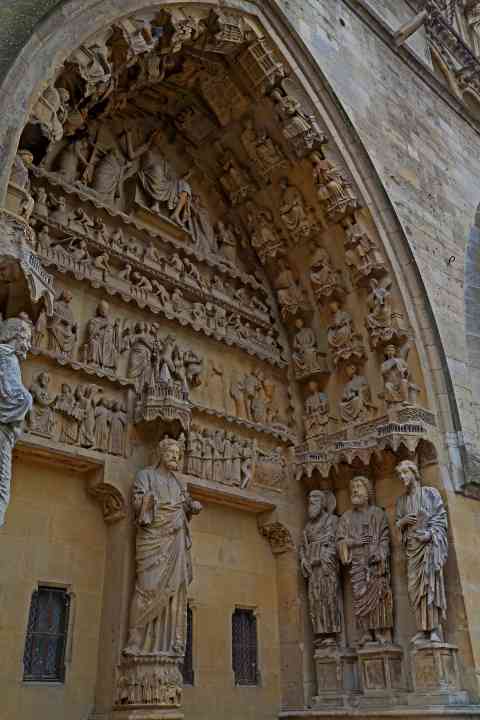 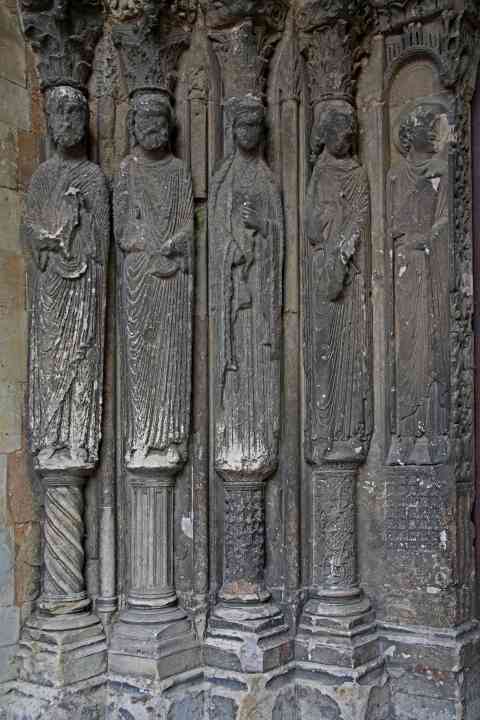 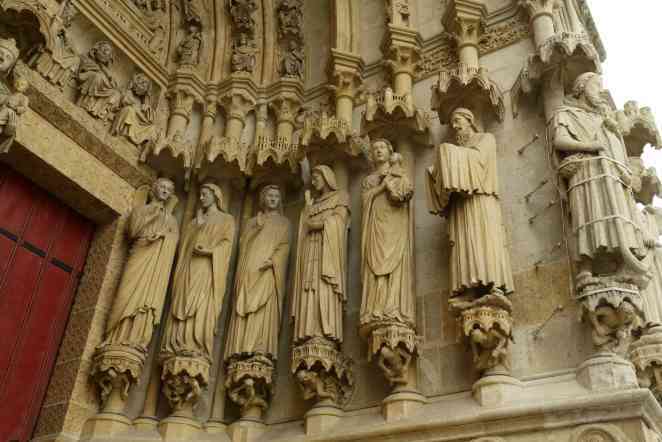 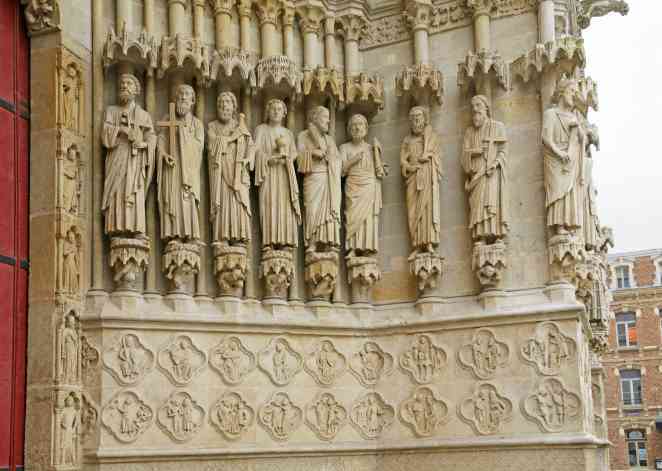 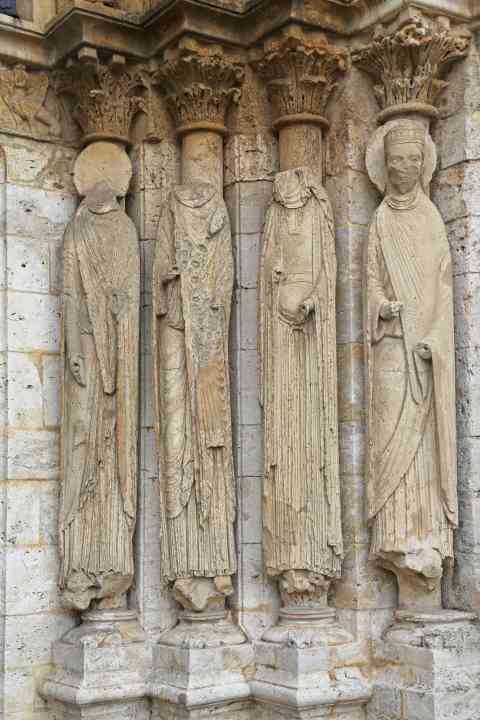 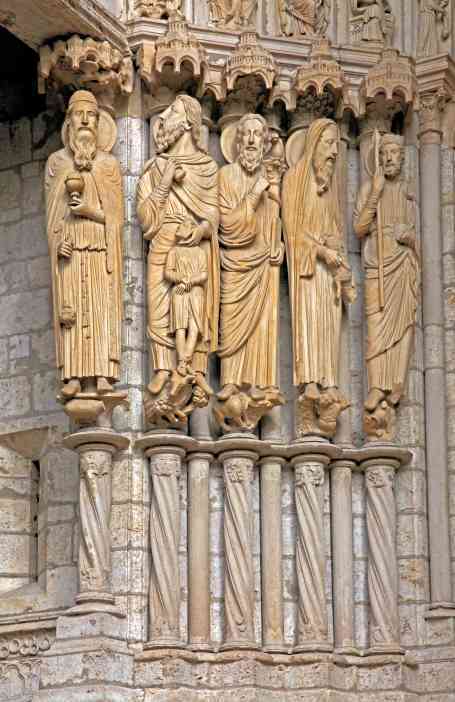 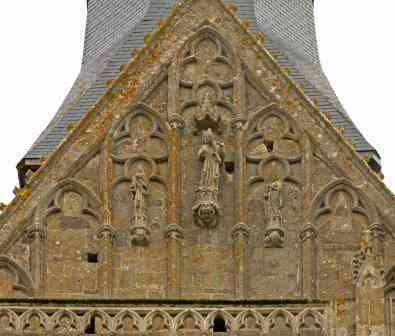 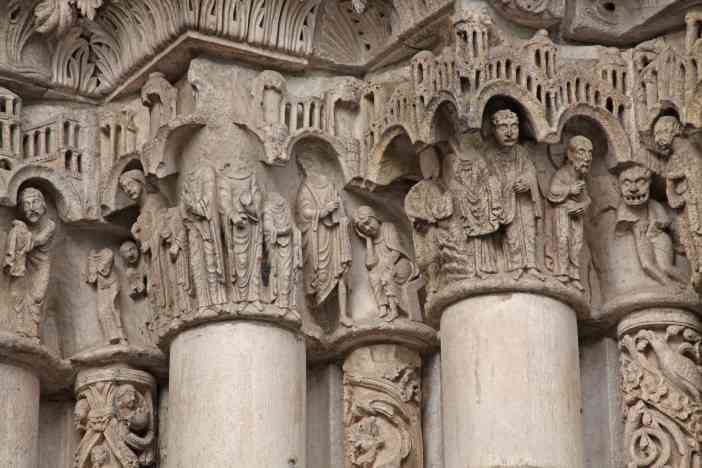 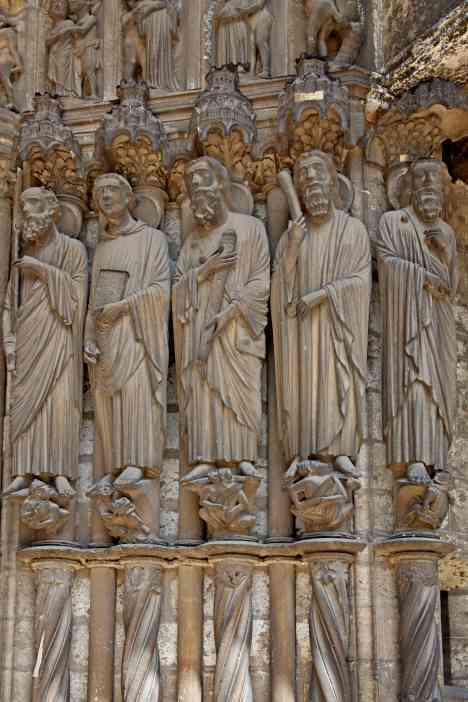 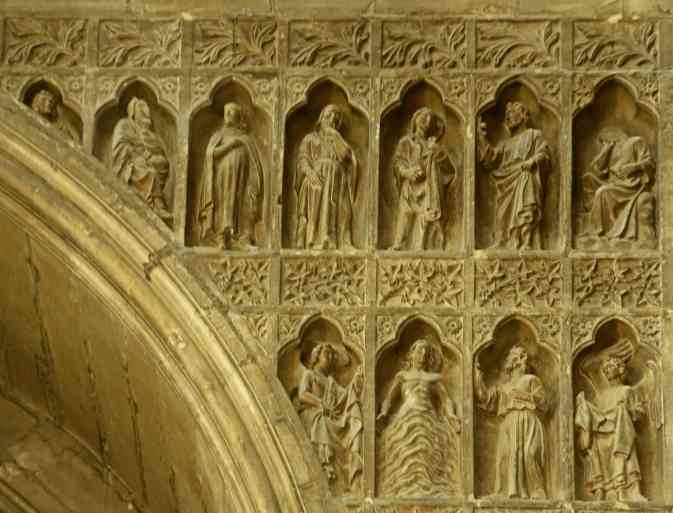 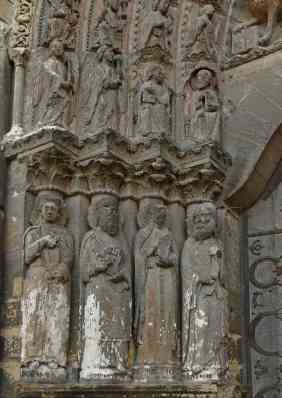 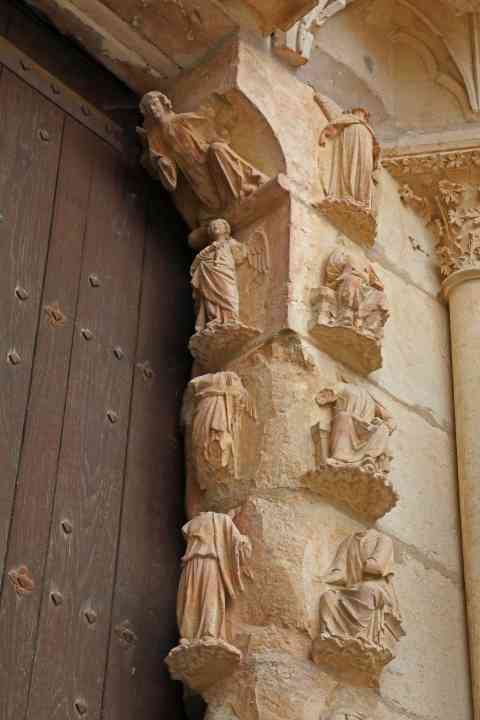 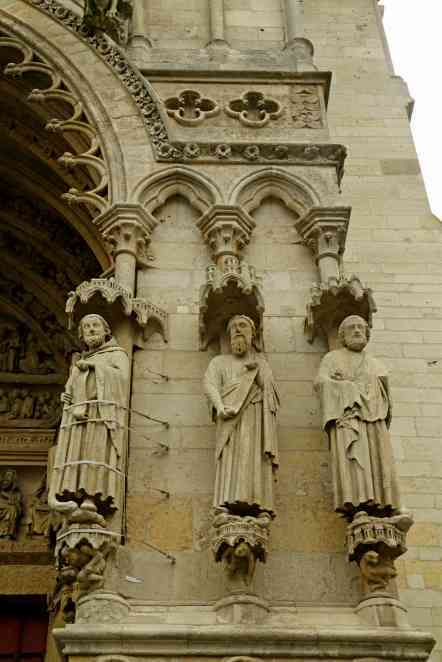 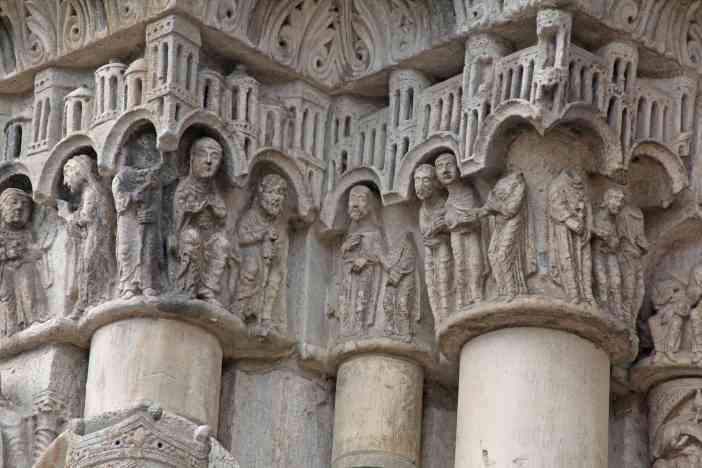 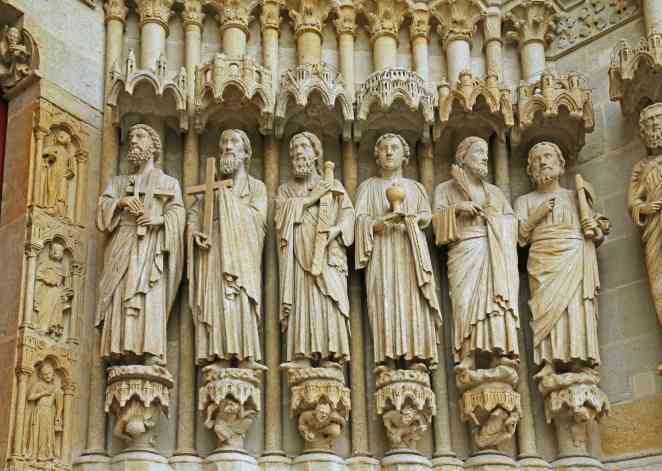 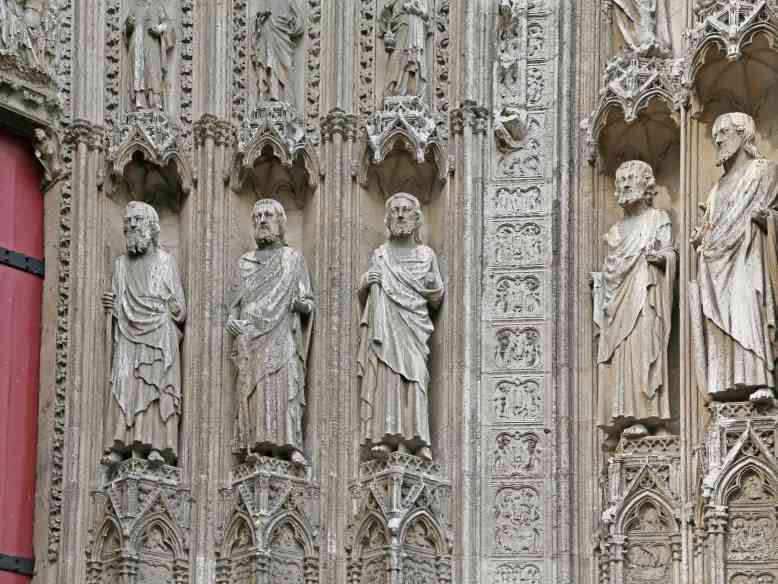 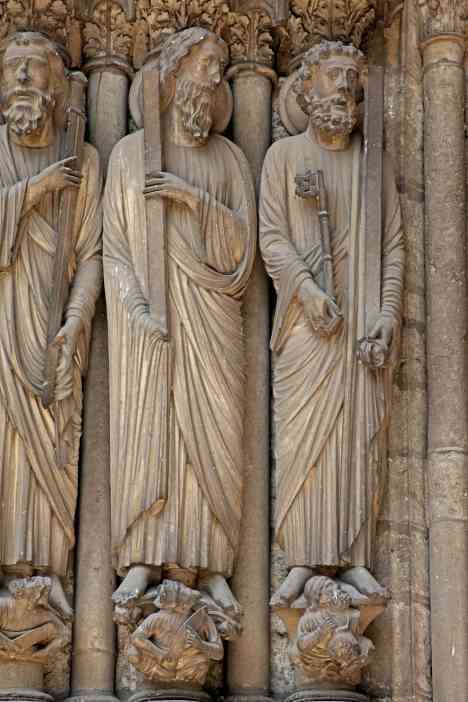 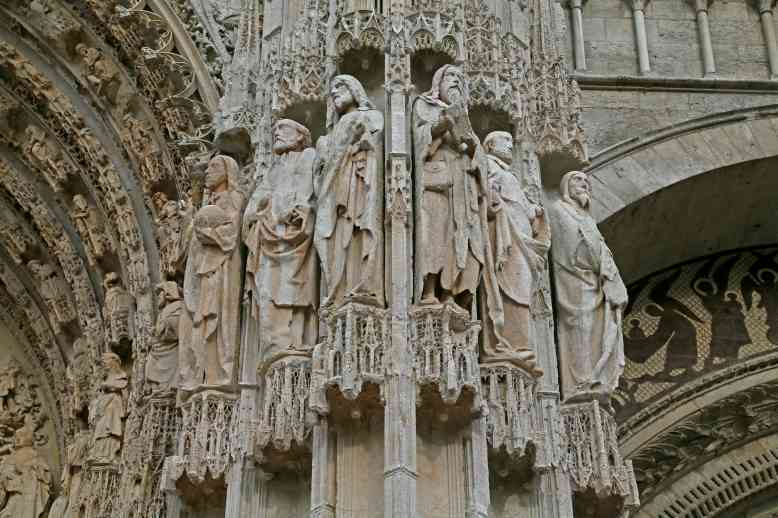 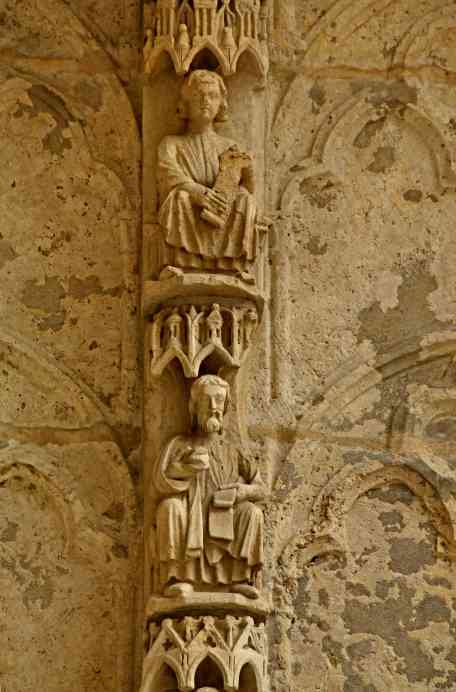 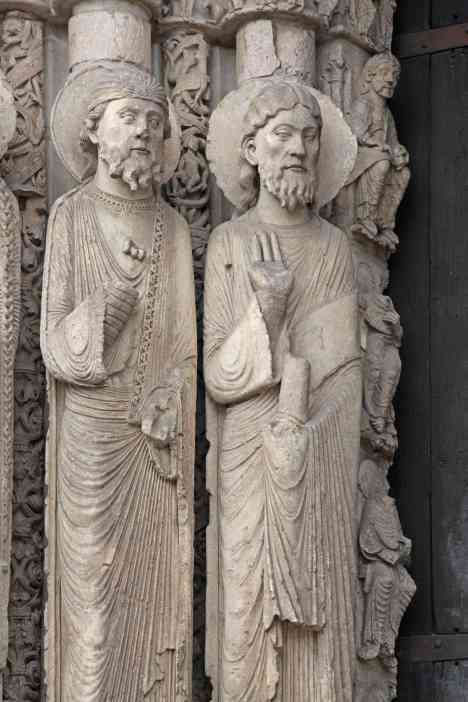 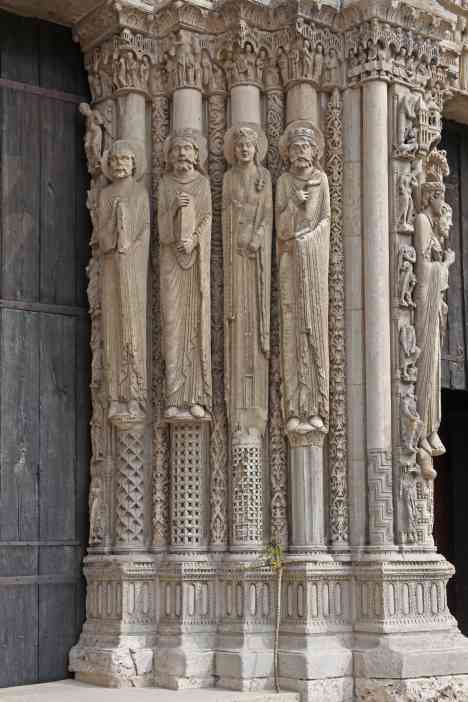 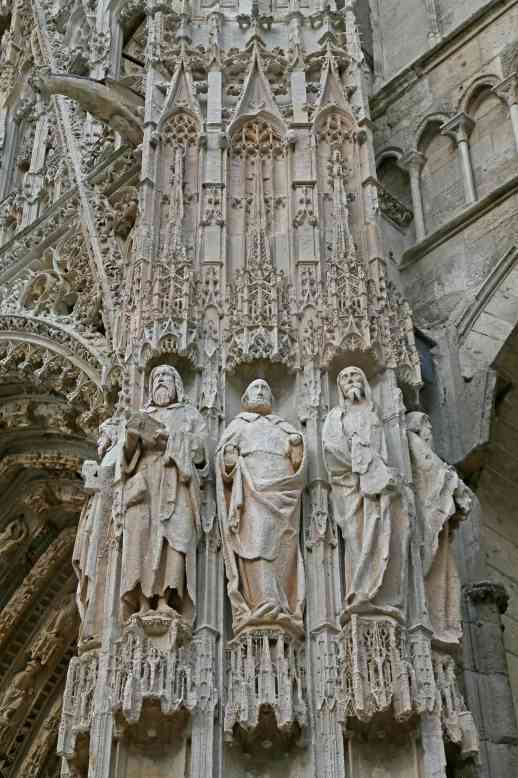 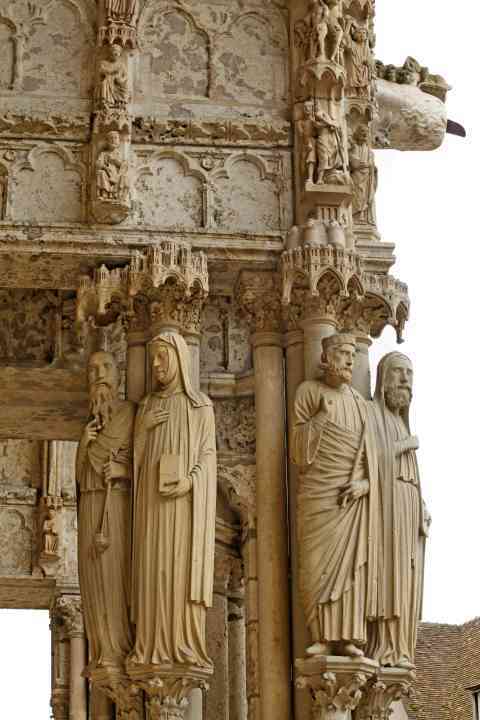 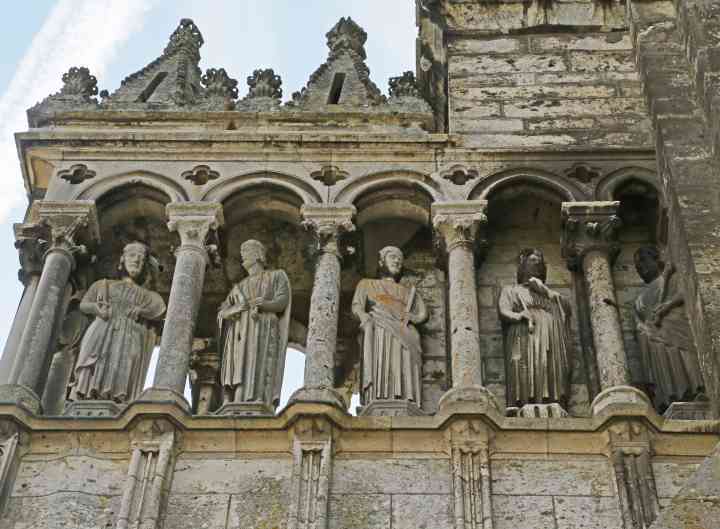 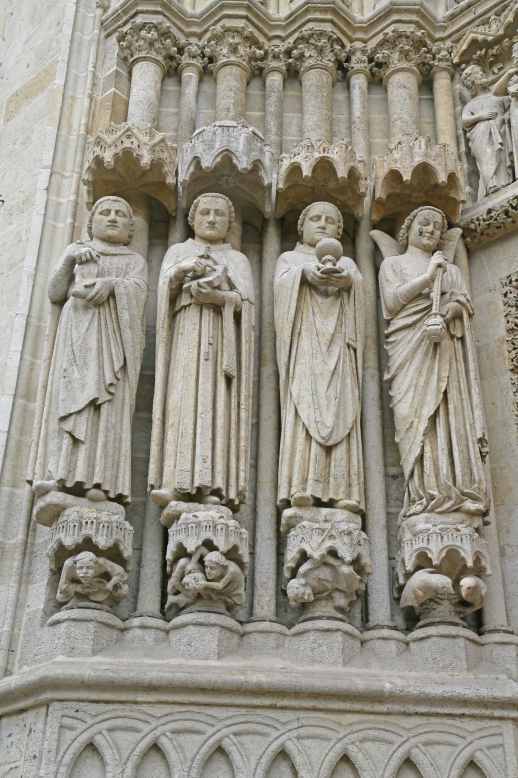 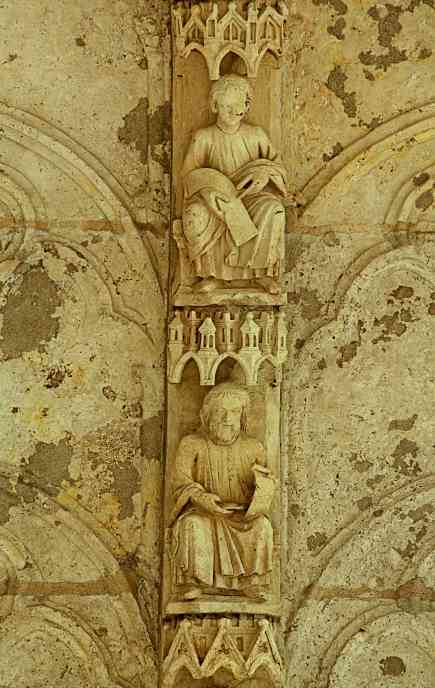 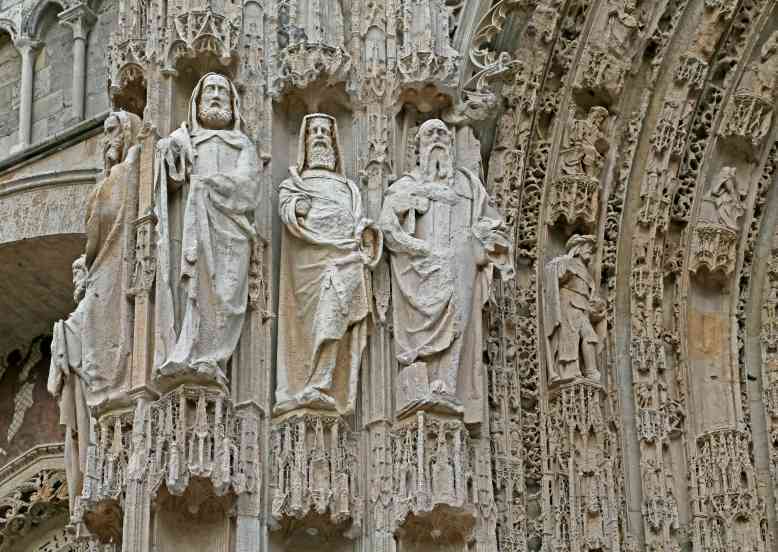 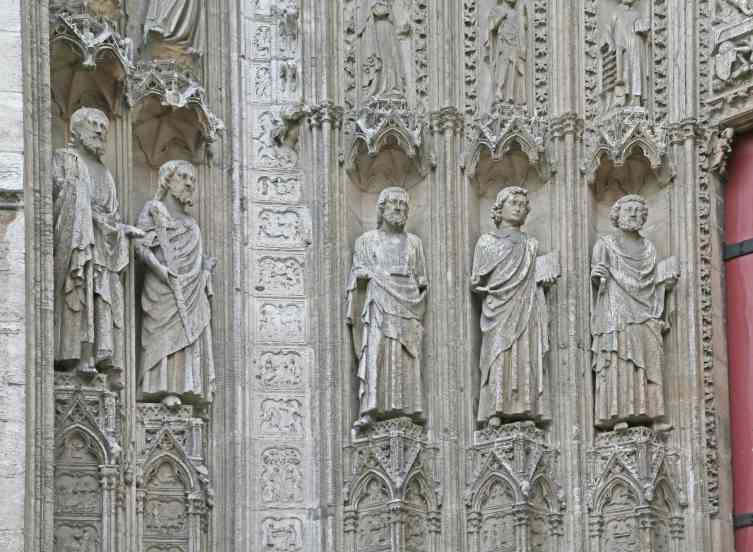 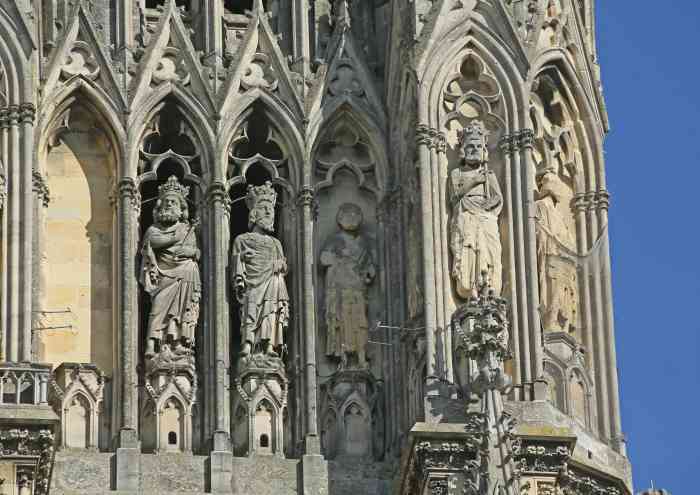 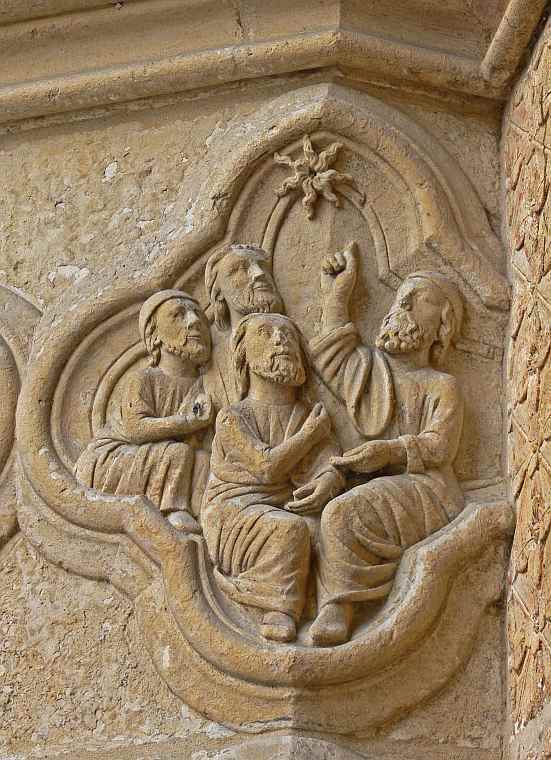 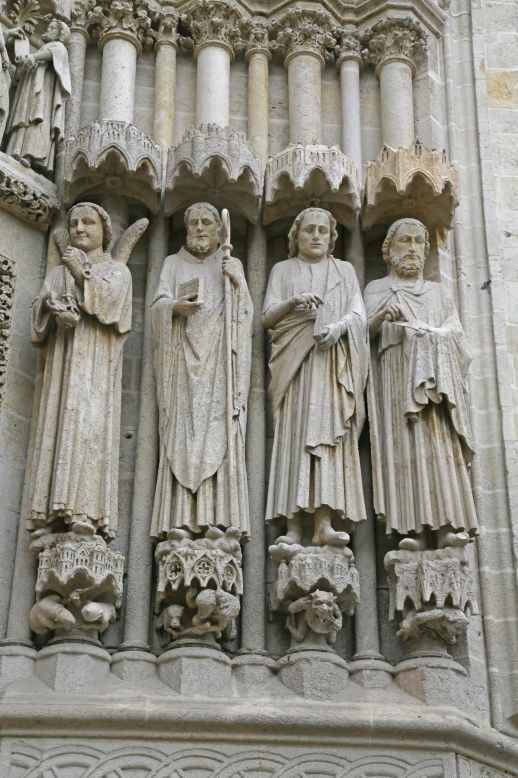 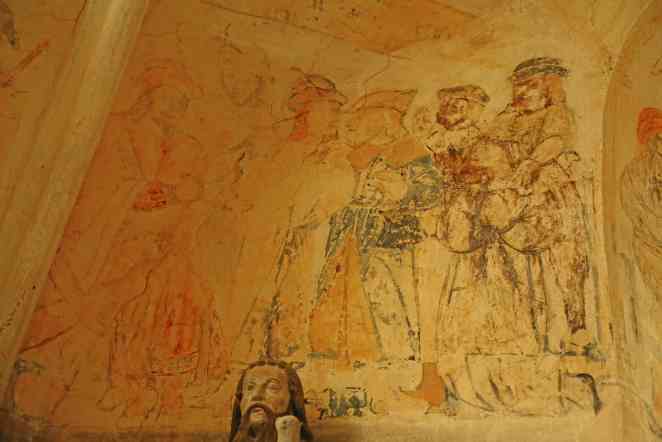 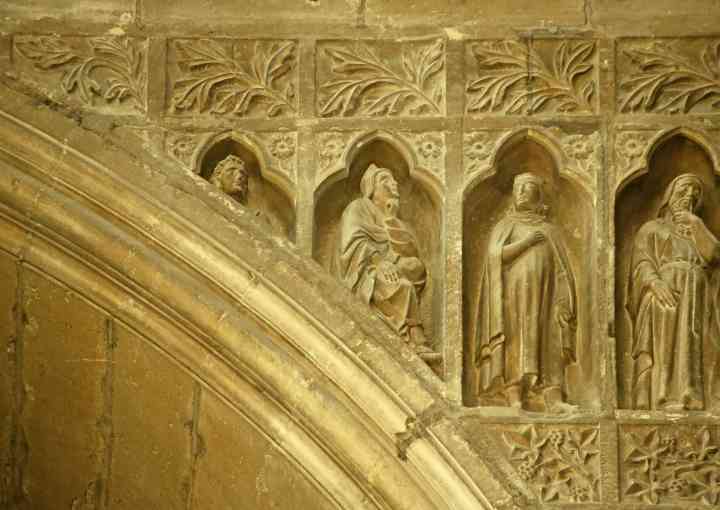 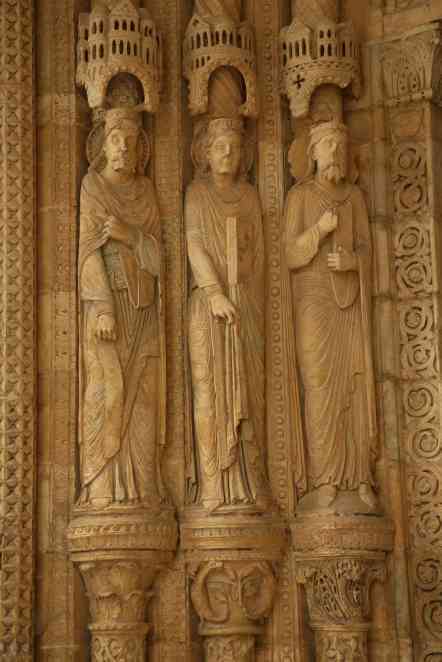 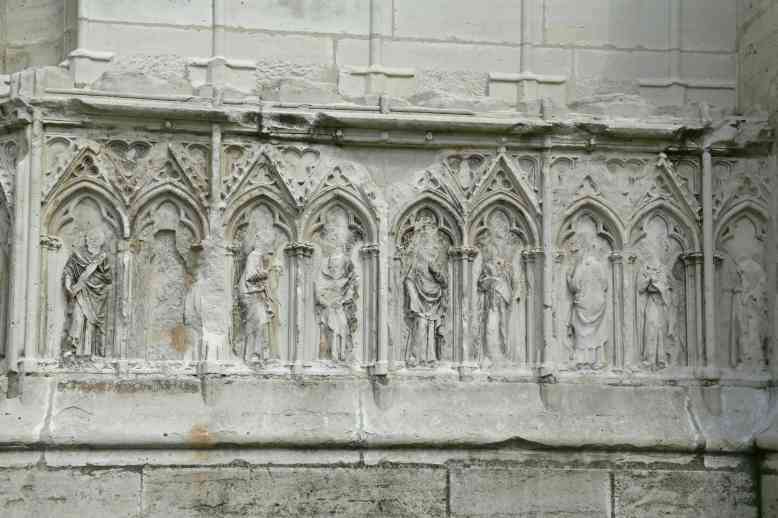 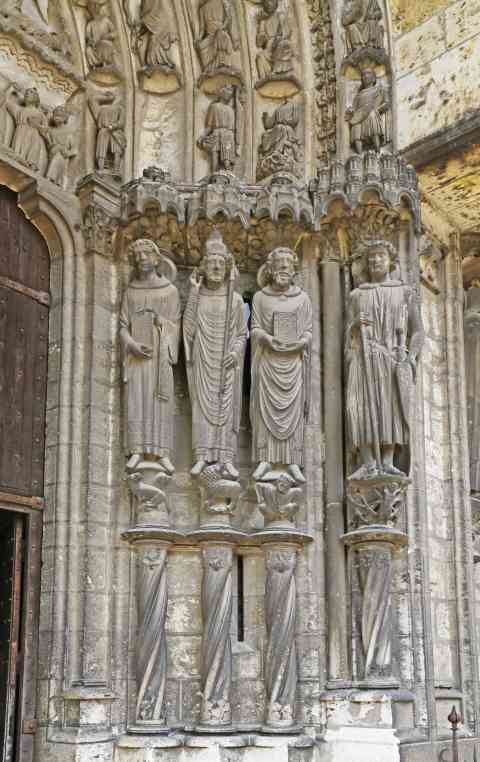 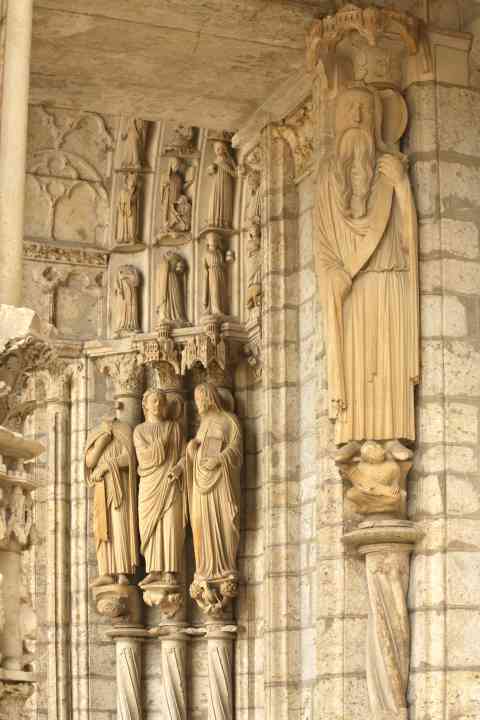 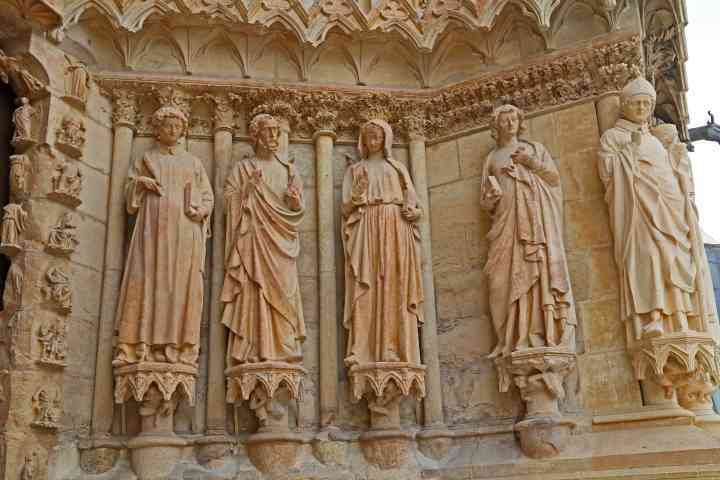 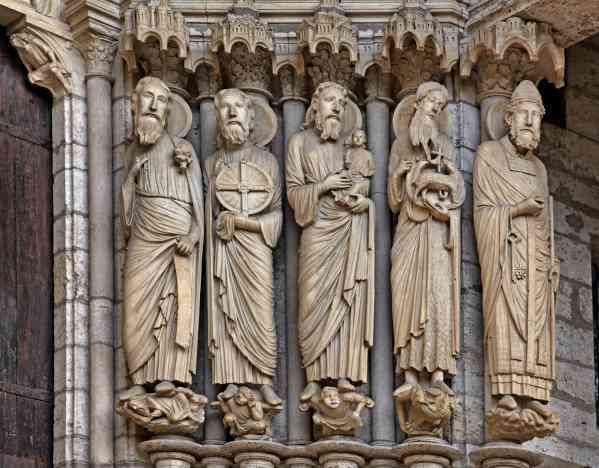 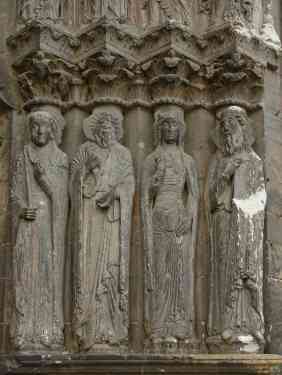 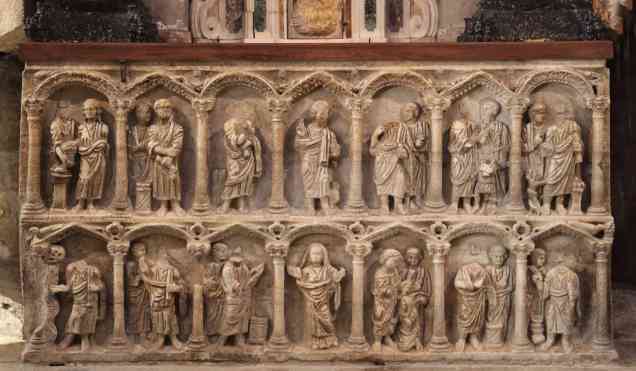 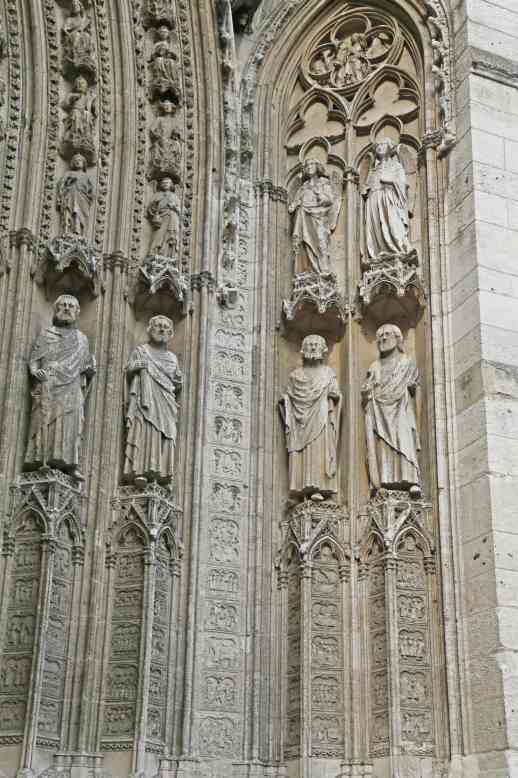 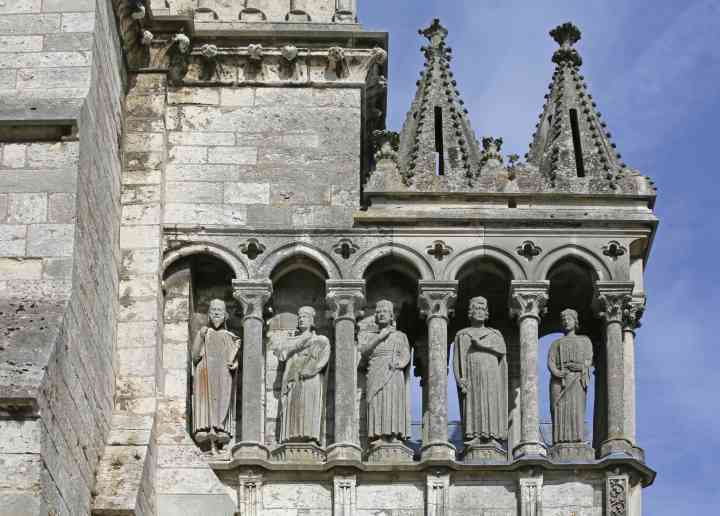 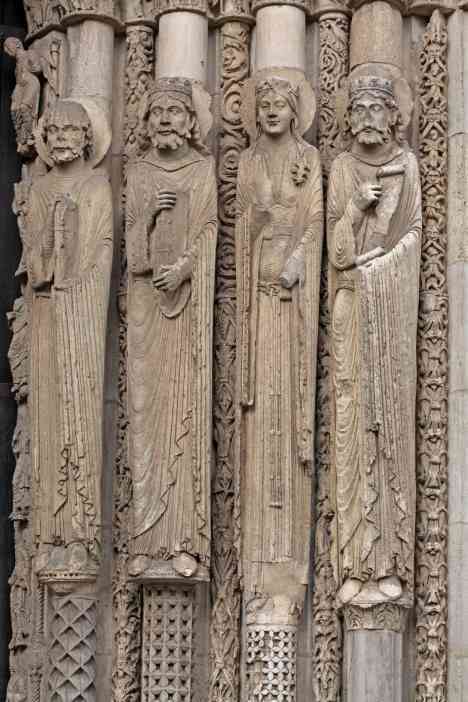 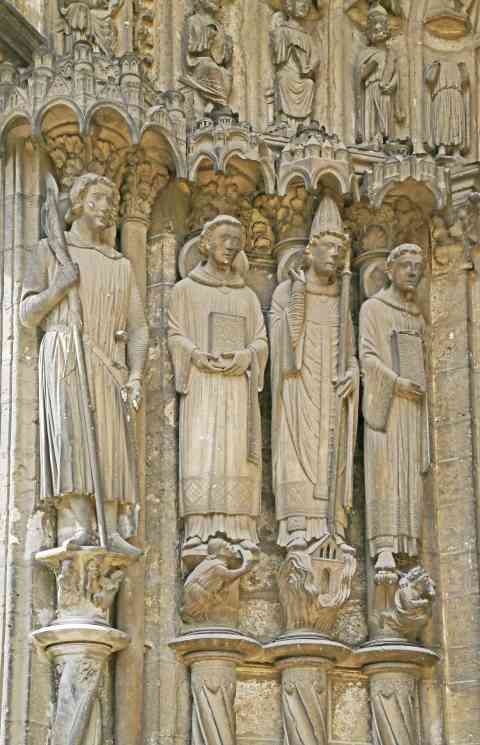 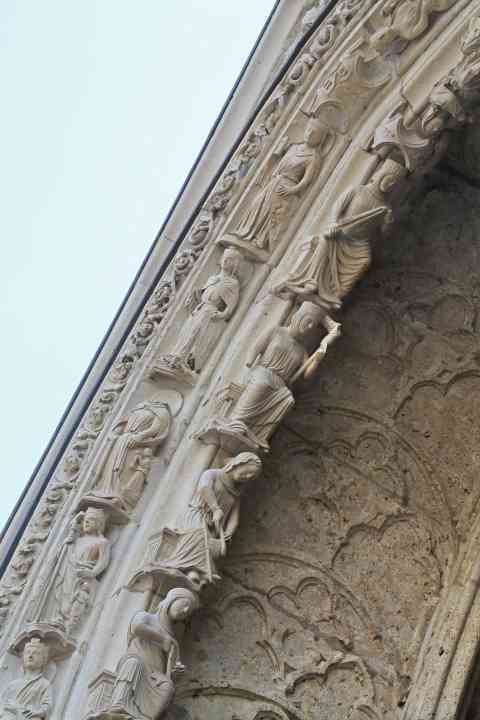 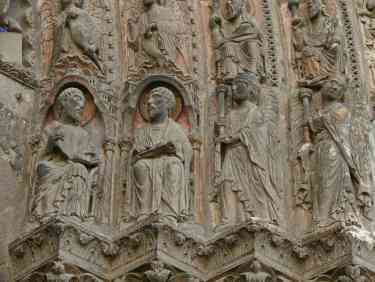 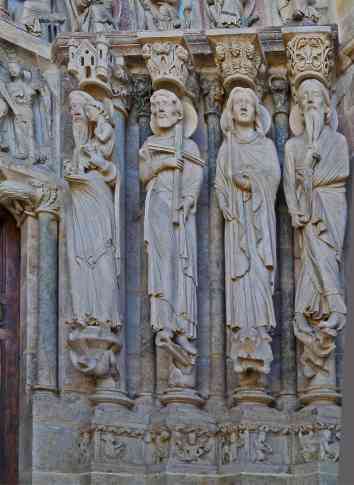 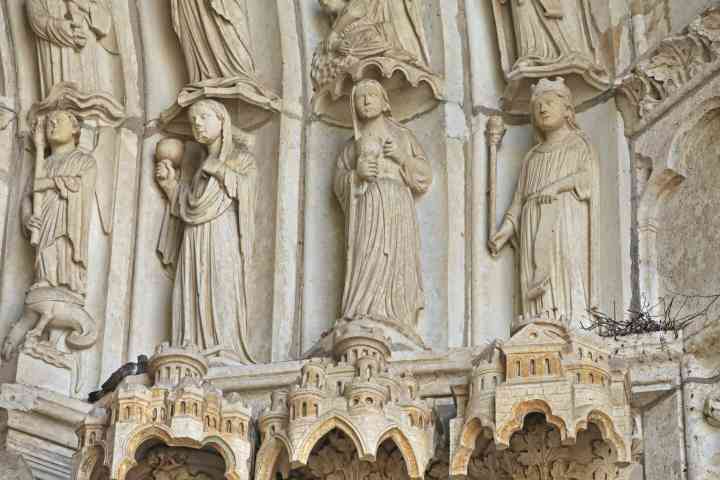 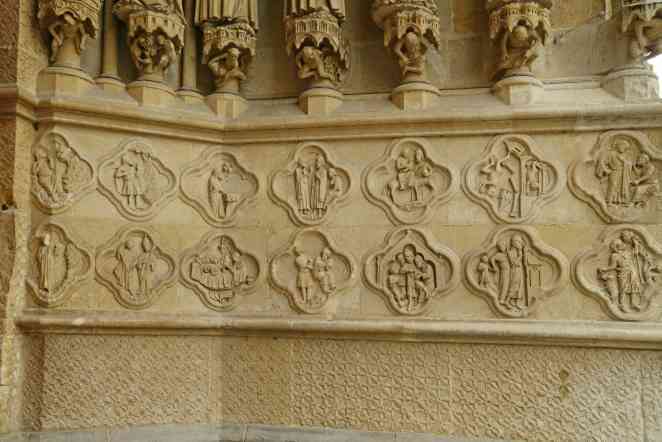 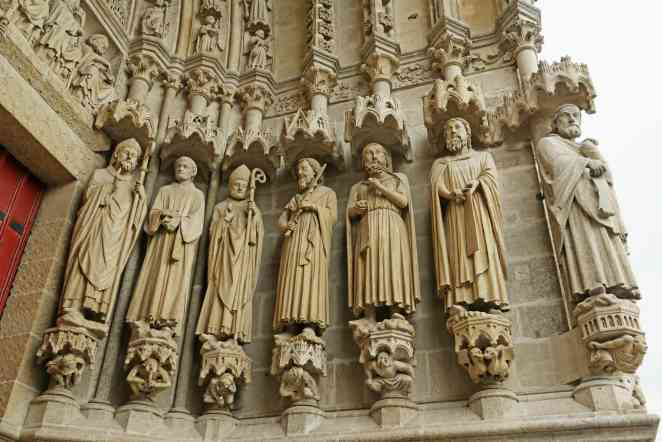 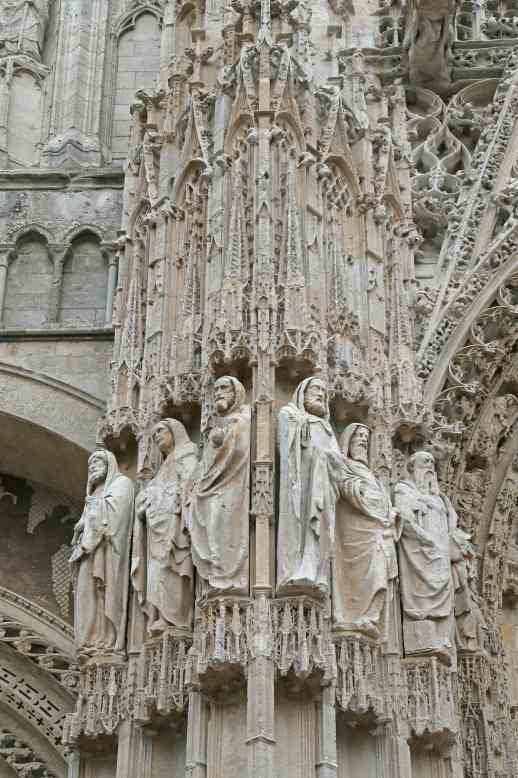 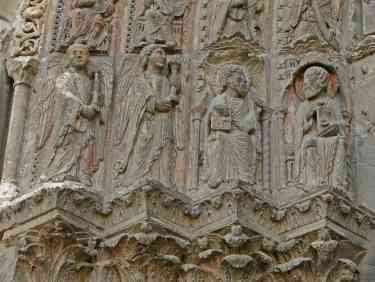 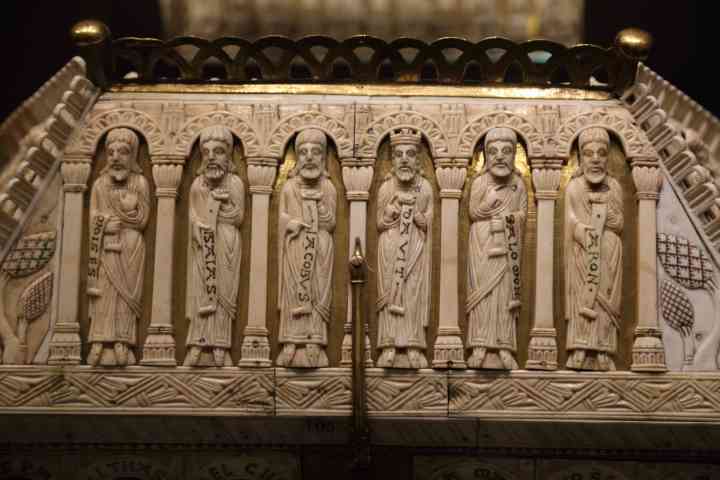 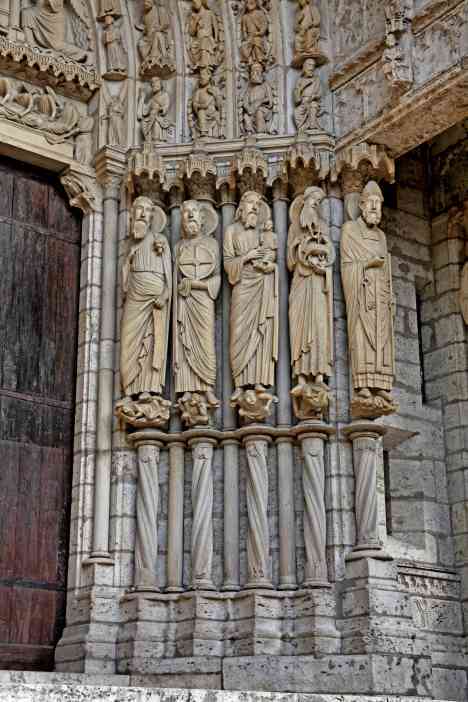 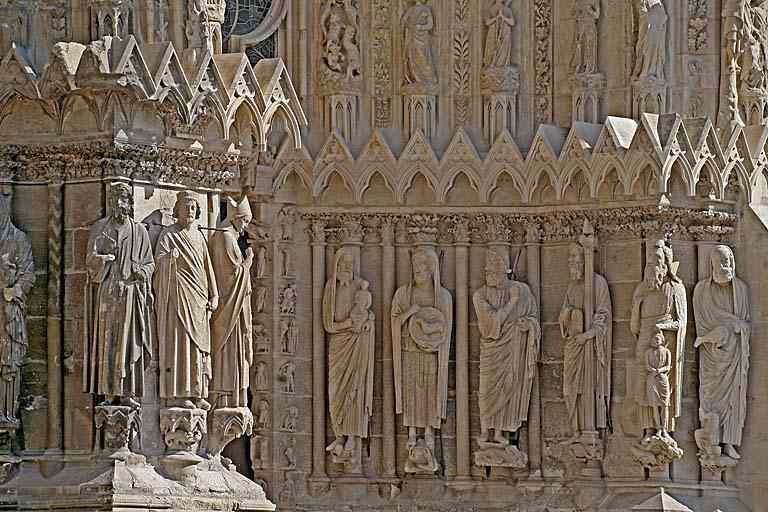 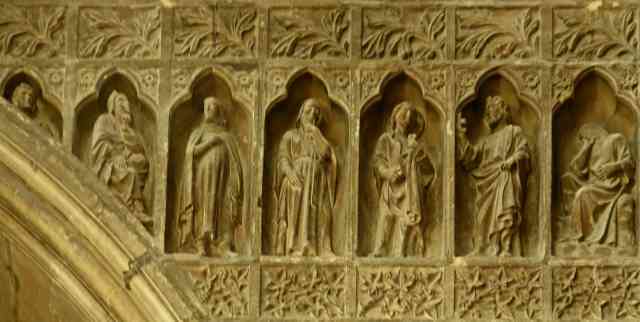 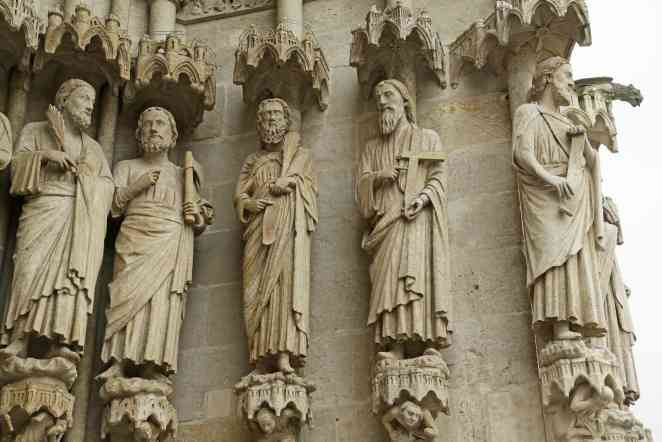 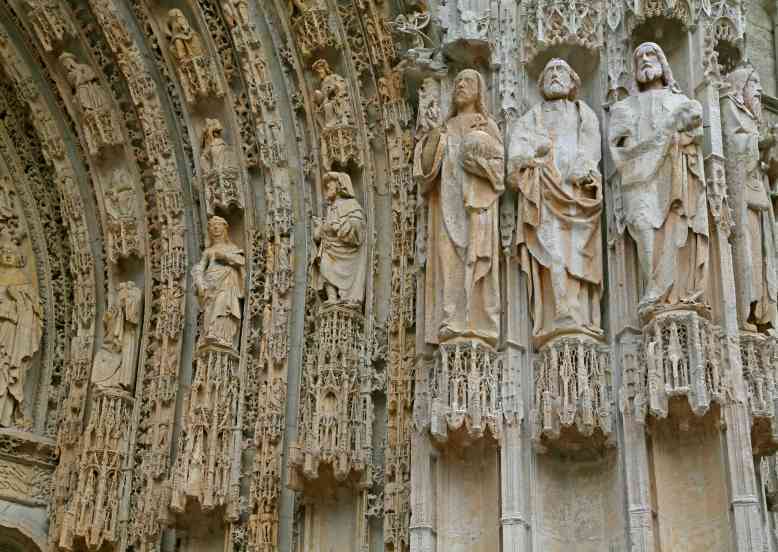 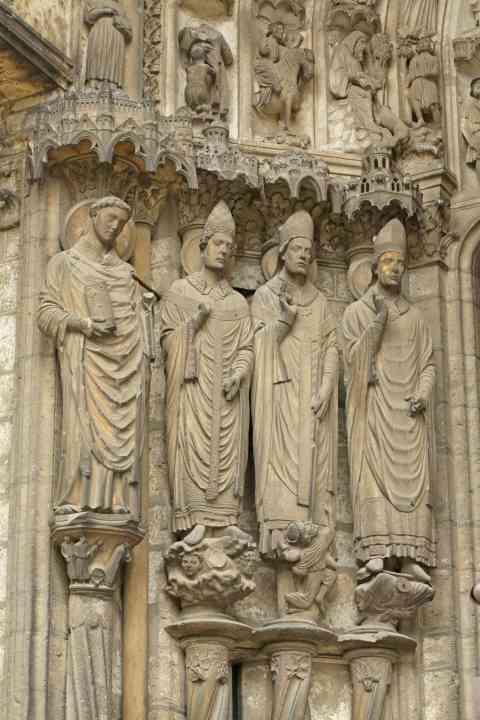 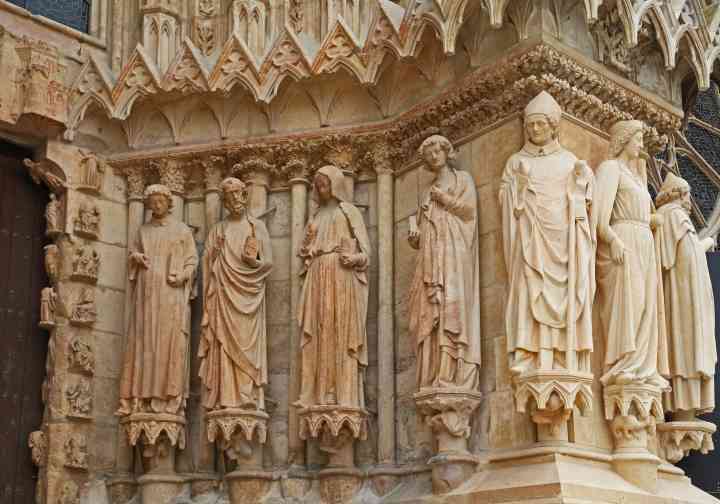 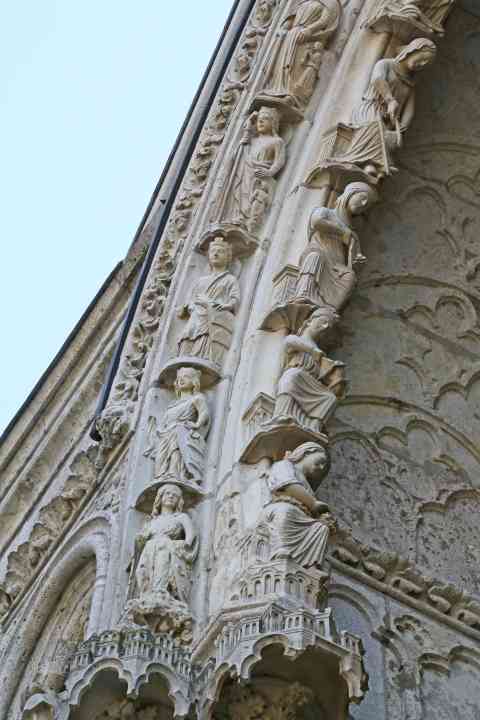 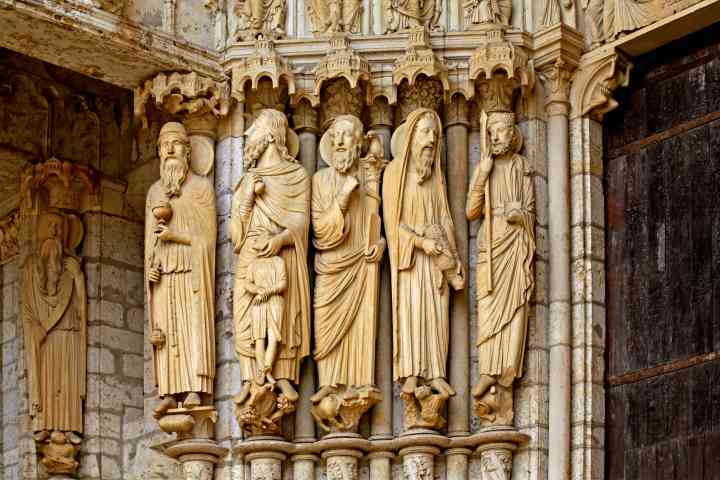 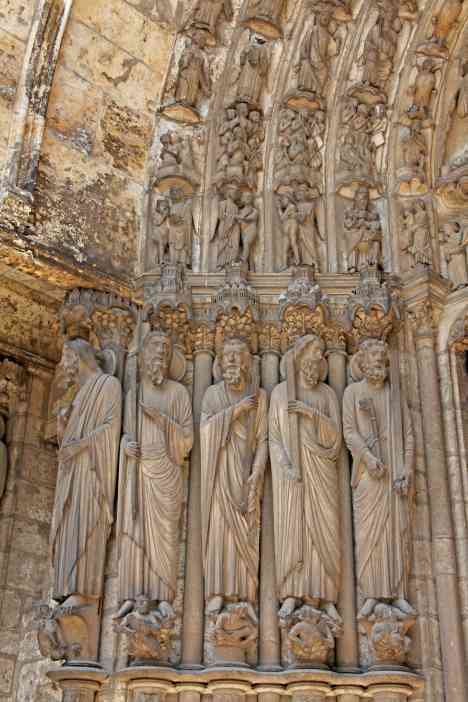 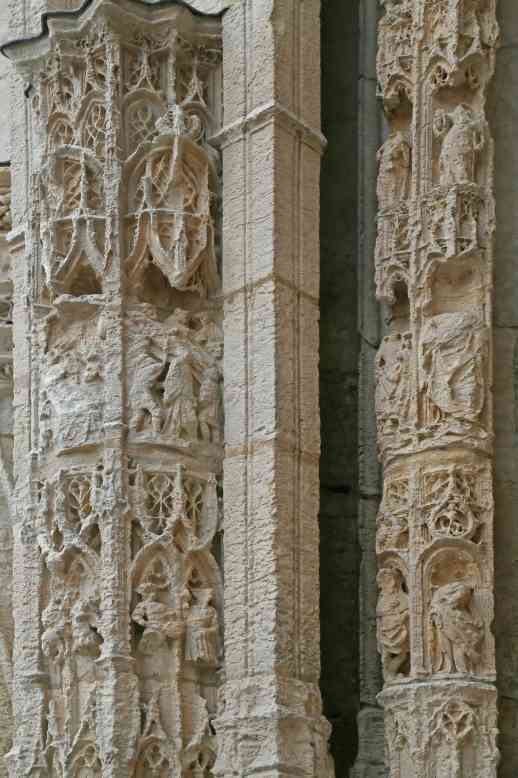 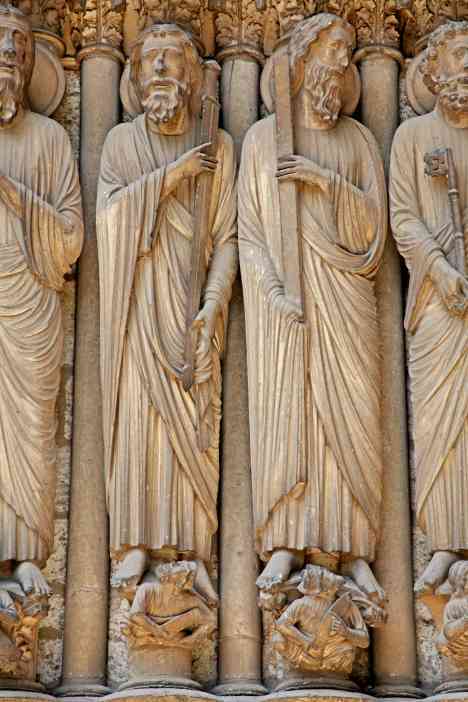 France Chartres Cathedral West door: left door left side capitals above figures: Jesus among the Doctors? 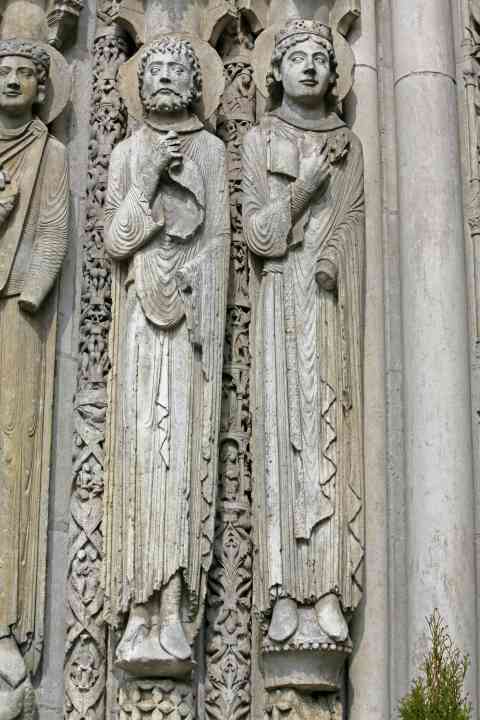 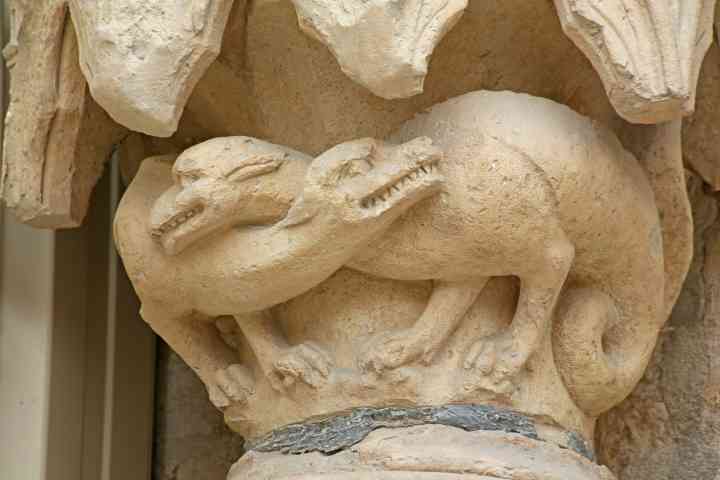 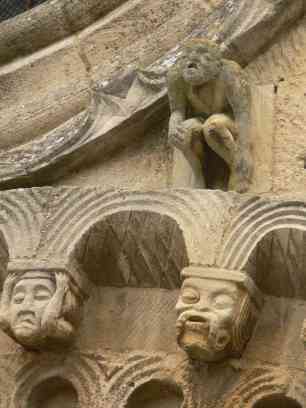 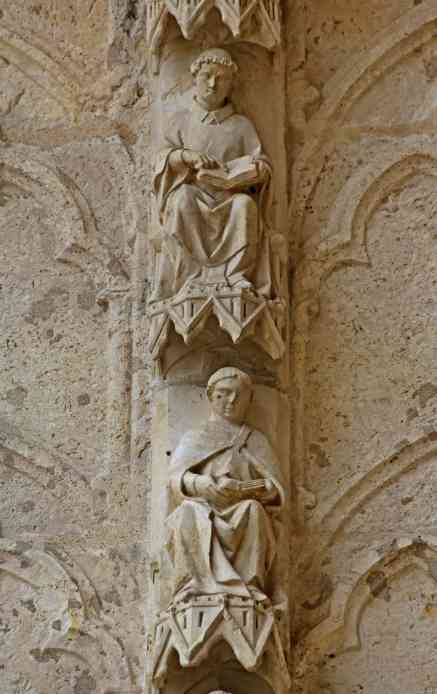 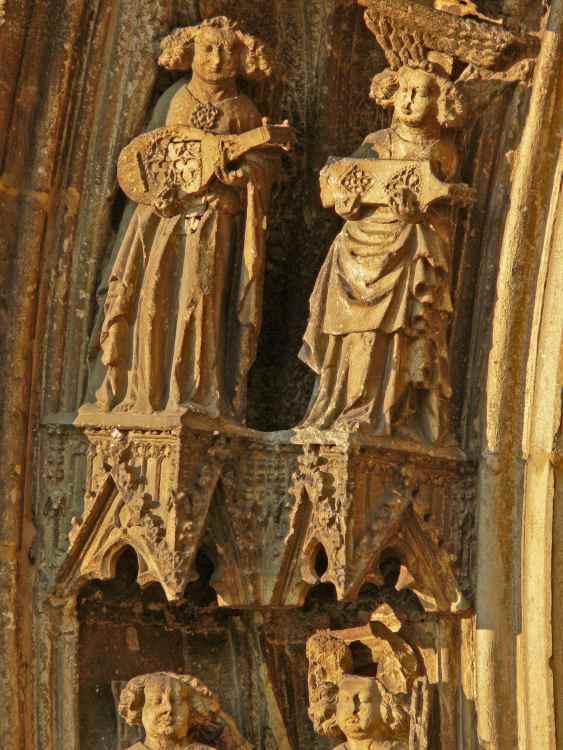 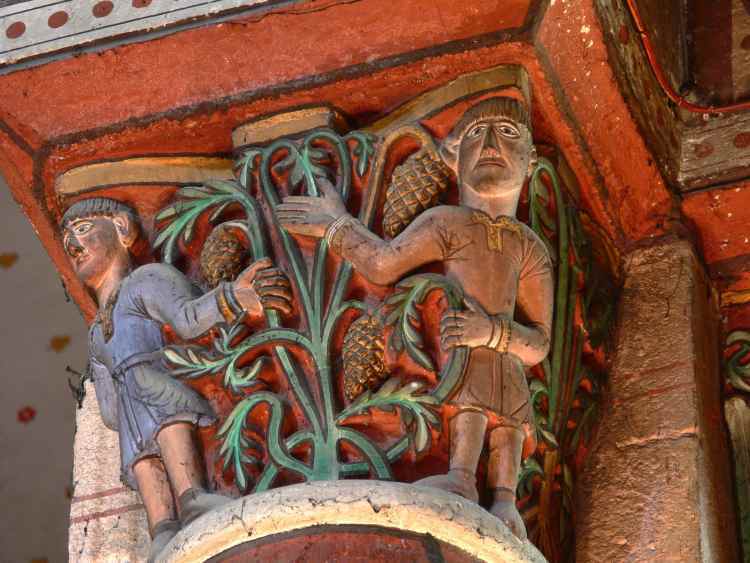 France Chartres Cathedral West door: left door right side figures: a potter? 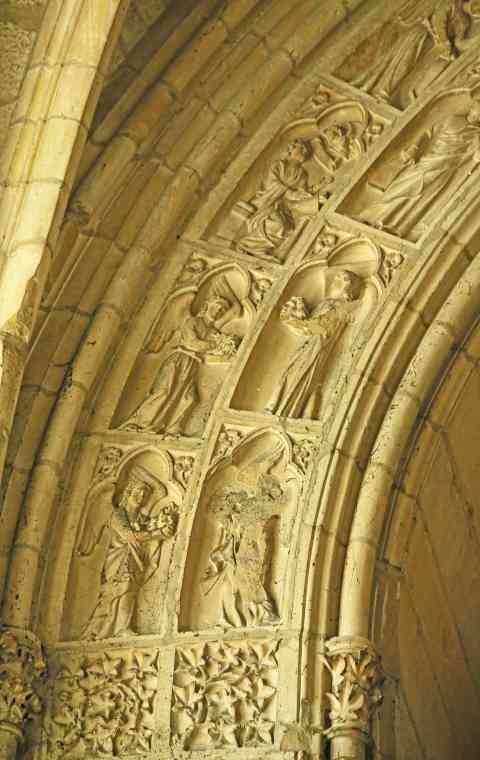 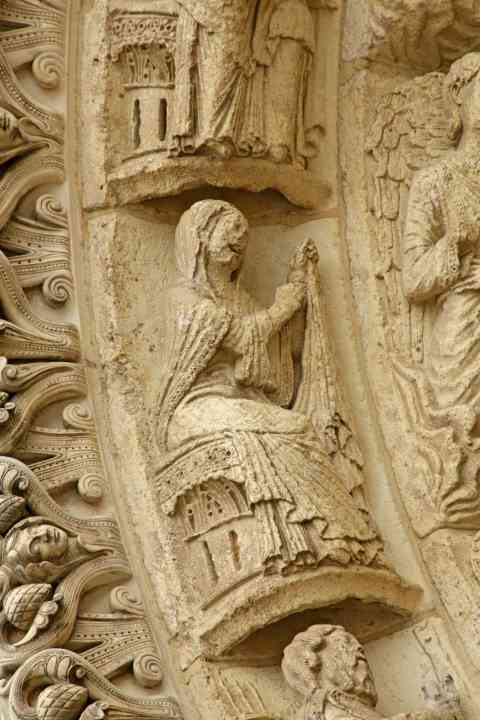 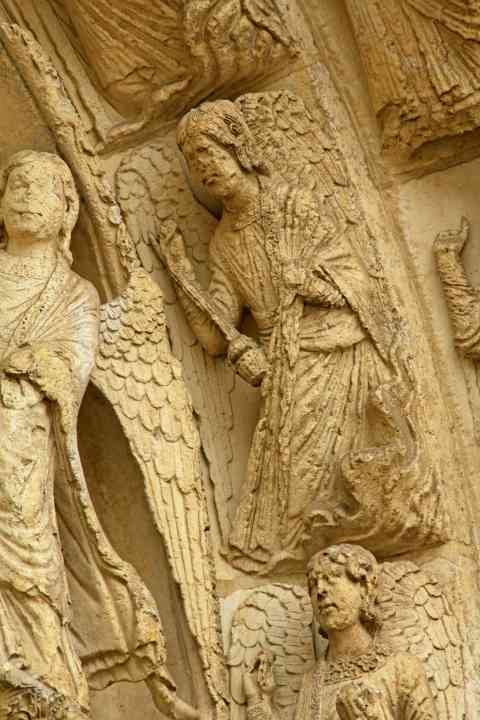 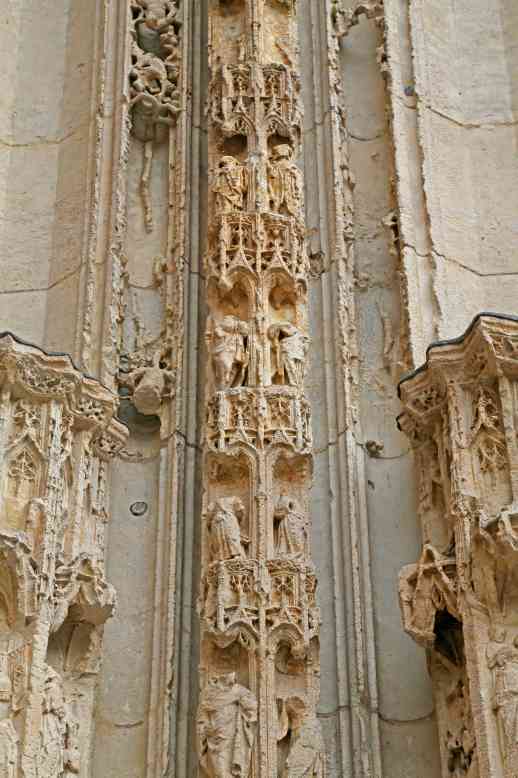 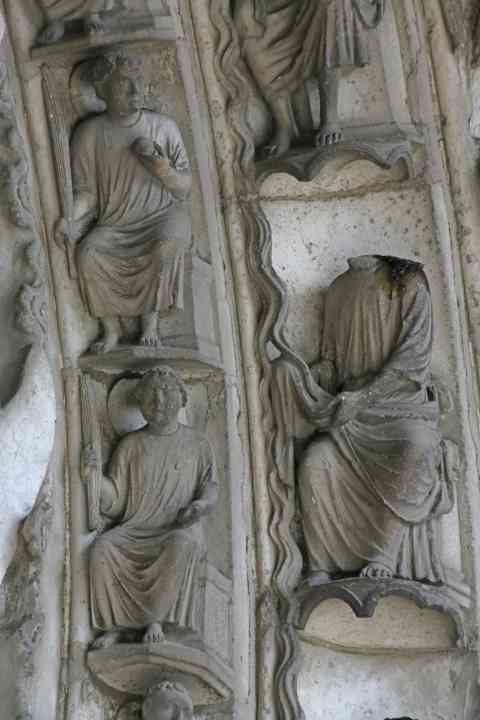 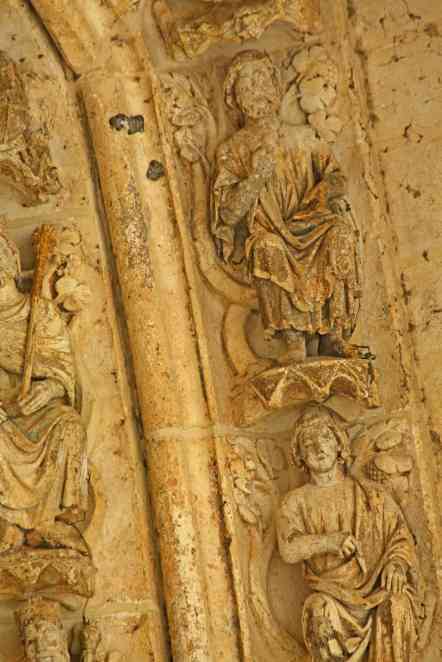 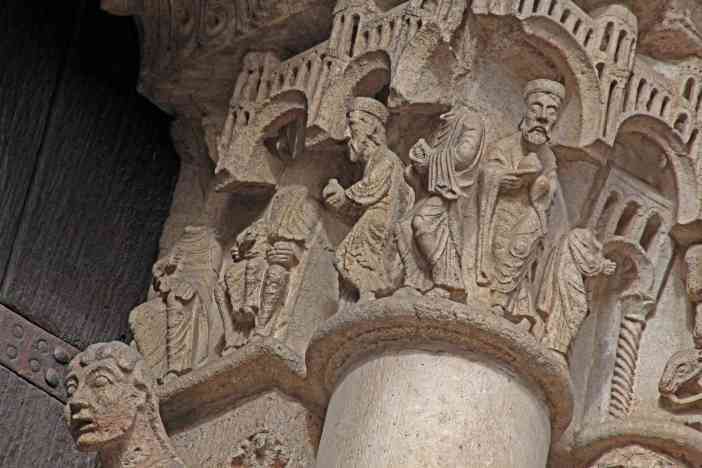 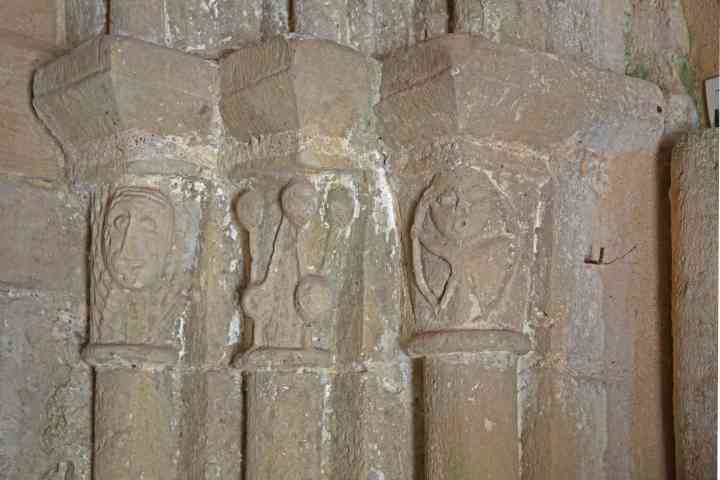 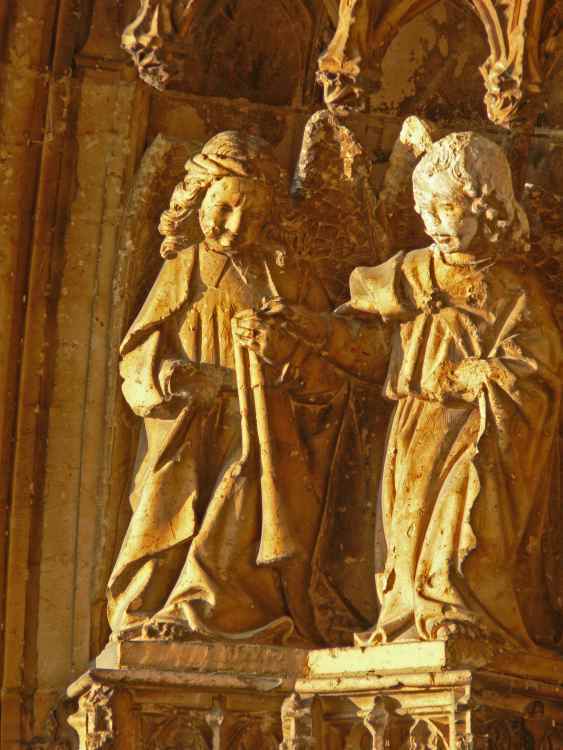 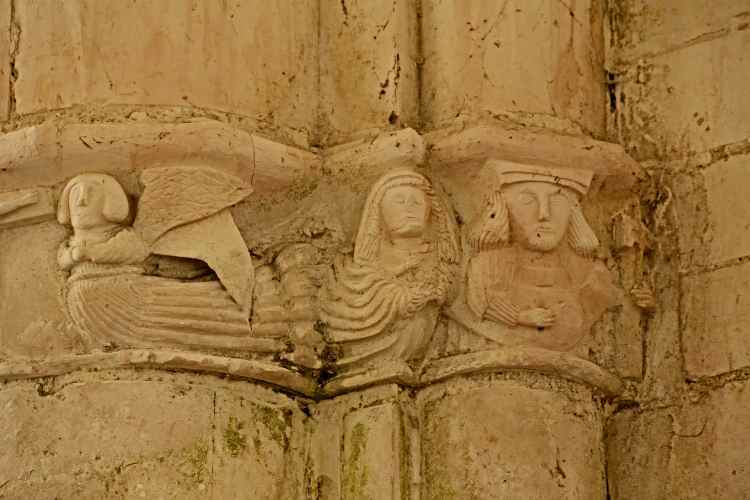 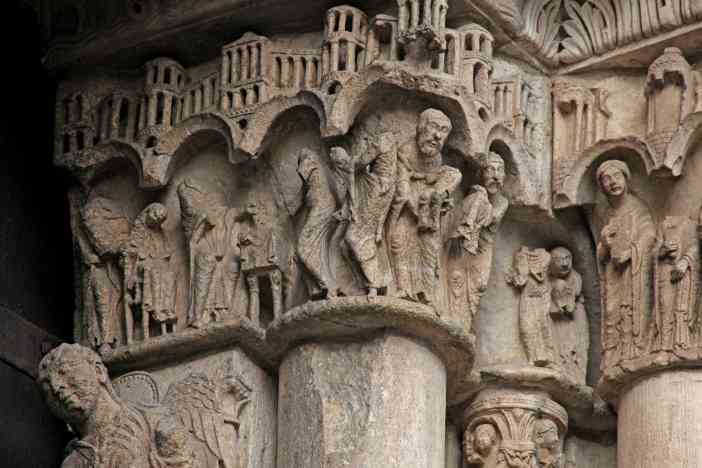 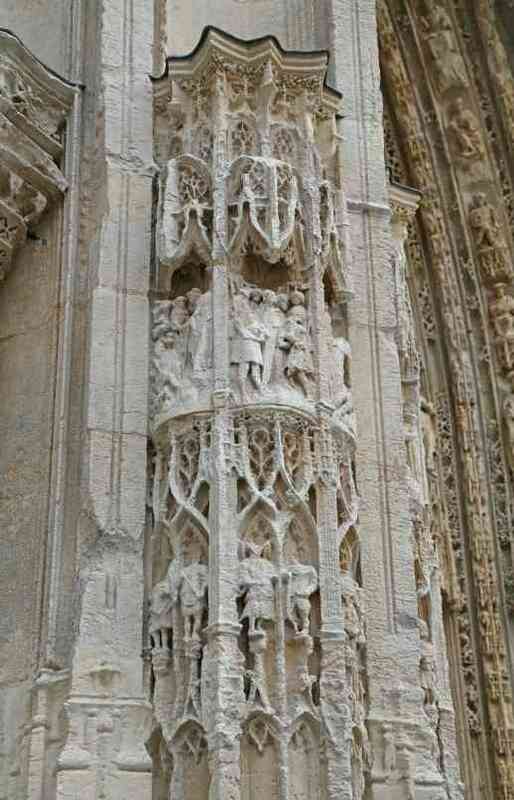 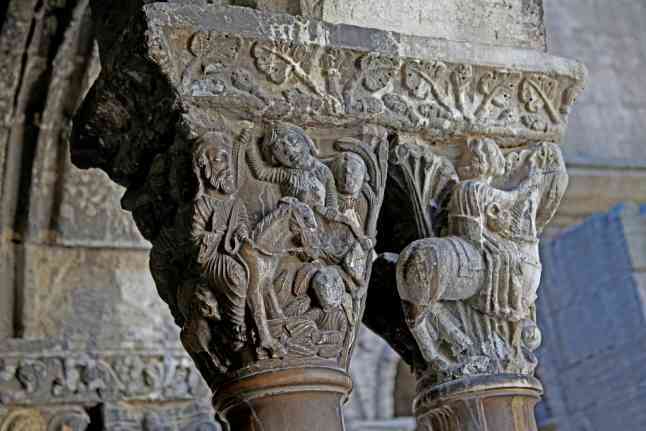 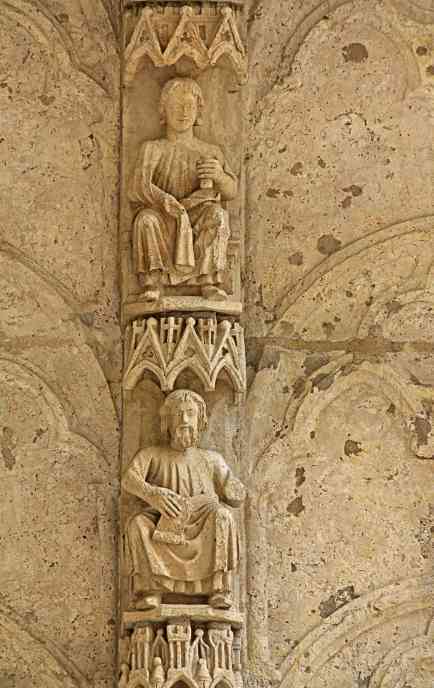 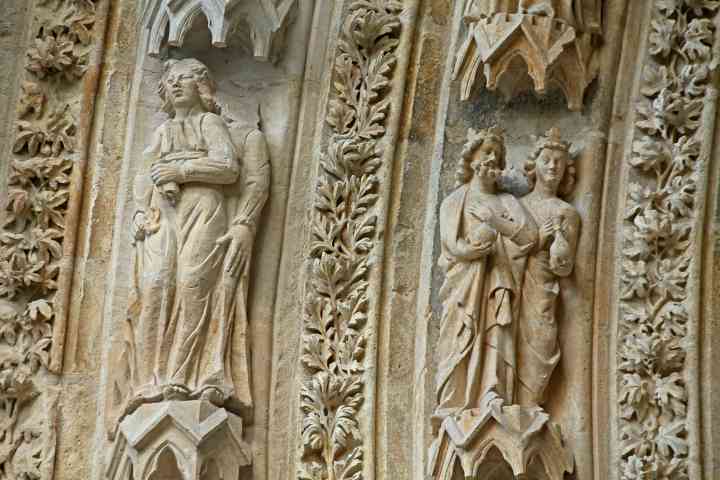 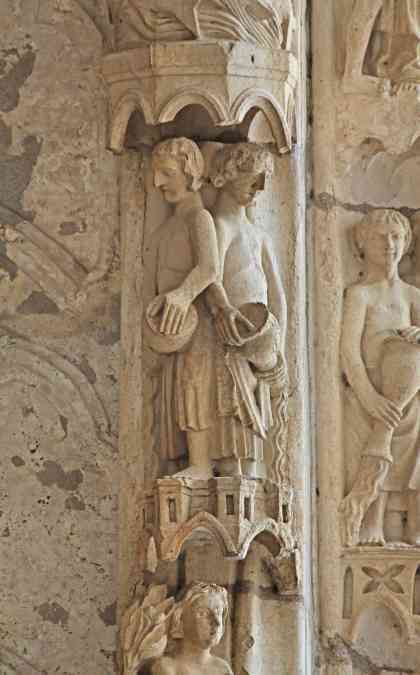 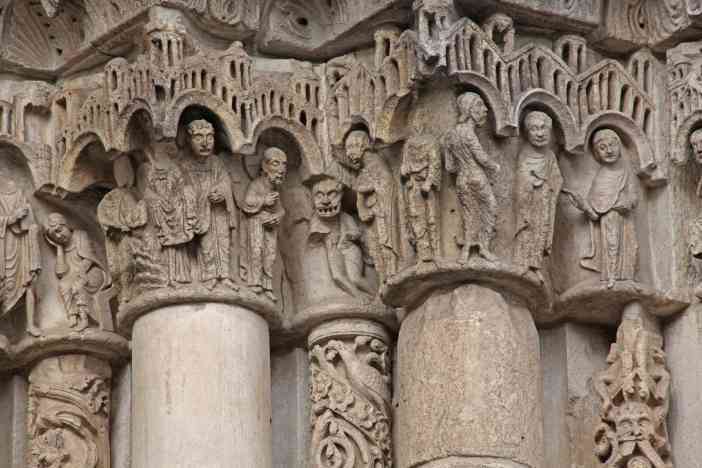 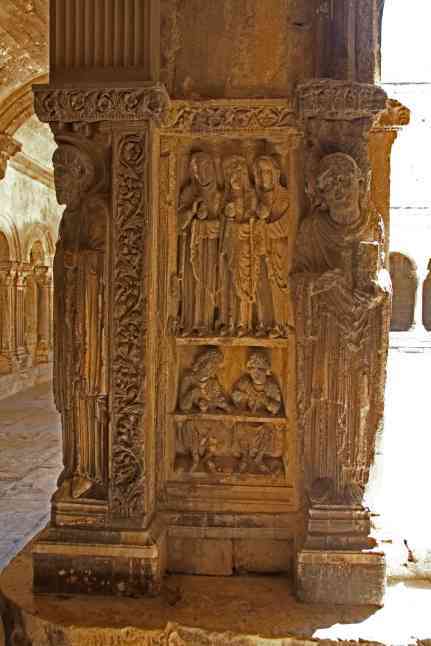 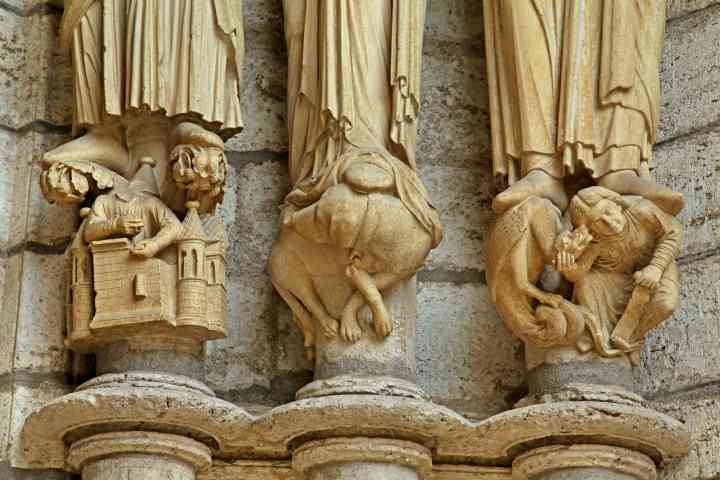 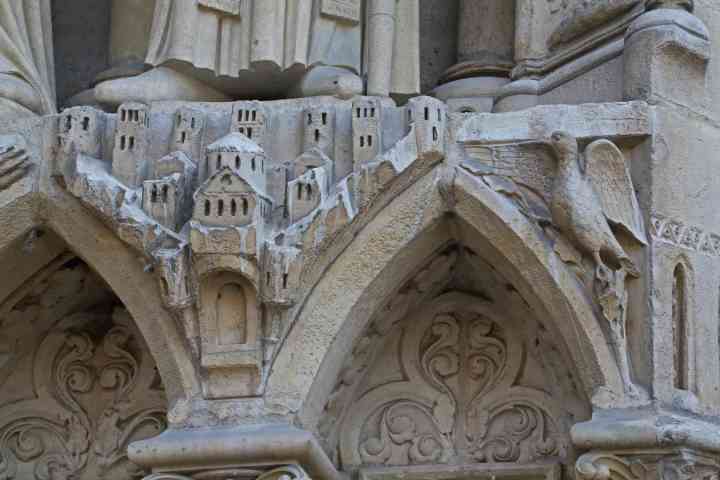 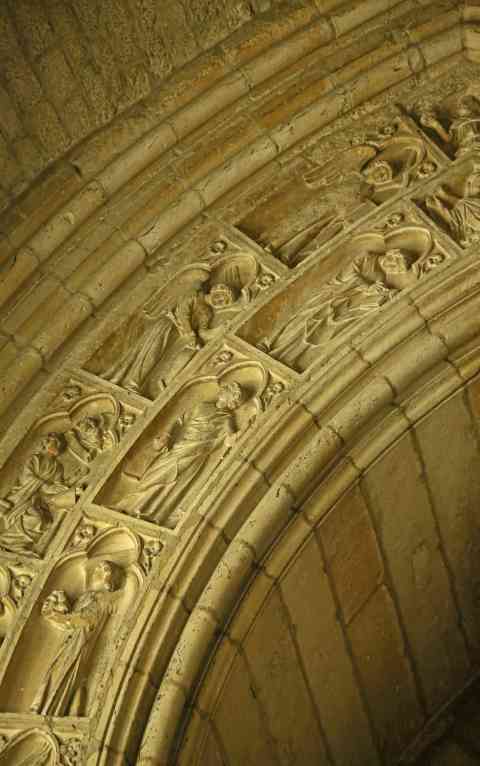 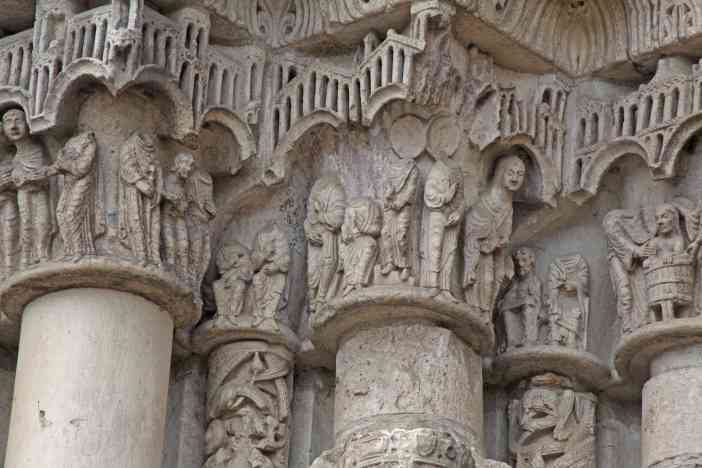 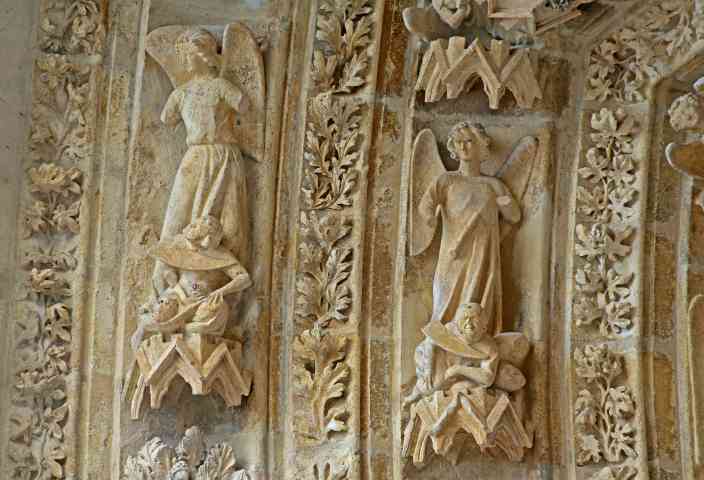 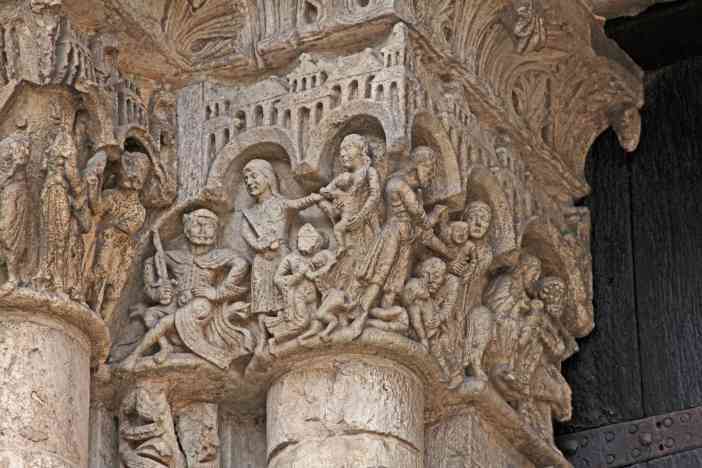 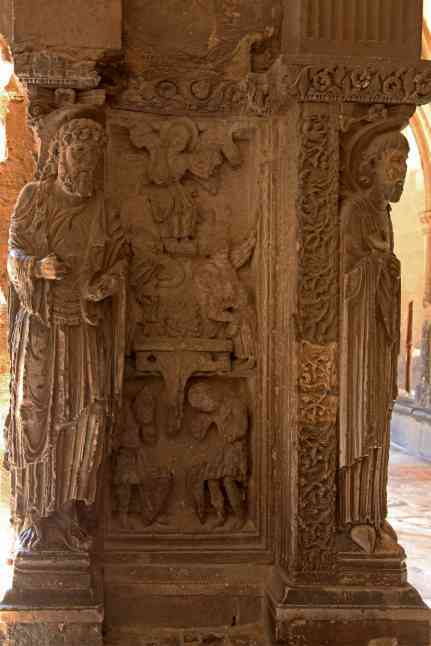 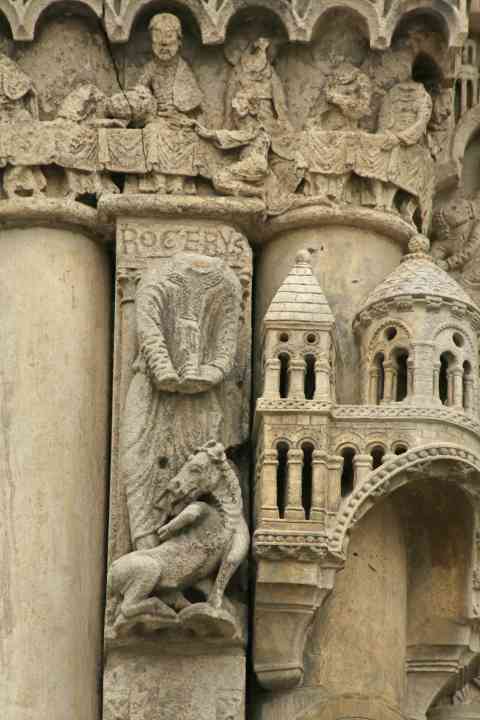 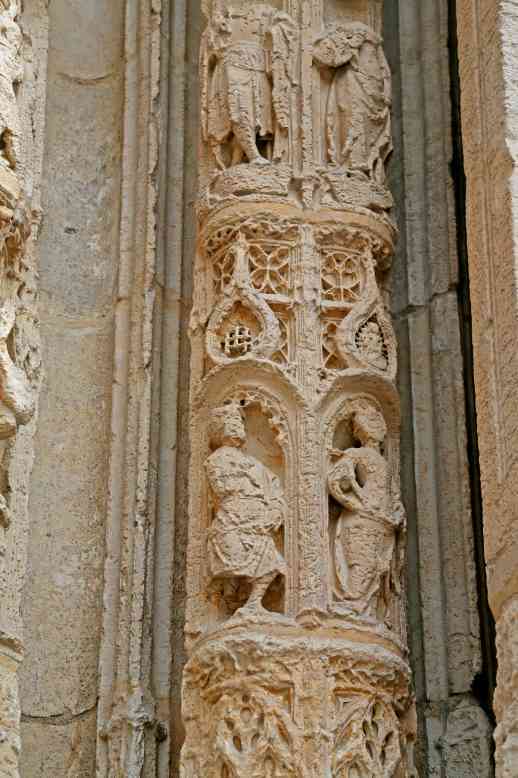 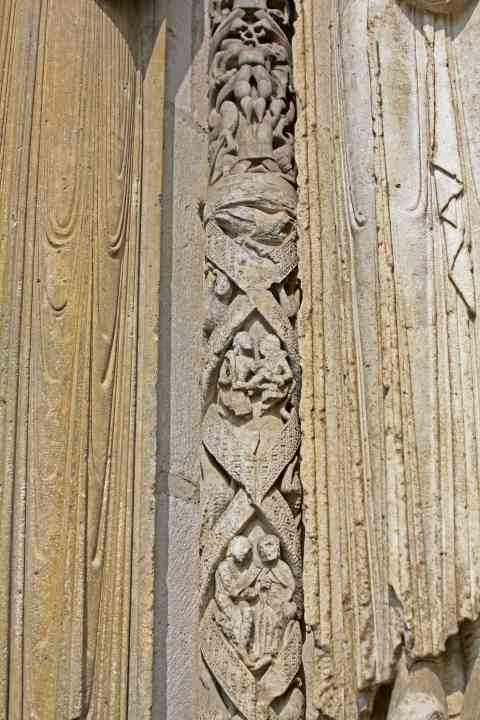 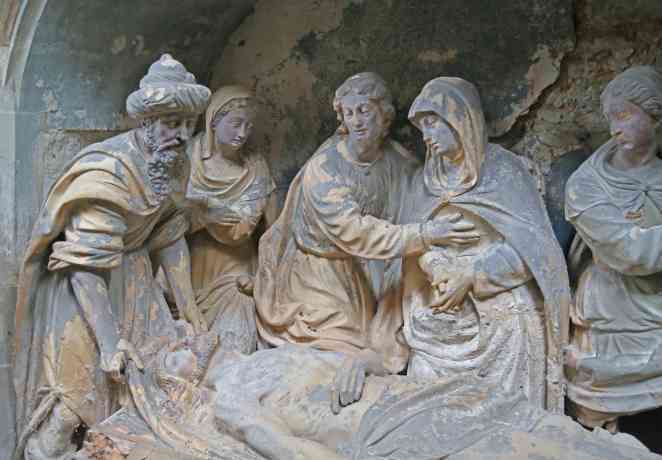 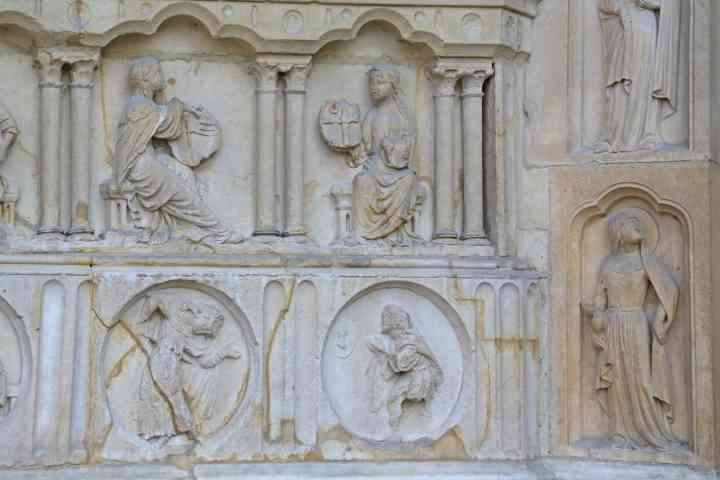 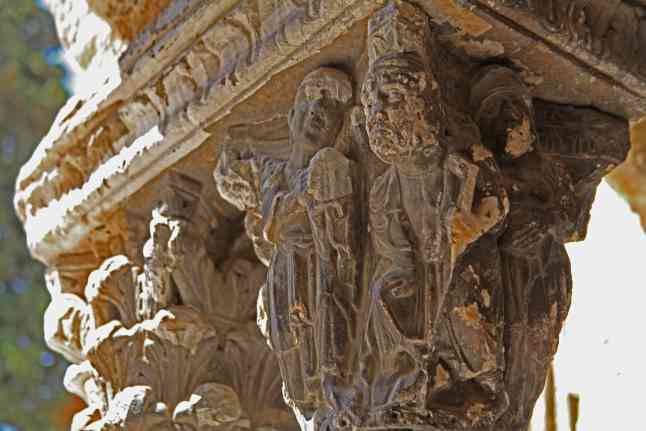 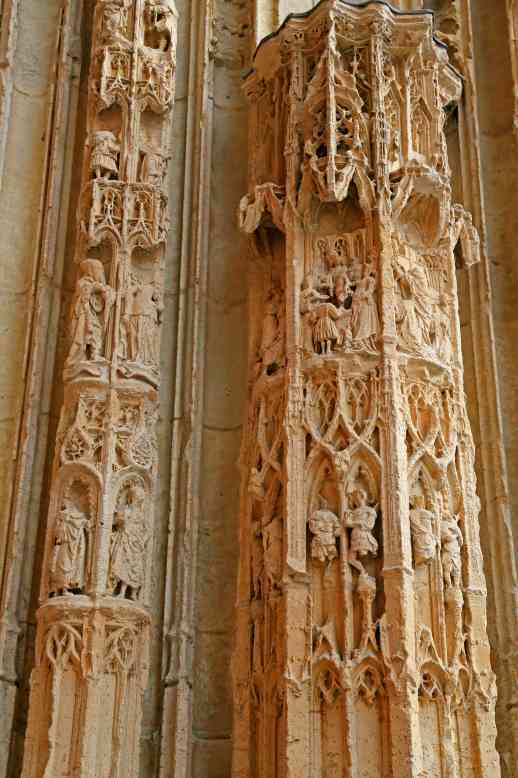 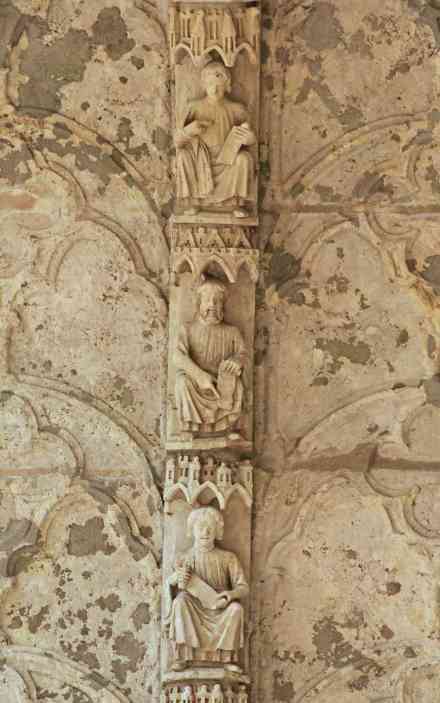 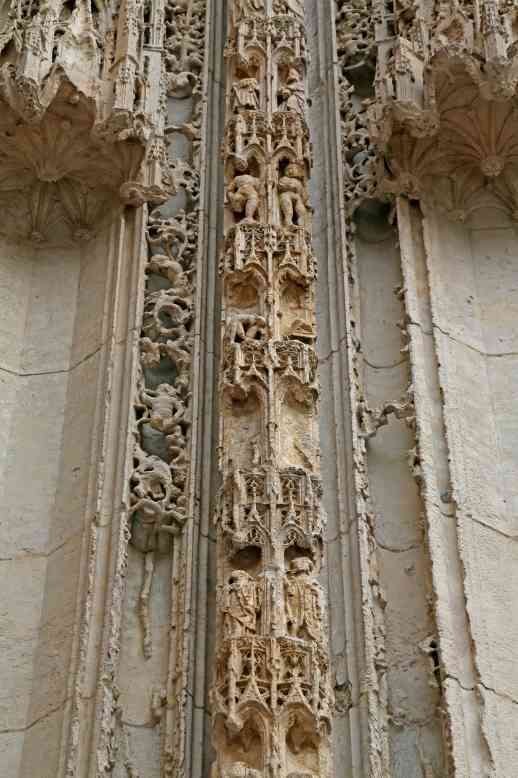 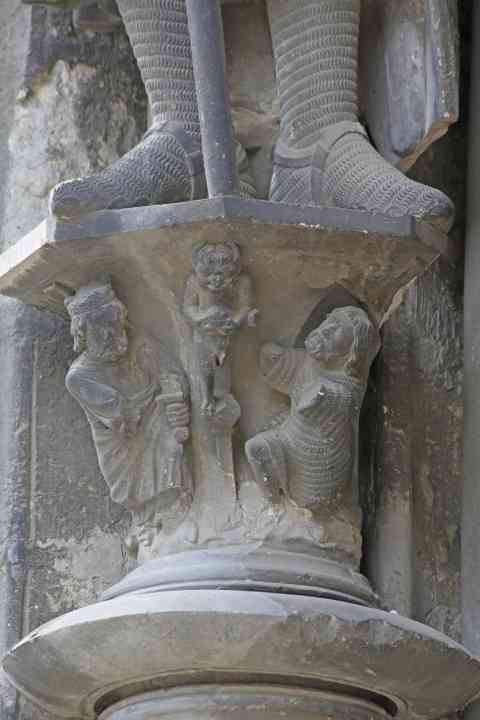 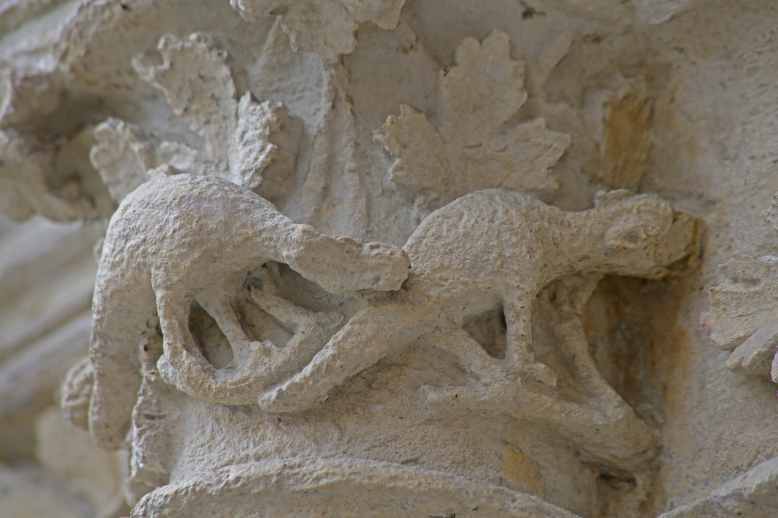 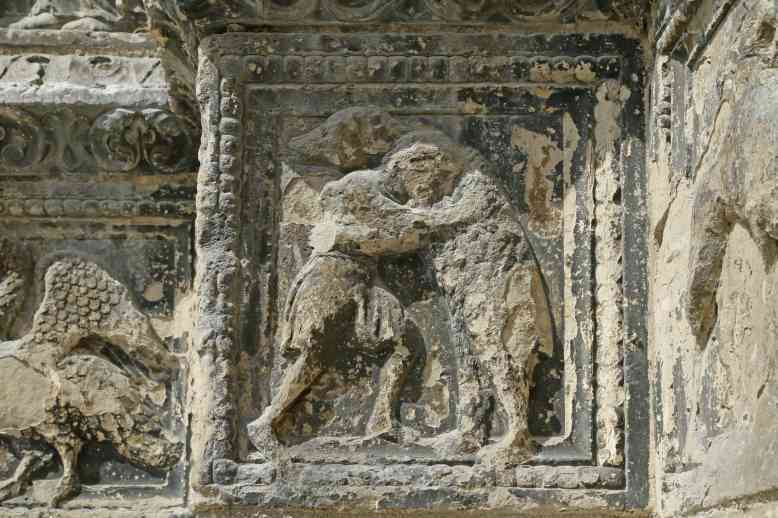 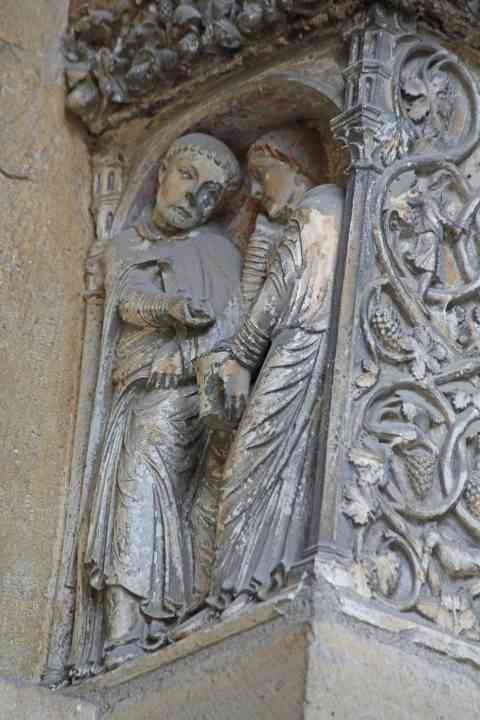 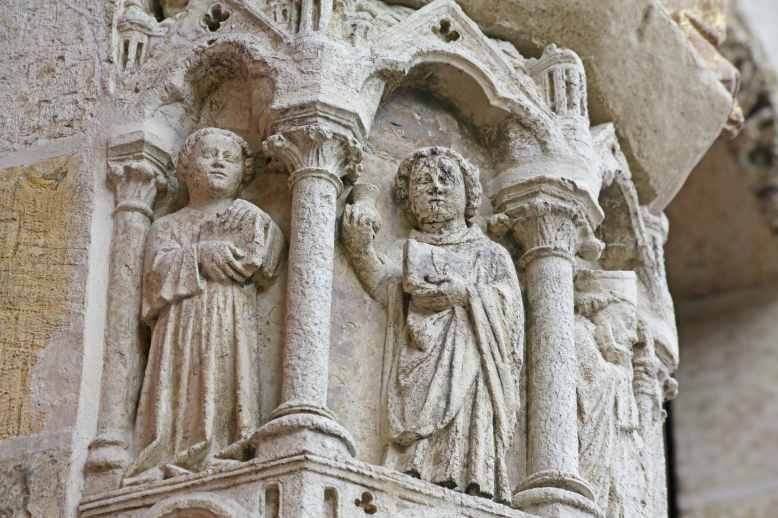 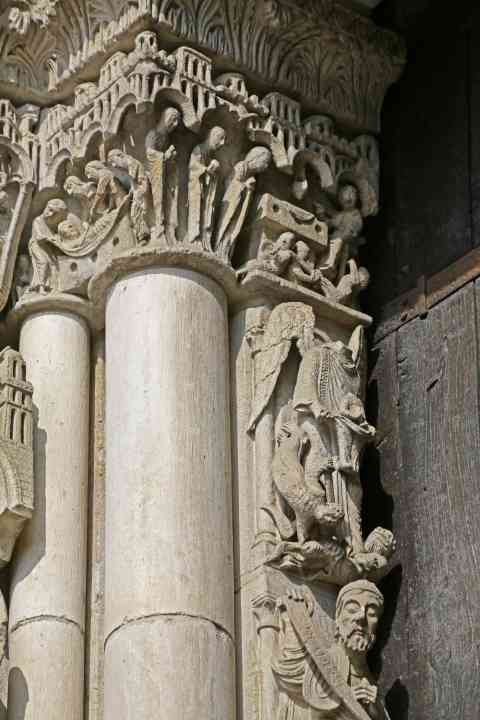 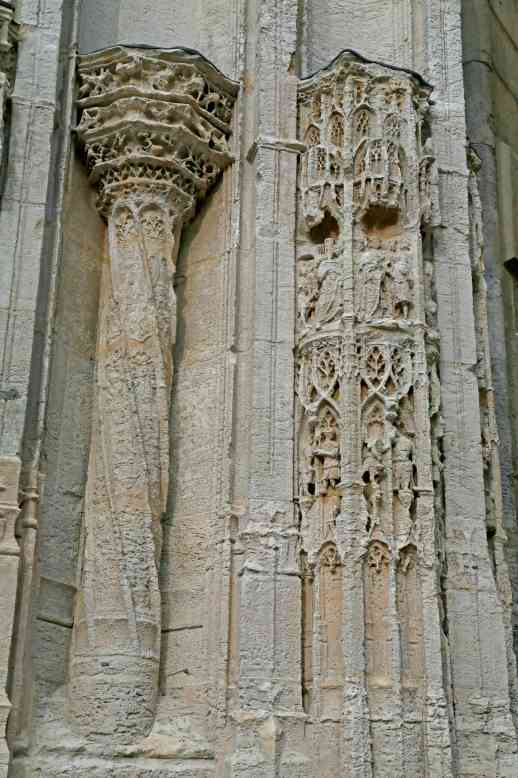 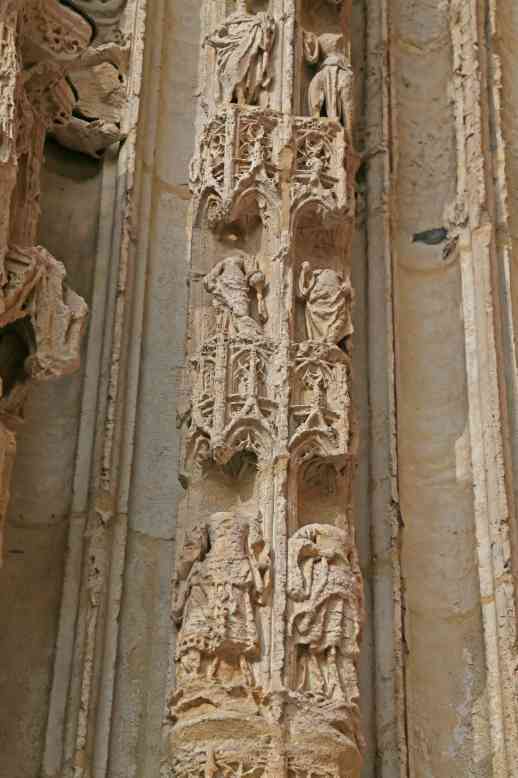 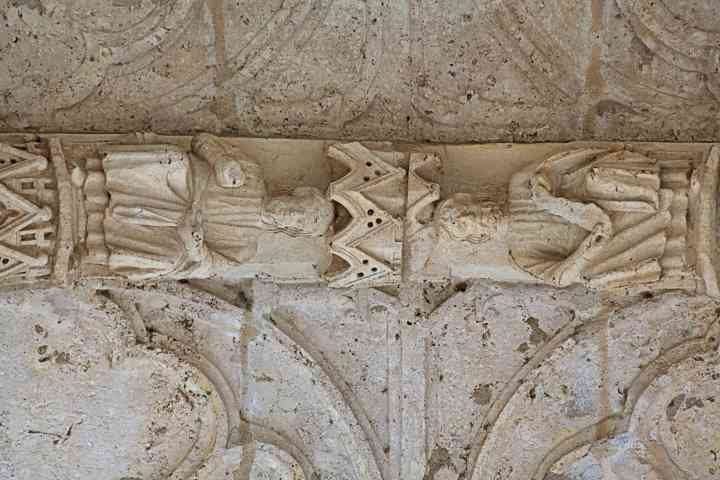 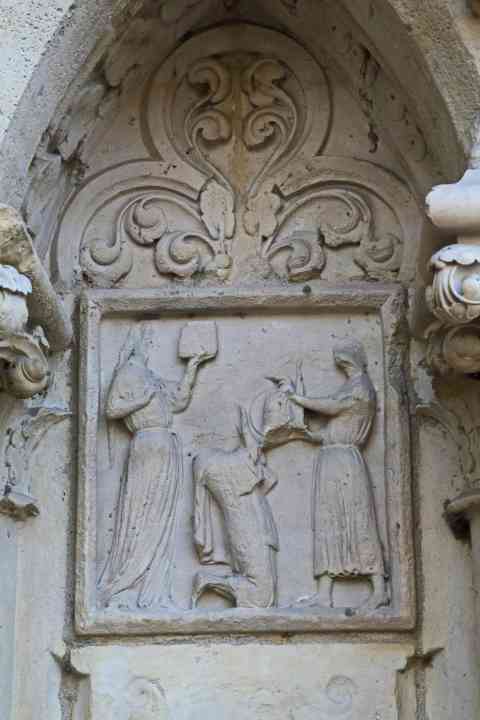 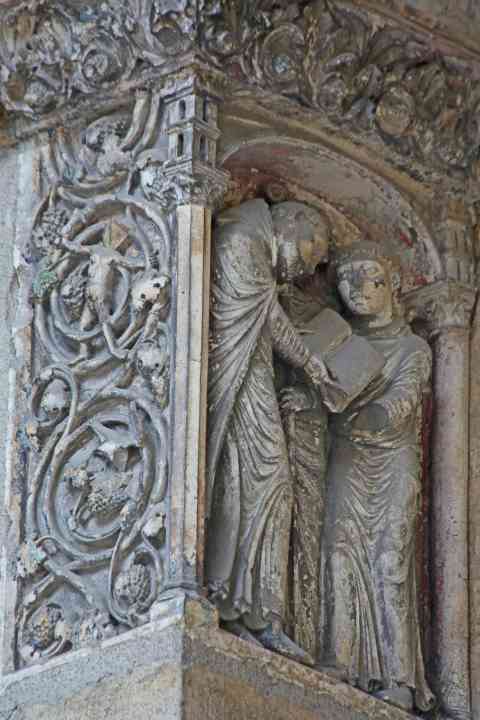 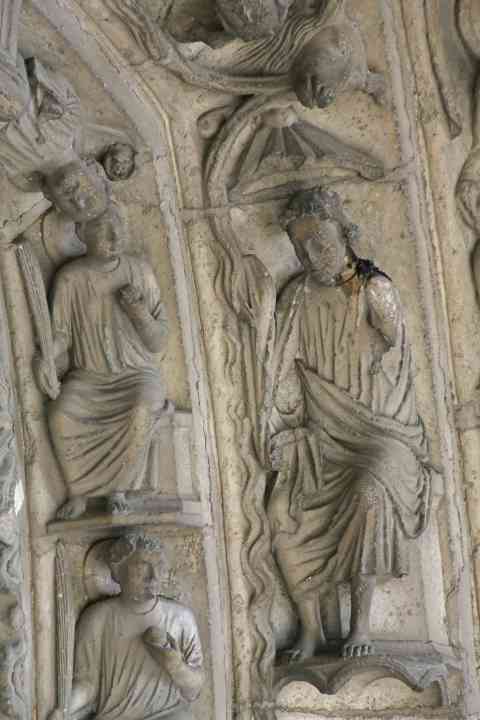 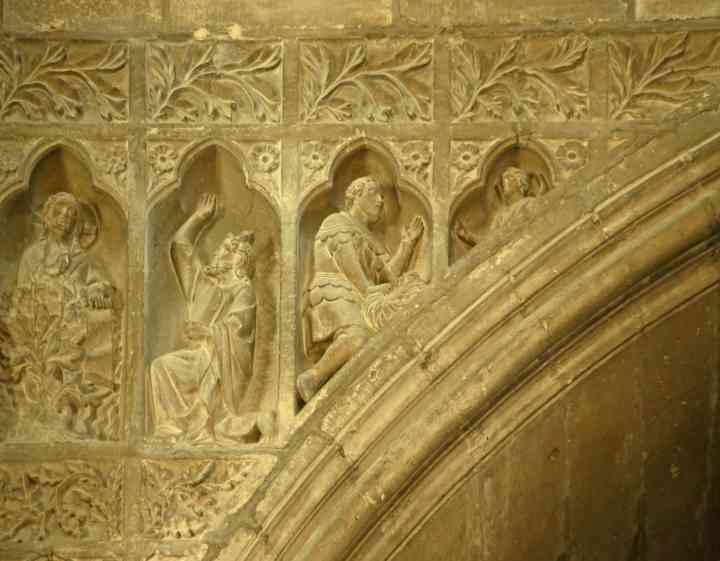 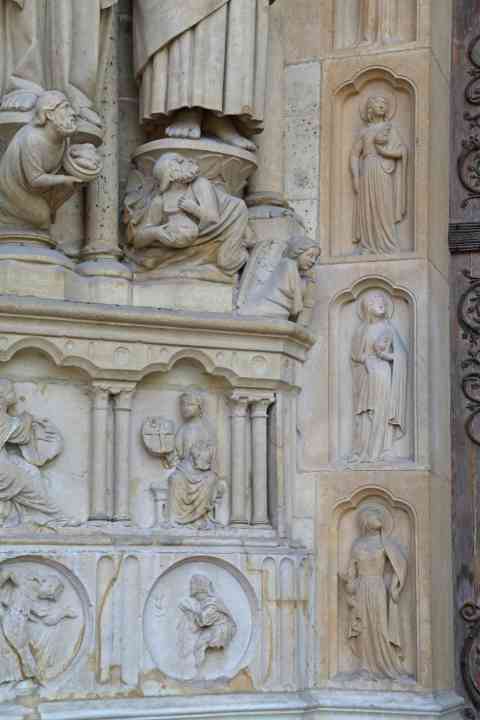 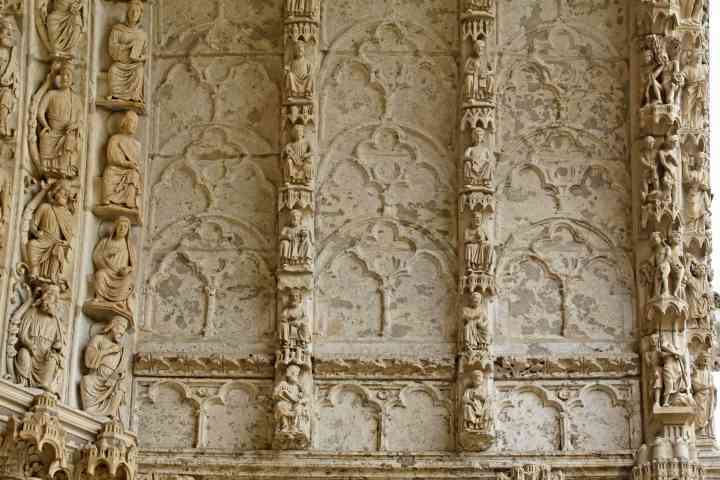 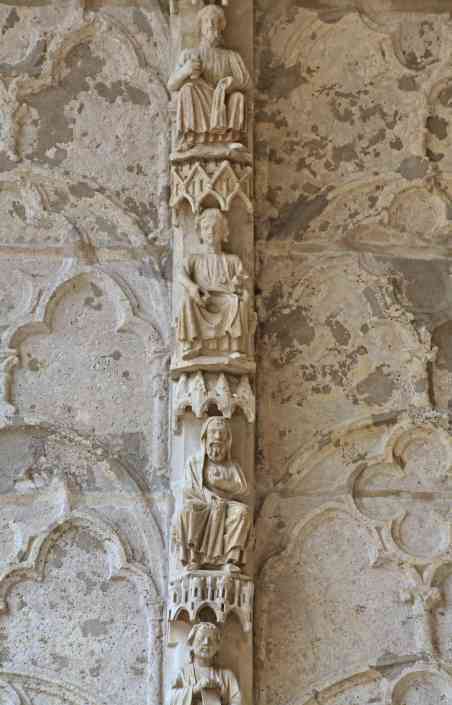 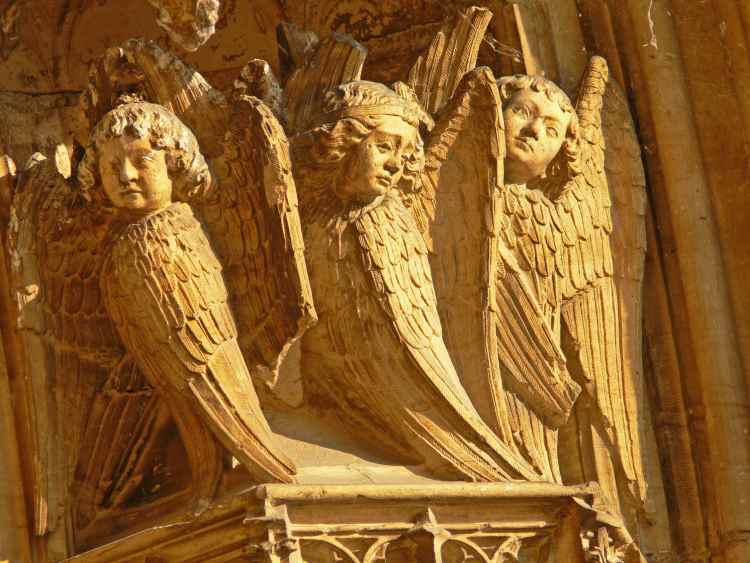 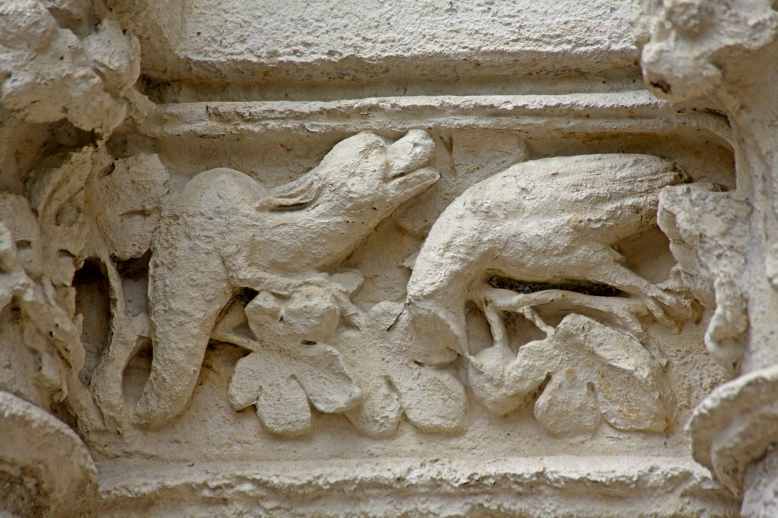 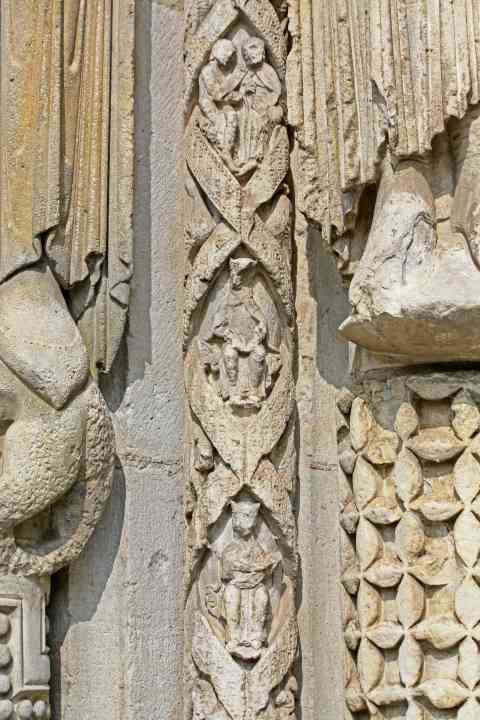 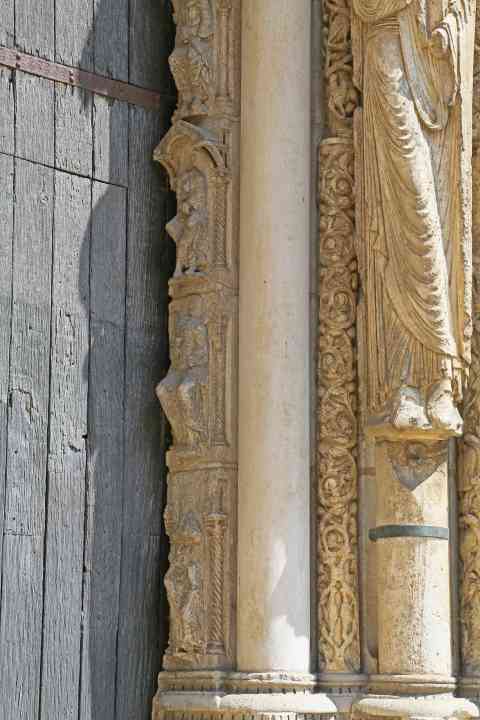 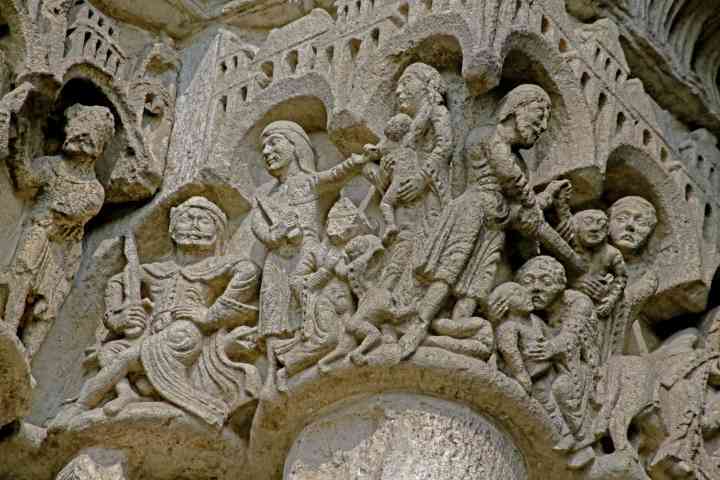 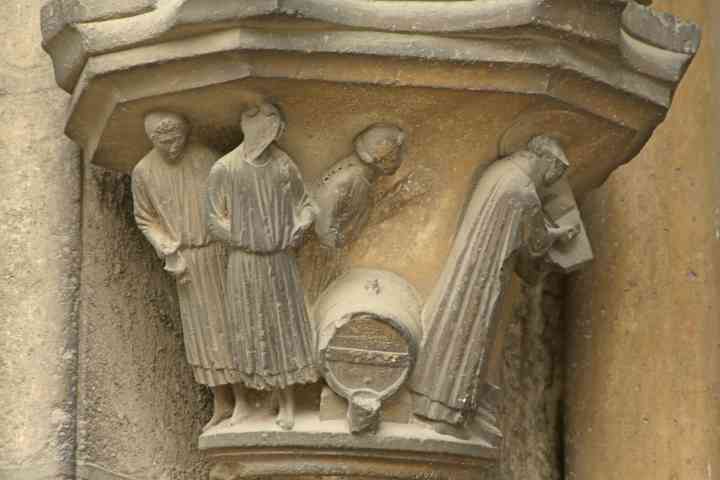 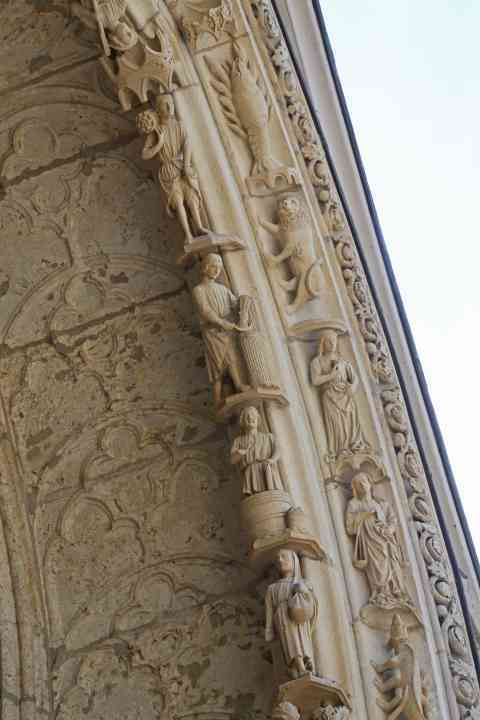 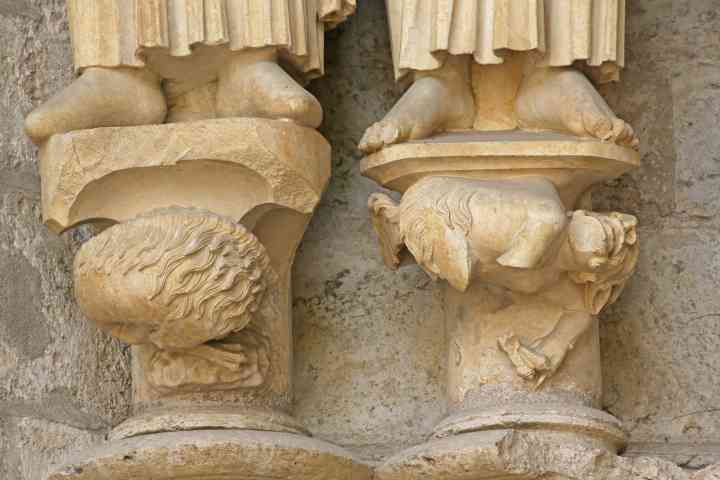 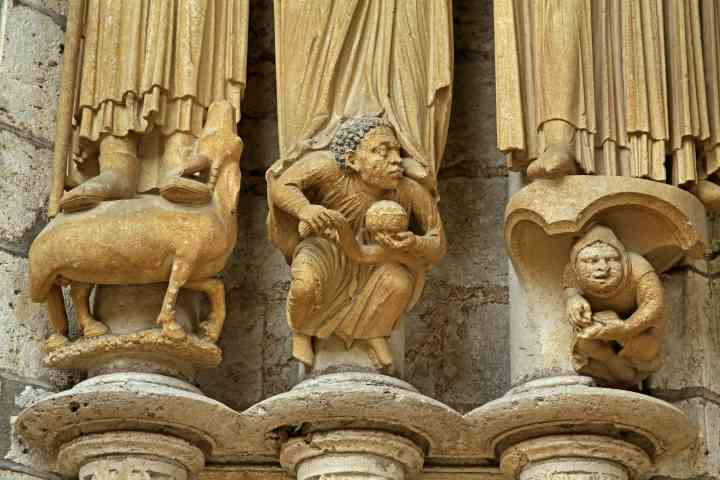 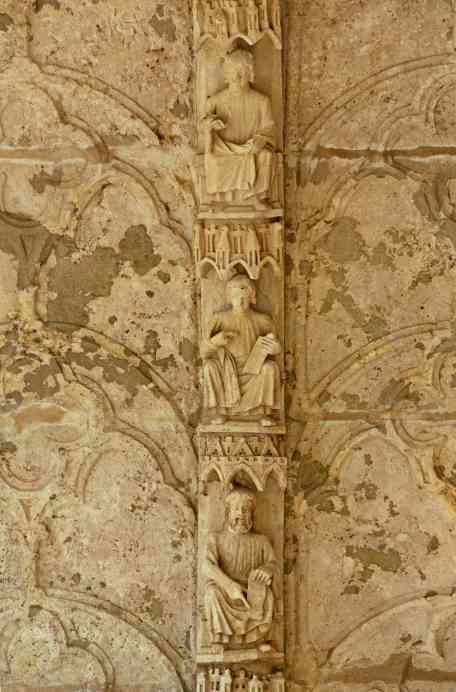 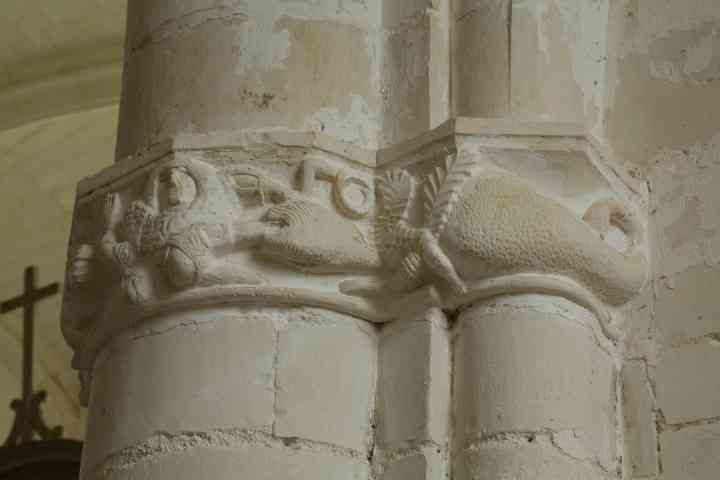 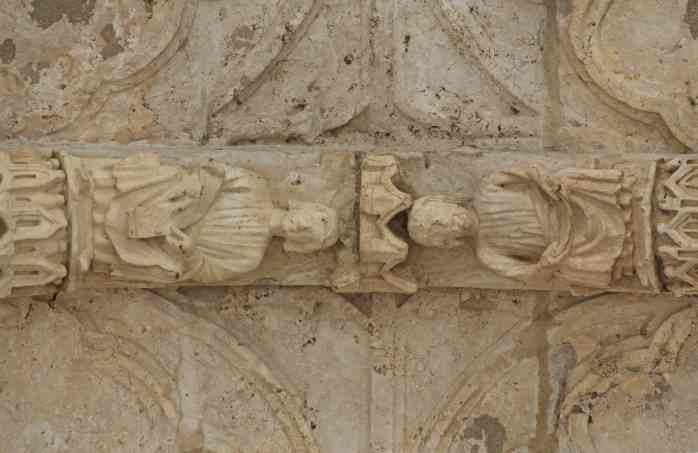 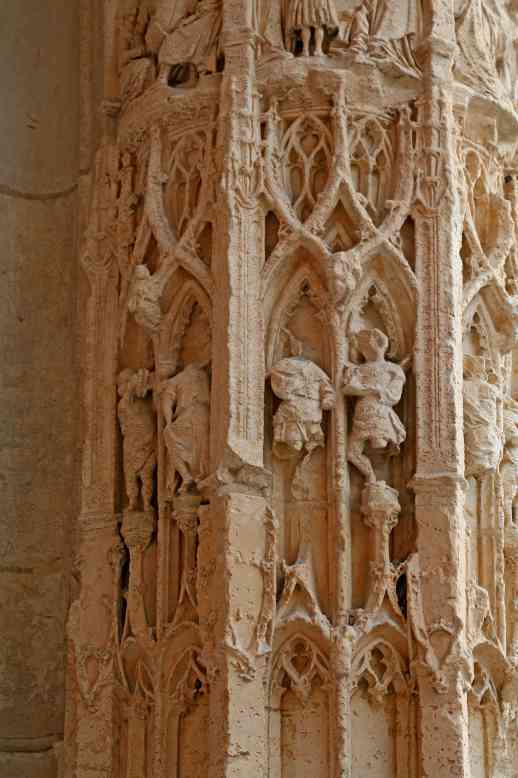 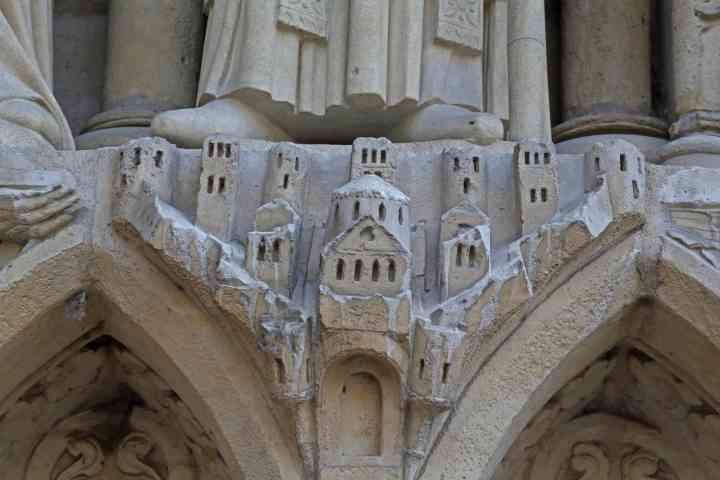 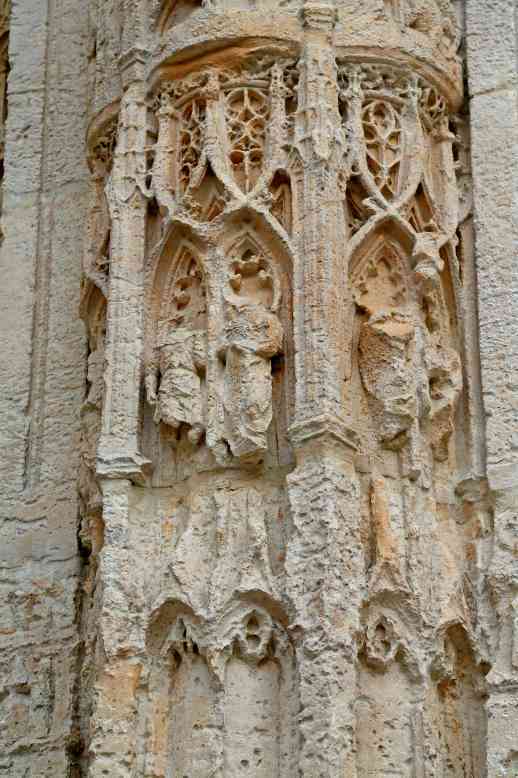 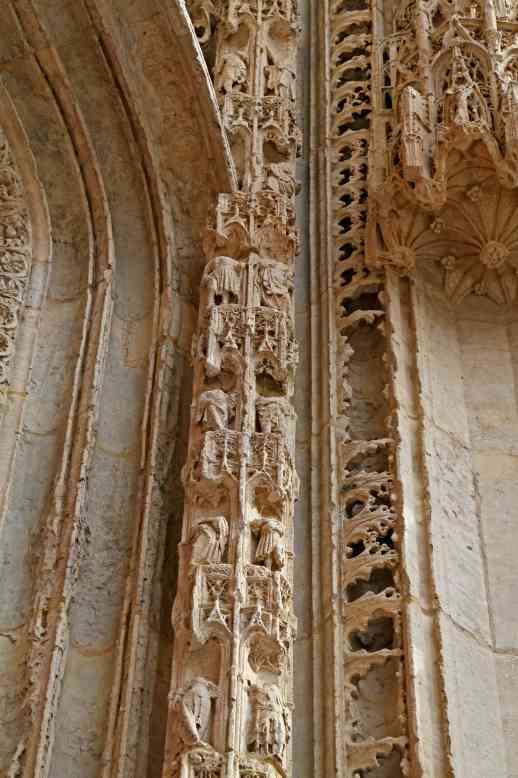 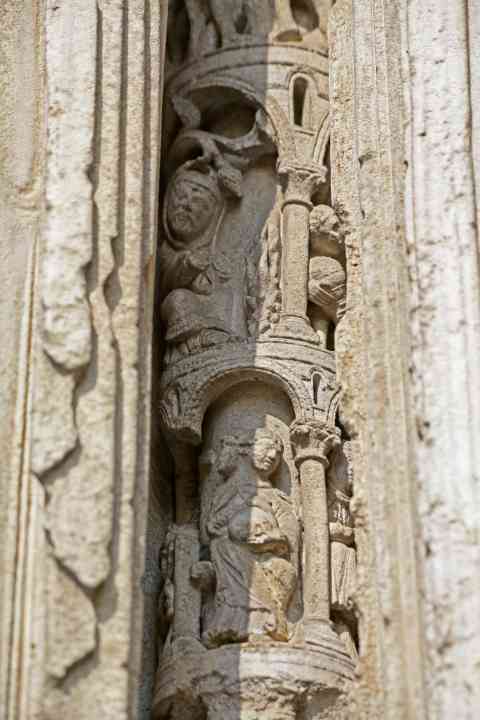 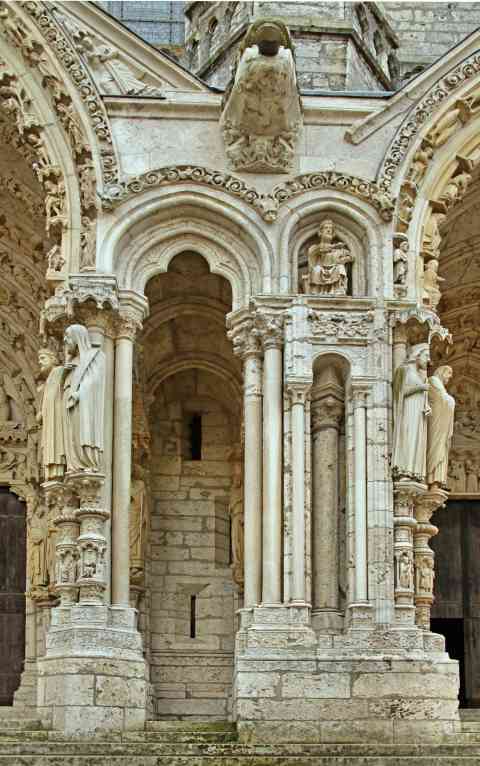 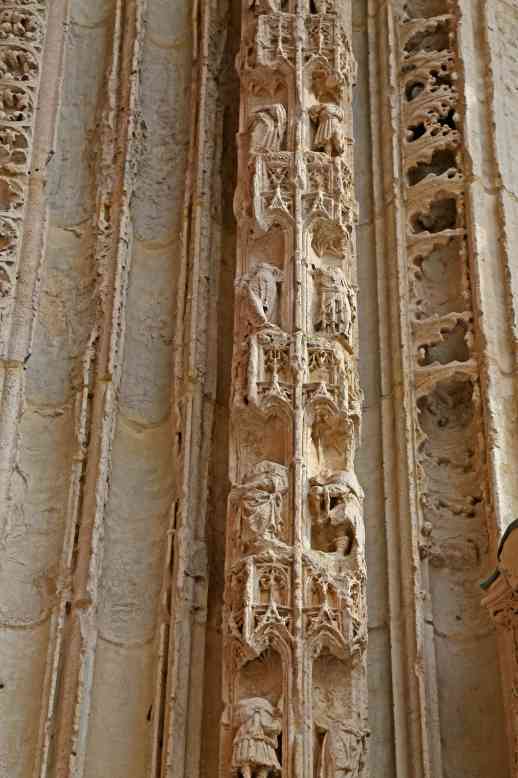 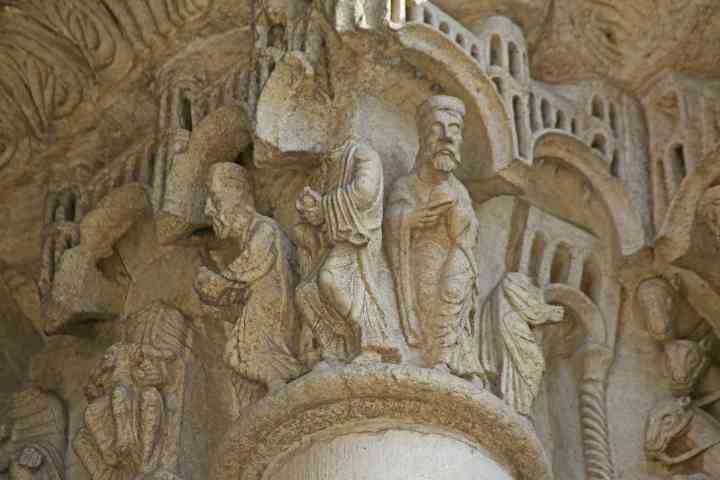 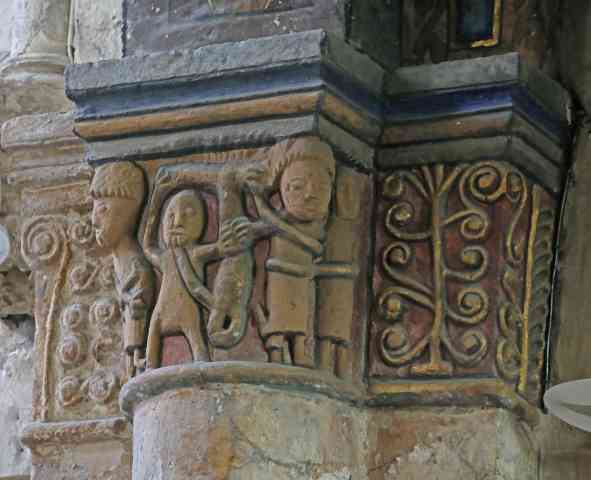 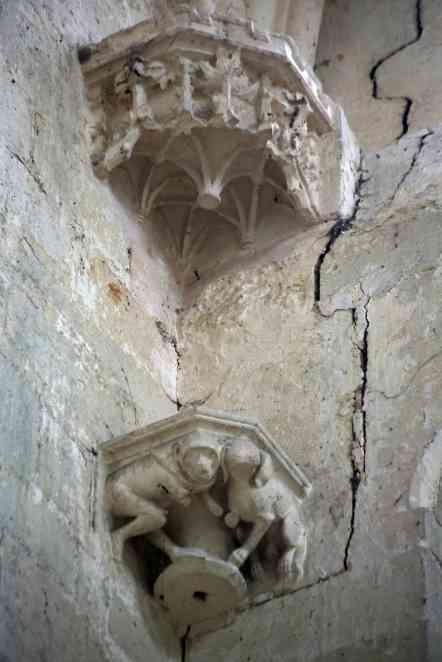 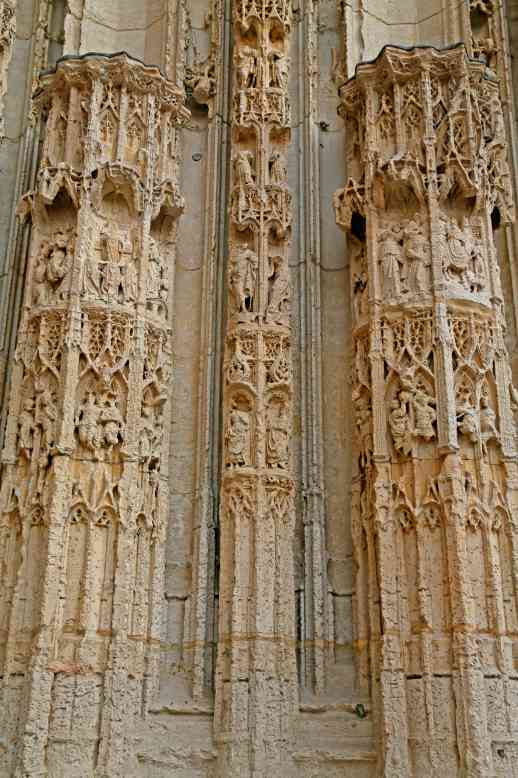 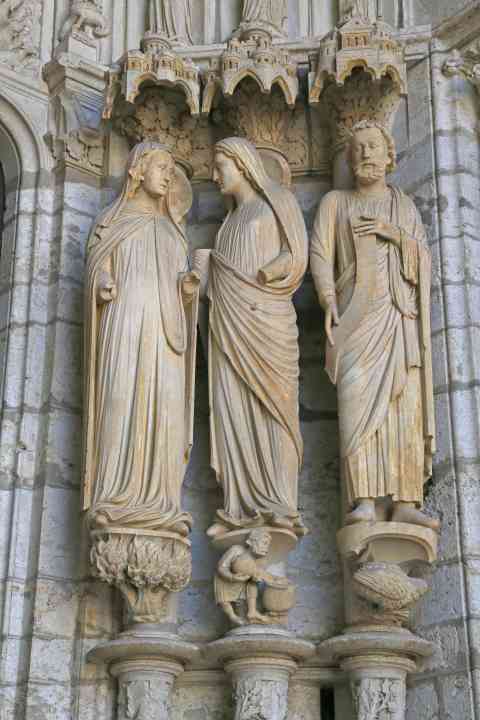 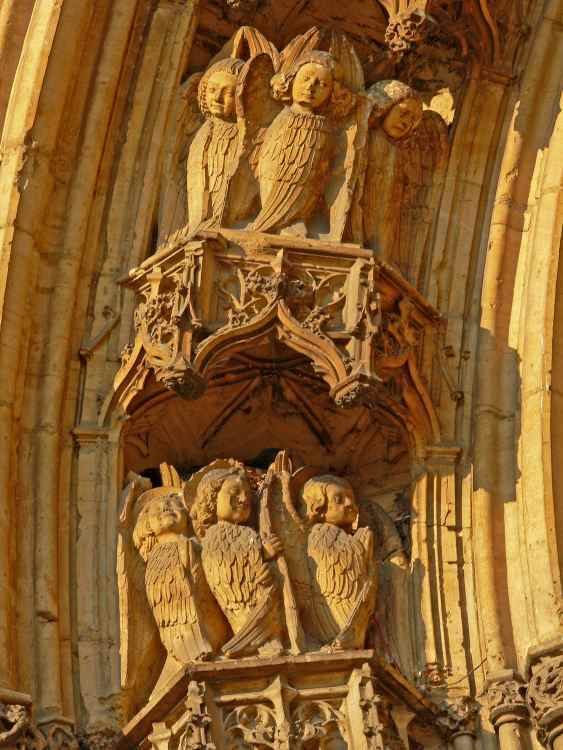 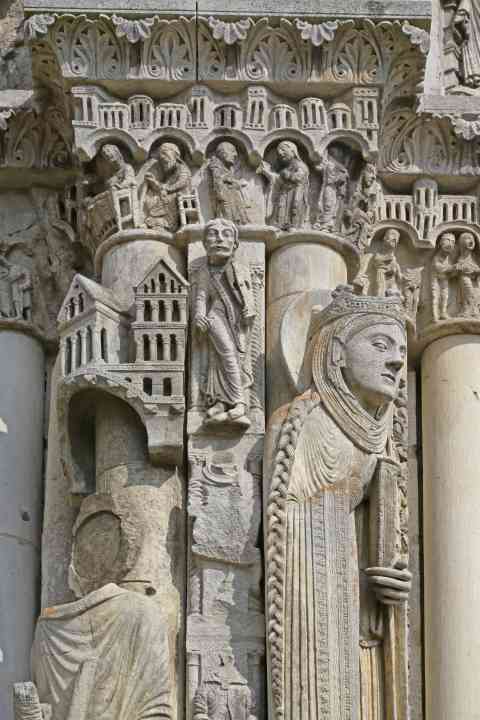 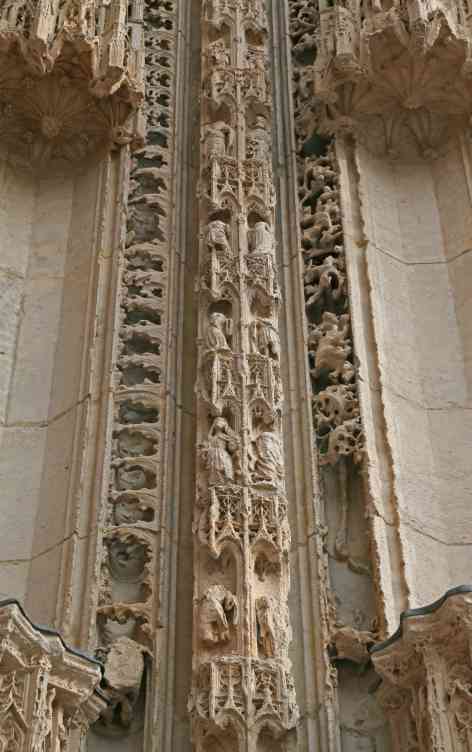 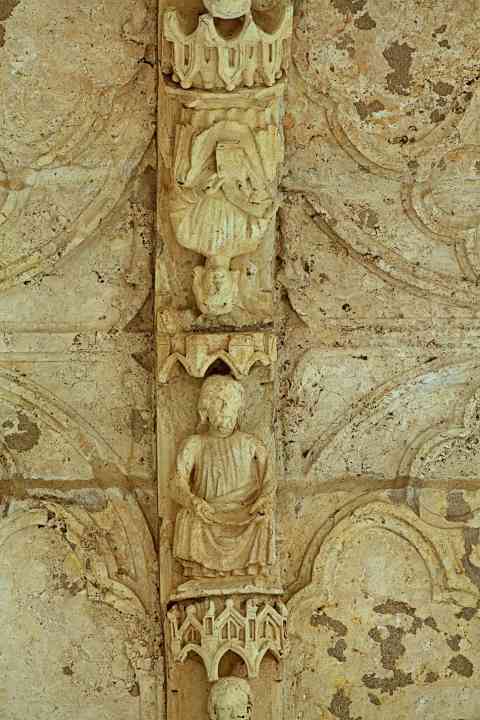 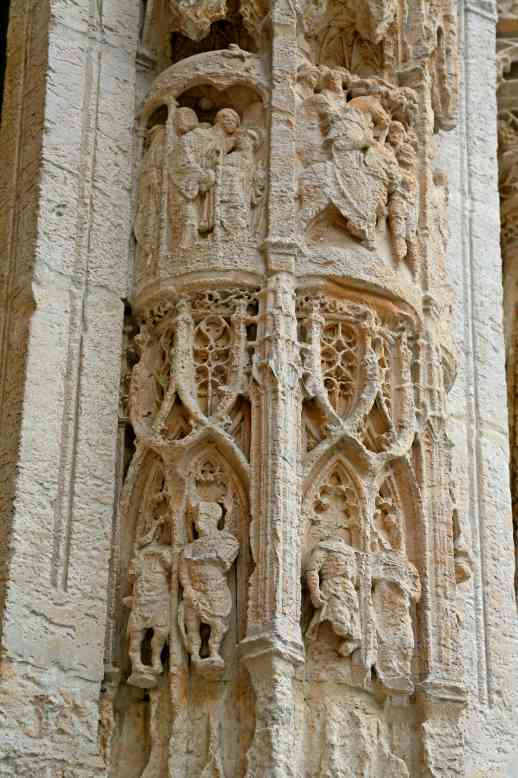 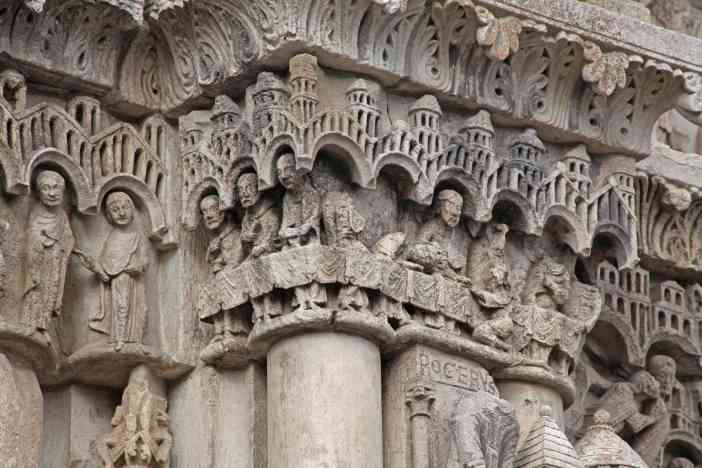 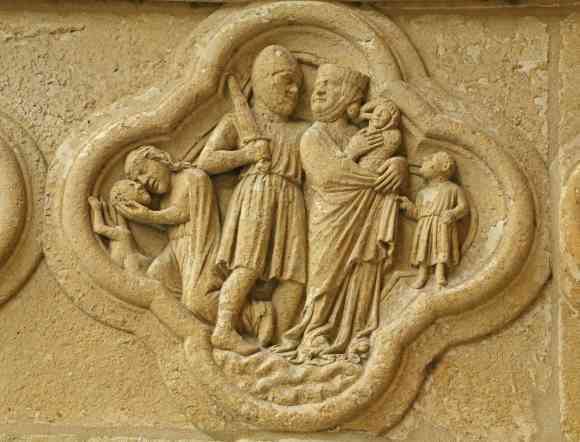 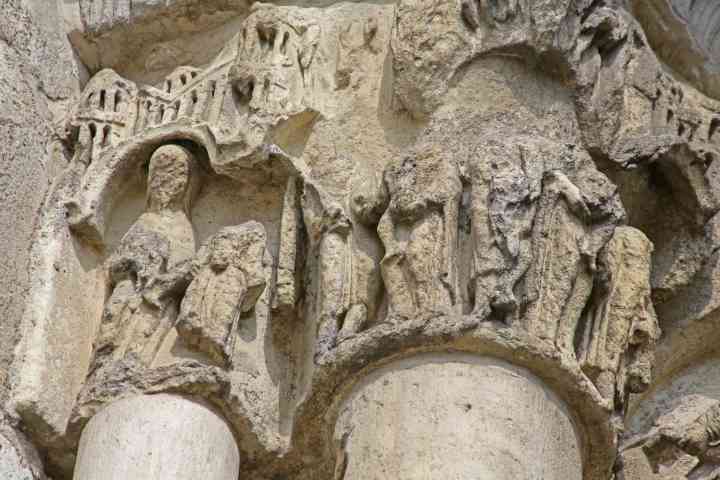 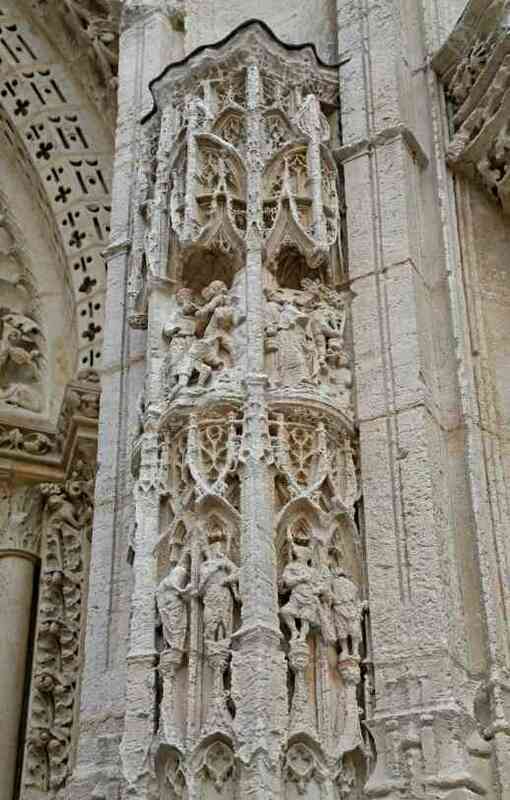 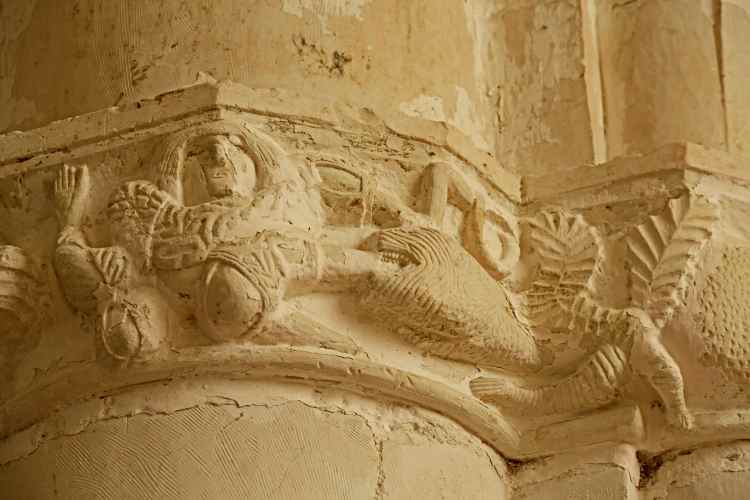 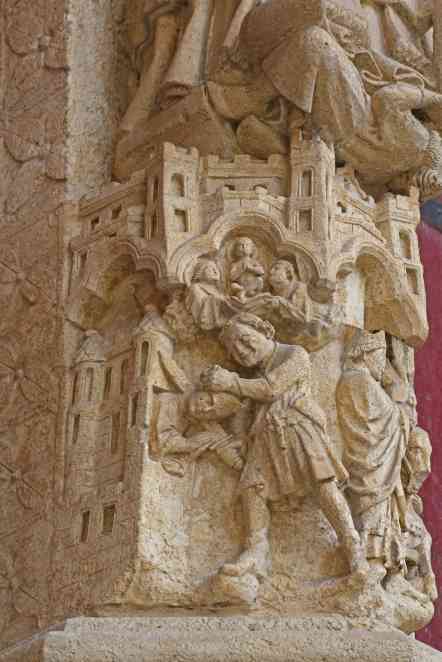 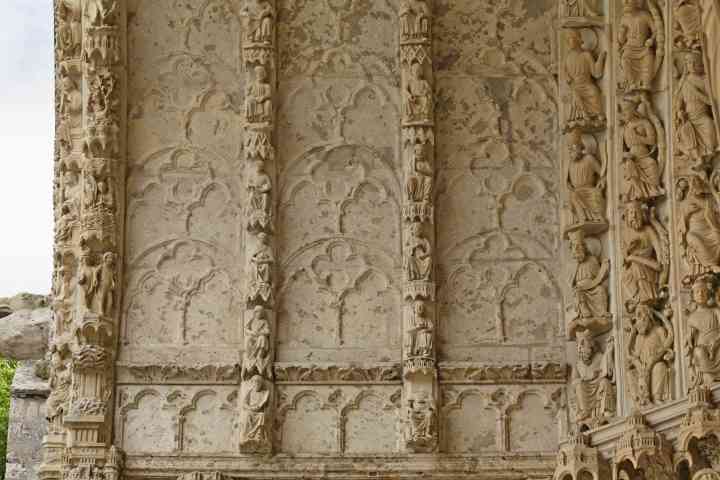 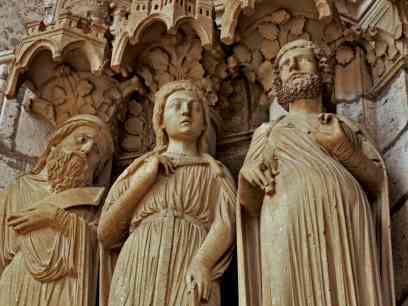 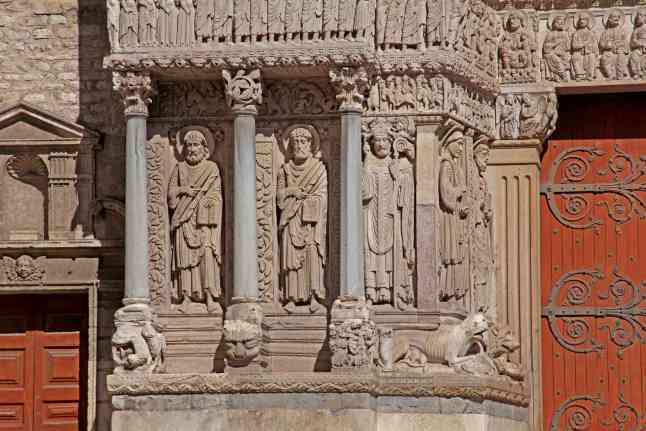 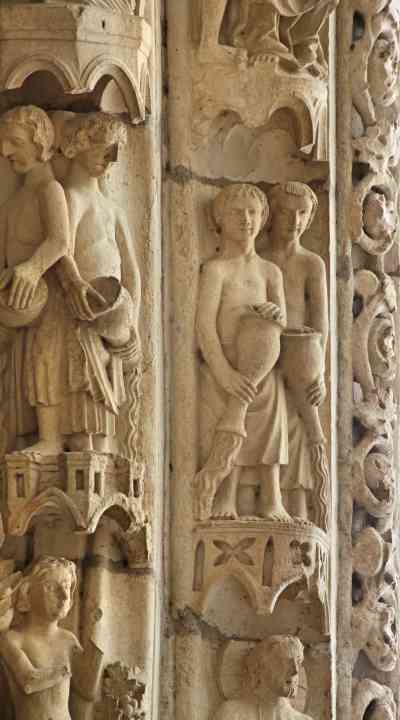 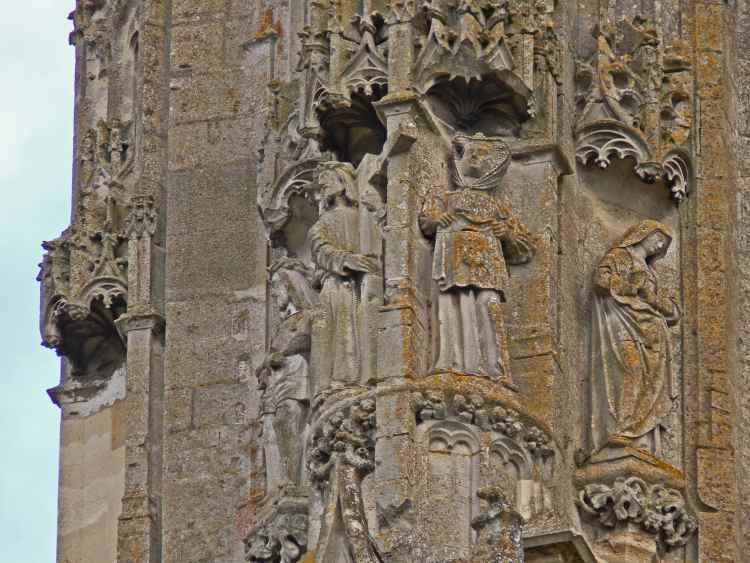 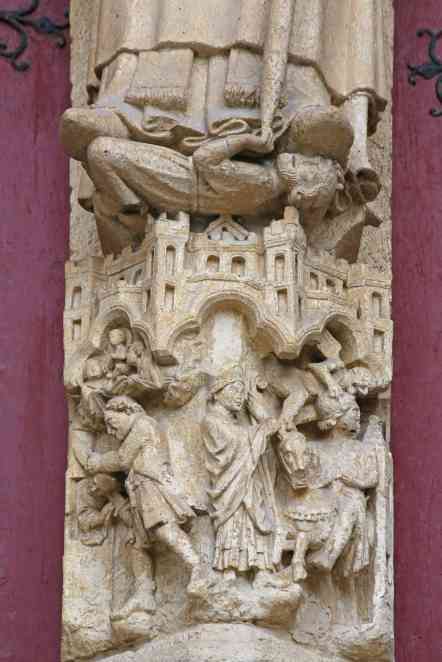 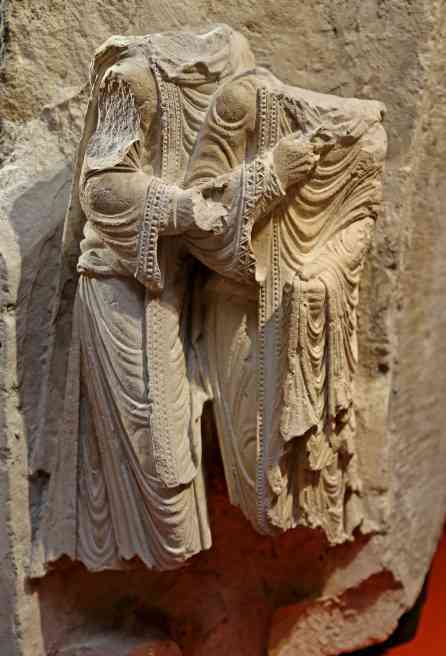 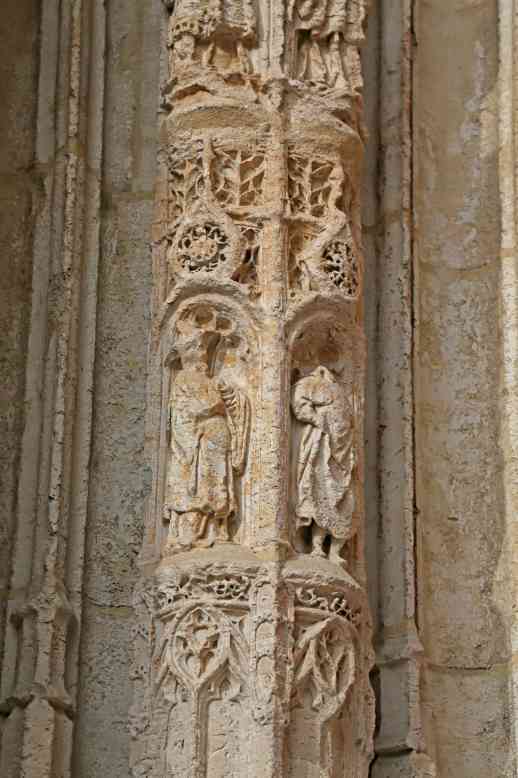 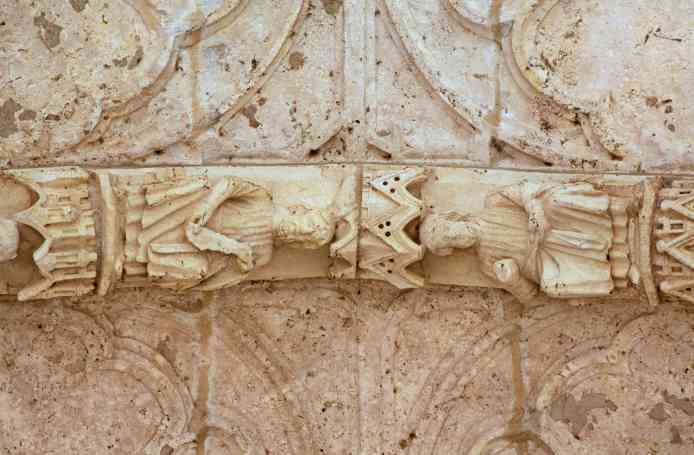 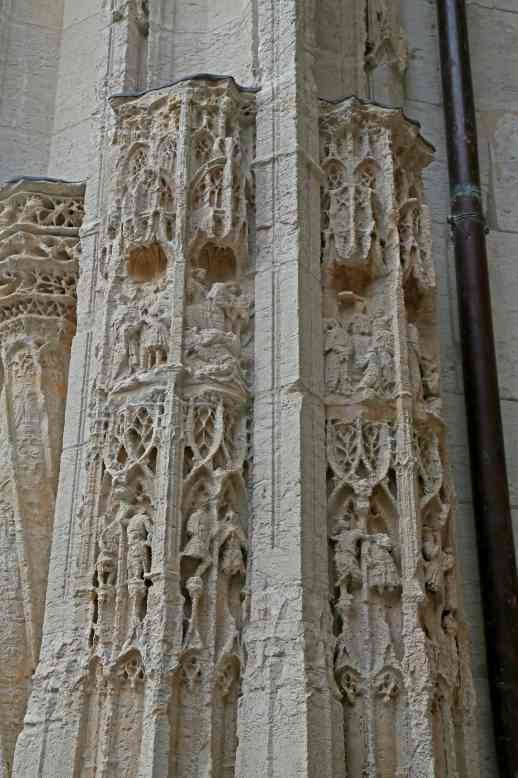 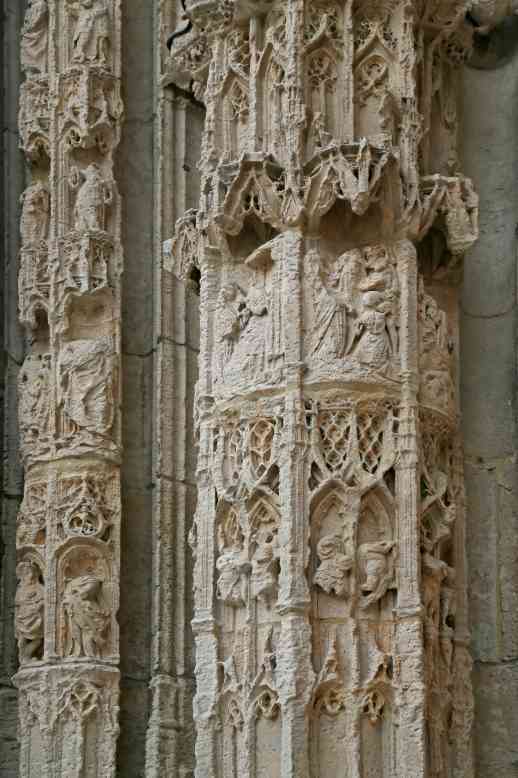 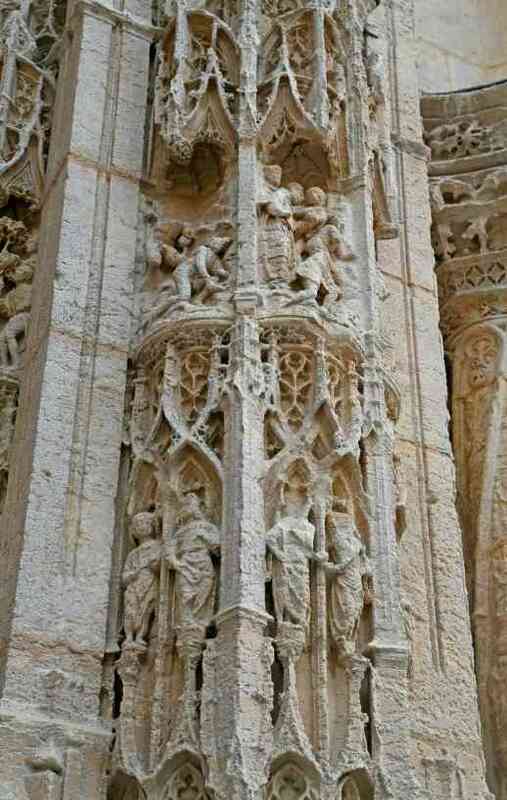 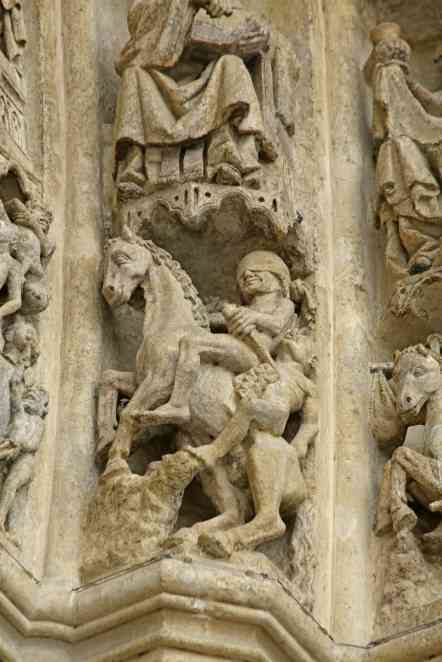 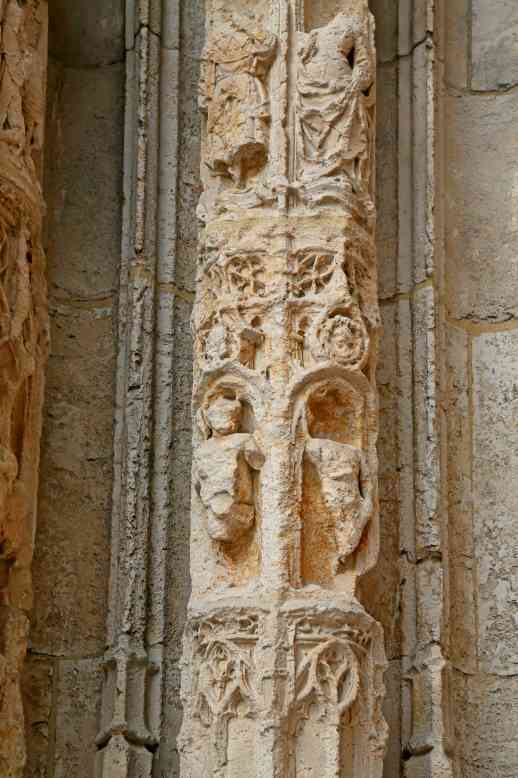 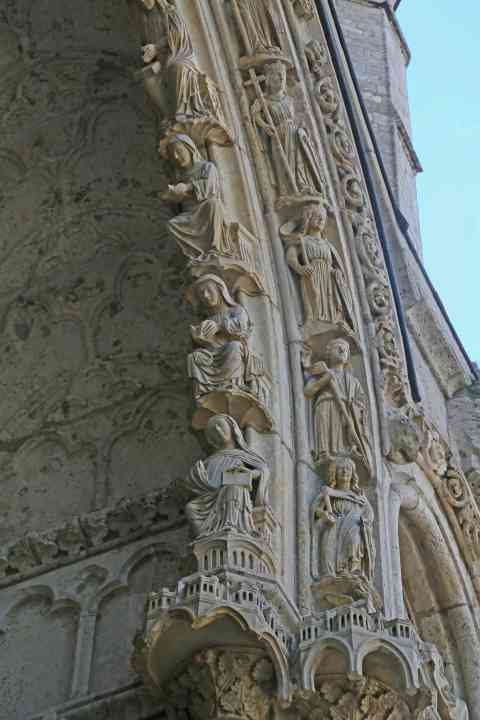 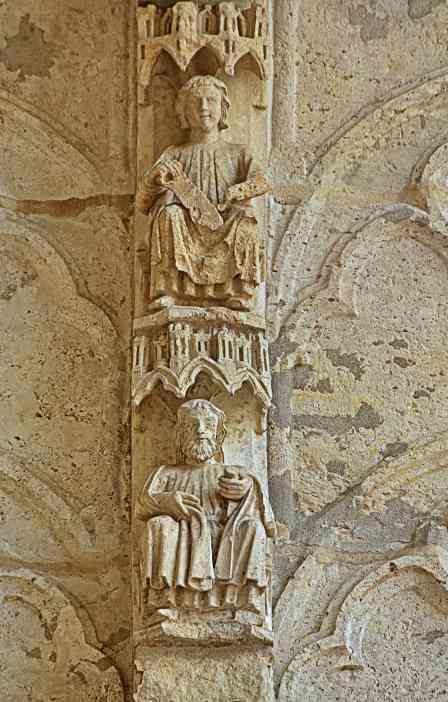 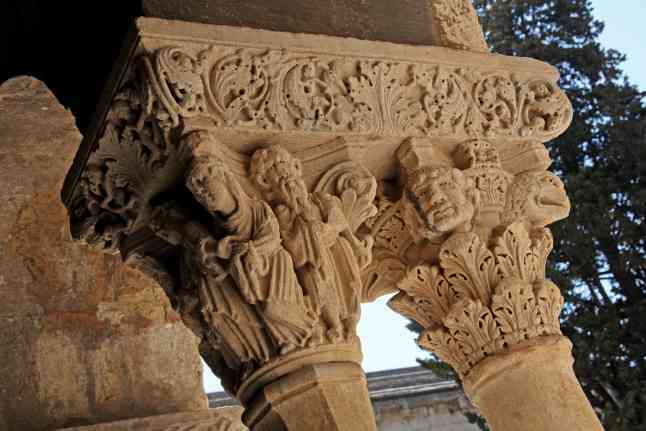 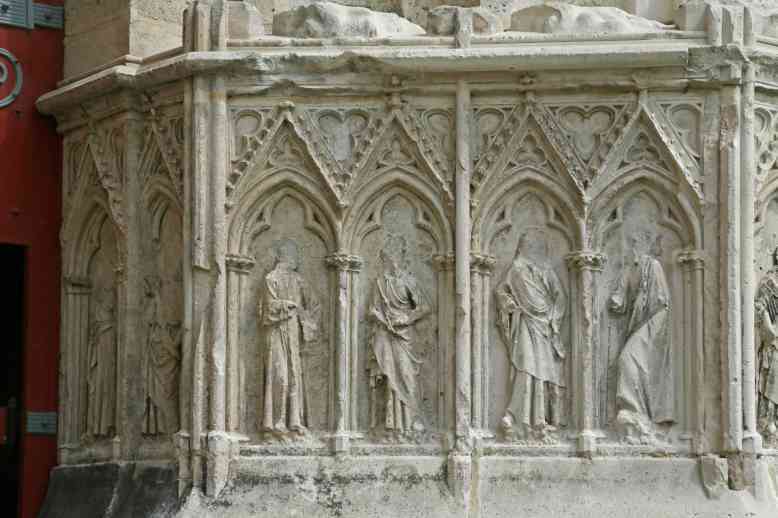 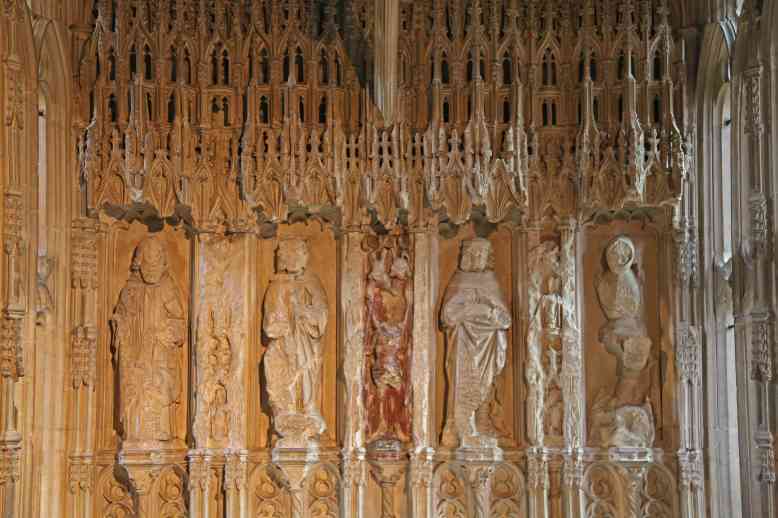 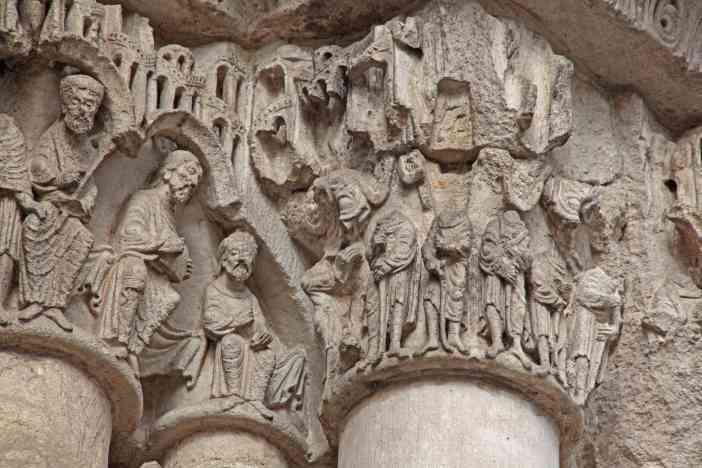 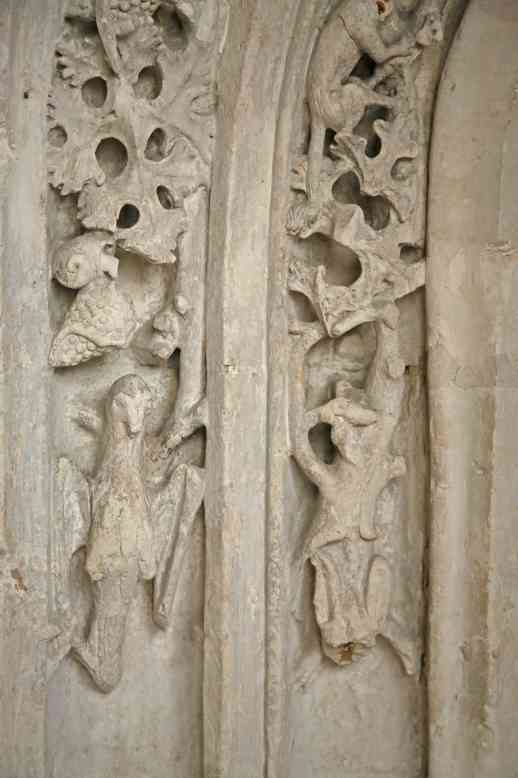 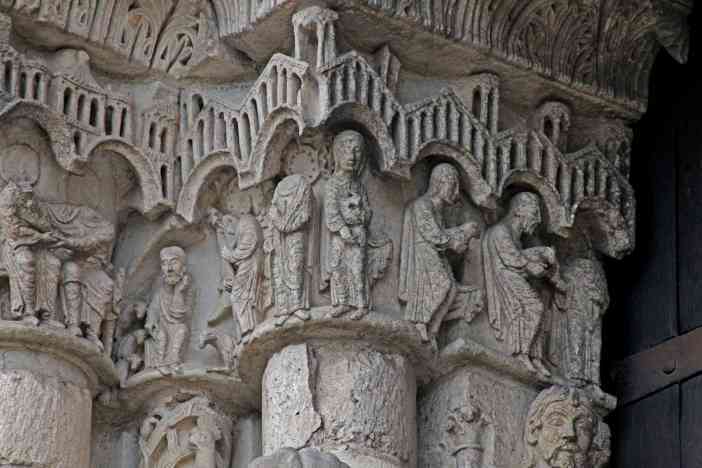 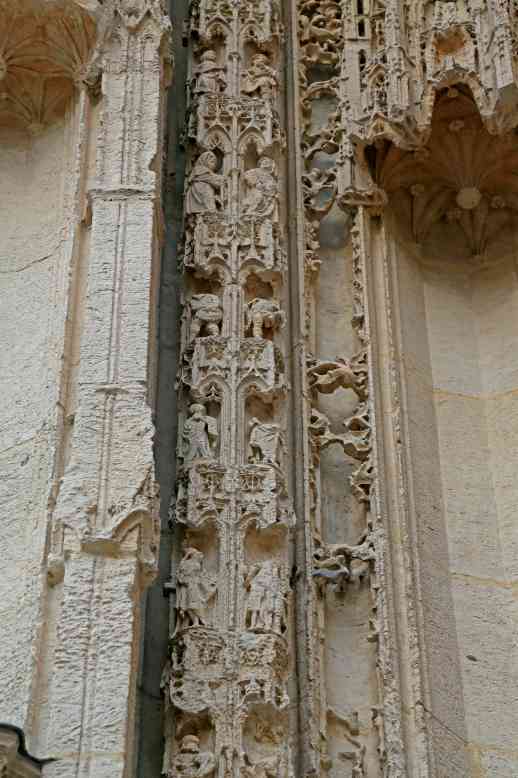 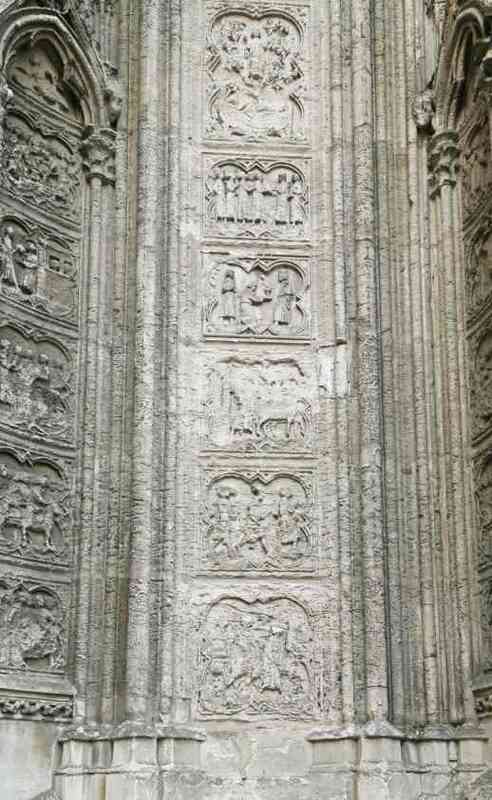 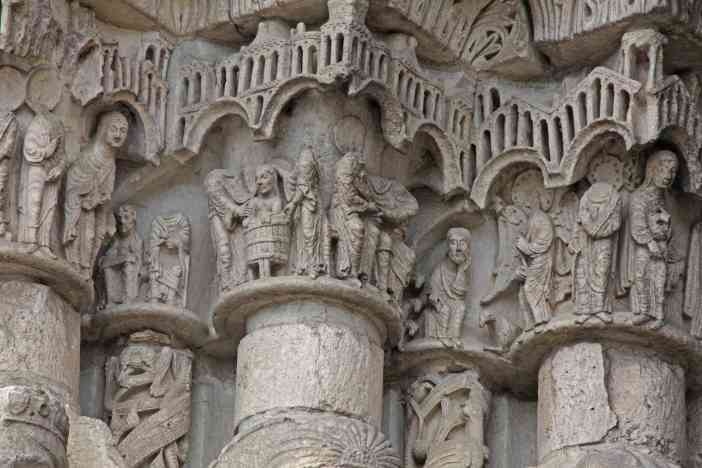 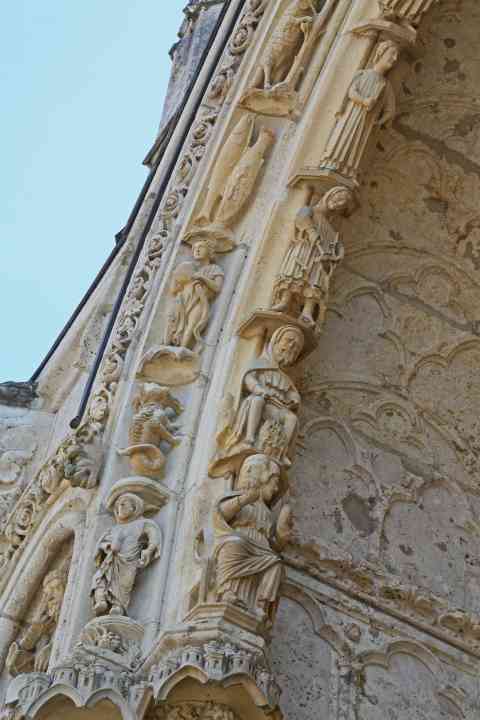 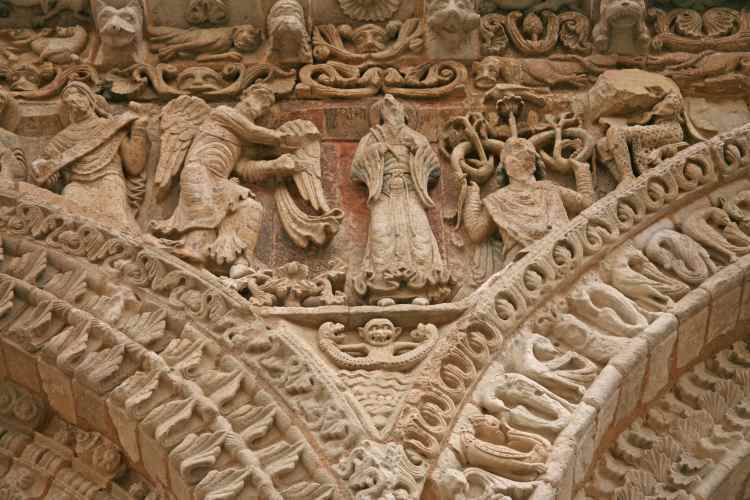 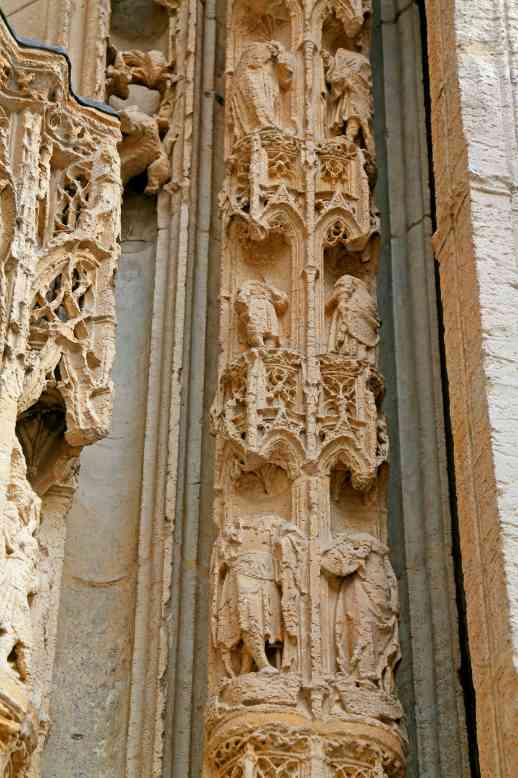 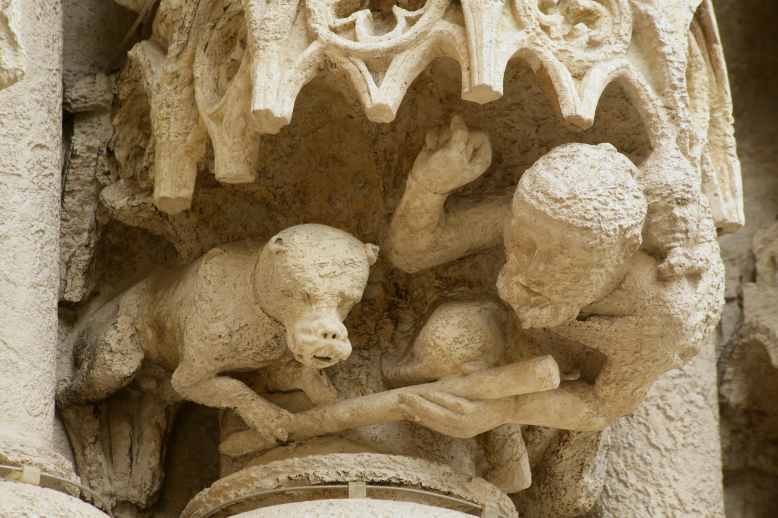 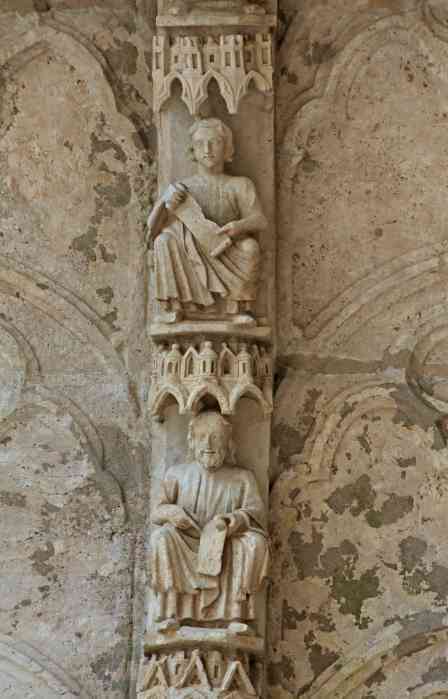 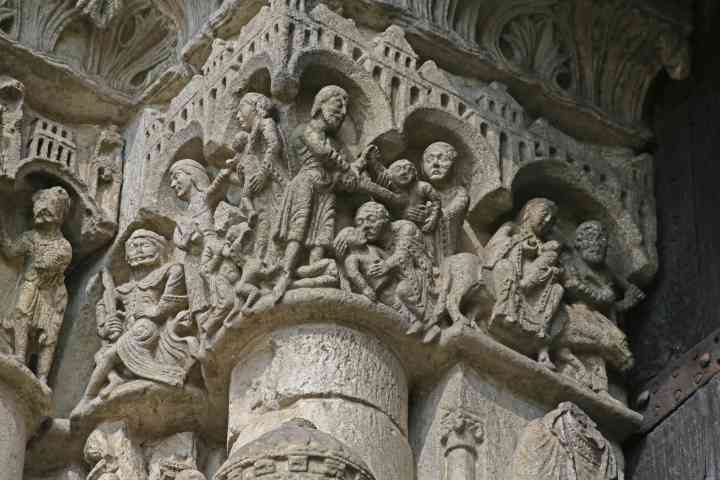 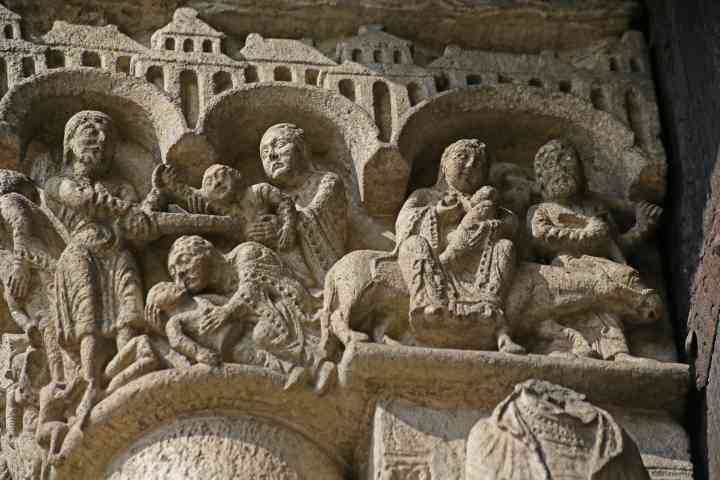 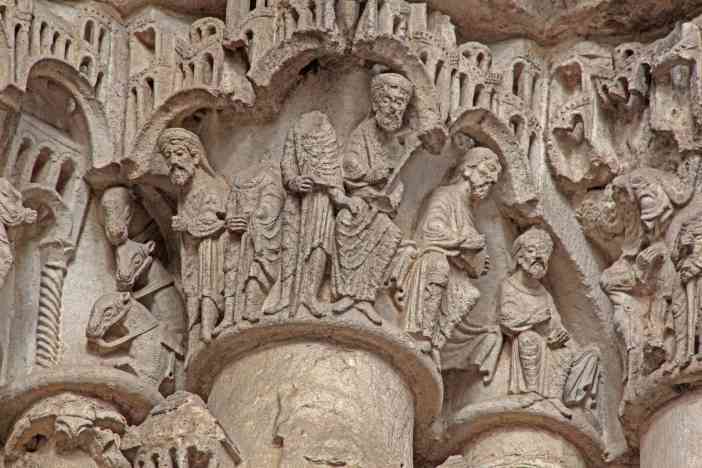 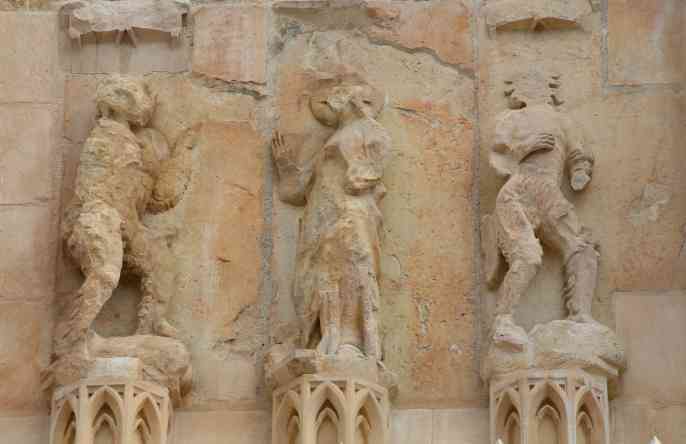 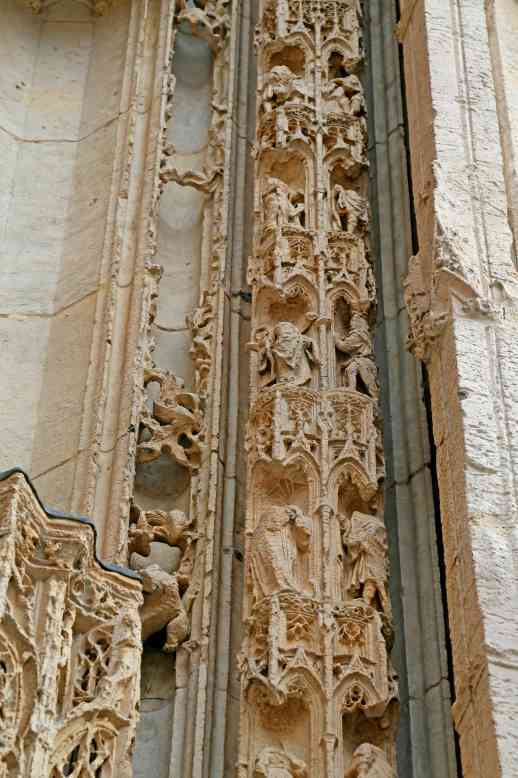 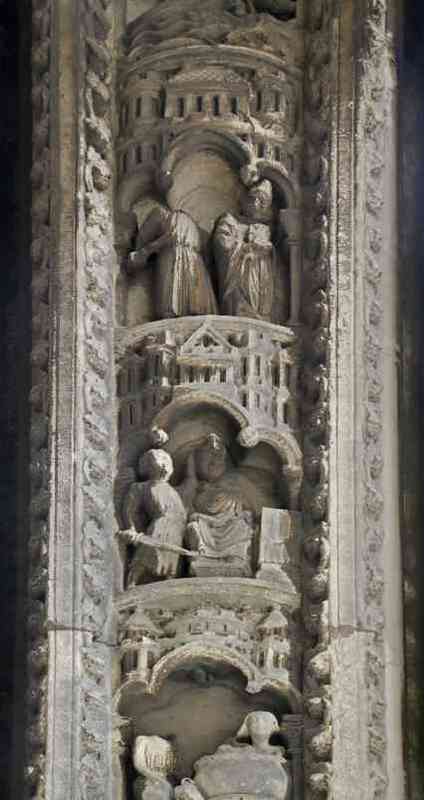 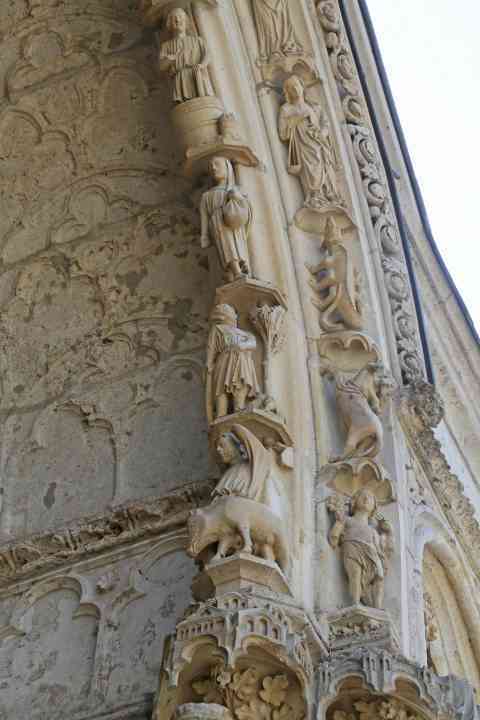 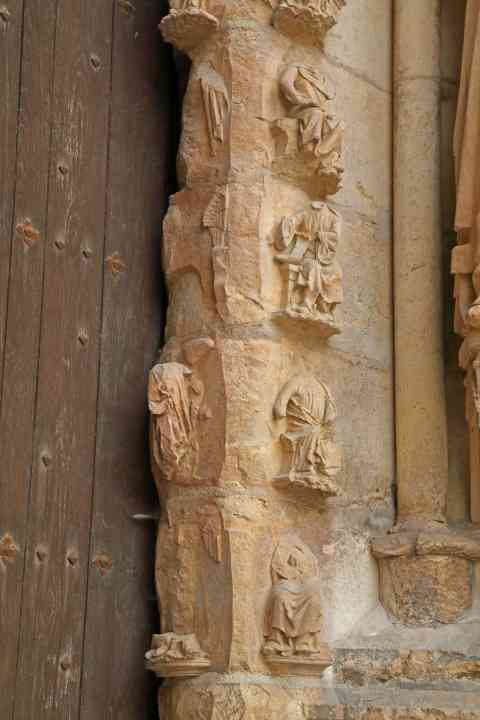 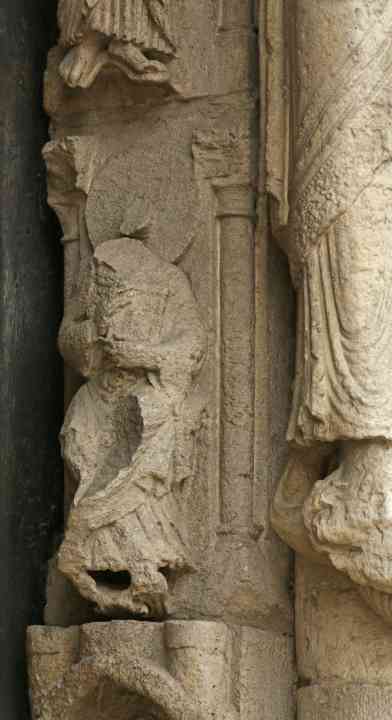 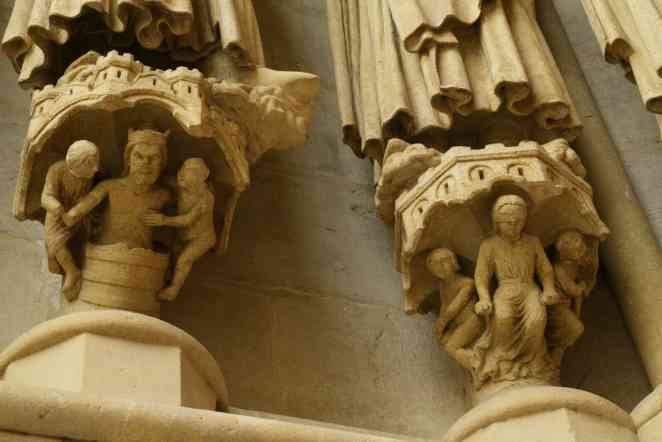 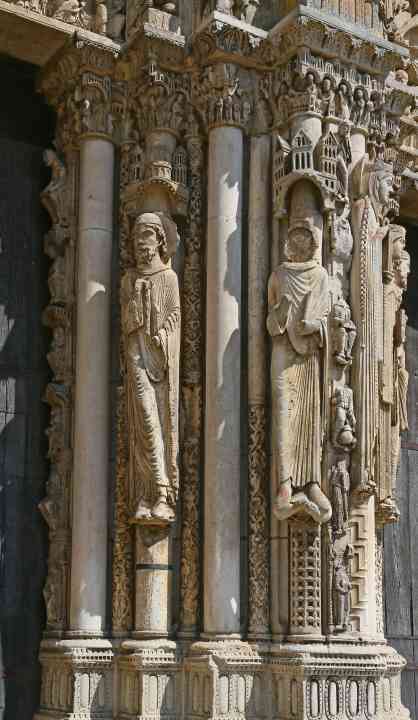 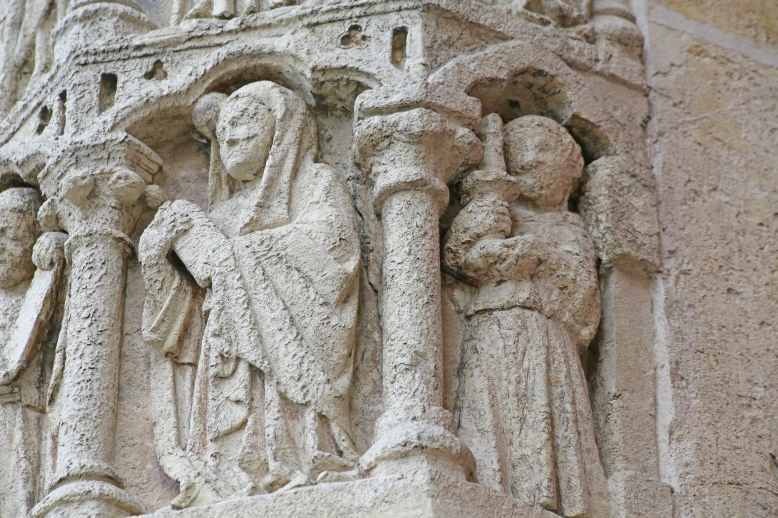 France Chartres Cathedral West door: left door left side capitals above figures: Scene from the Nativity - the Magi? 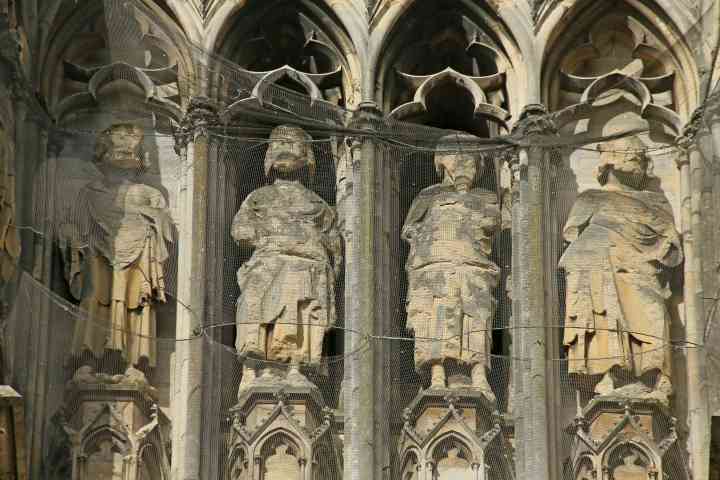 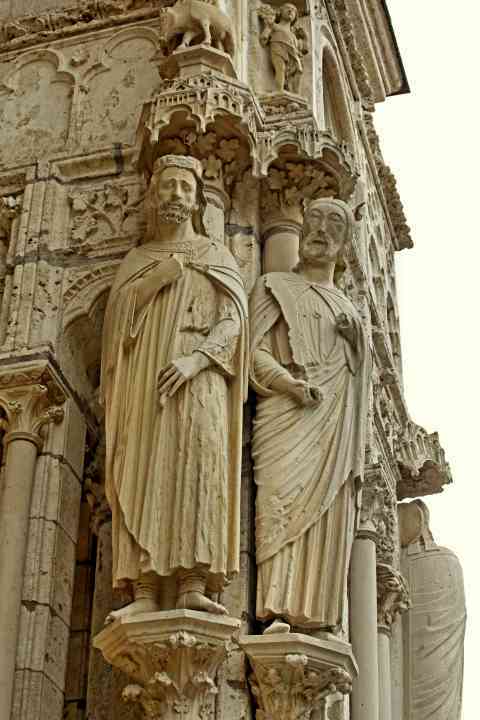 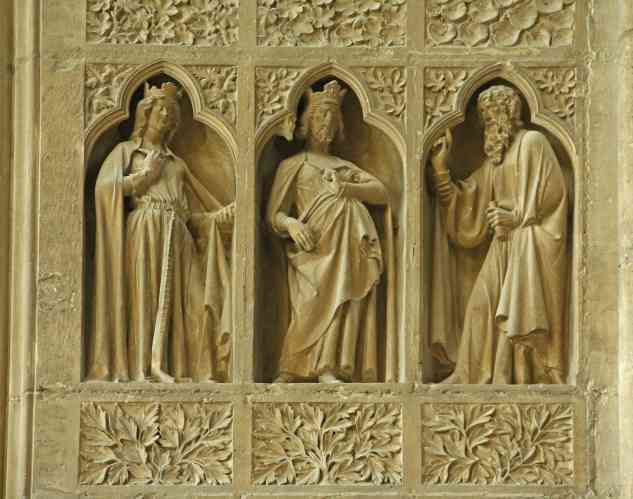 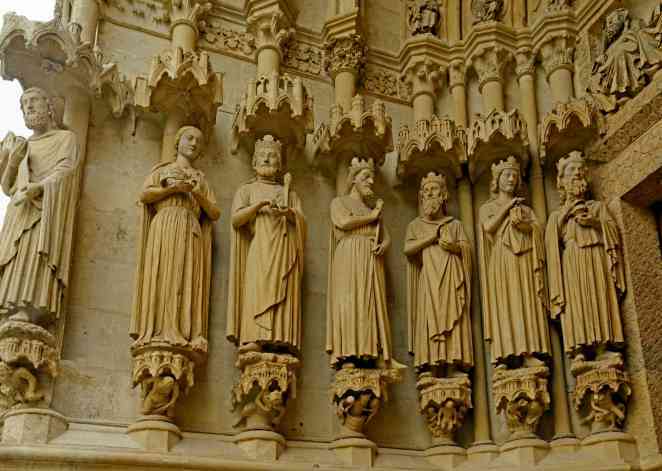 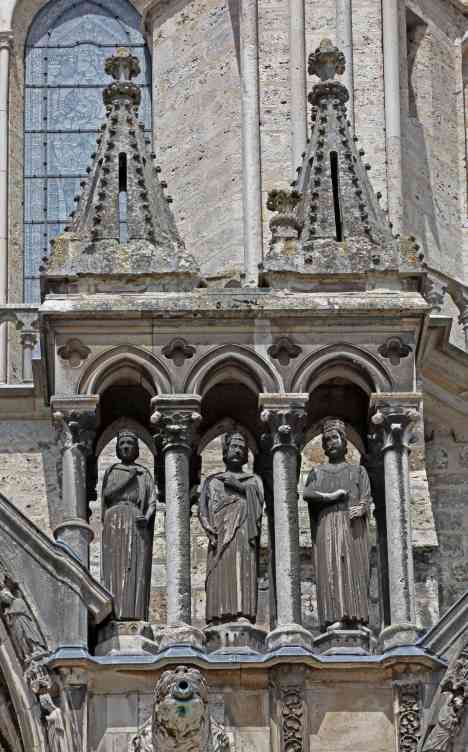 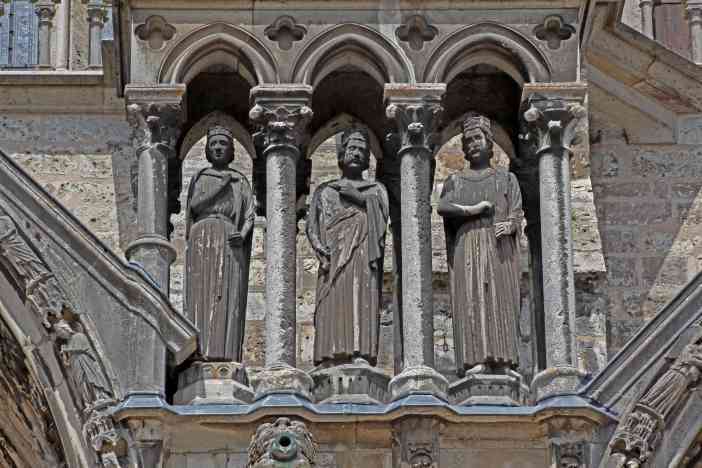 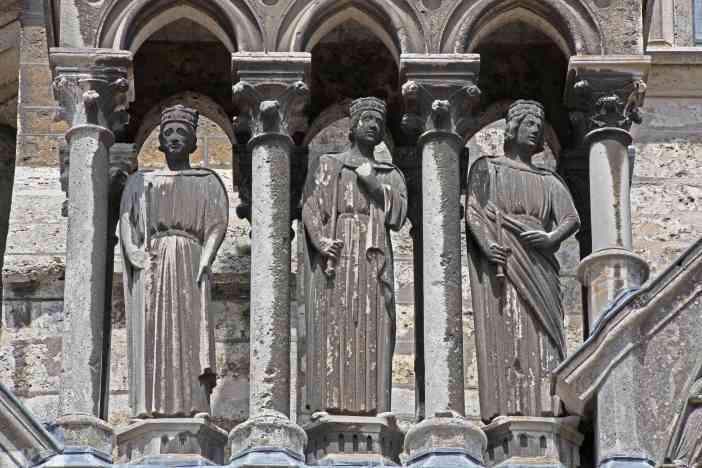 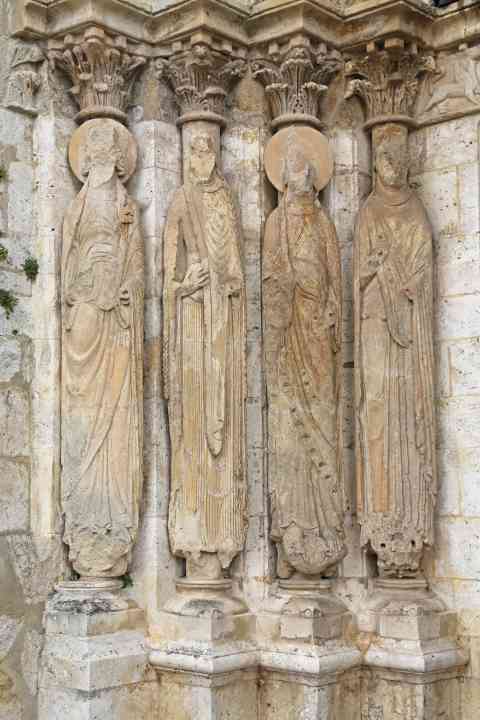 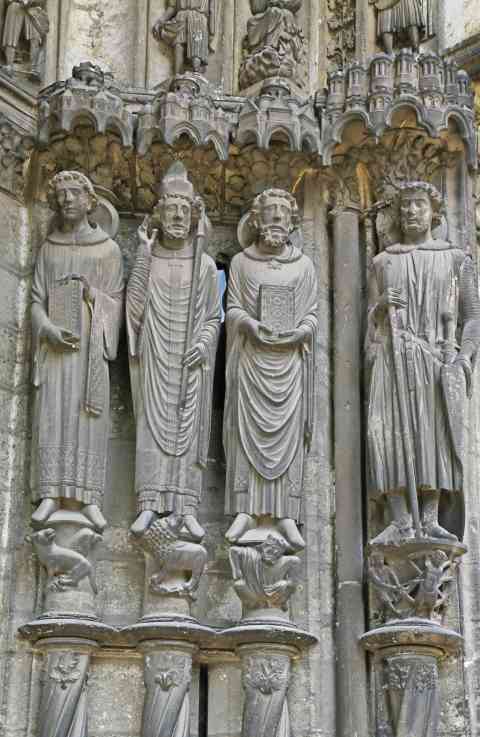 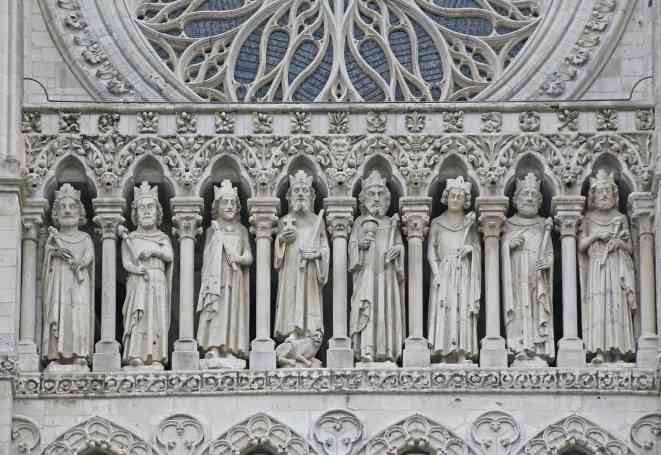 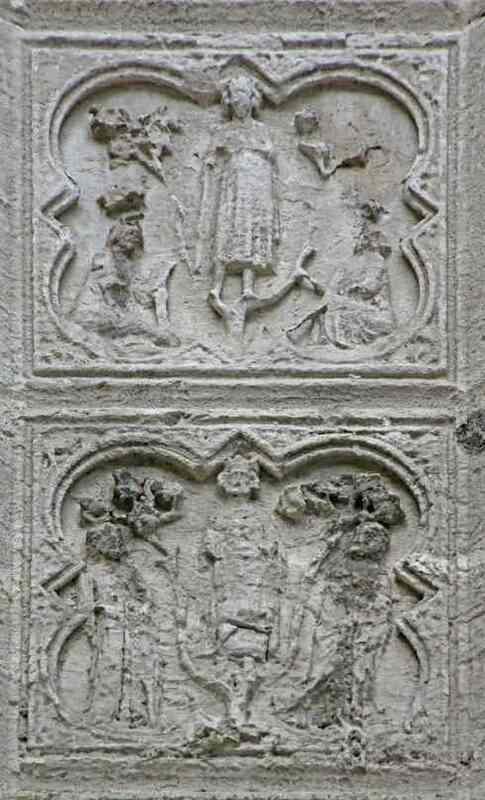 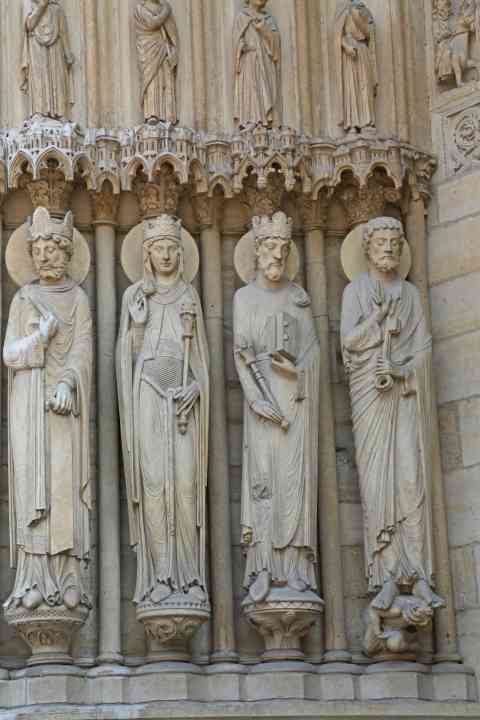 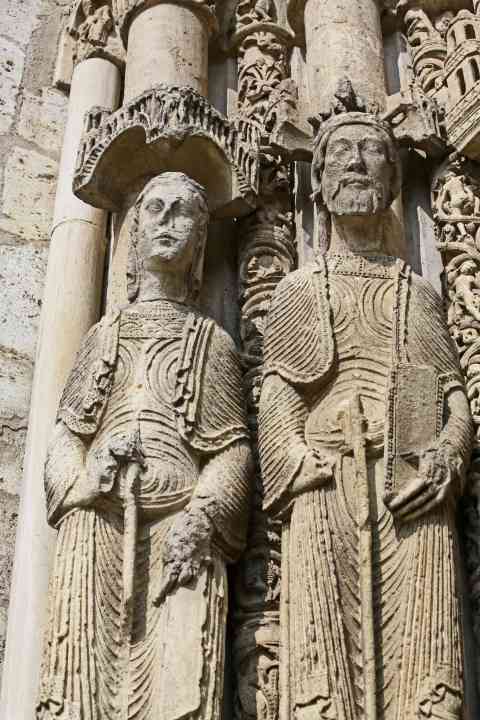 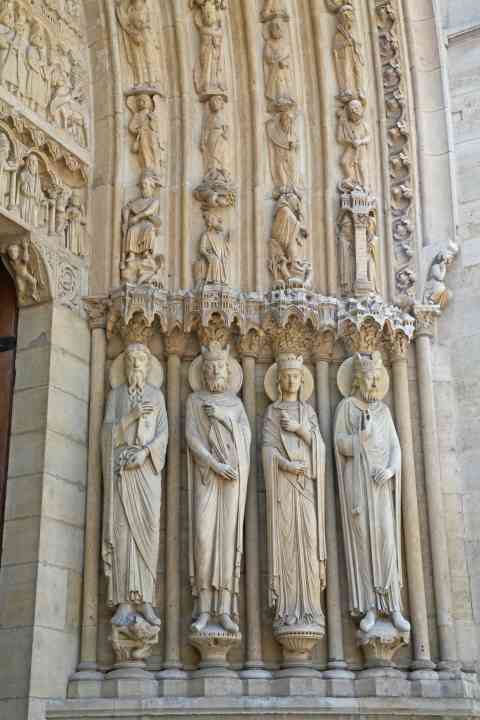 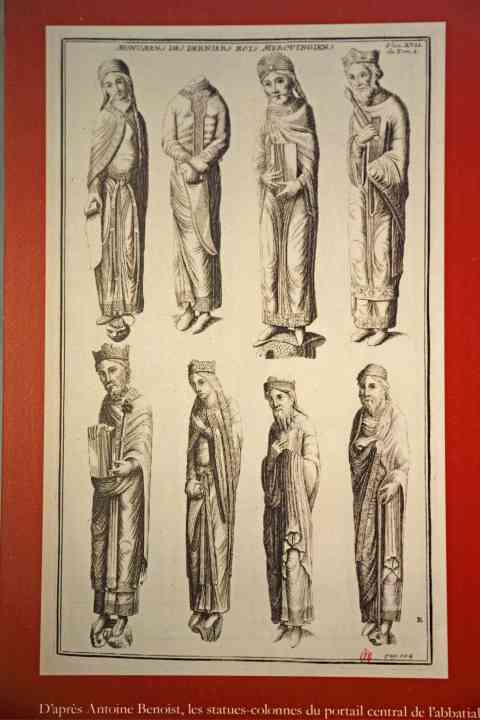 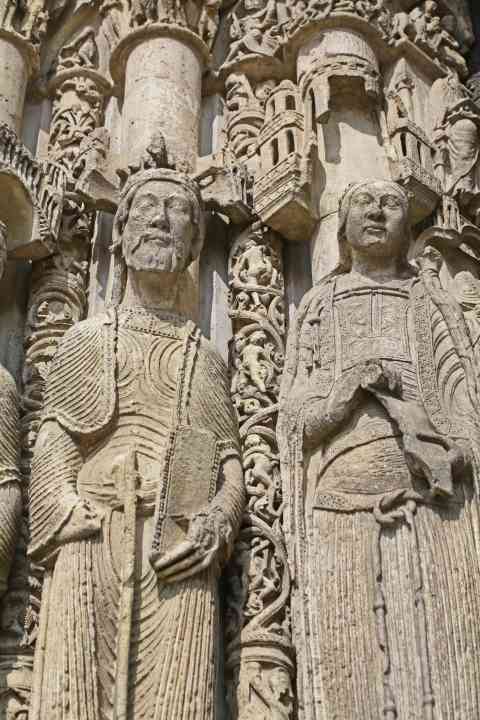 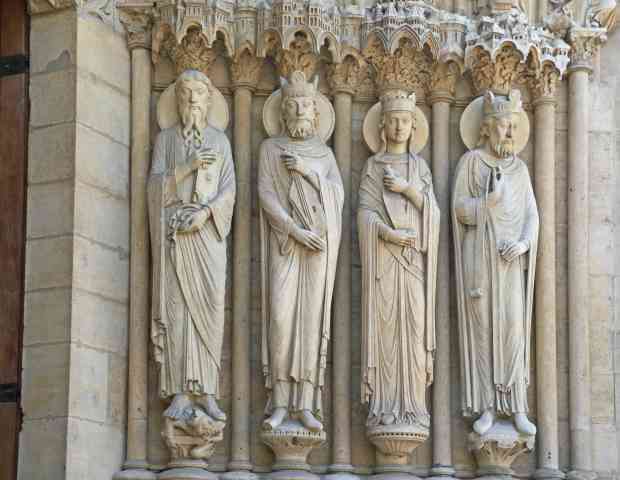 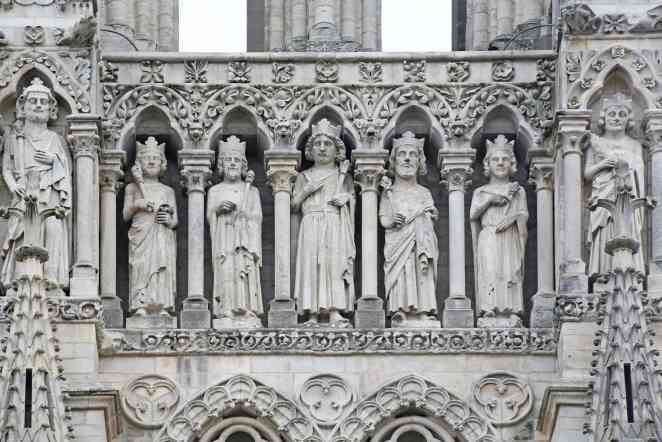 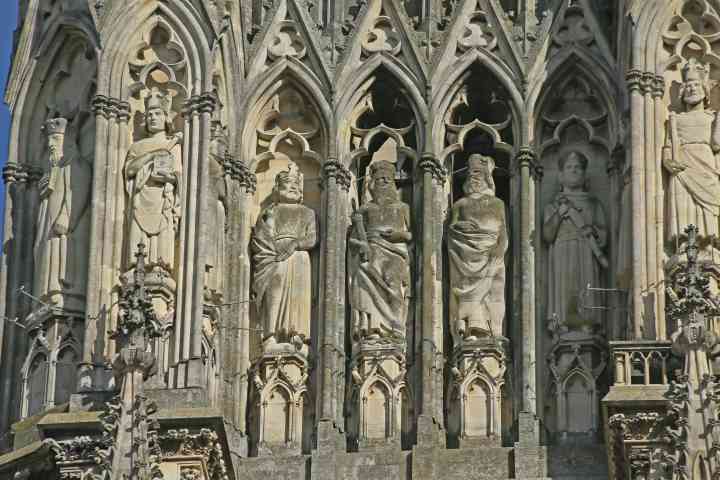 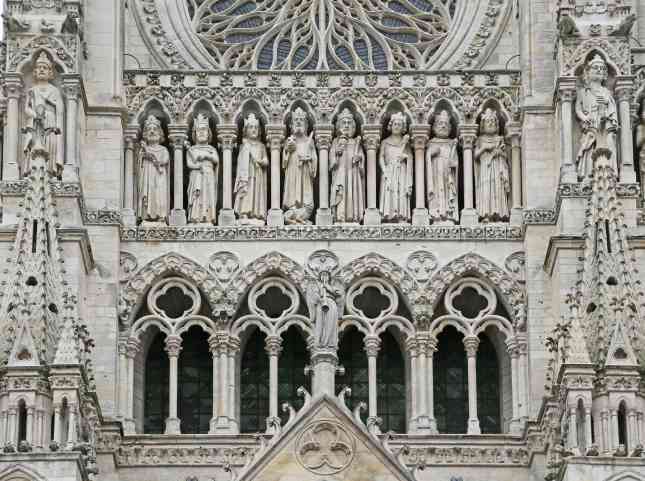 France Chartres Cathedral West door: right door left side figures: a king, Roland?, Louis VII? 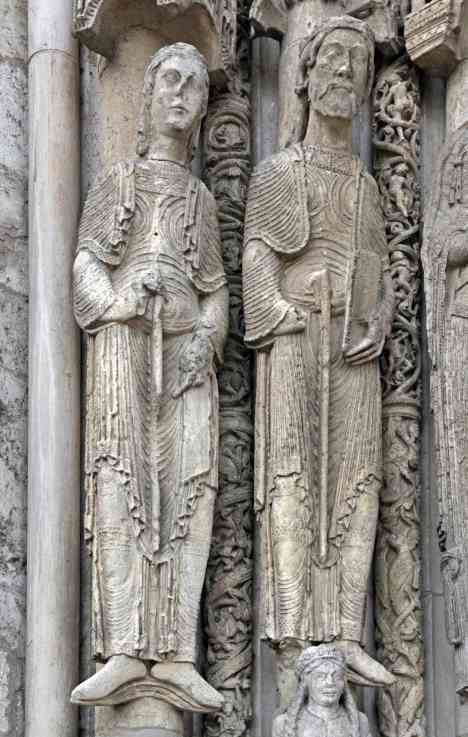 France Chartres Cathedral West door: right door right side figures: Roland? 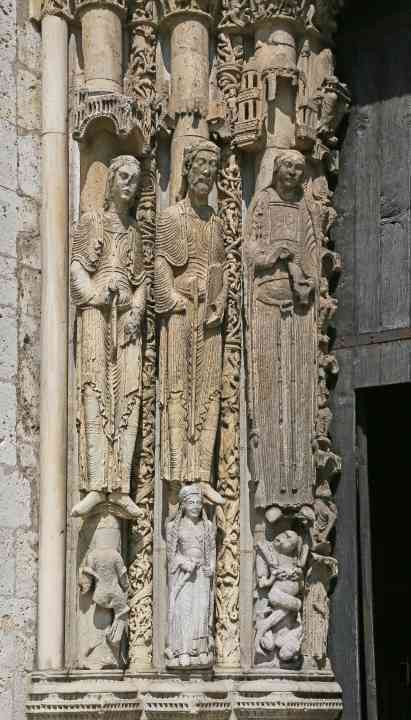 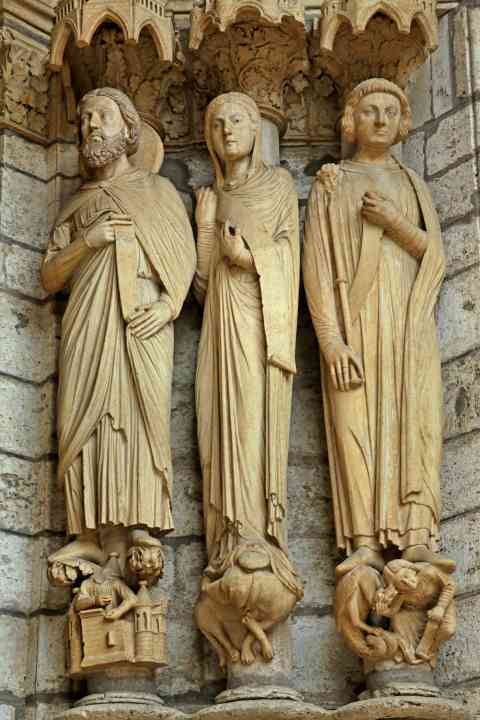 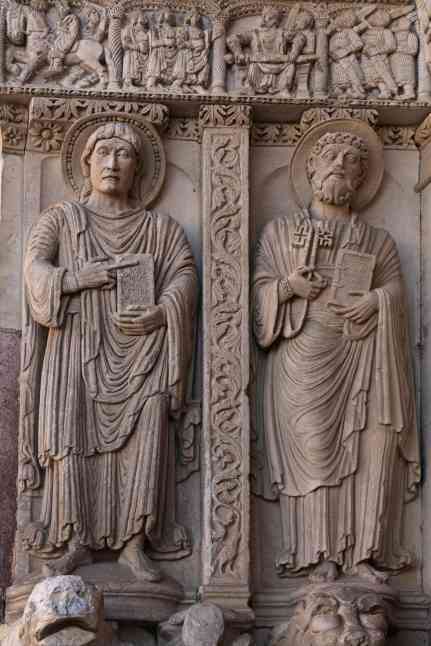 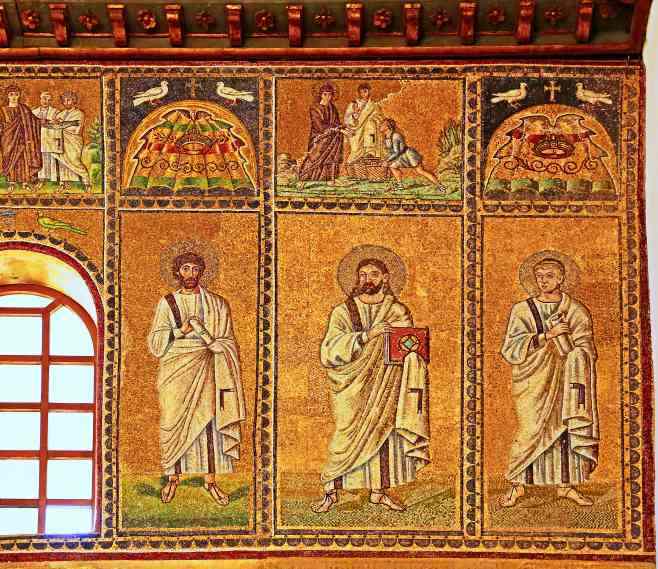 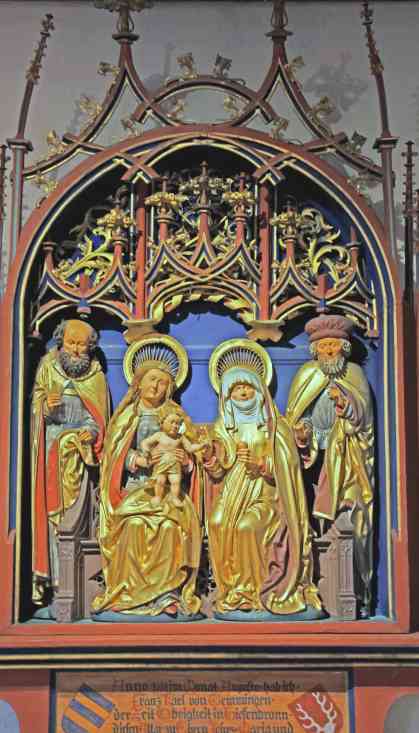 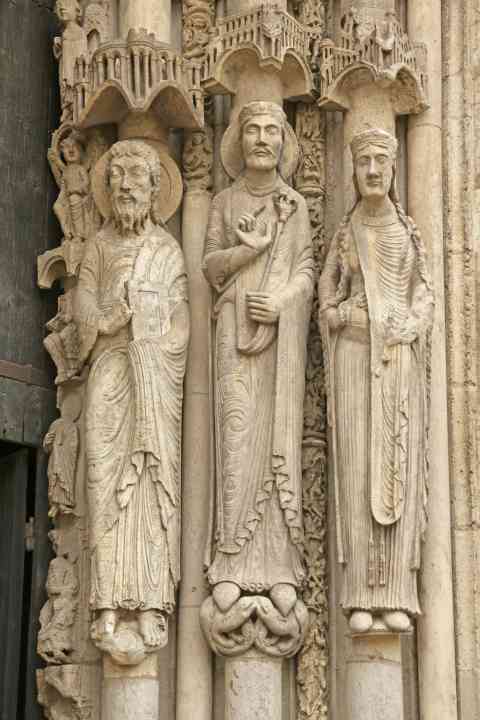 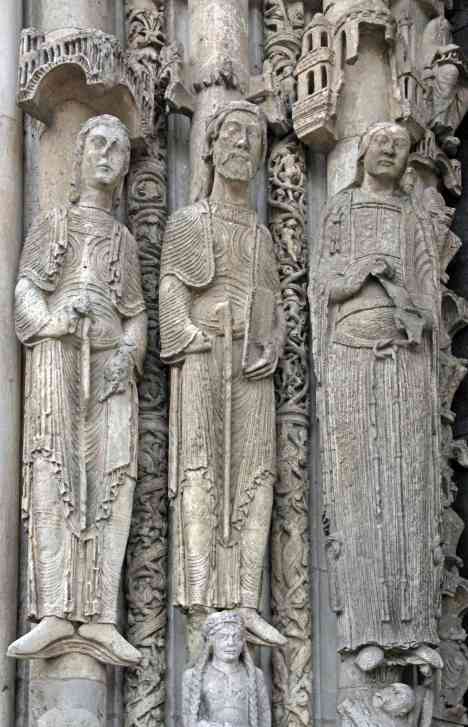 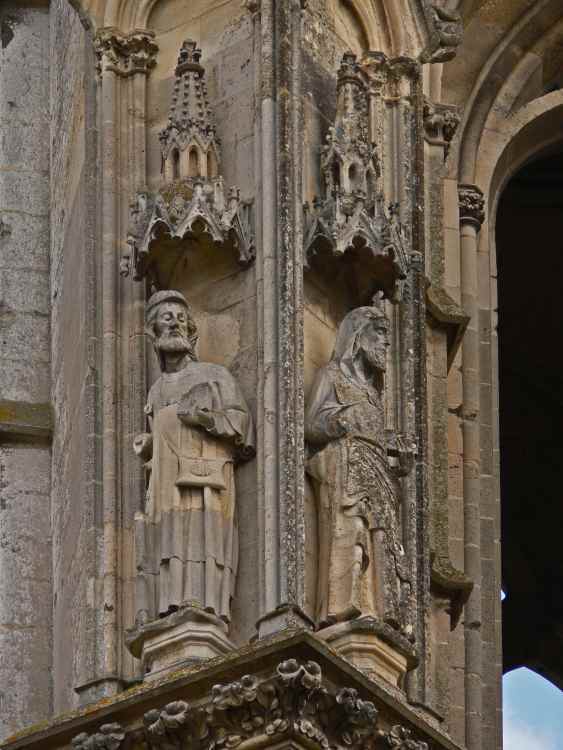 France Chartres Cathedral West door: right door right side figures: St Matthew, Charlemagne?, Hildegard? 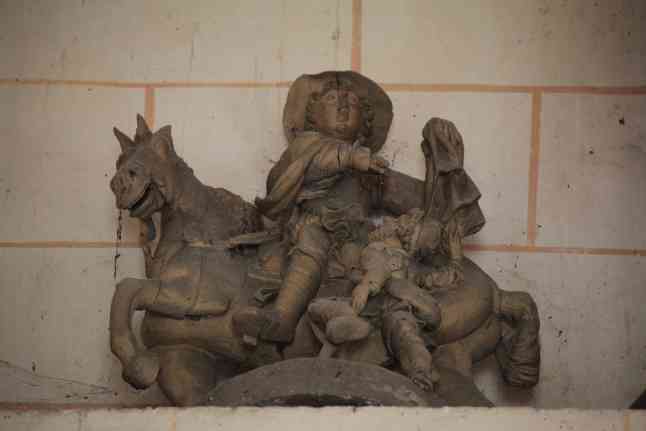 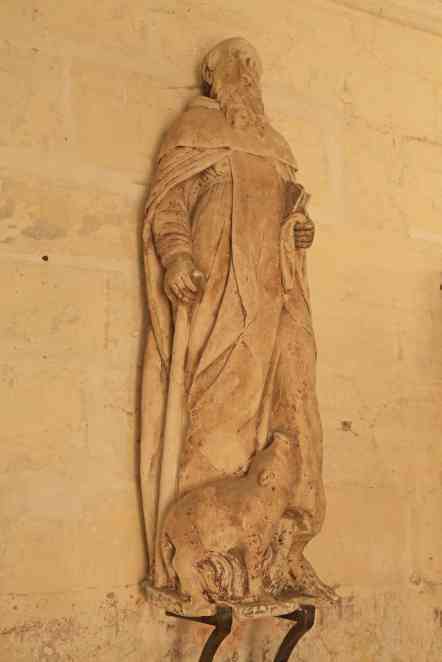 France Fécamp Abbaye de la Trinité Sculpture of a figure on a horse - St Martin? 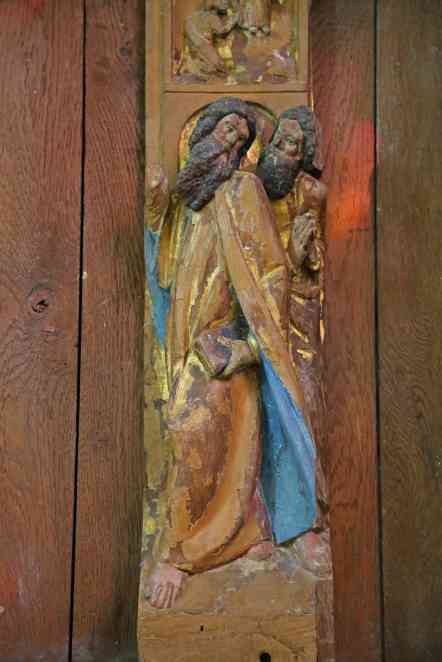 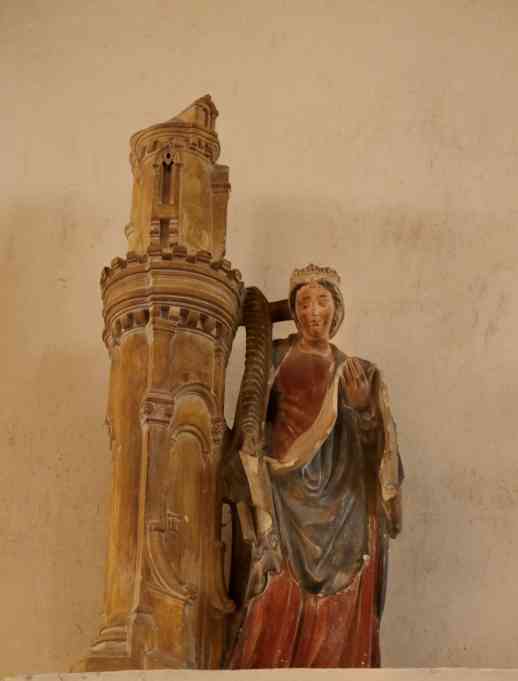 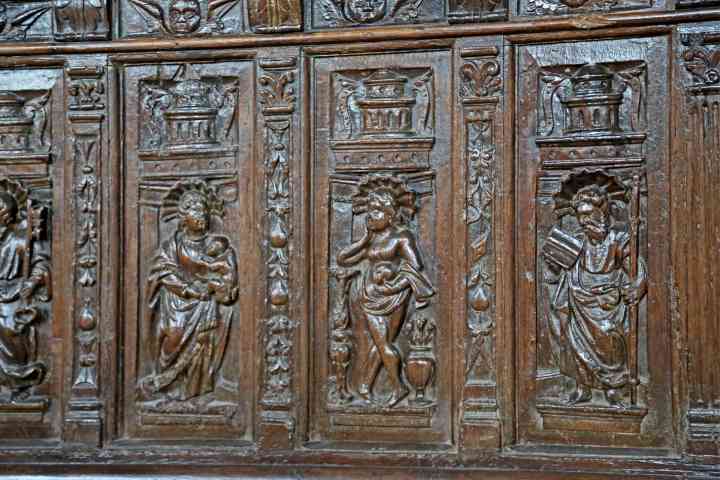 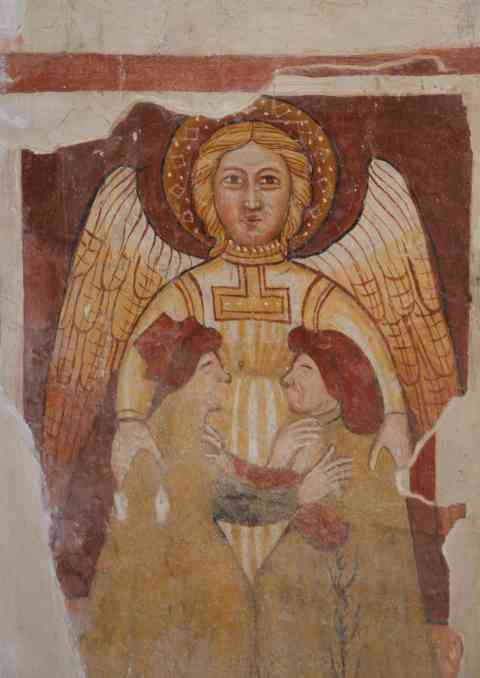 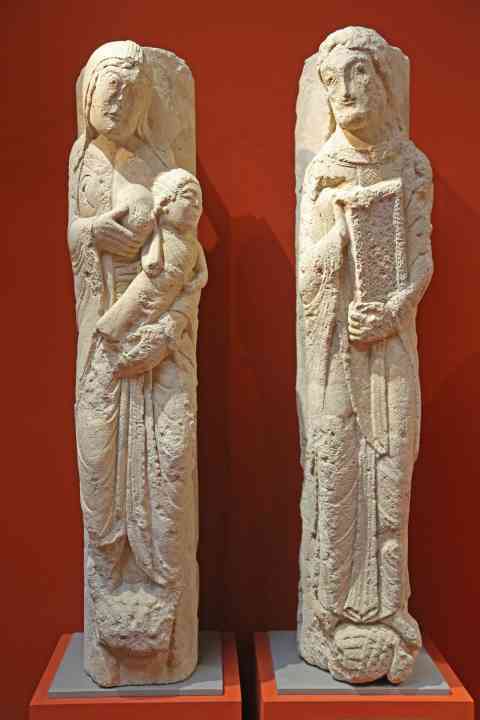 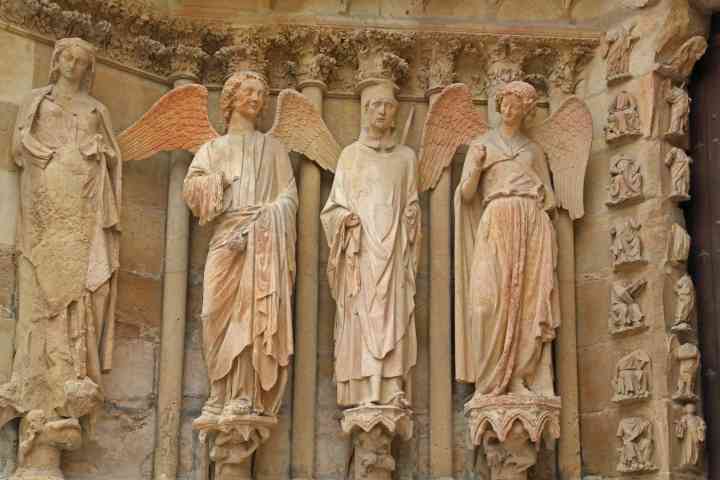 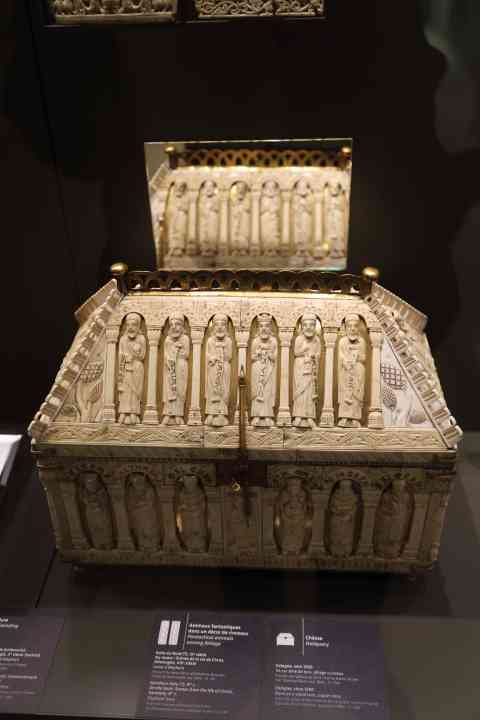 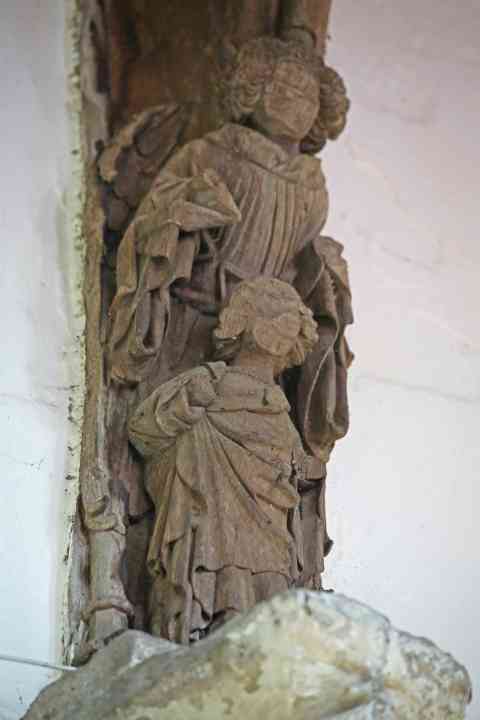 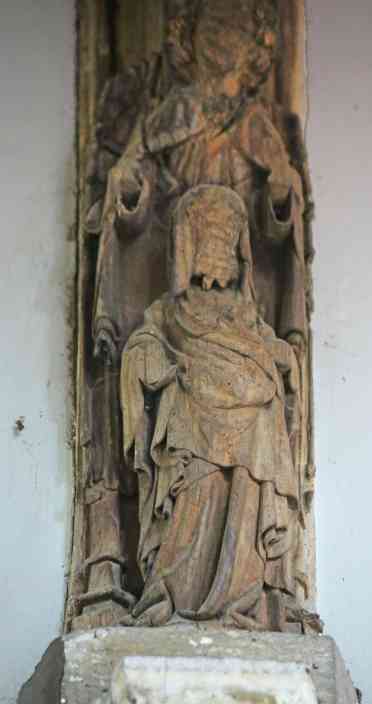 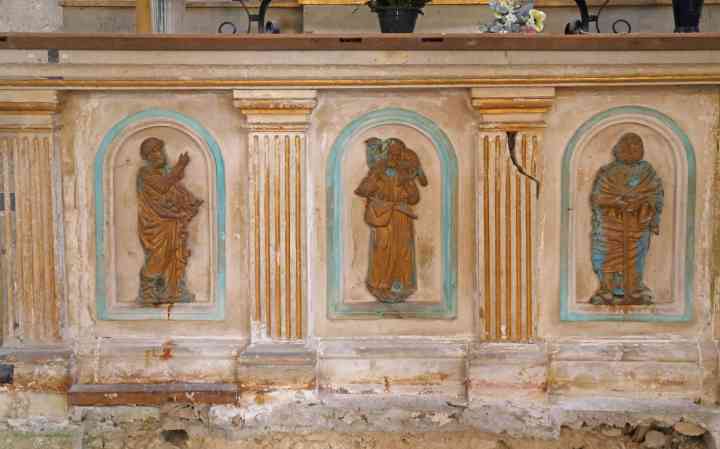 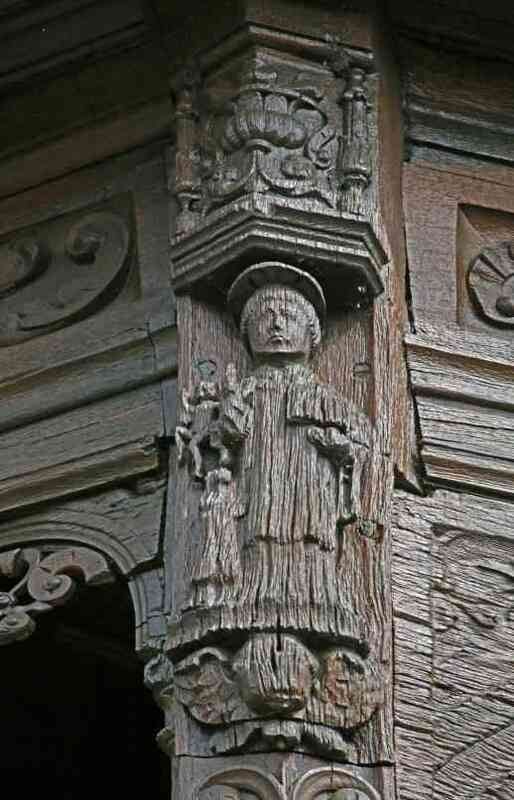 France Issoire Abbatiale Saint Austremoine Carving of figure with 3 + 2 angels - Abraham? 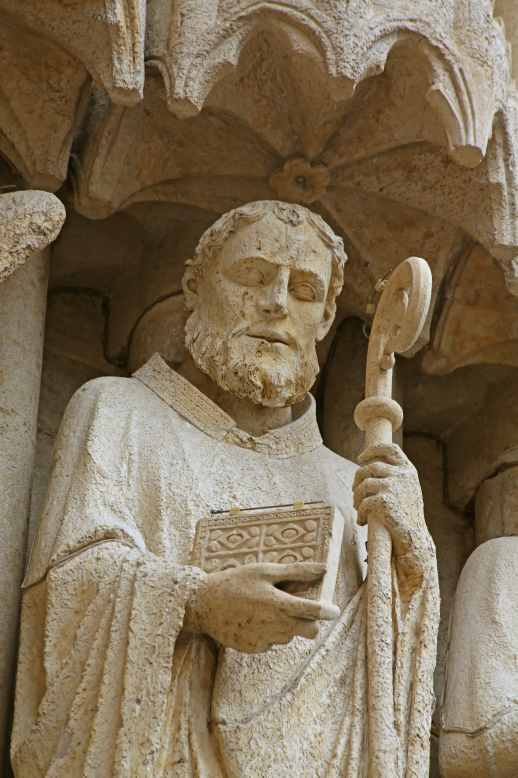 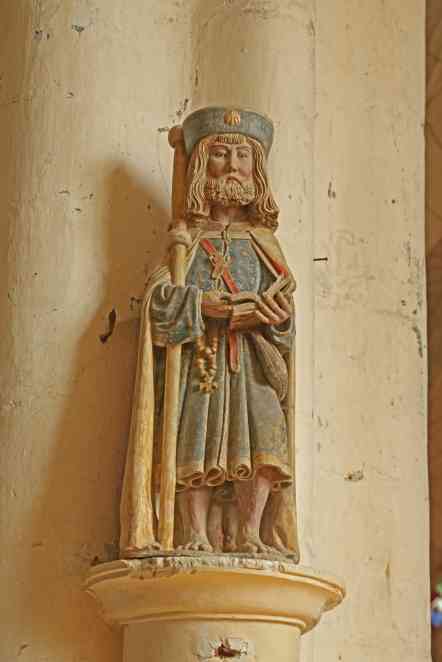 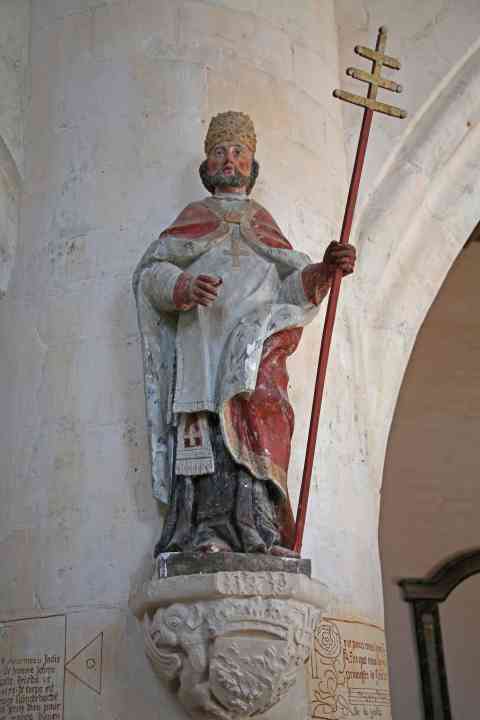 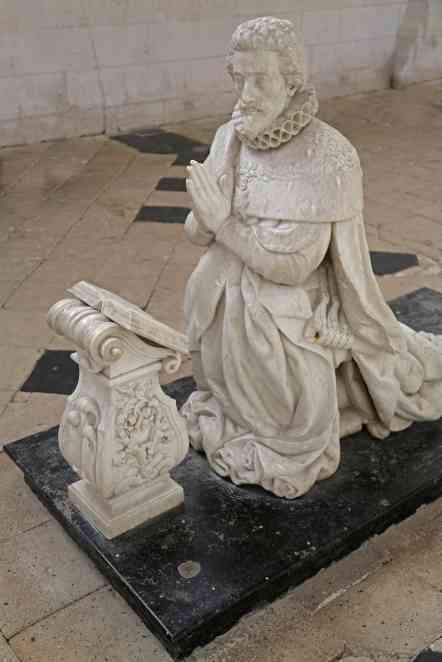 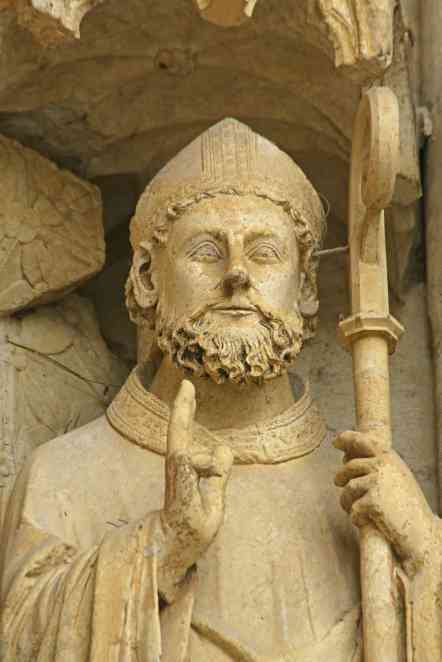 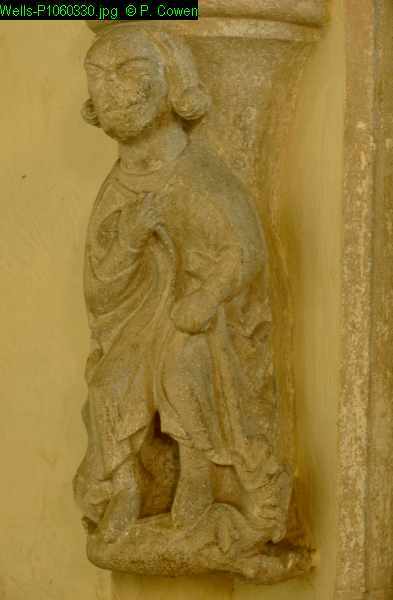 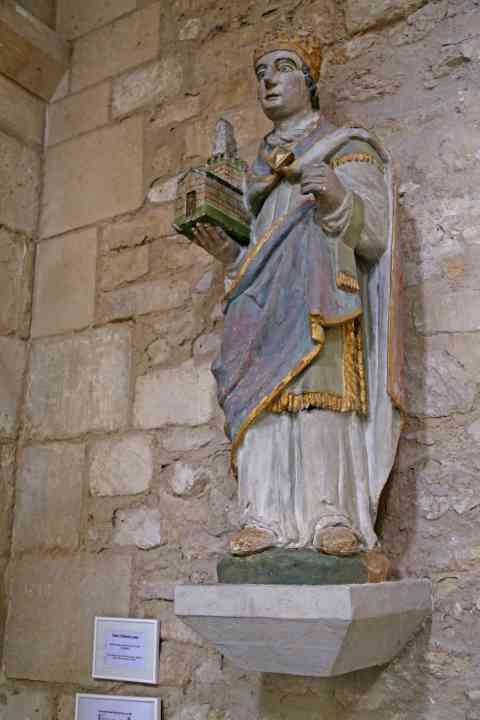 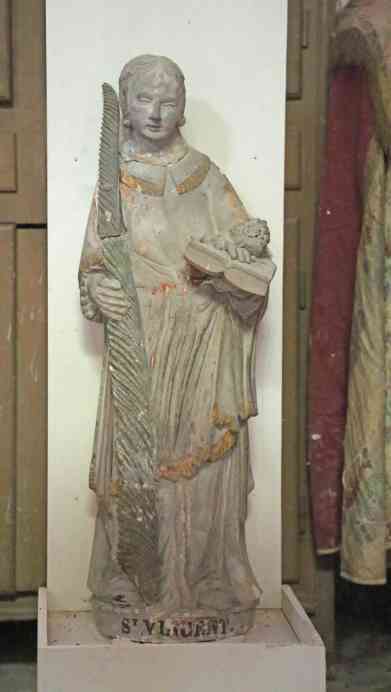 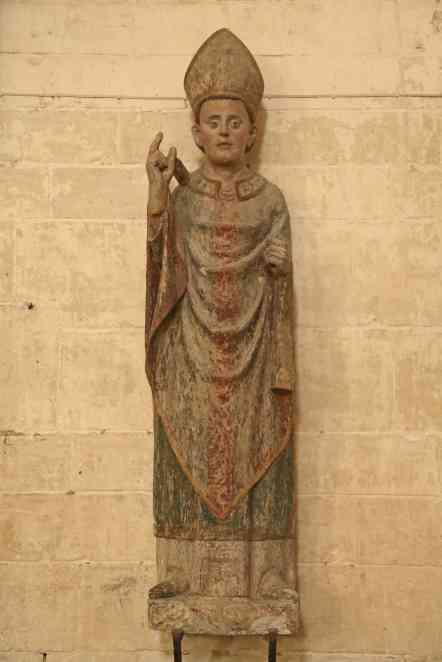 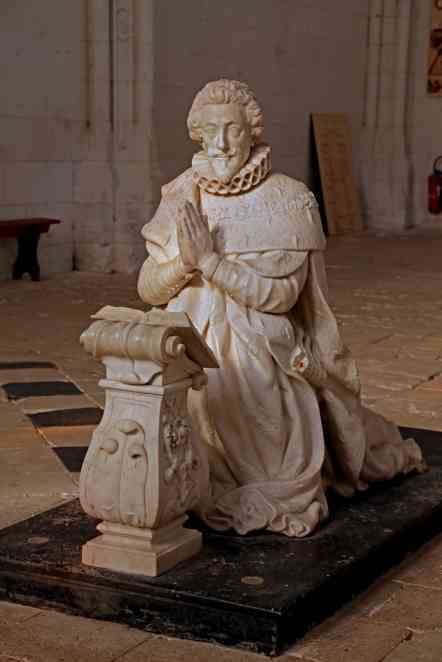 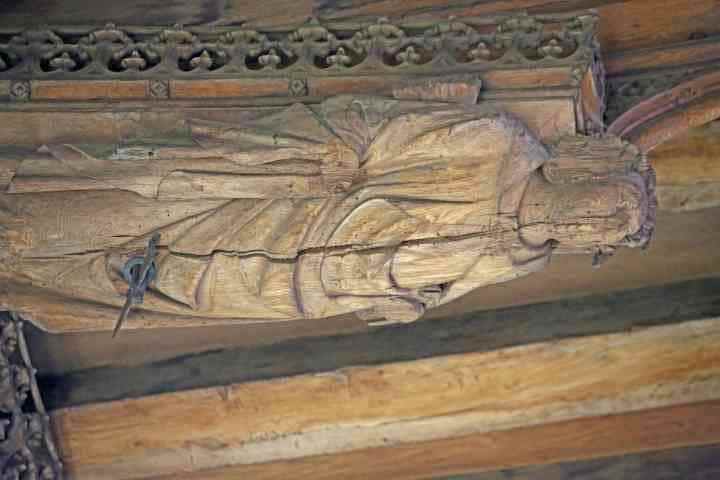 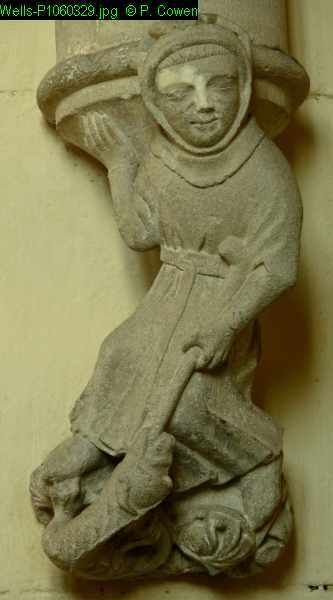 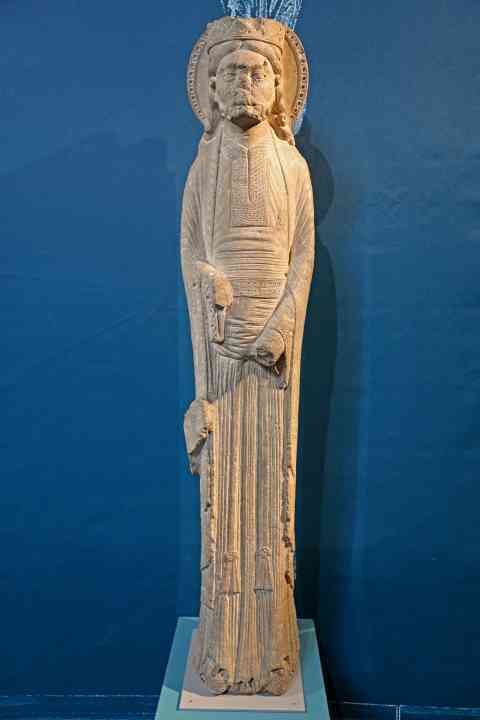 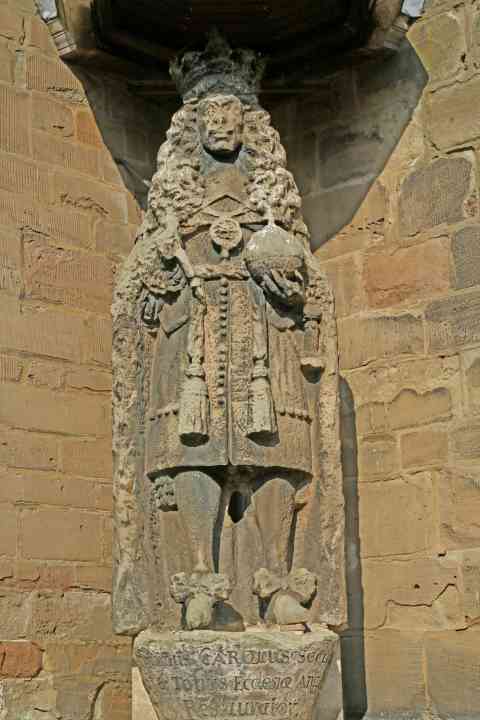 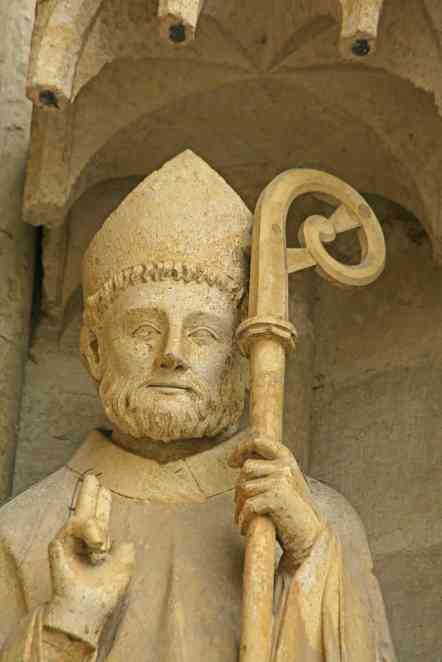 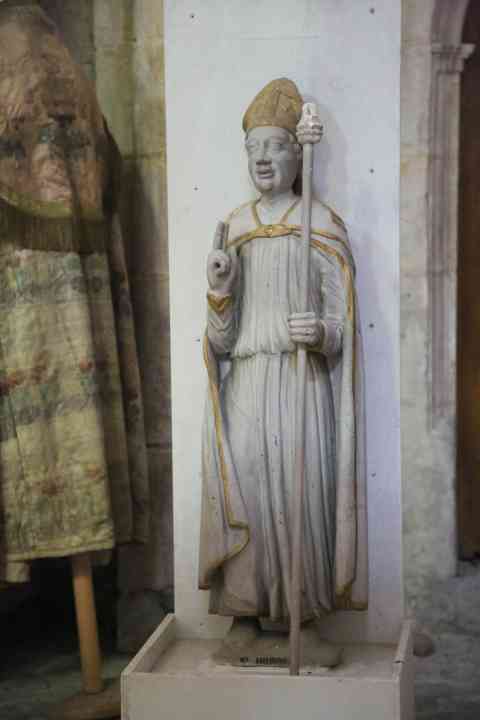 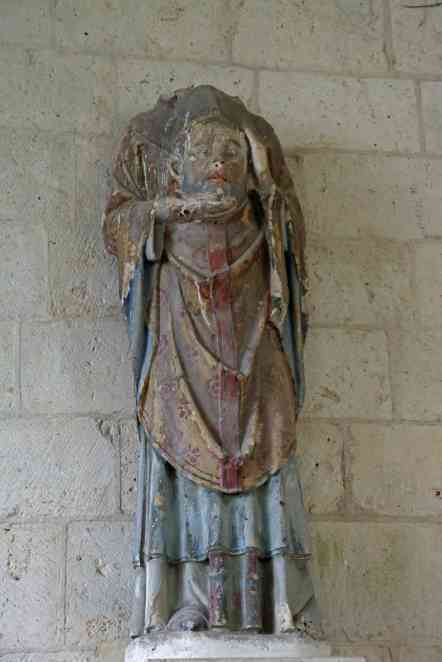 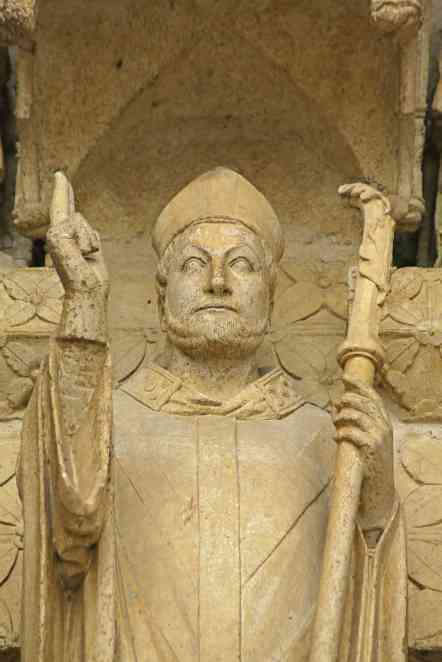 France Morienval Abbey Statue of a bishop - St Annobert? 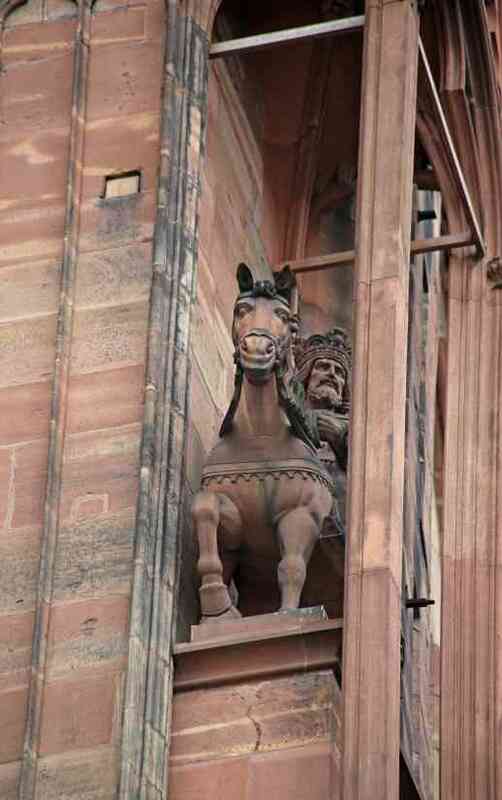 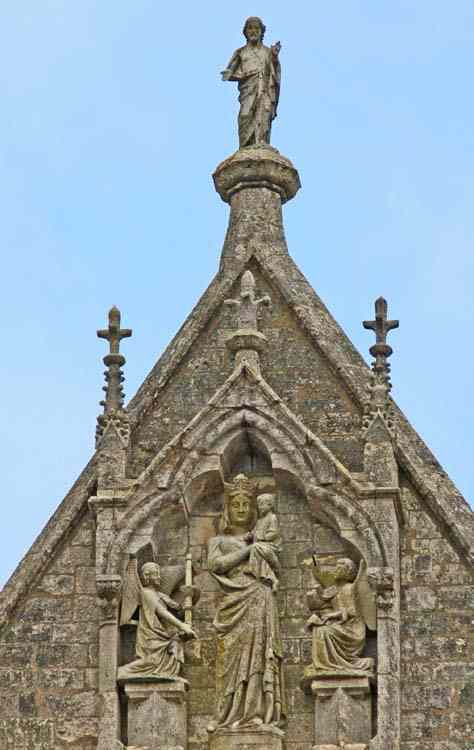 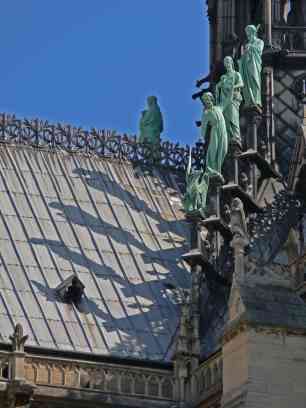 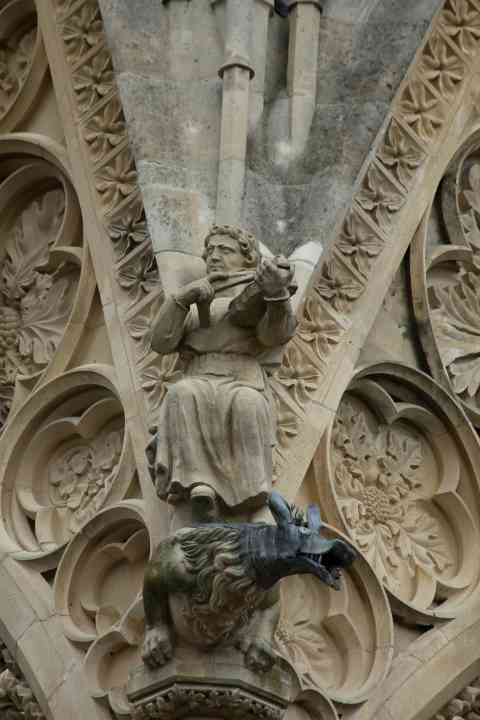 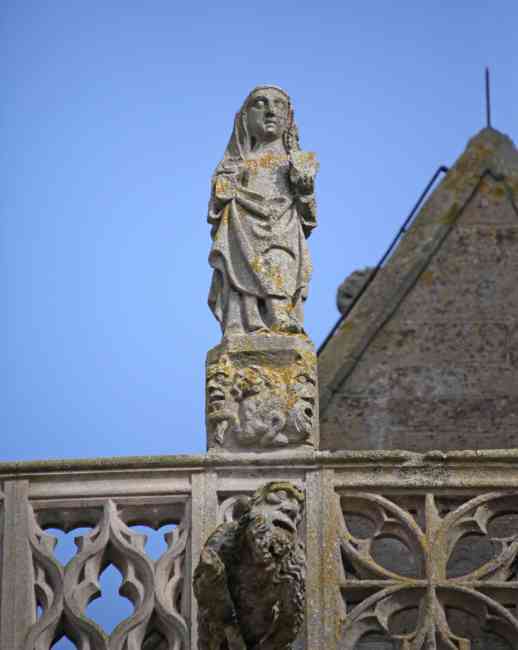 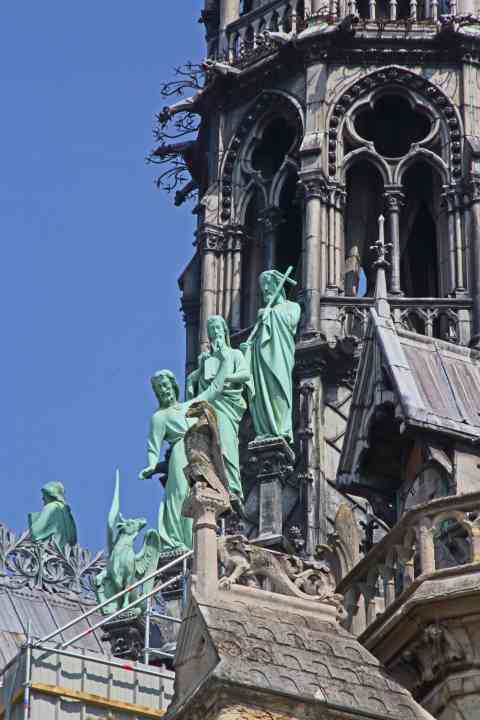 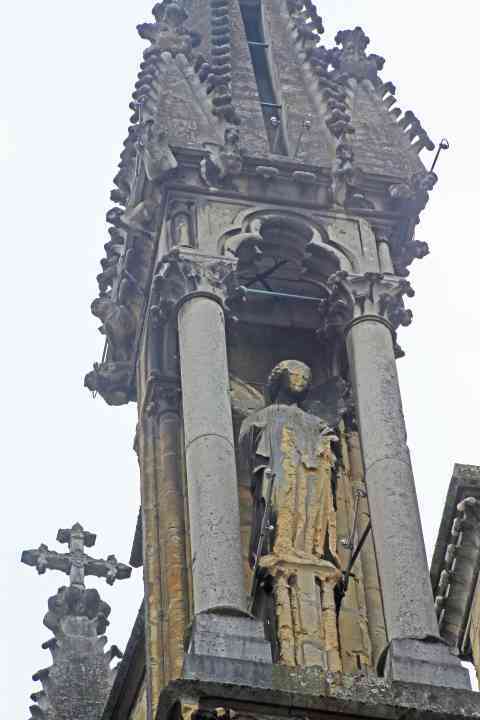 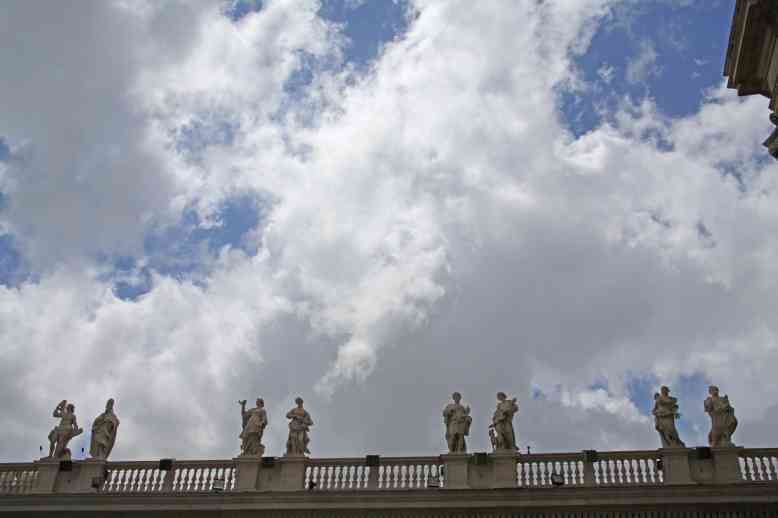 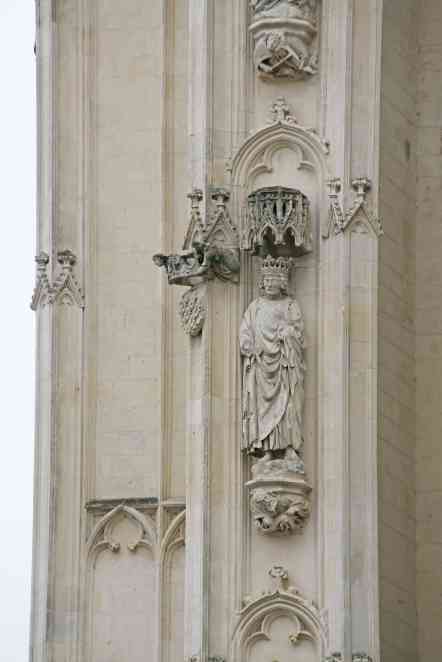 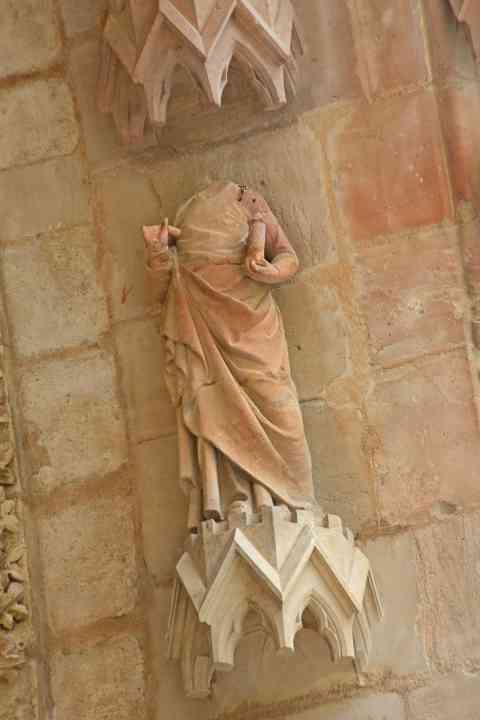 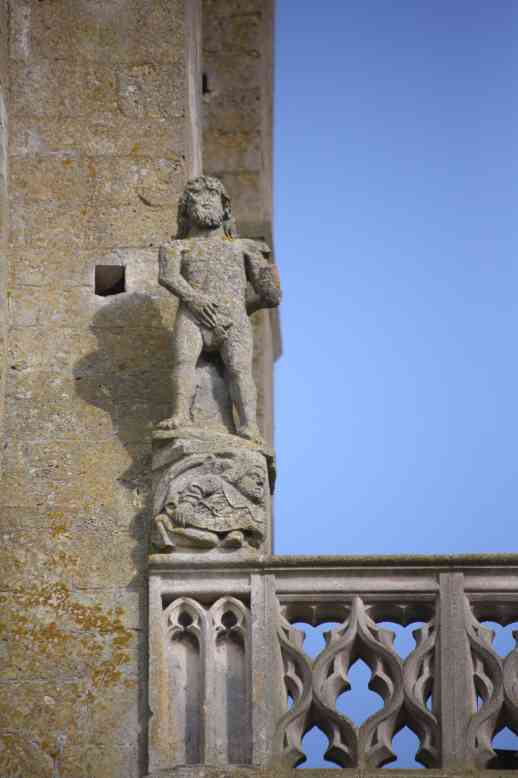 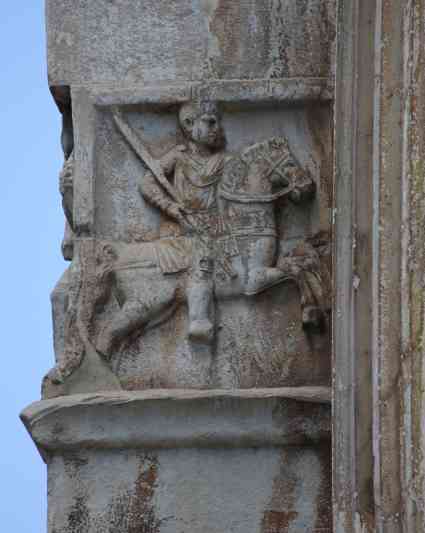 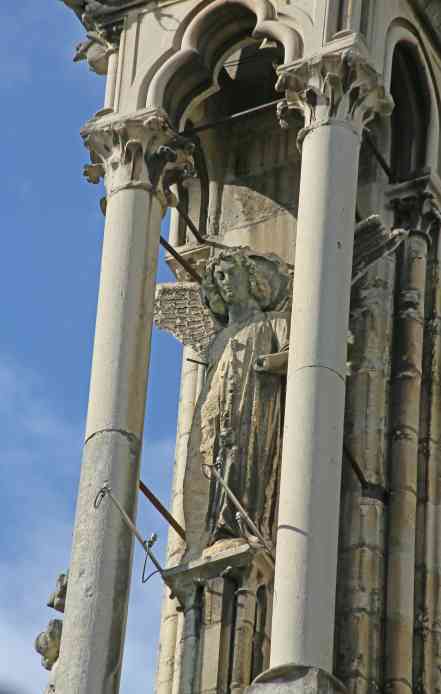 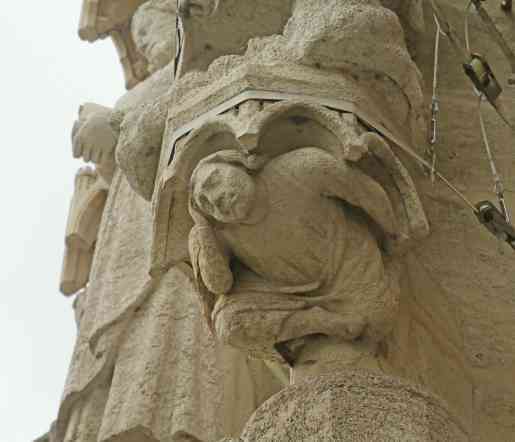 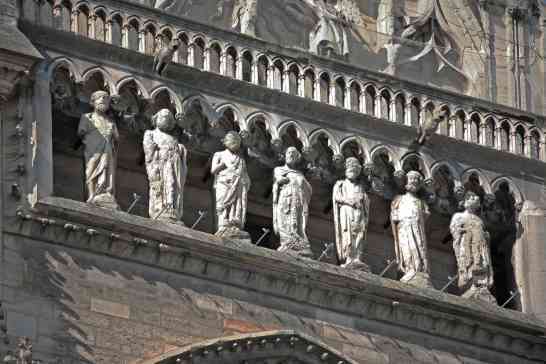 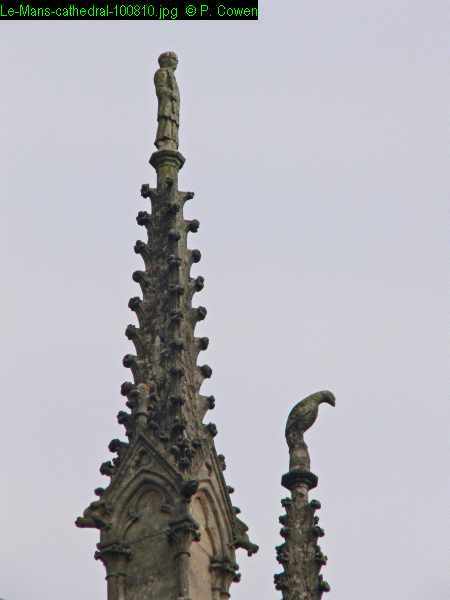 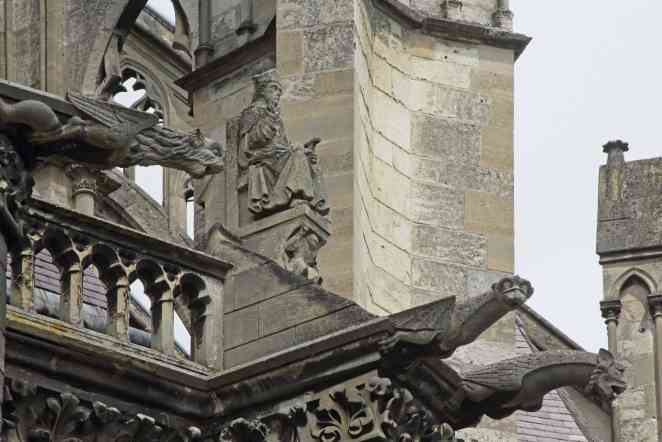 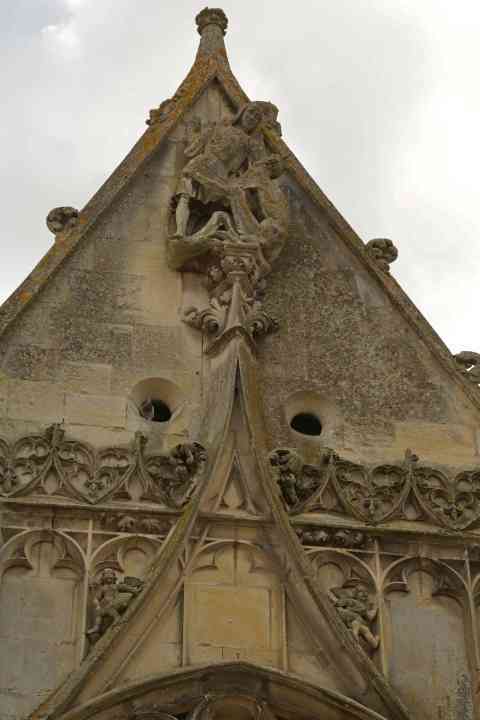 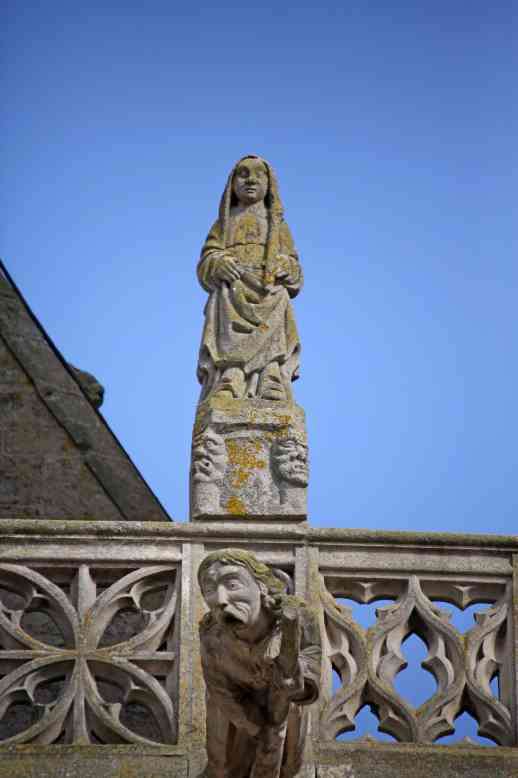 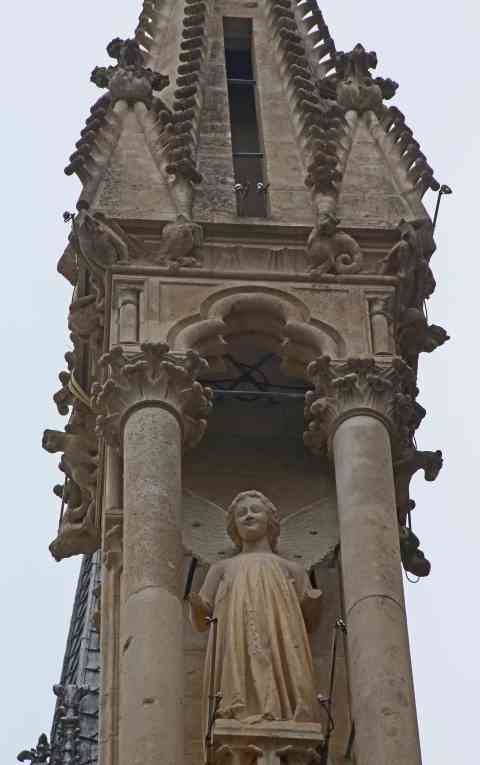 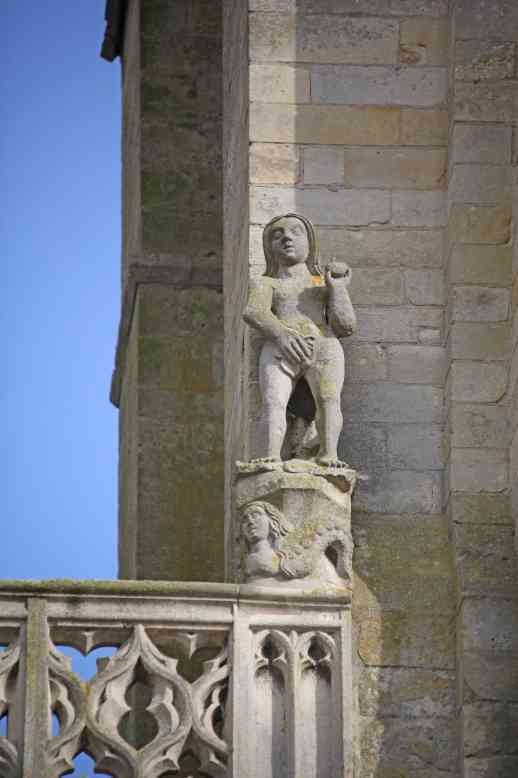 France Paris Notre Dame figures on th steeple - Viollet-le-Duc as model? 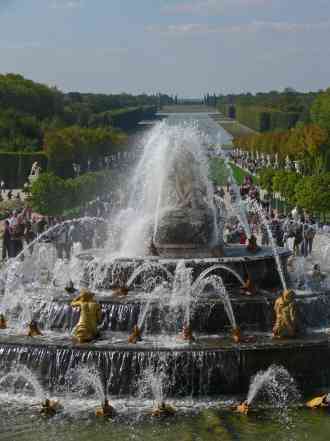 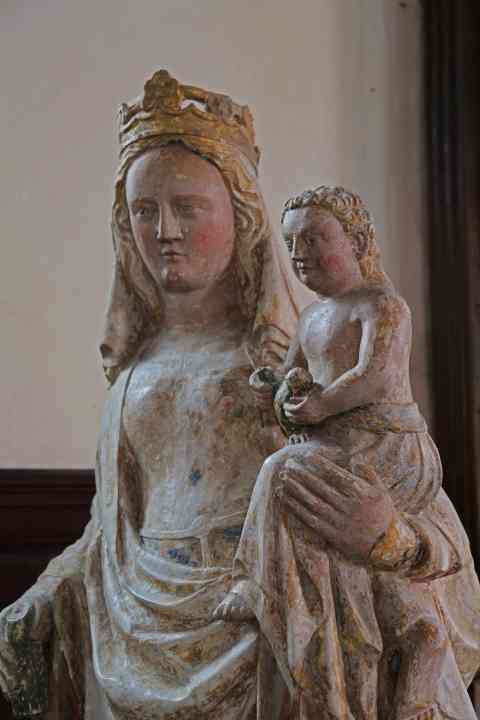 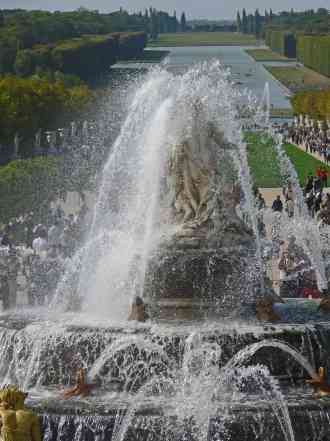 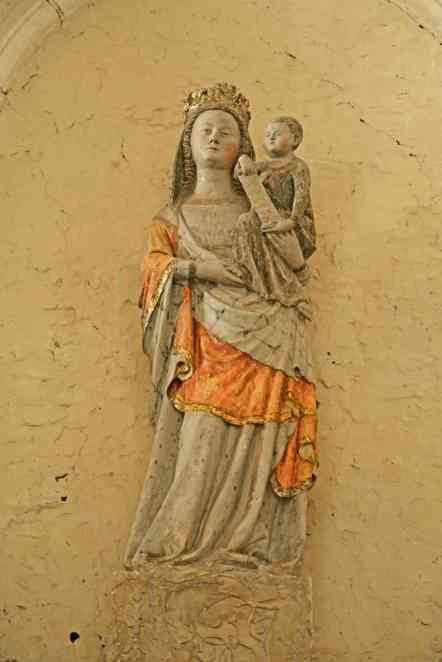 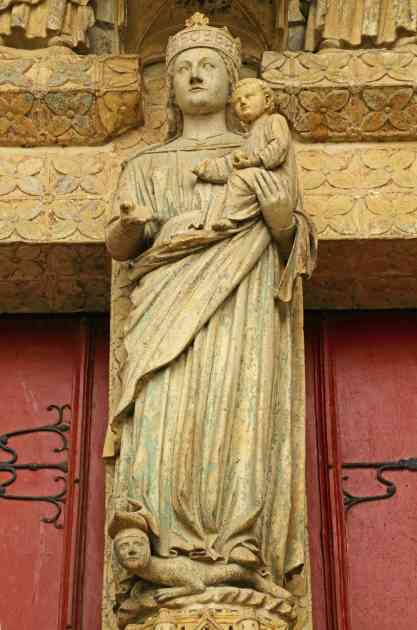 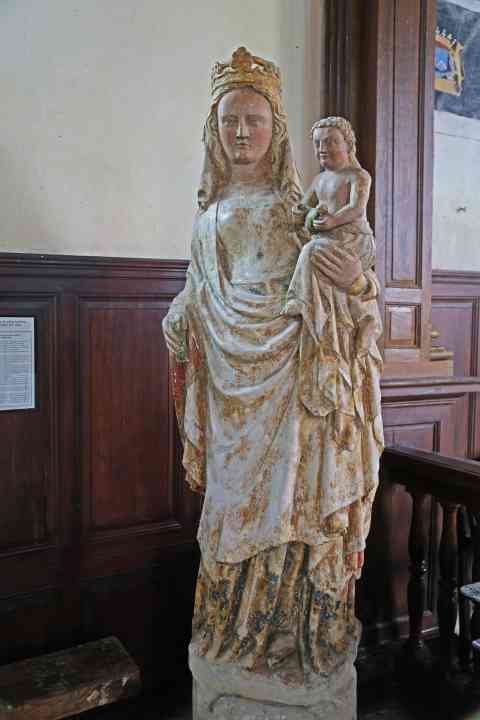 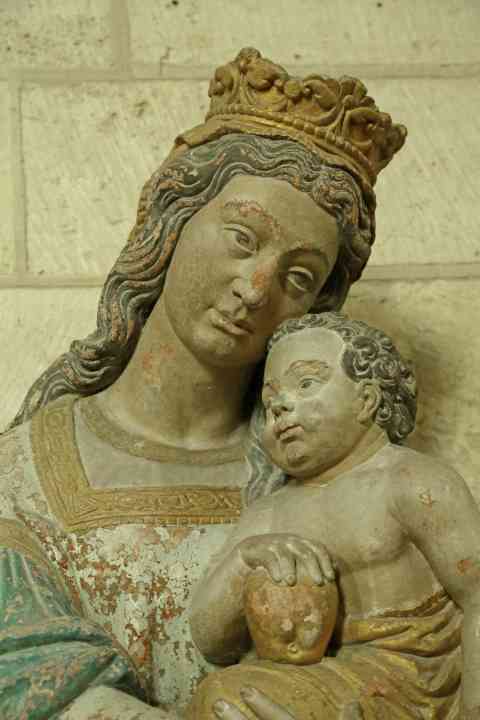 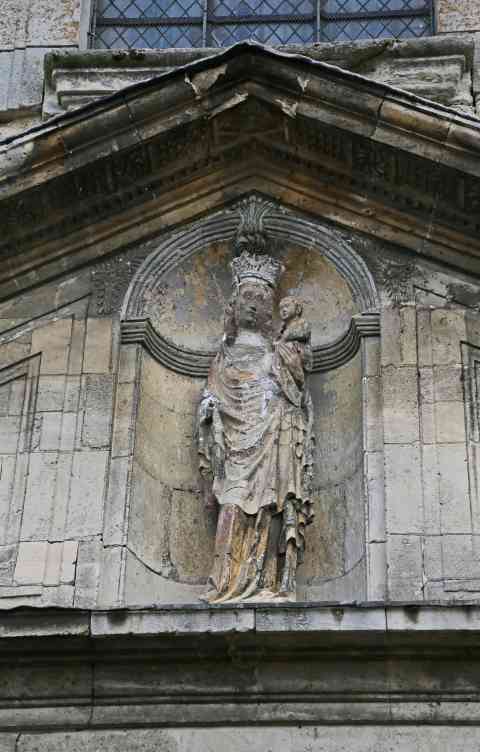 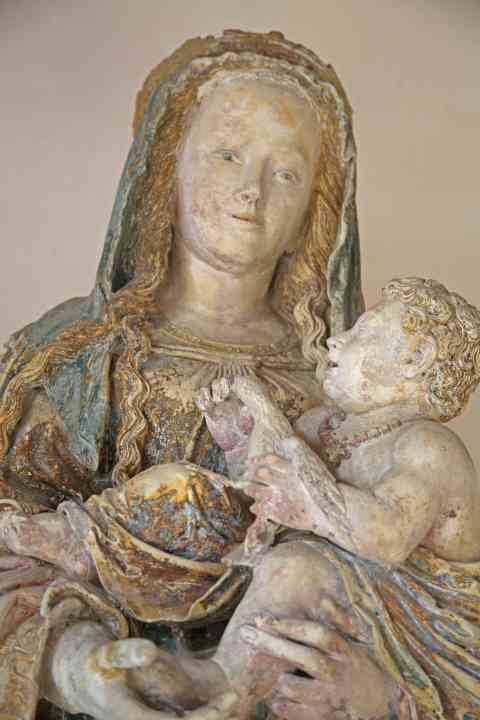 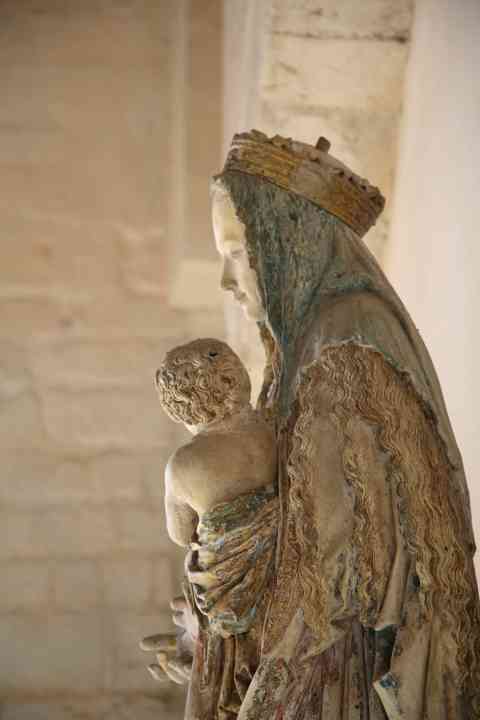 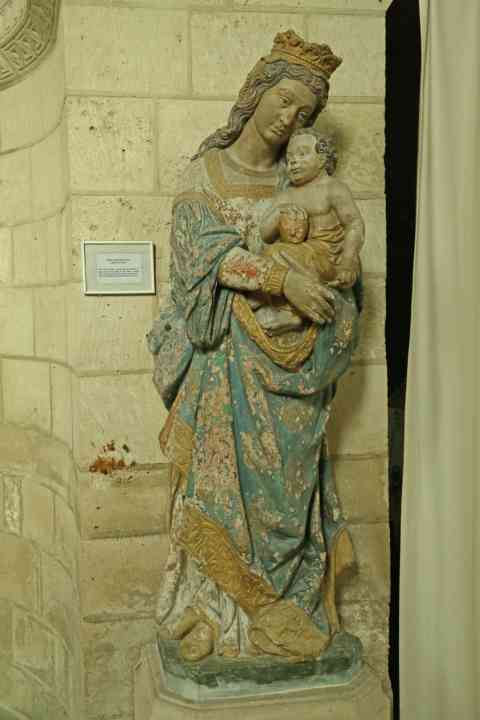 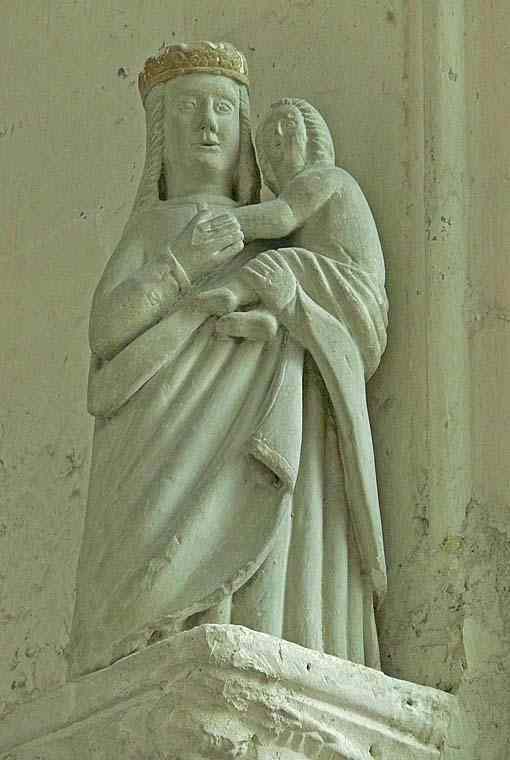 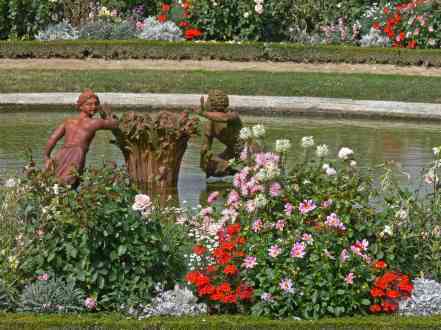 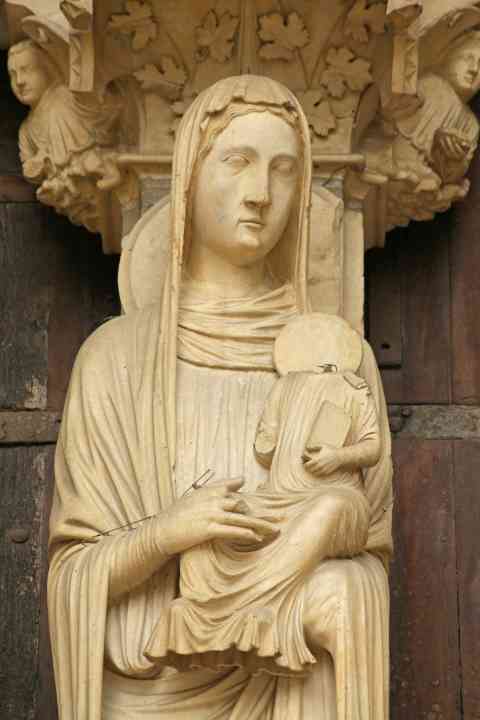 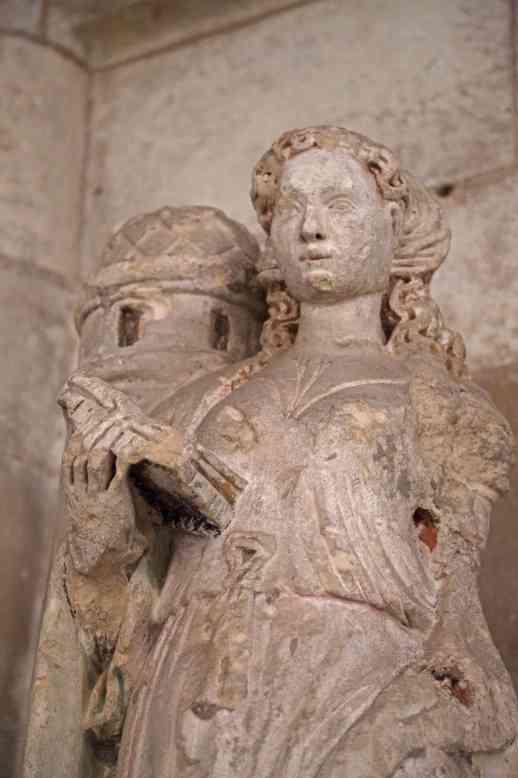 France Paris St Germain des Pres Statue of the Virgin and Child - C14? 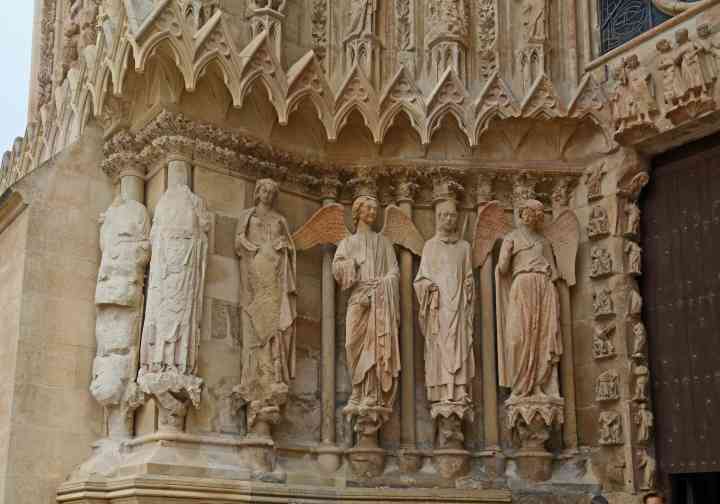 France Reims Cathedral North façade: east portal: angel and canopy above the figure of Christ - the "Beau-Dieu"
France Reims Cathedral Statues on the reverse west façade, north side: Christ teachng? 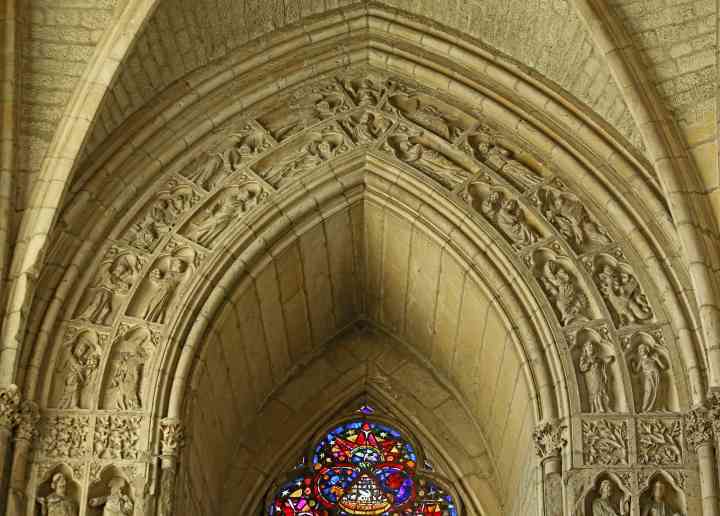 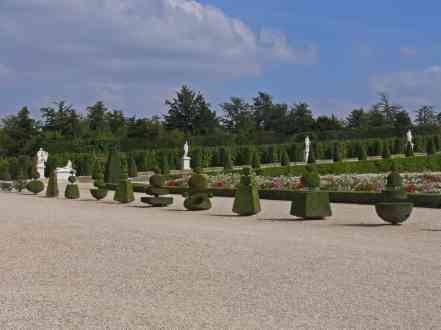 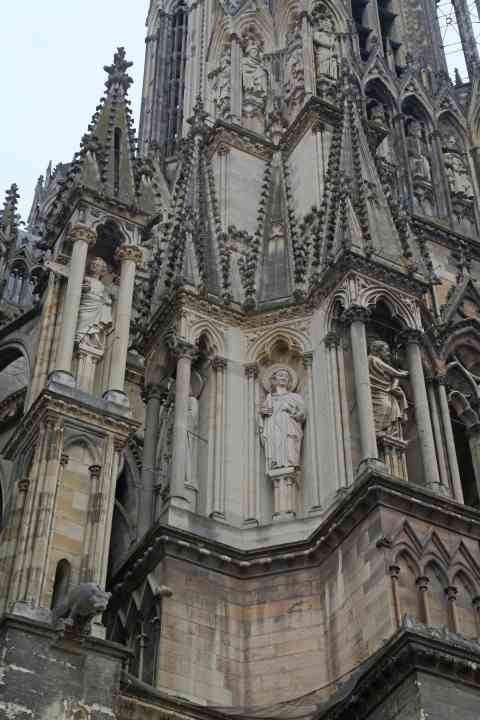 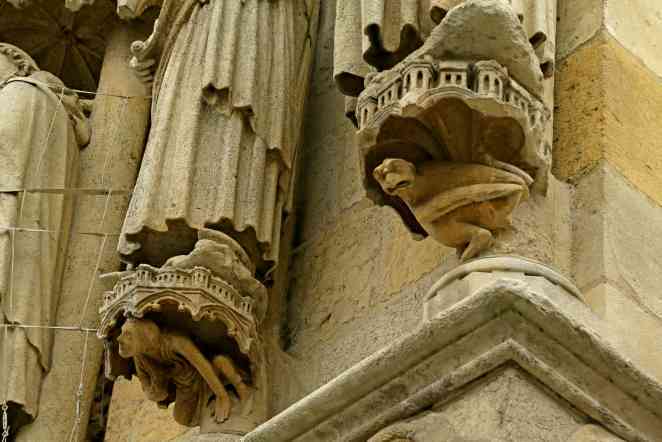 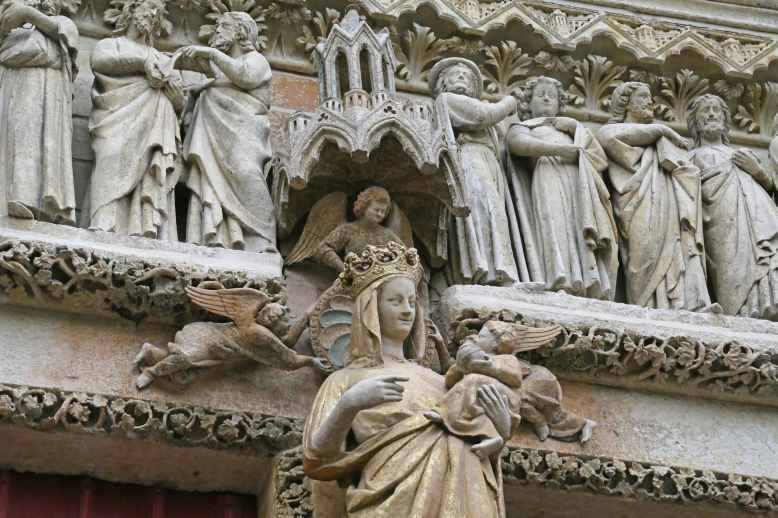 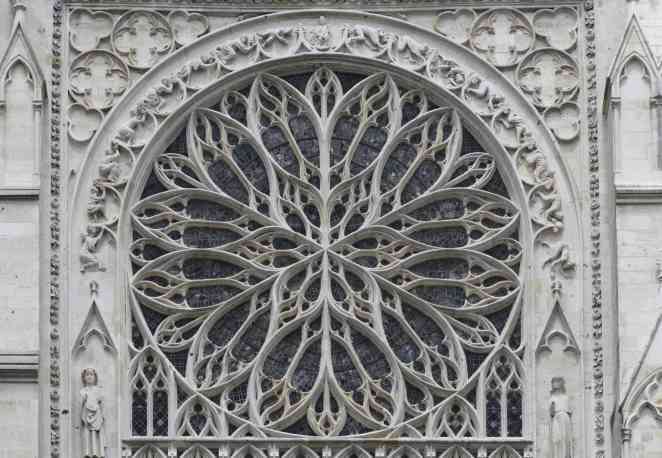 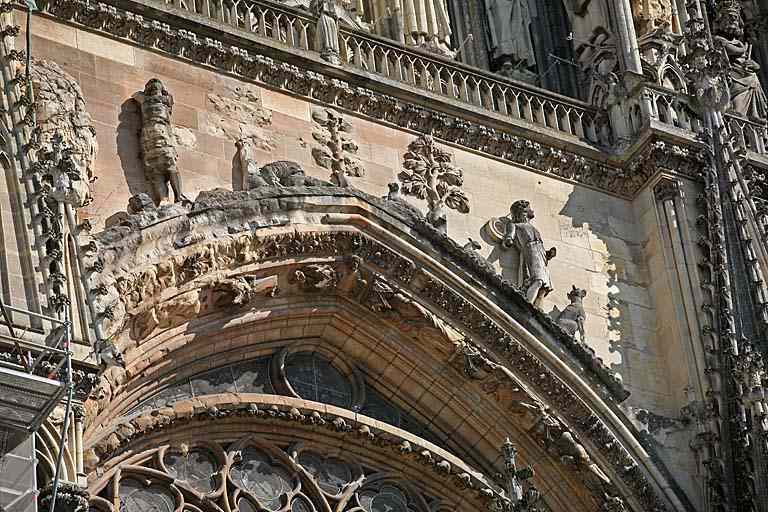 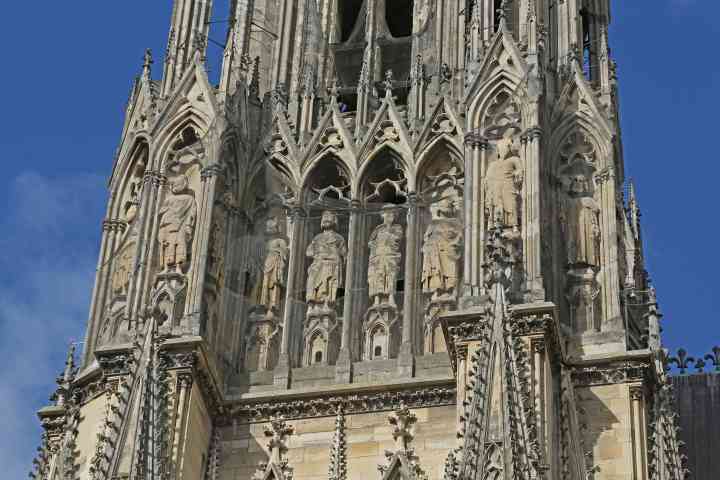 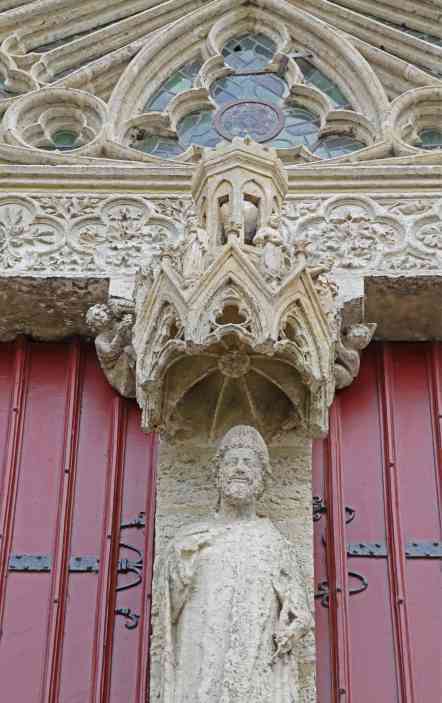 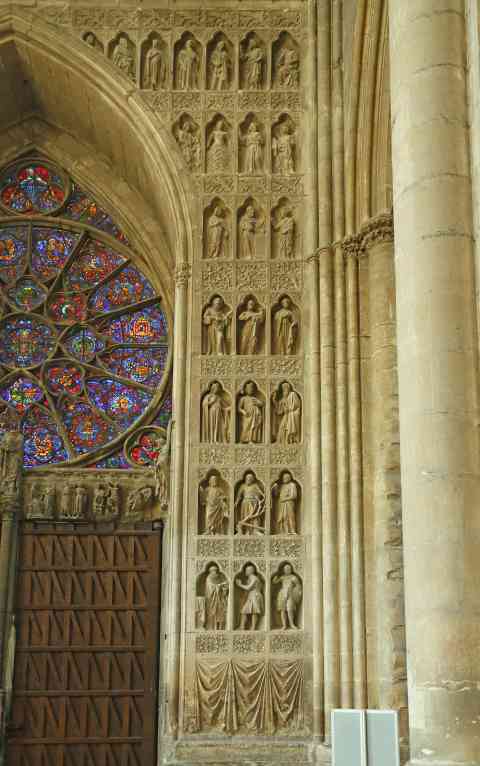 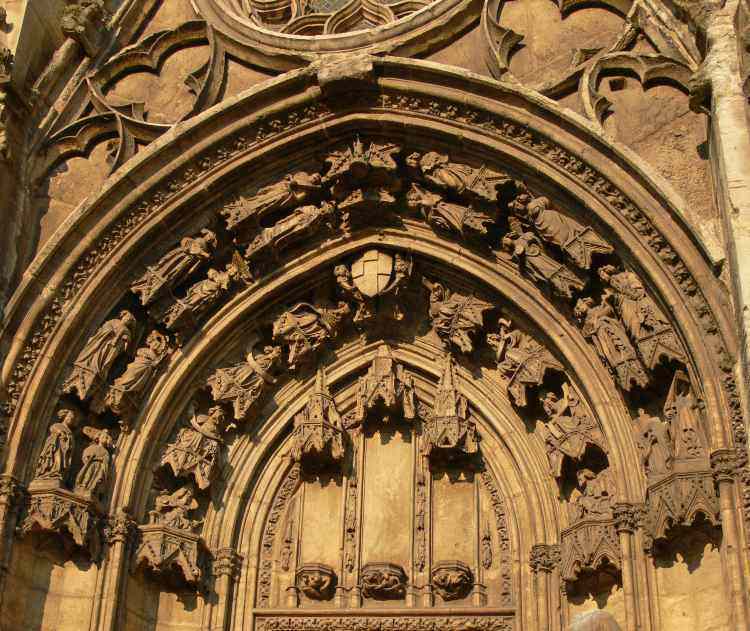 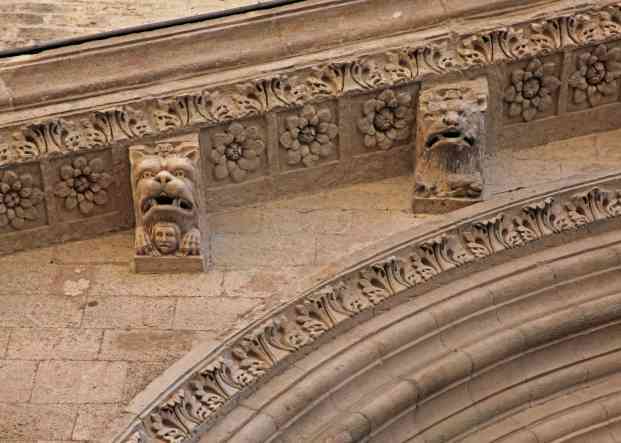 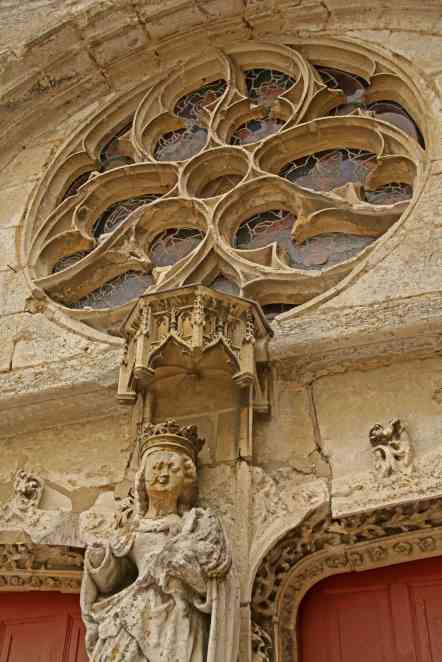 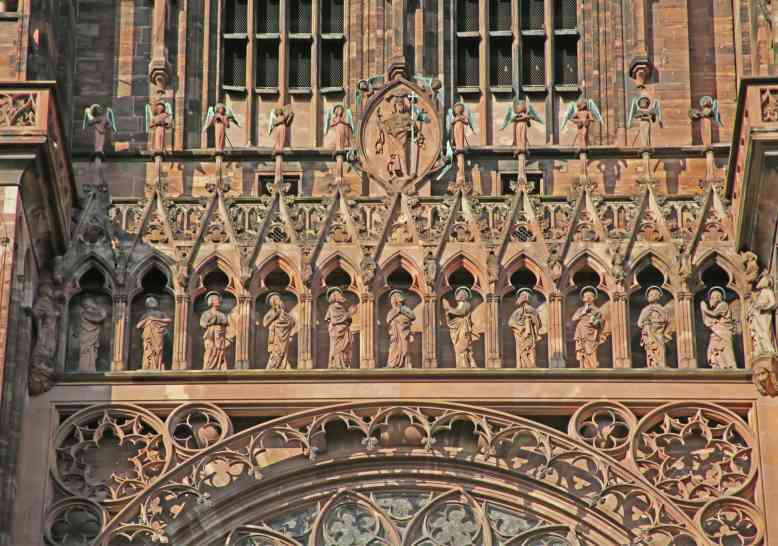 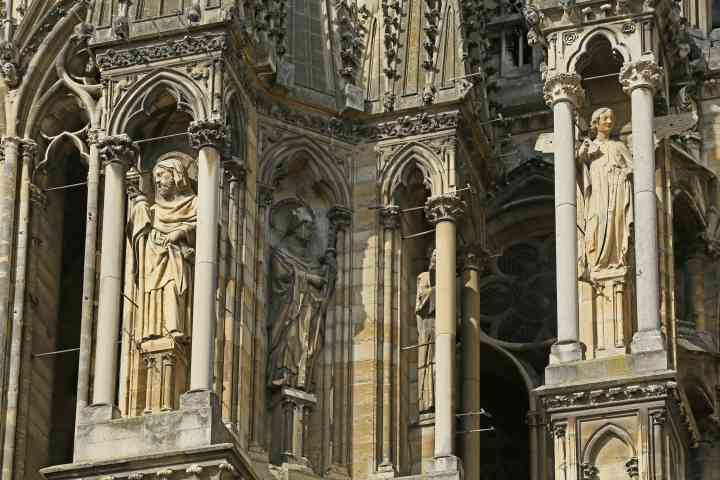 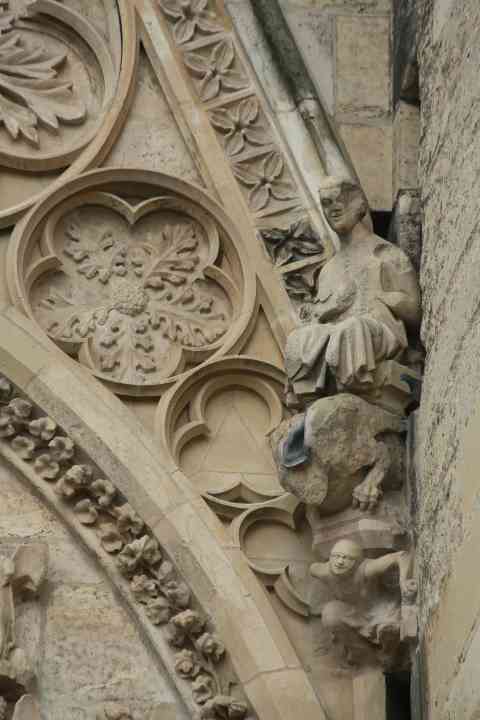 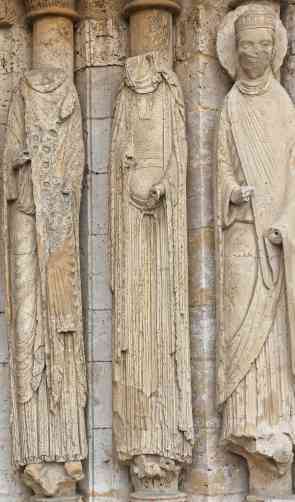 France Reims Cathedral West façade, left door, right side - a figure with an urn - a River of Paradise? 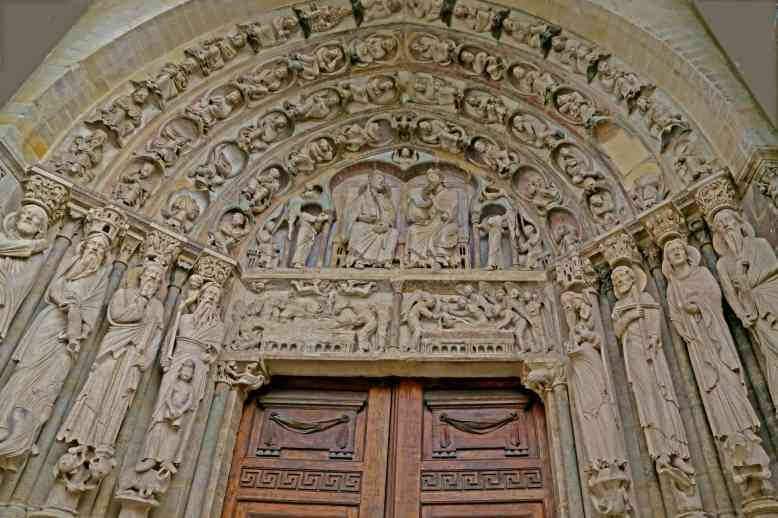 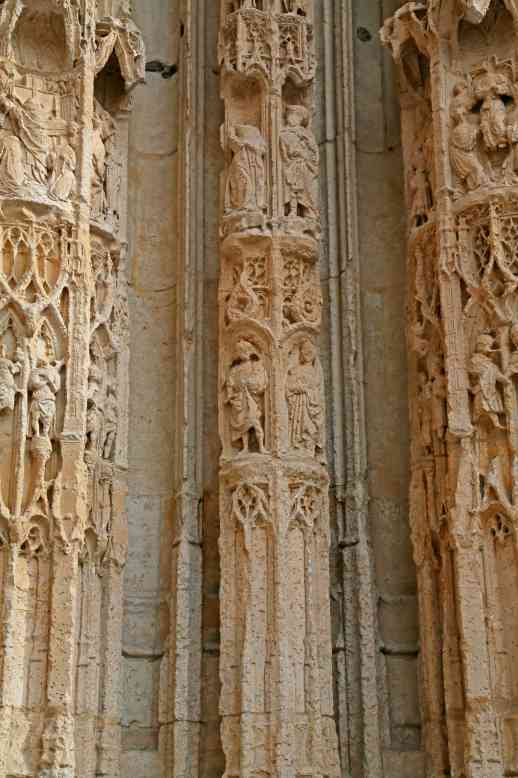 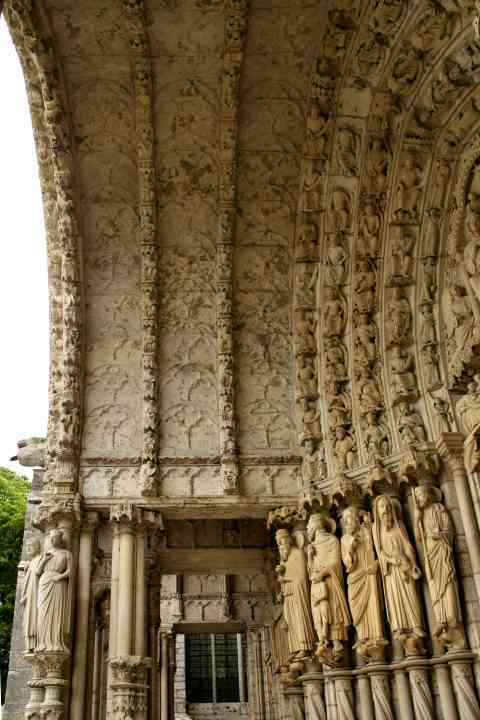 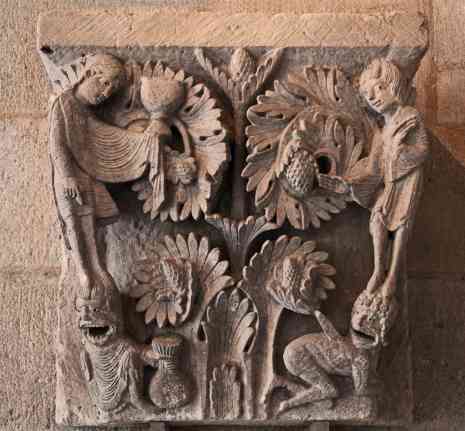 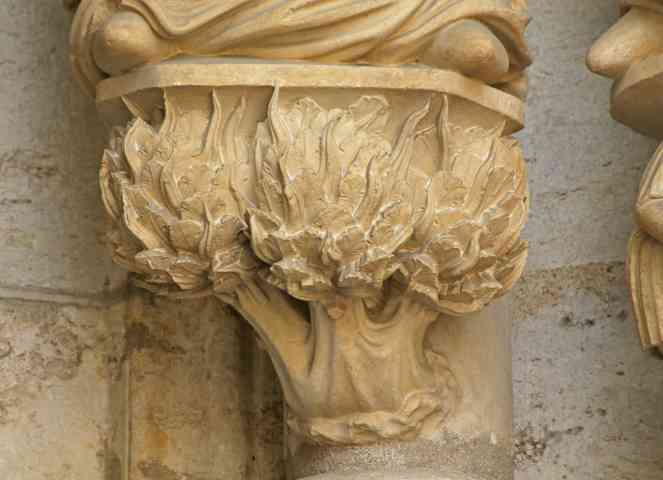 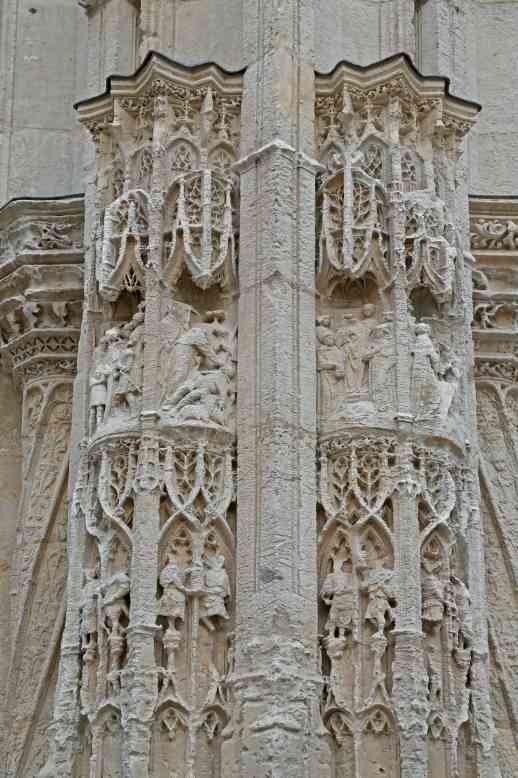 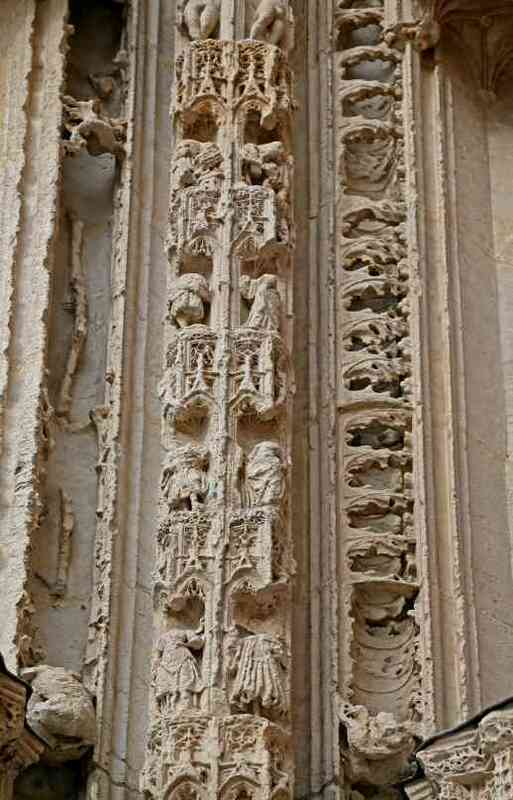 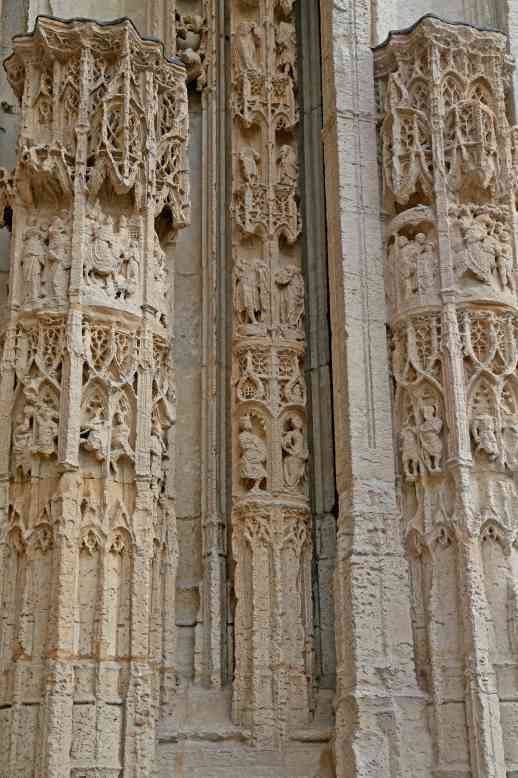 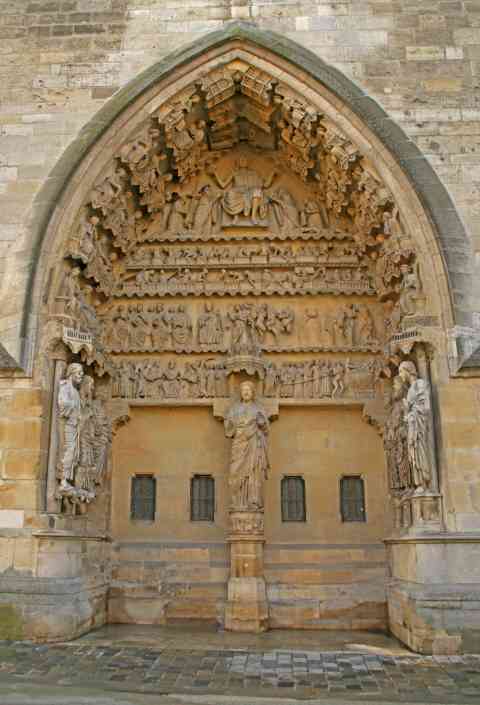 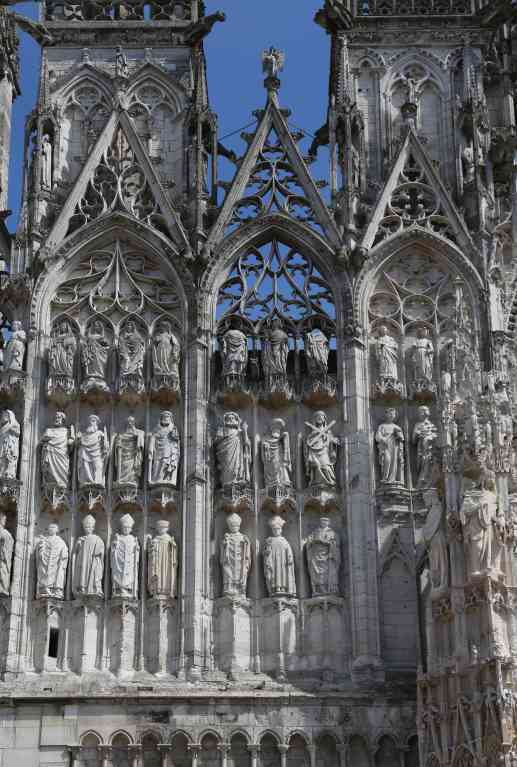 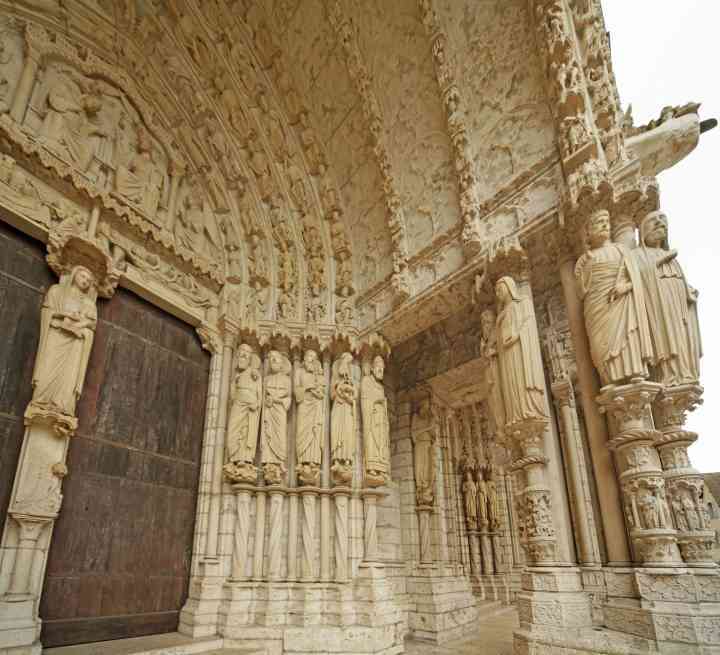 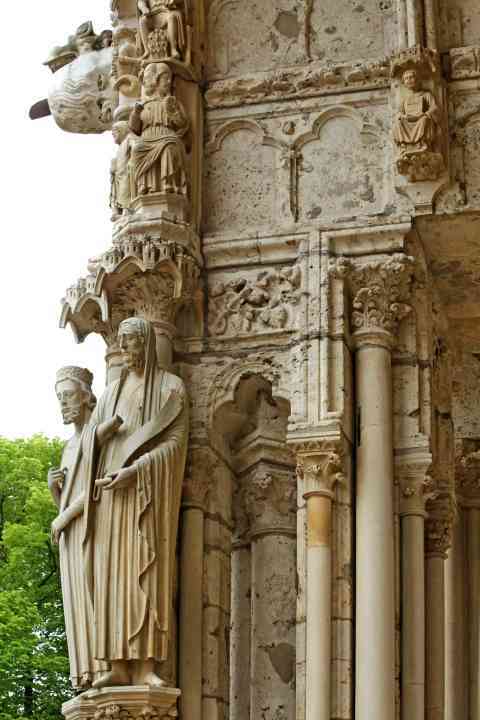 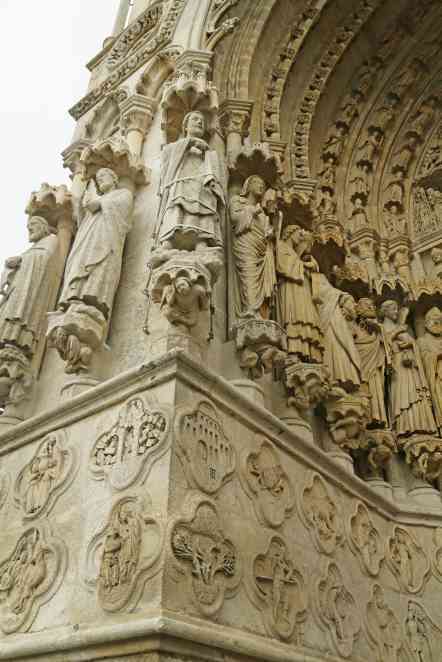 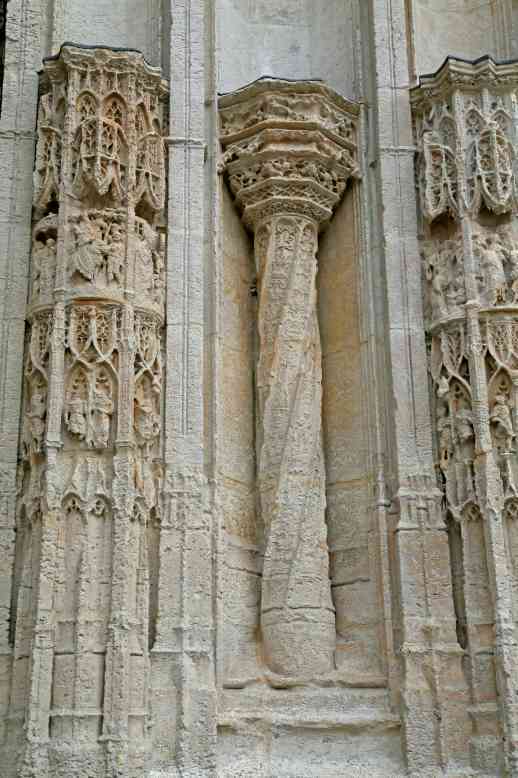 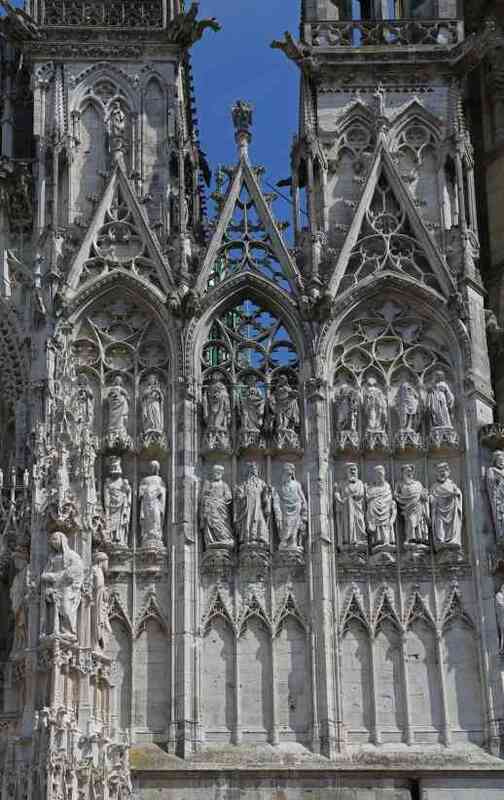 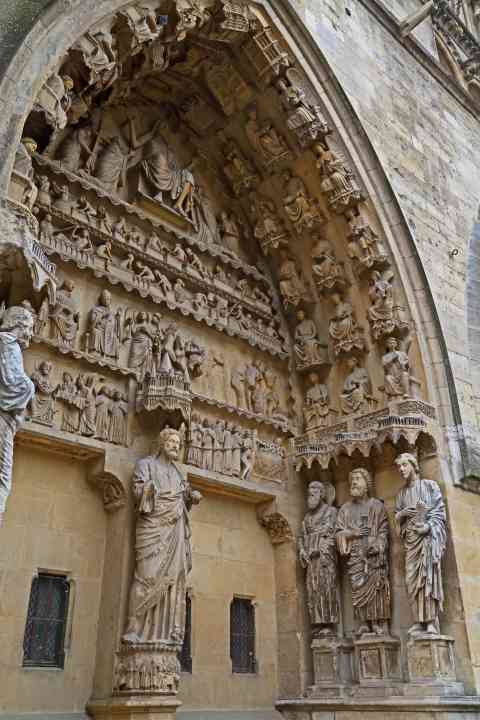 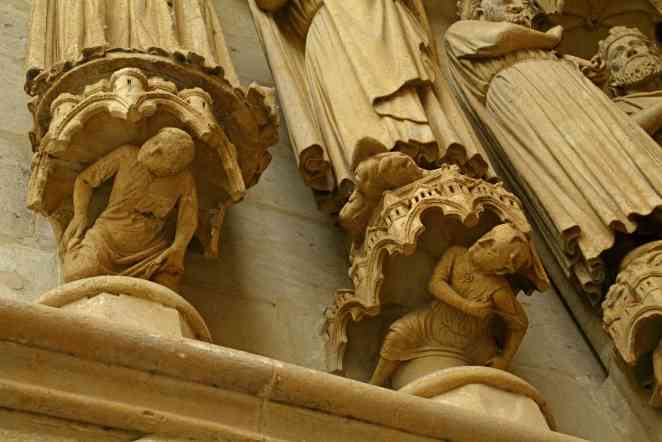 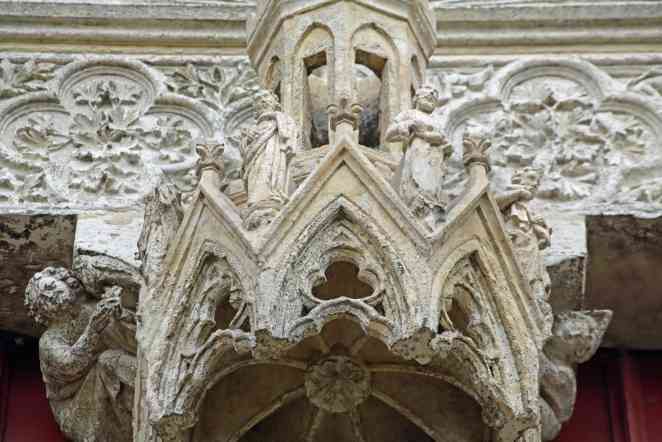 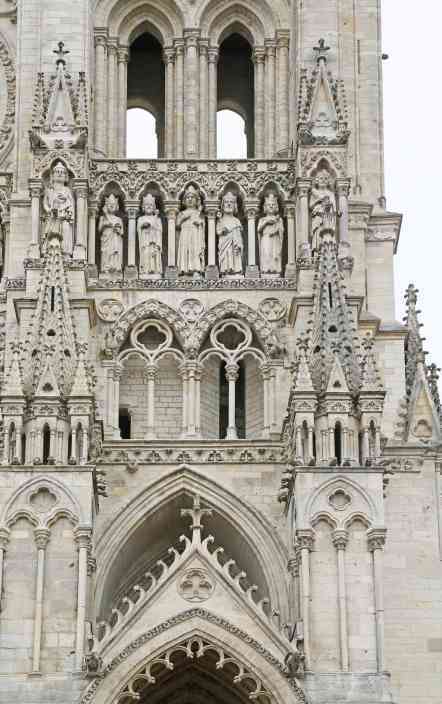 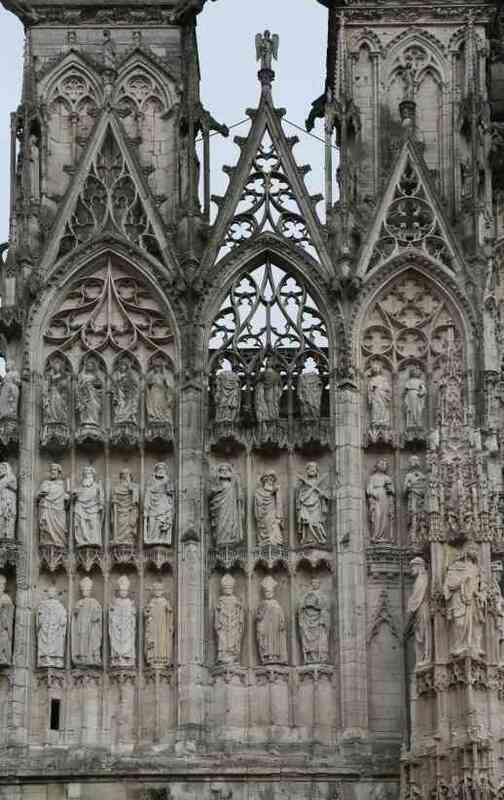 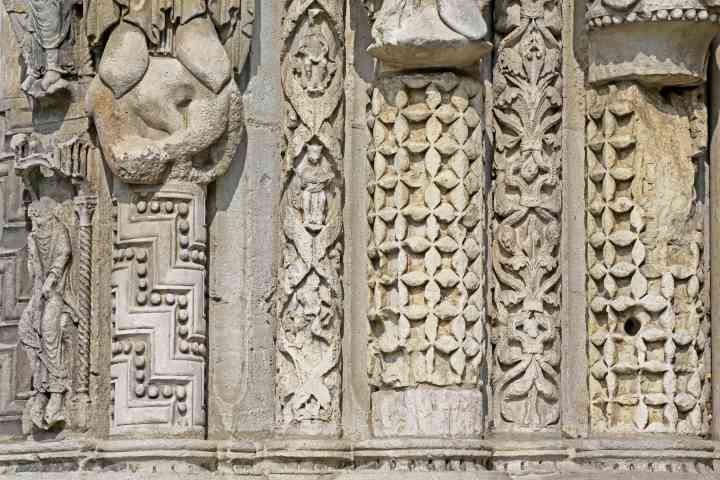 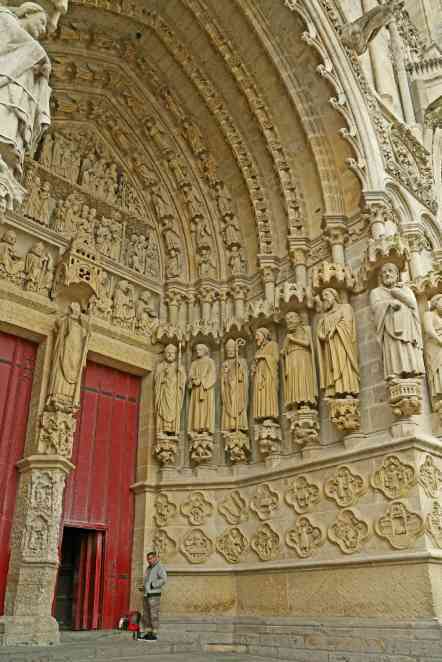 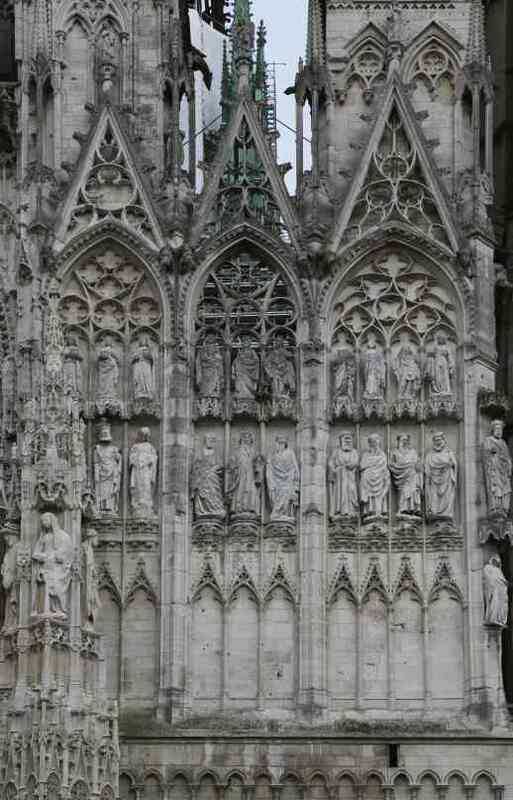 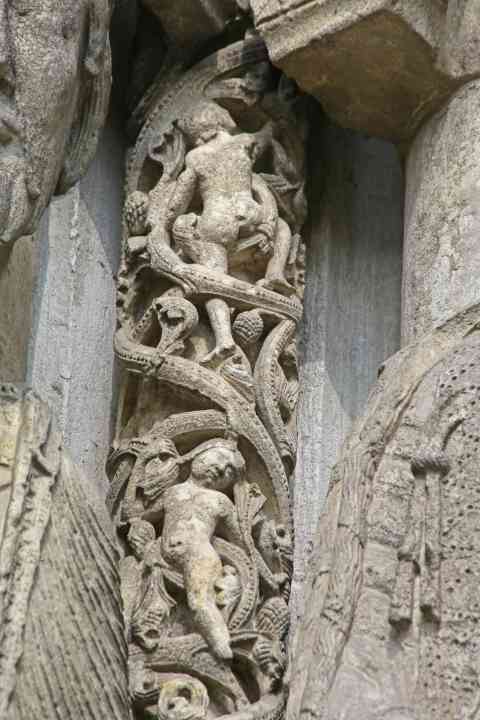 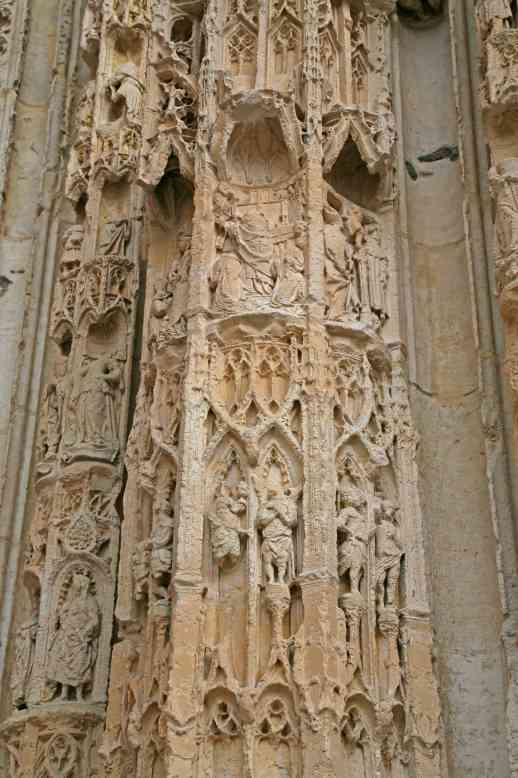 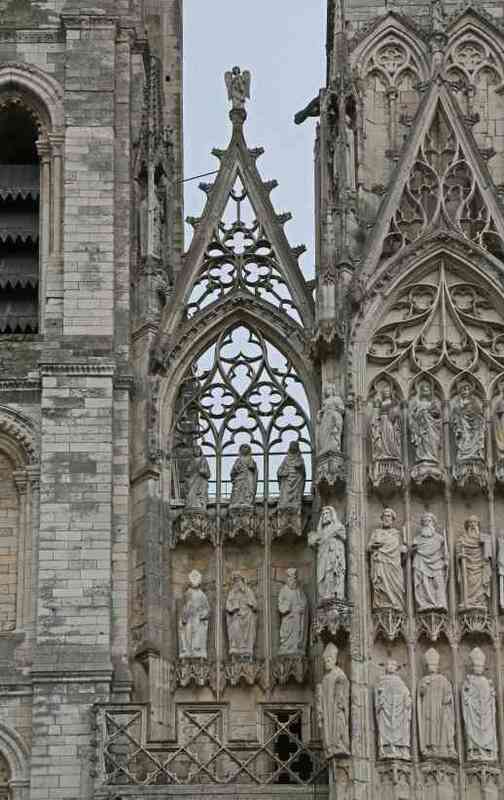 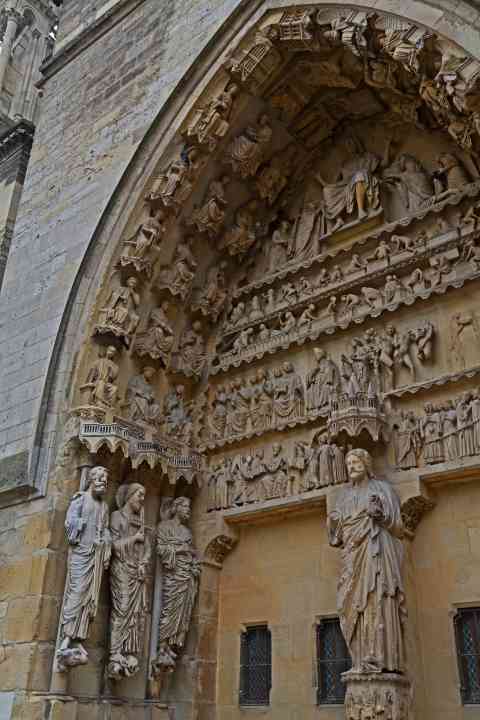 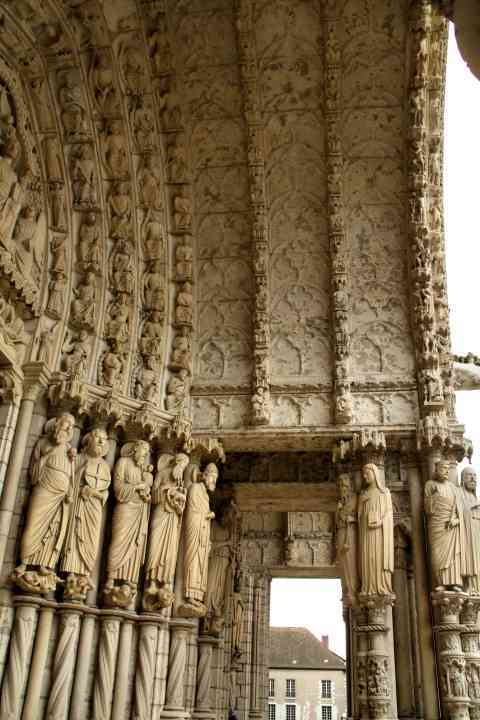 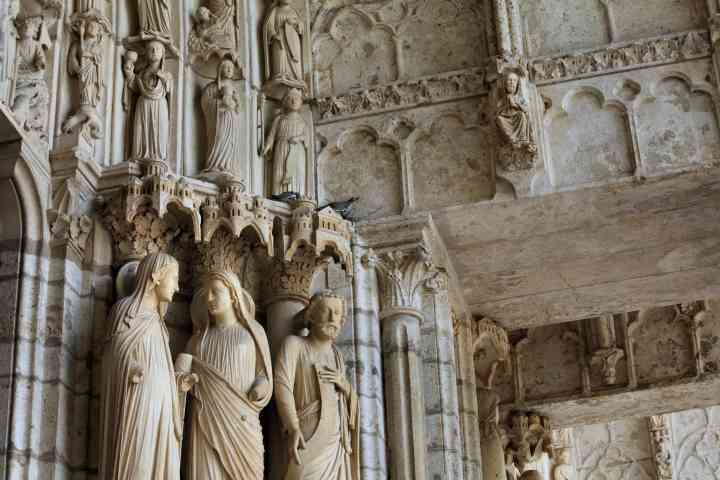 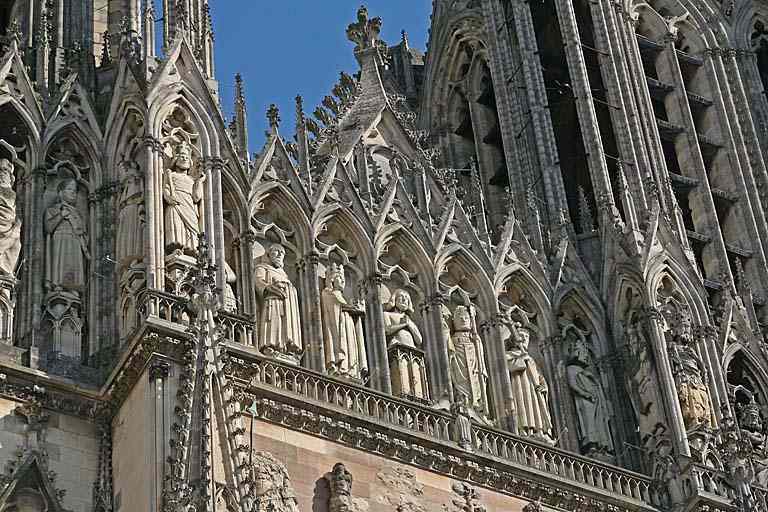 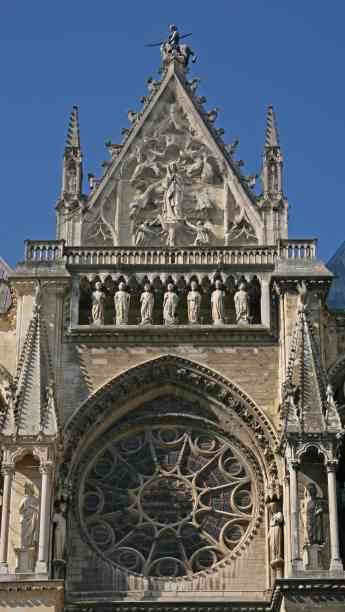 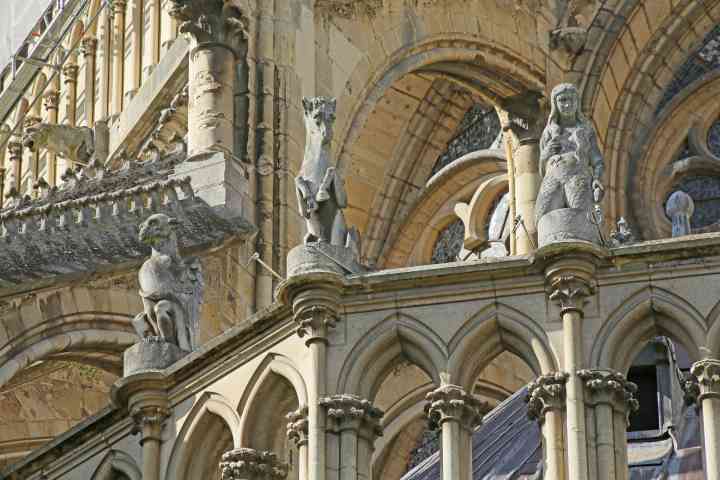 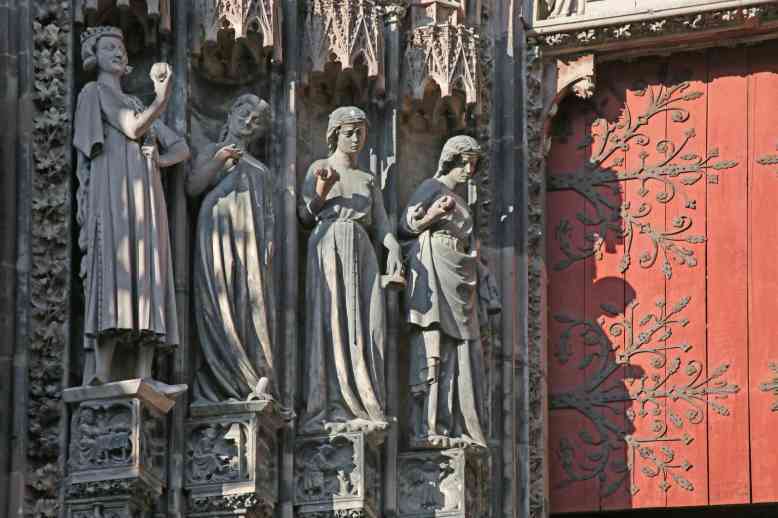 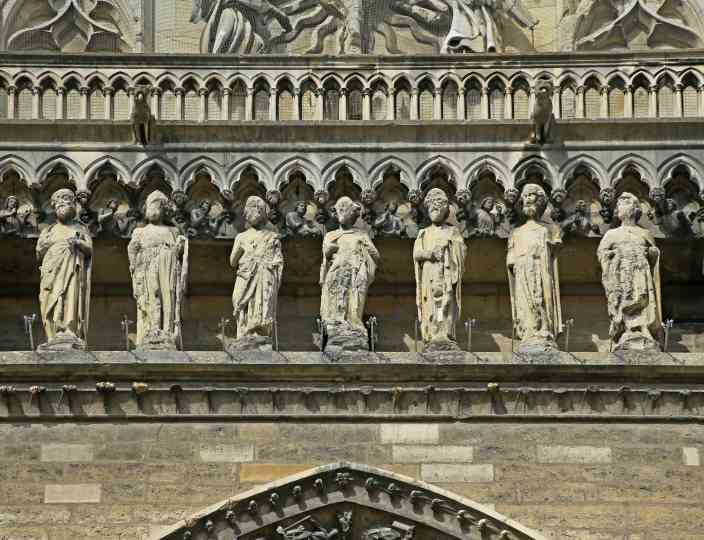 France Reims Cathedral West façade, left door, extreme left figure with an urn - a River of Paradise? 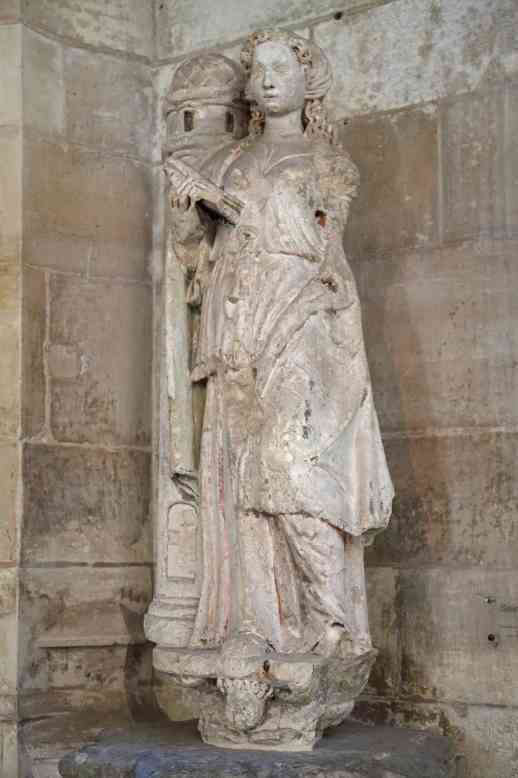 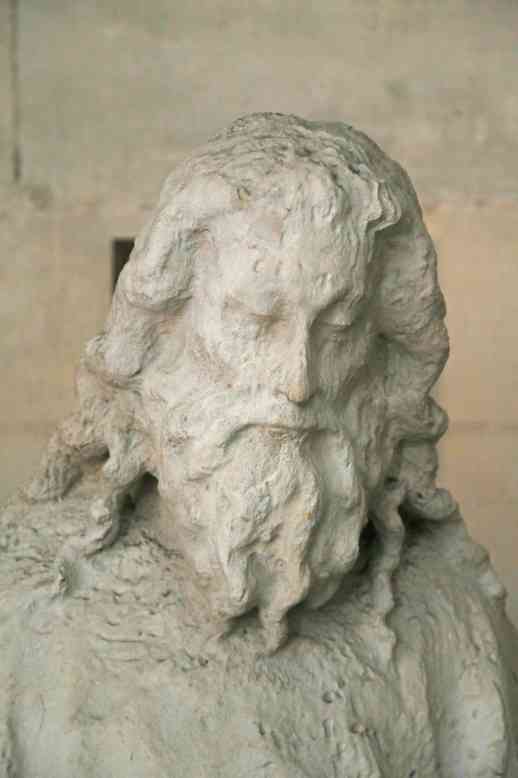 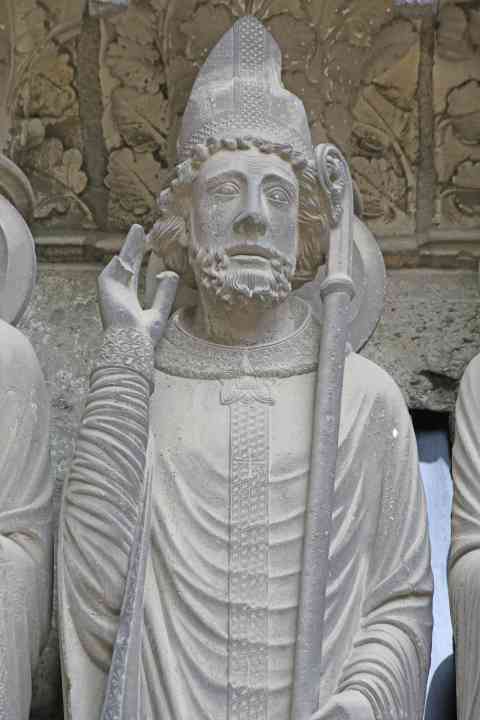 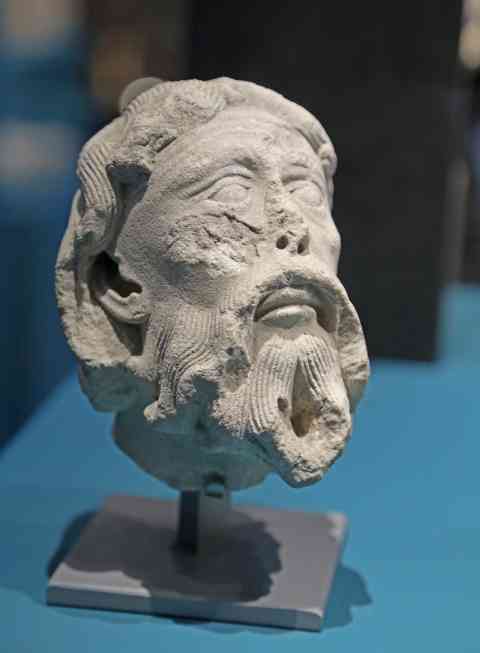 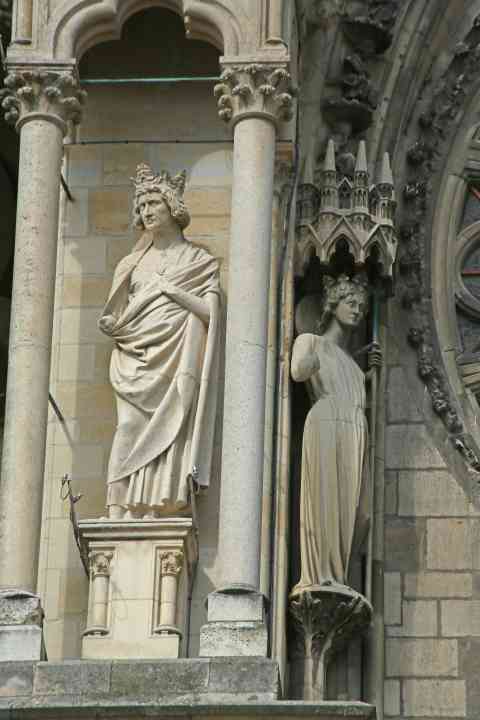 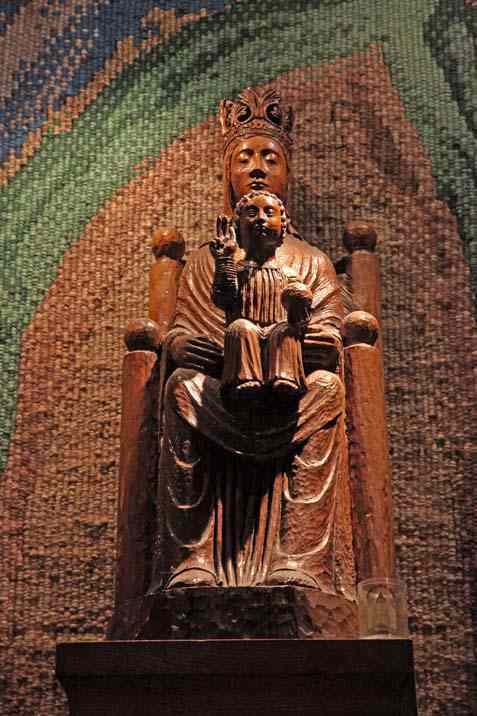 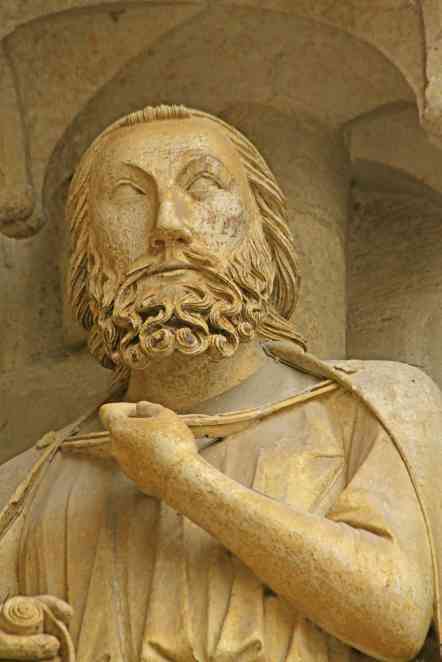 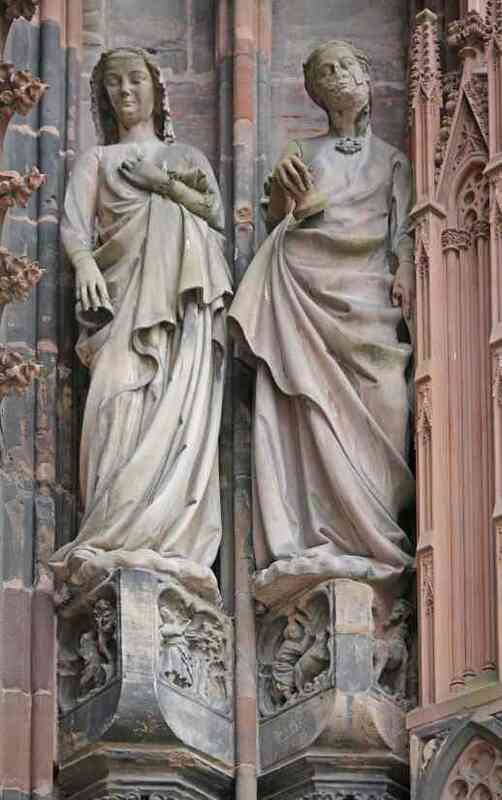 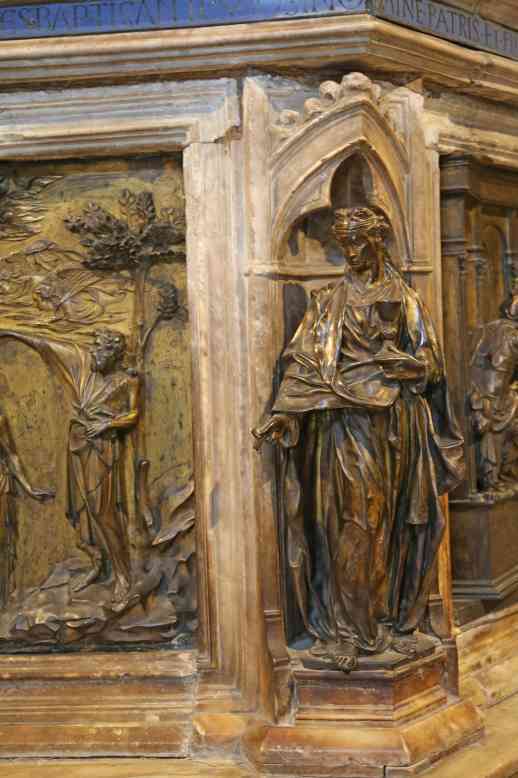 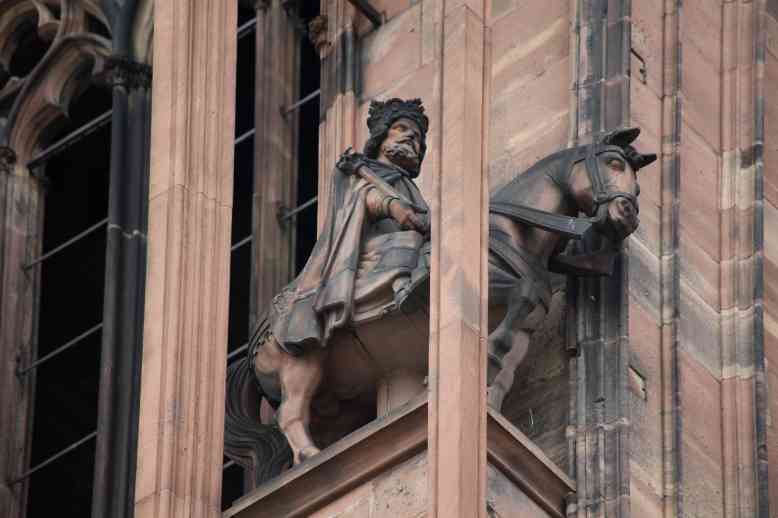 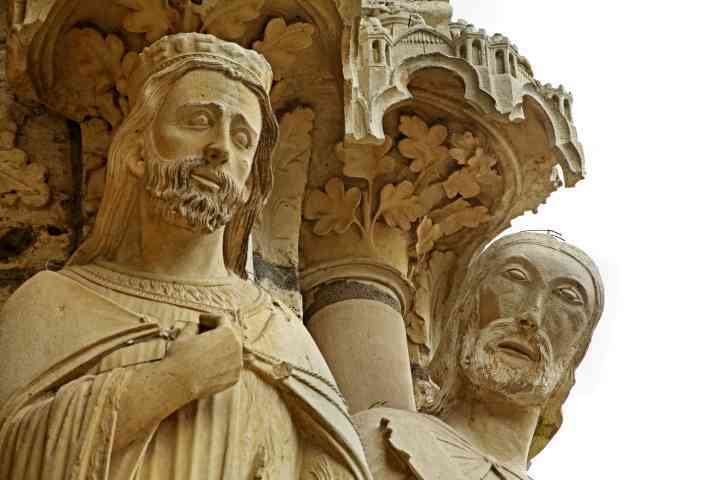 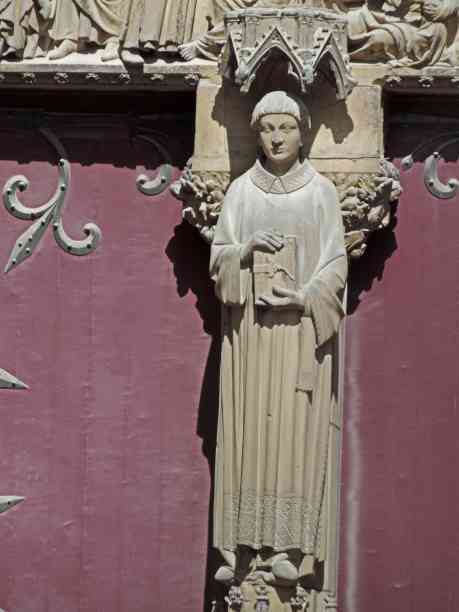 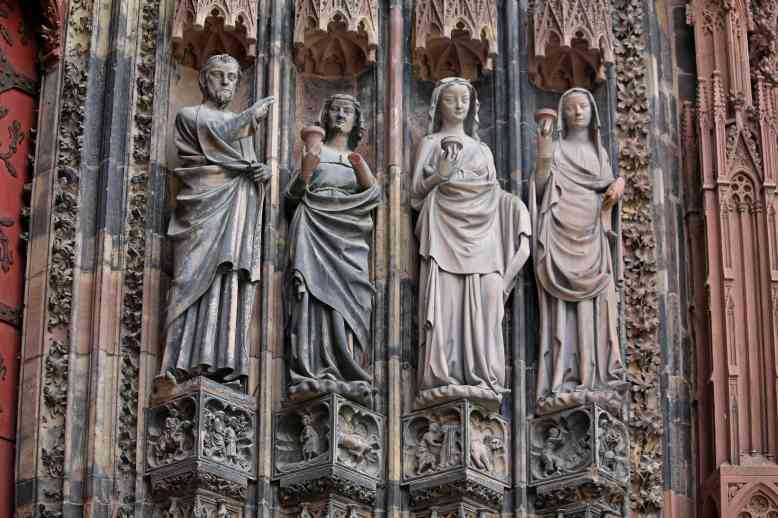 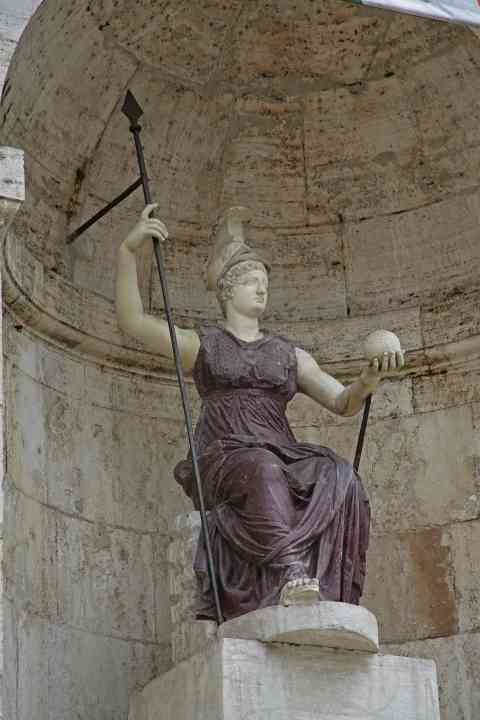 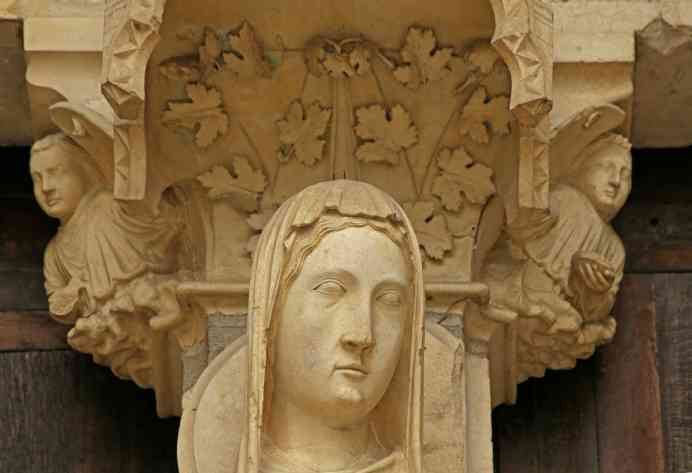 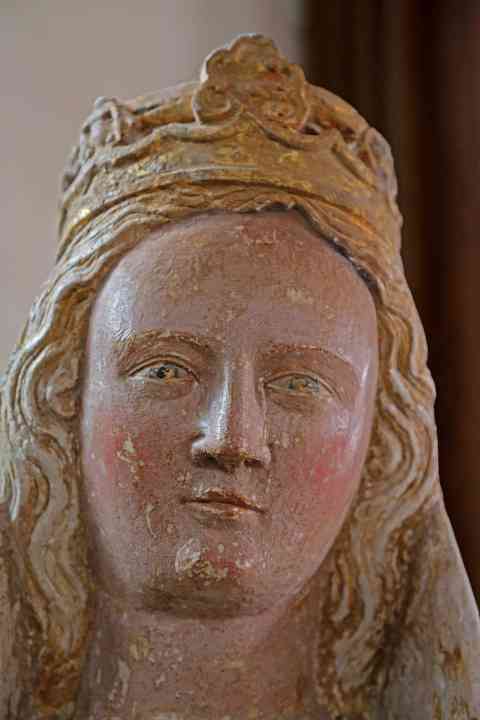 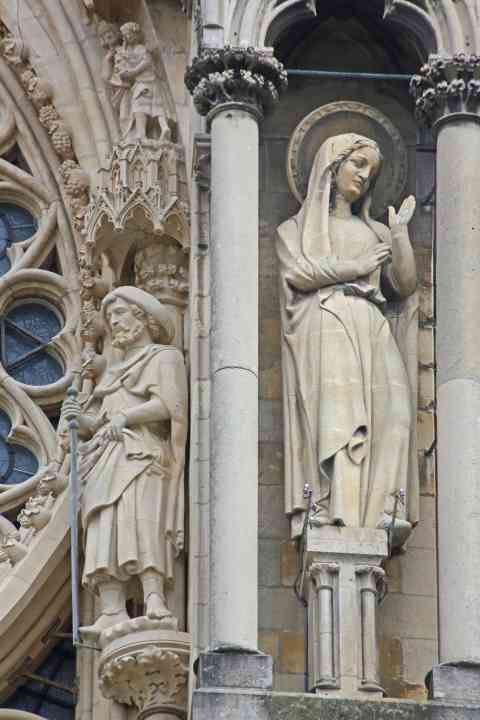 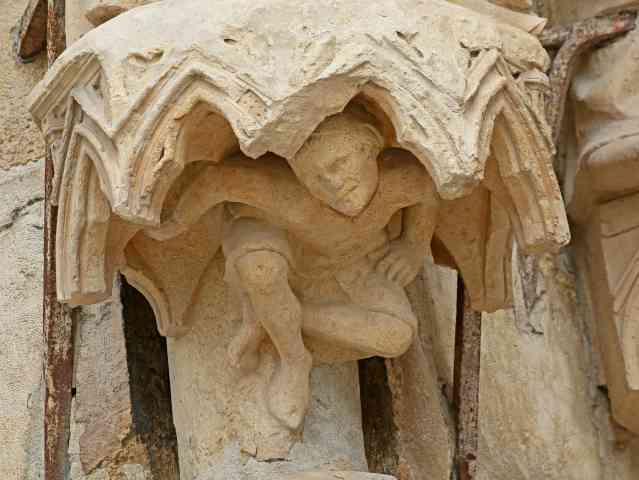 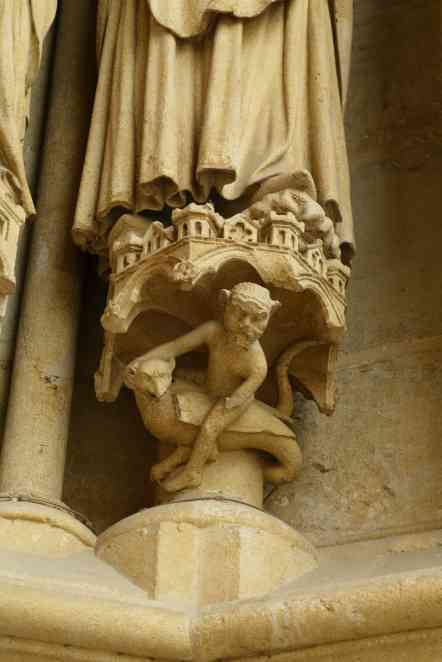 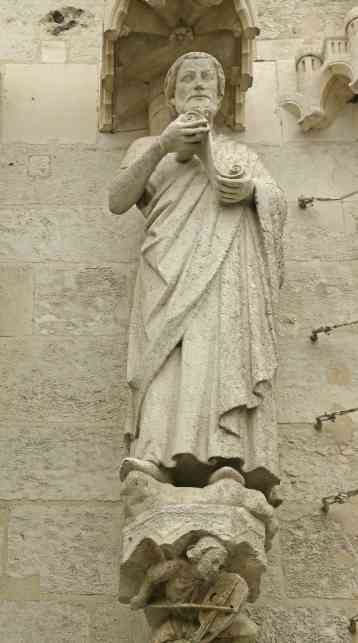 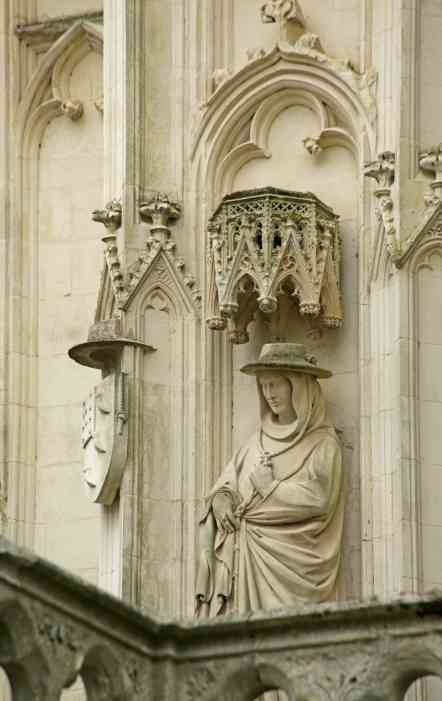 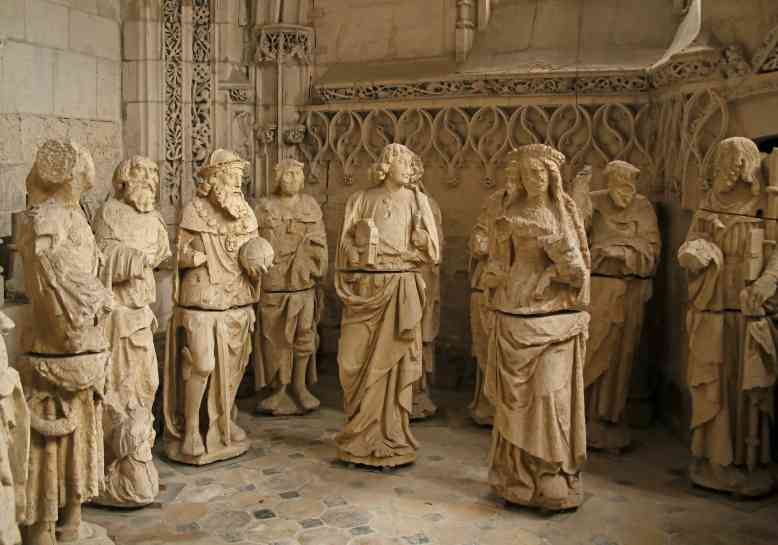 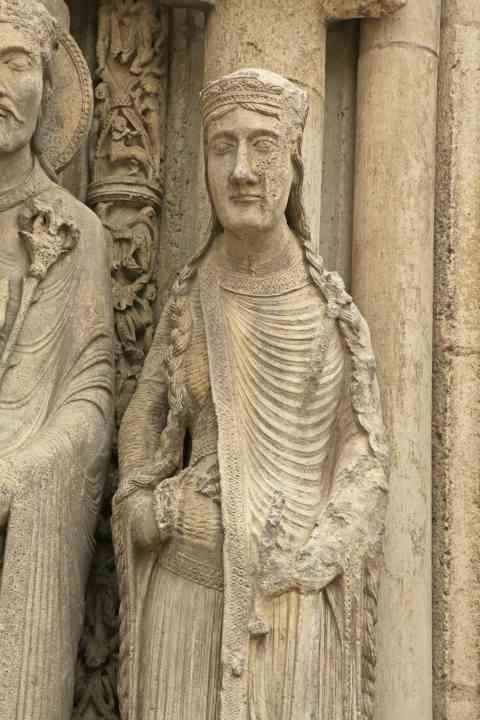 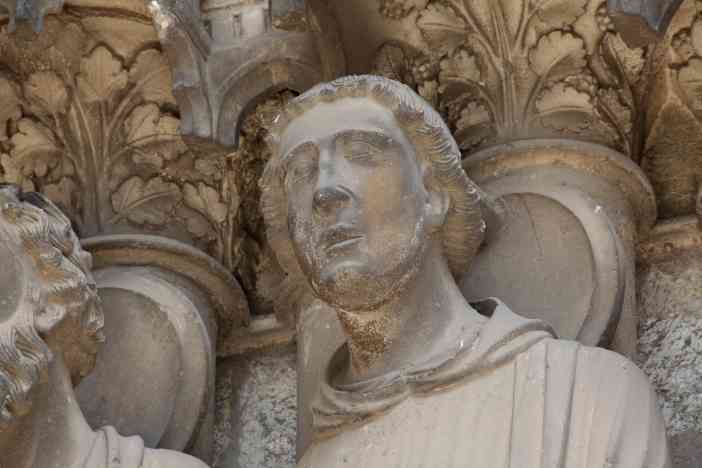 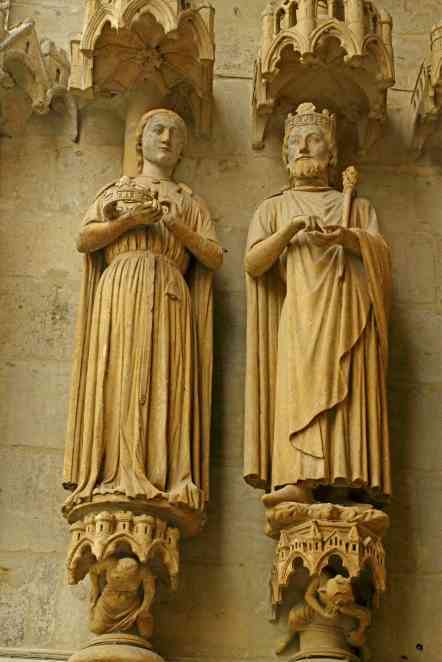 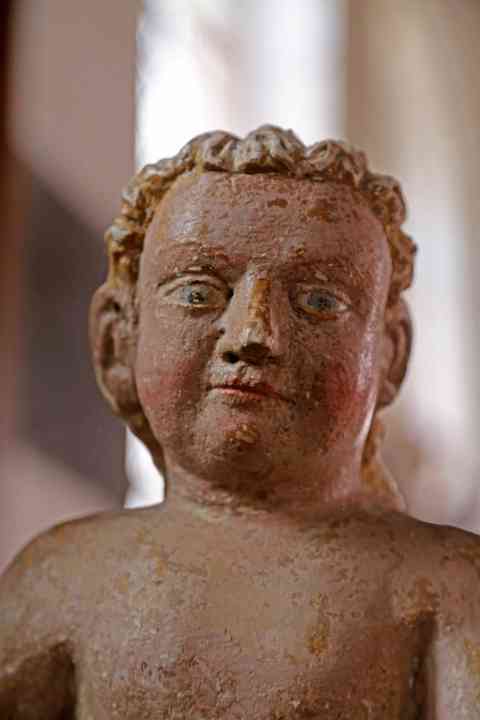 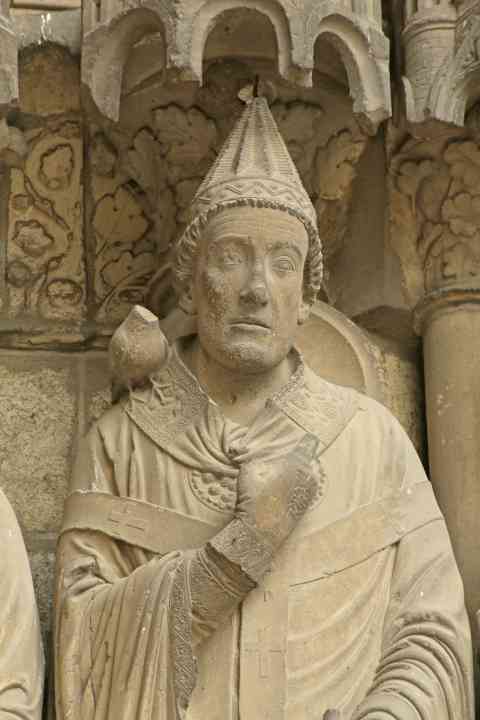 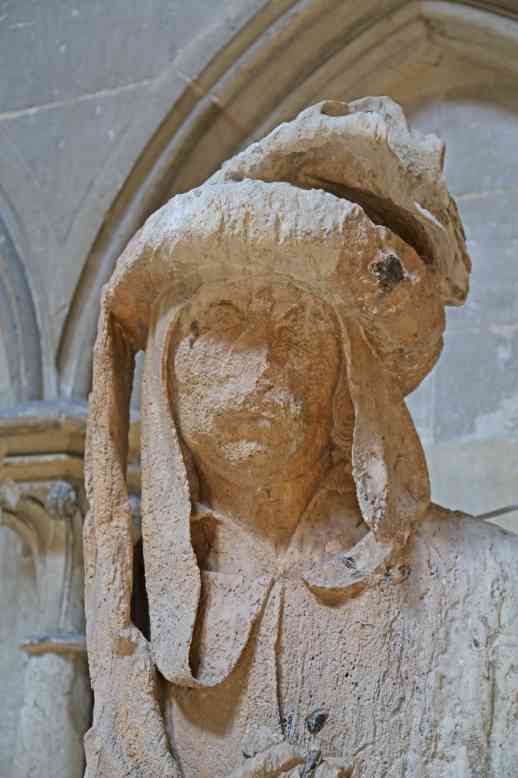 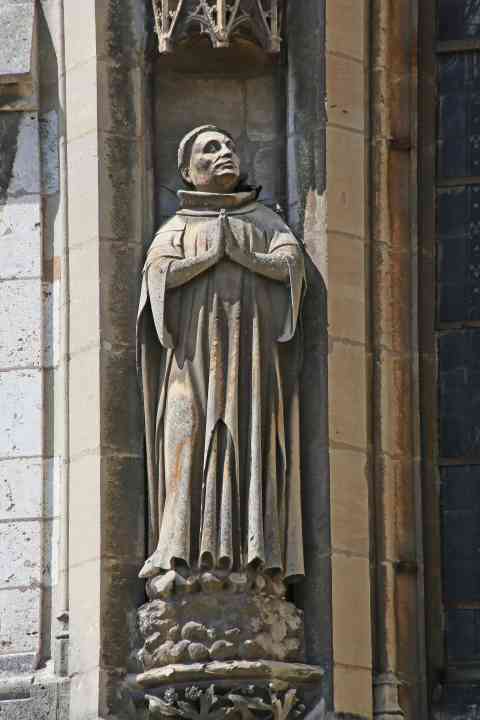 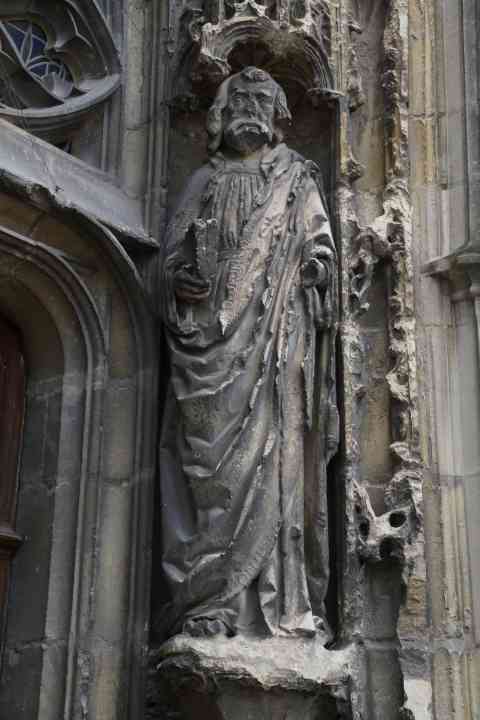 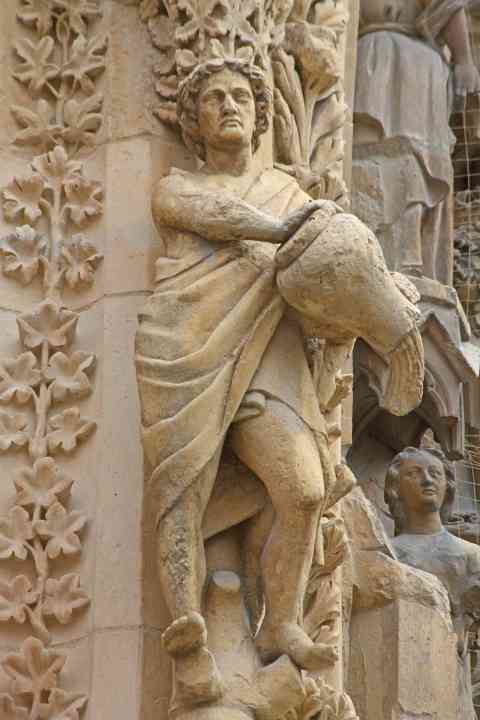 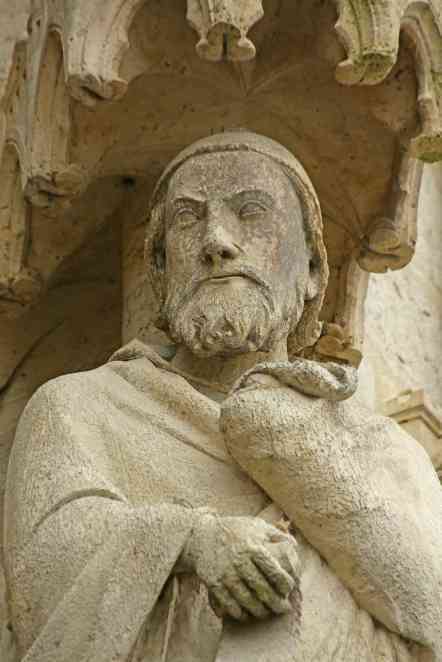 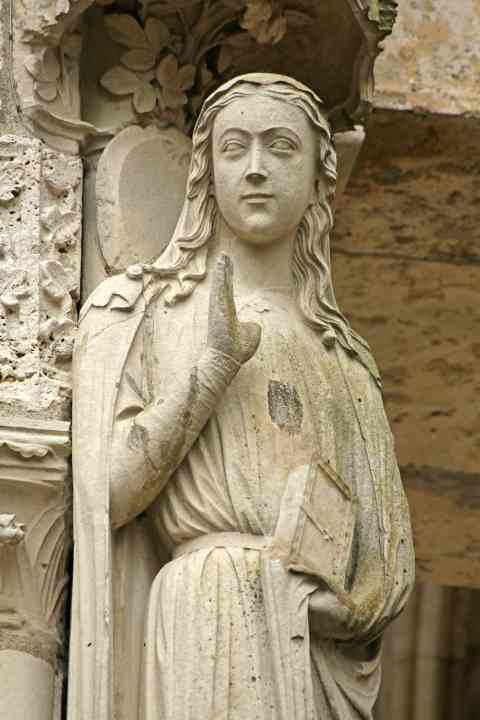 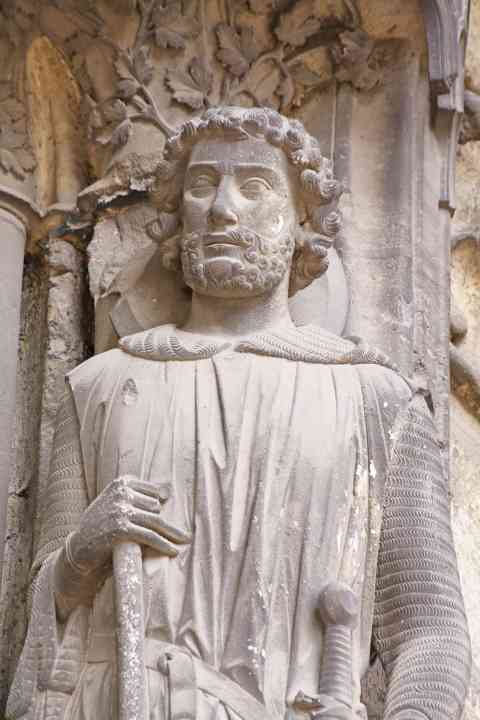 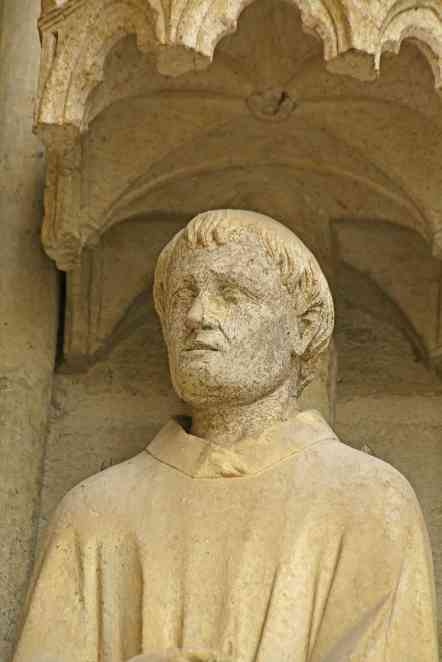 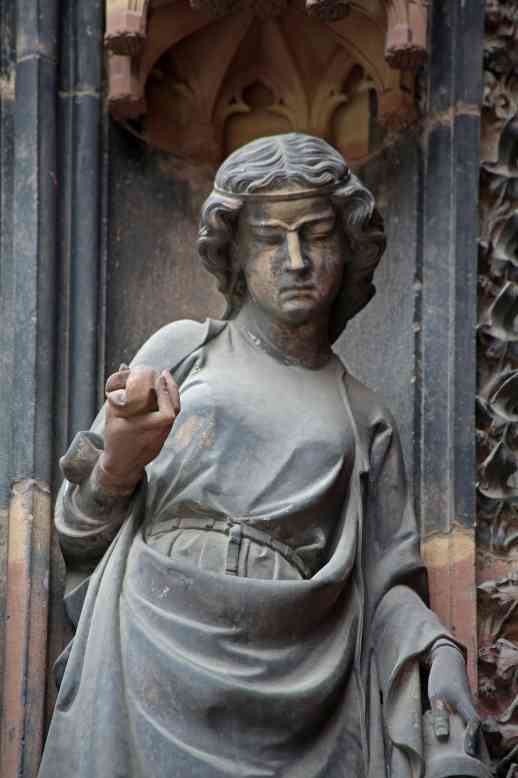 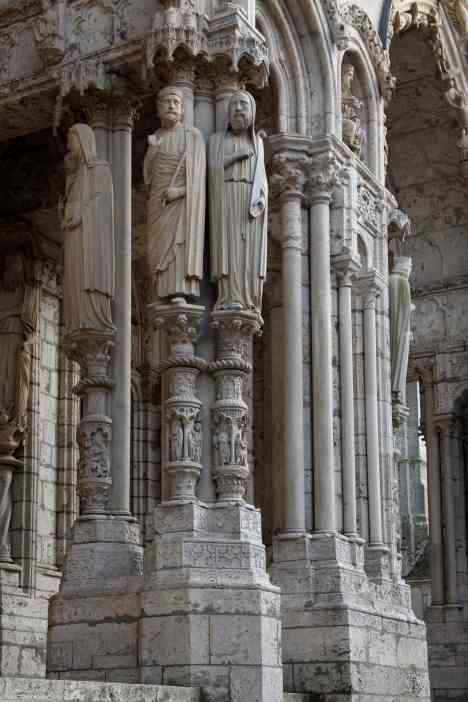 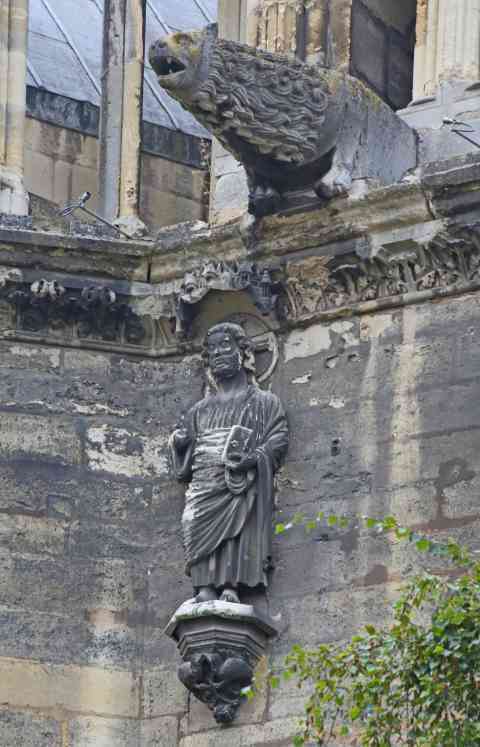 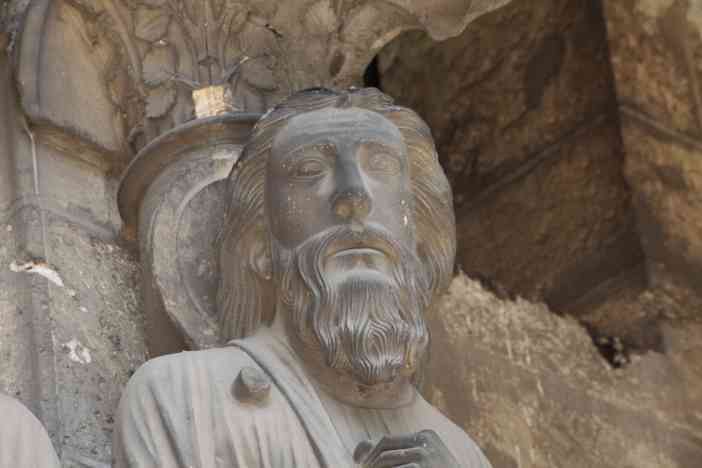 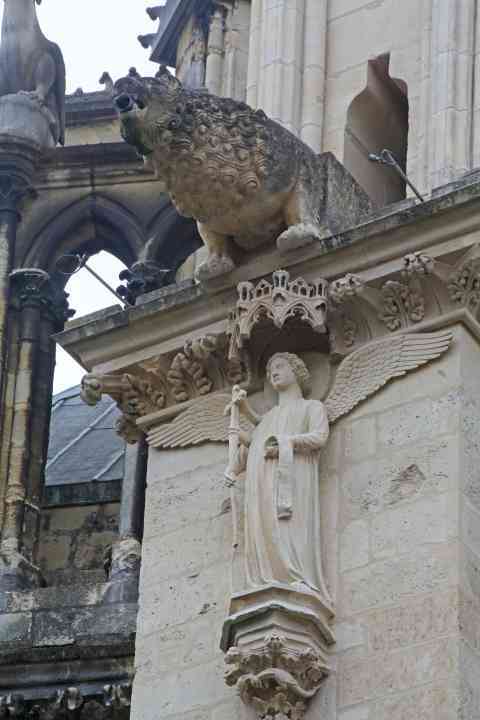 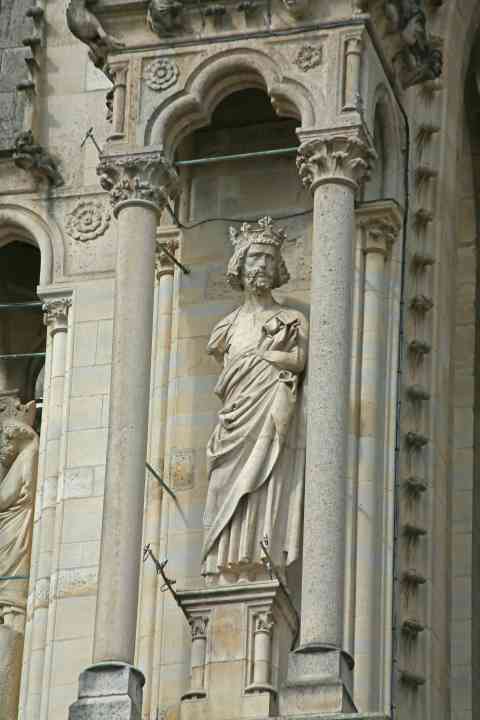 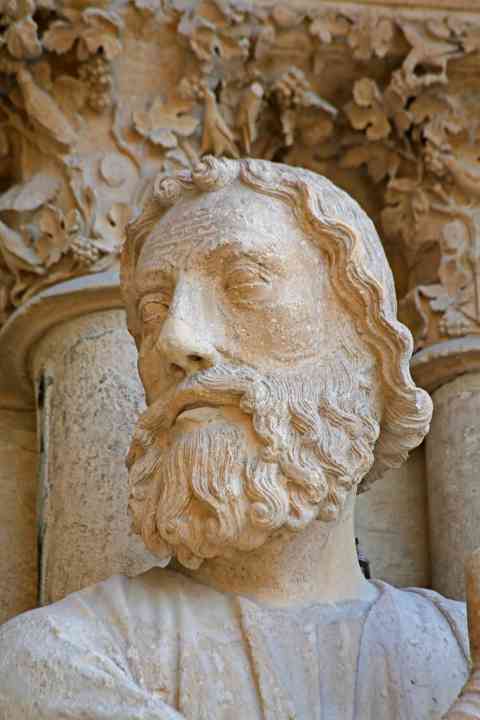 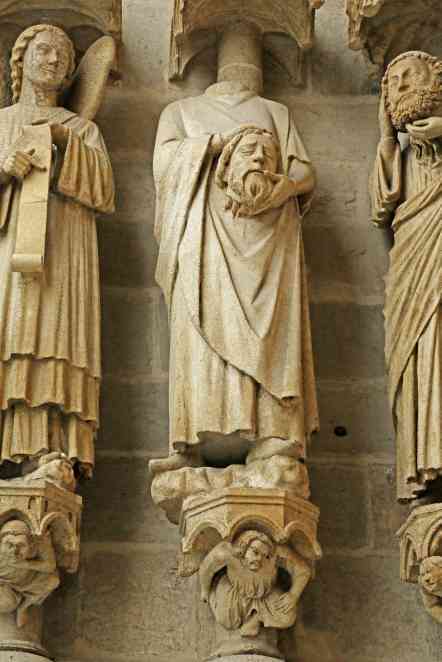 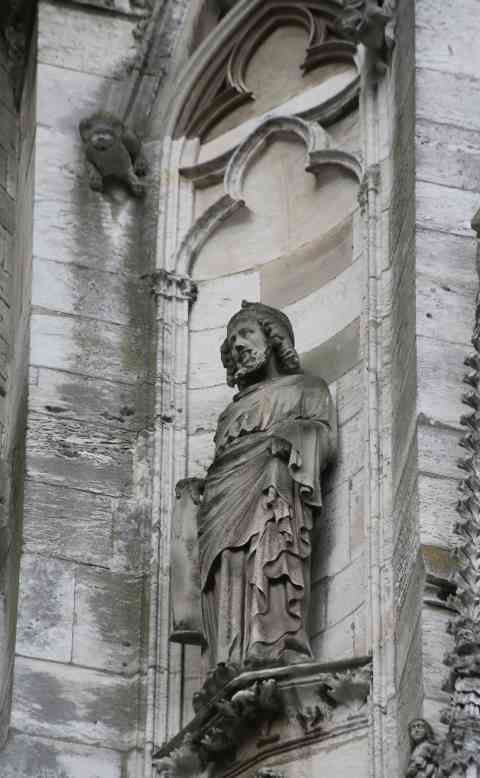 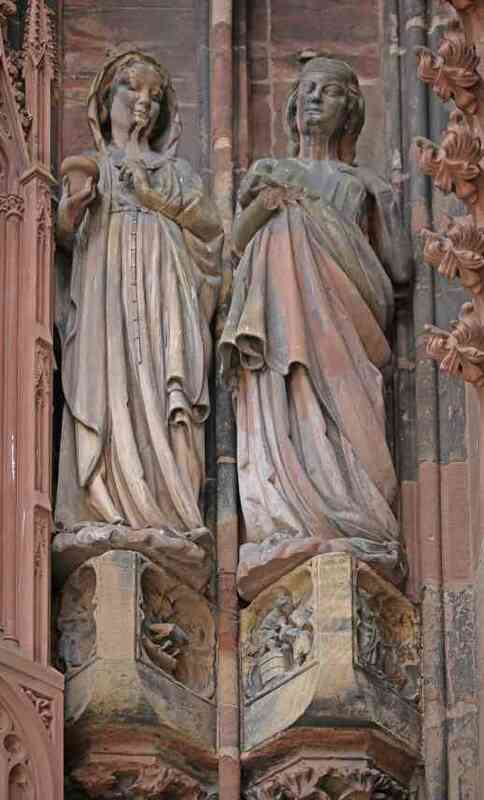 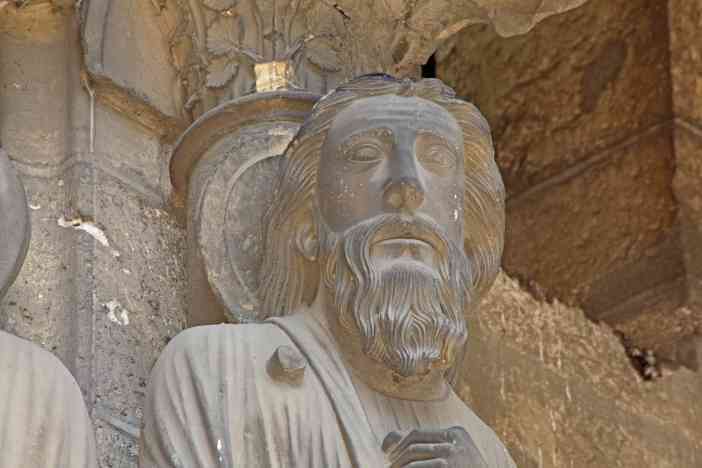 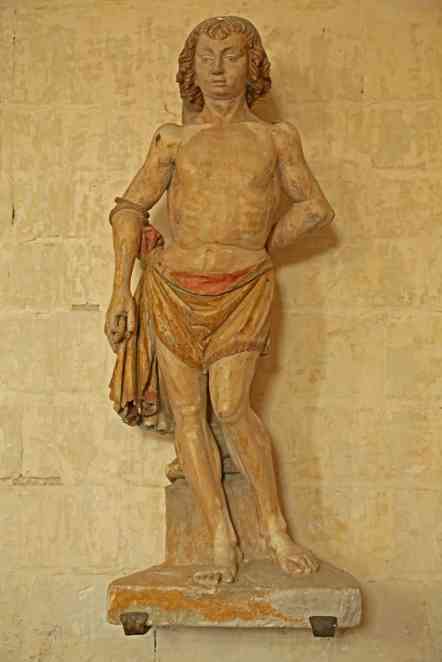 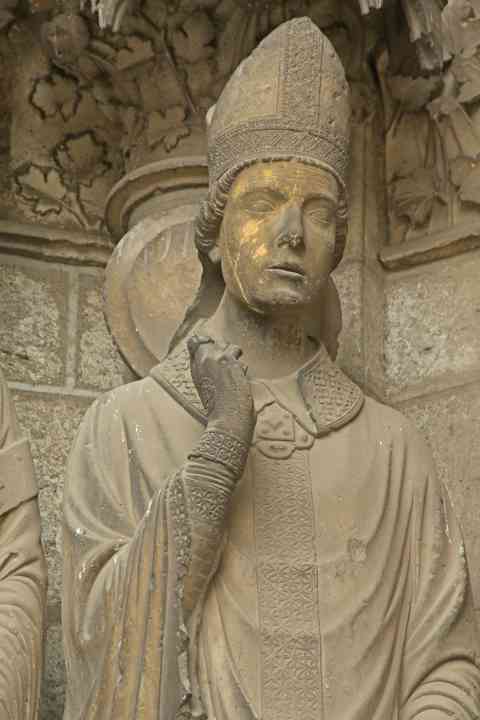 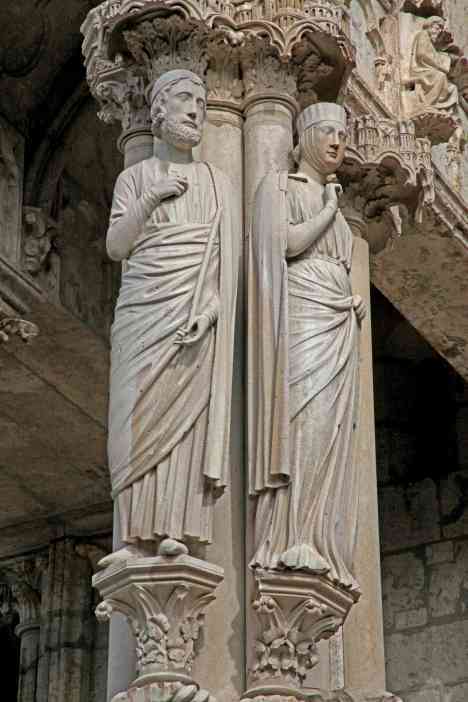 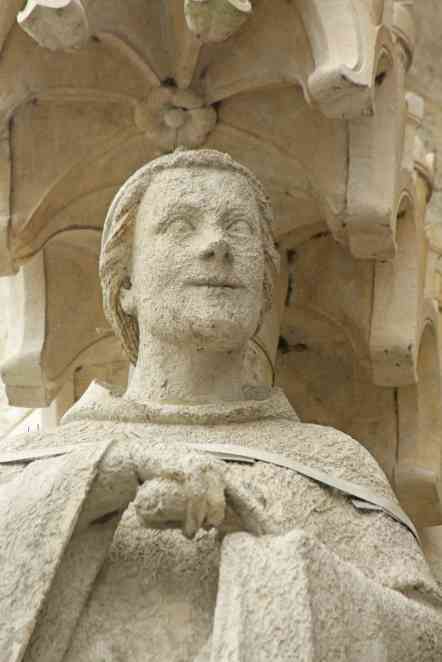 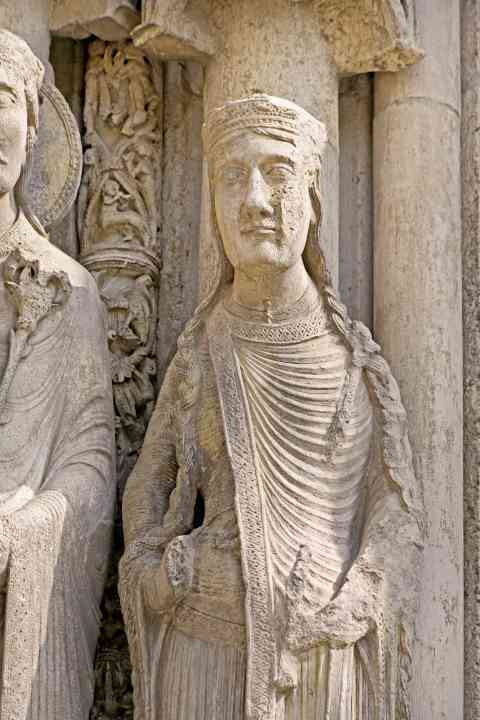 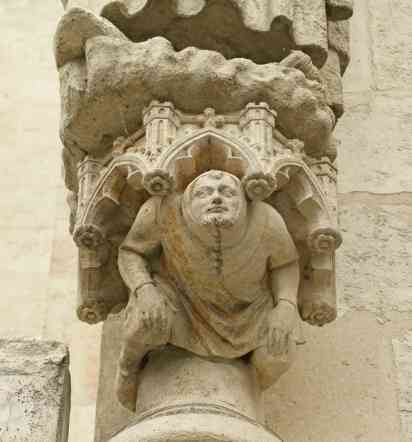 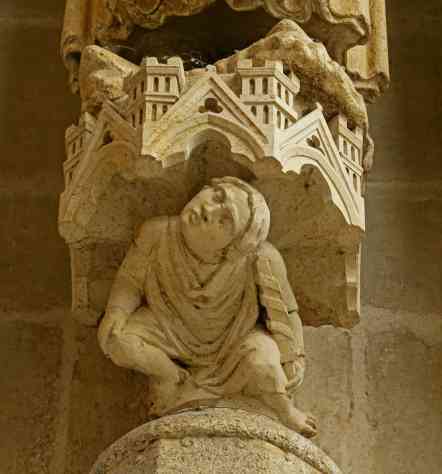 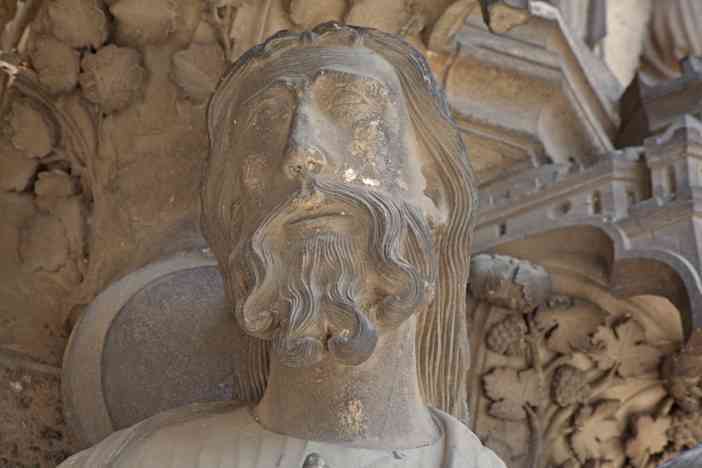 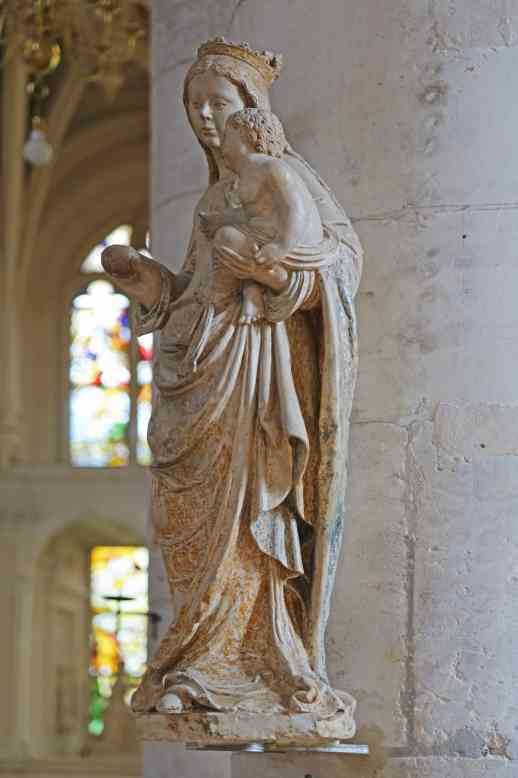 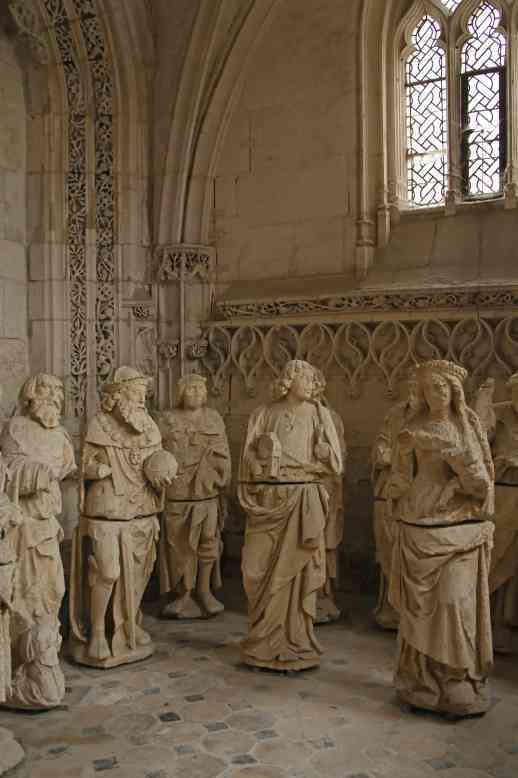 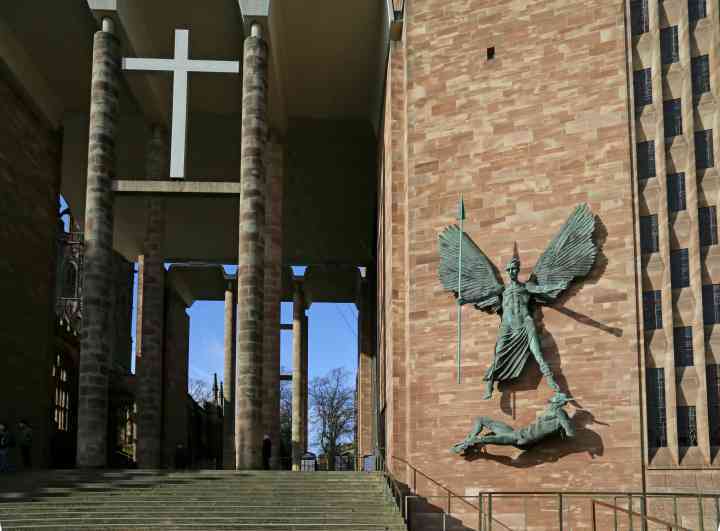 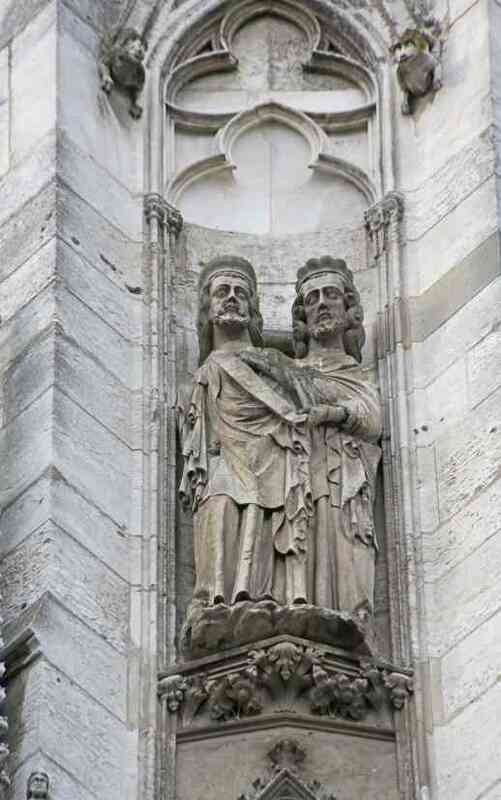 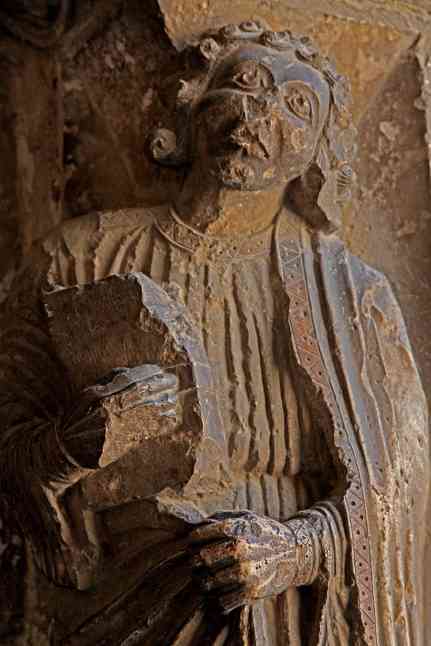 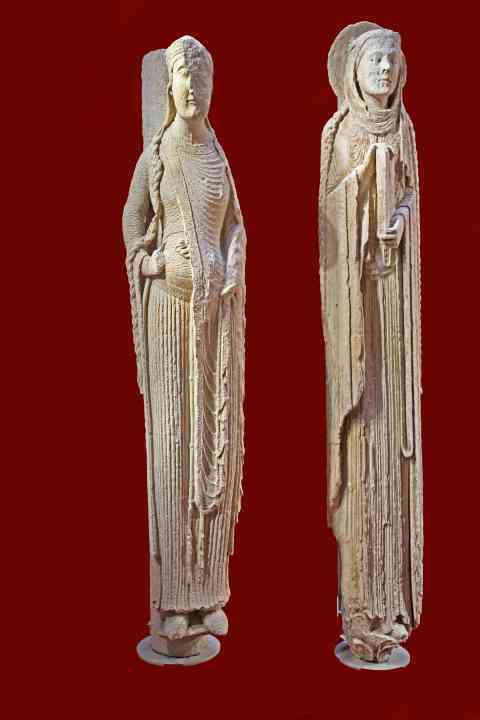 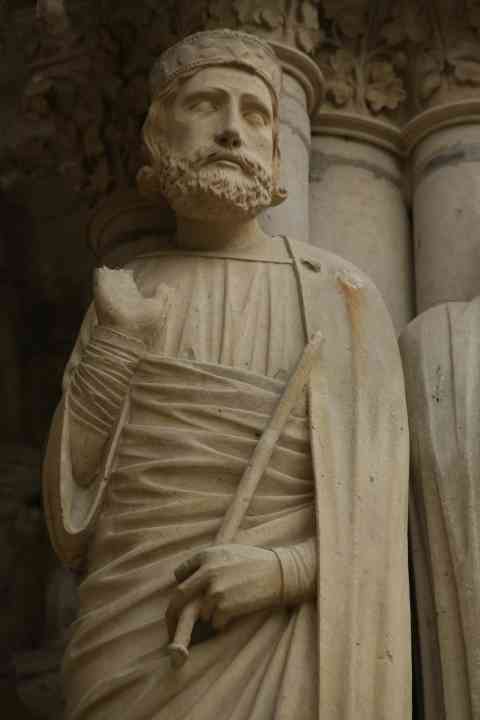 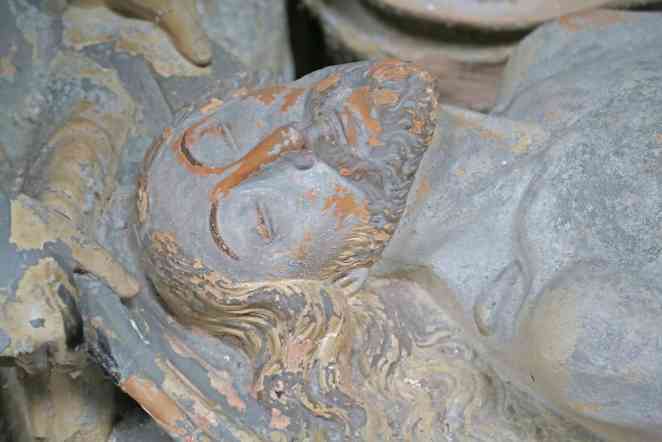 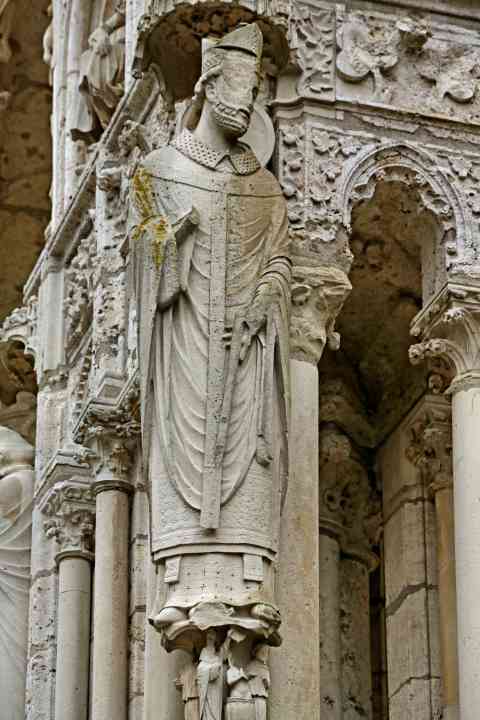 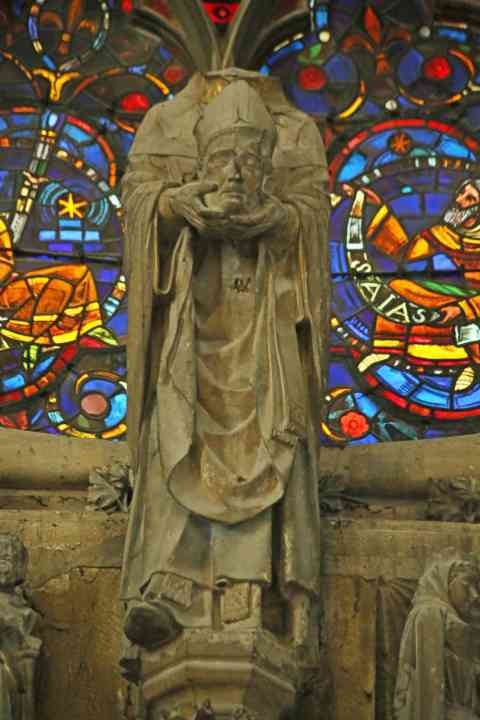 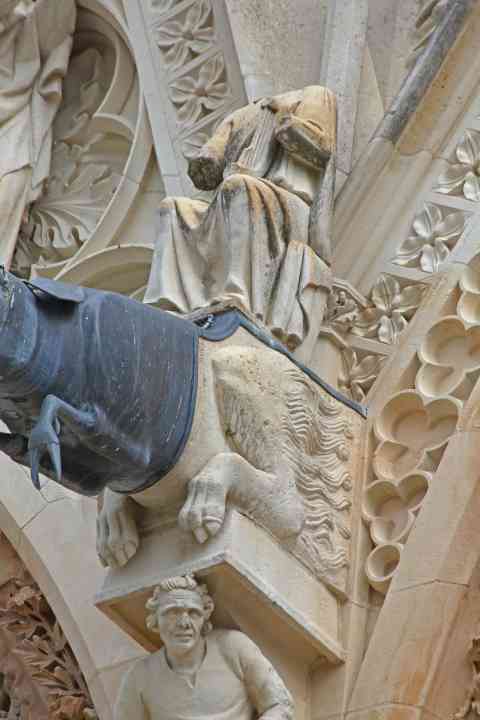 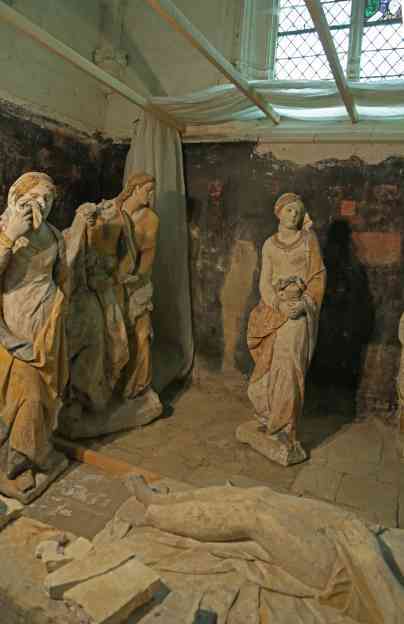 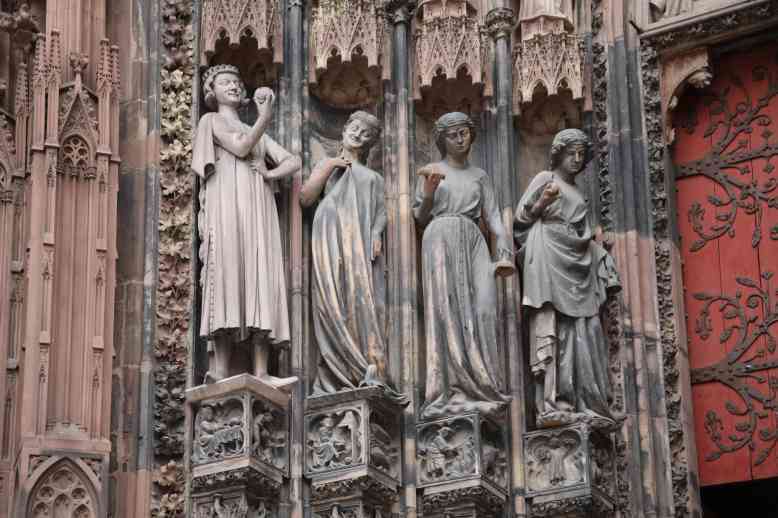 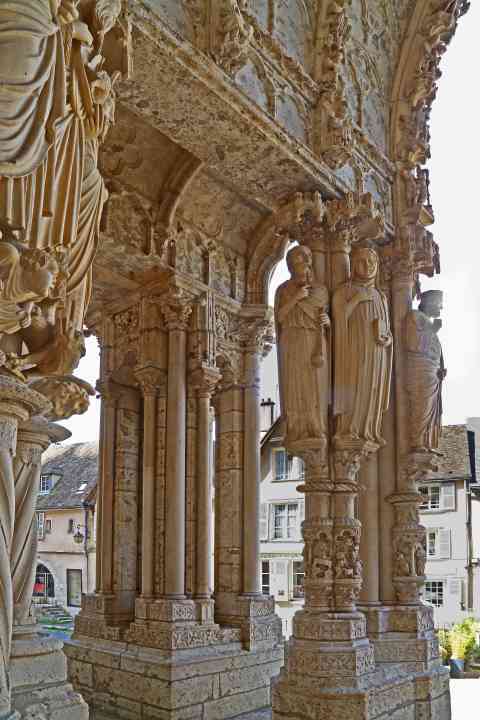 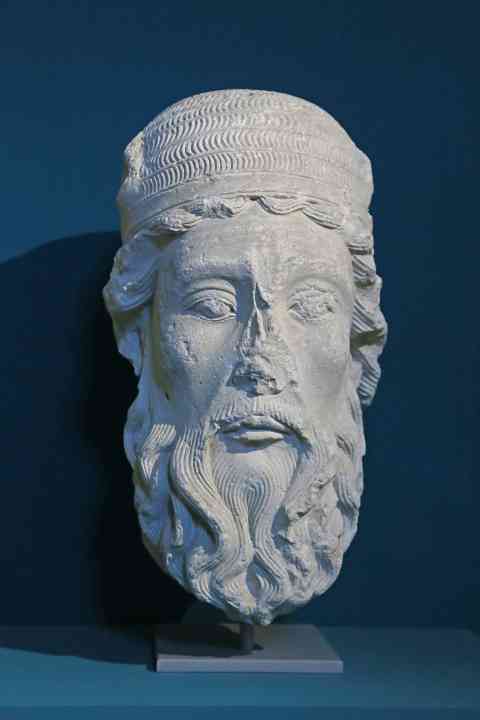 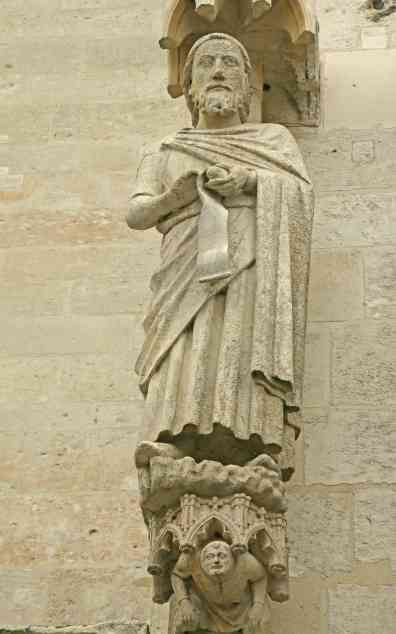 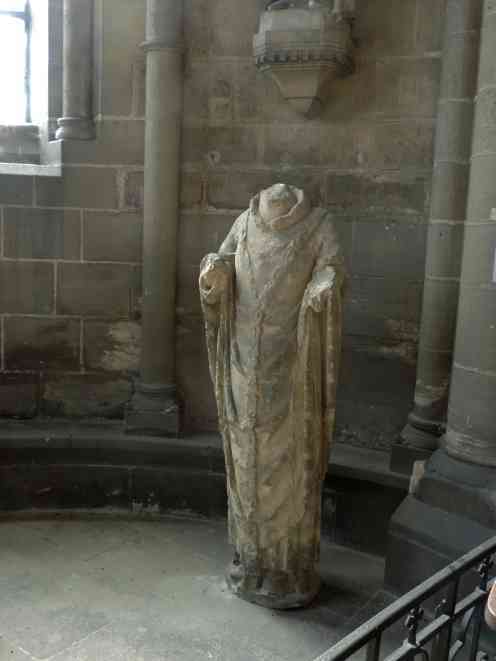 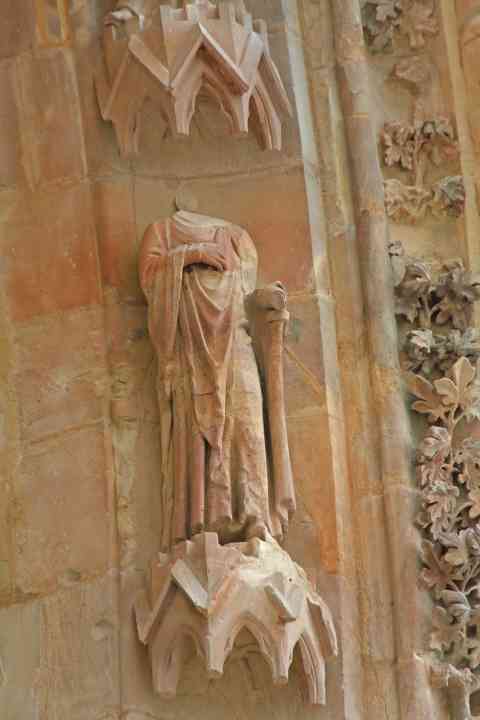 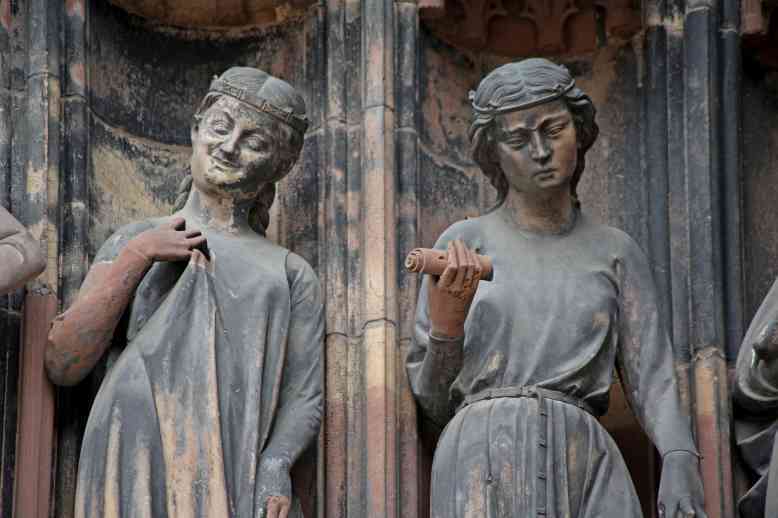 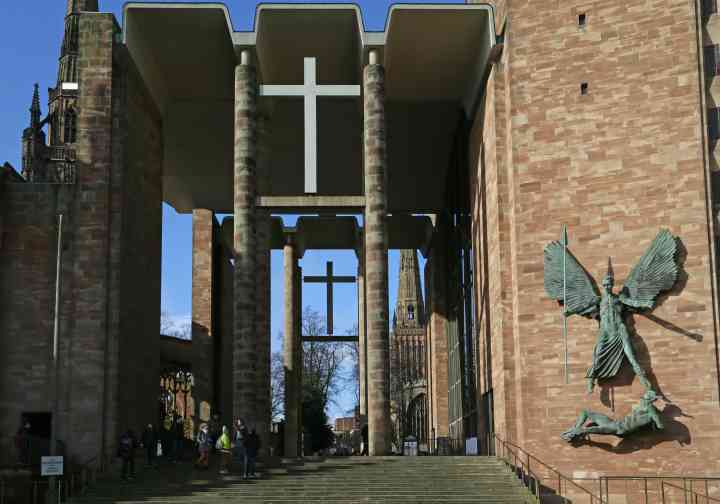 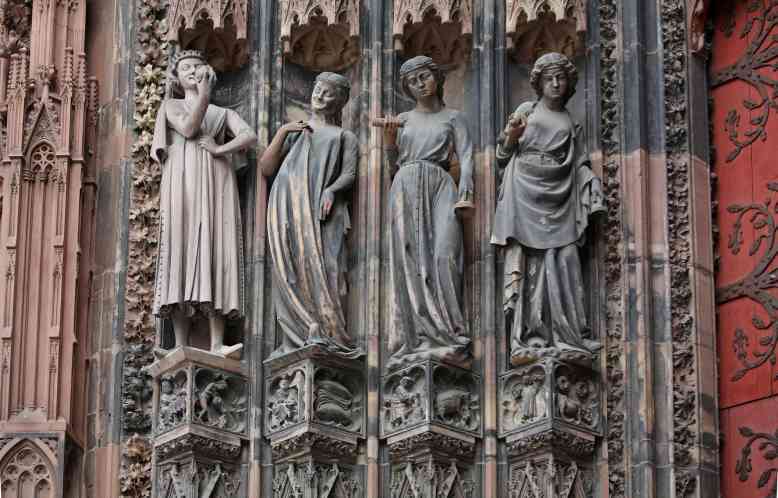 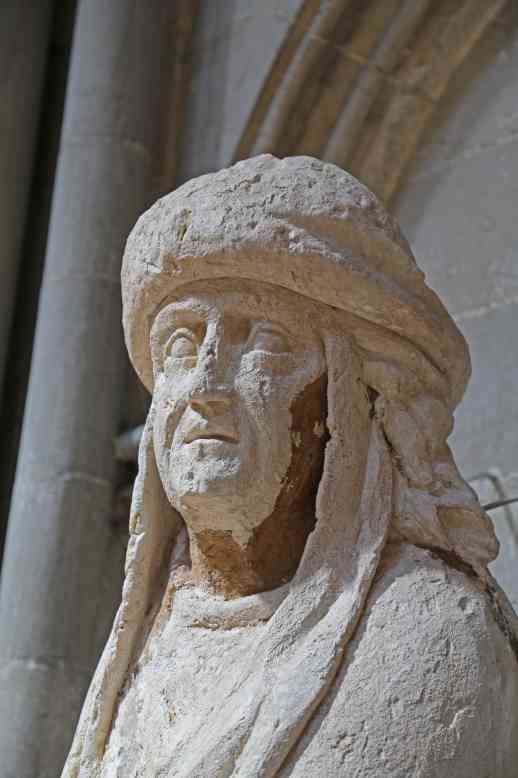 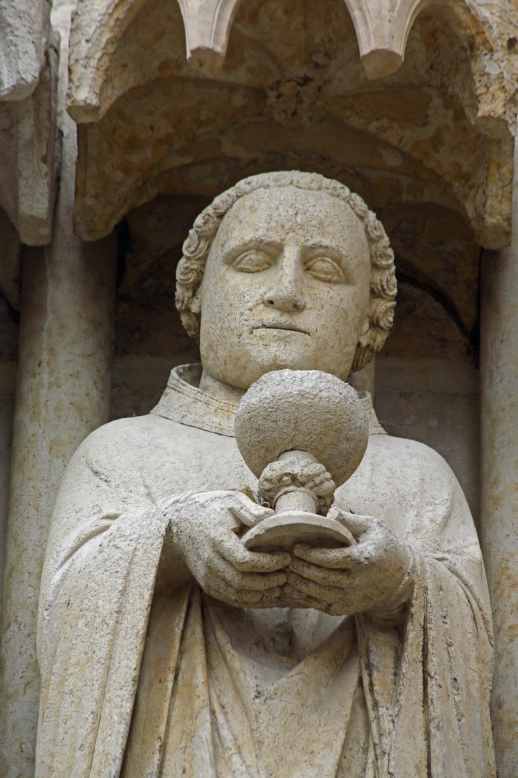 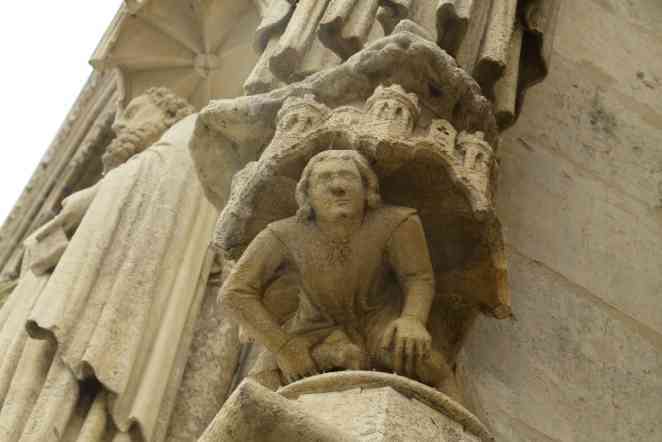 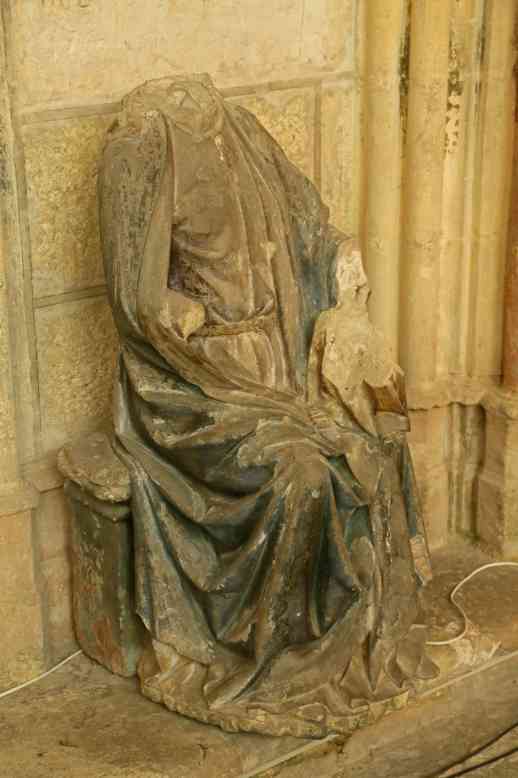 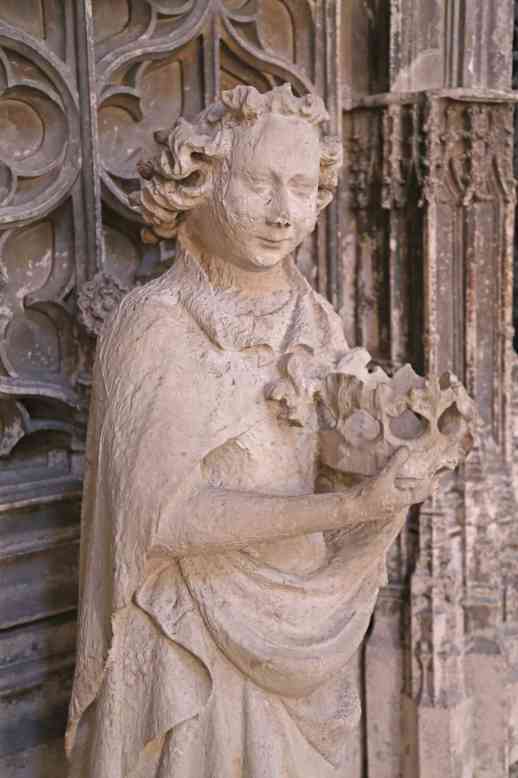 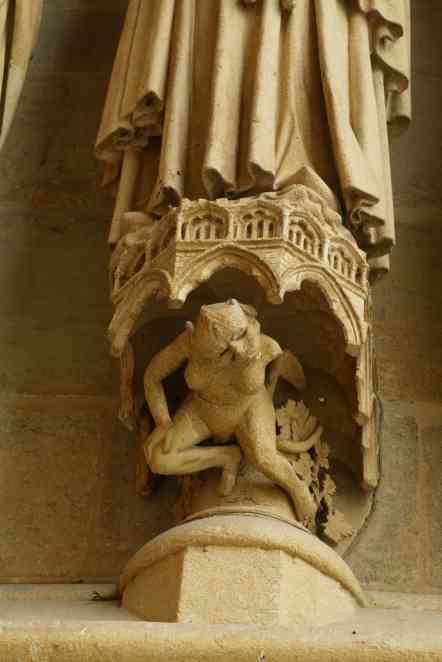 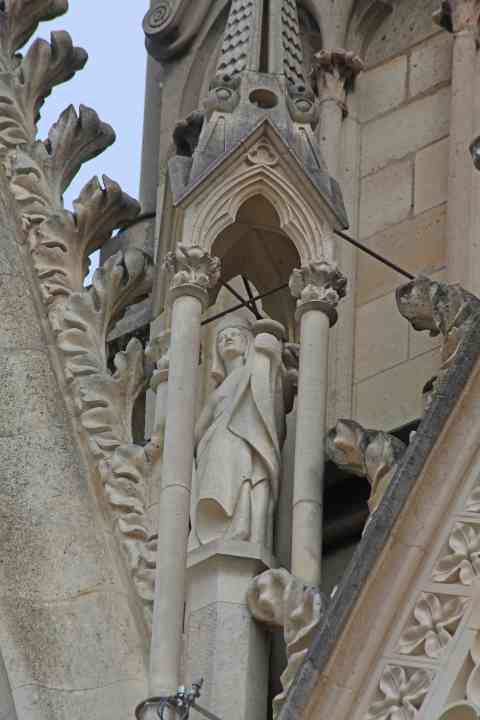 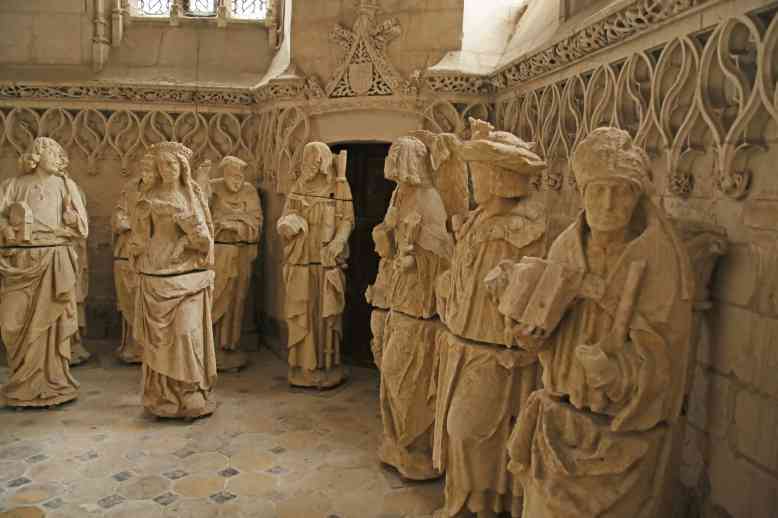 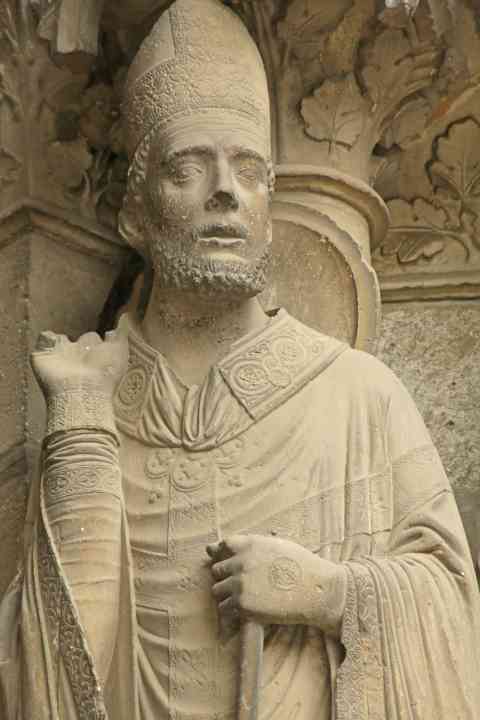 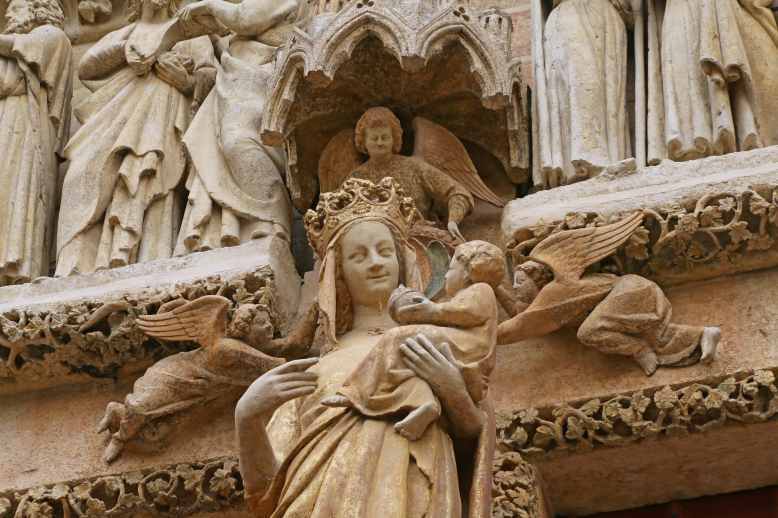 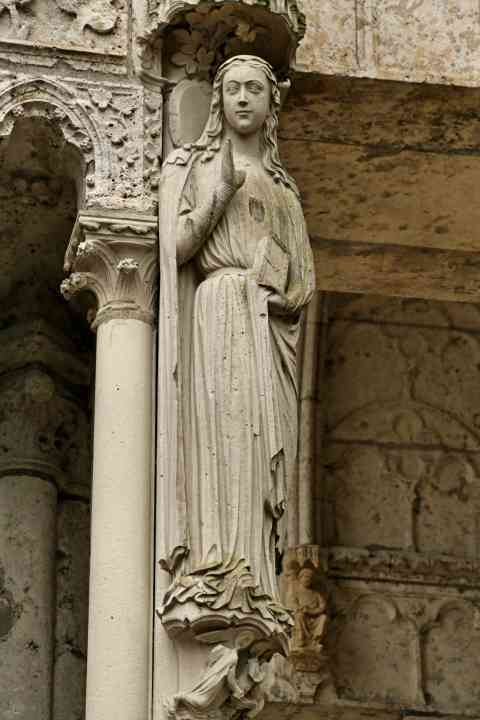 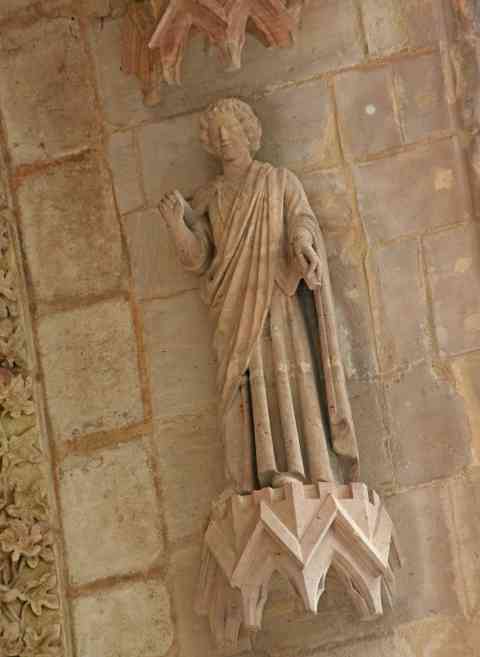 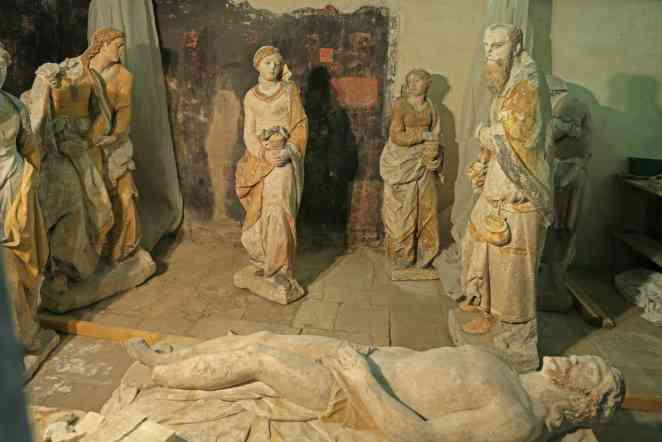 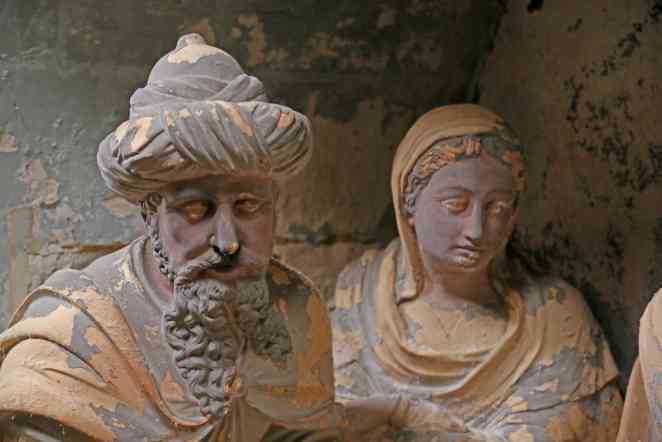 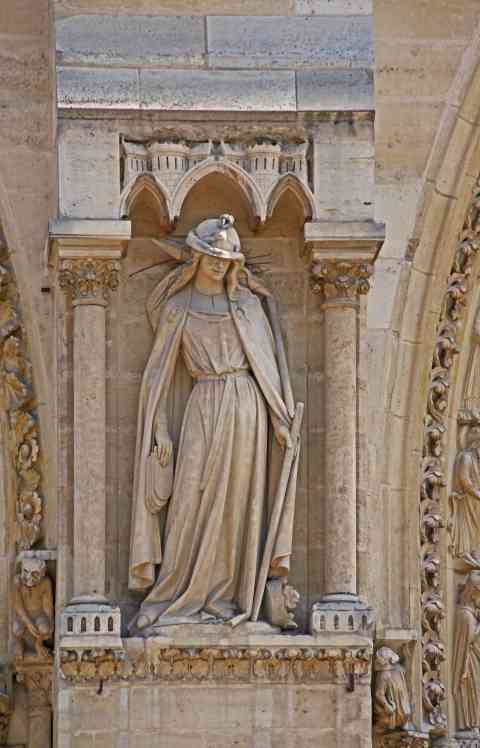 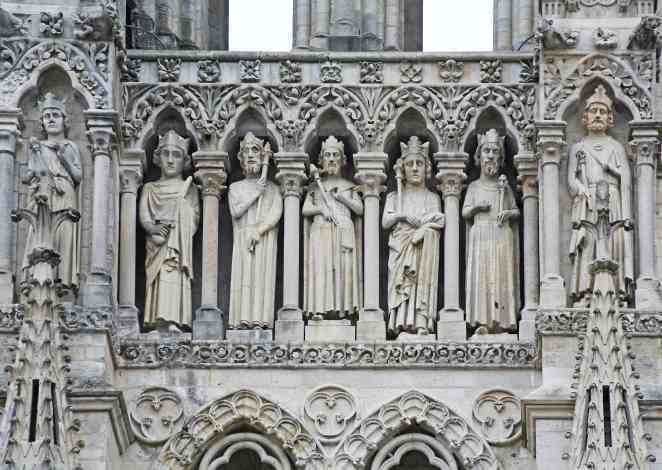 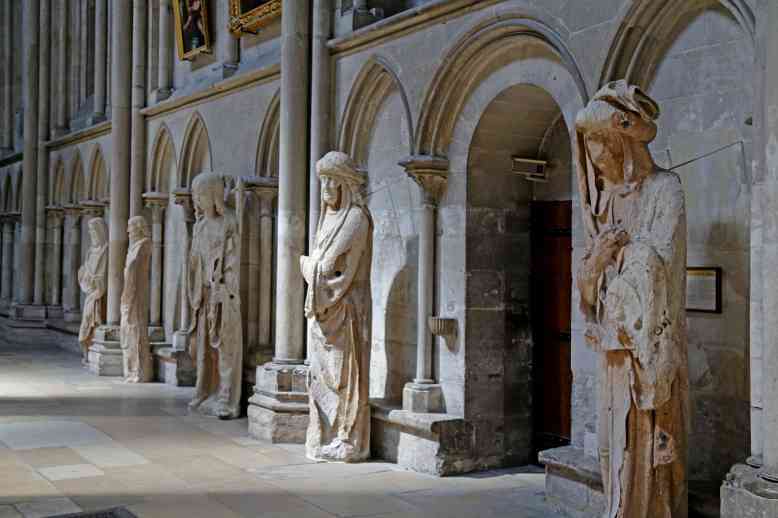 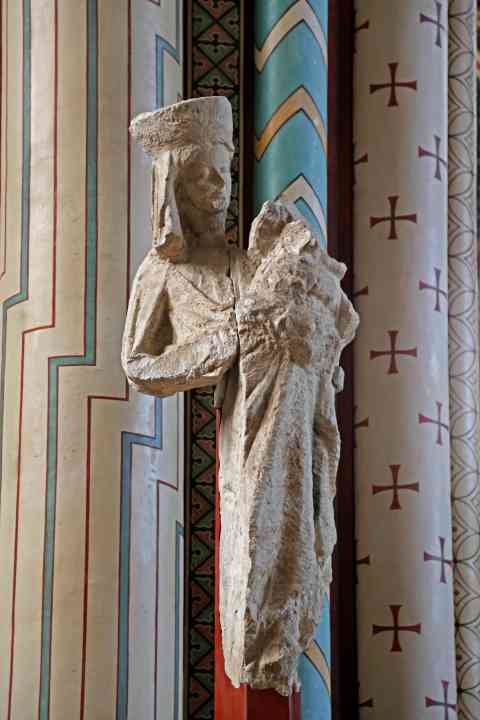 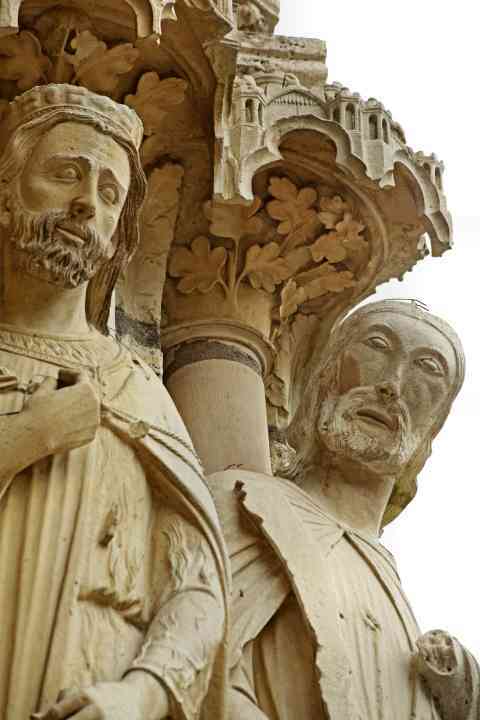 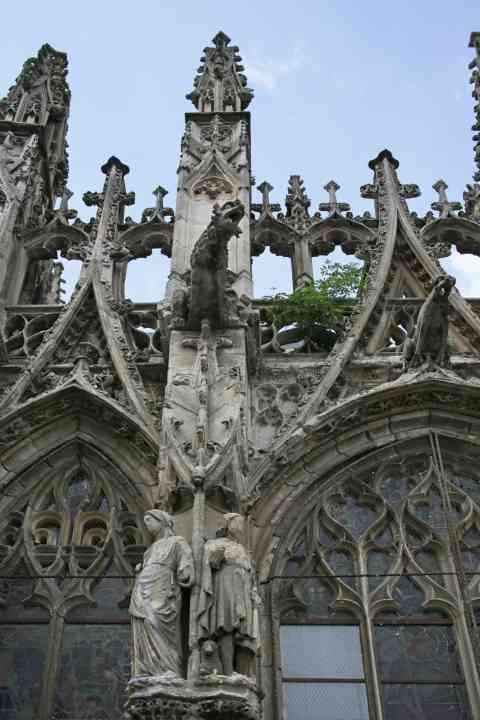 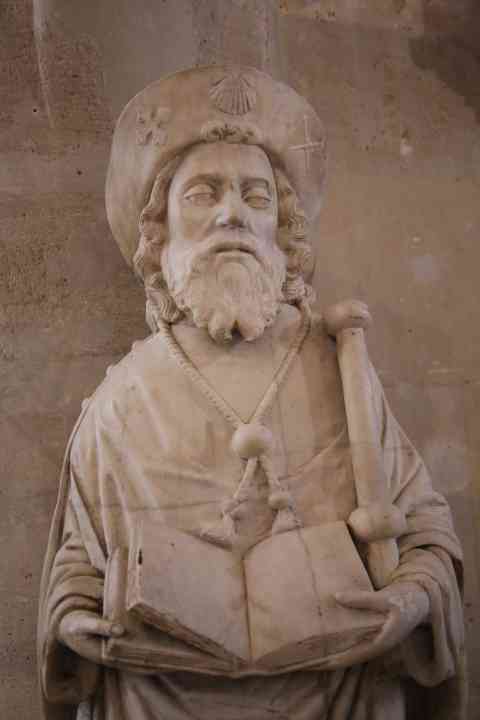 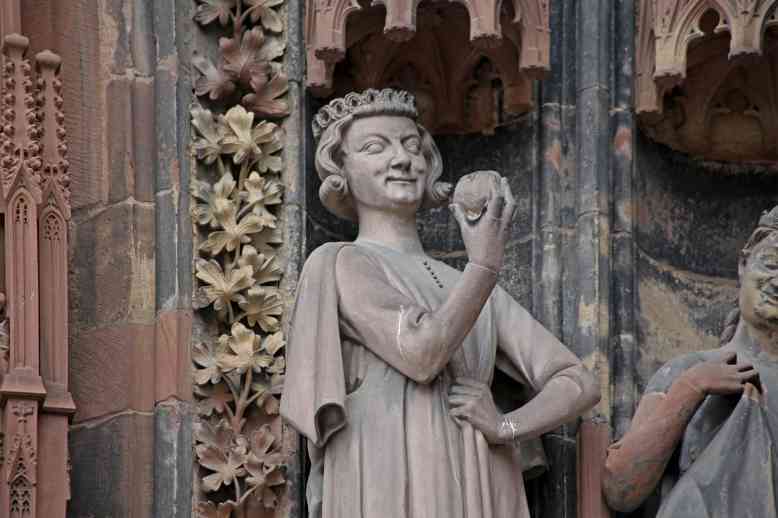 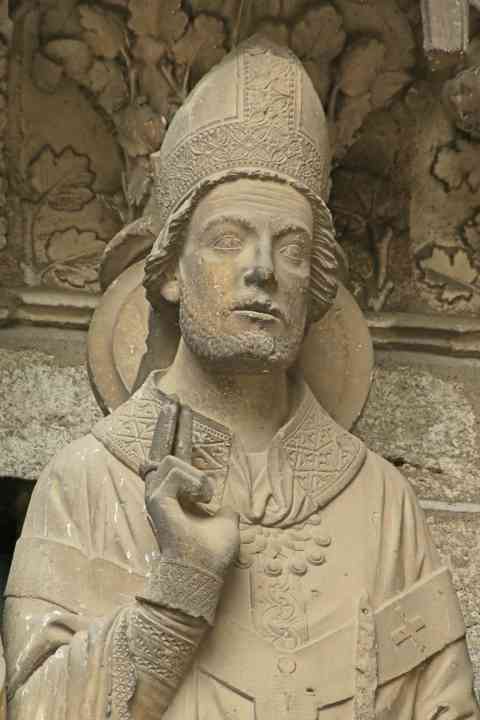 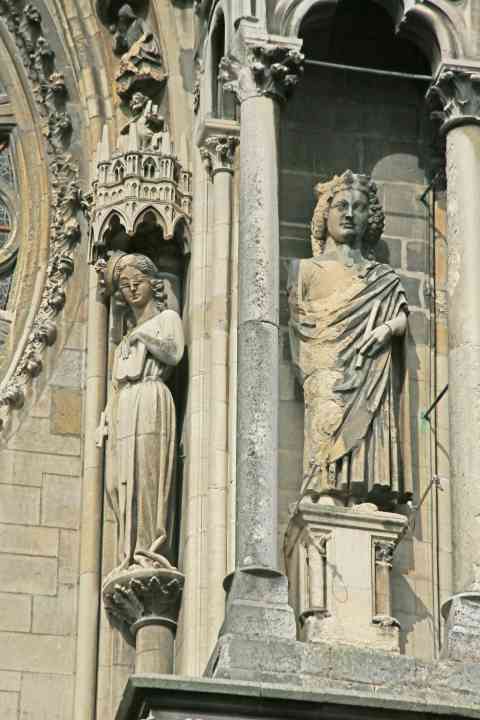 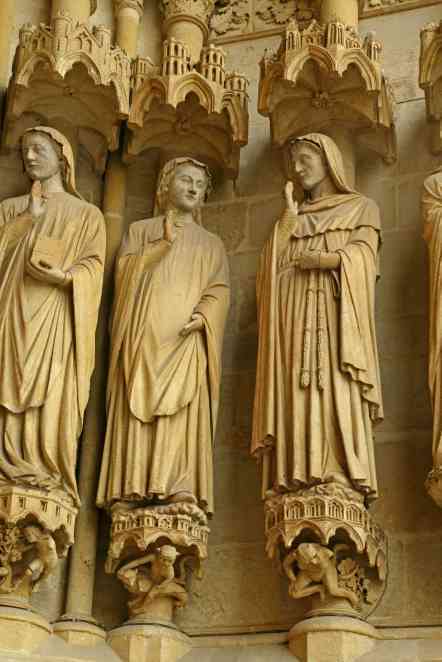 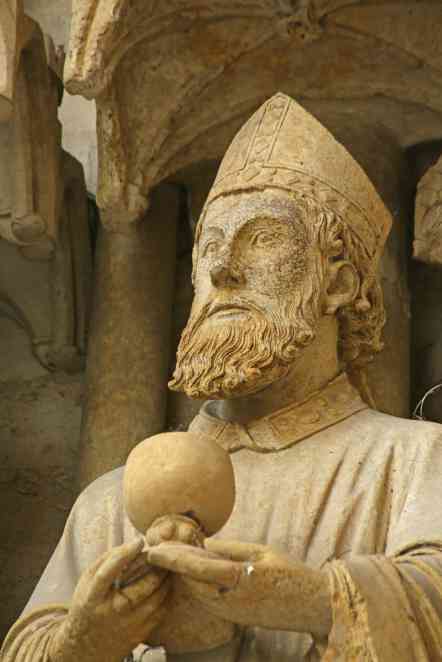 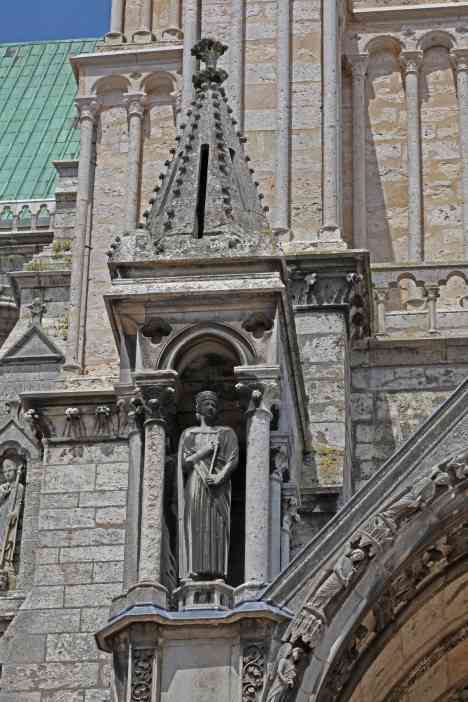 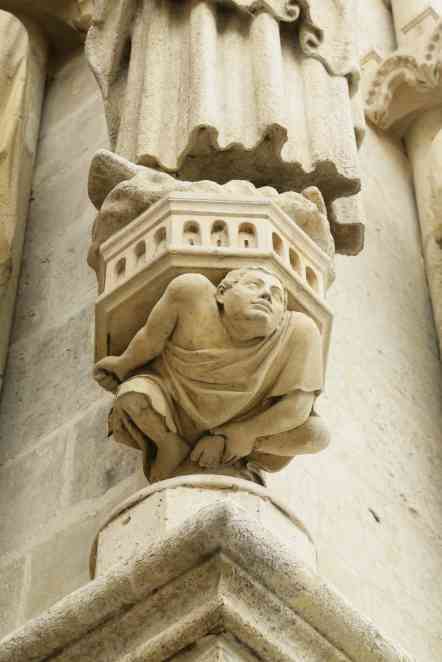 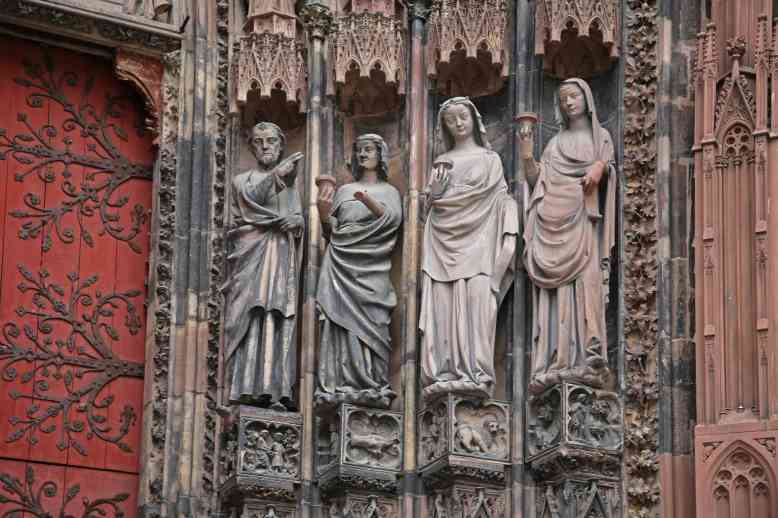 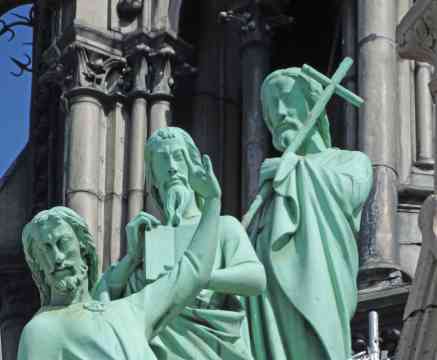 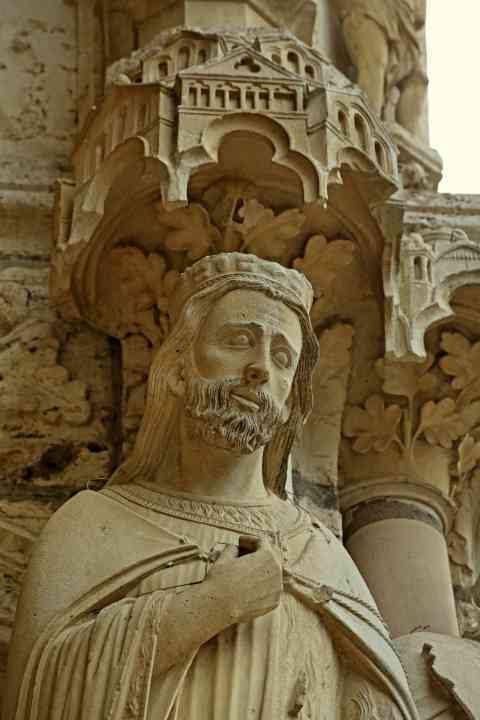 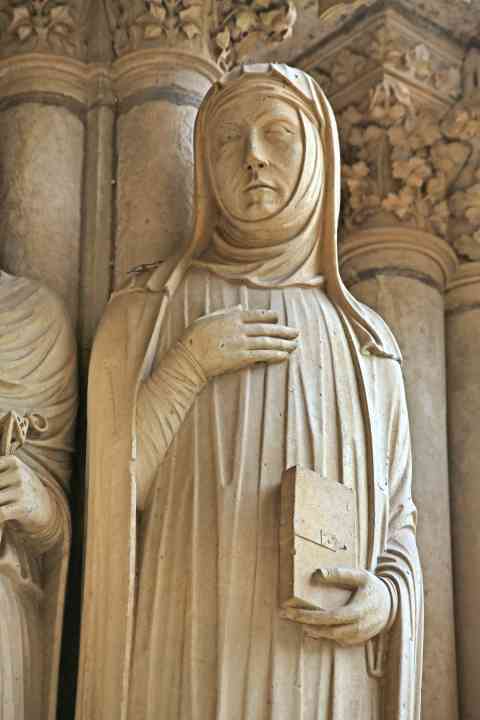 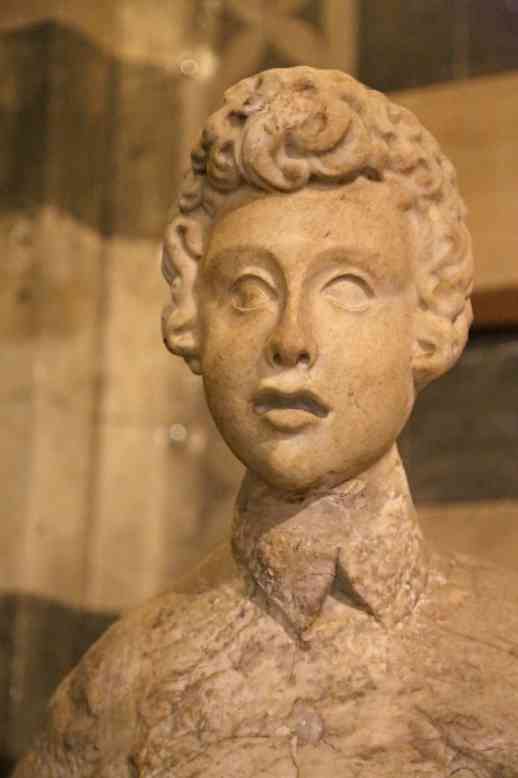 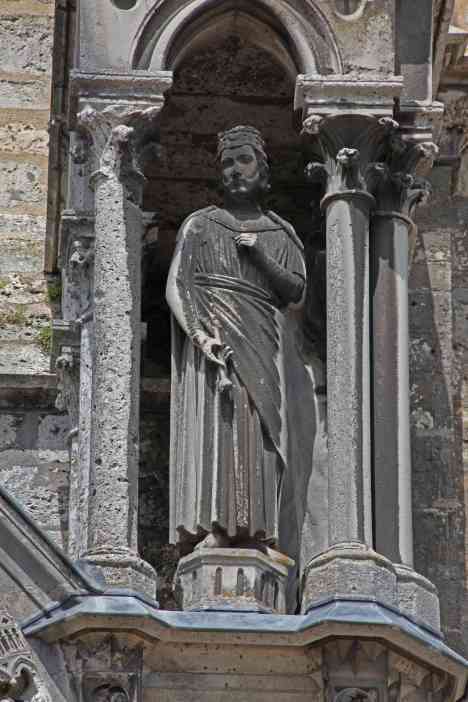 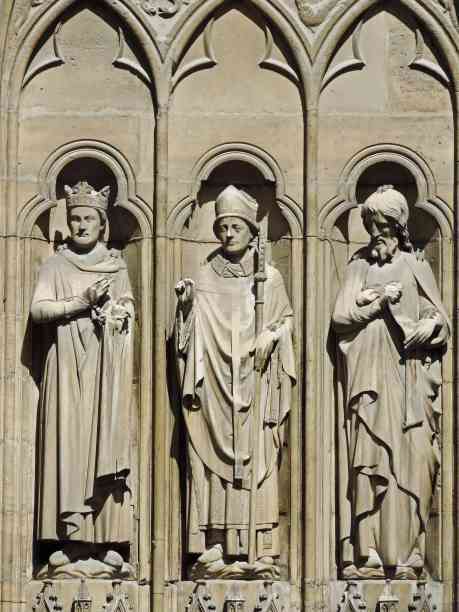 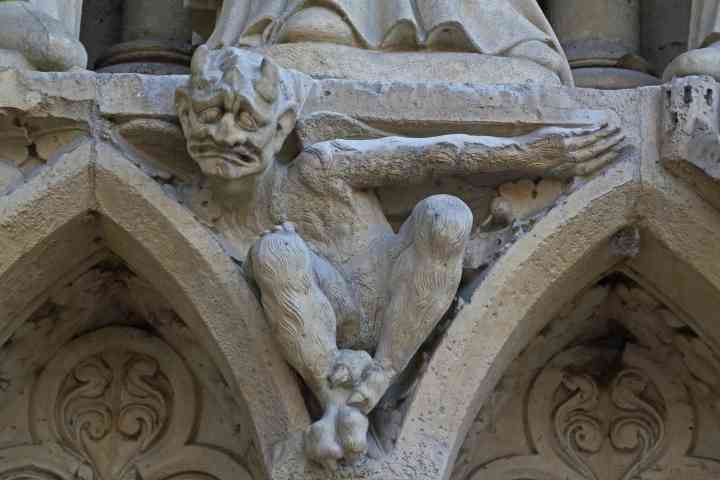 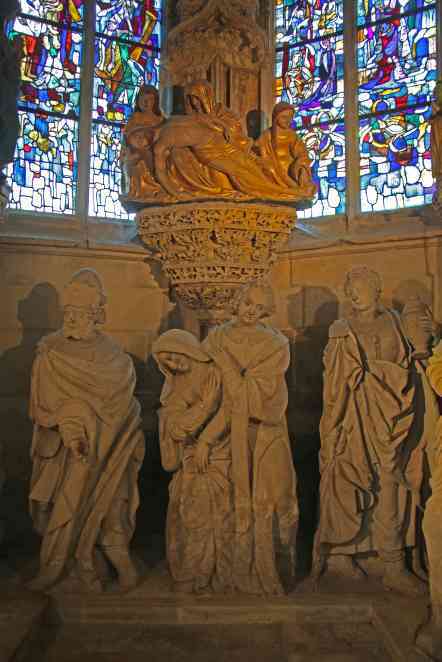 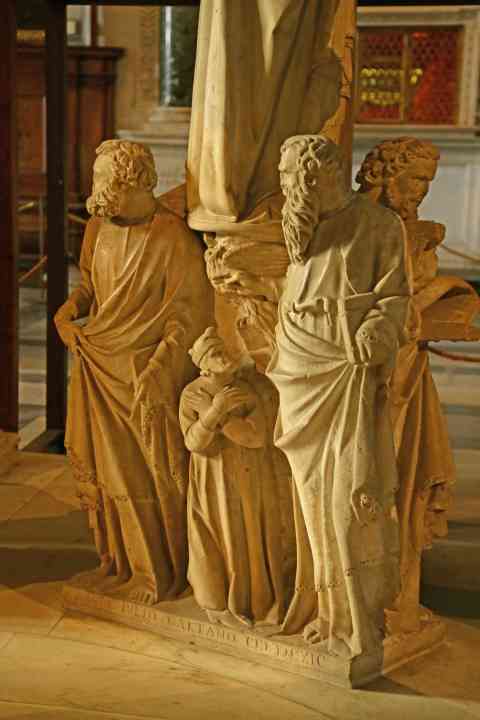 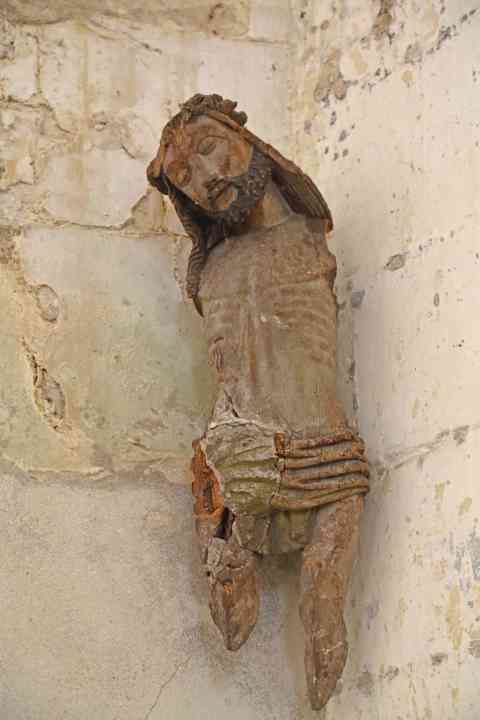 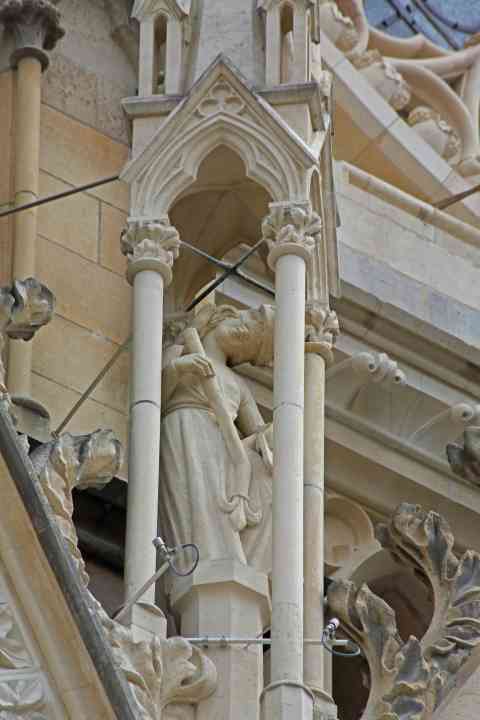 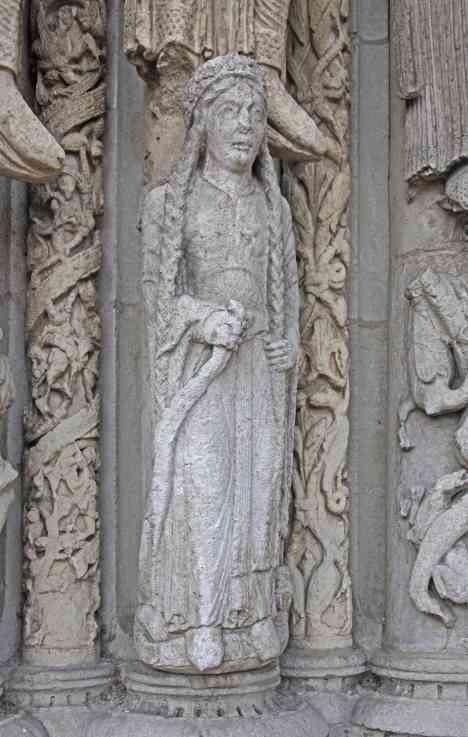 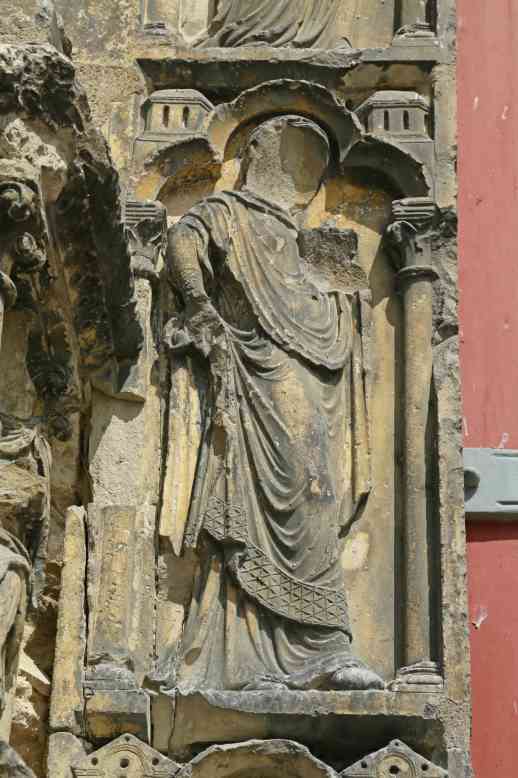 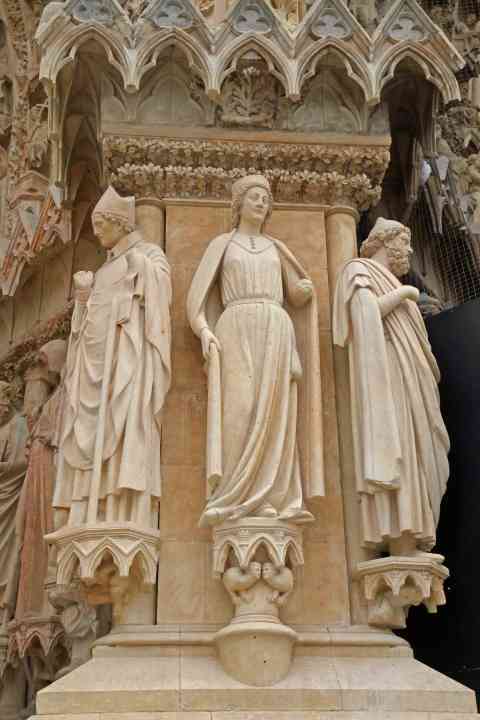 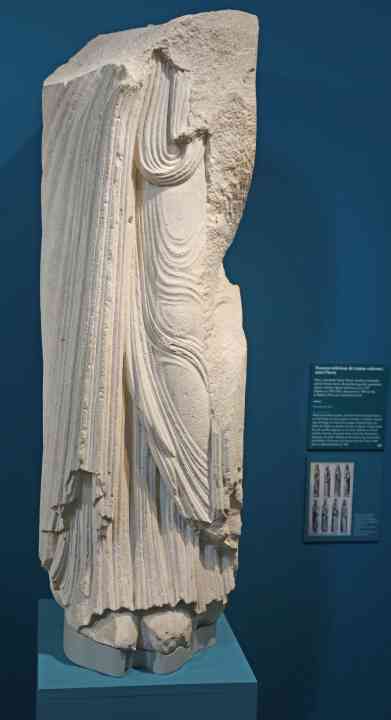 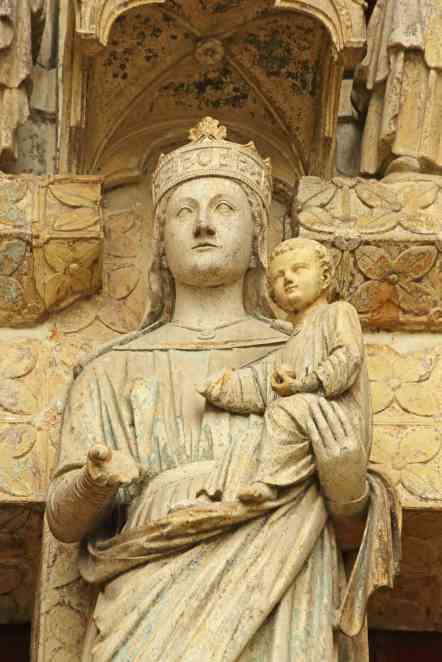 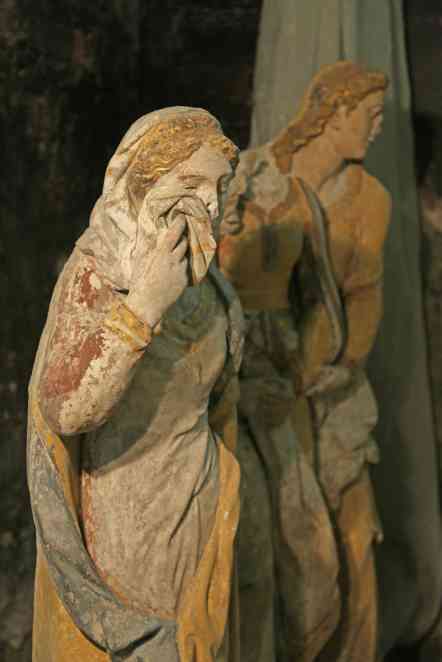 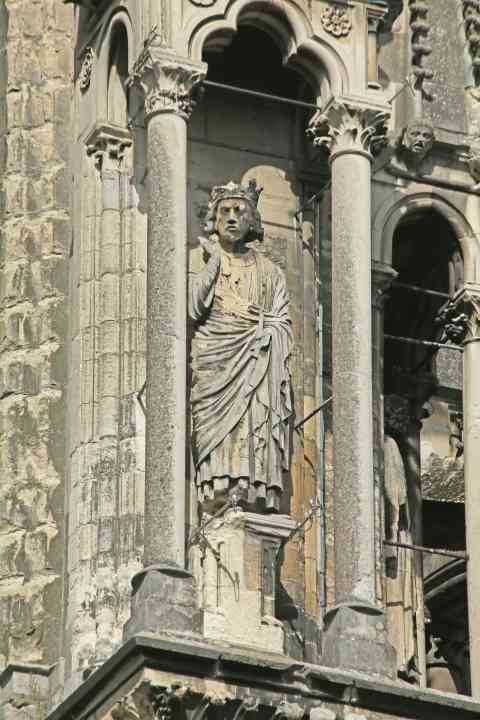 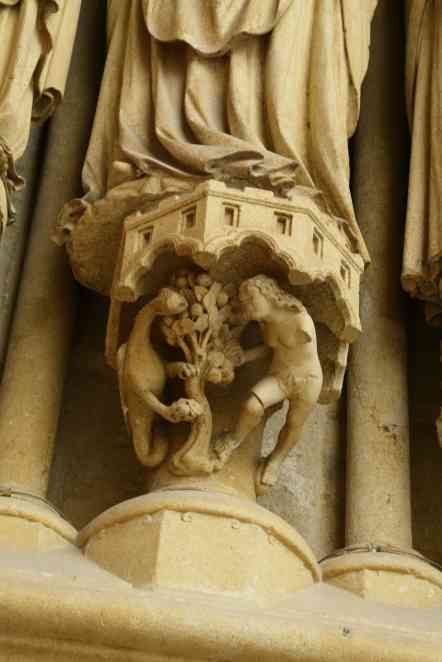 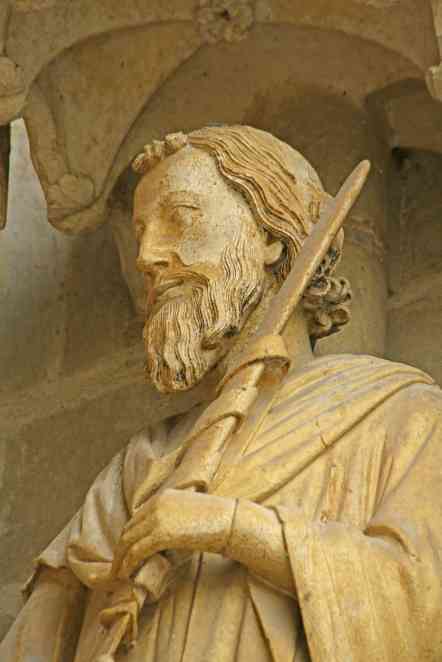 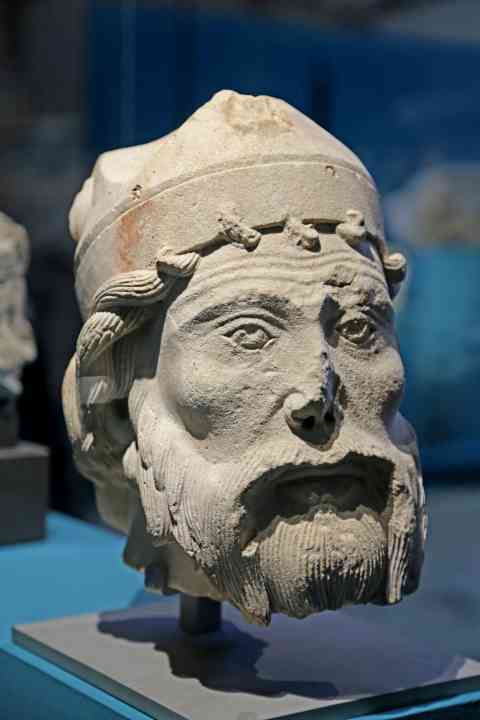 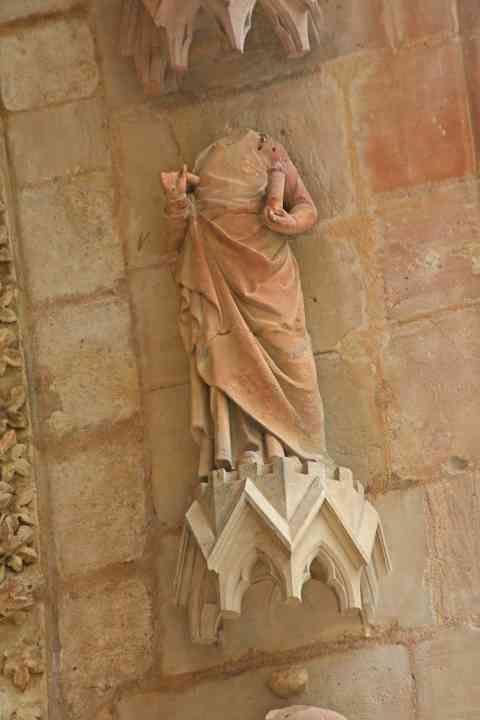 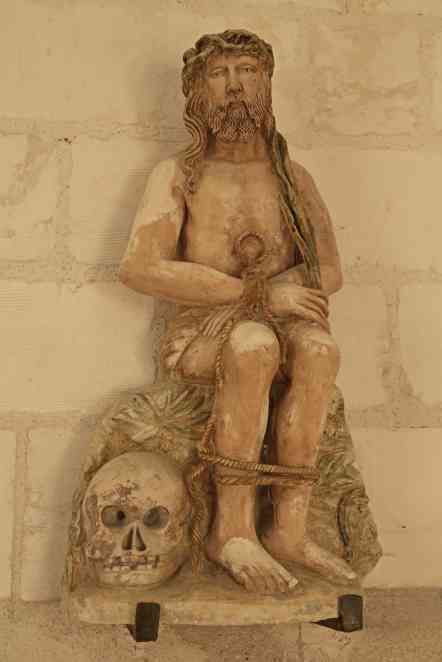 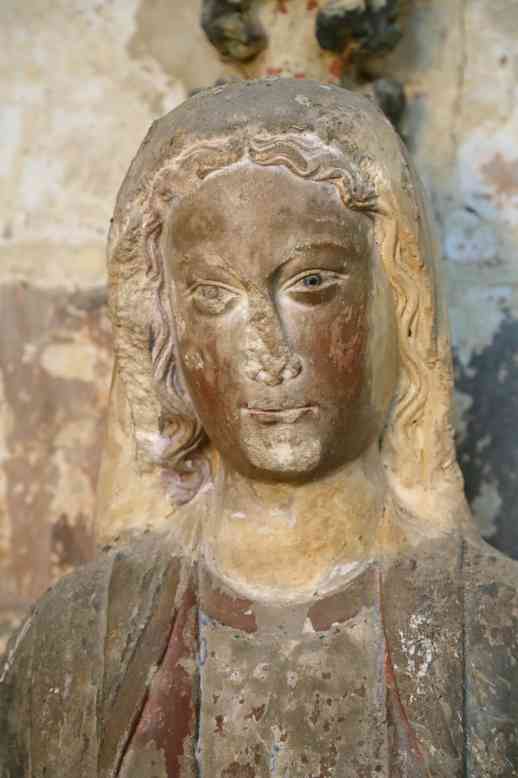 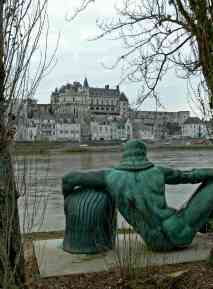 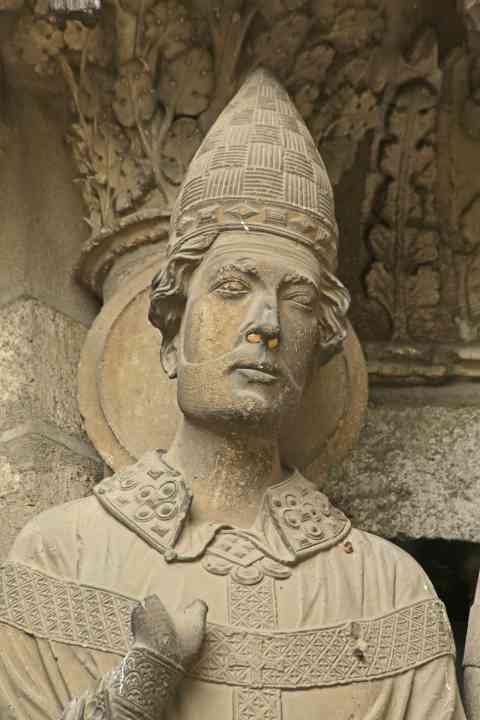 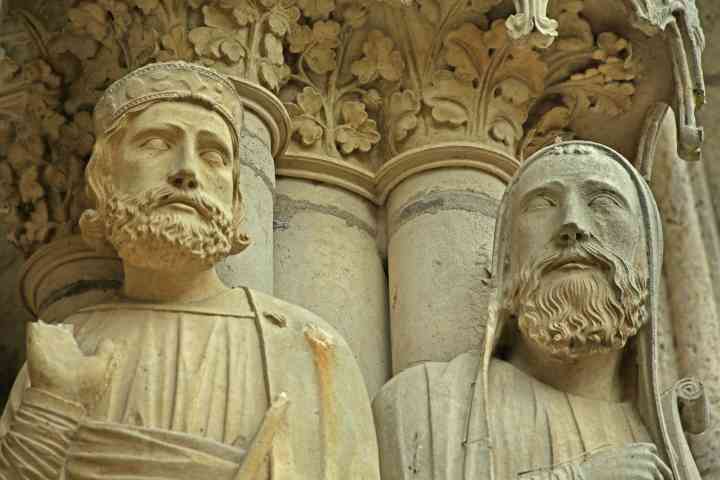 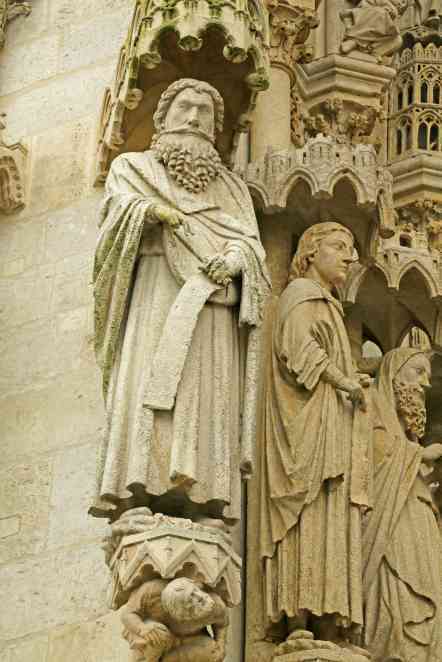 France Rouen Cathedral Statue from the west front: a prophet? 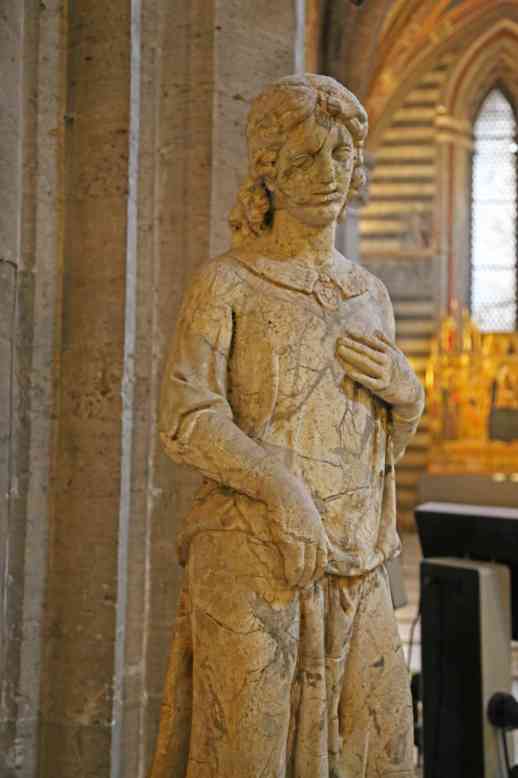 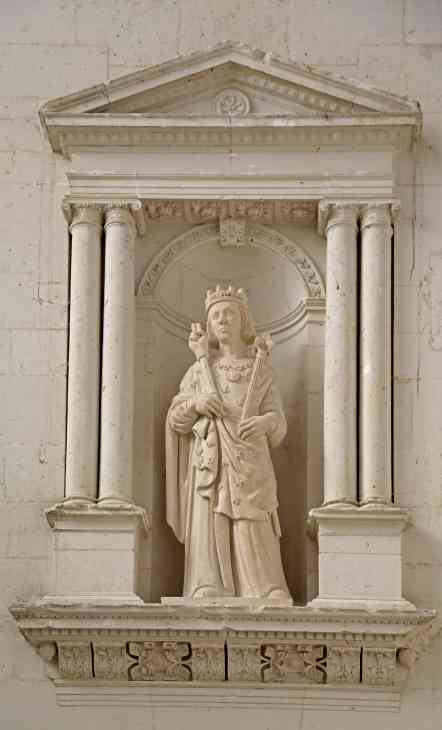 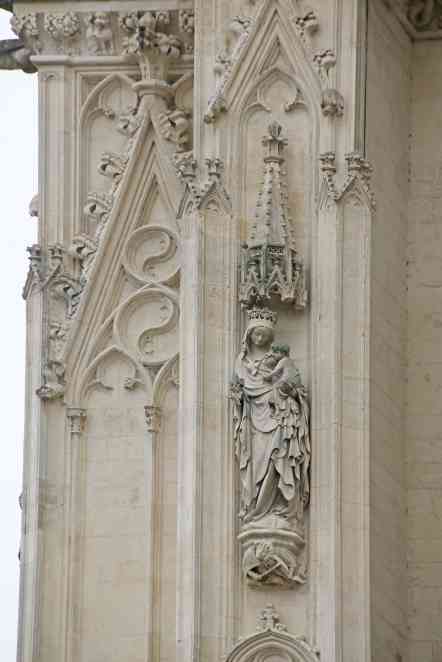 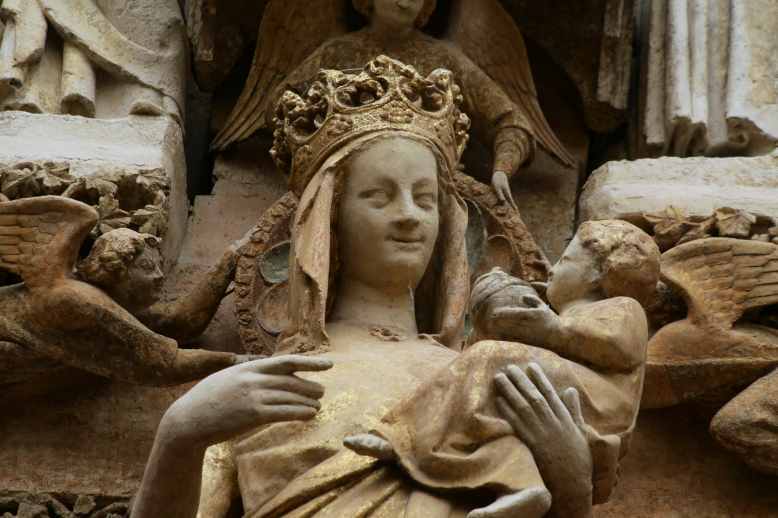 France Rouen Cathedral Statue from the west front: St Louis? 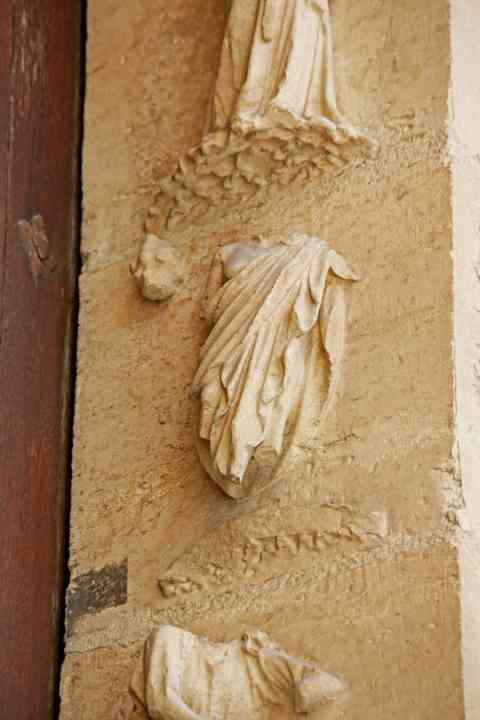 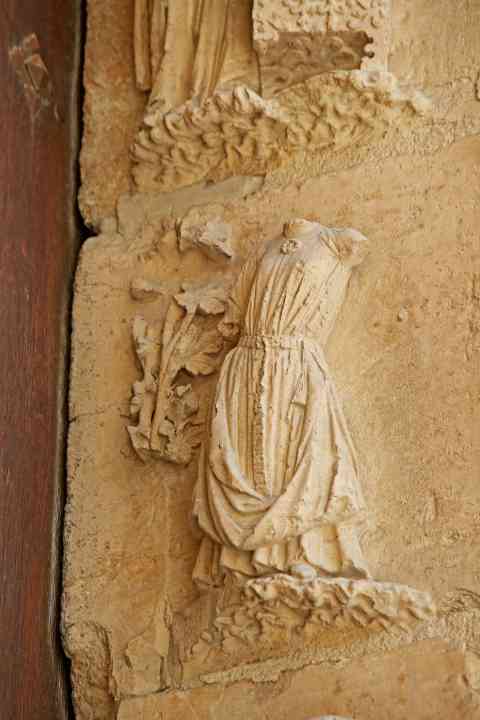 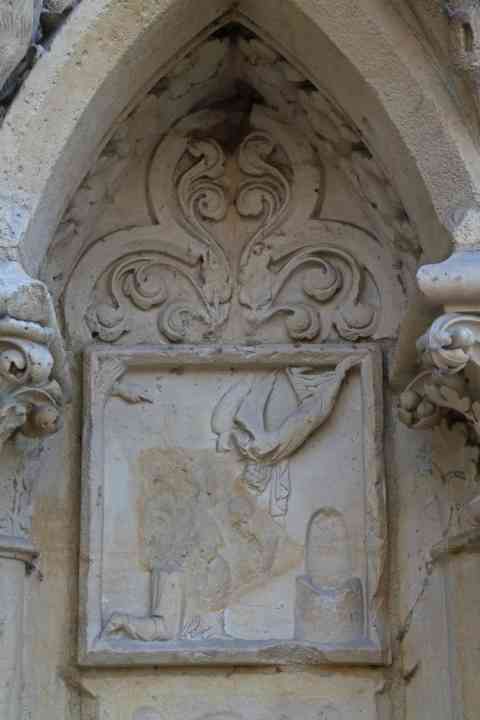 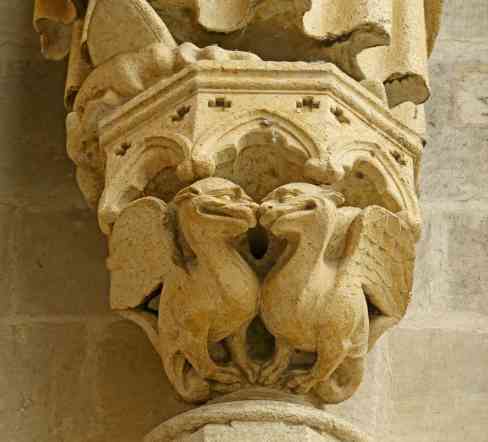 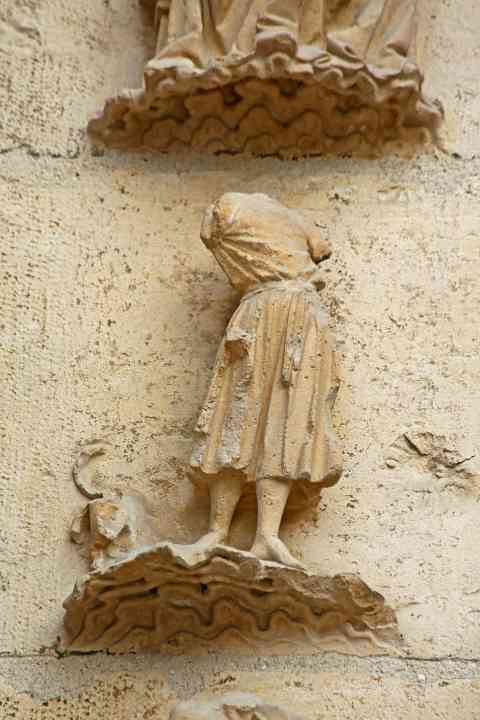 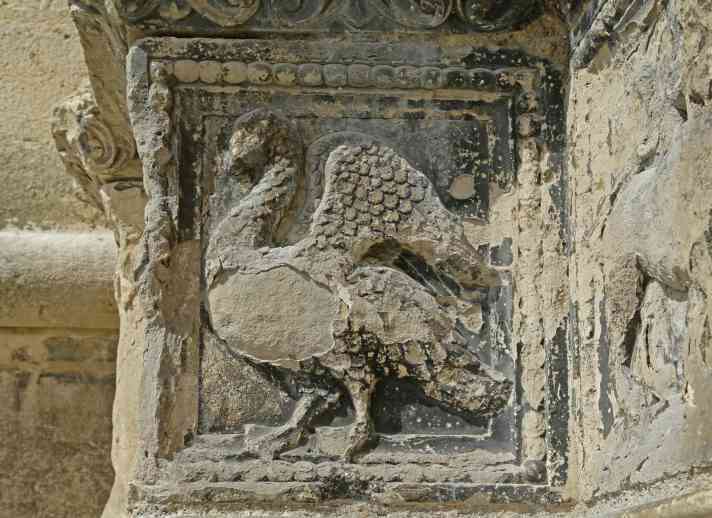 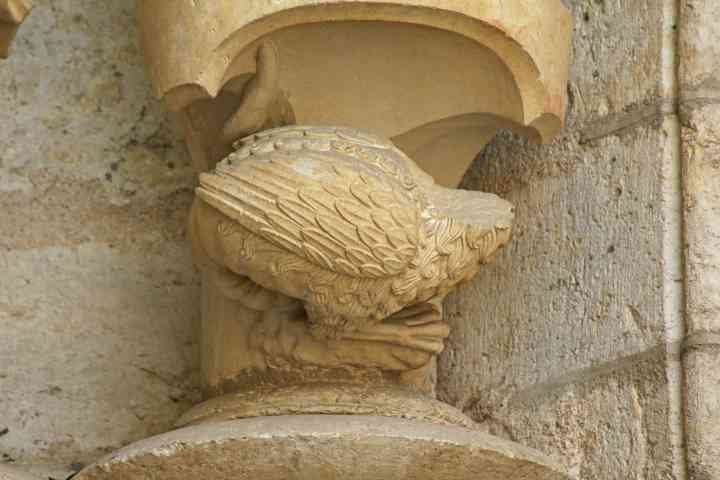 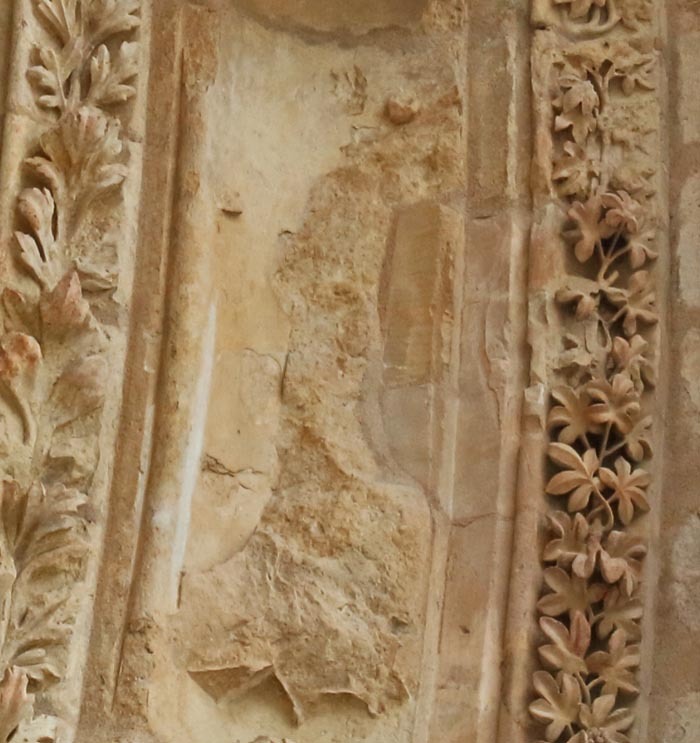 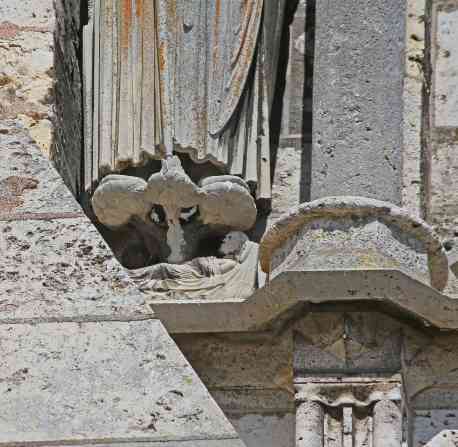 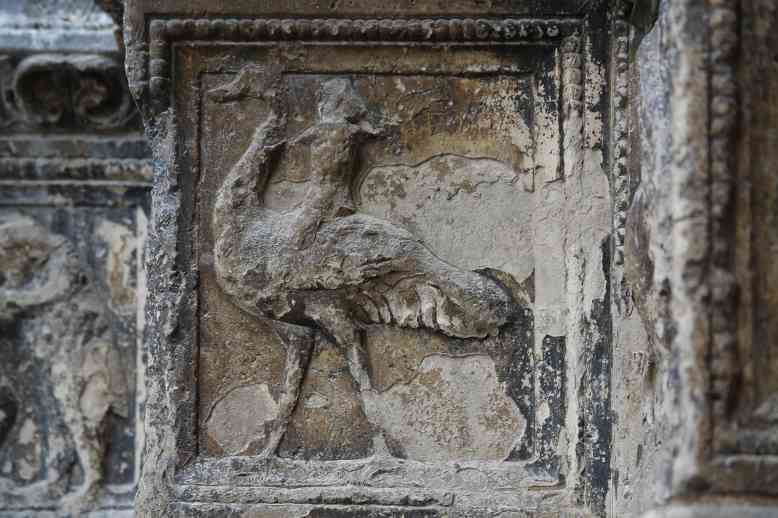 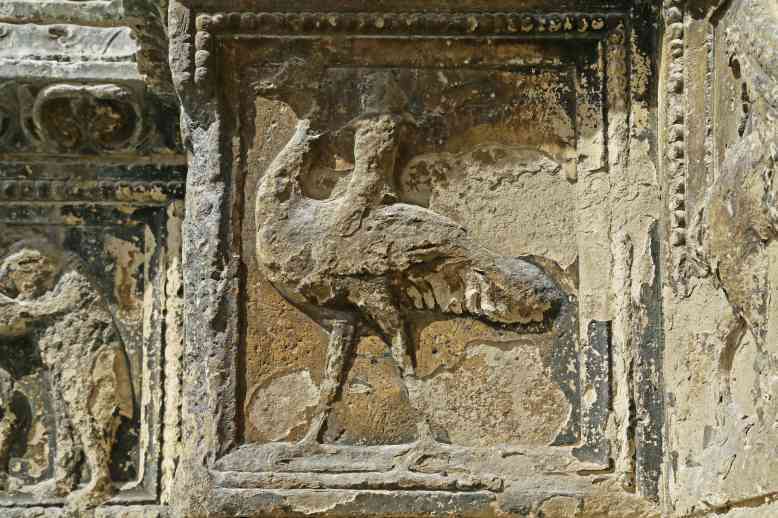 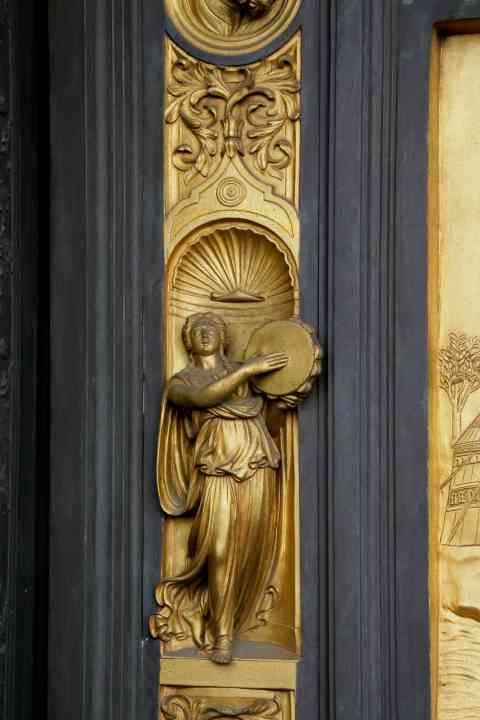 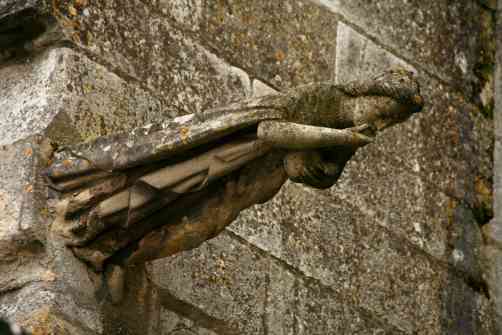 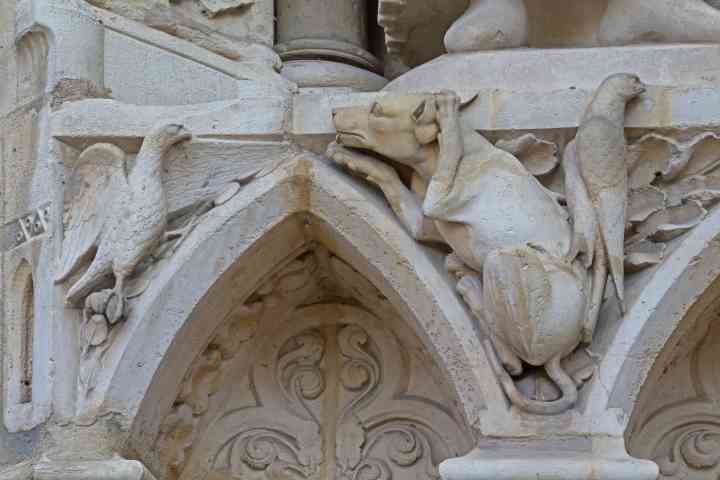 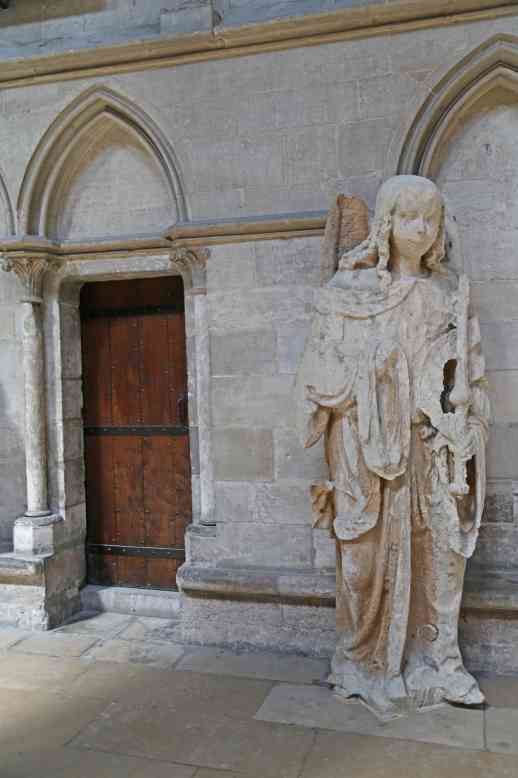 France Sens Cathedral West façade center door left hand bas relief figure - duck? 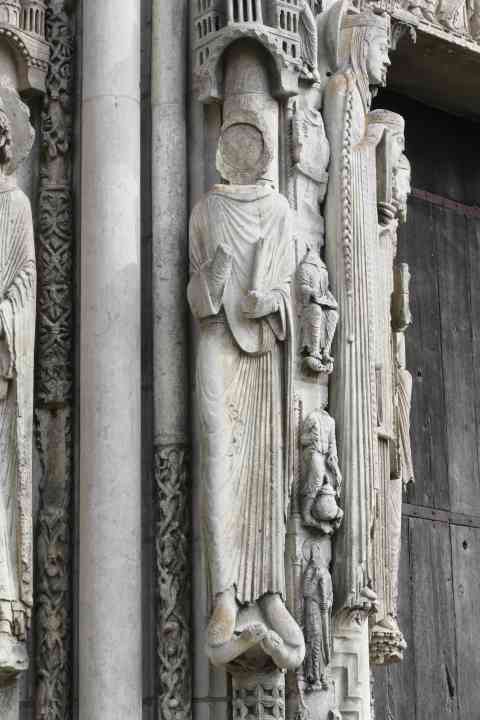 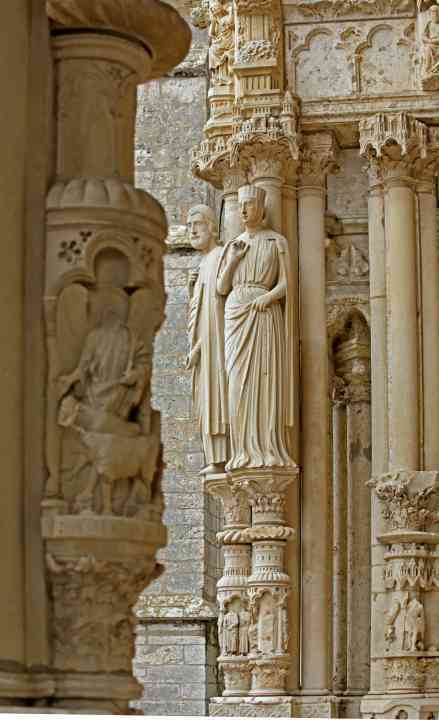 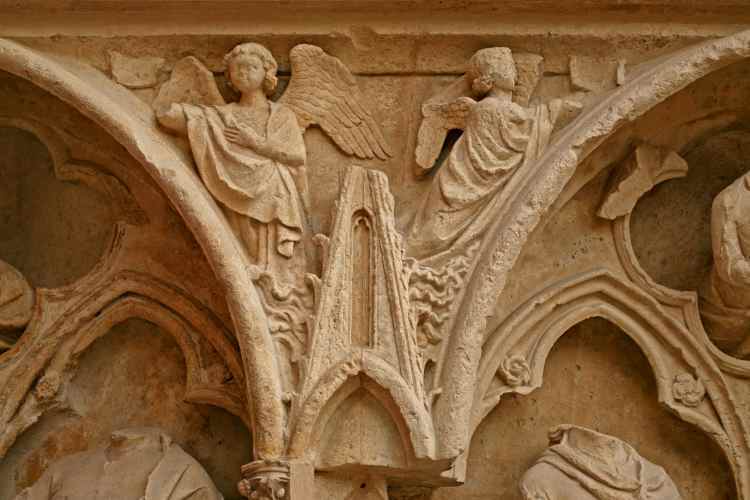 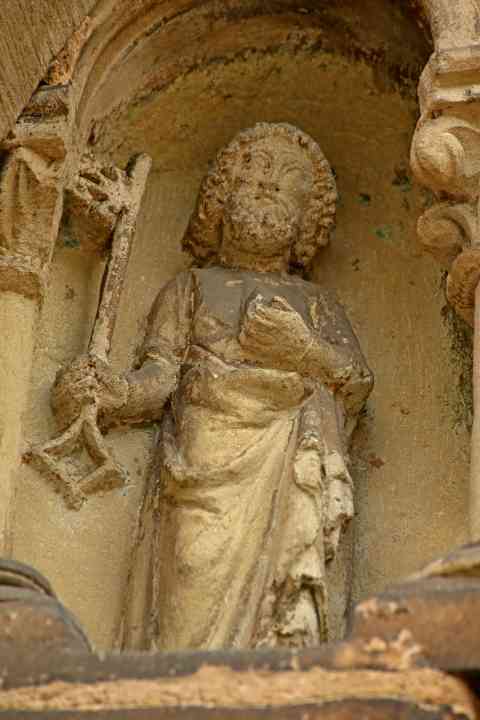 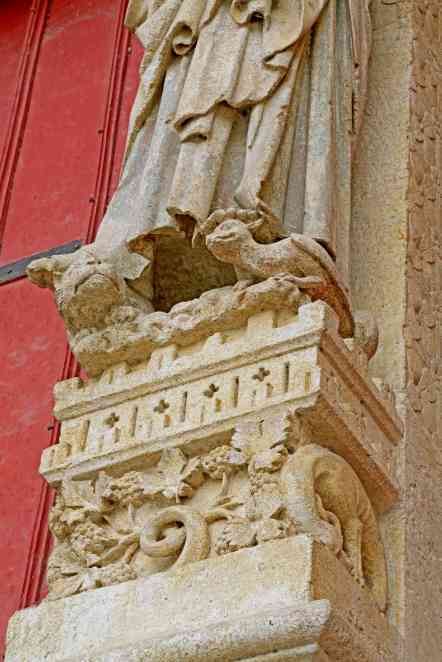 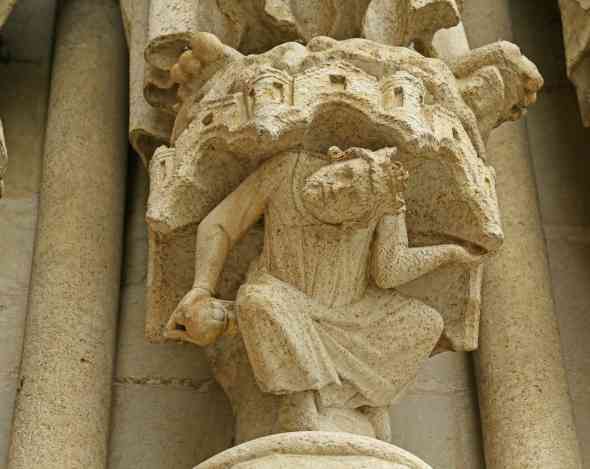 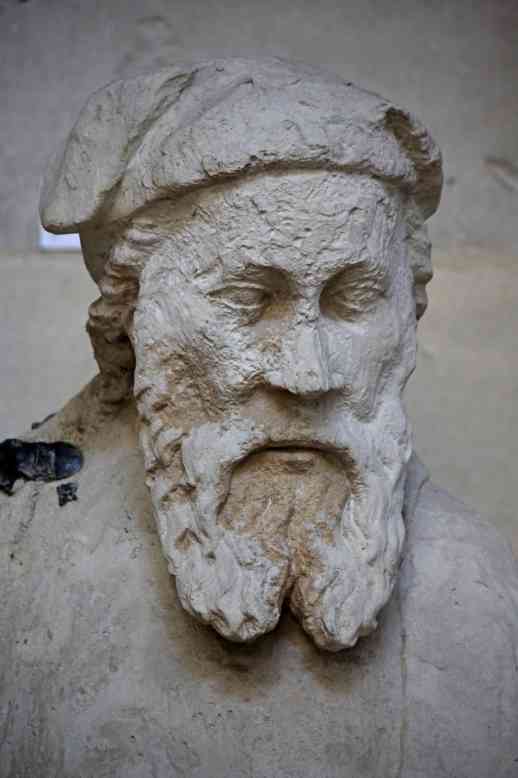 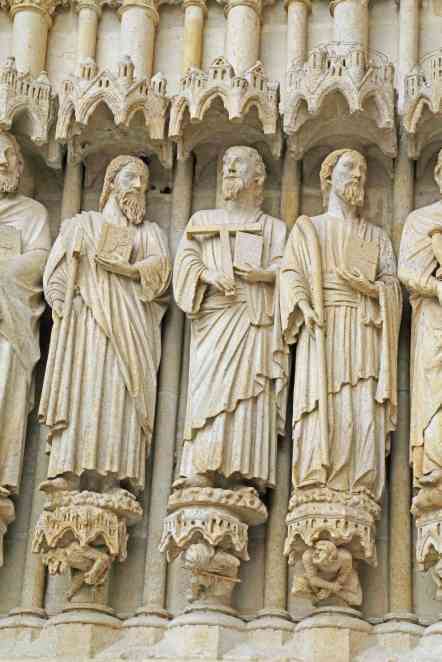 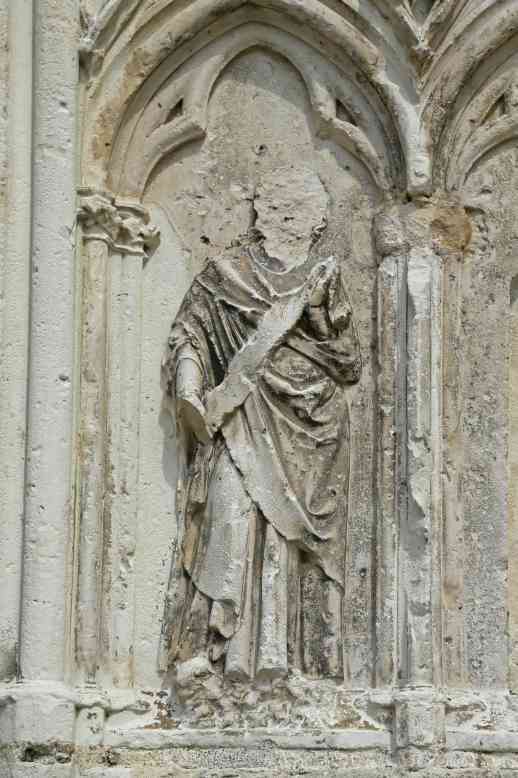 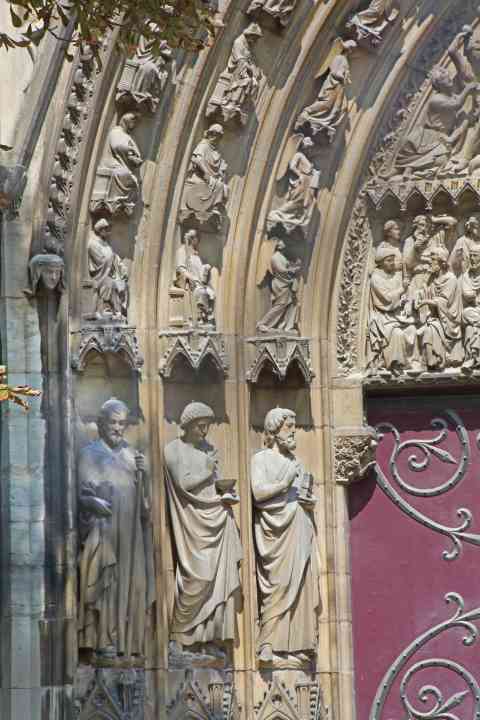 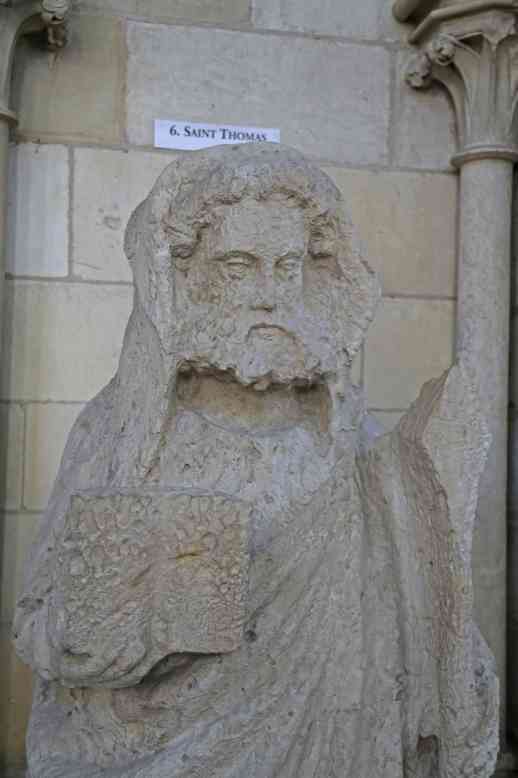 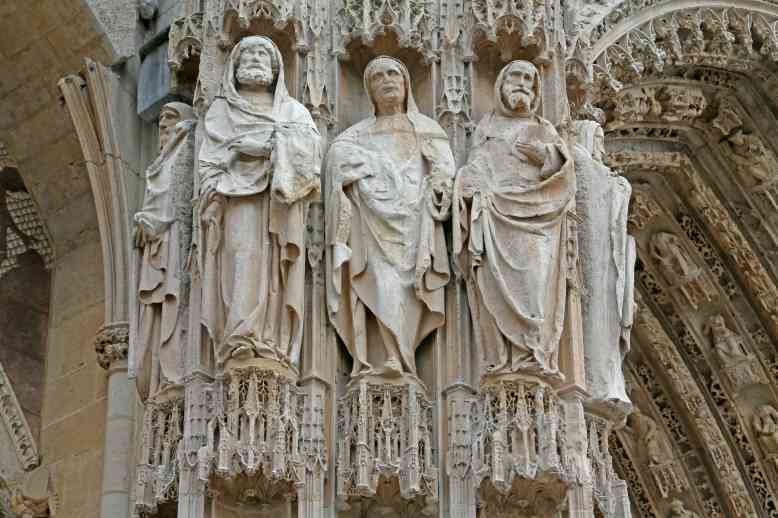 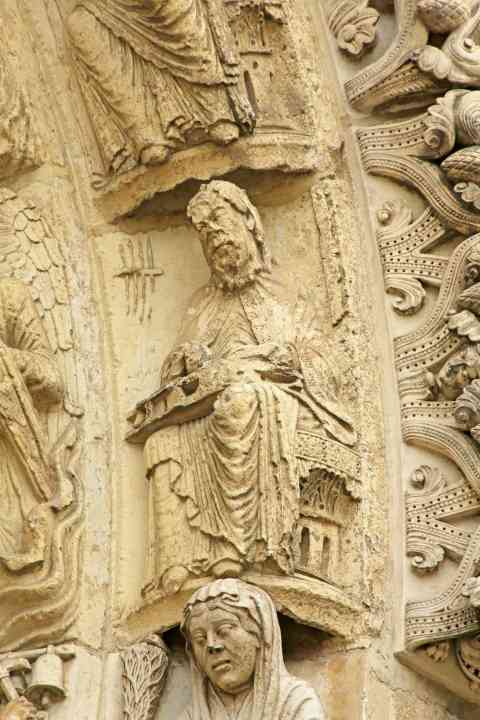 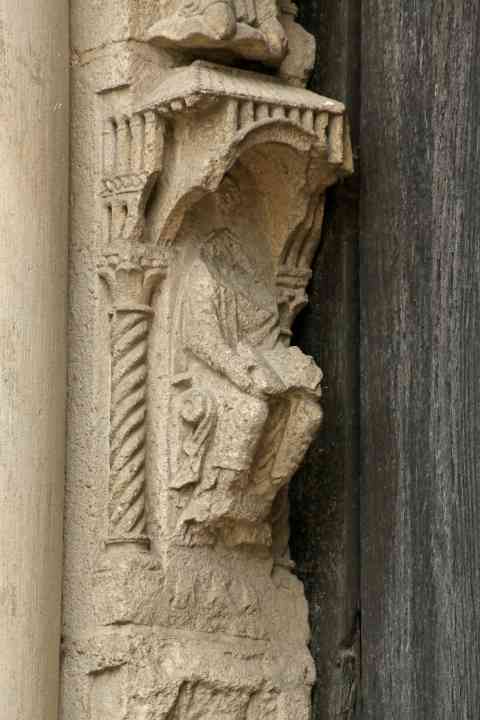 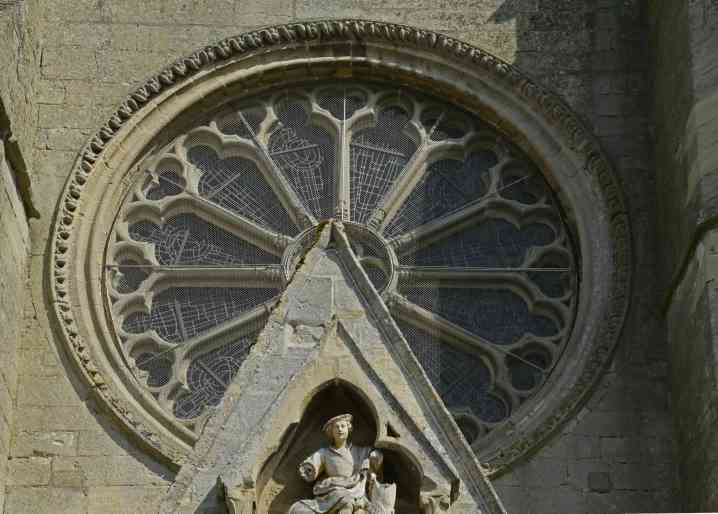 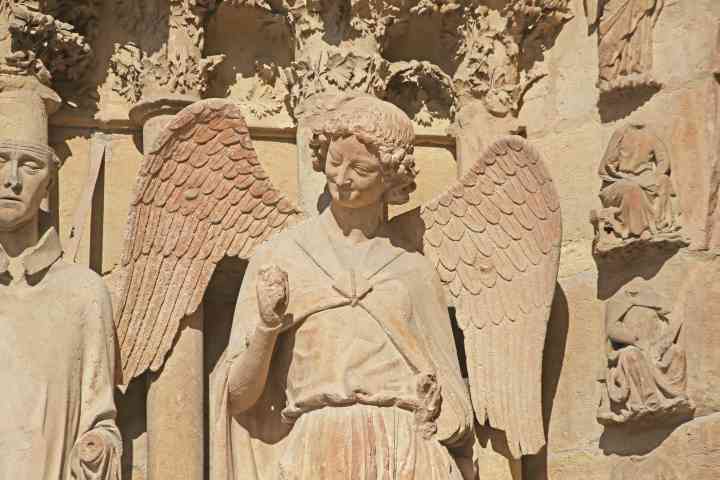 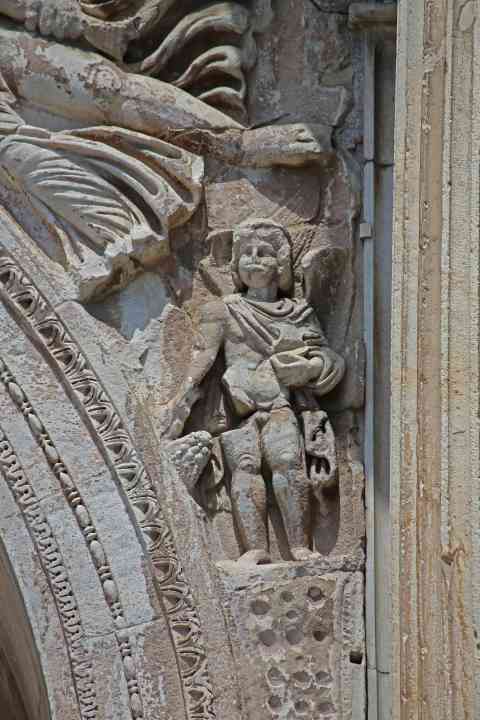 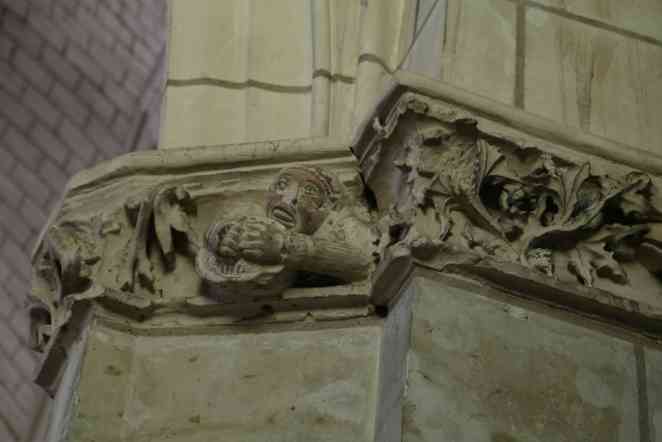 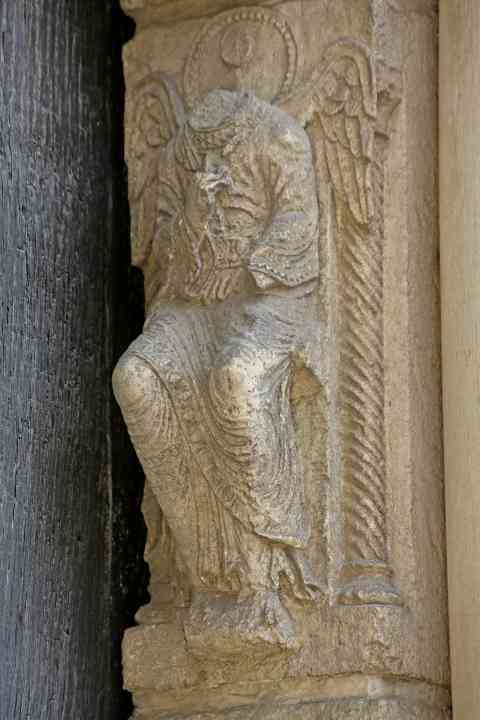 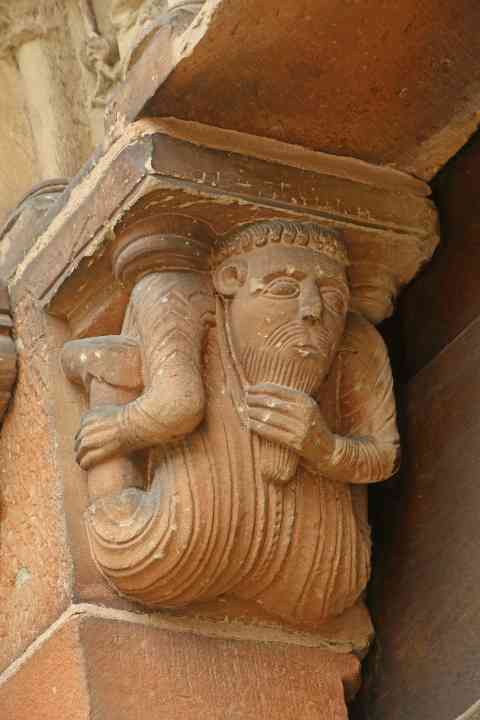 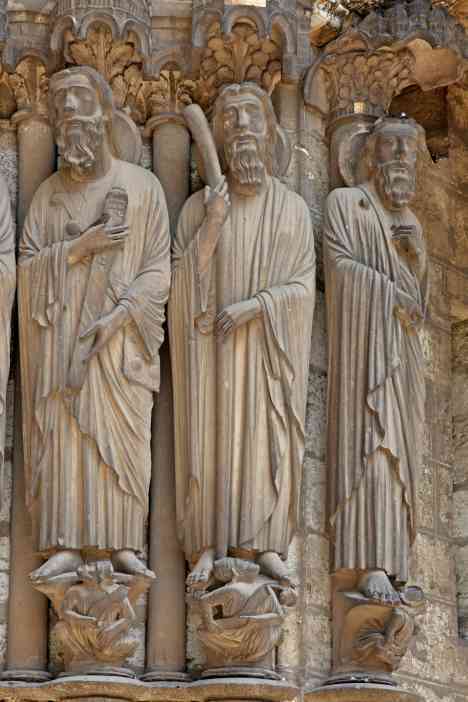 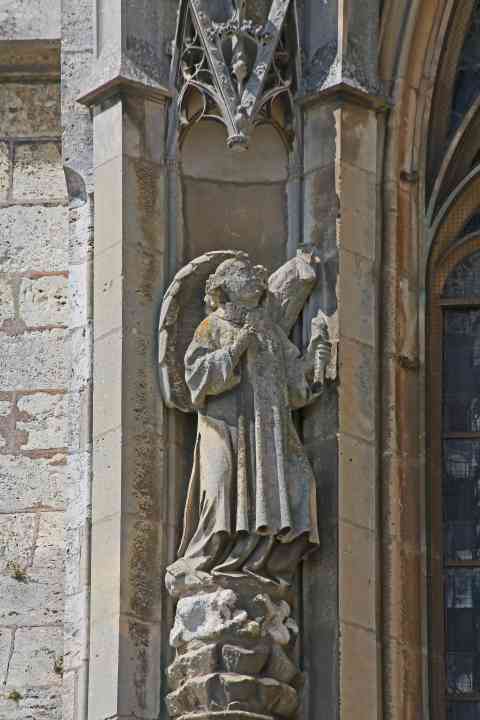 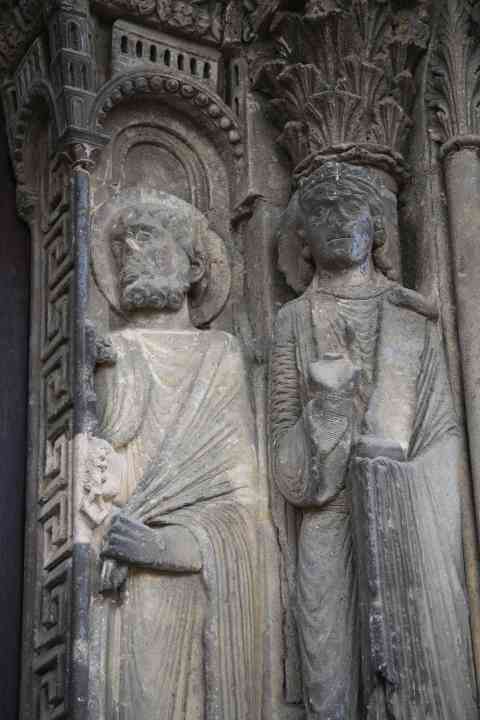 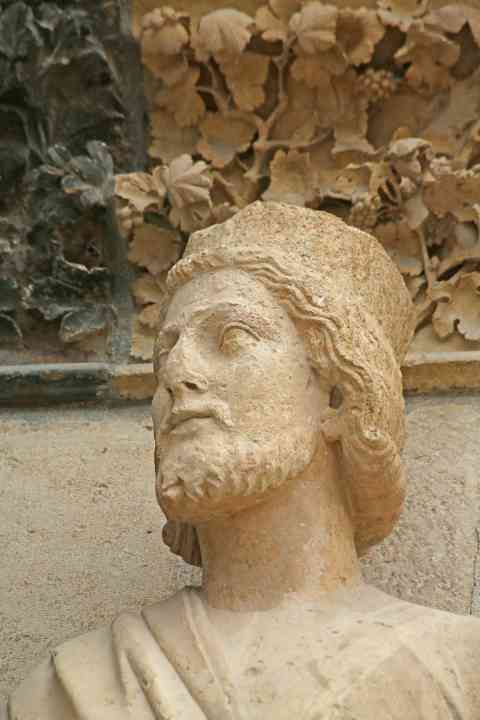 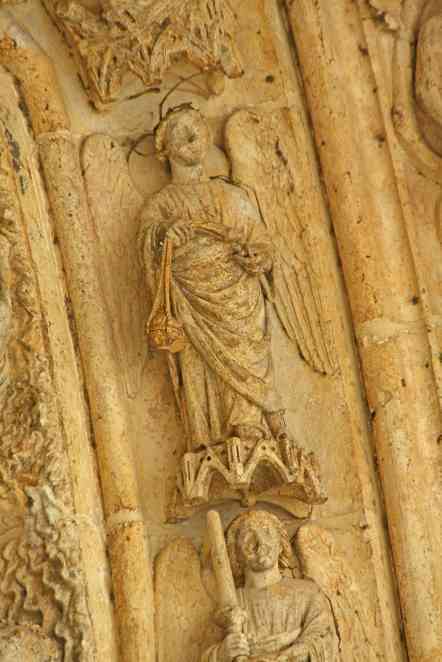 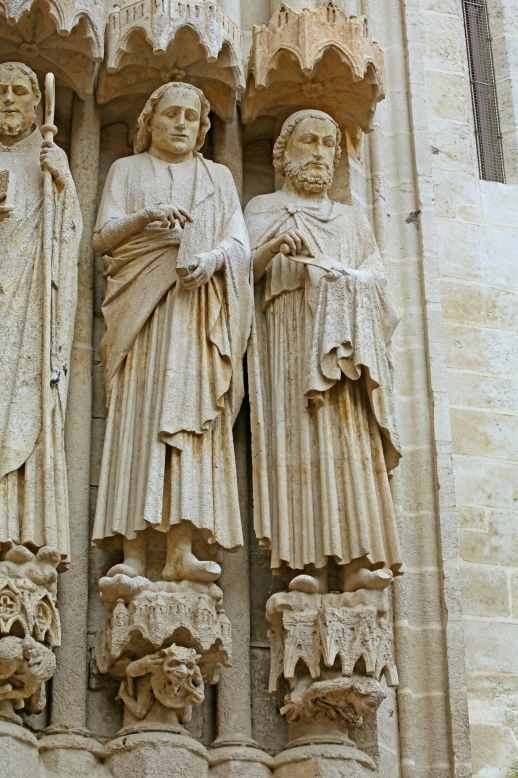 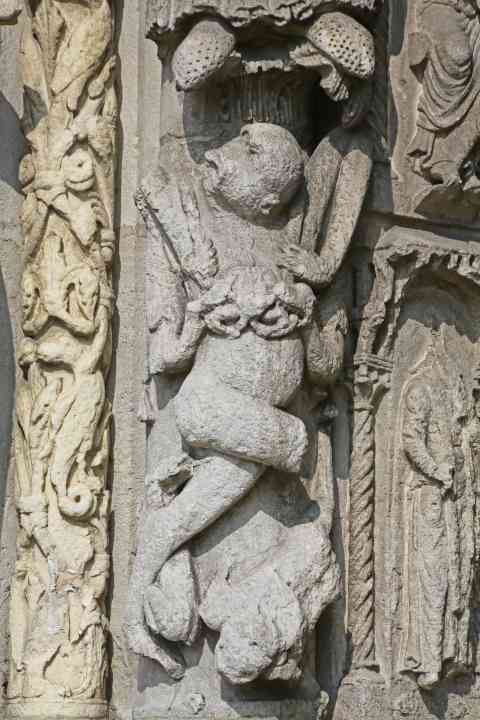 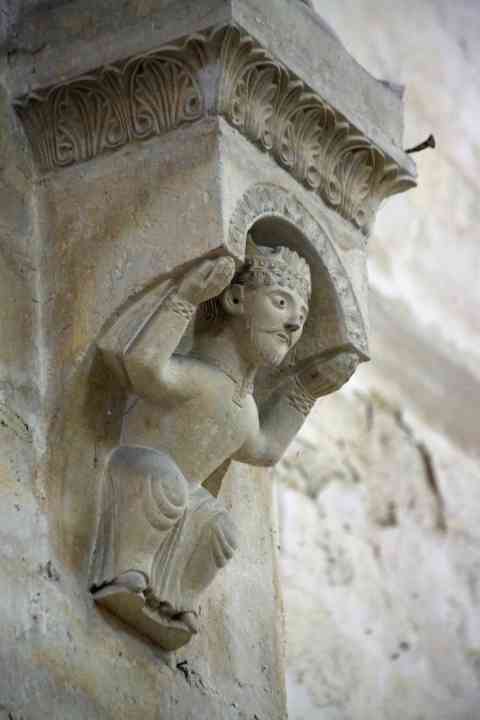 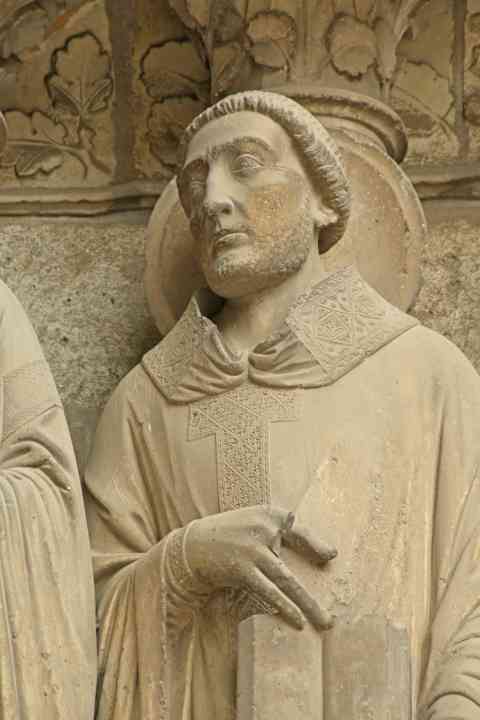 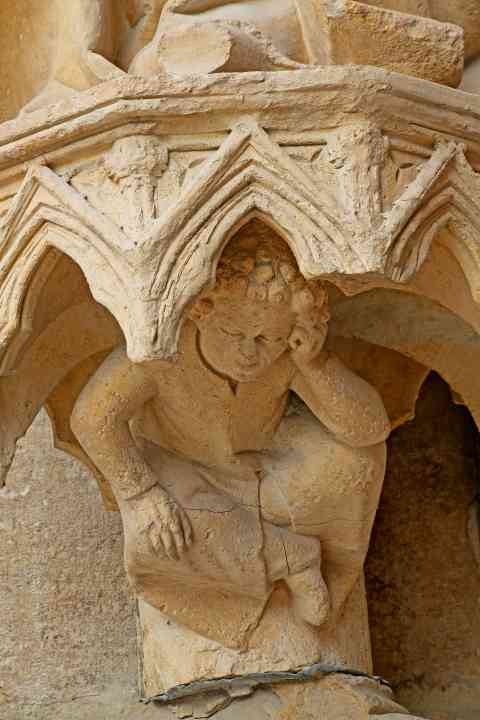 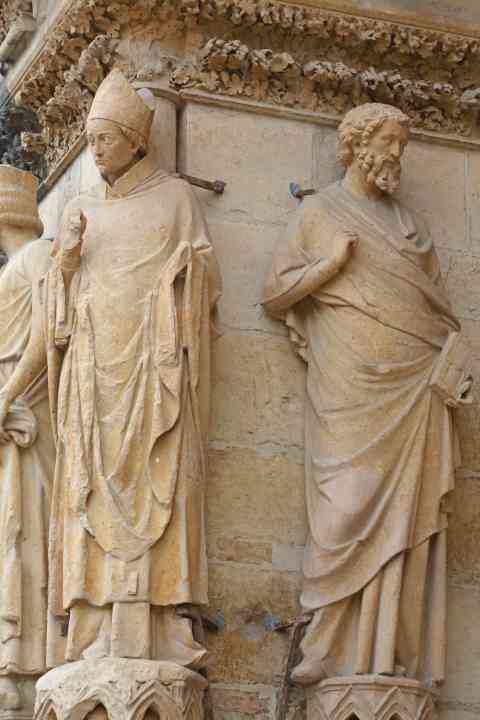 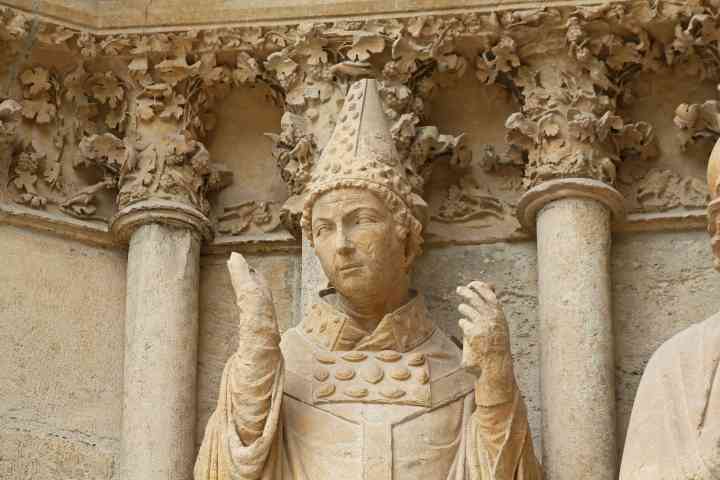 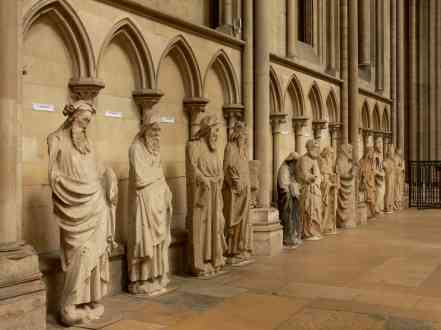 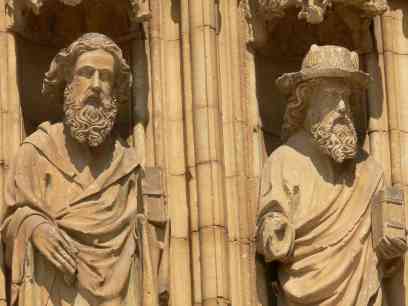 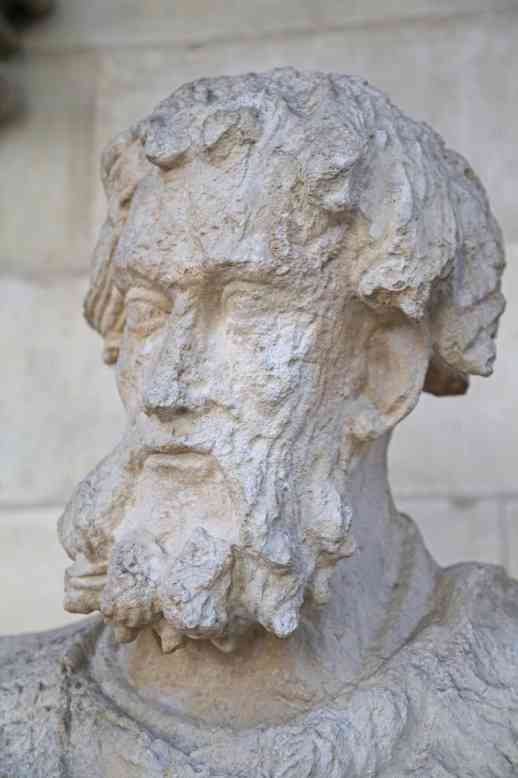 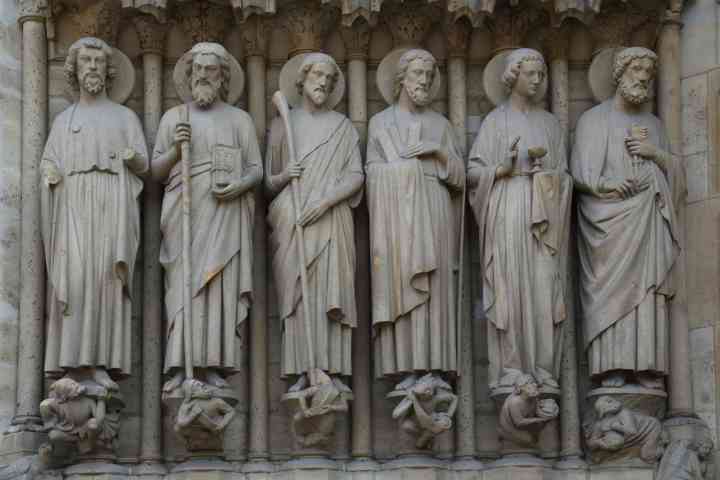 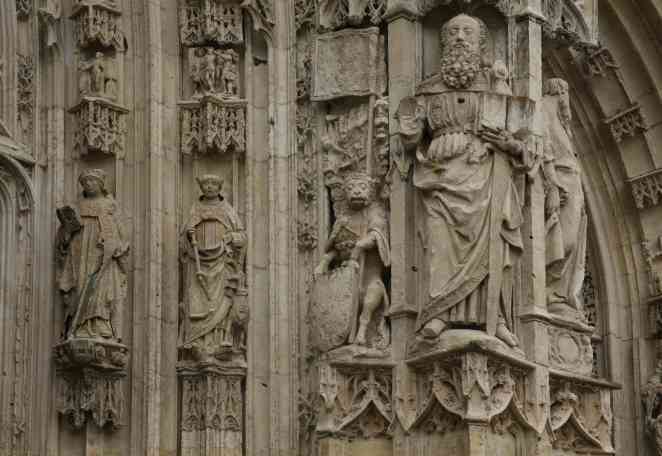 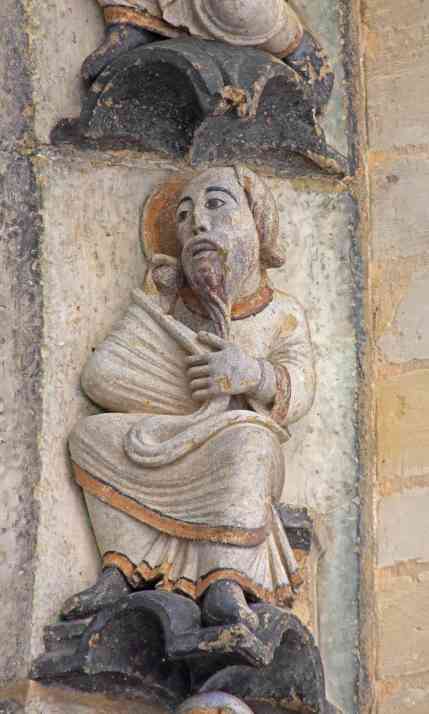 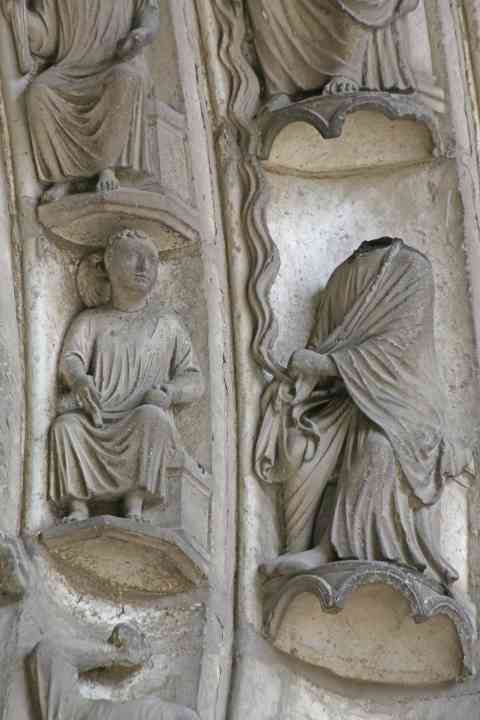 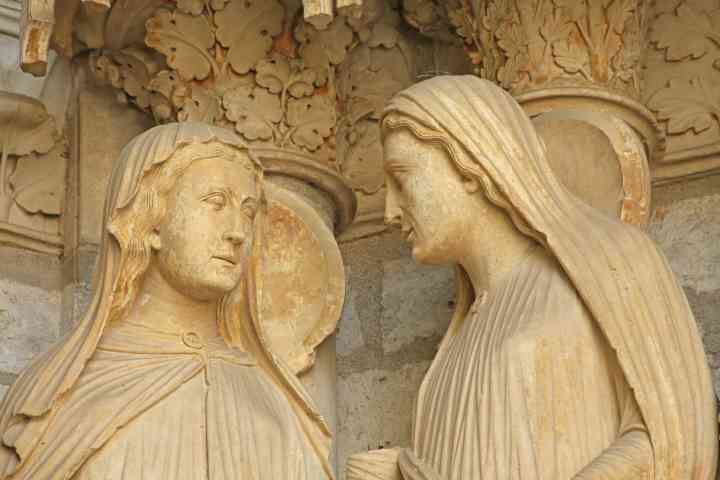 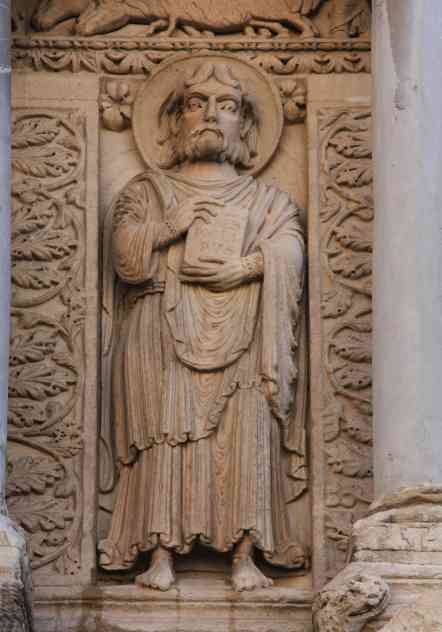 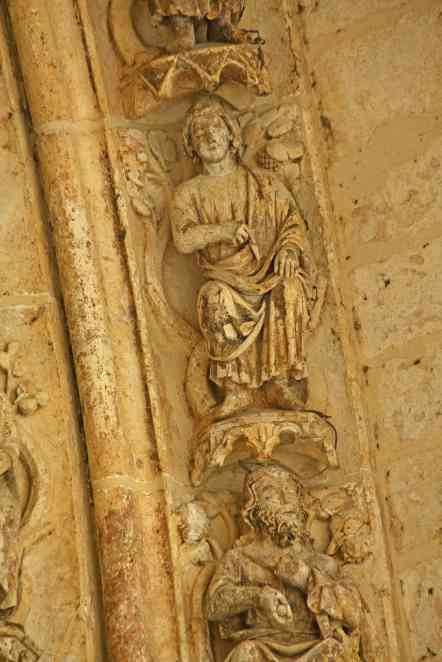 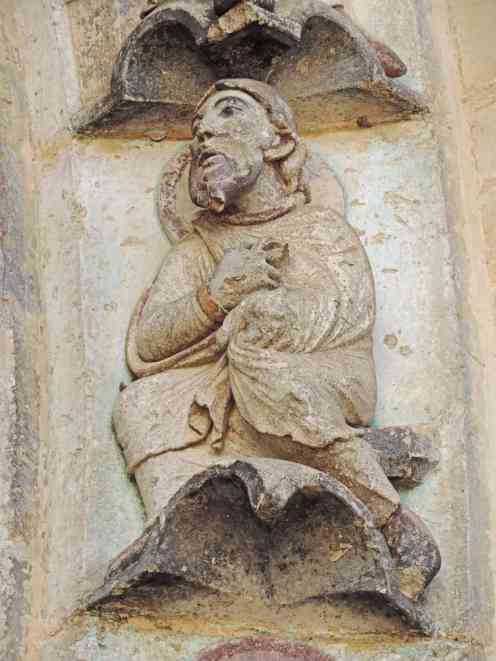 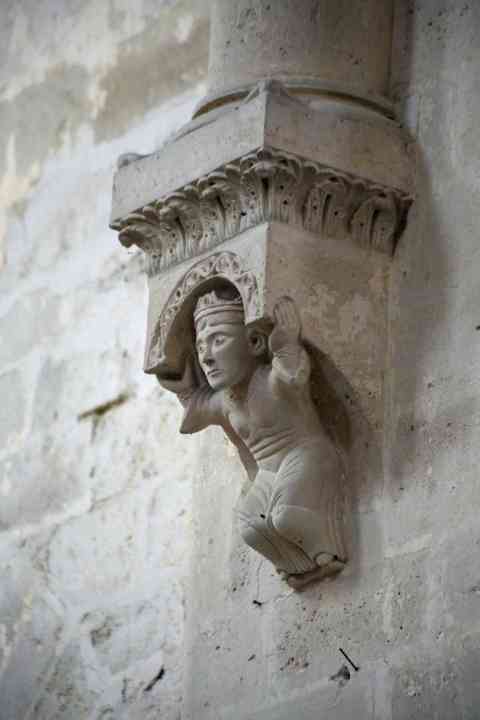 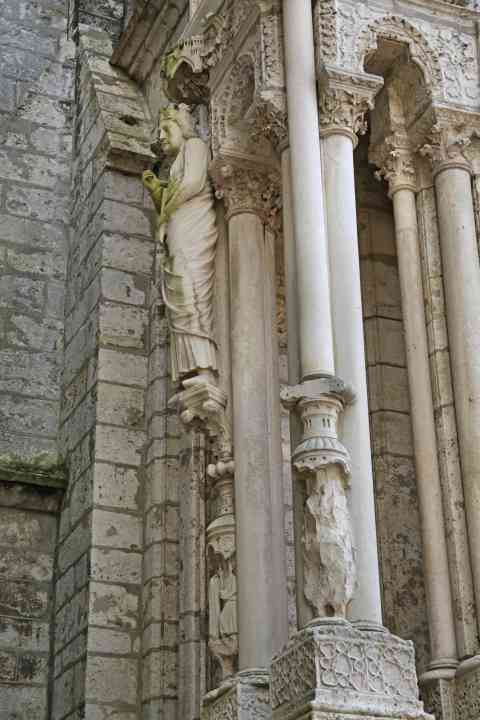 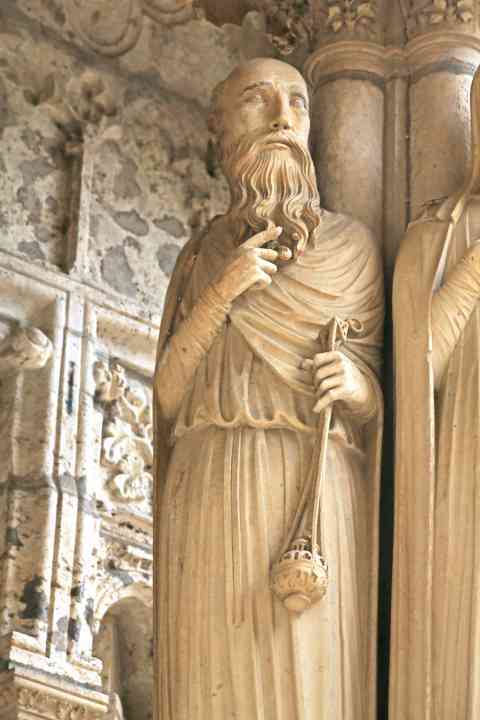 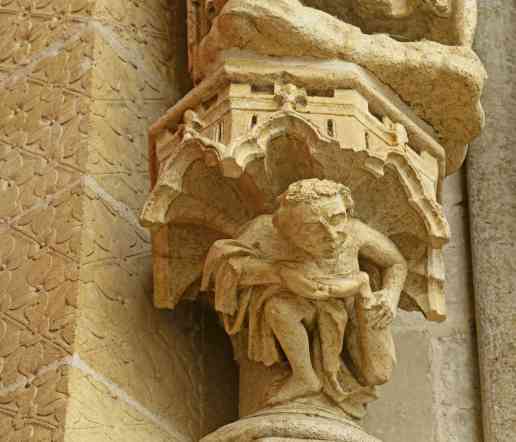 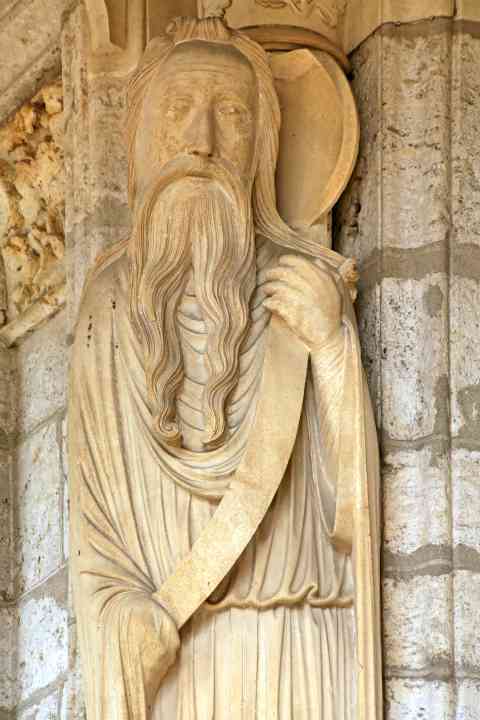 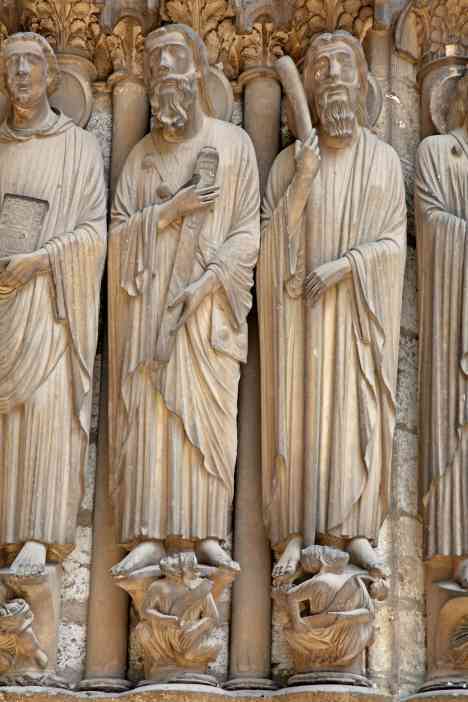 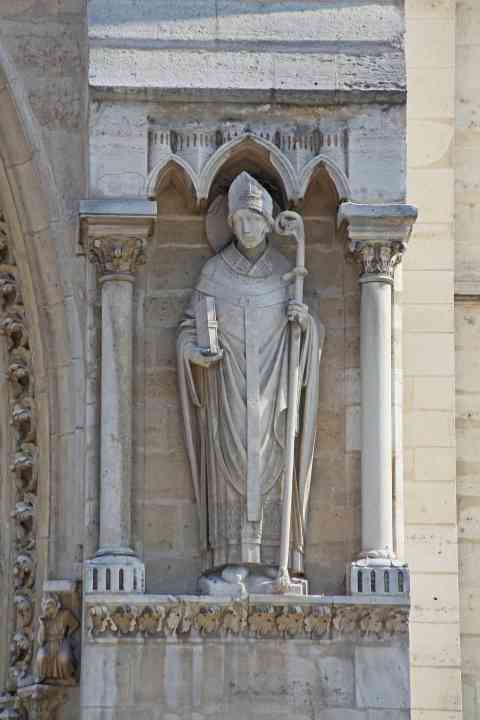 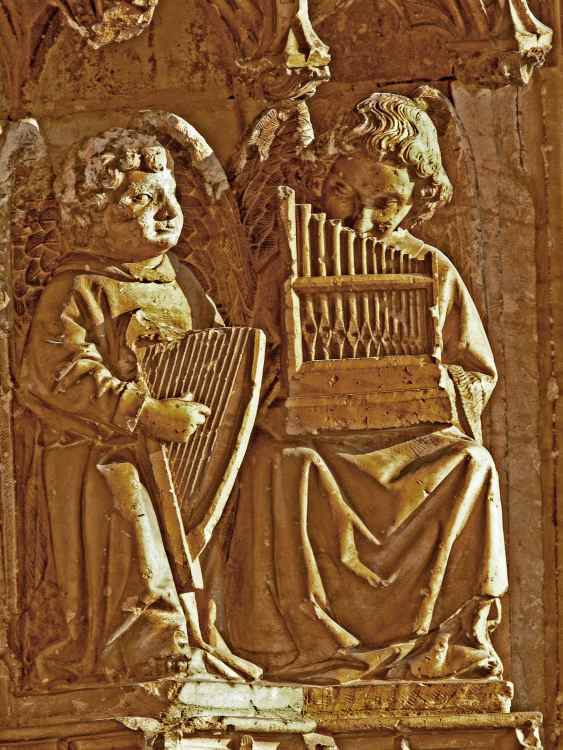 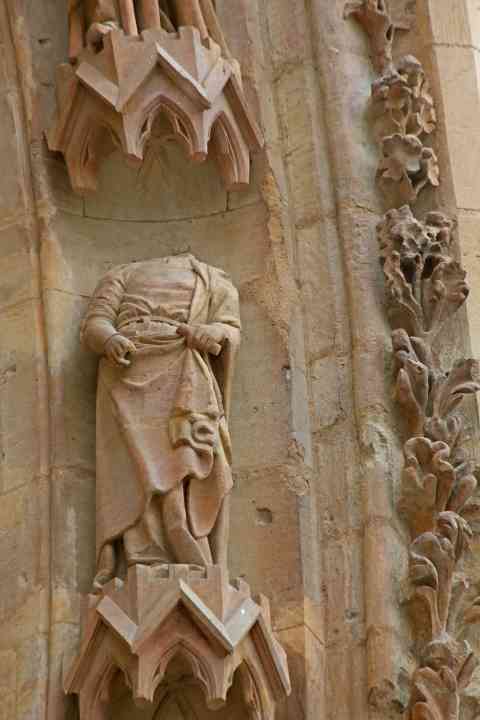 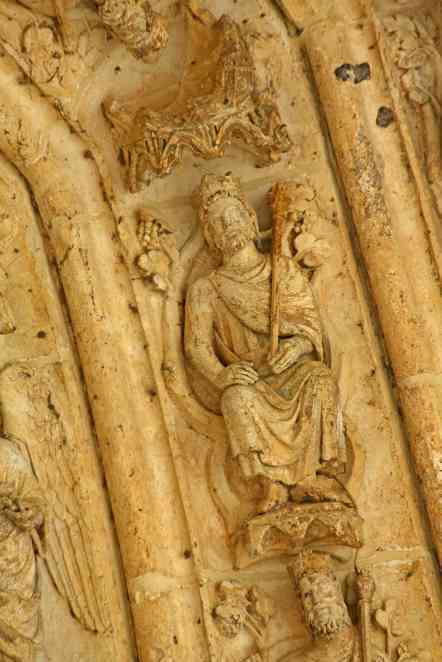 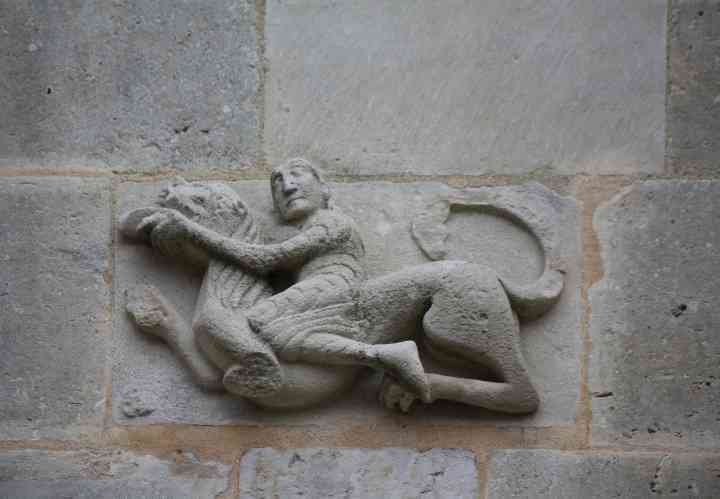 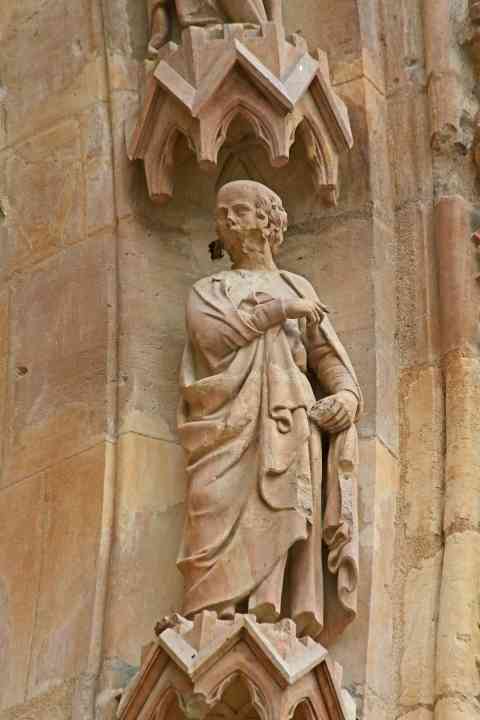 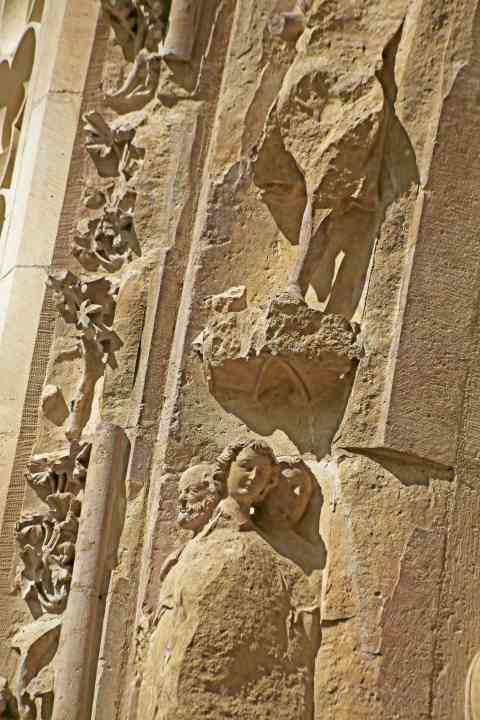 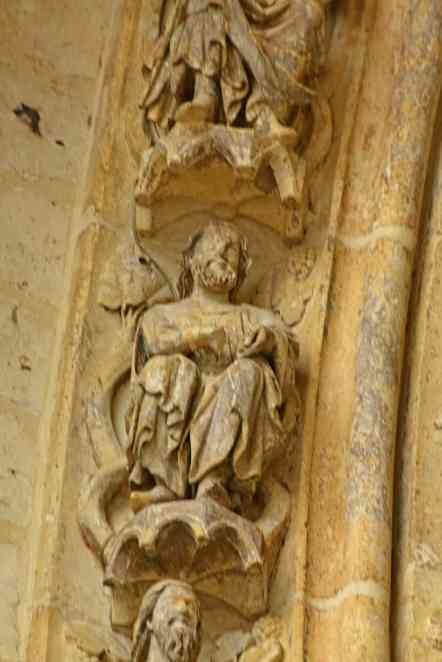 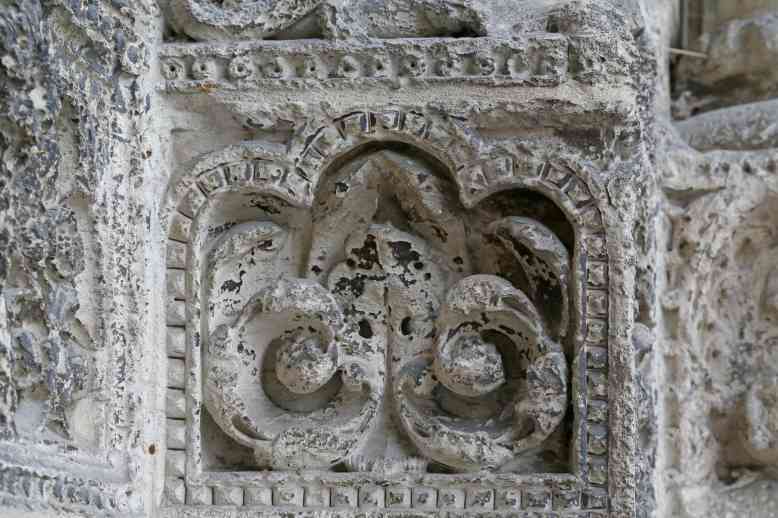 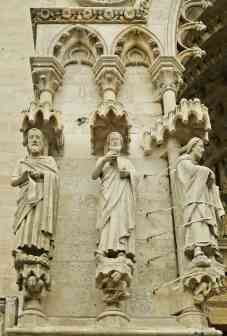 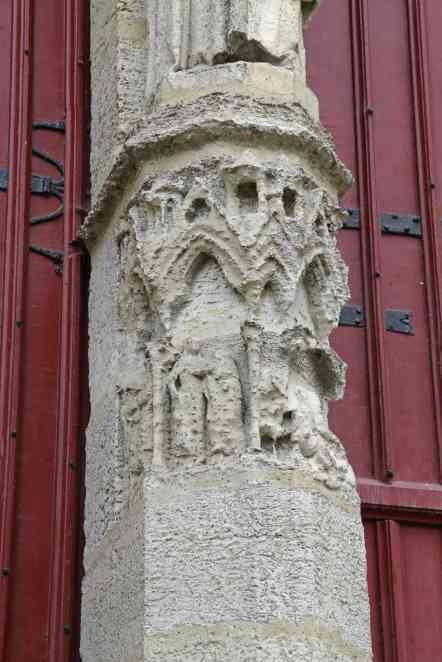 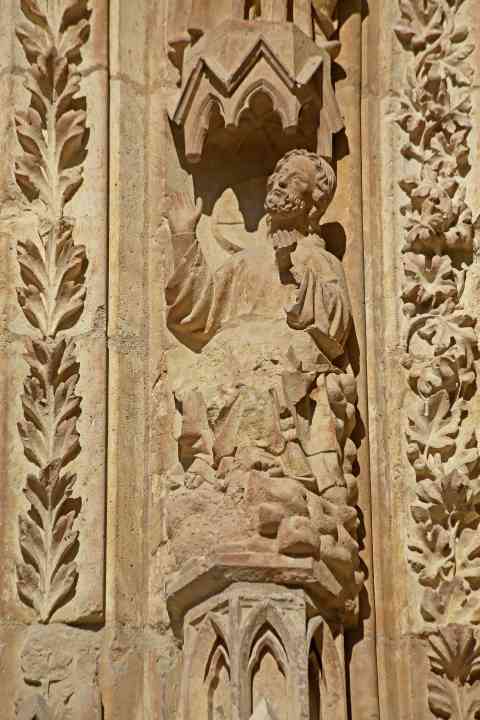 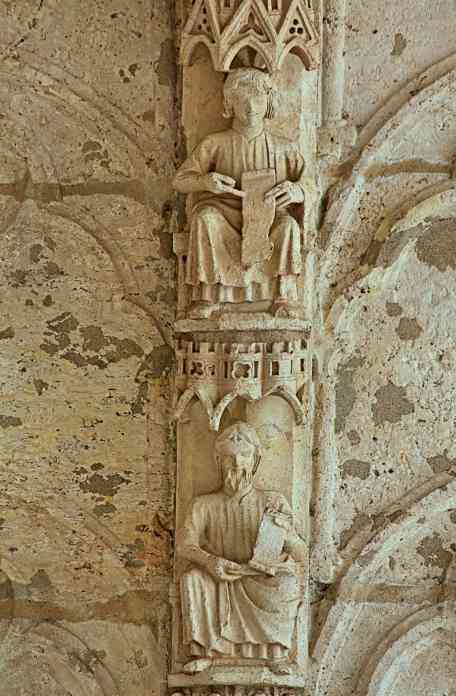 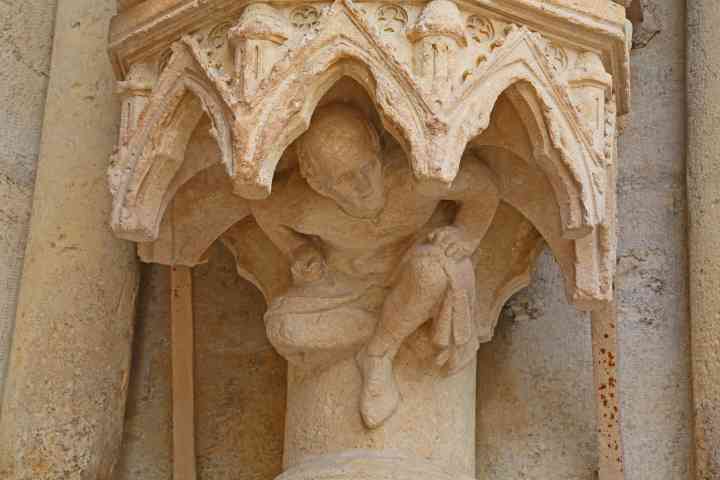 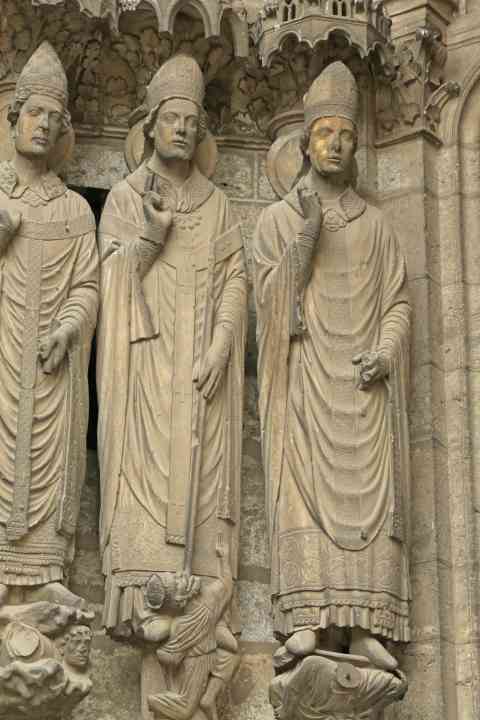 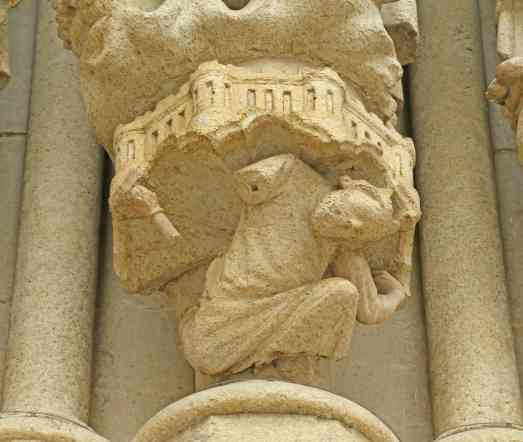 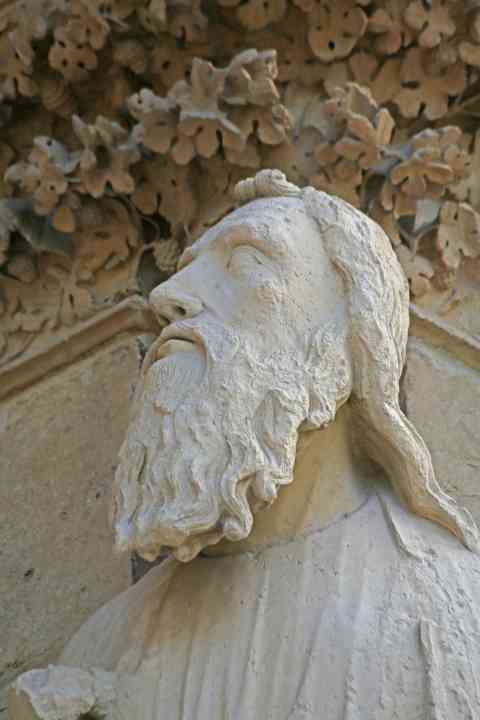 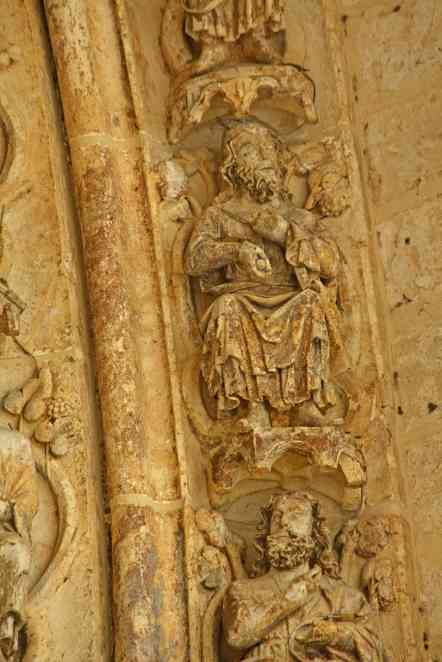 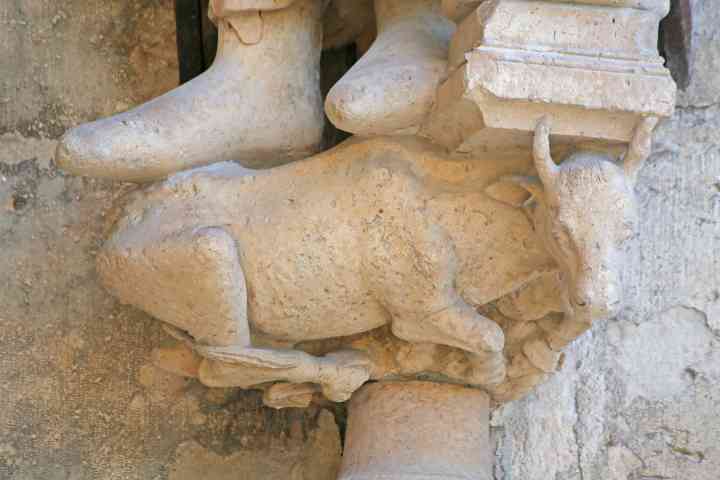 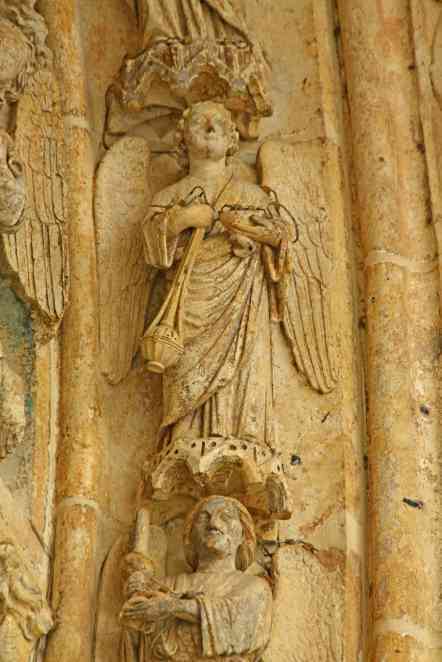 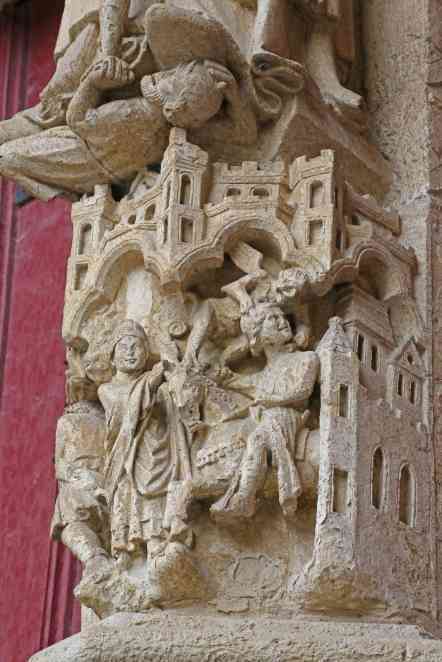 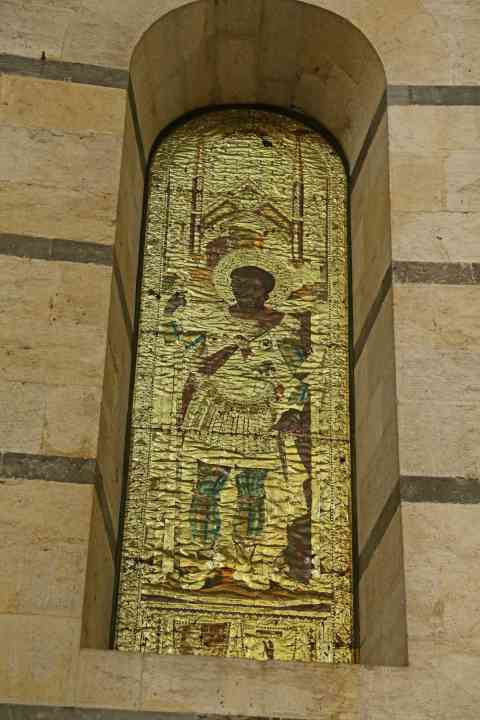 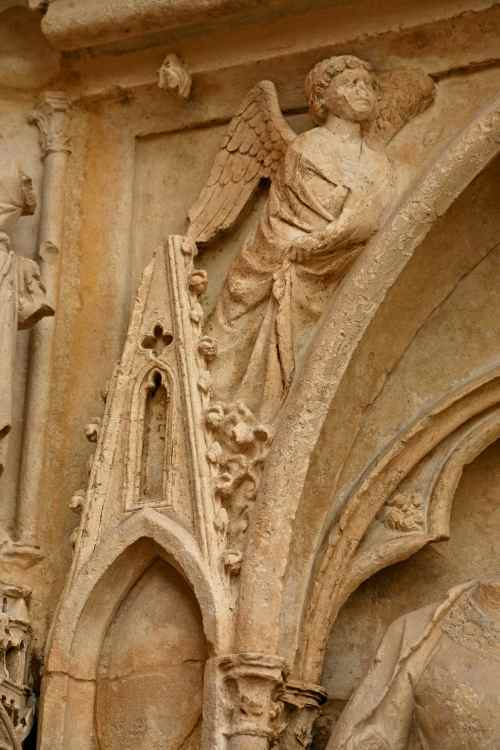 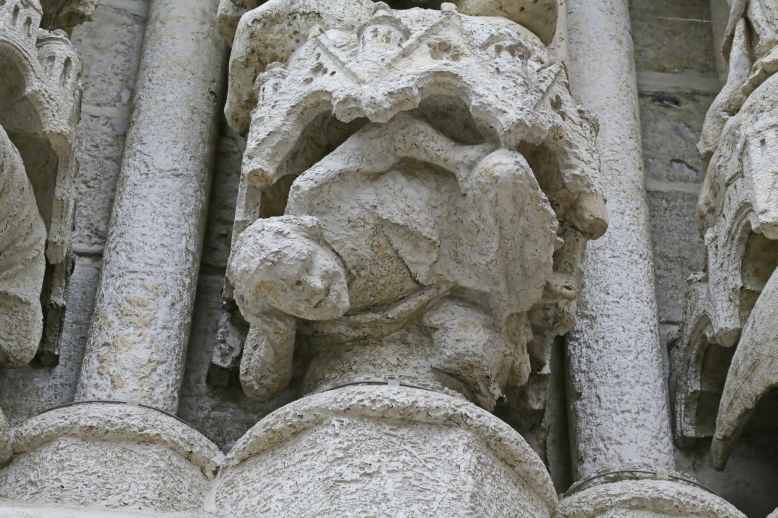 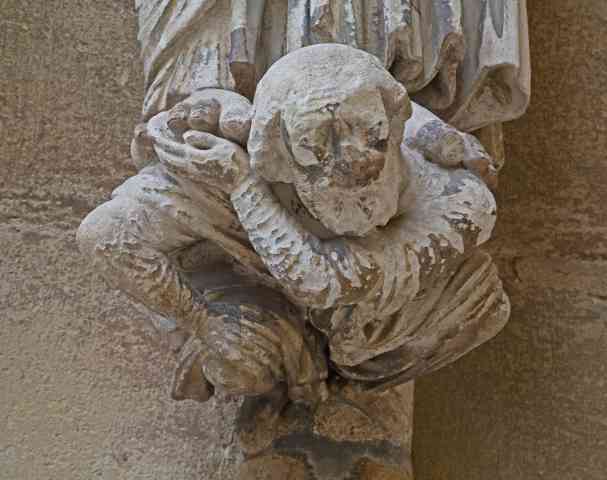 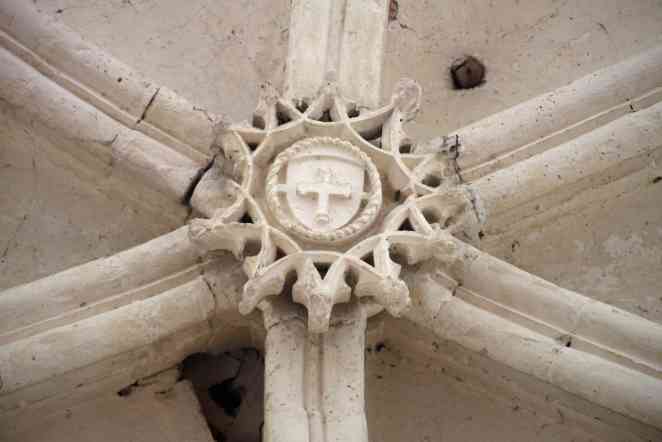 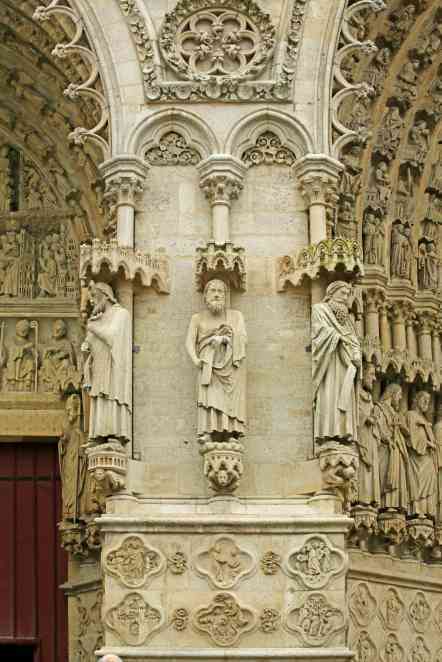 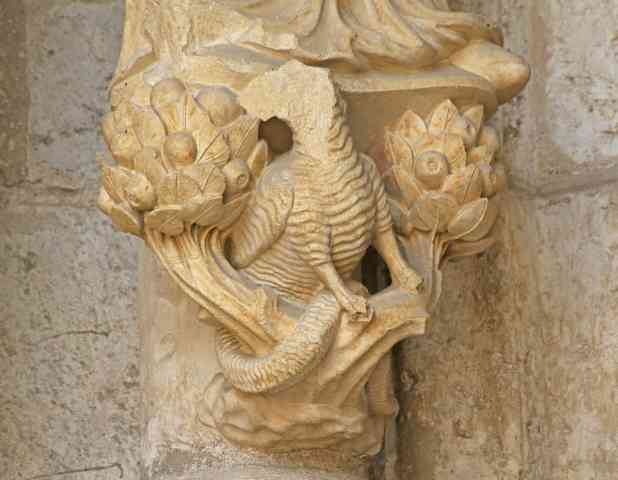 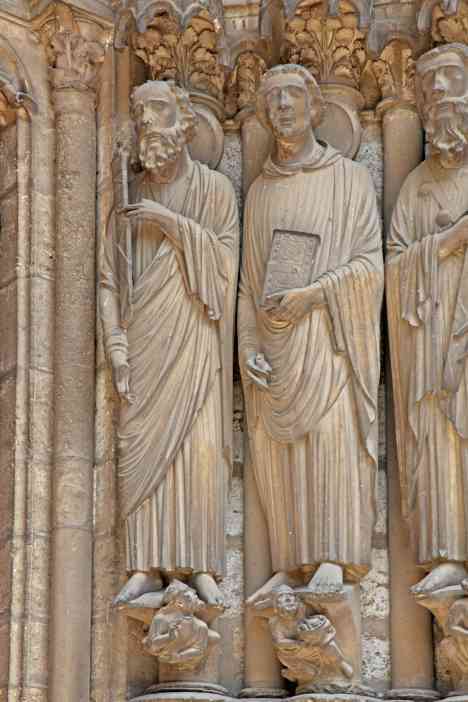 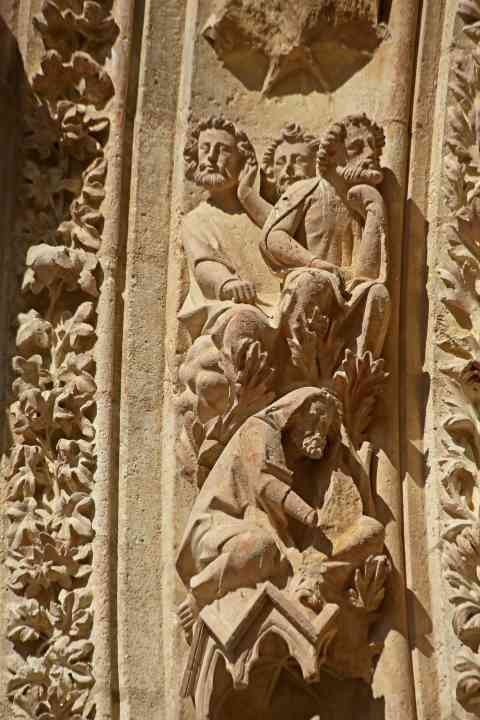 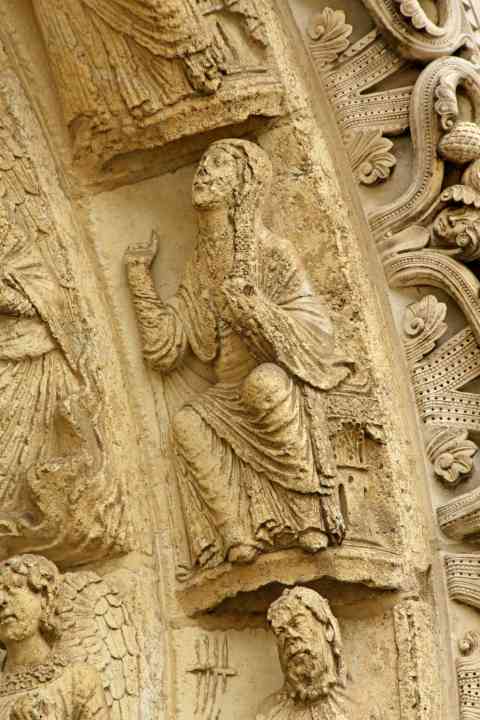 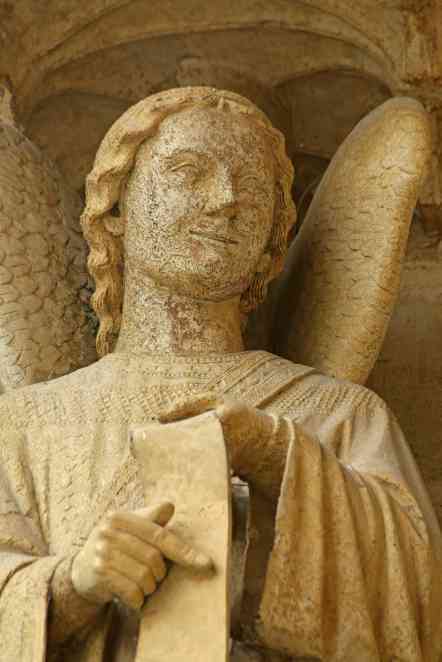 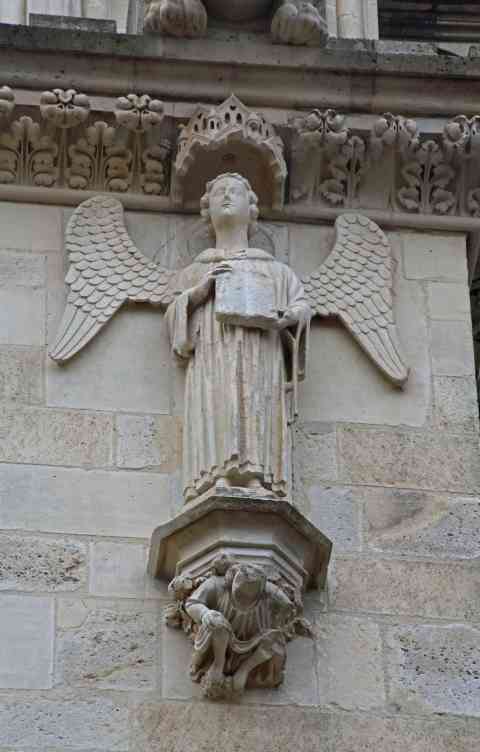 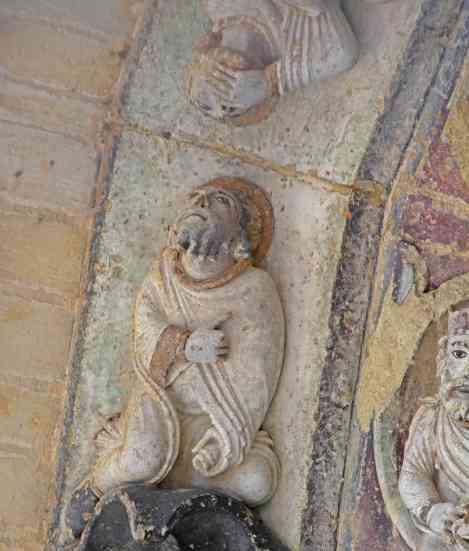 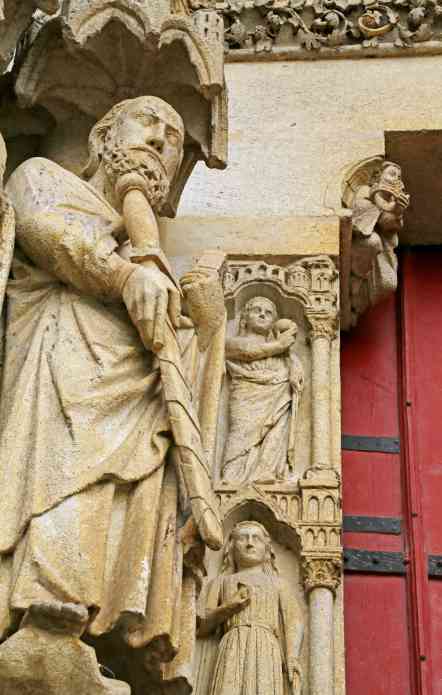 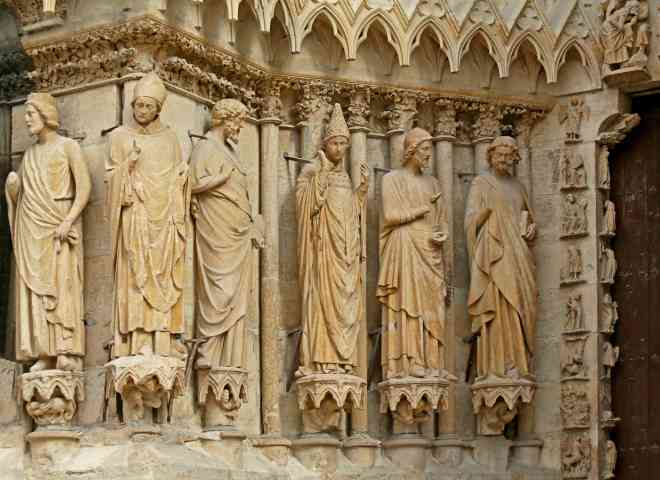 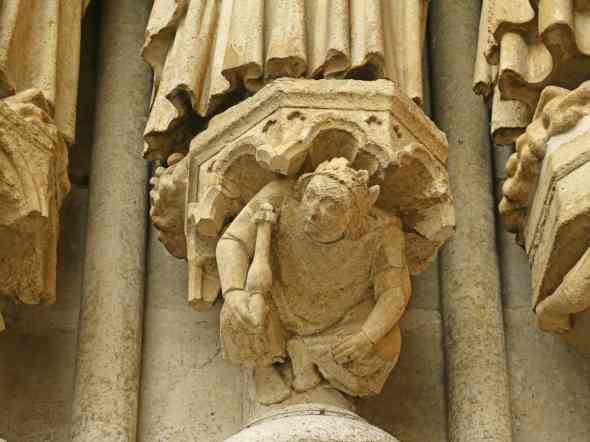 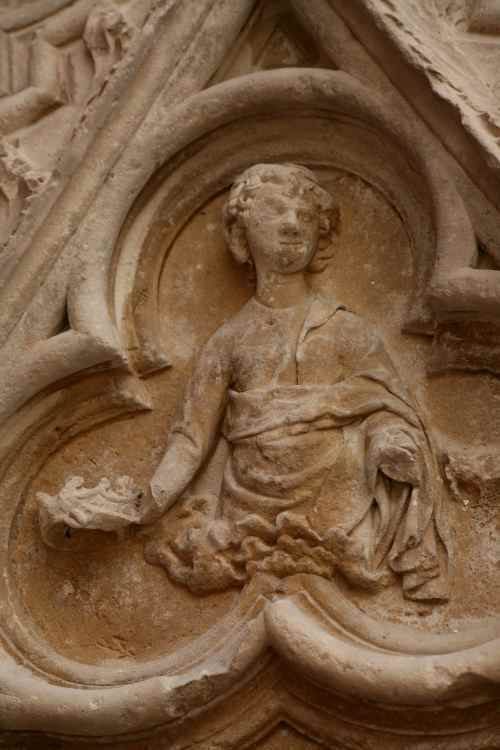 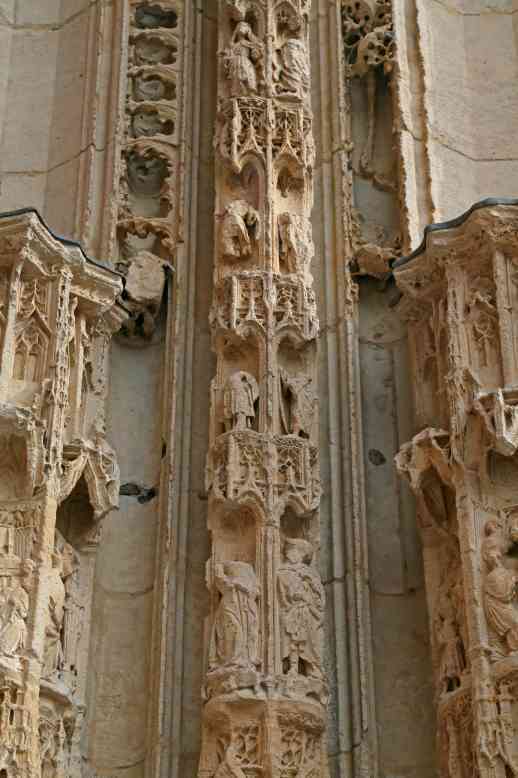 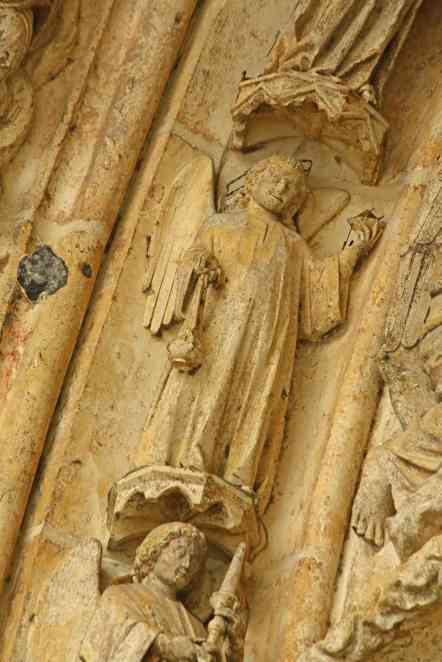 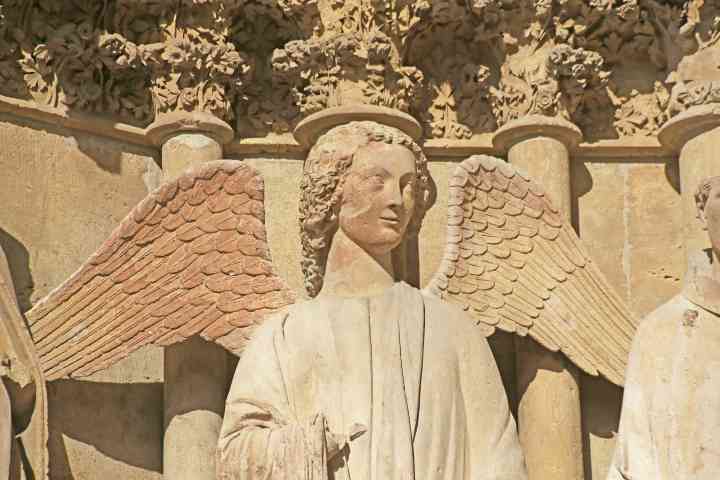 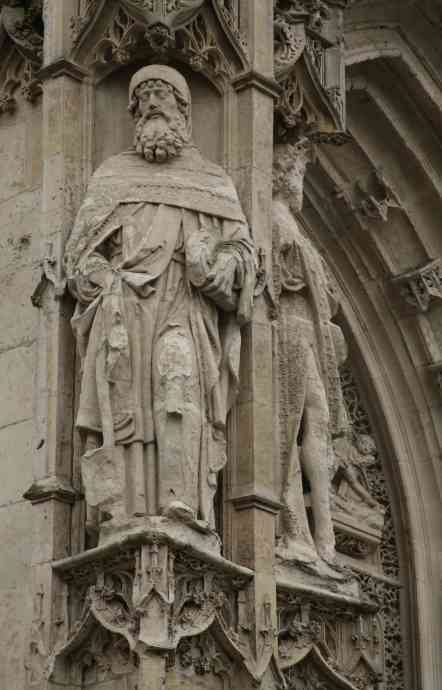 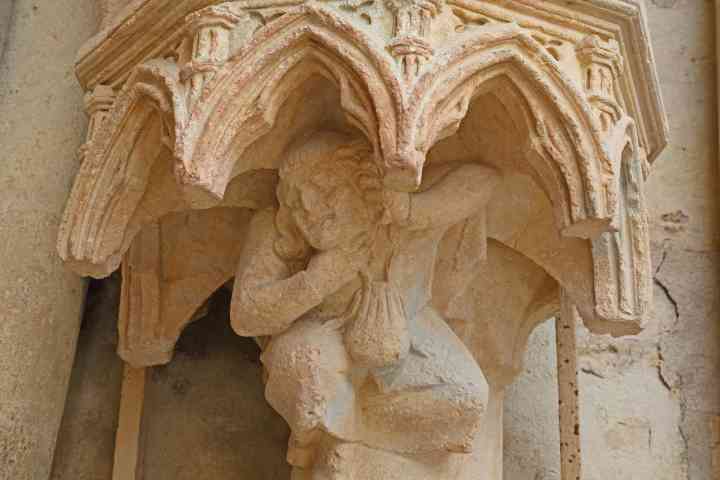 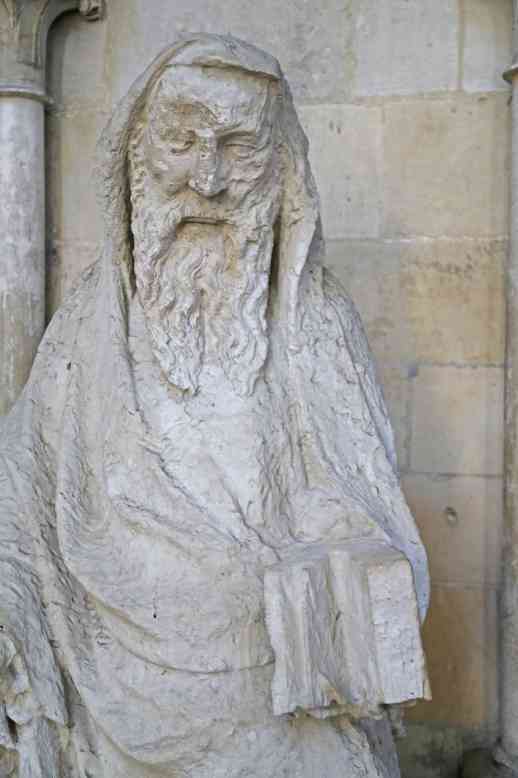 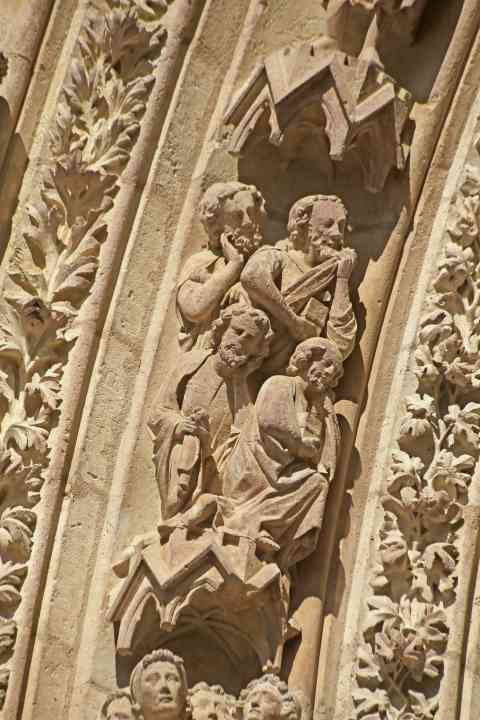 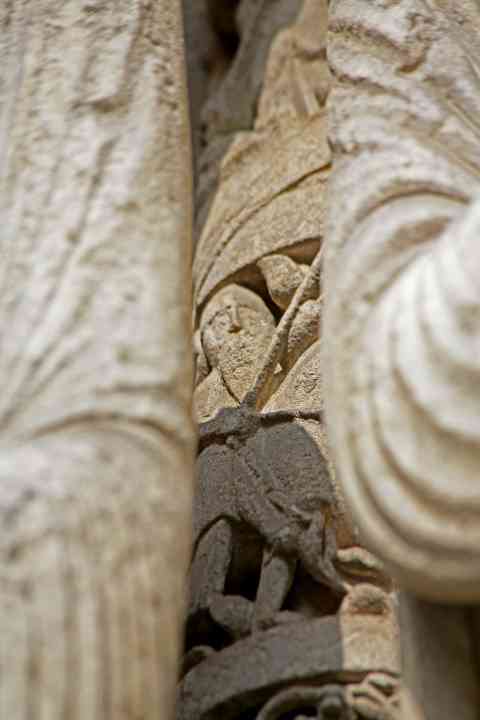 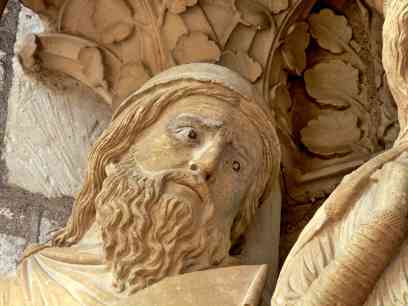 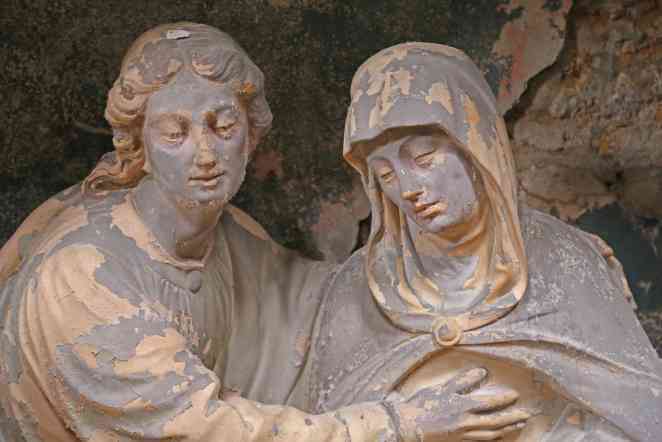 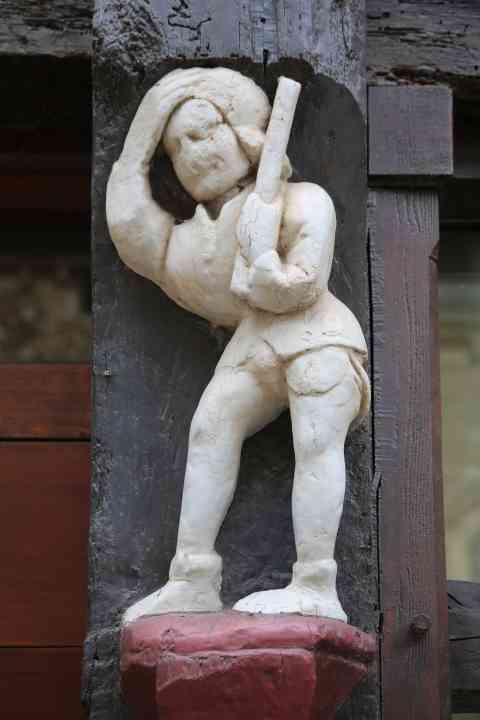 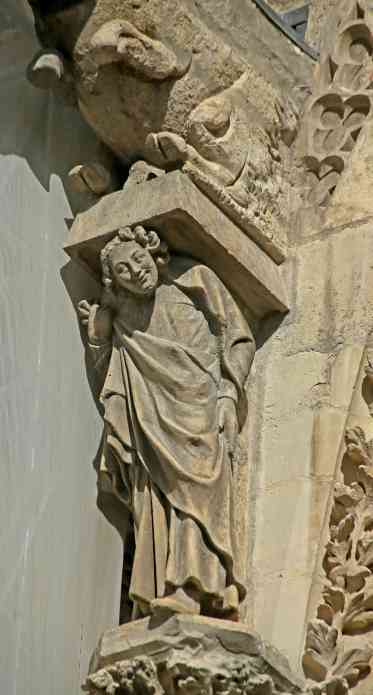 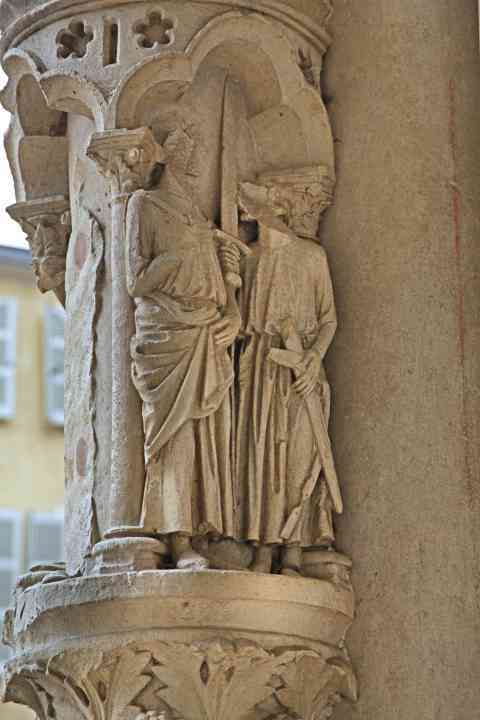 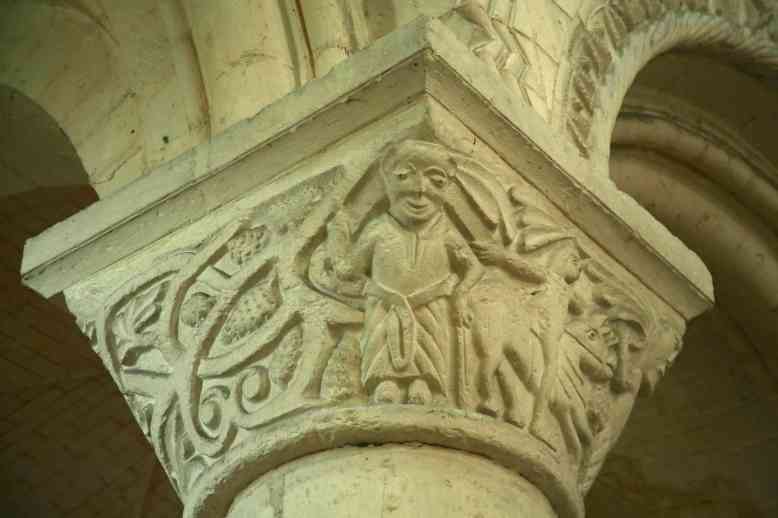 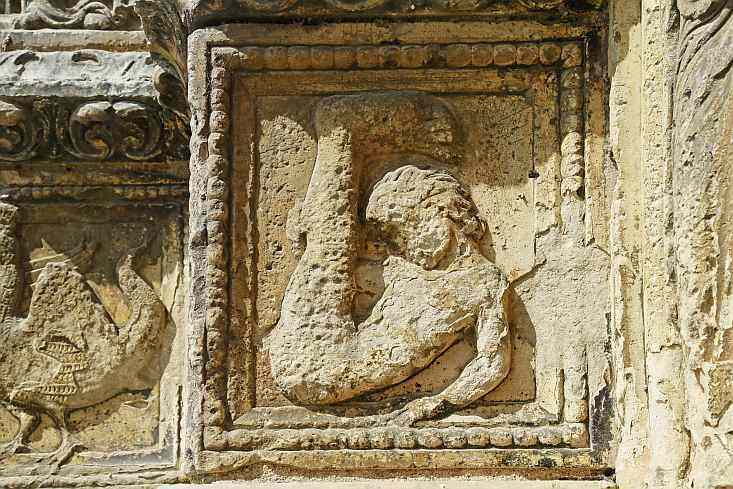 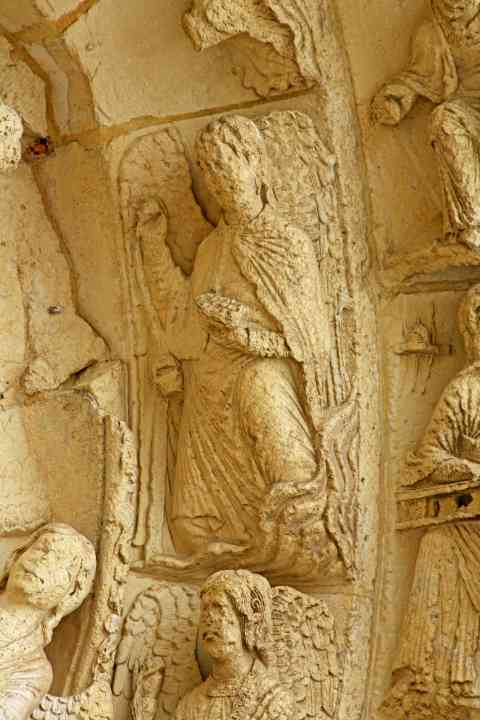 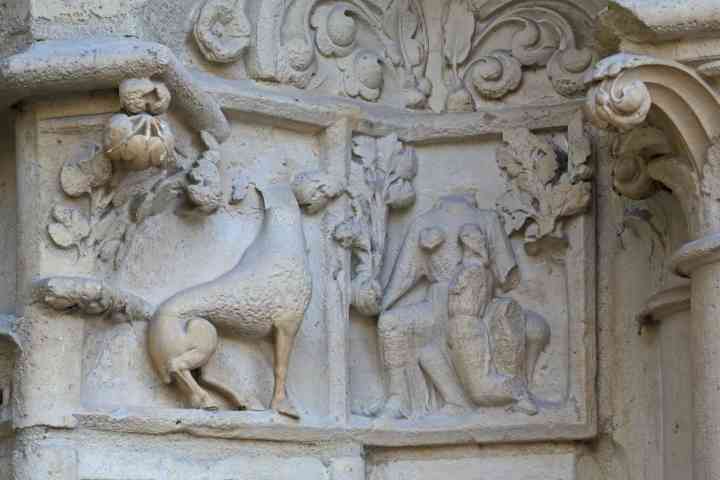 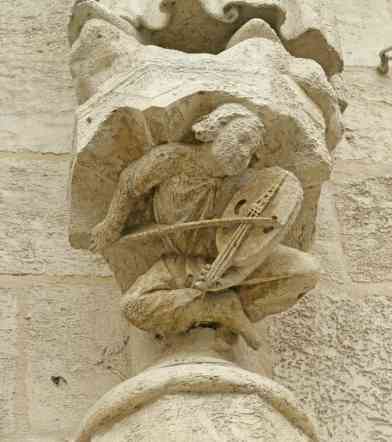 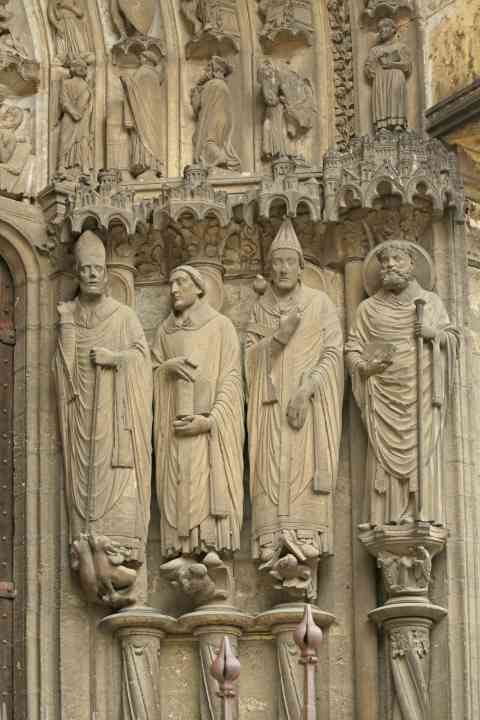 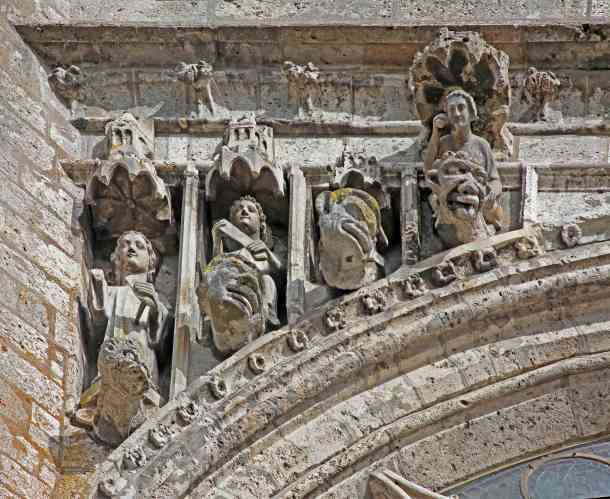 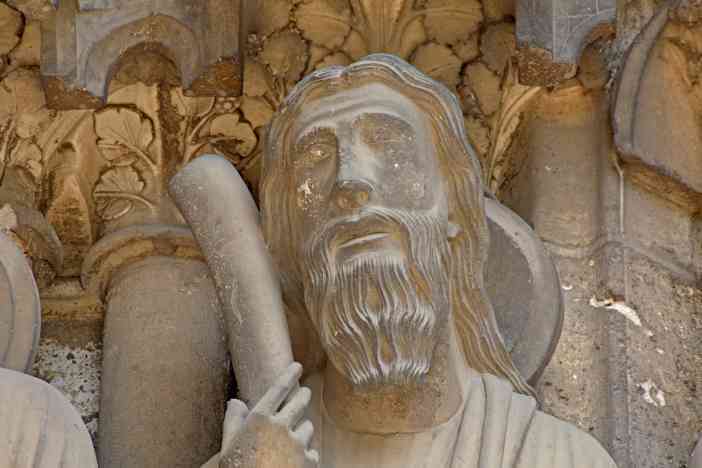 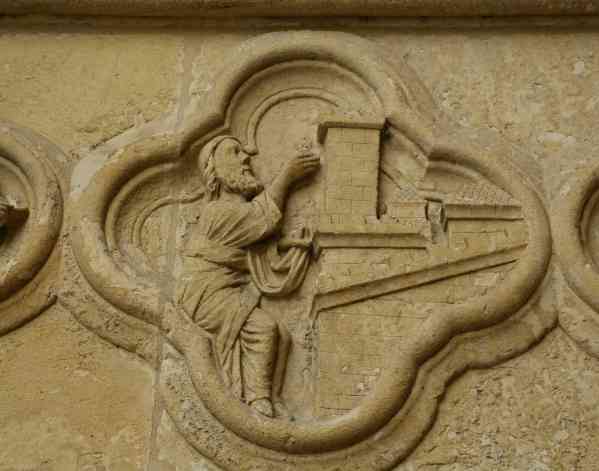 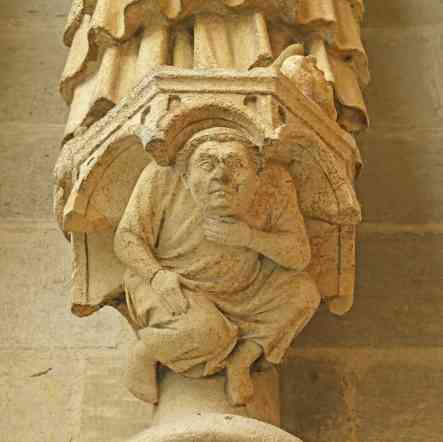 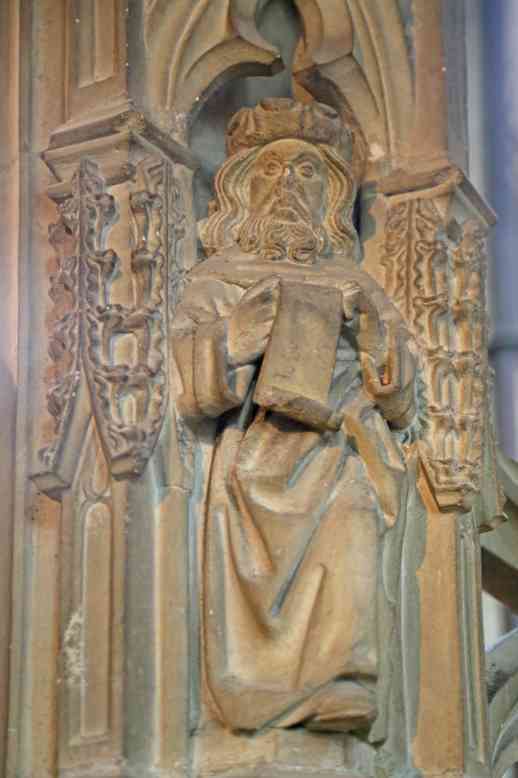 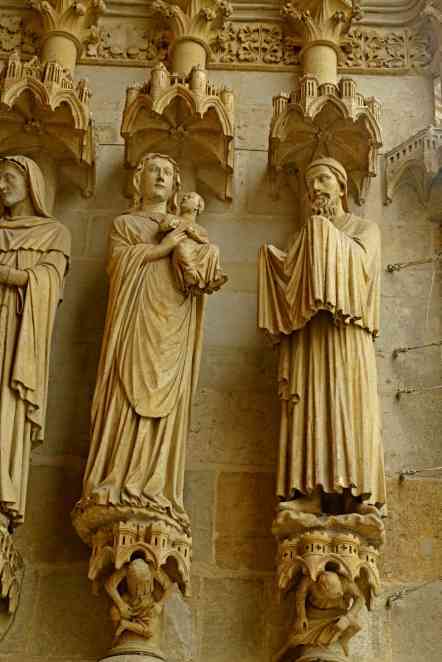 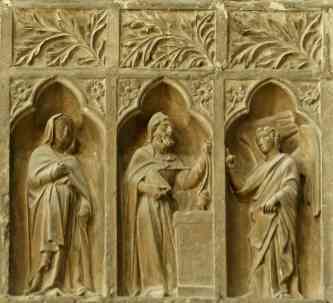 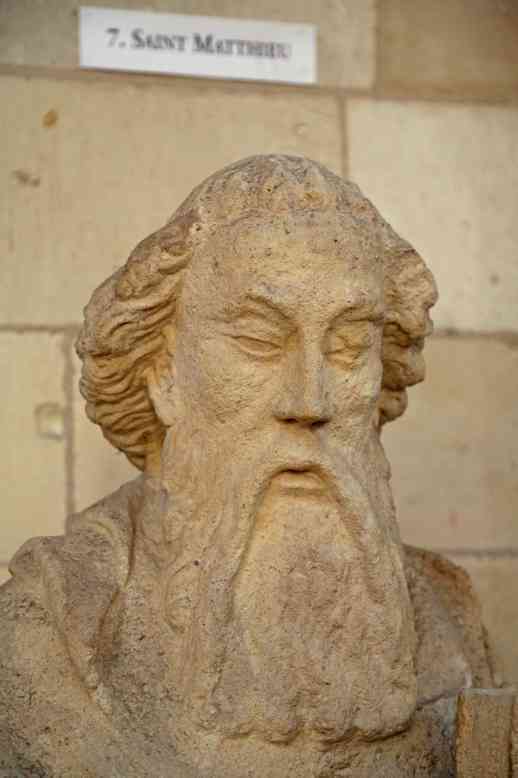 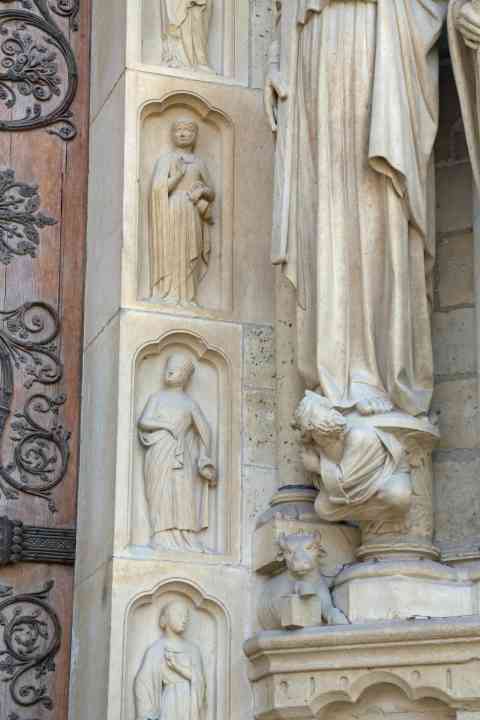 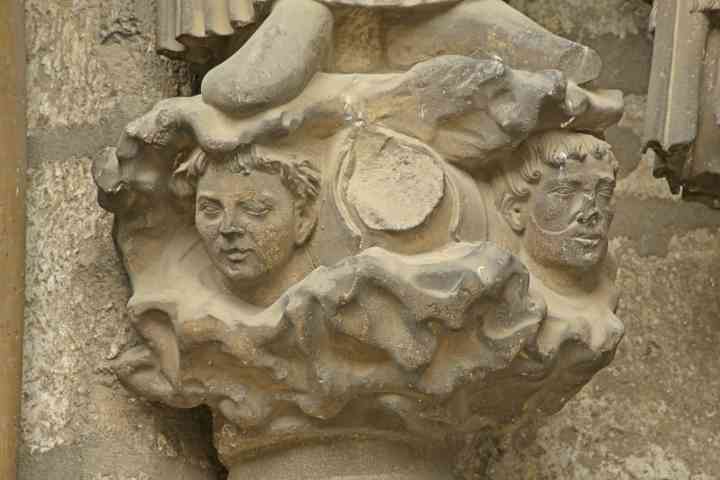 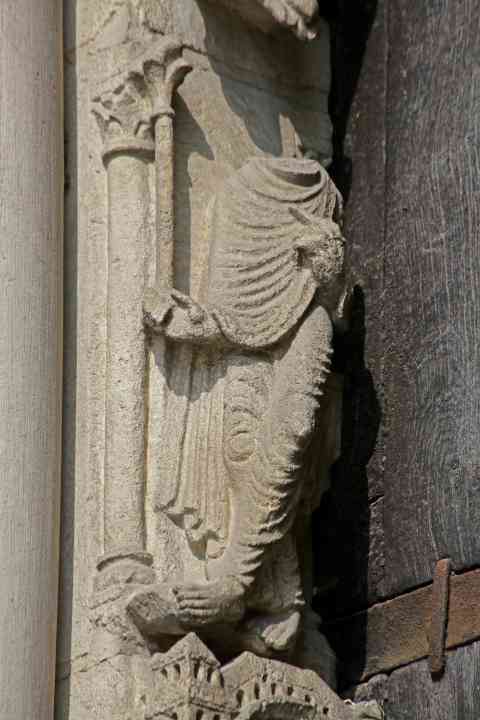 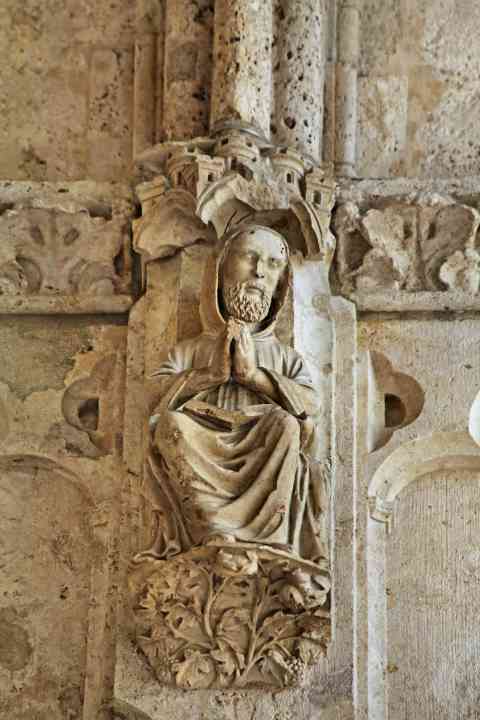 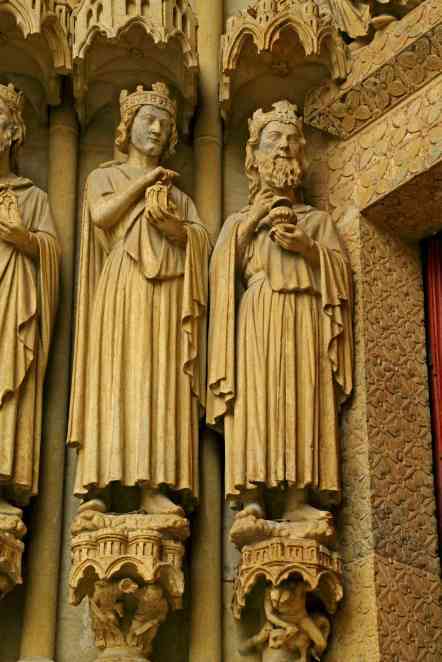 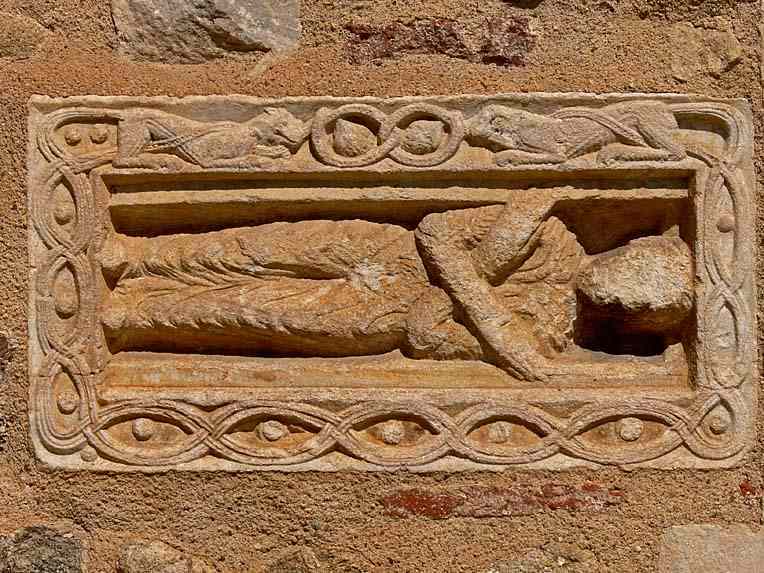 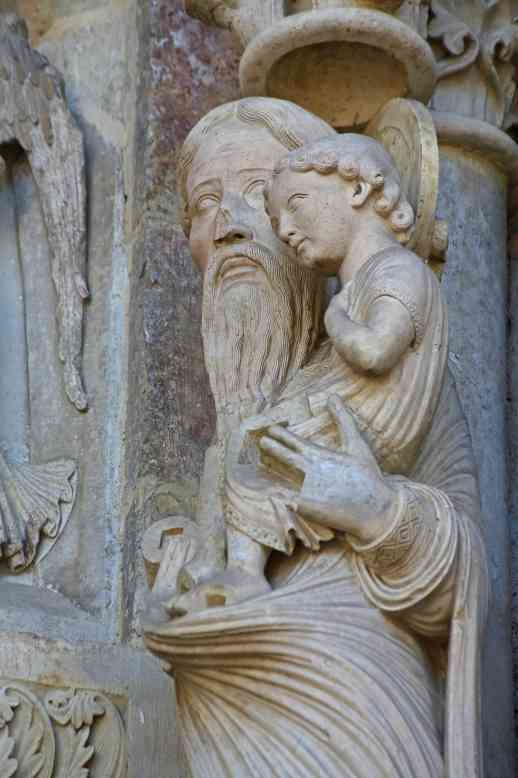 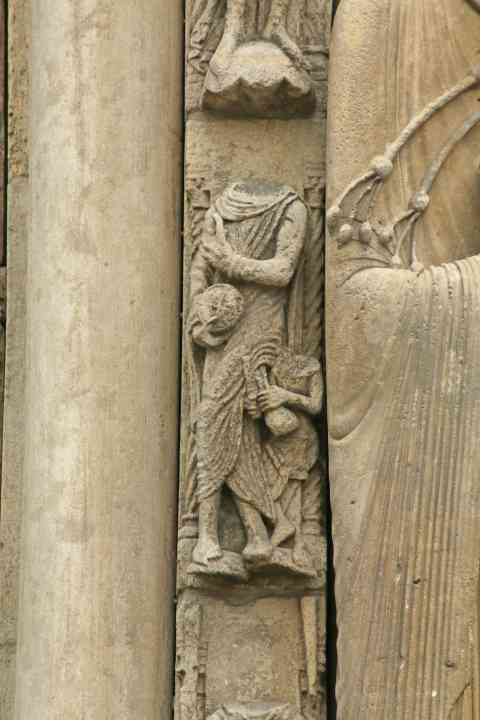 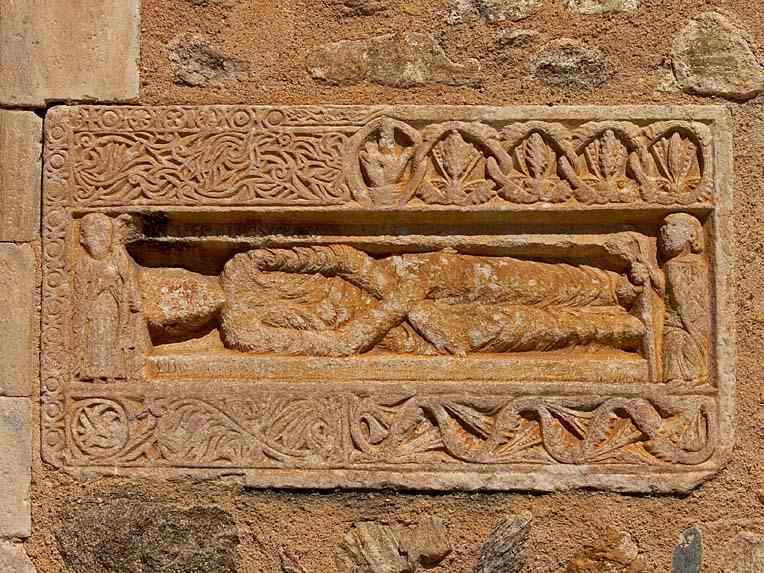 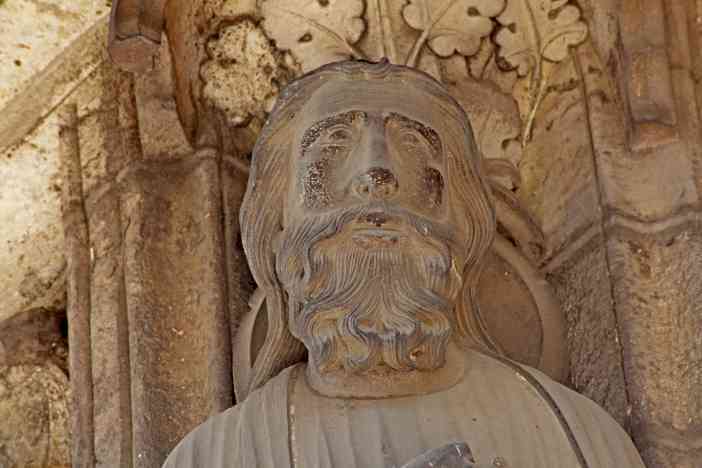 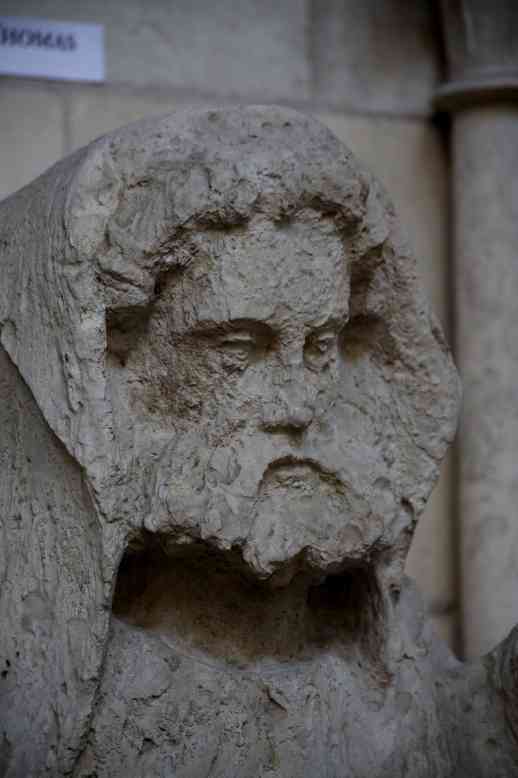 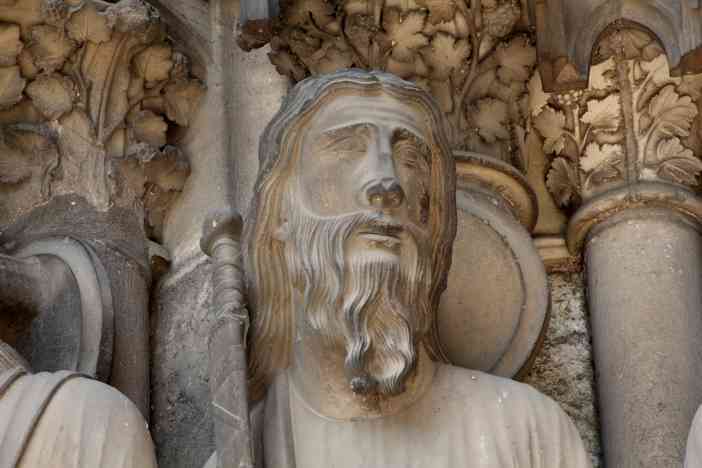 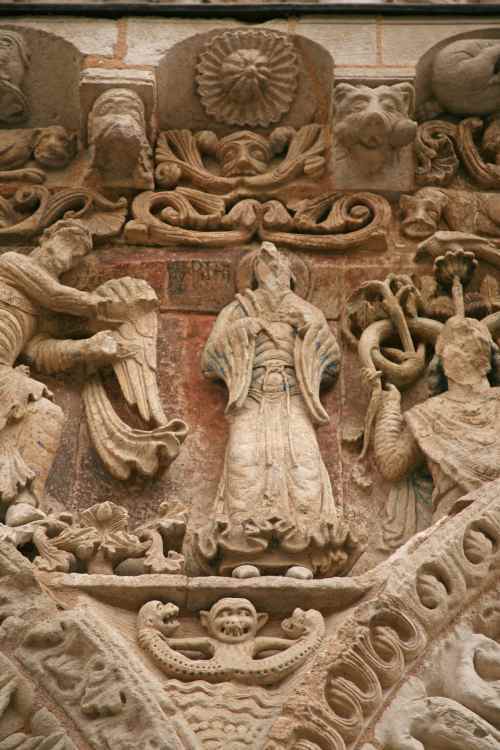 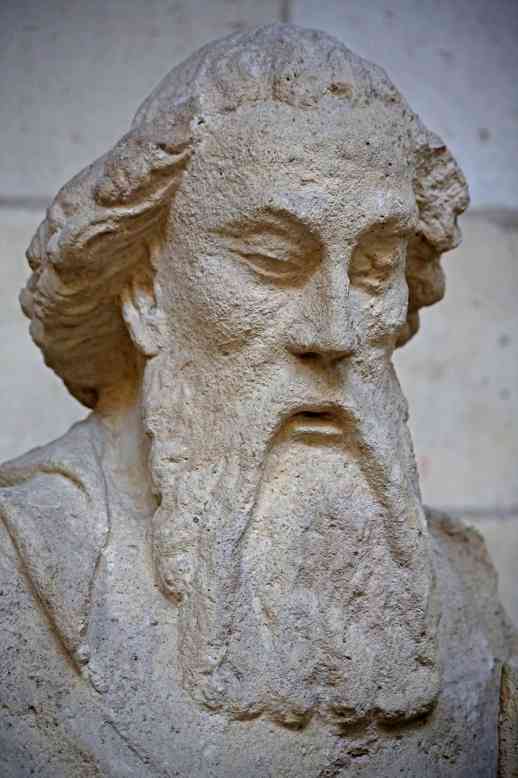 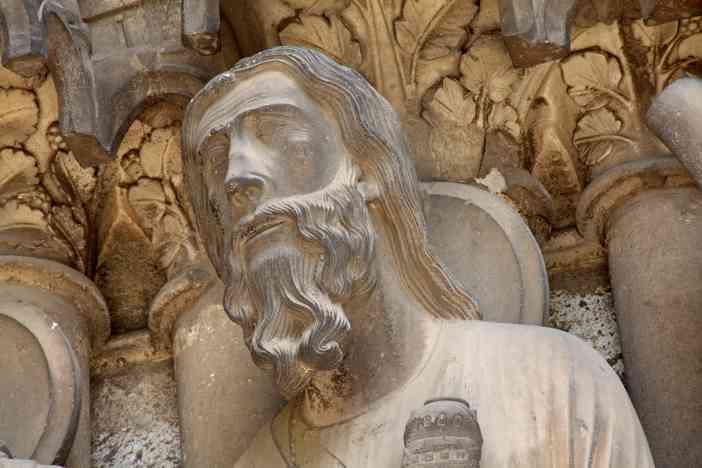 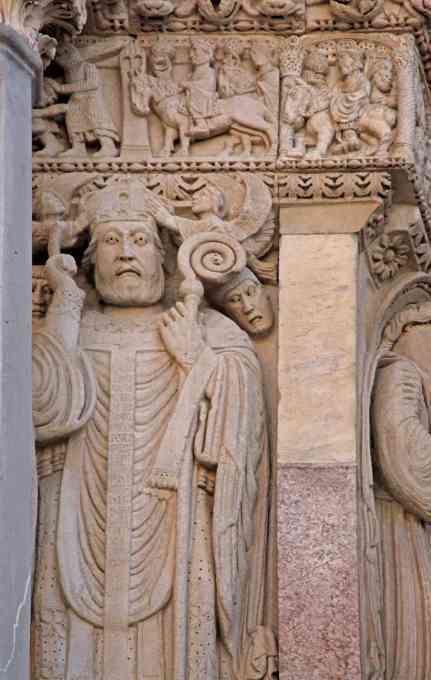 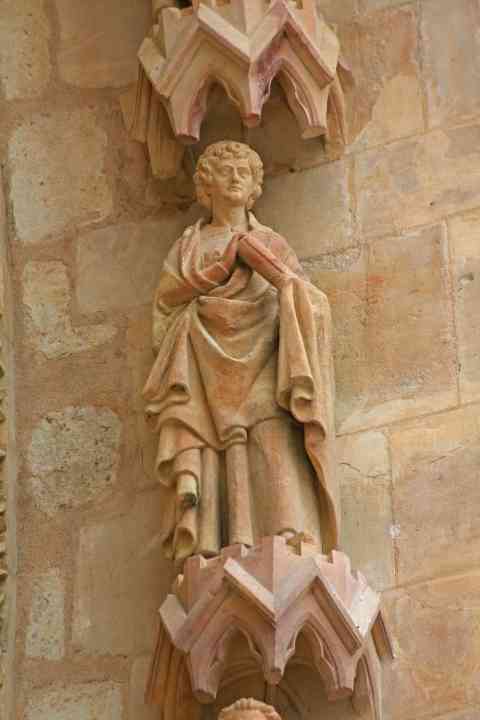 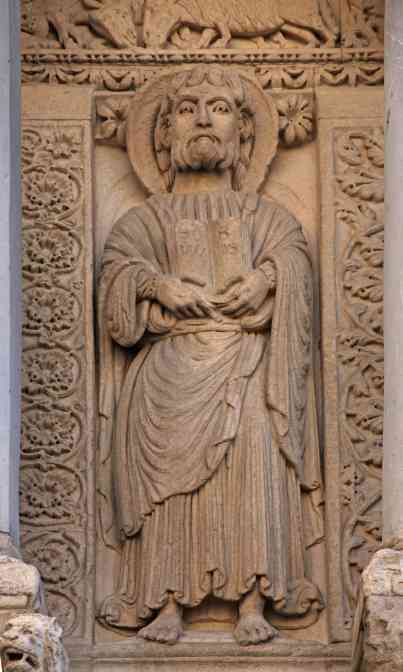 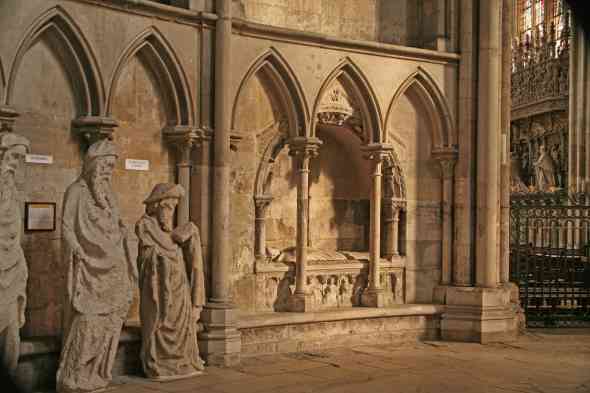 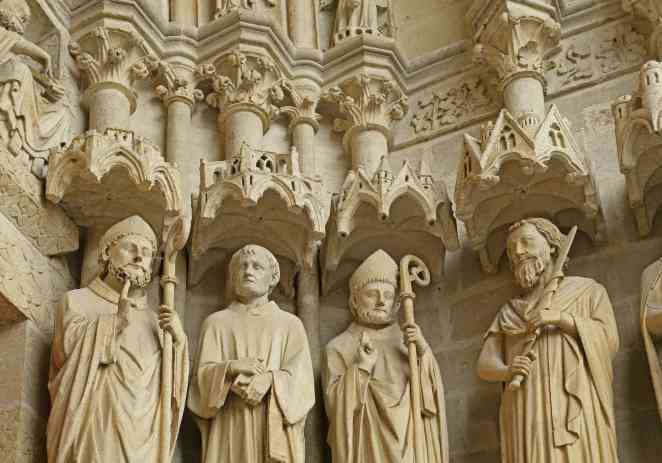 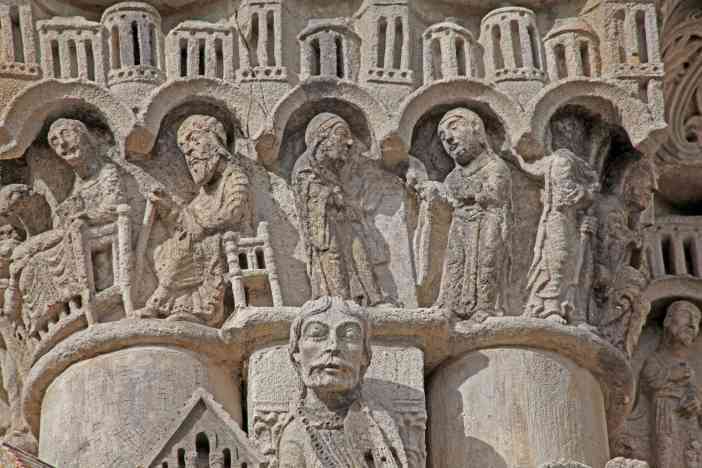 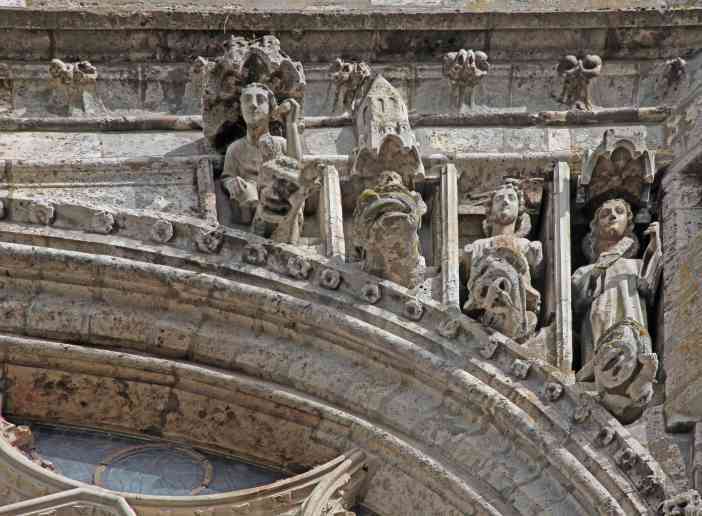 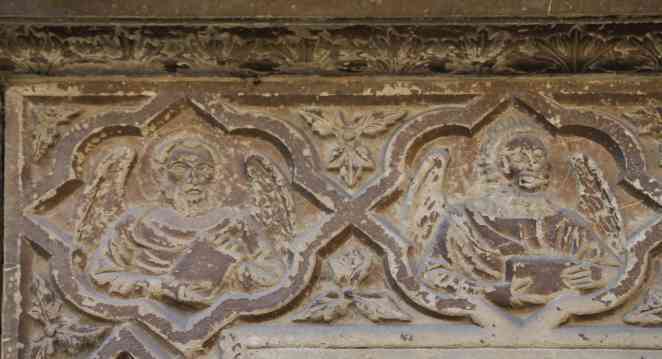 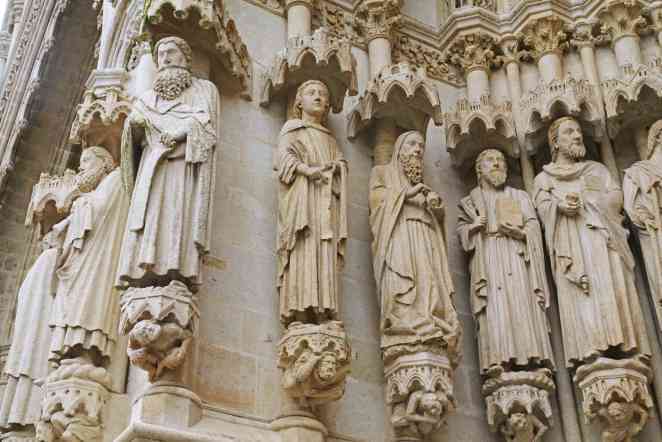 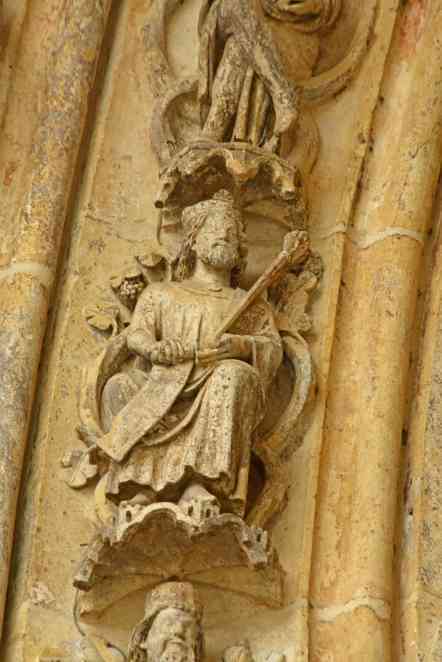 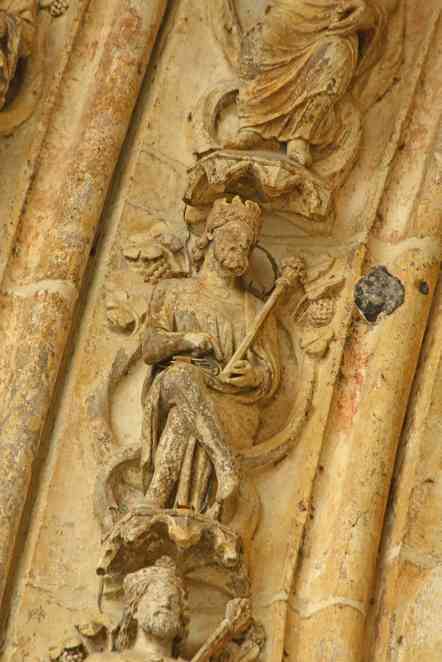 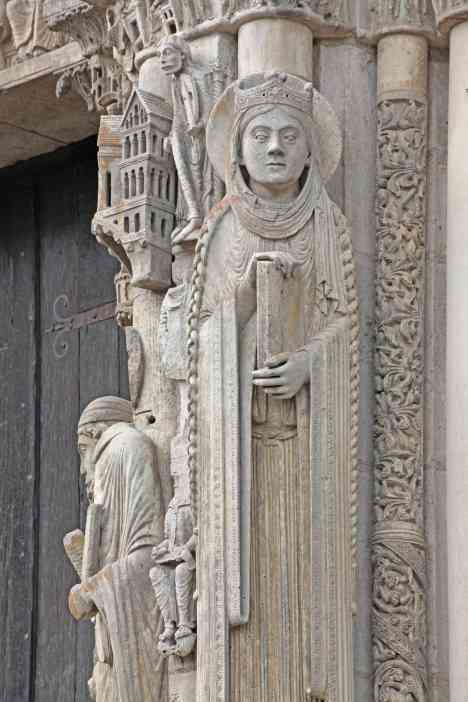 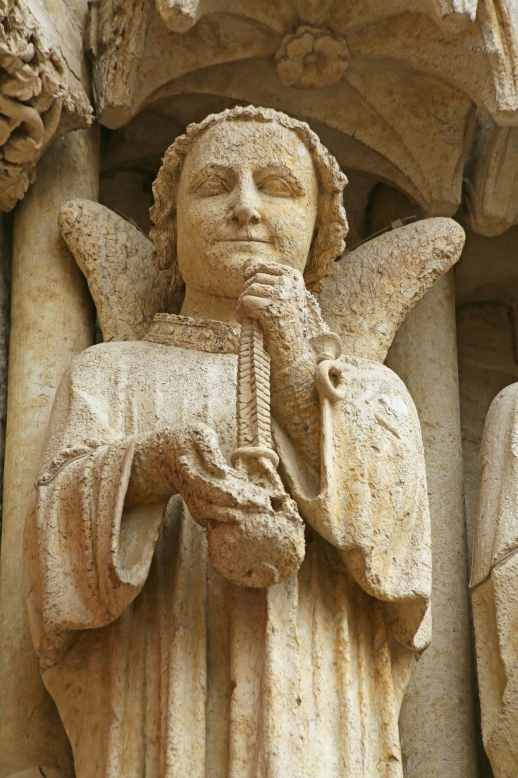 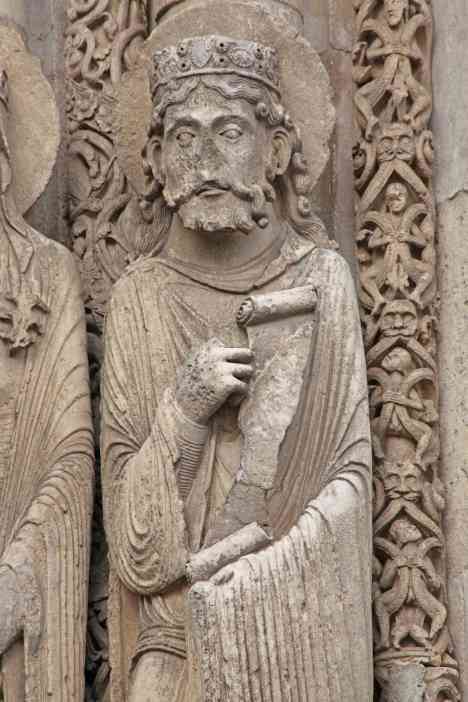 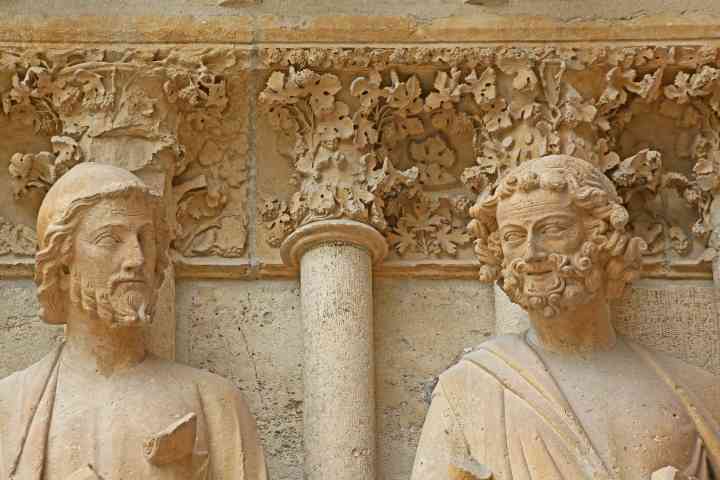 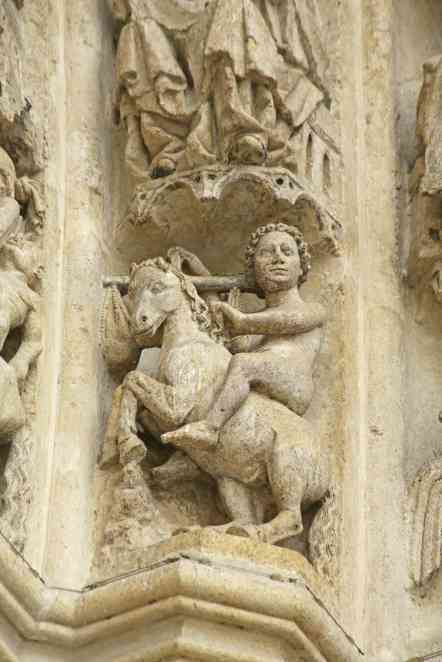 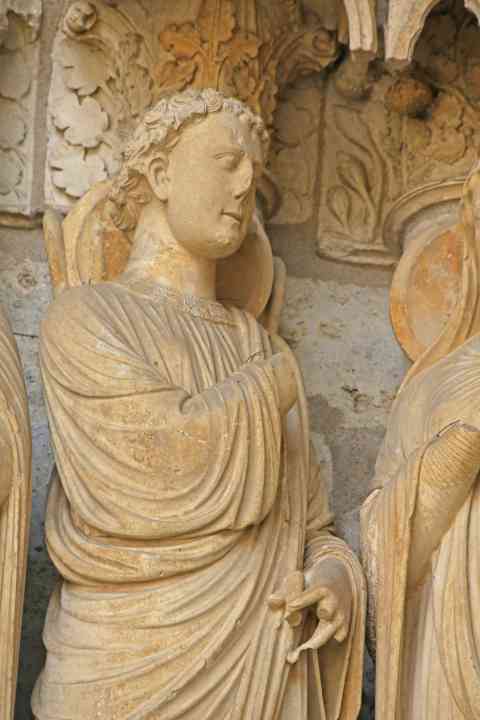 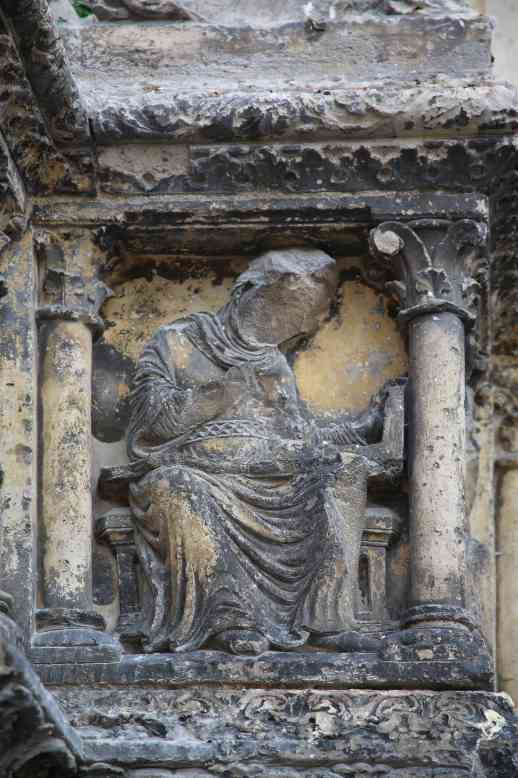 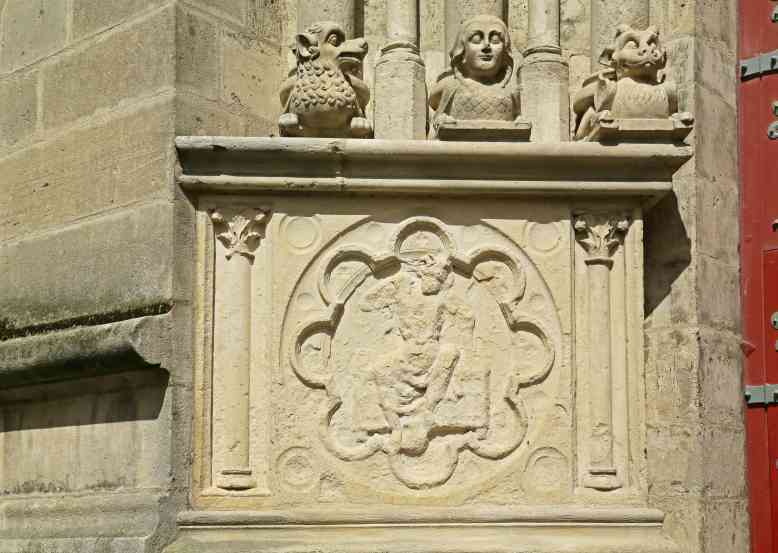 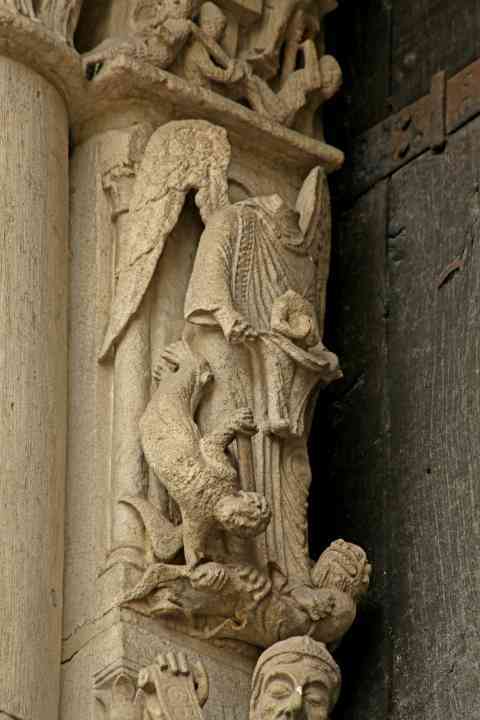 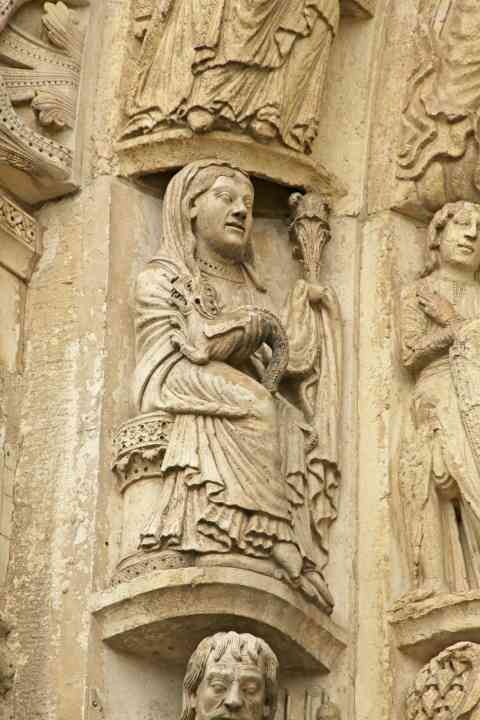 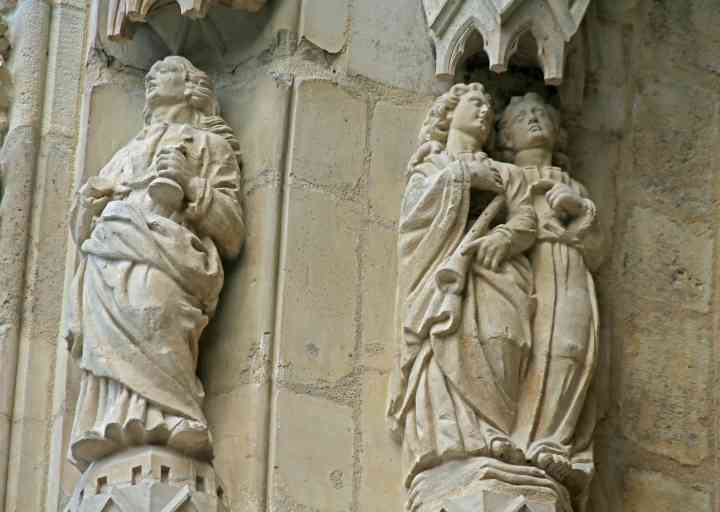 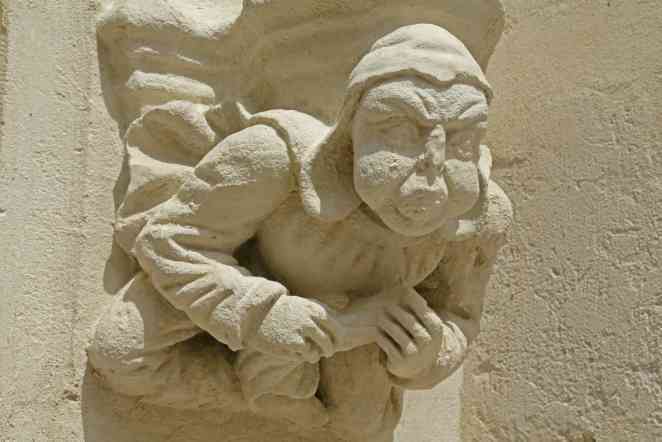 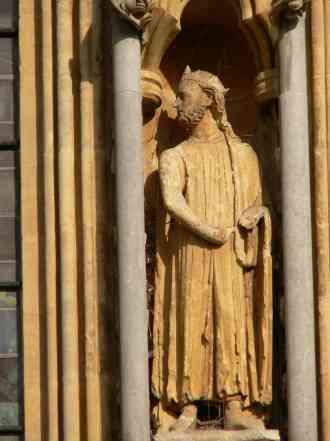 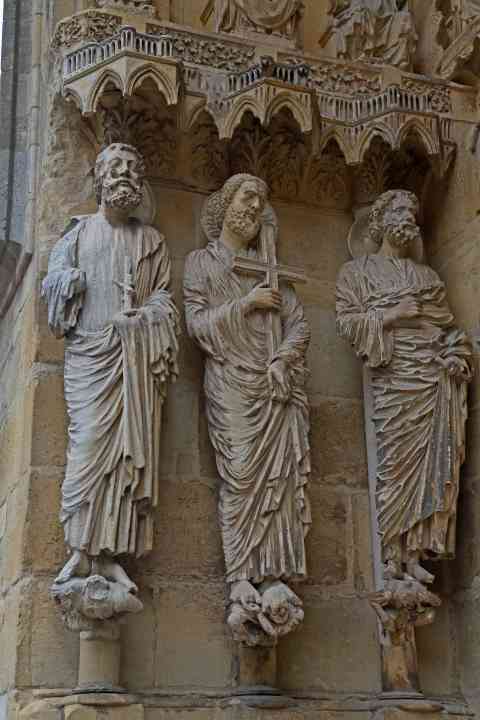 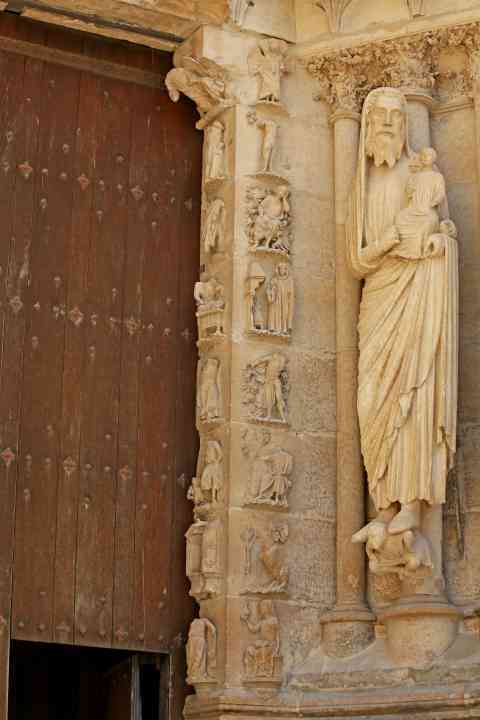 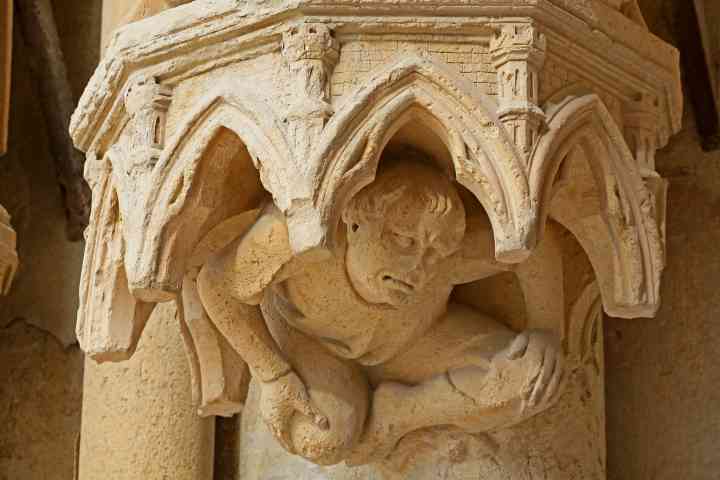 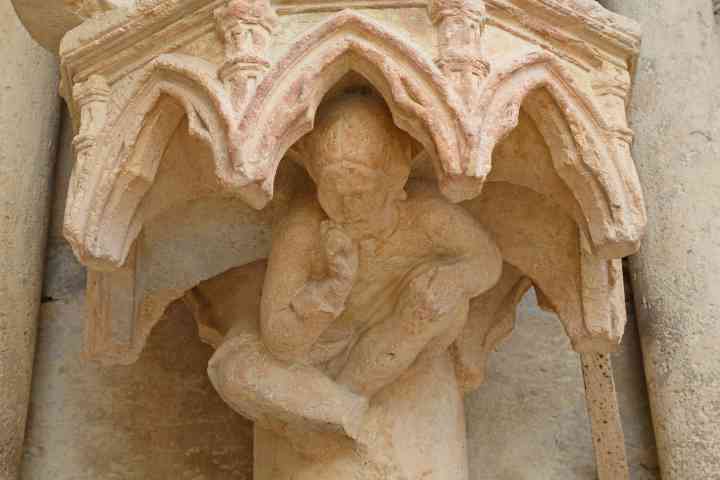 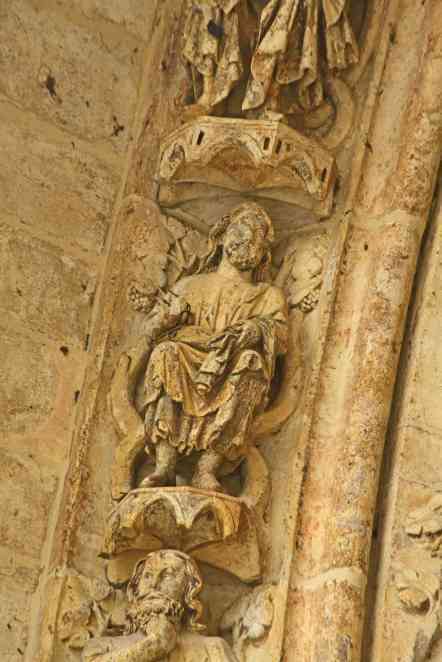 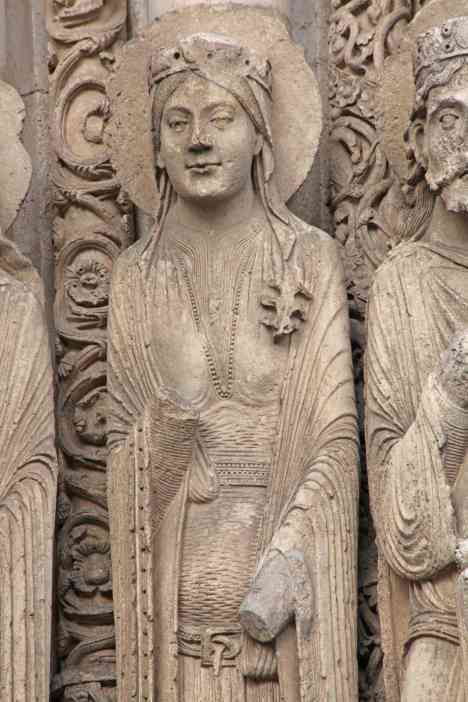 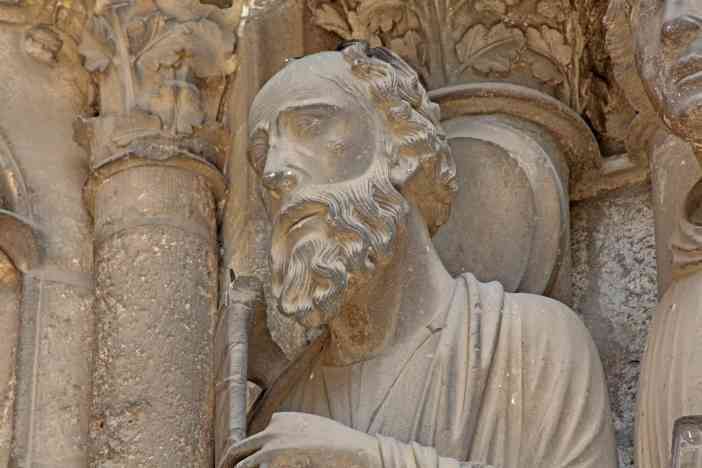 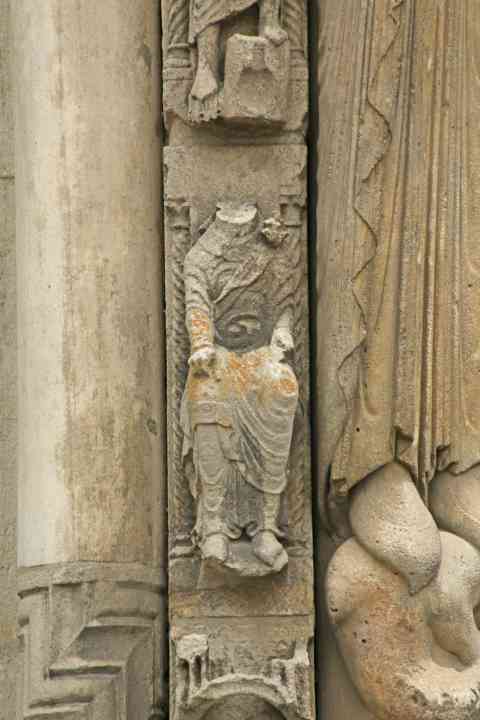 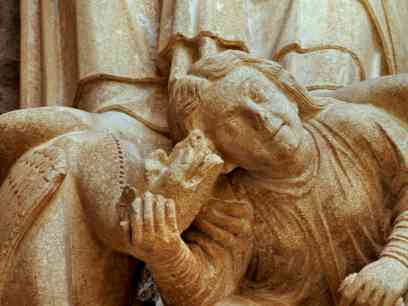 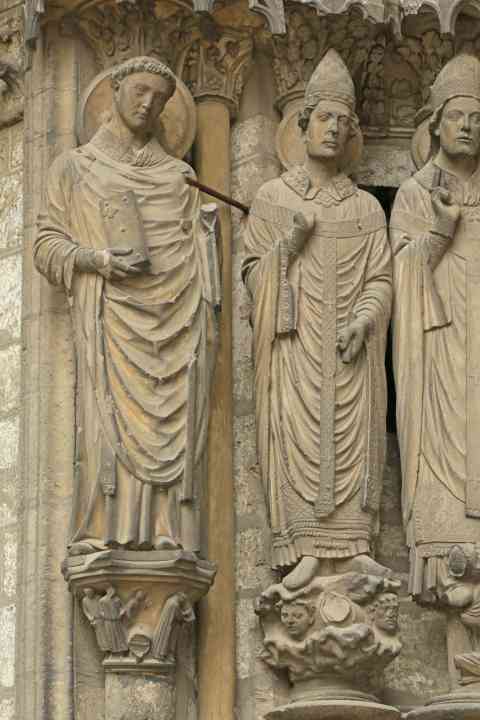 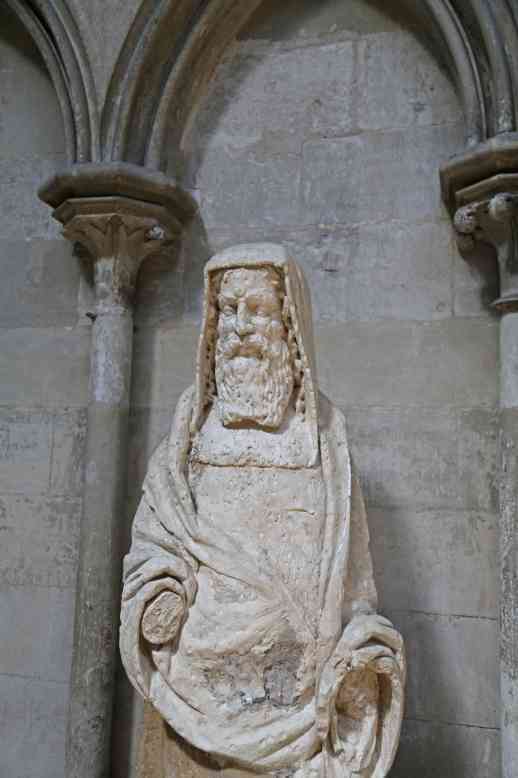 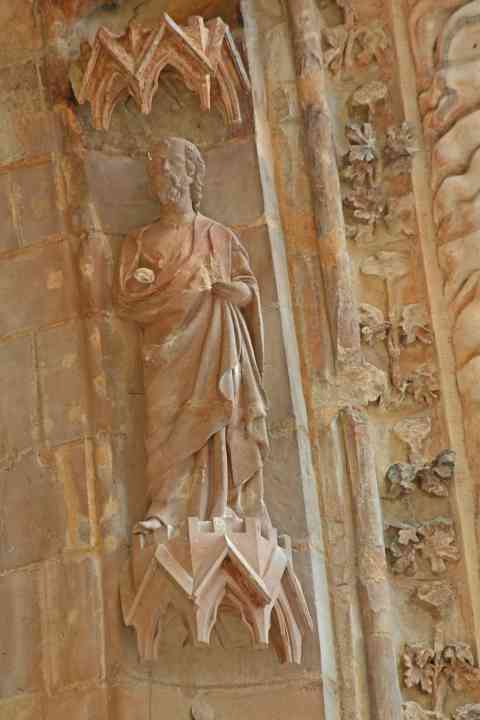 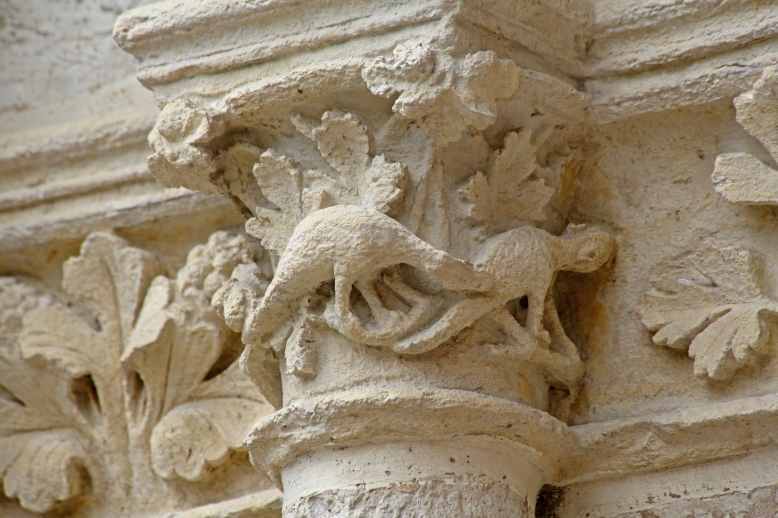 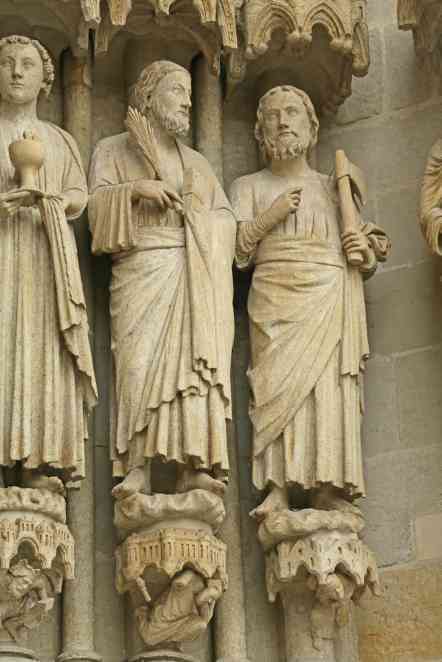 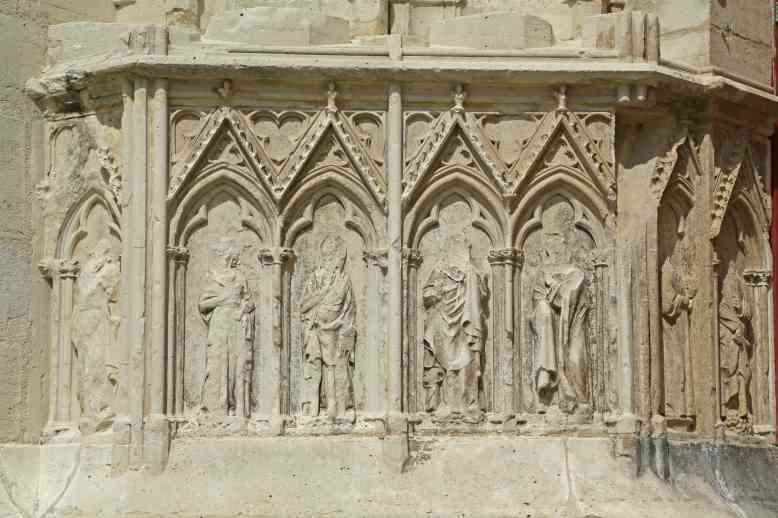 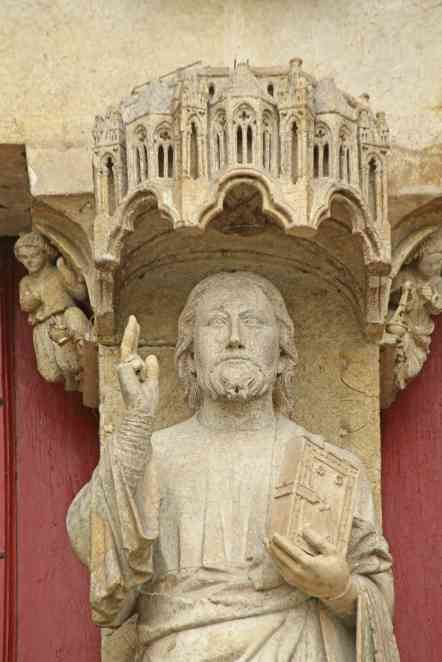 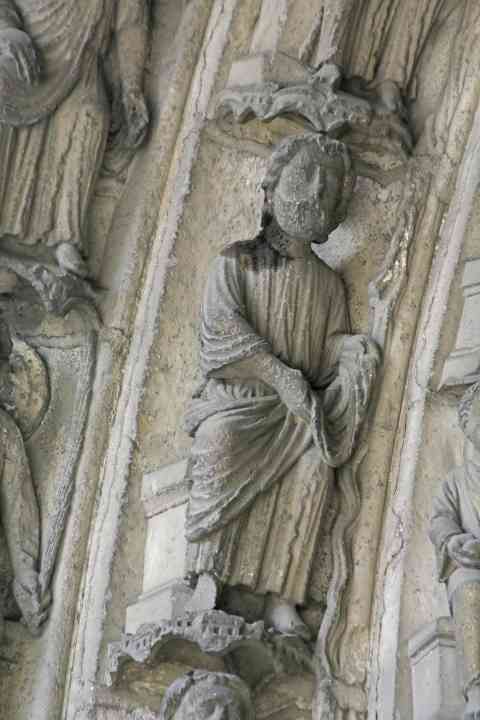 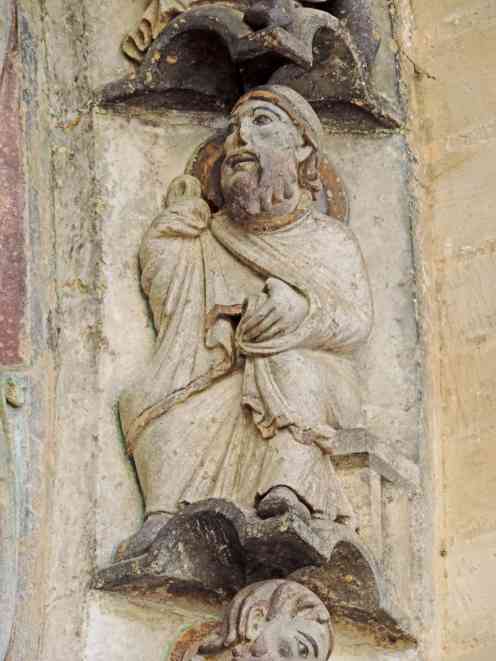 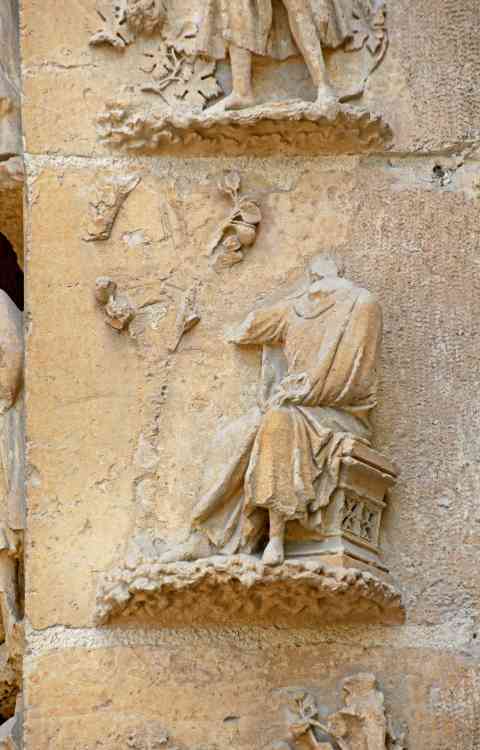 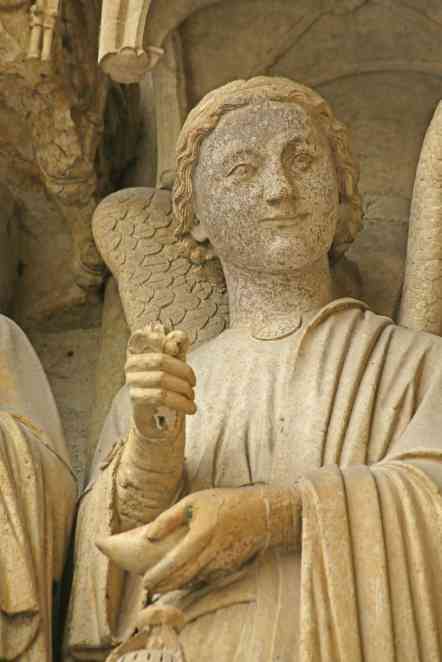 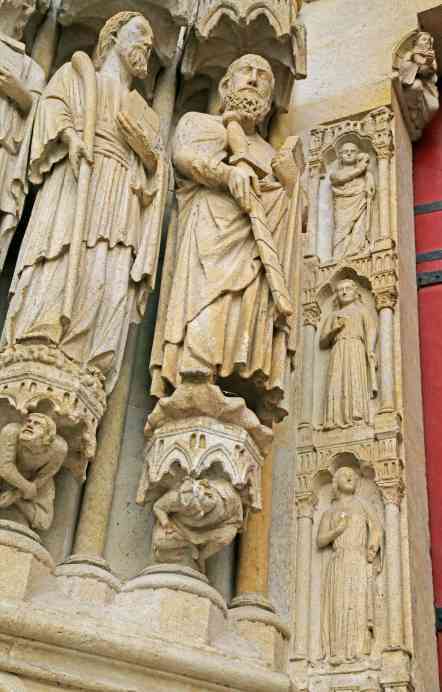 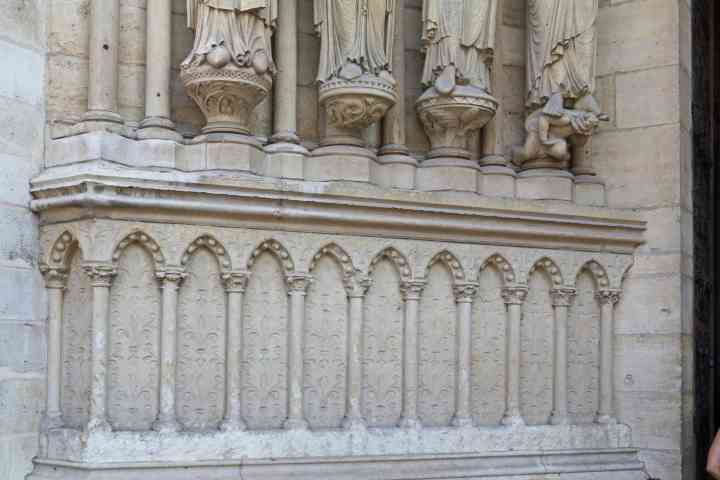 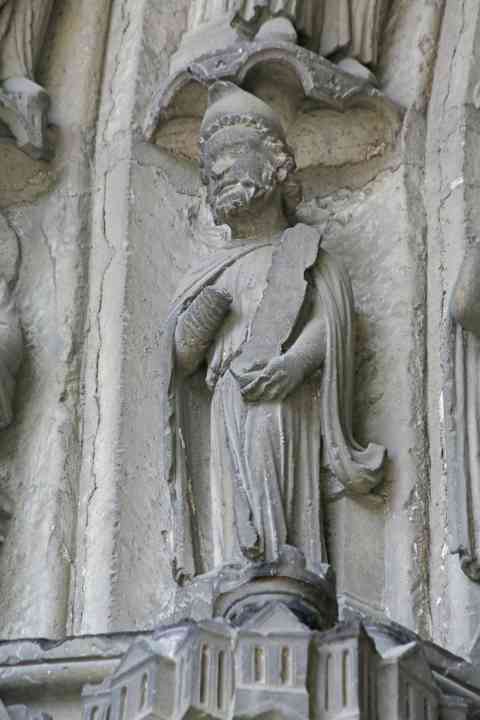 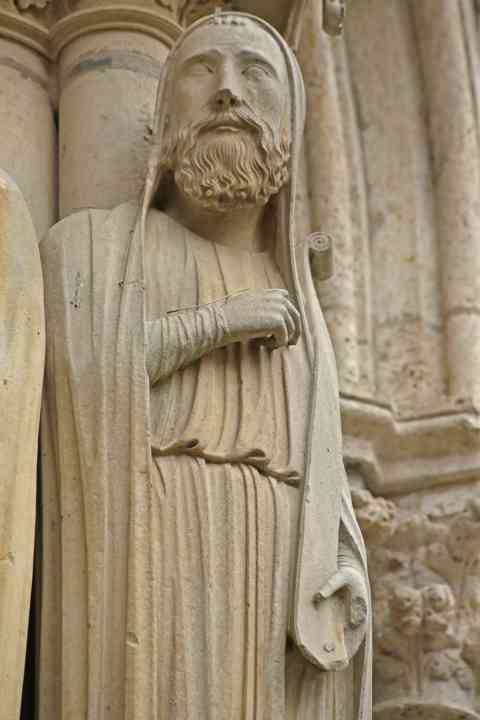 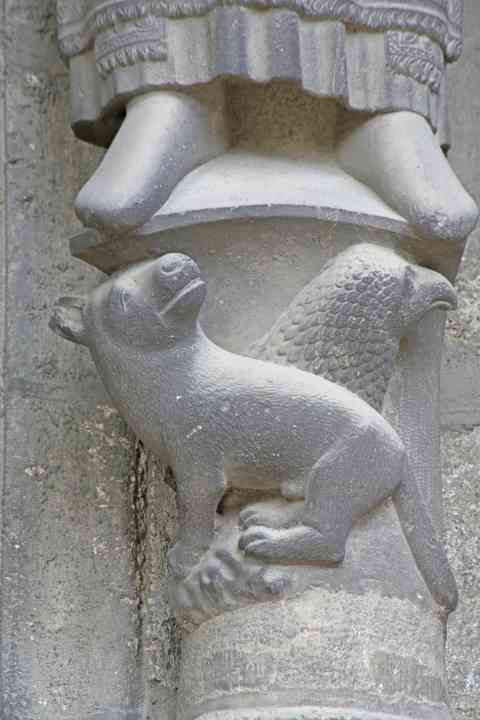 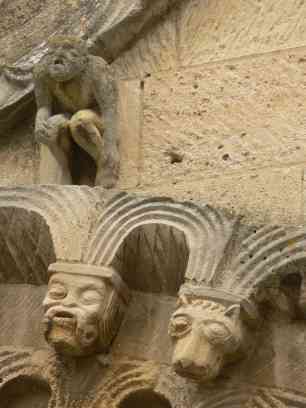 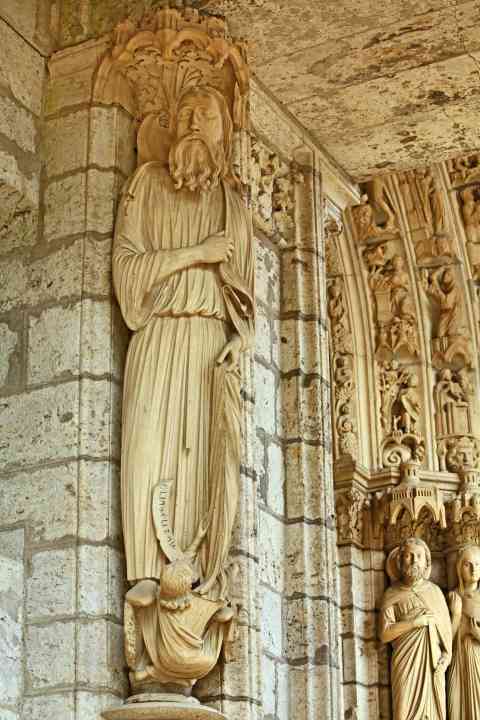 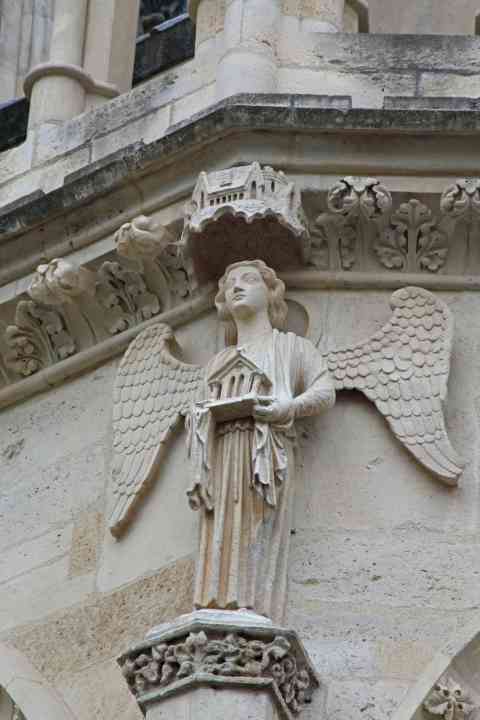 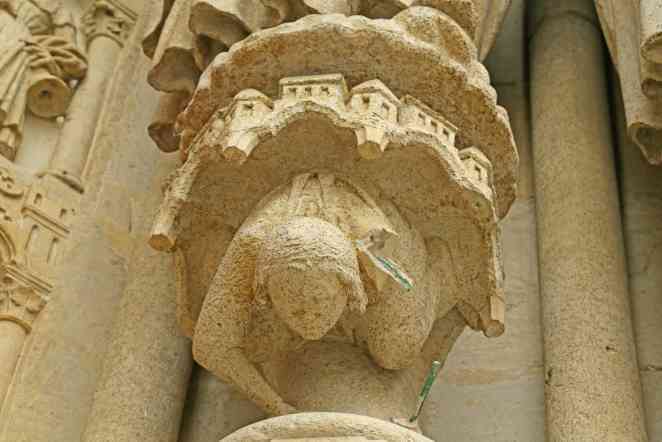 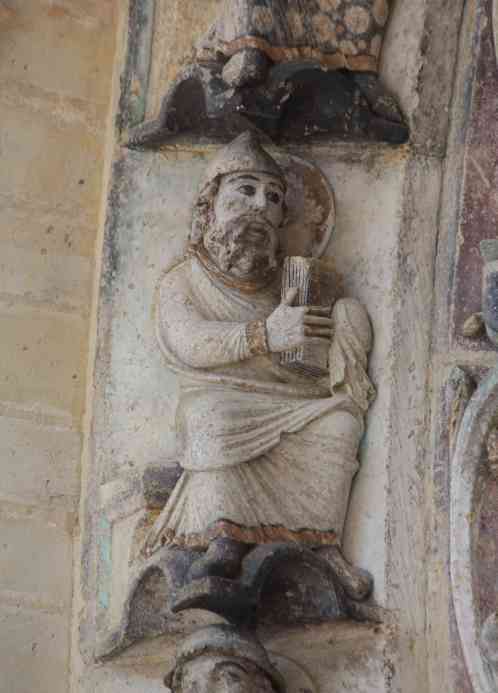 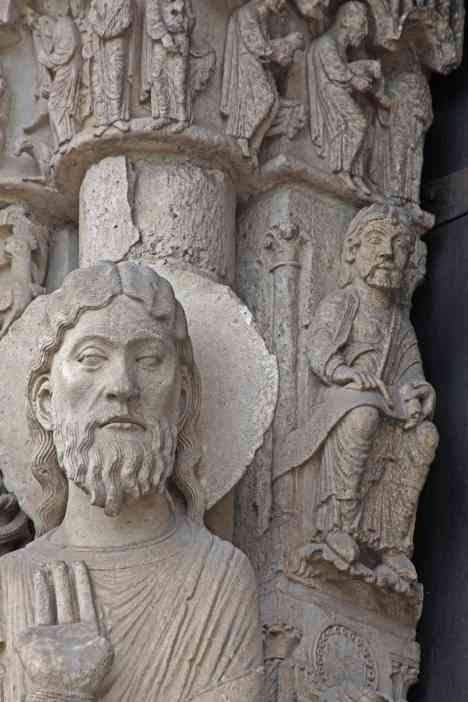 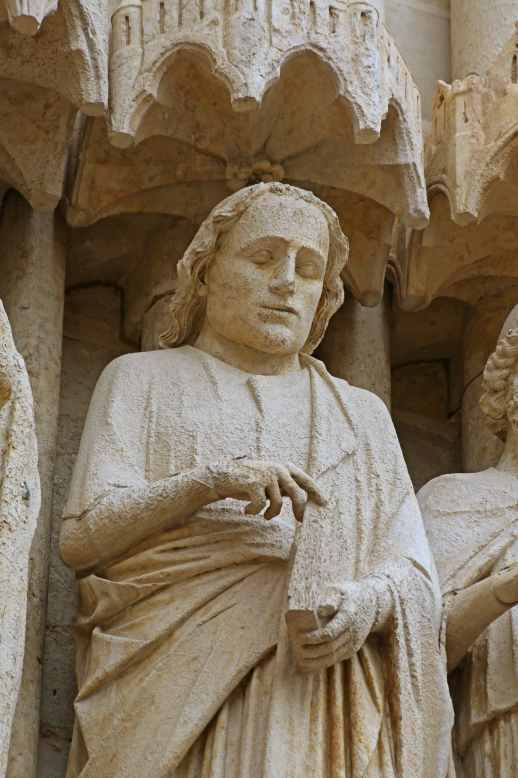 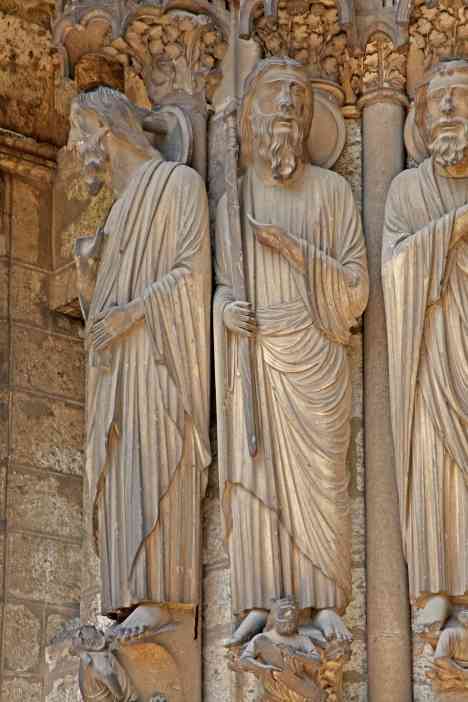 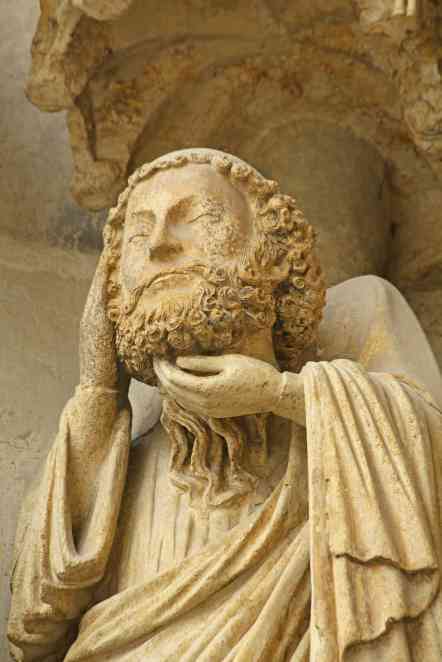 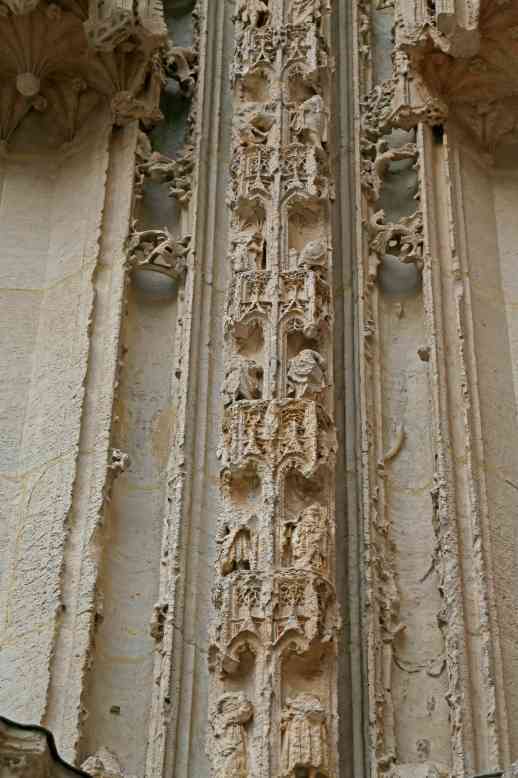 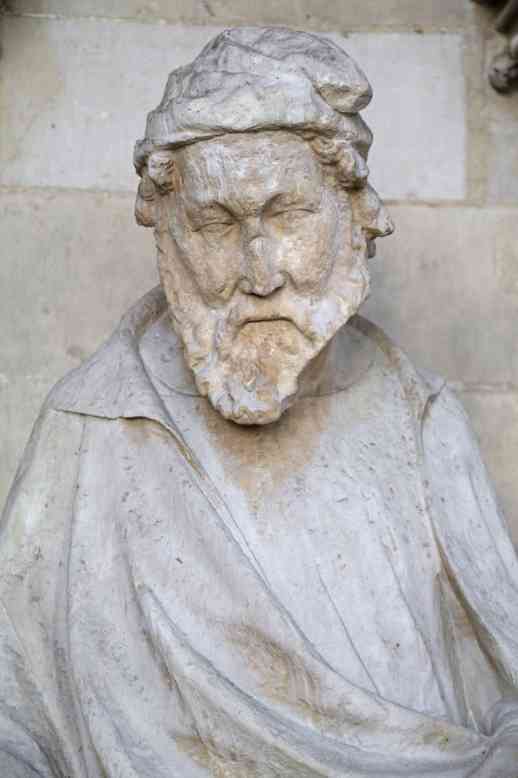 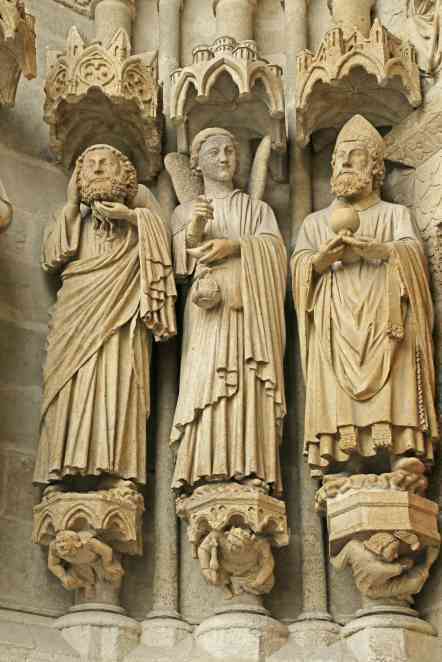 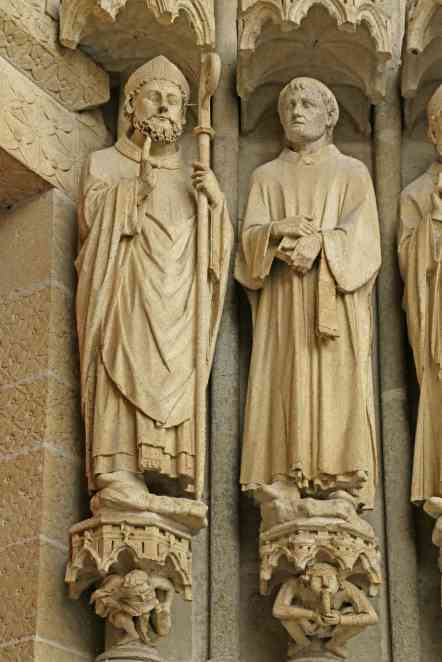 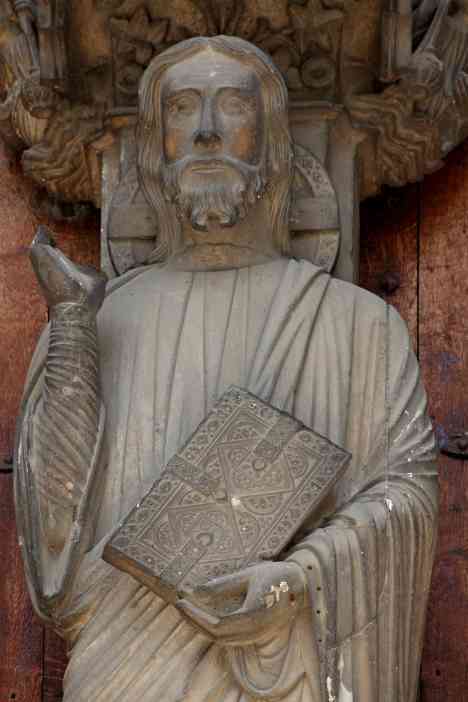 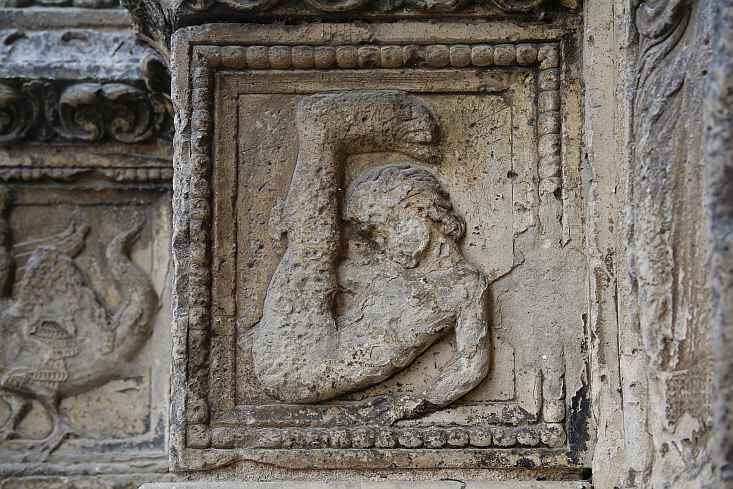 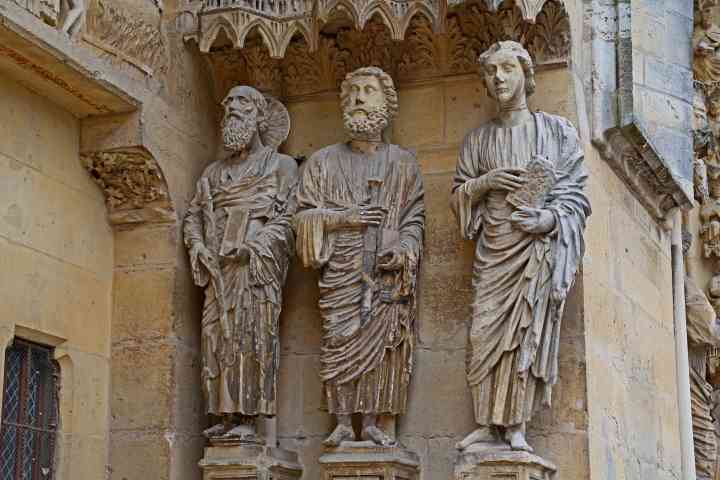 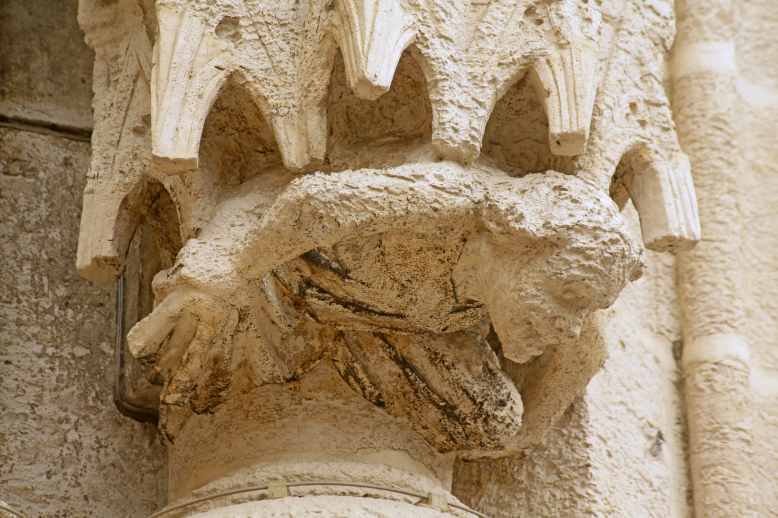 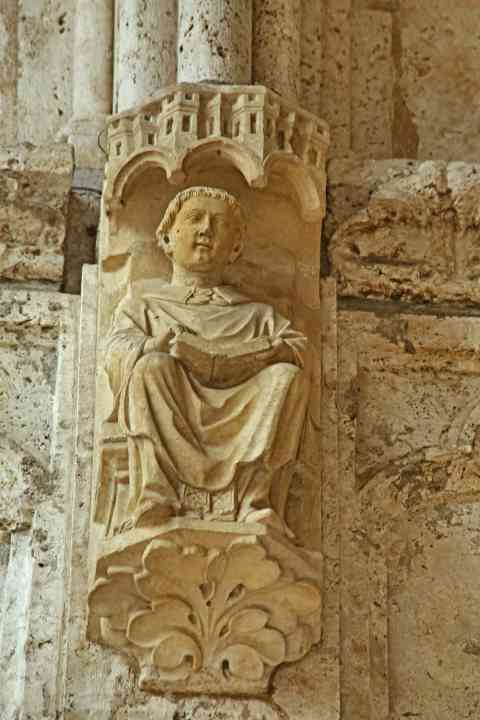 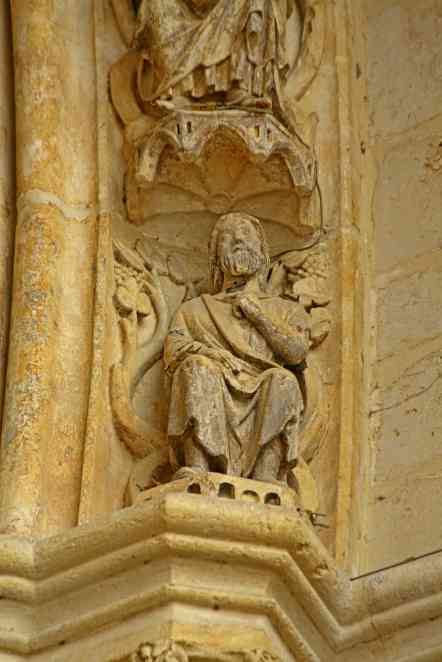 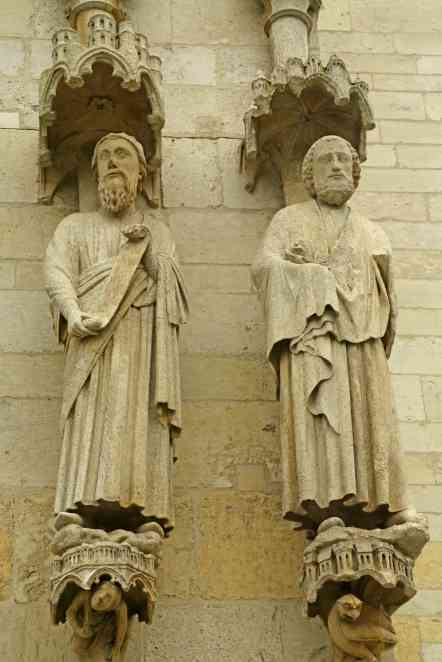 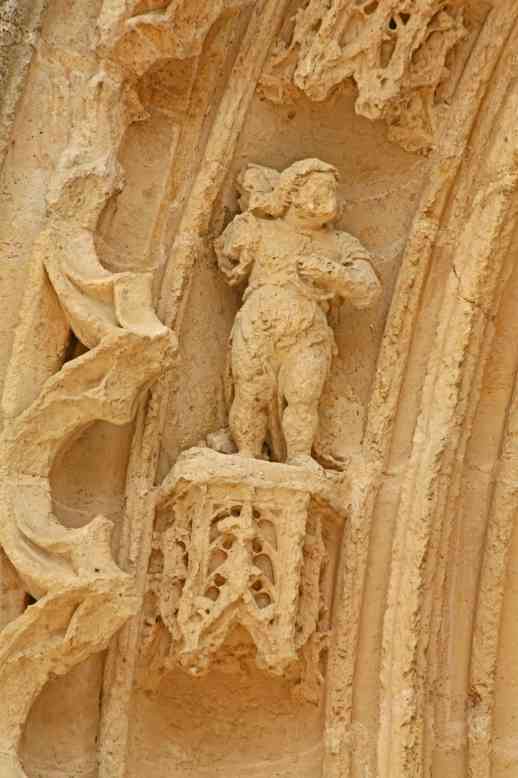 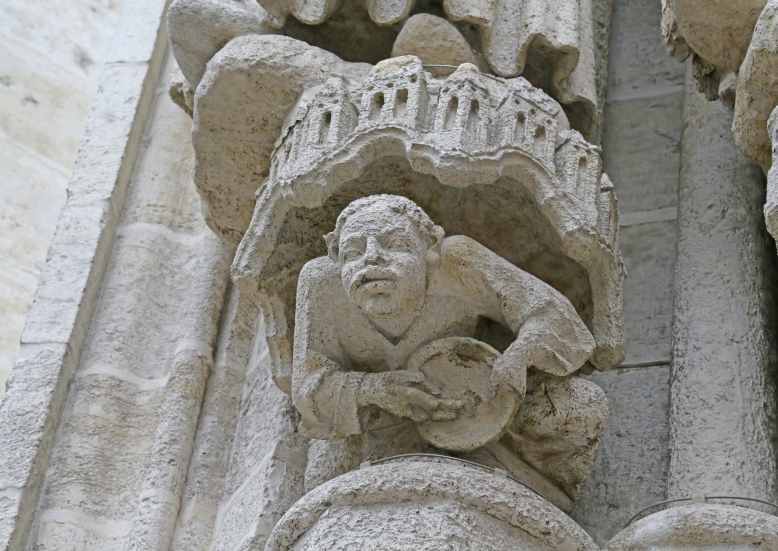 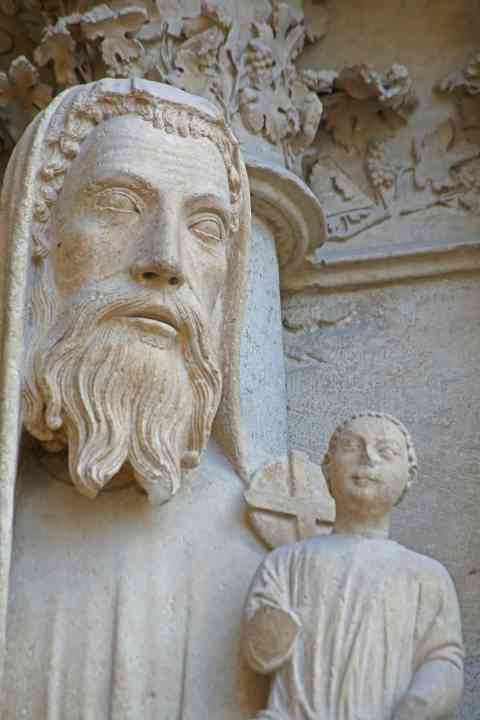 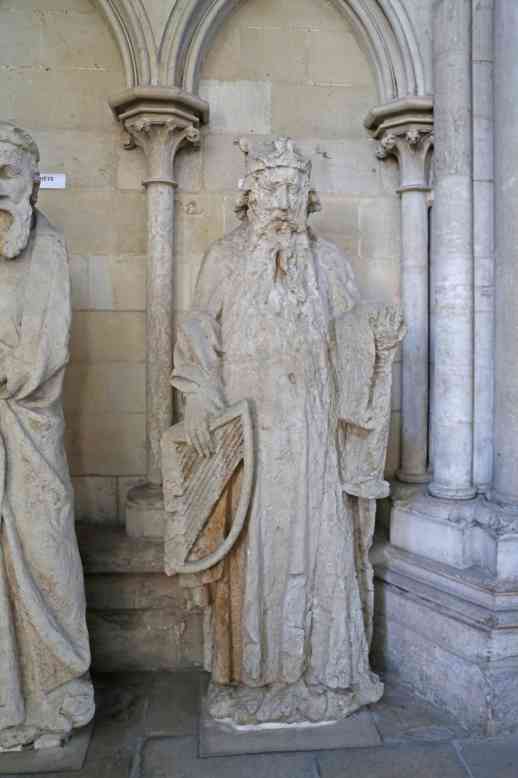 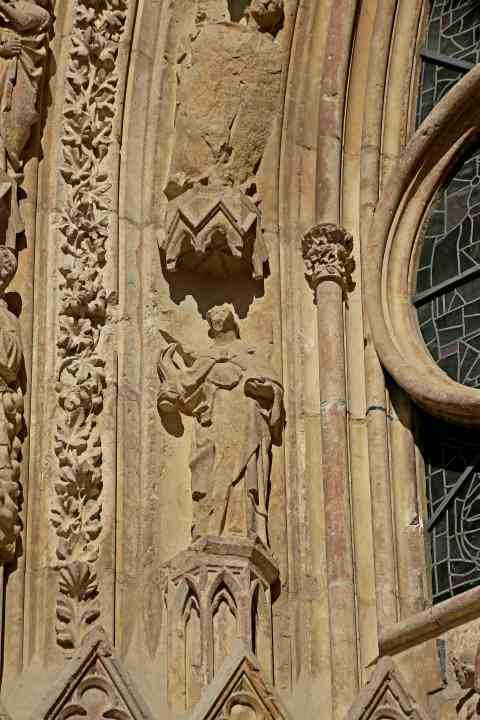 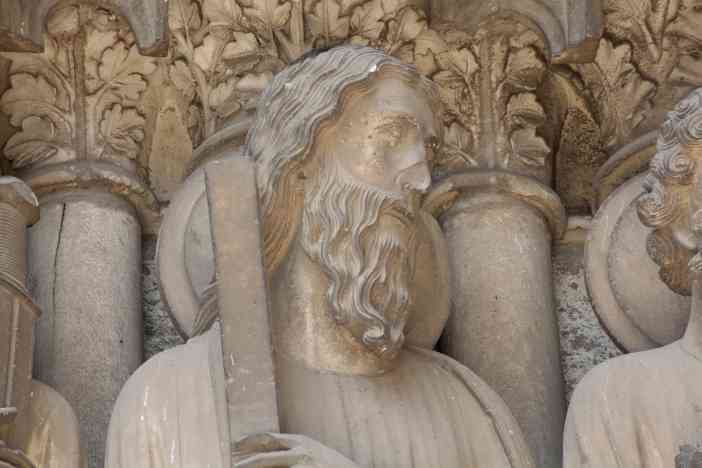 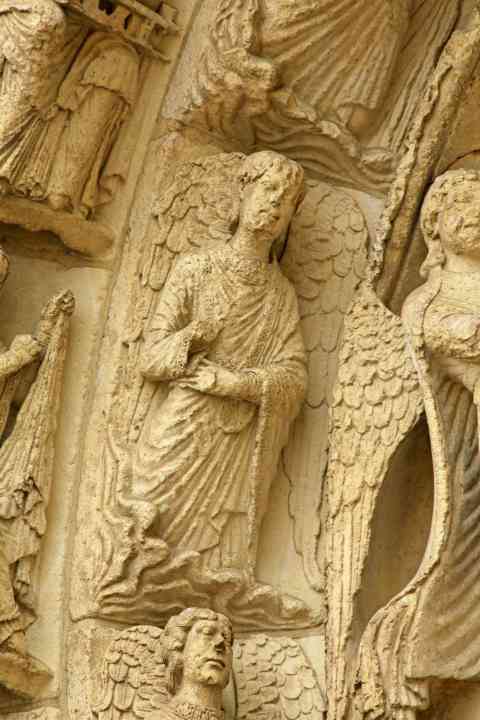 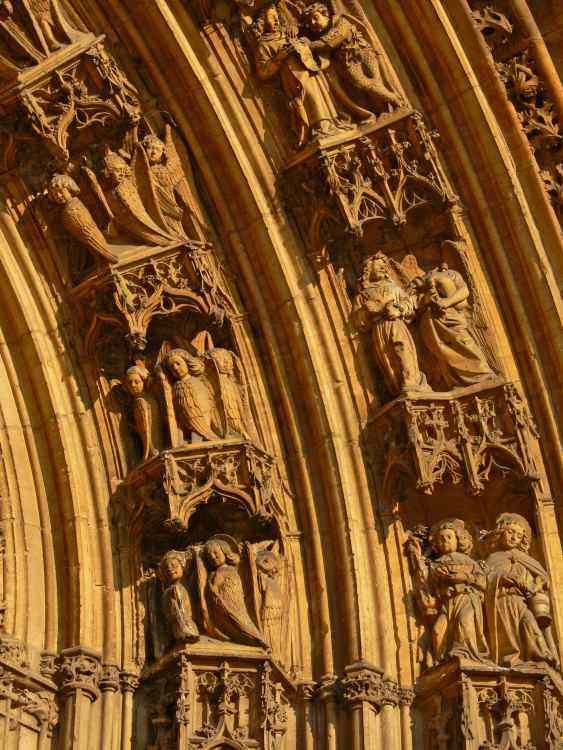 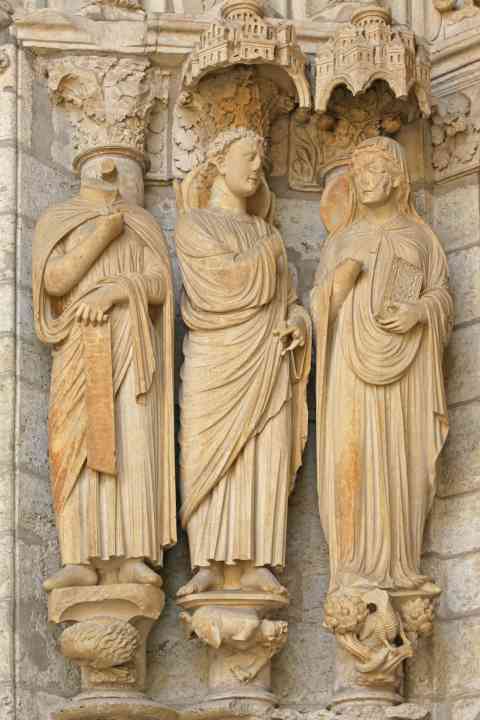 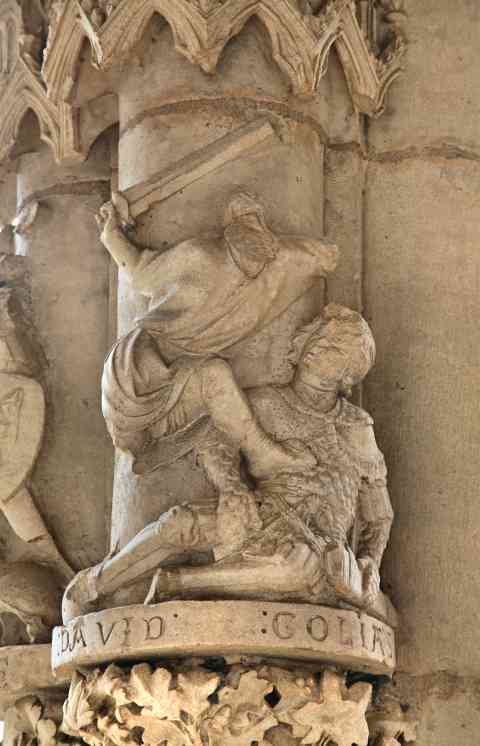 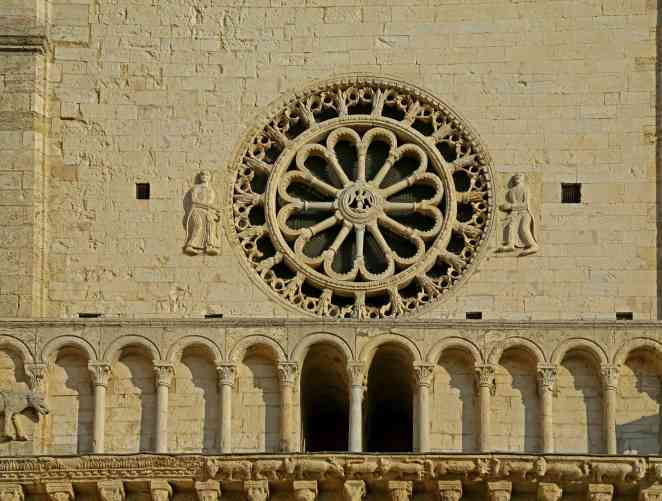 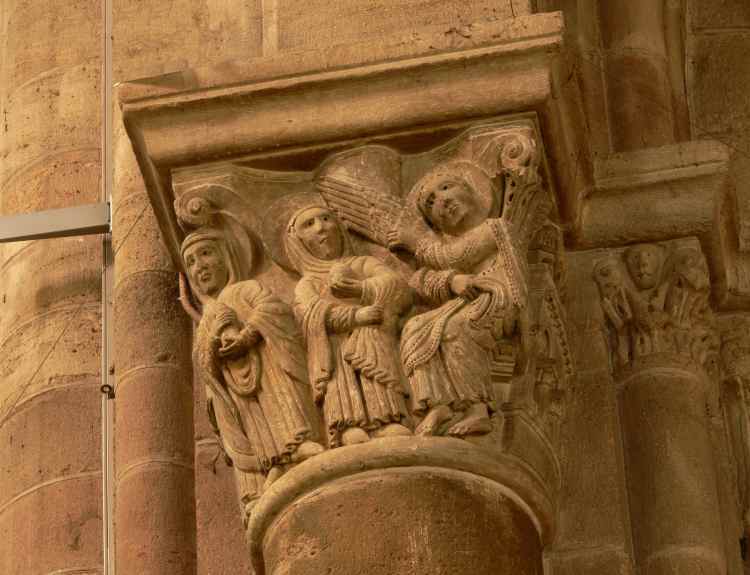 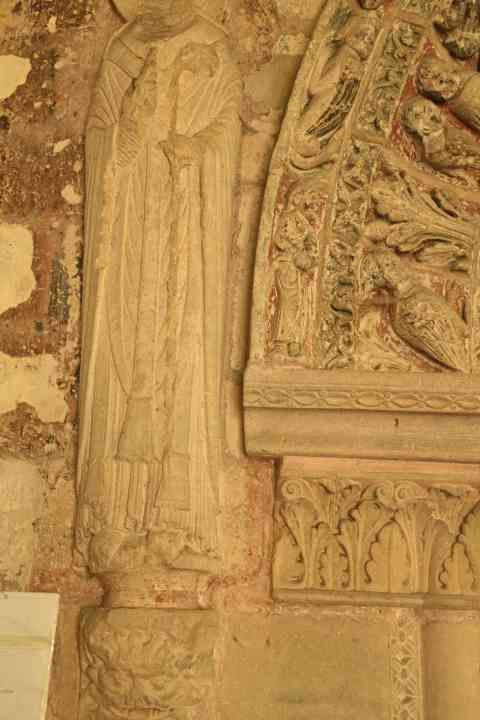 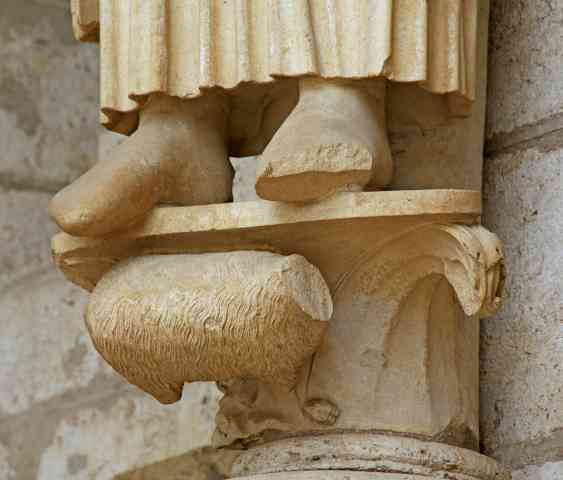 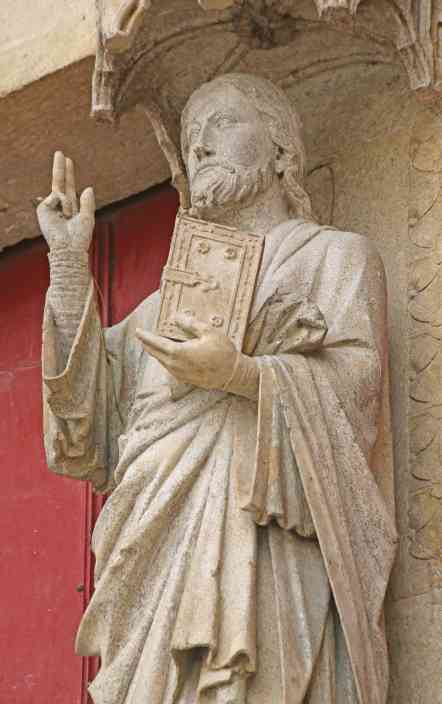 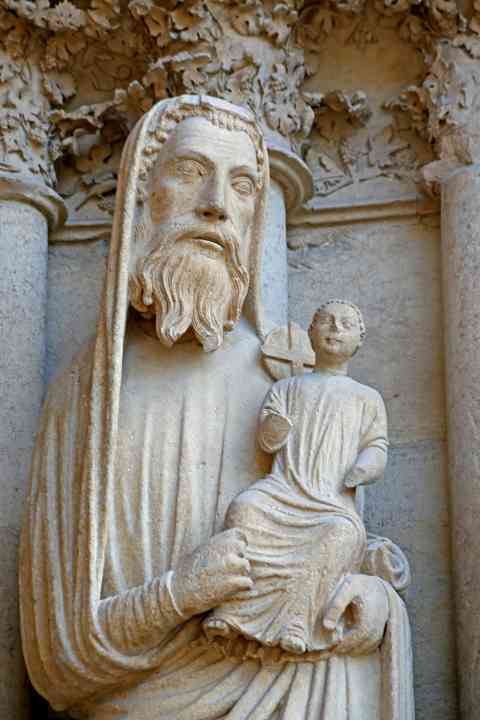 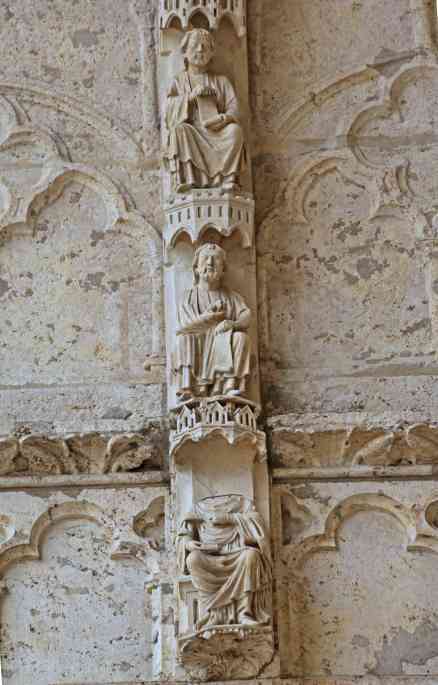 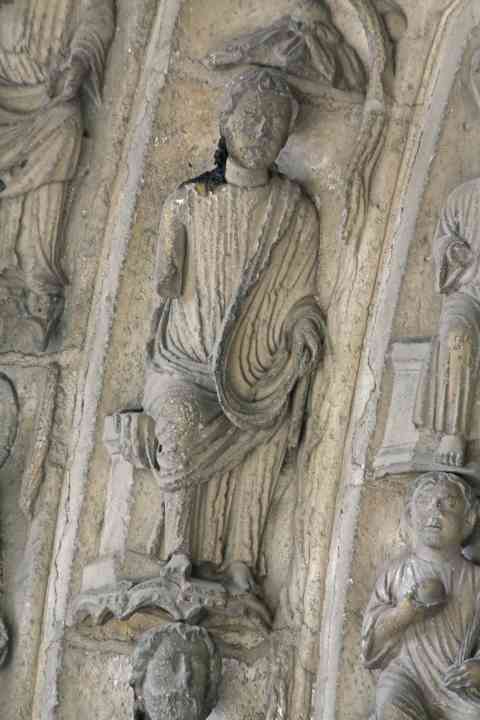 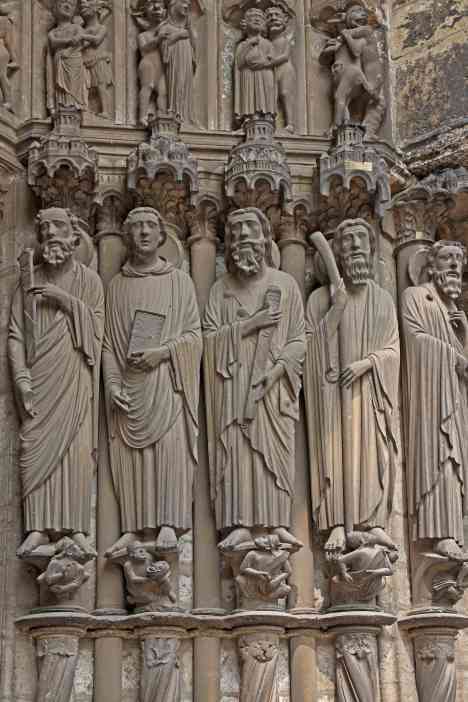 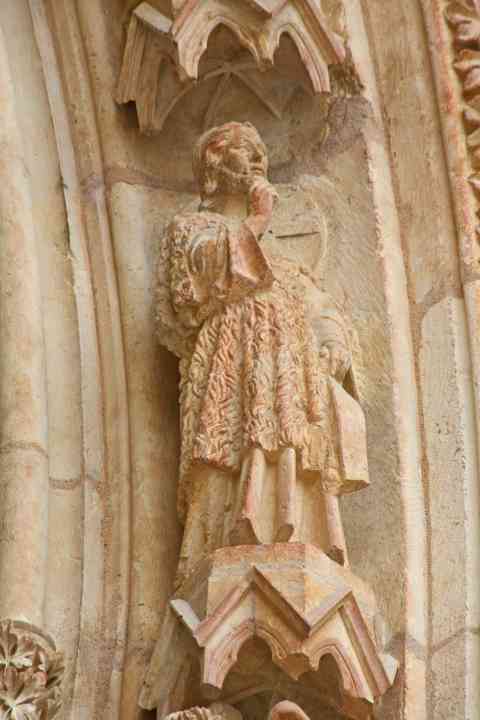 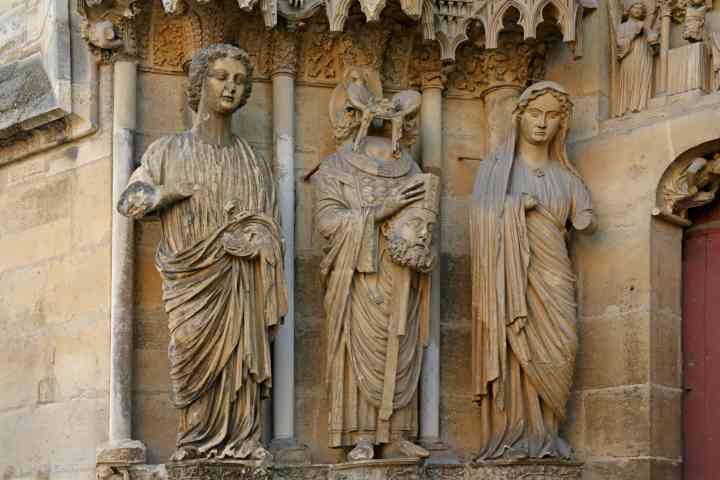 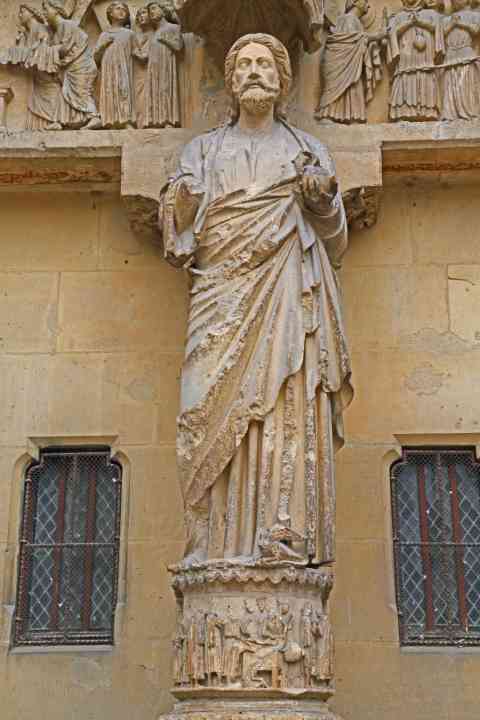 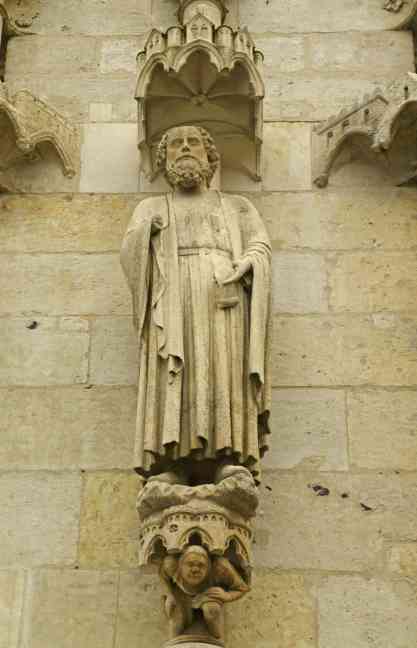 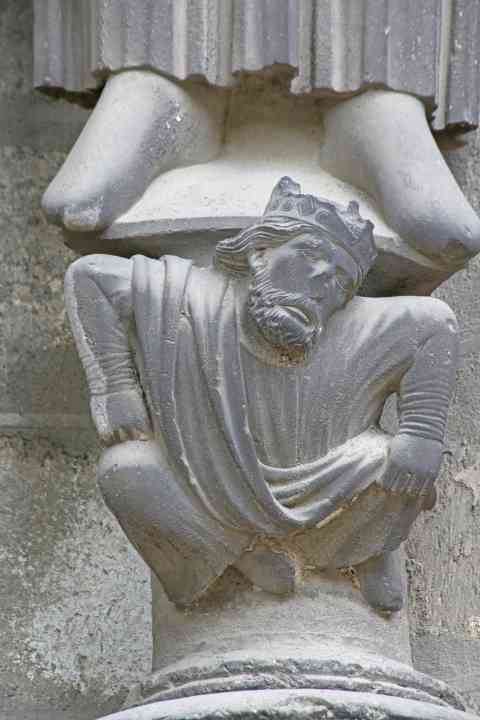 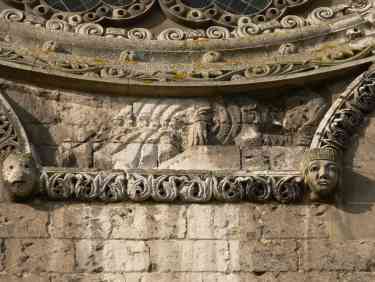 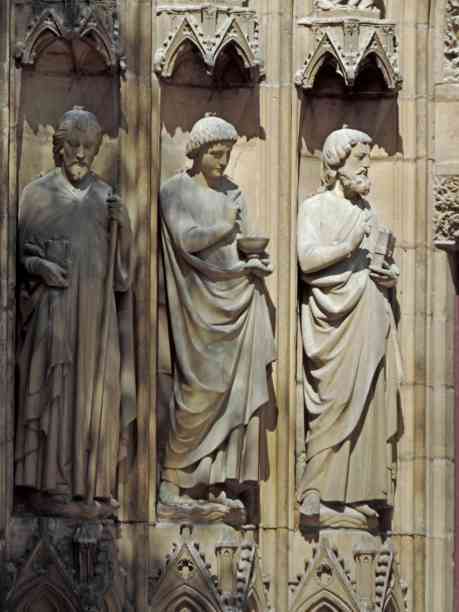 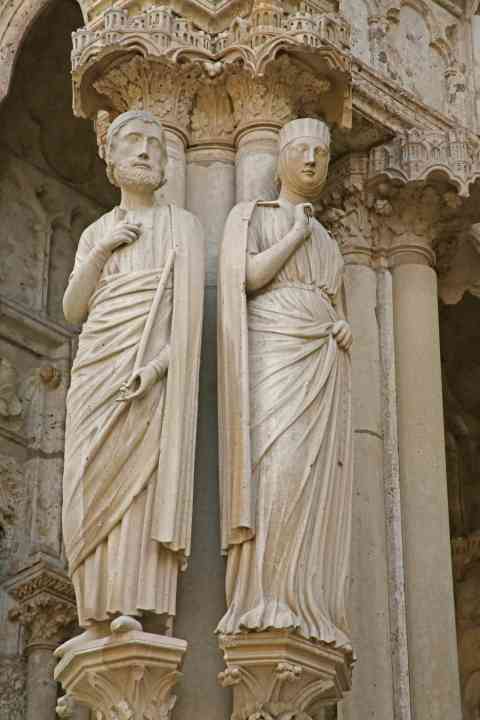 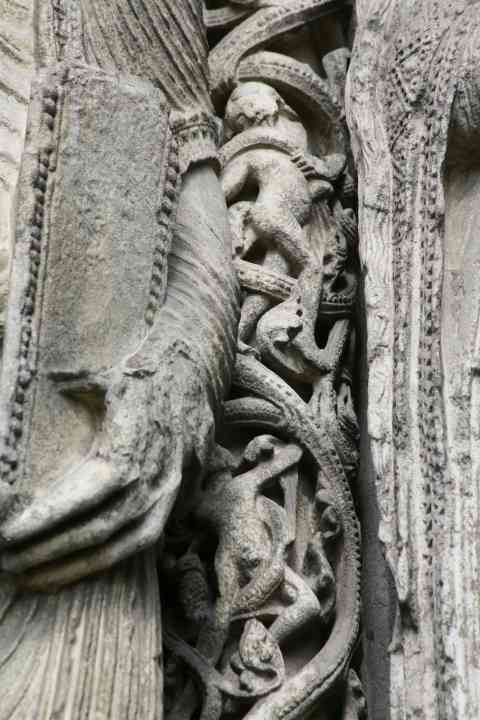 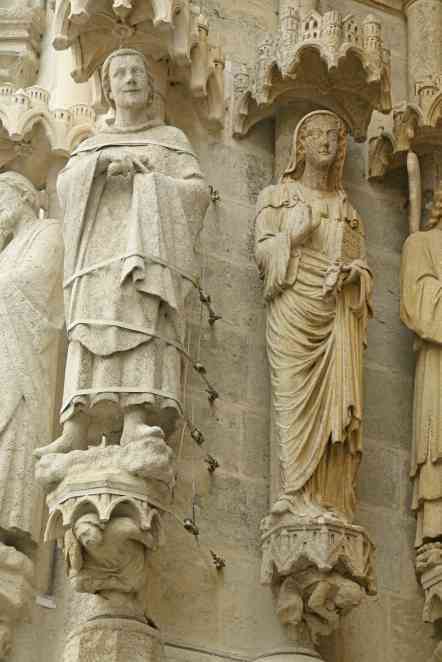 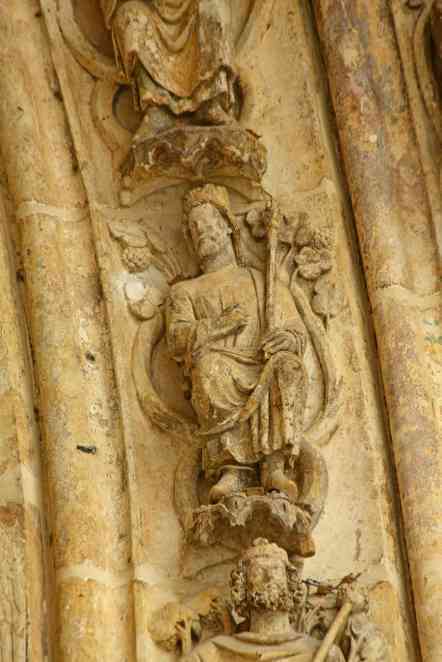 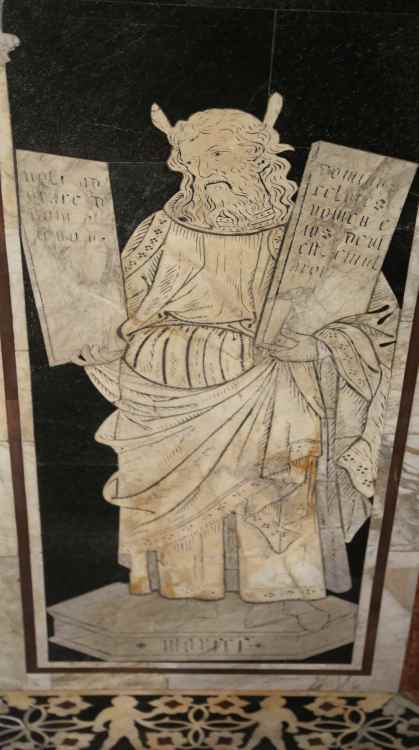 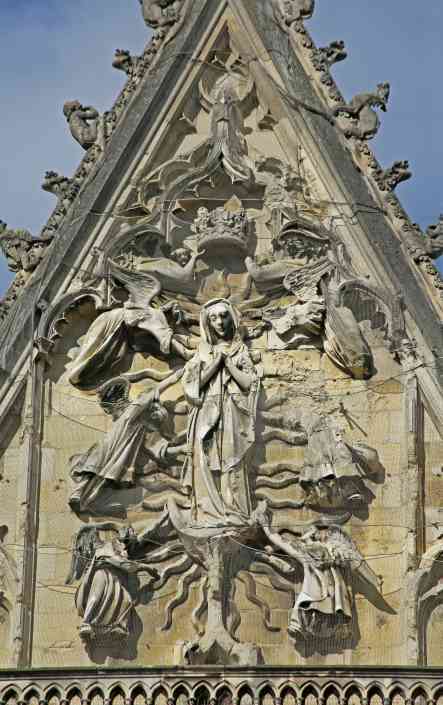 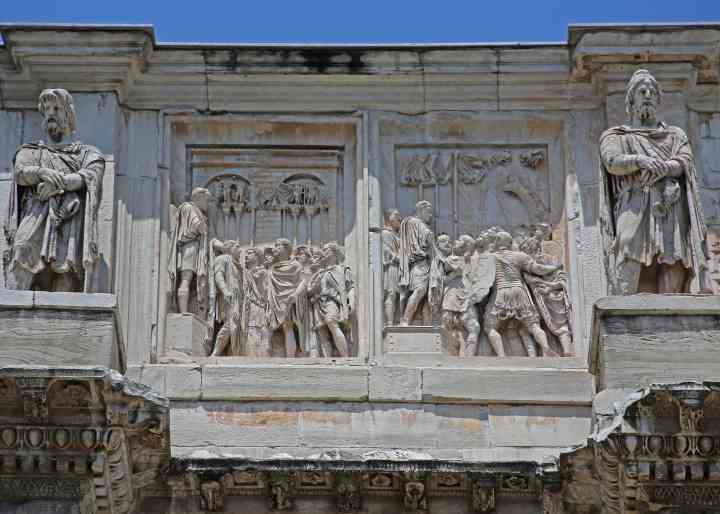 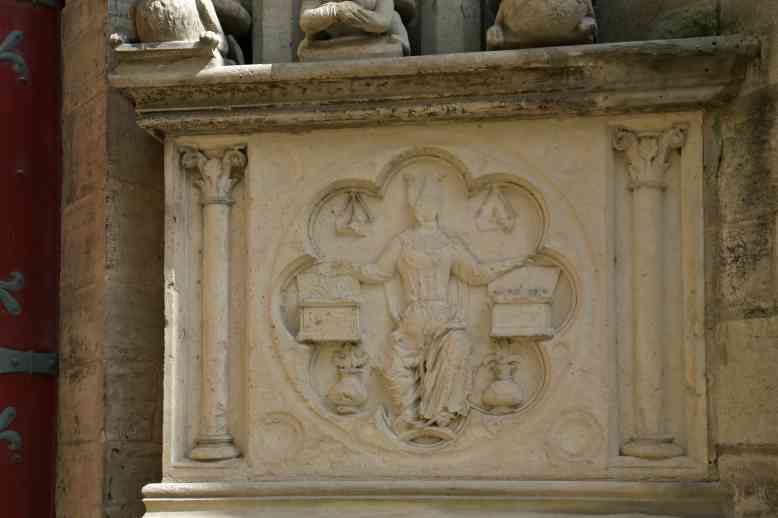 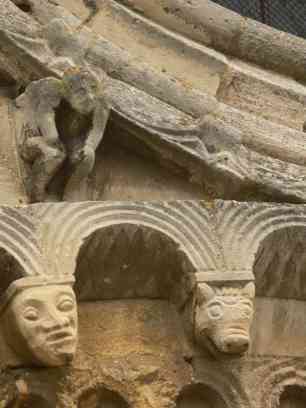 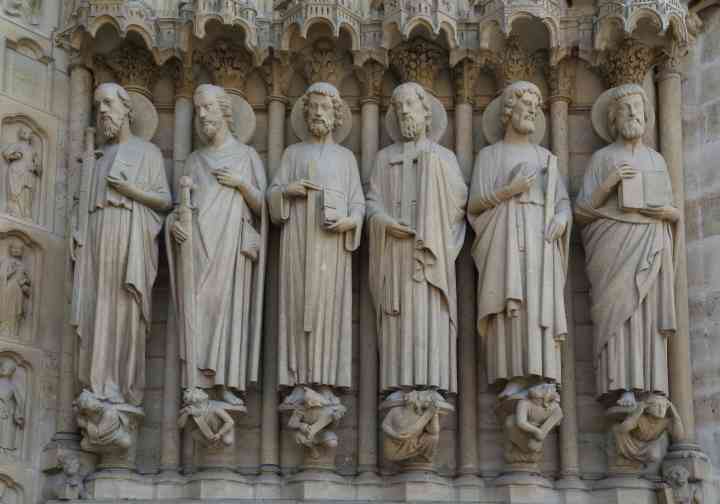 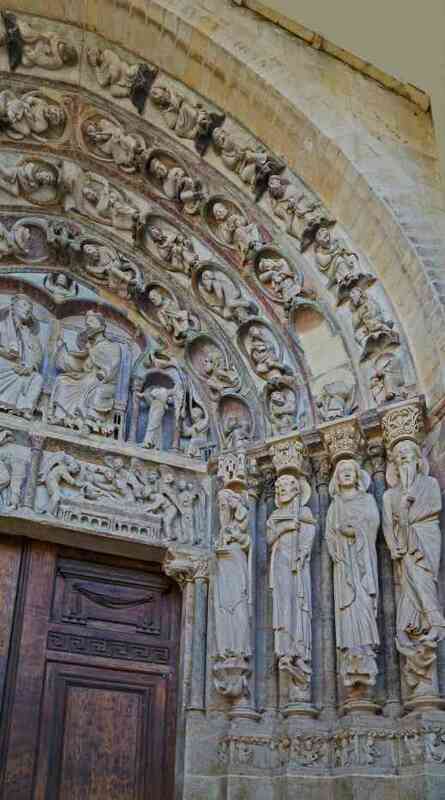 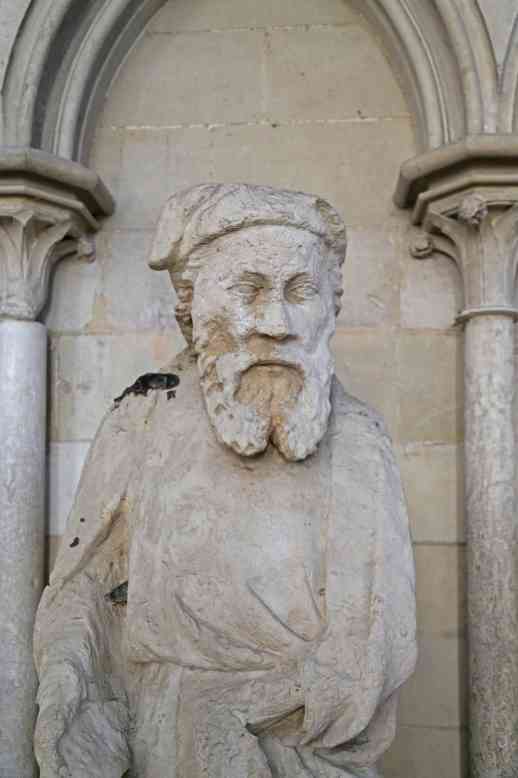 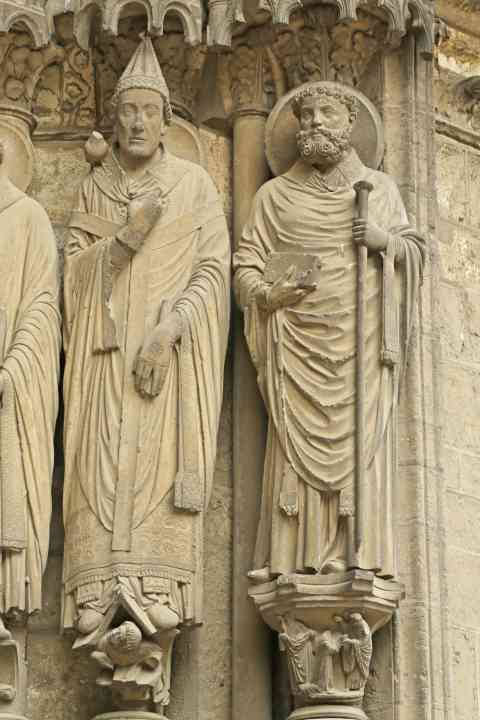 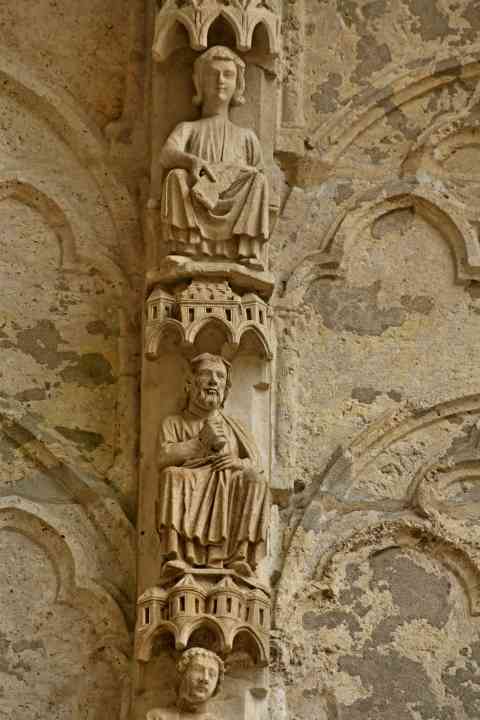 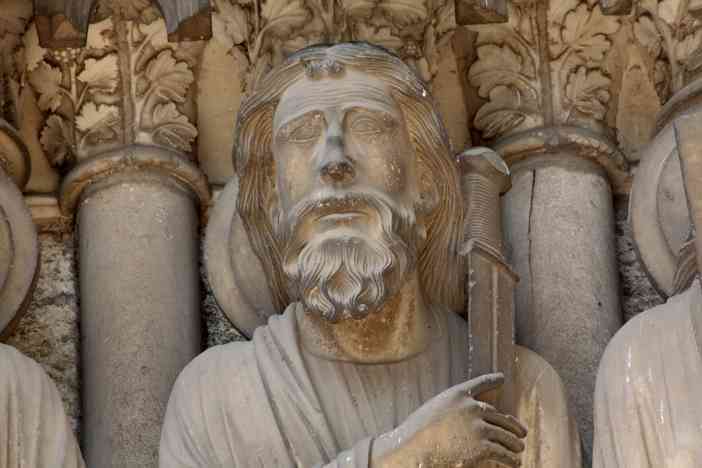 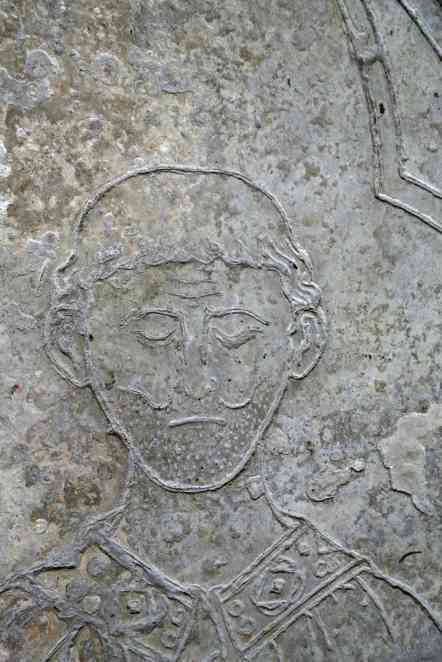 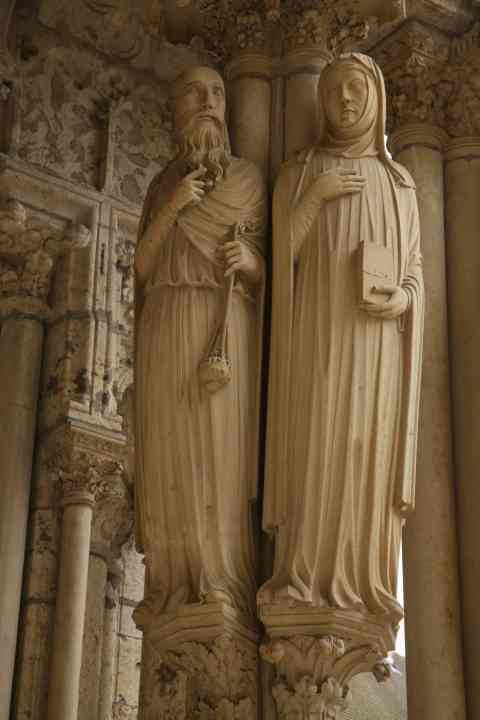 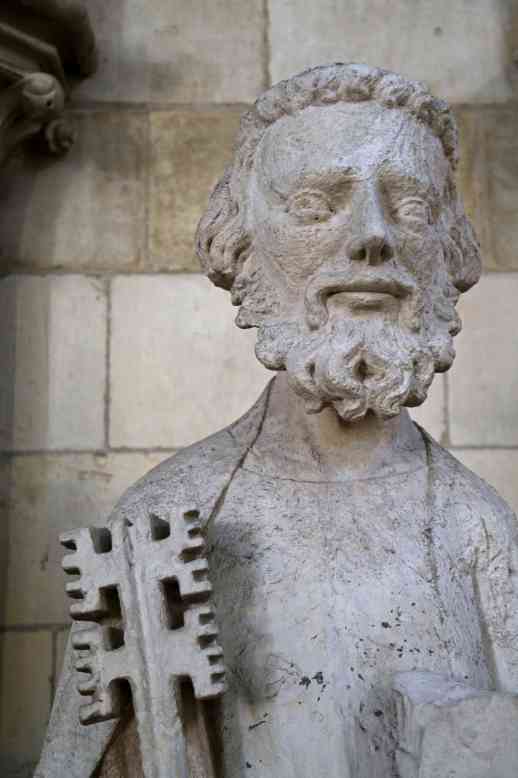 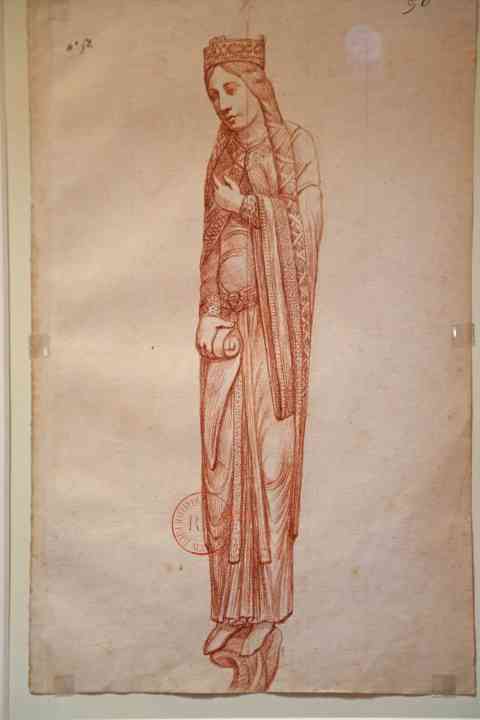 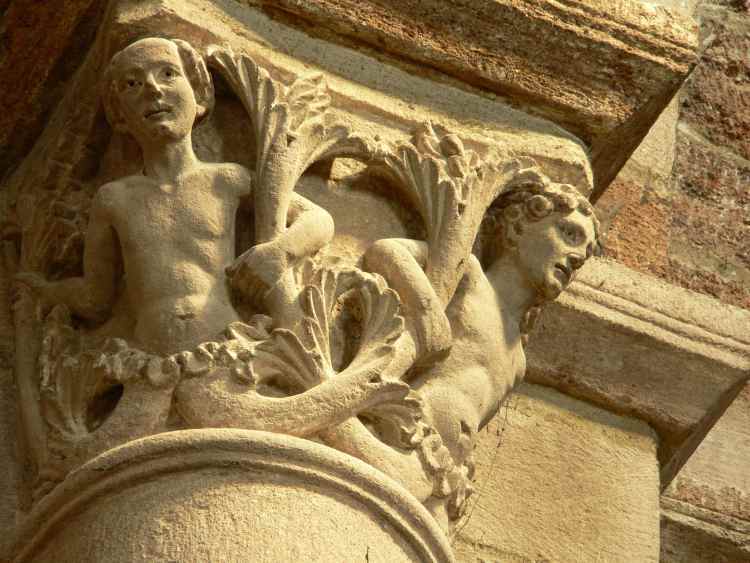 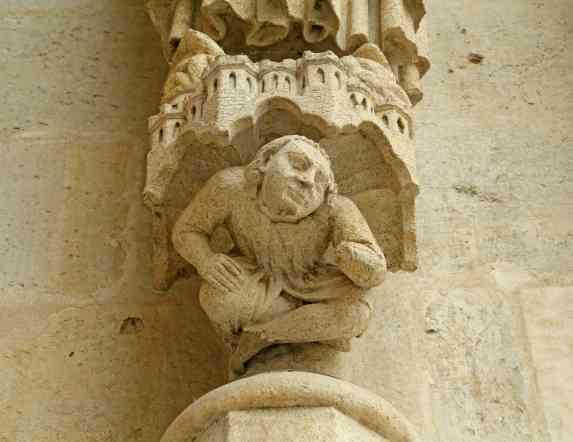 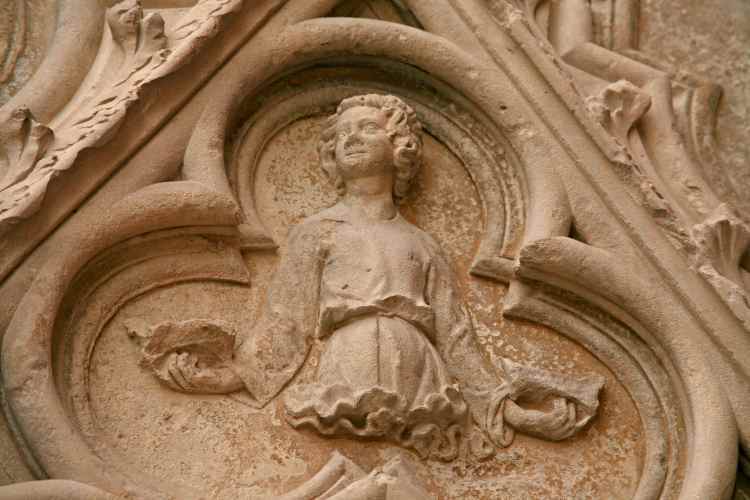 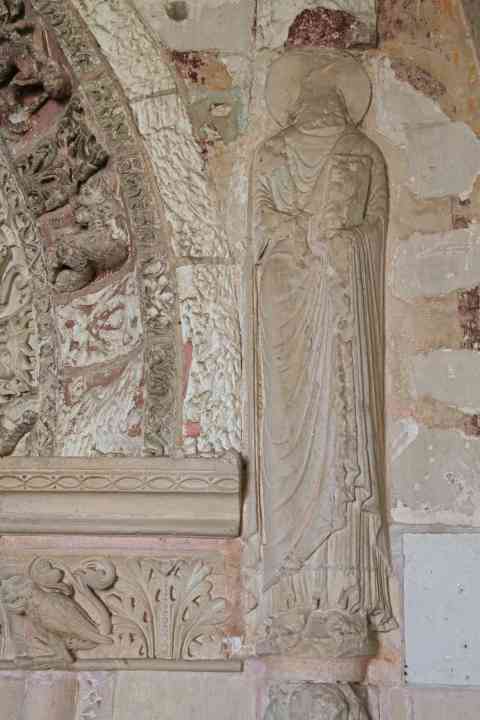 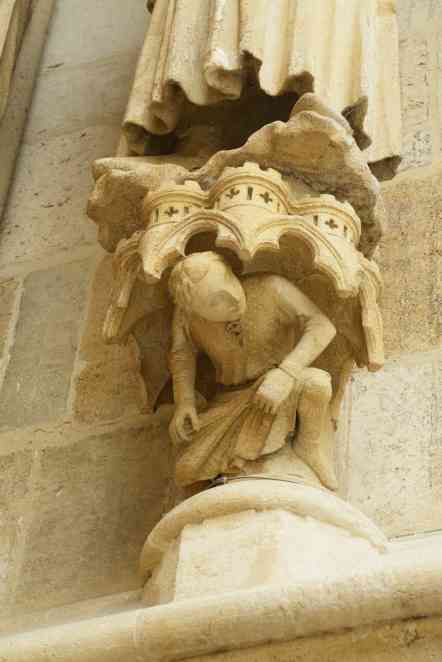 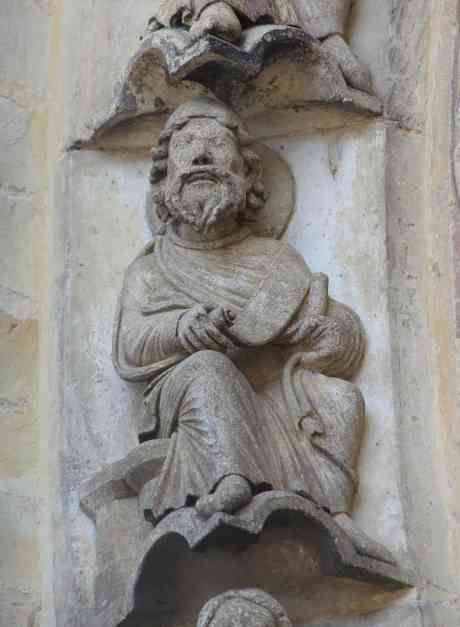 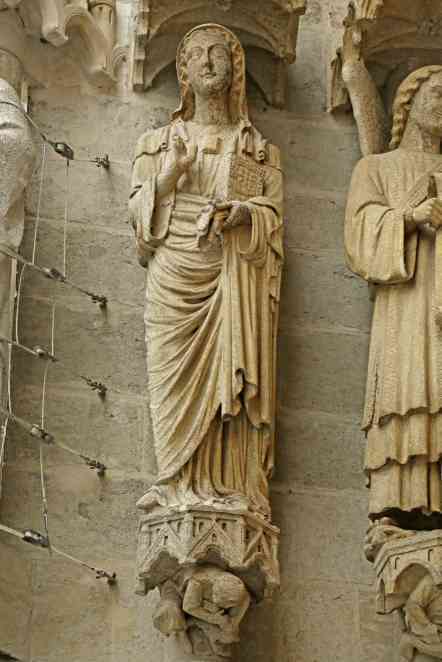 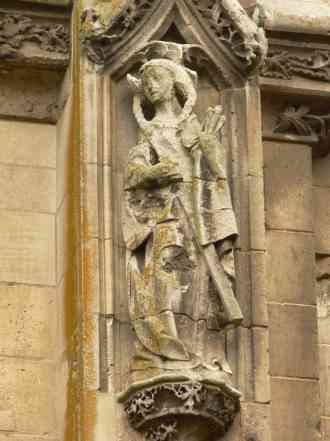 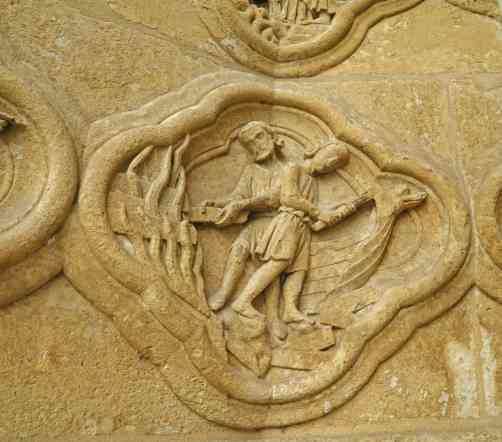 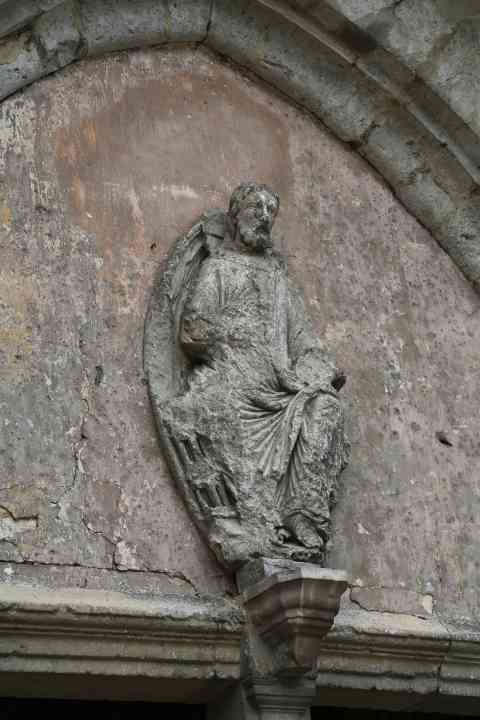 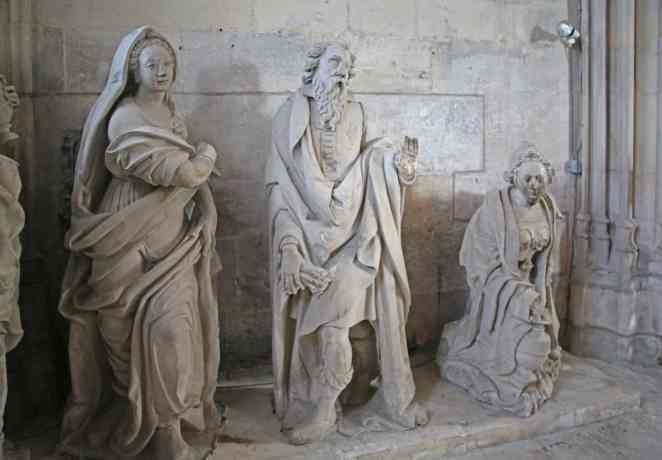 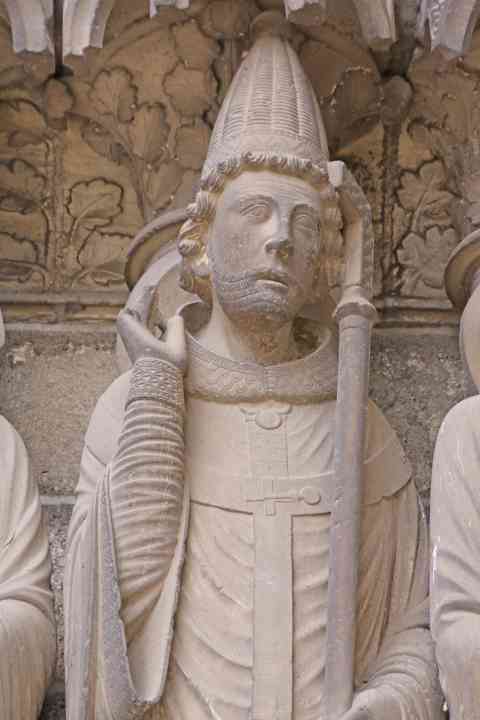 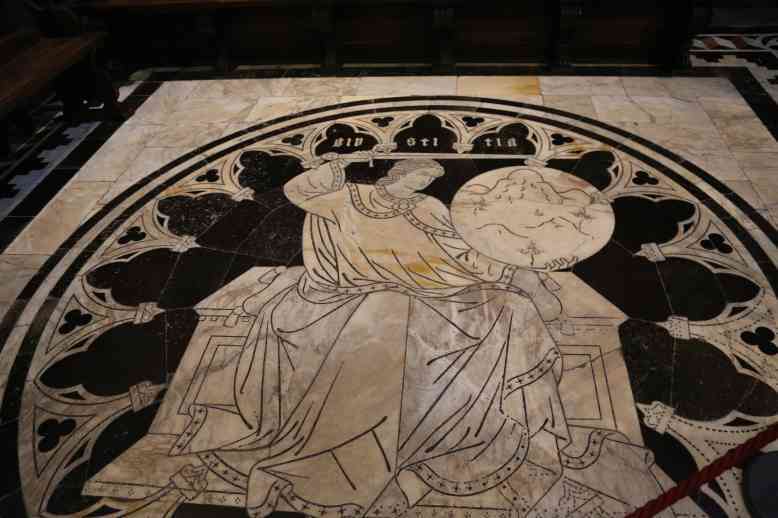 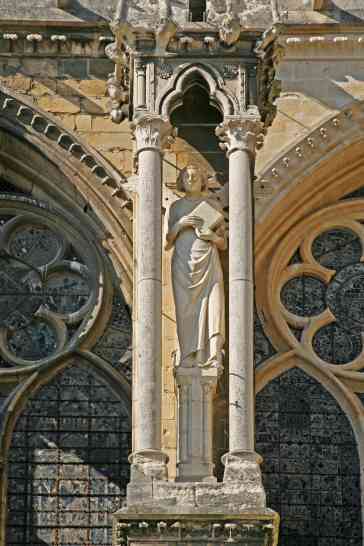 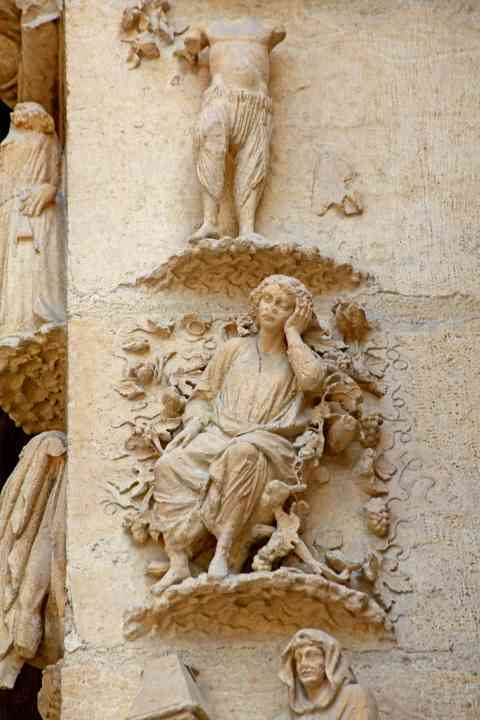 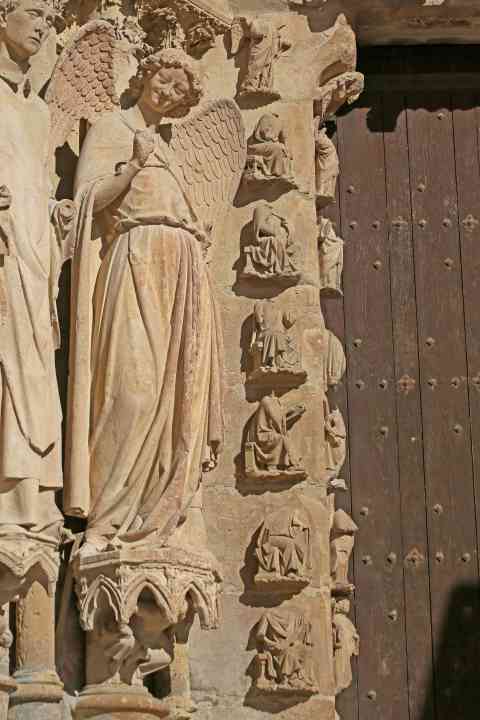 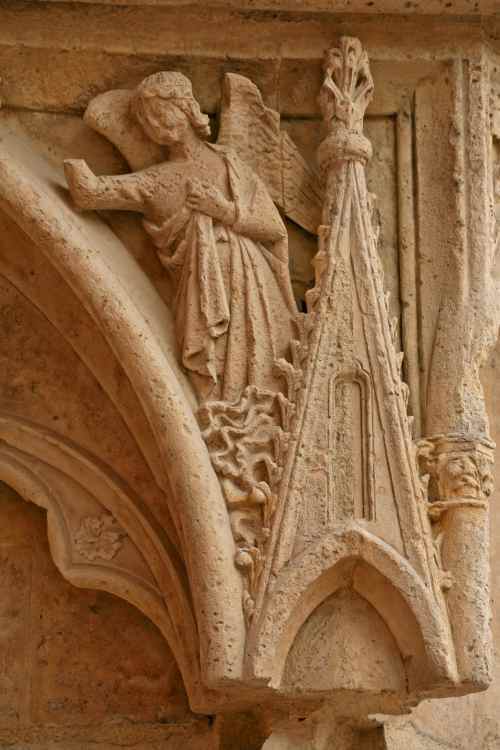 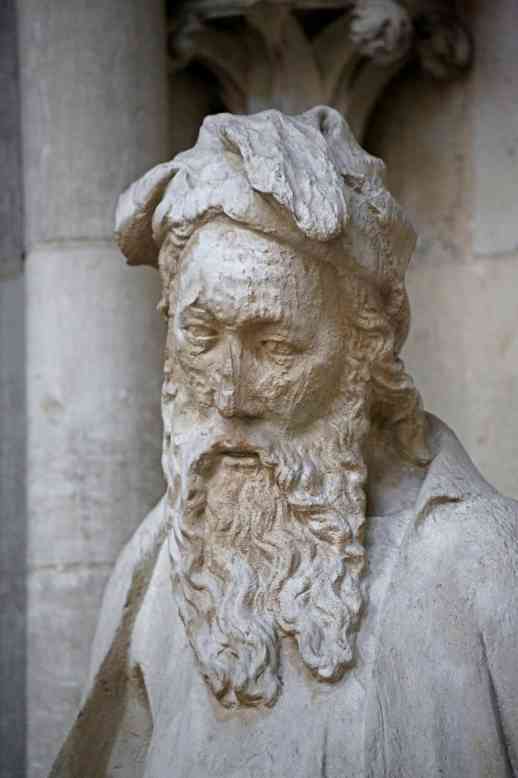 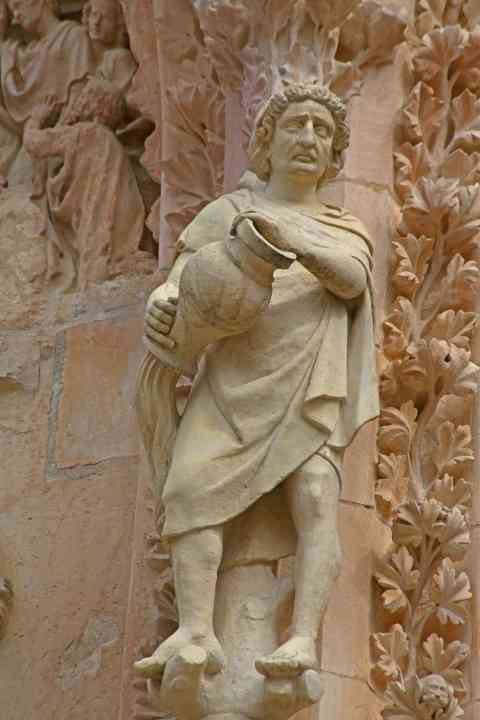 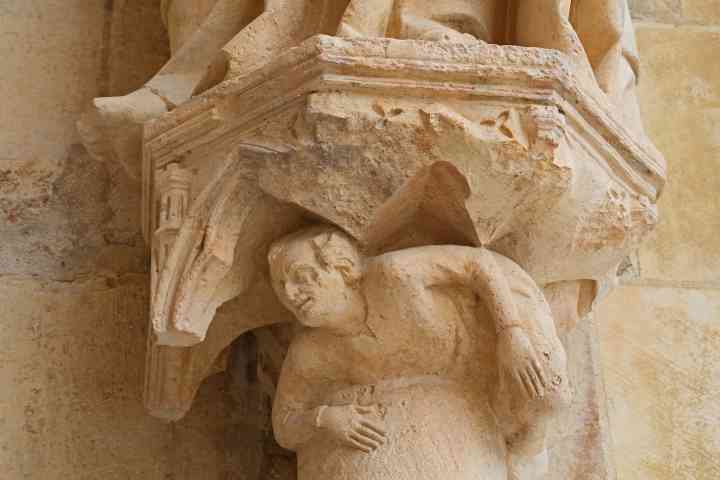 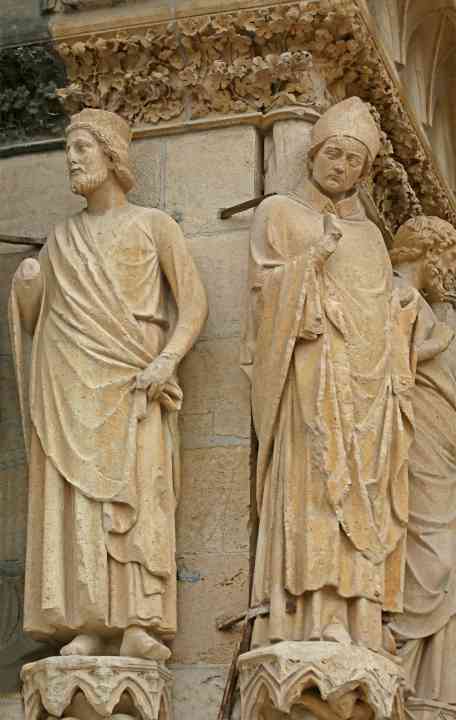 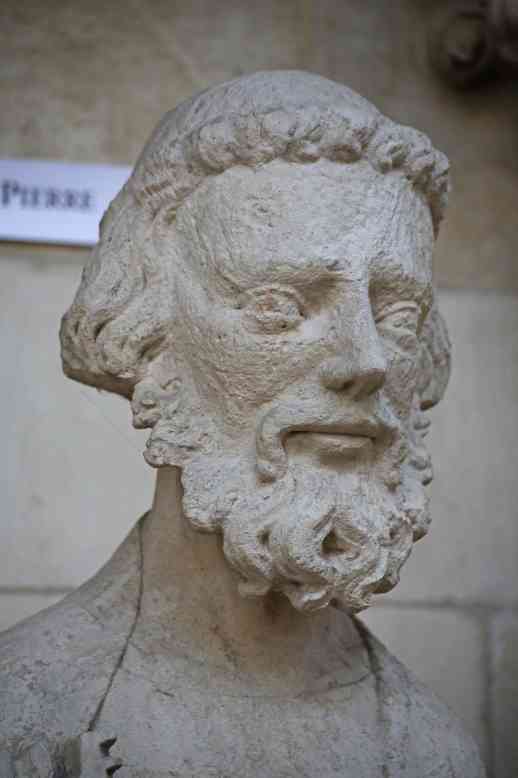 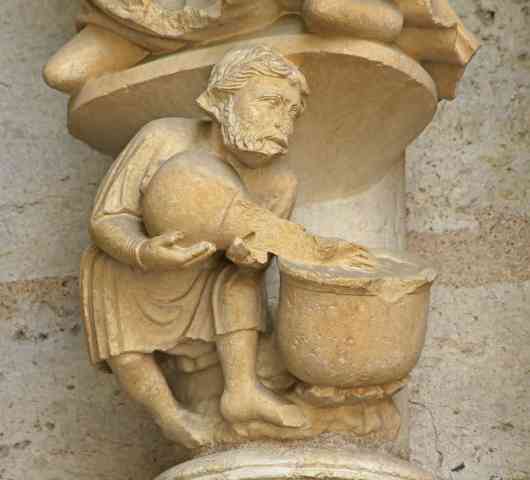 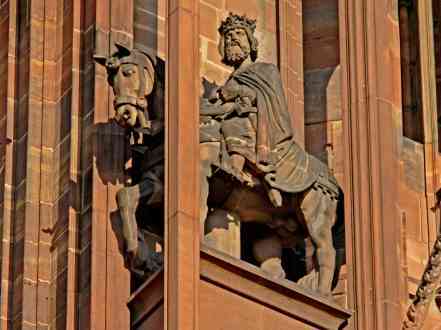 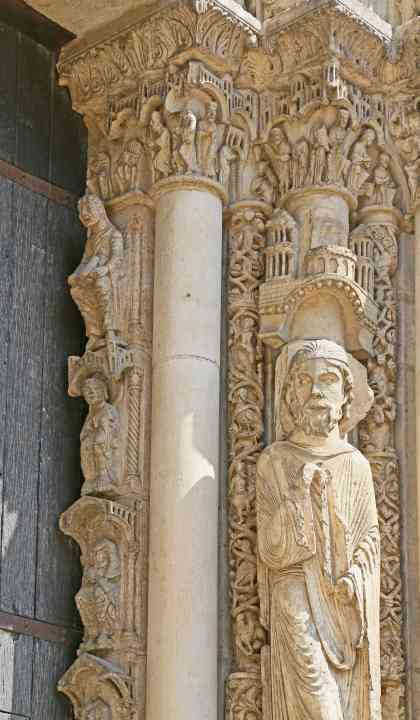 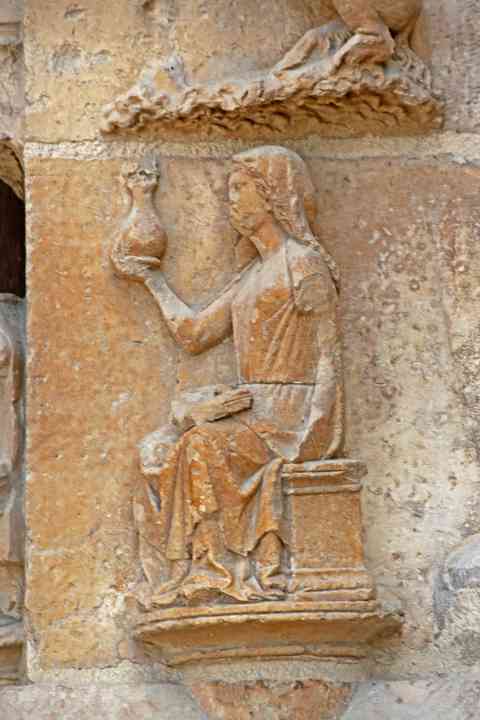 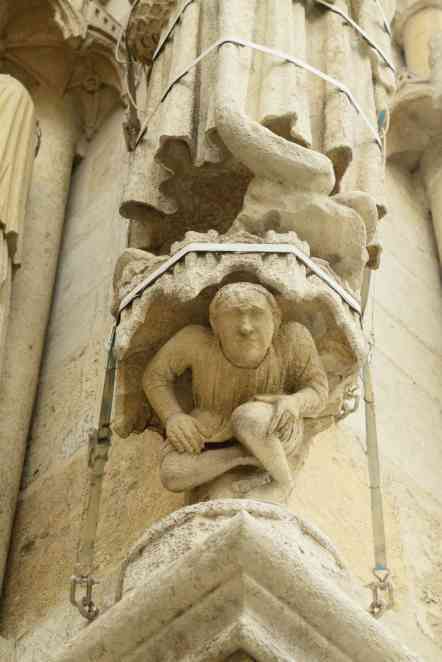 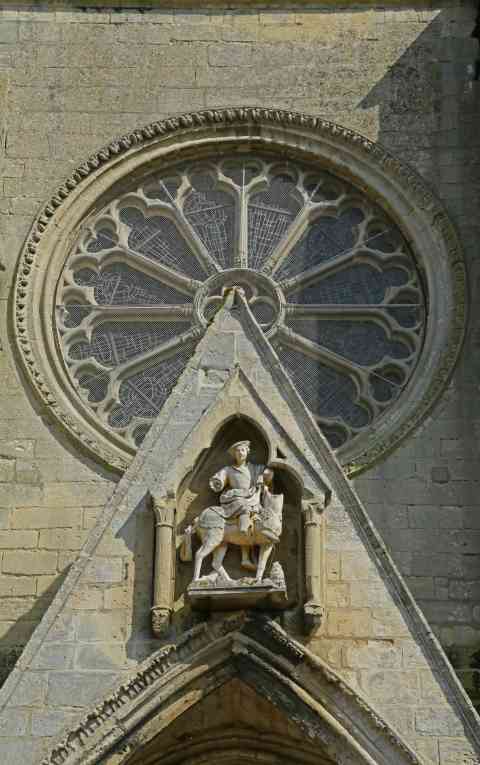 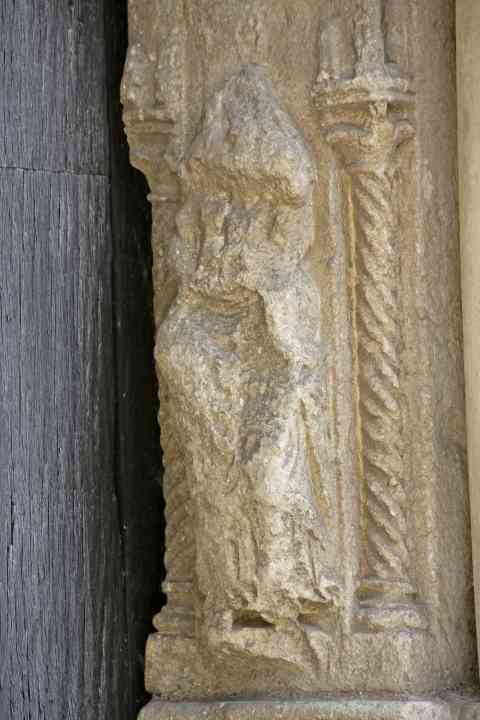 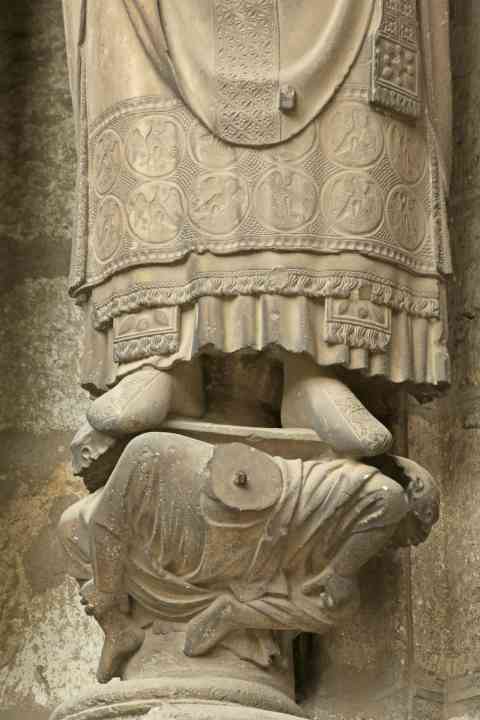 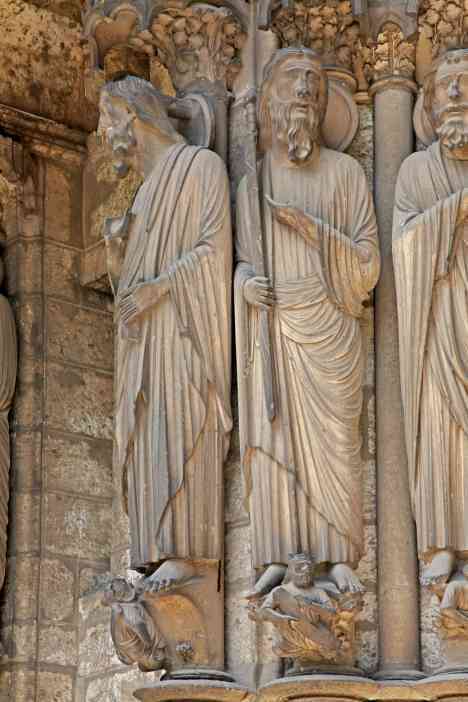 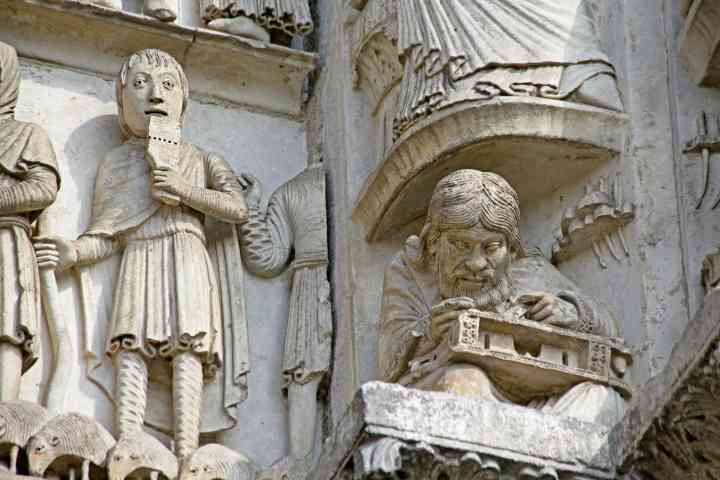 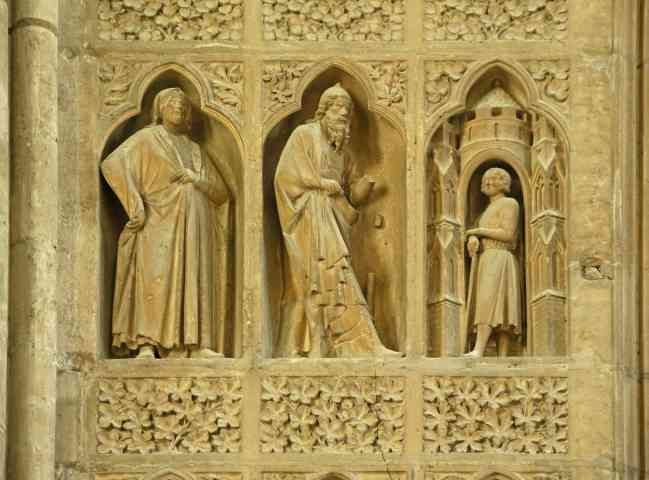 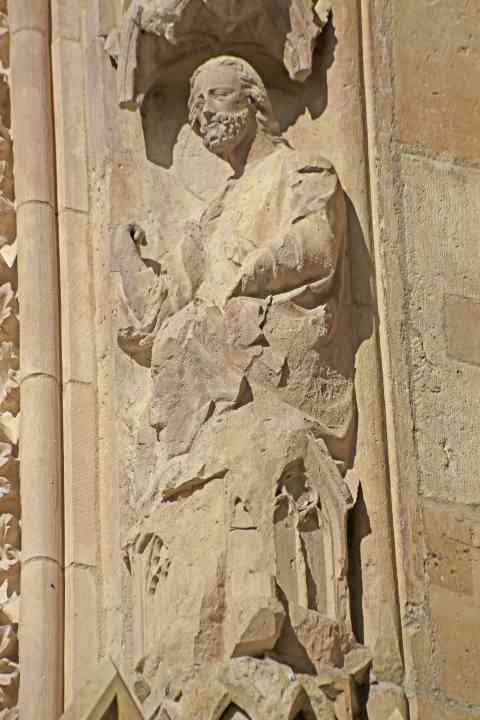 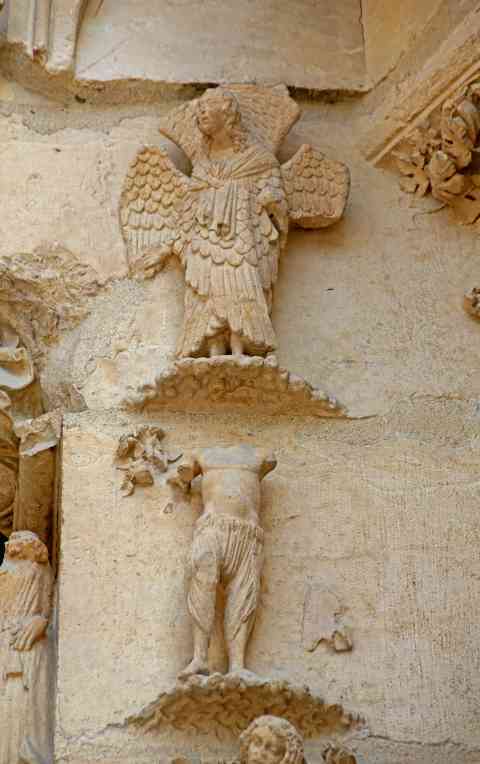 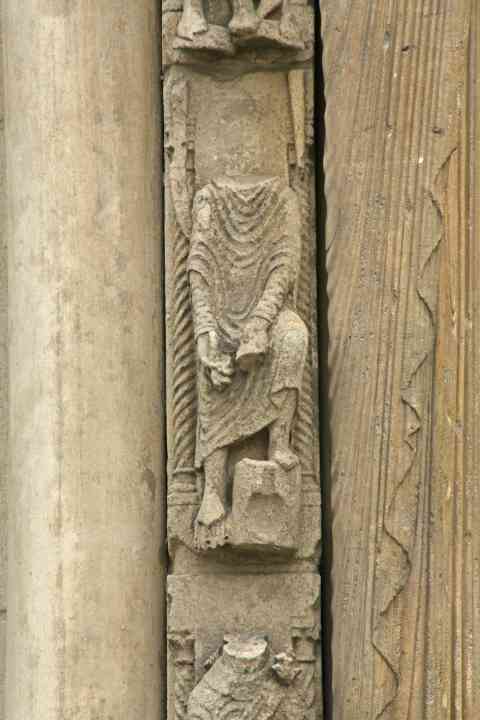 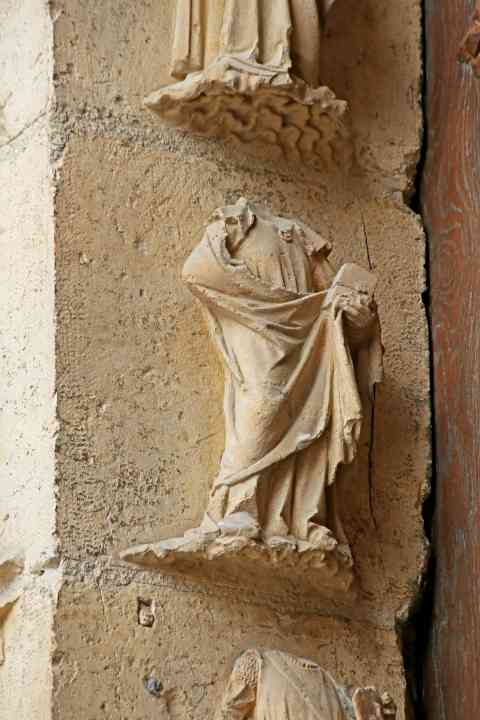 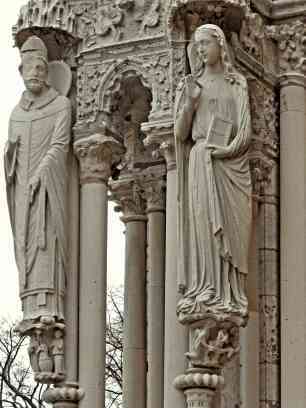 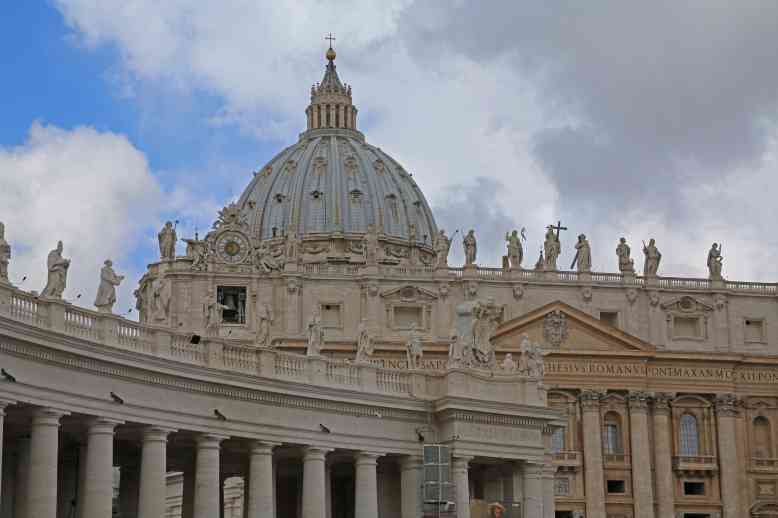 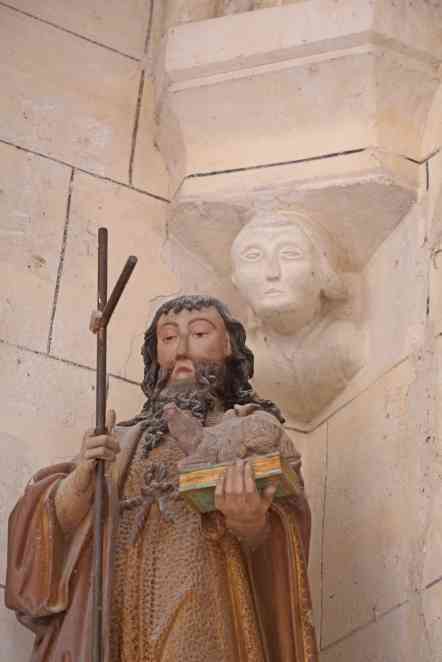 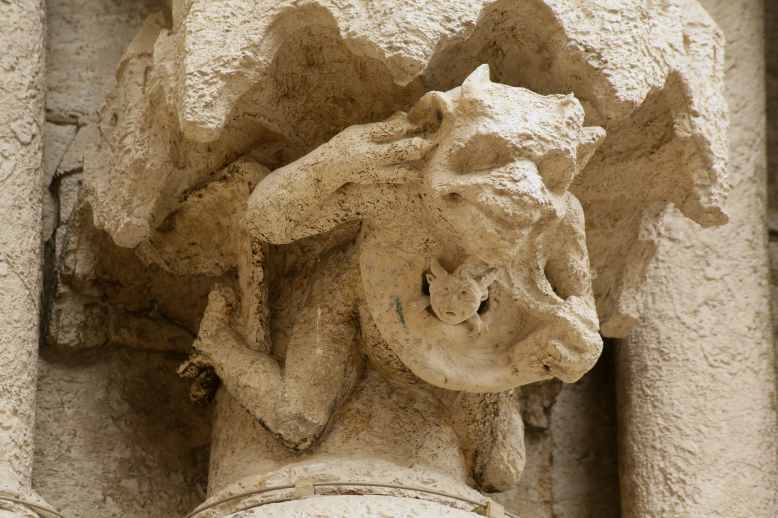 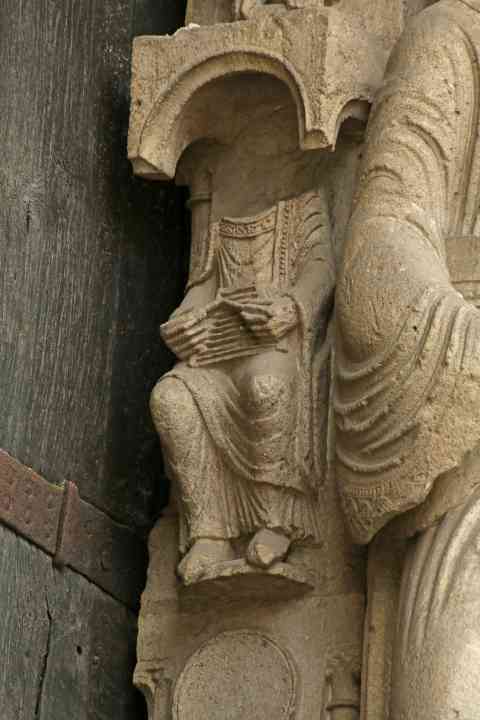 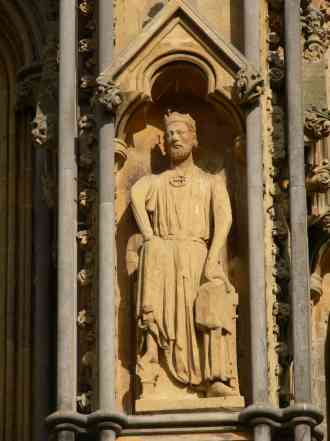 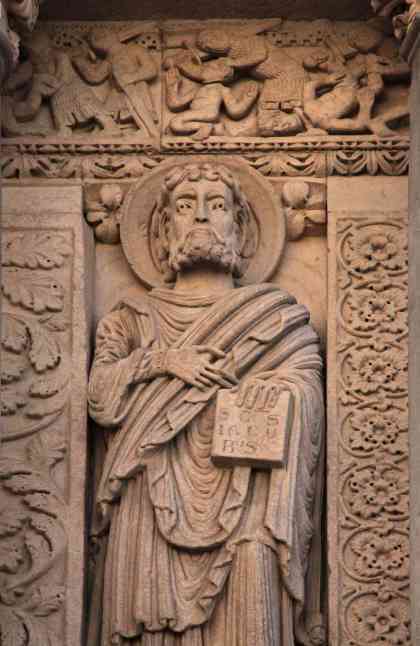 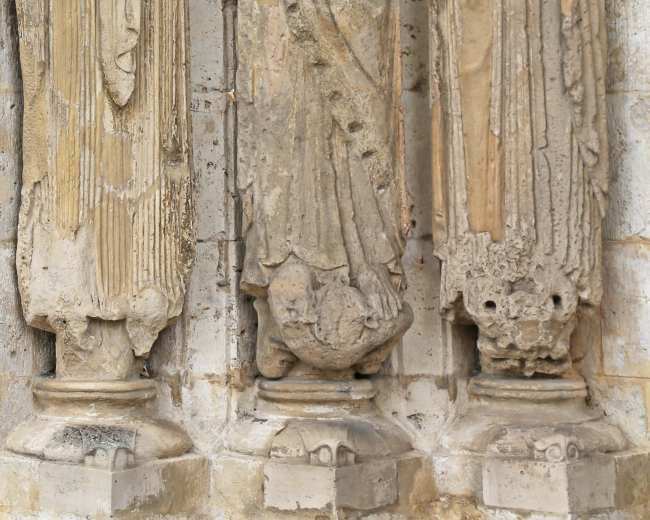 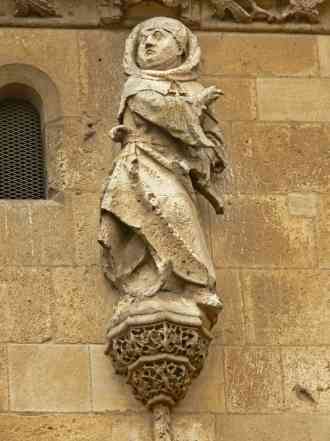 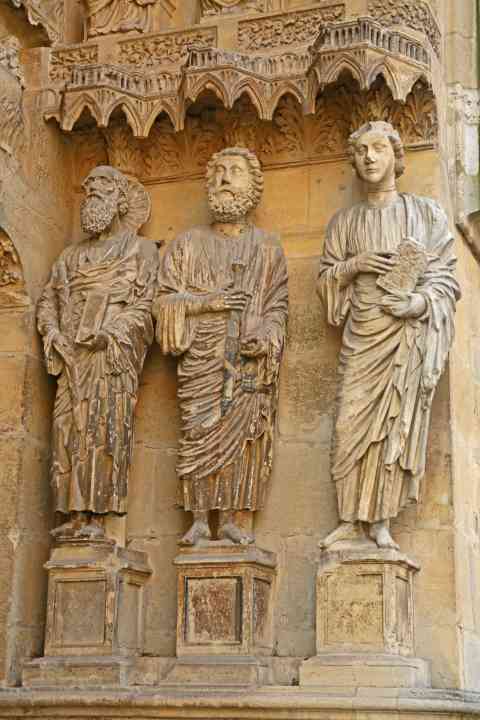 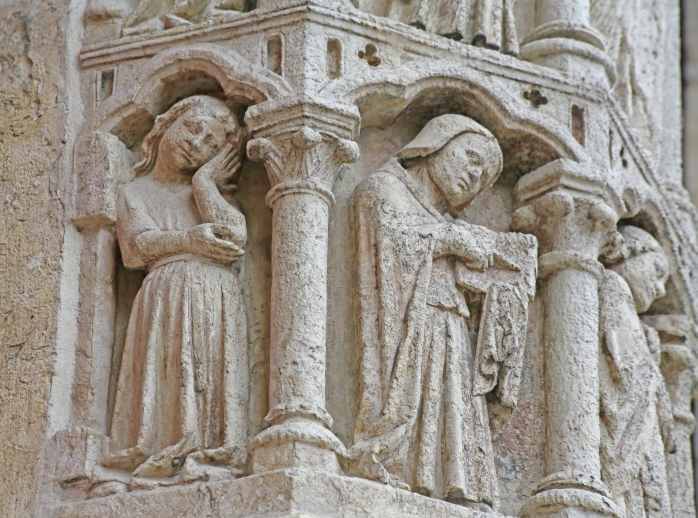 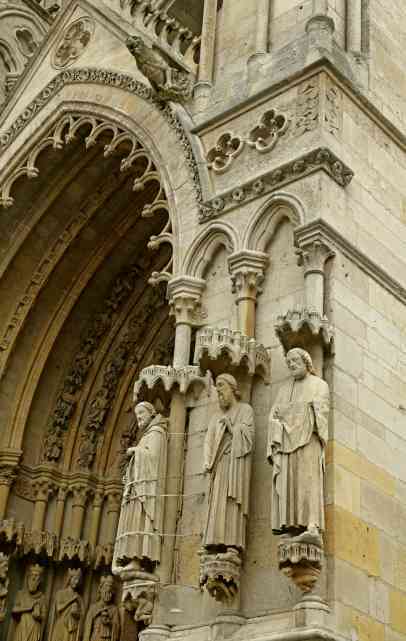 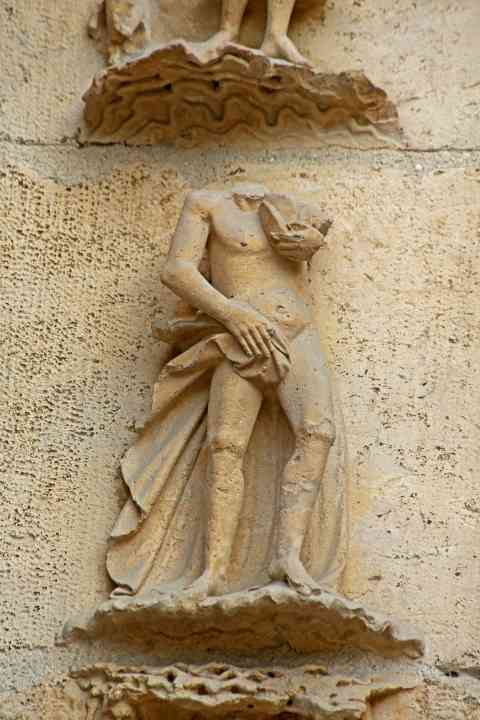 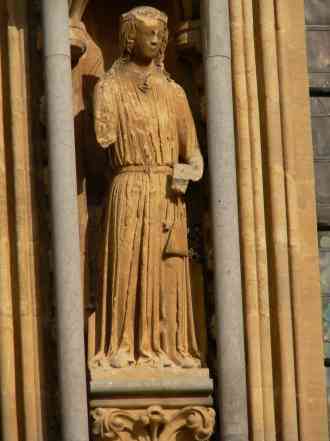 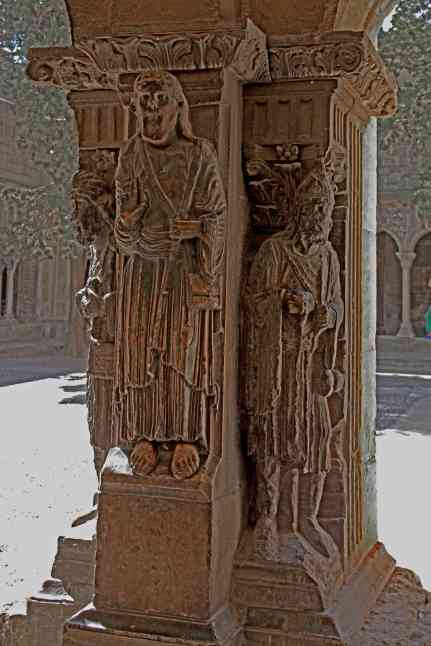 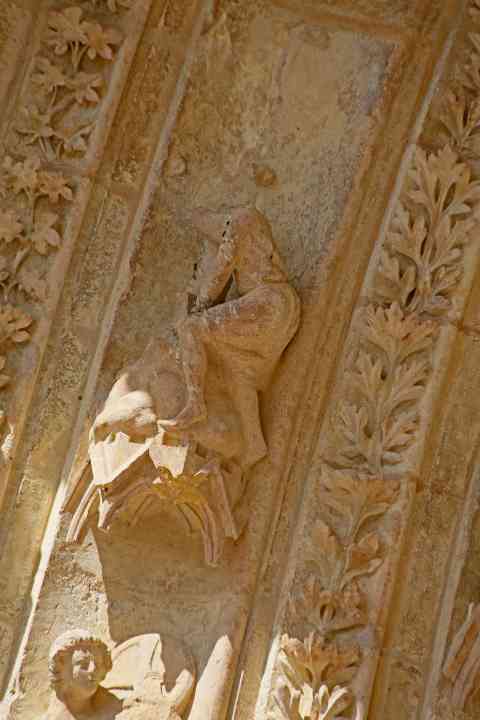 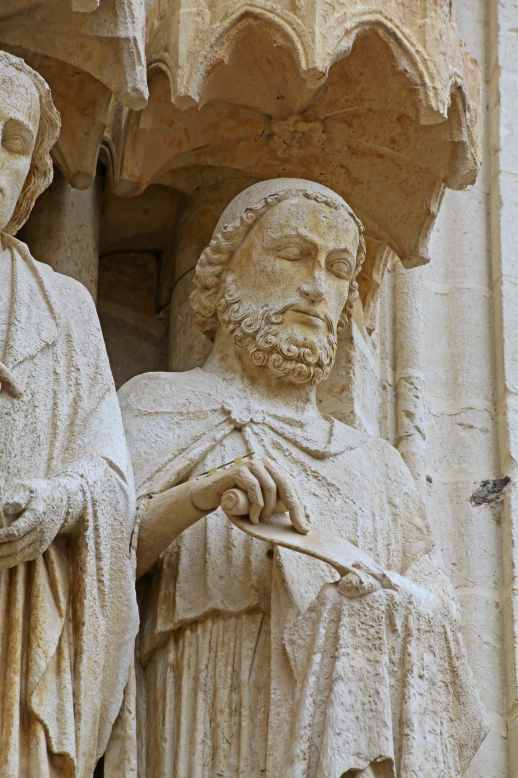 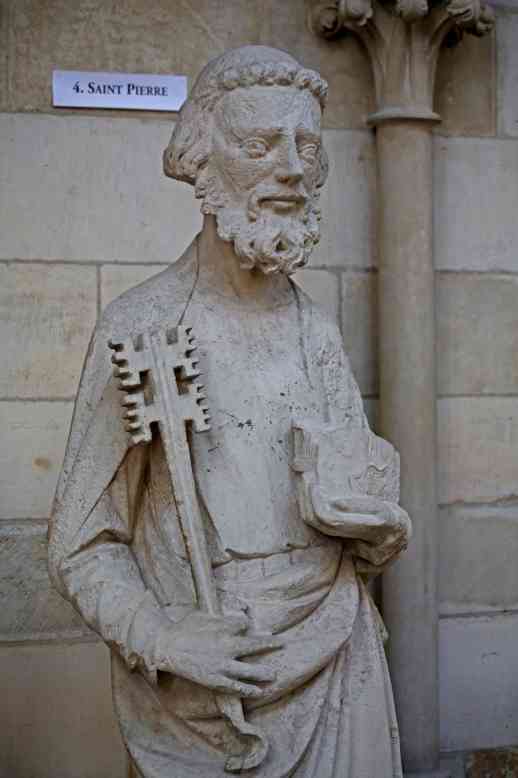 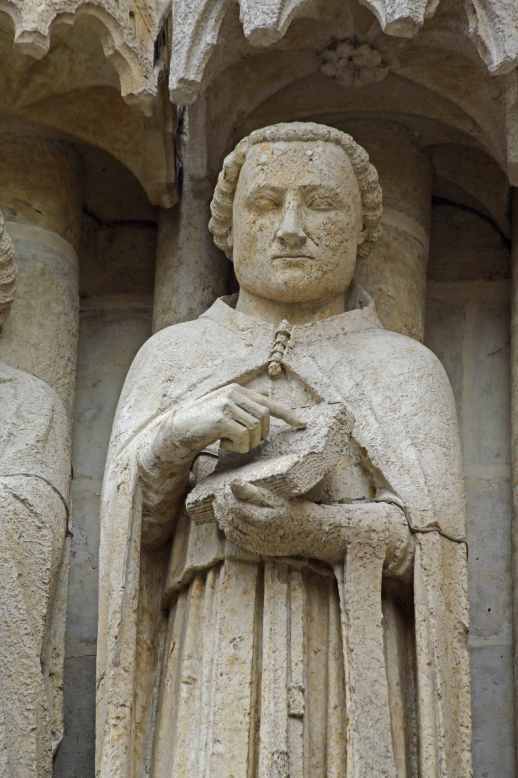 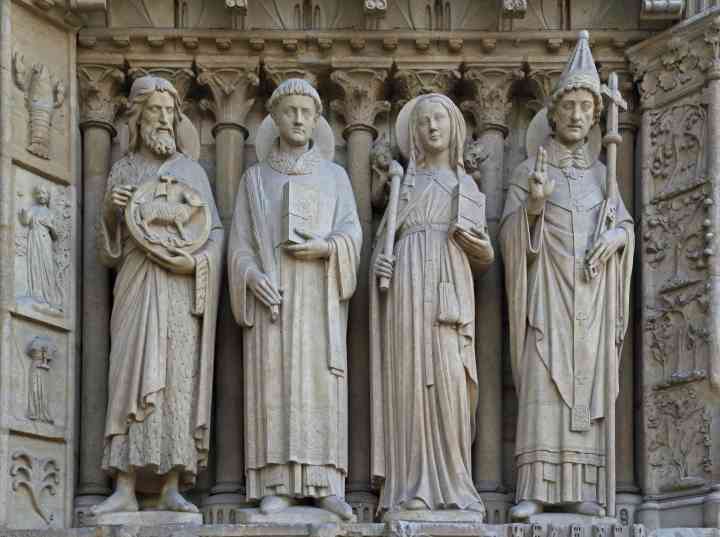 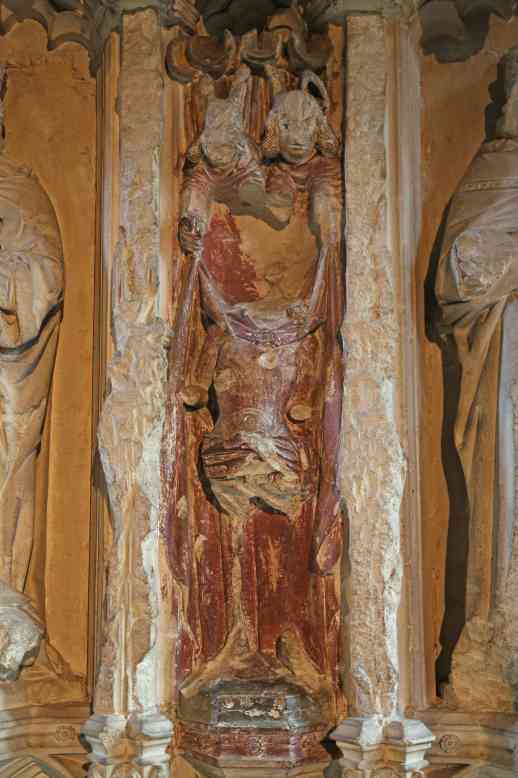 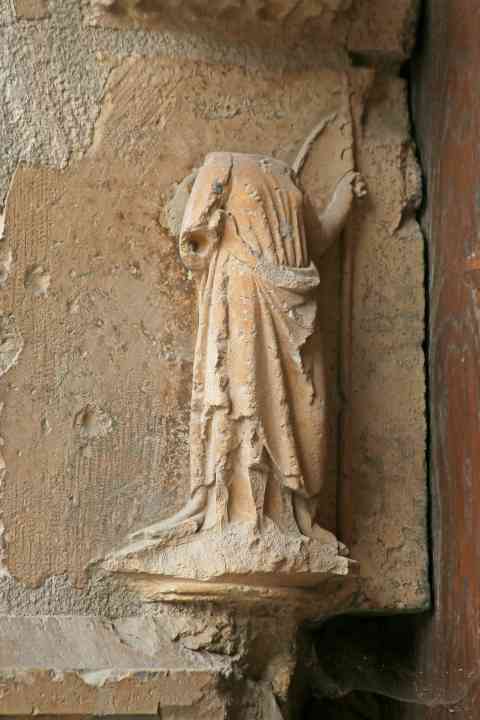 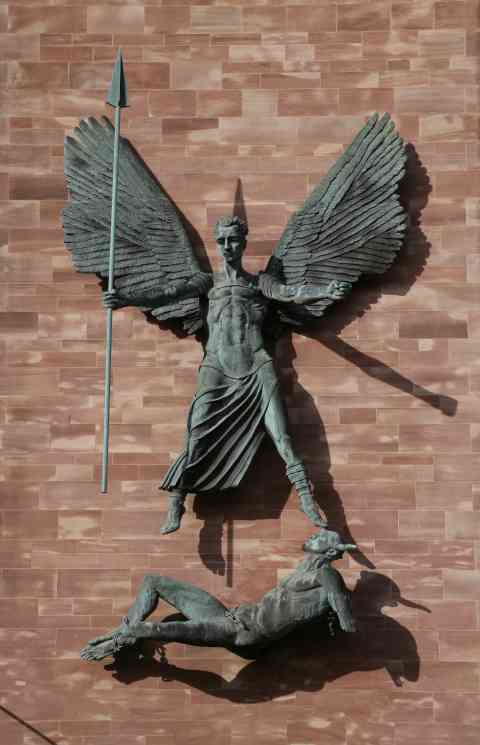 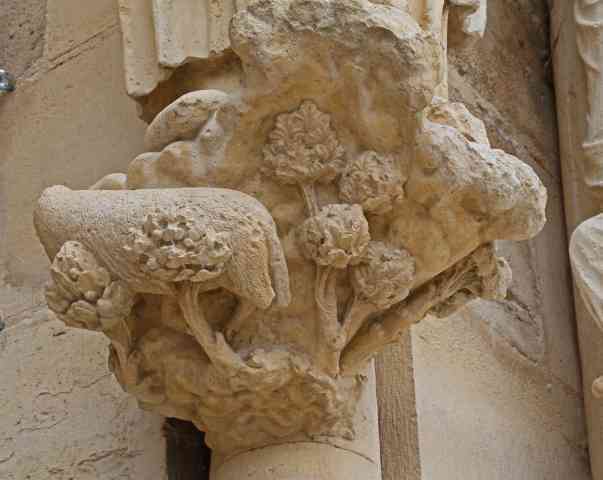 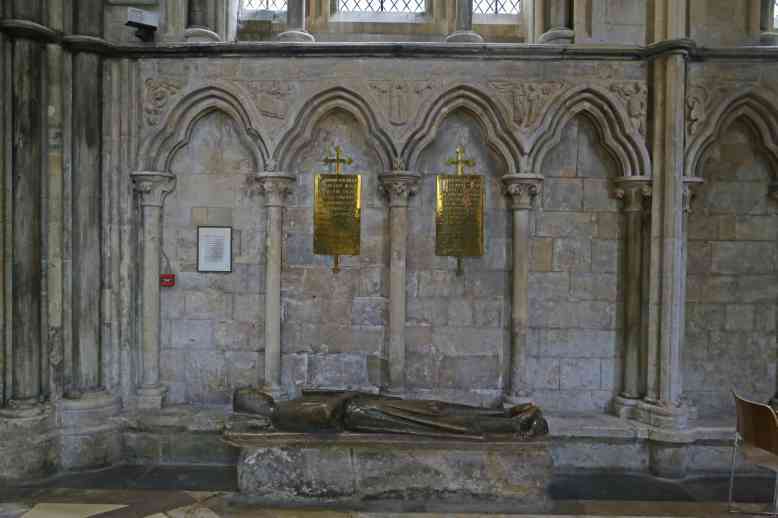 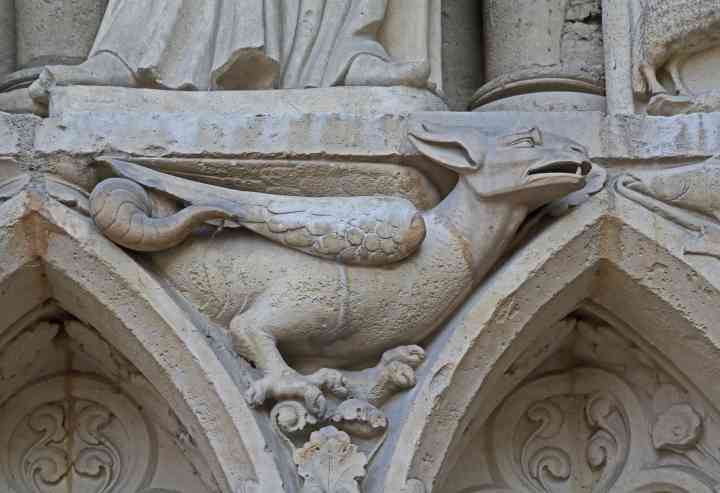 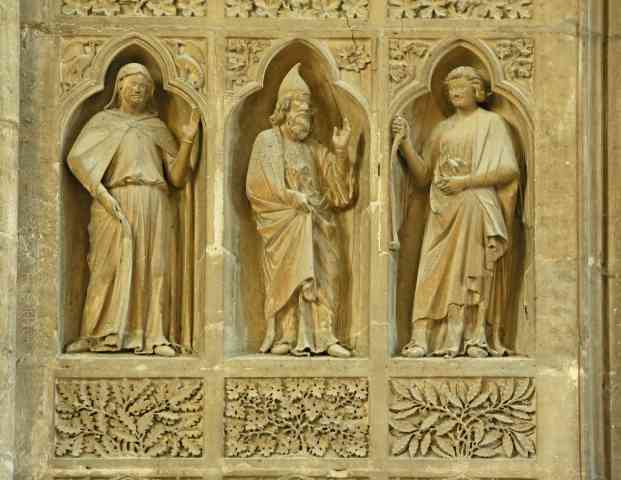 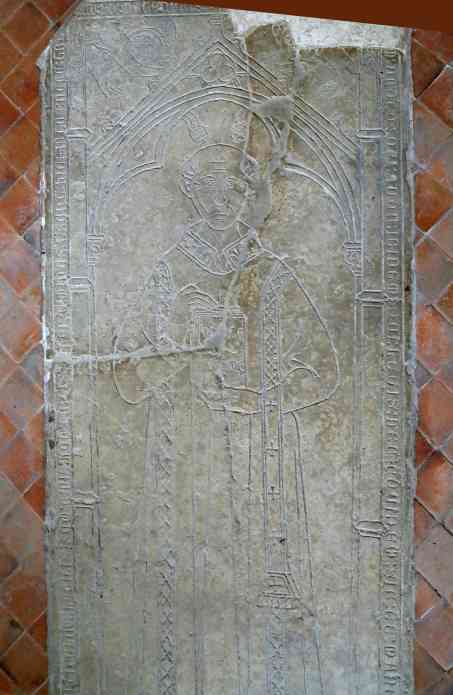 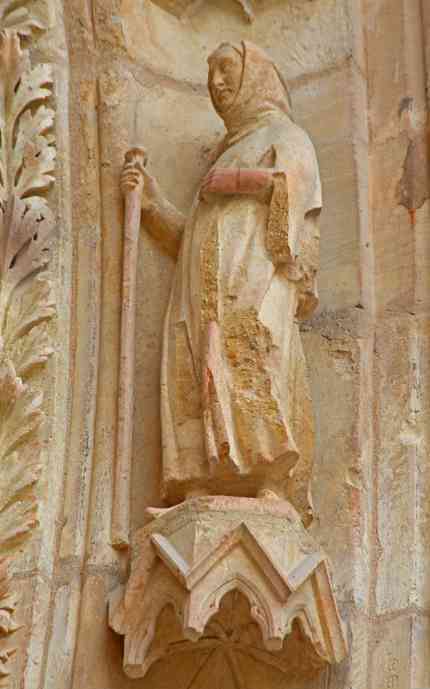 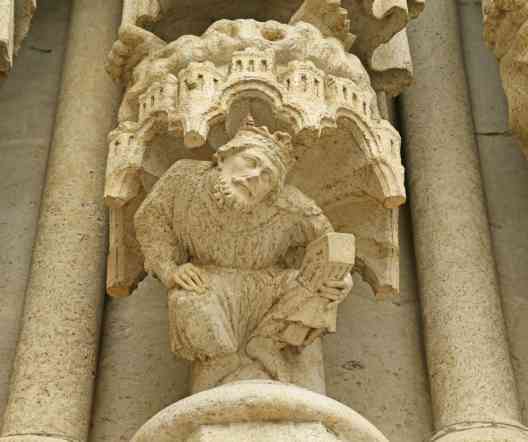 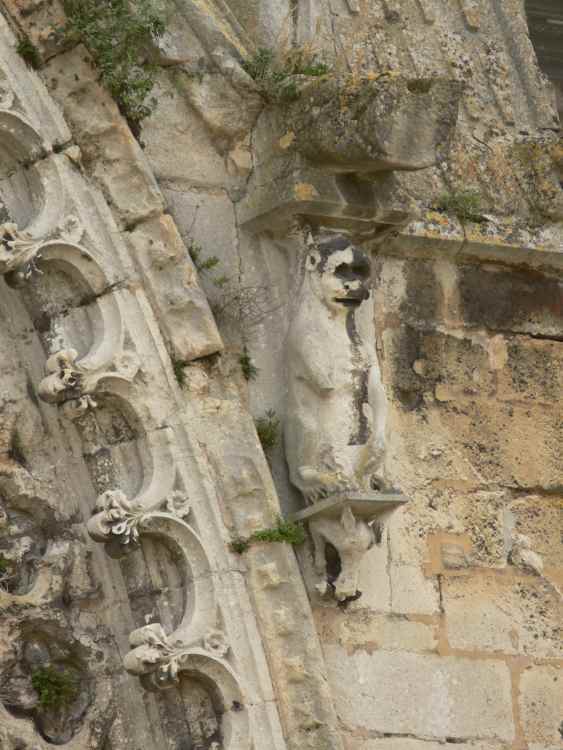 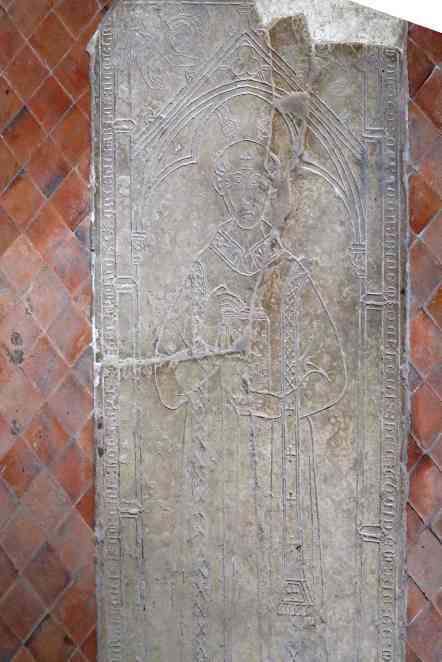 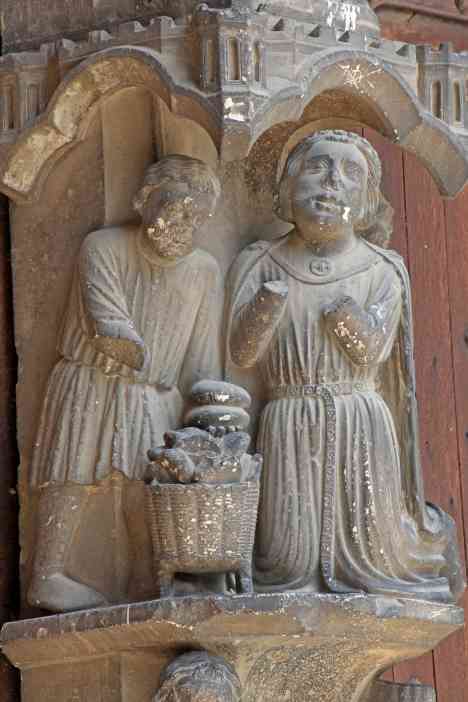 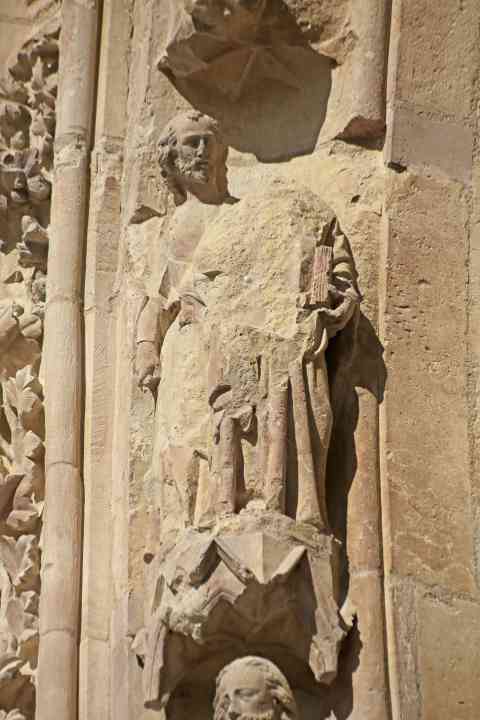 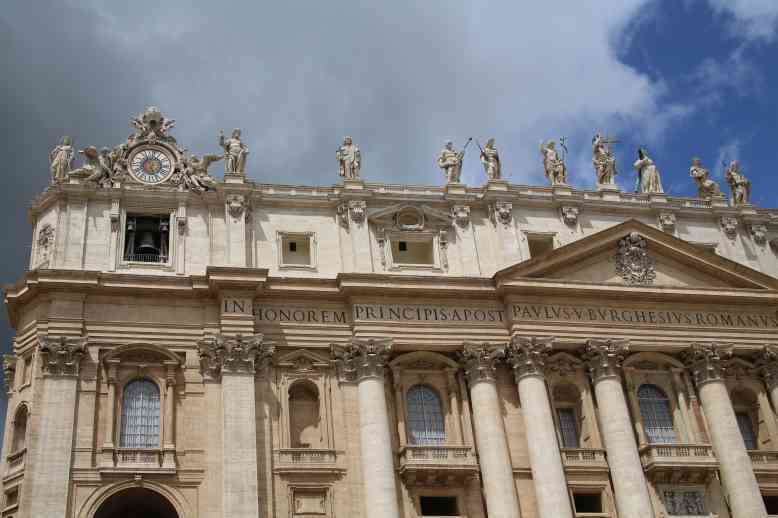 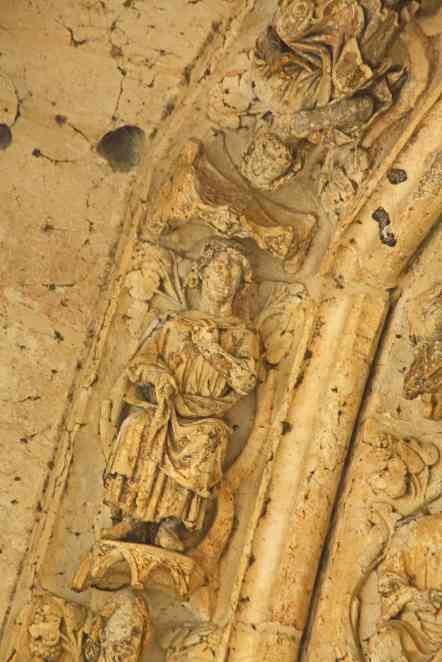 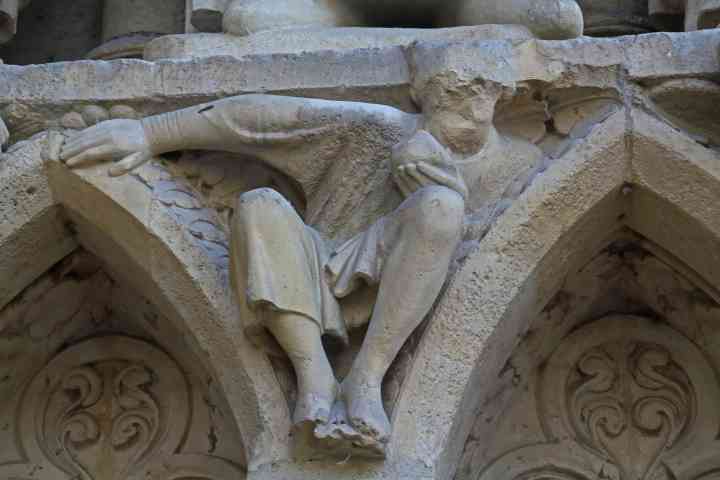 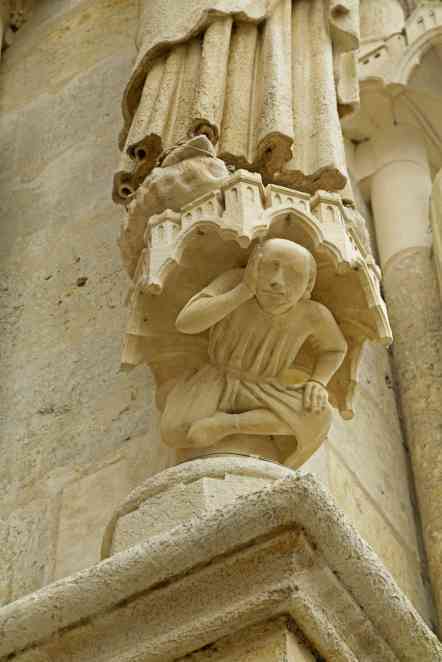 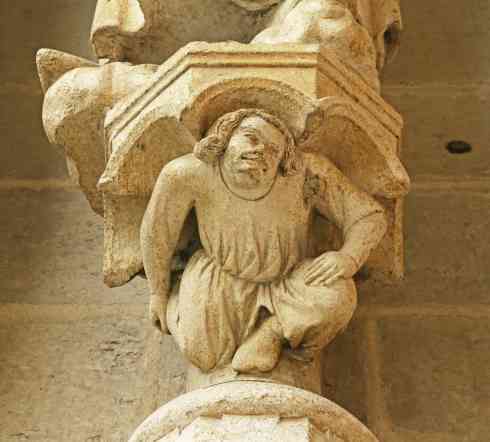 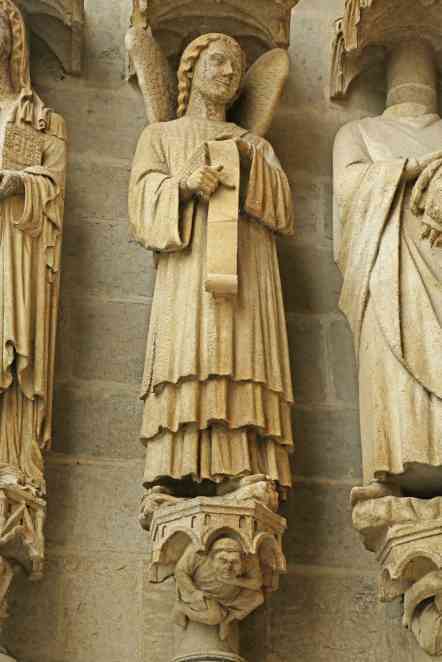 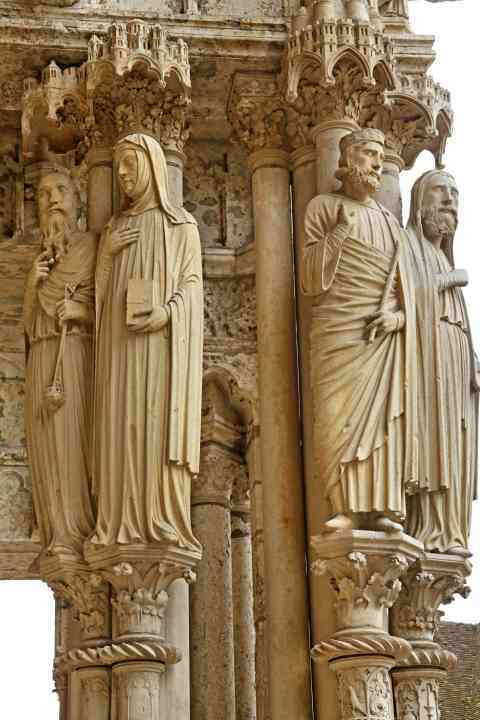 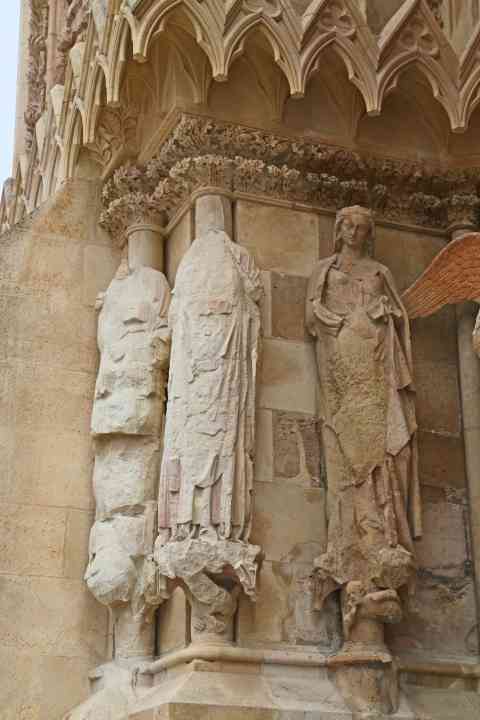 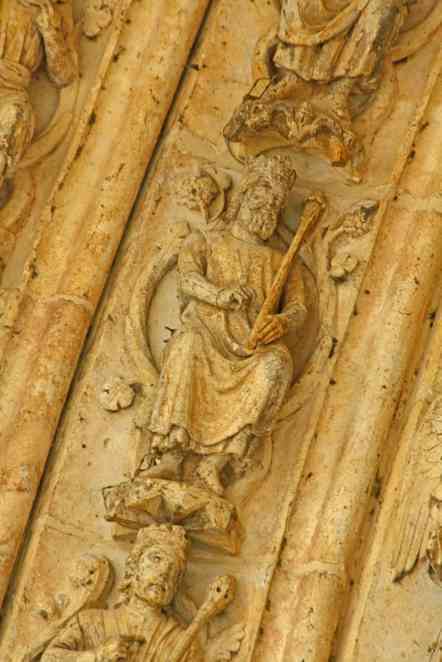 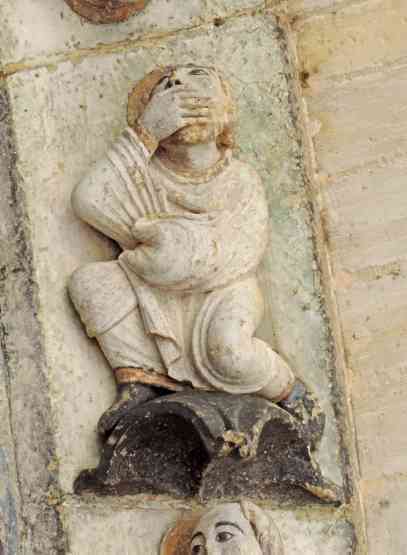 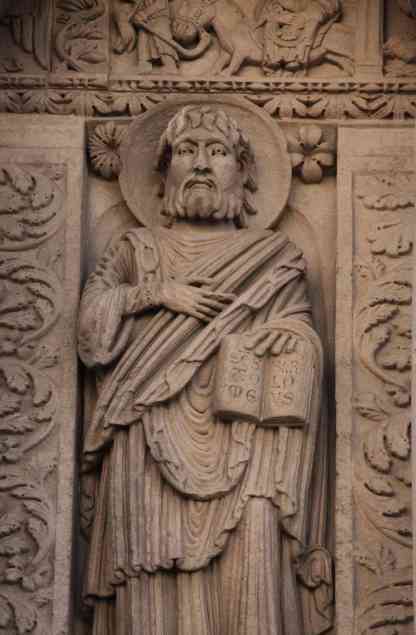 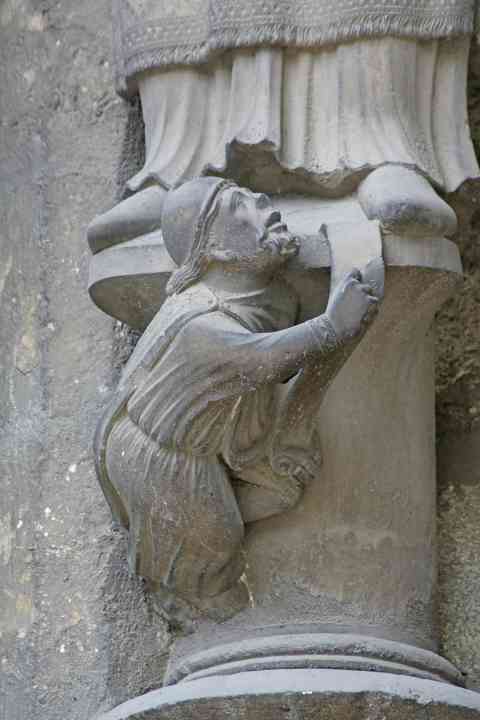 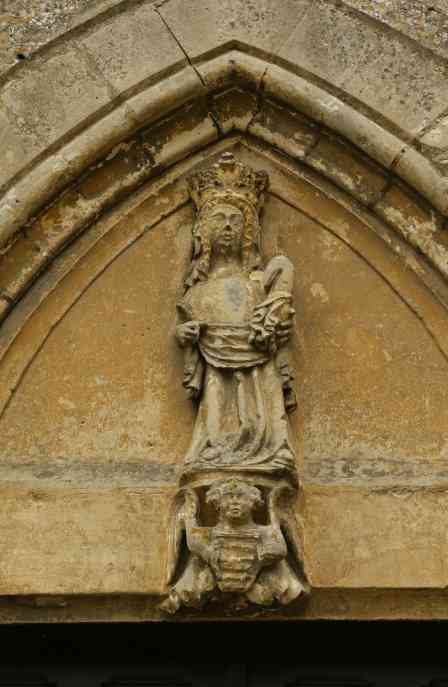 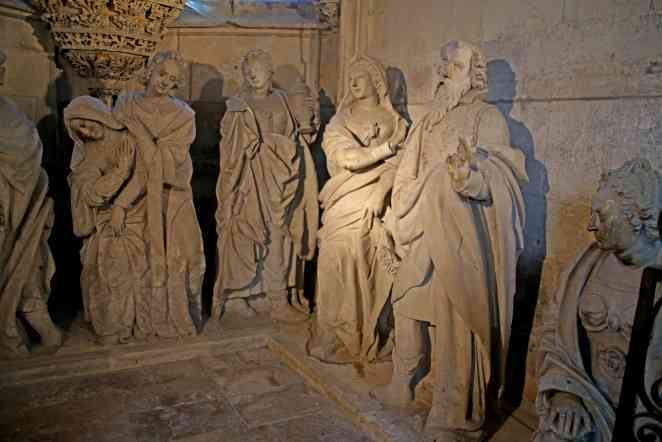 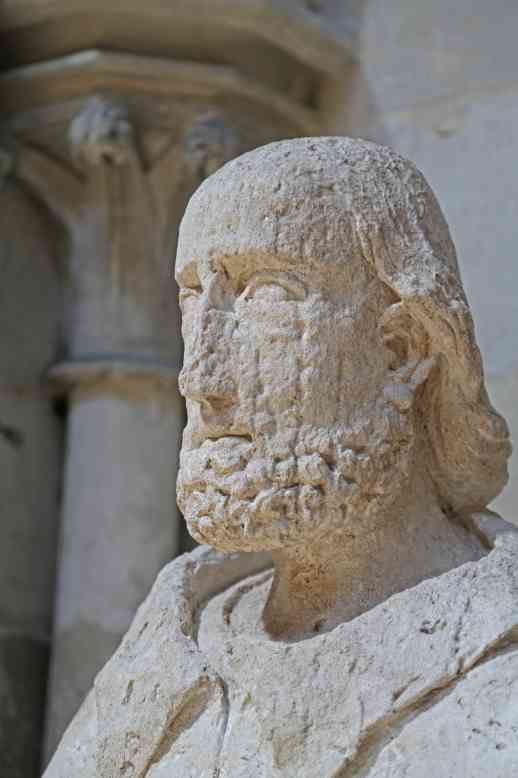 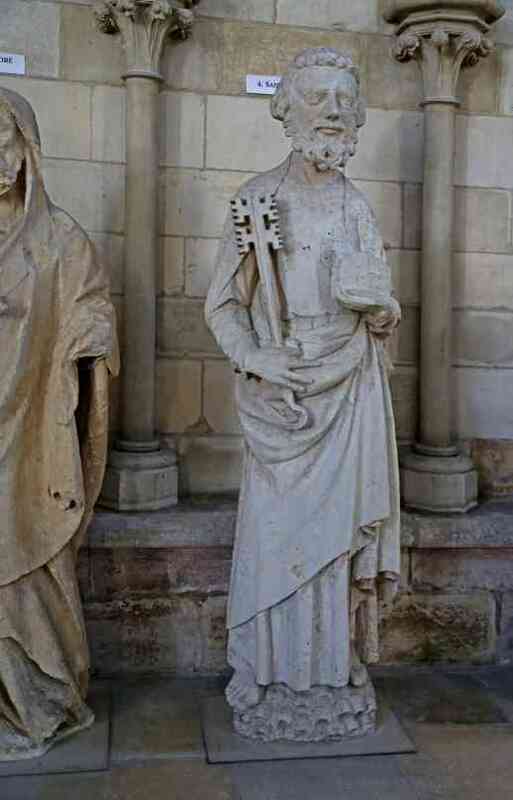 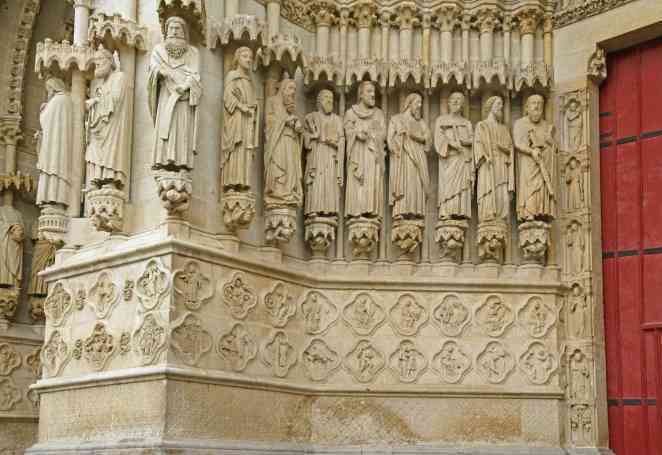 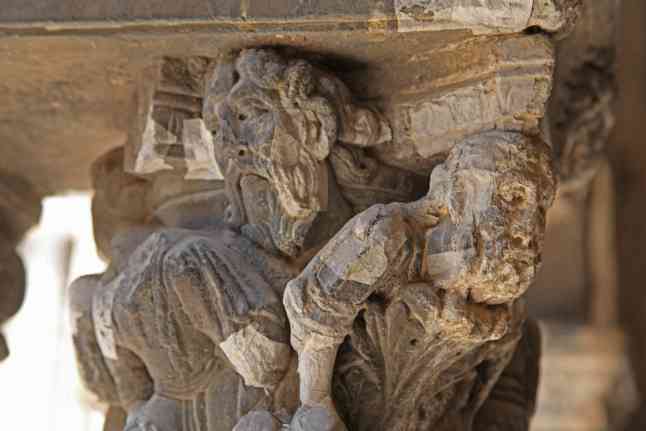 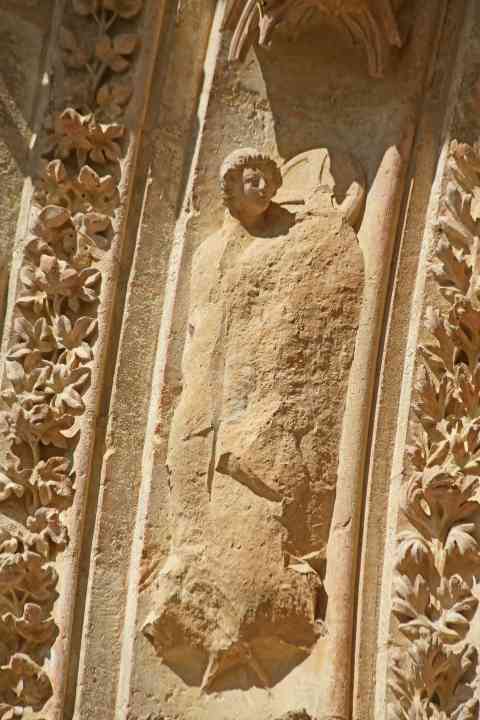 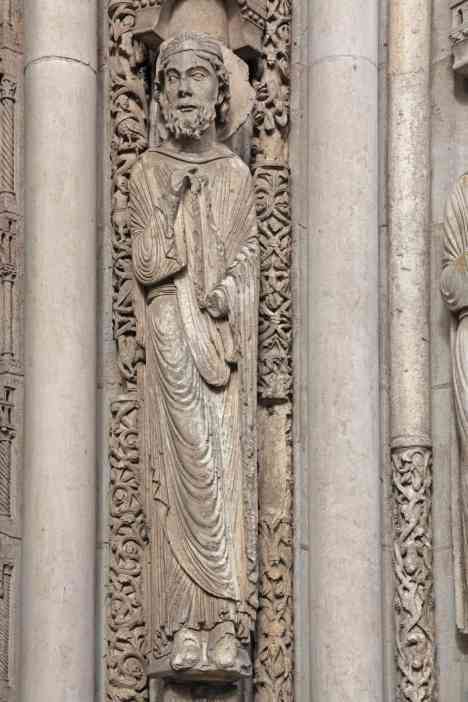 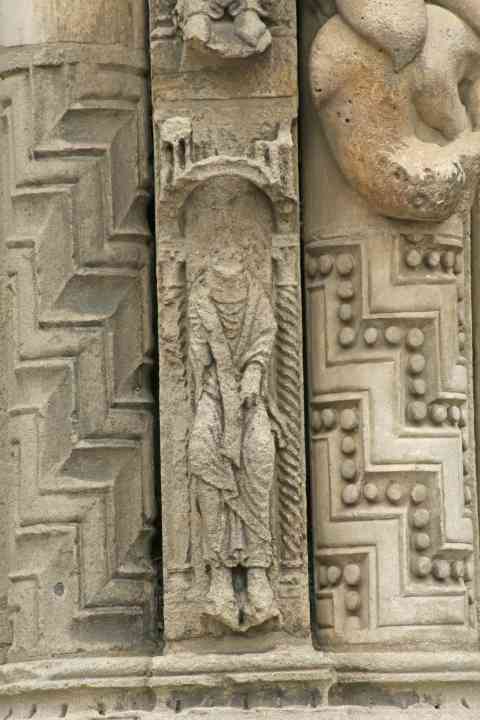 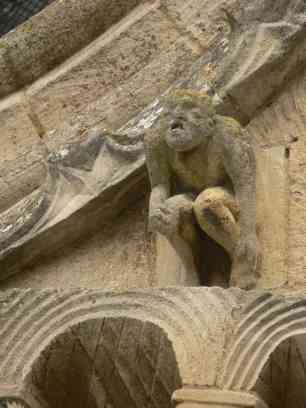 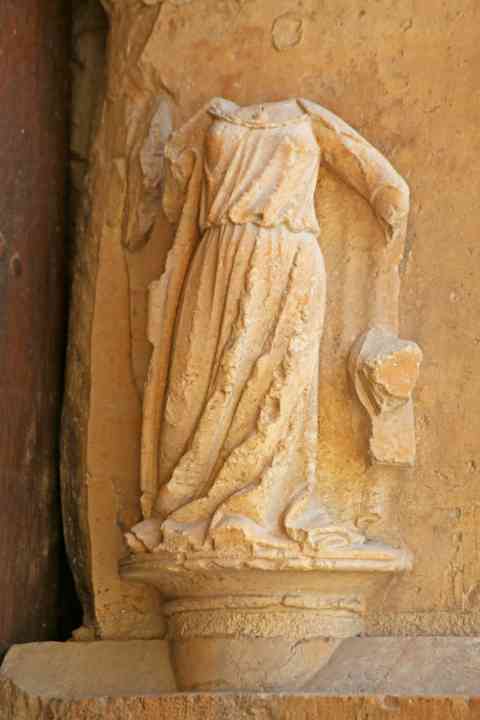 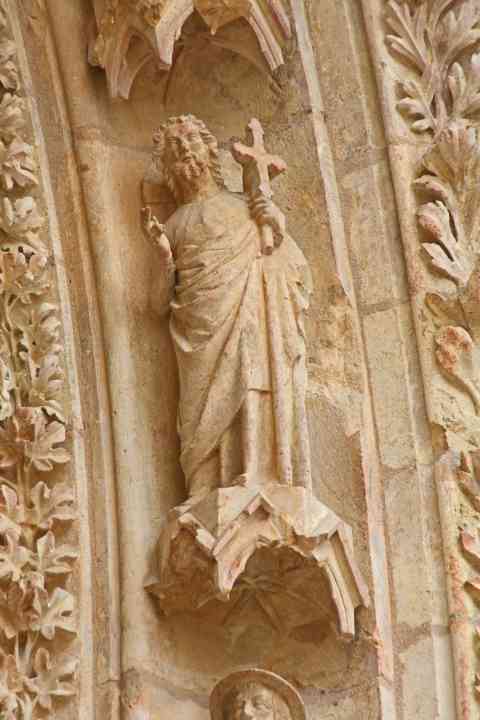 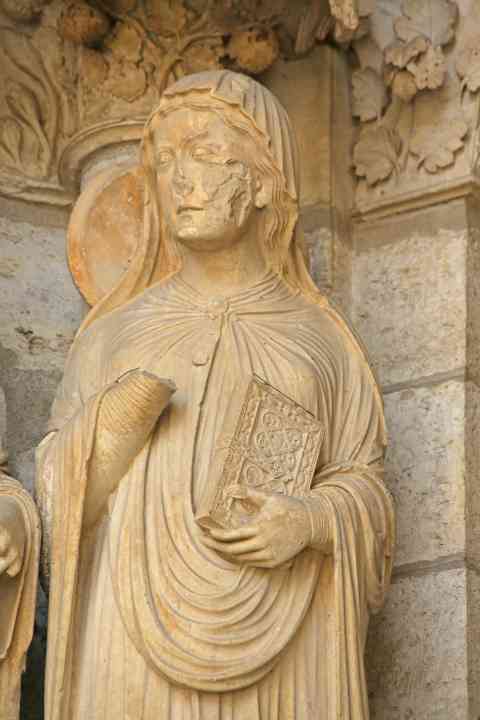 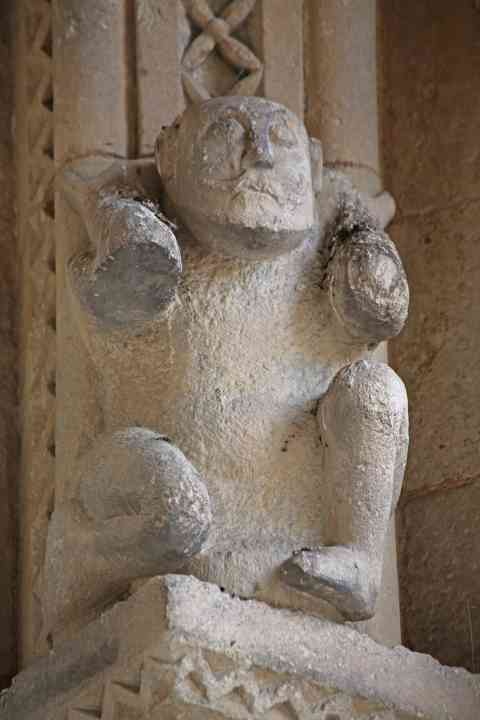 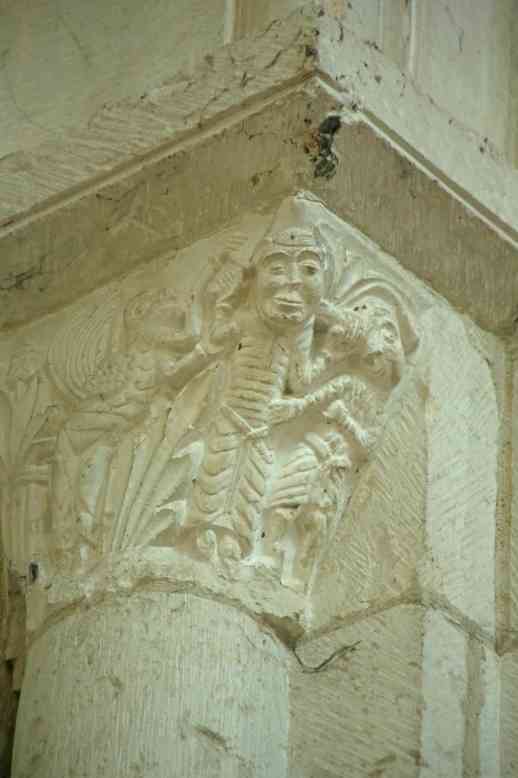 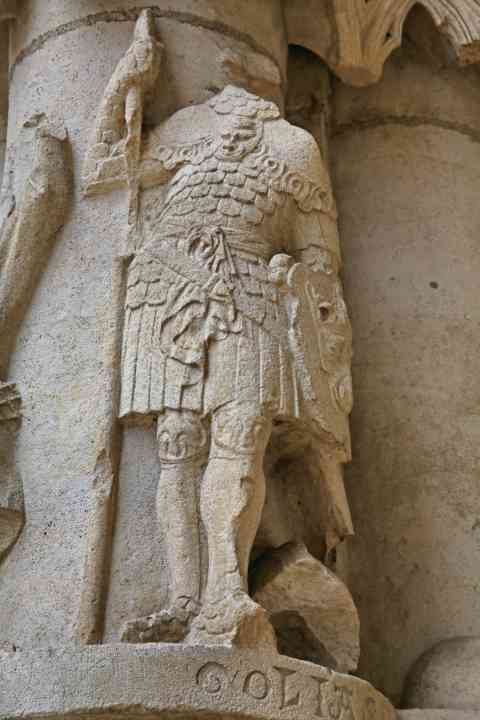 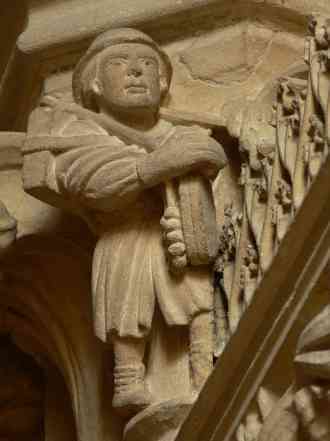 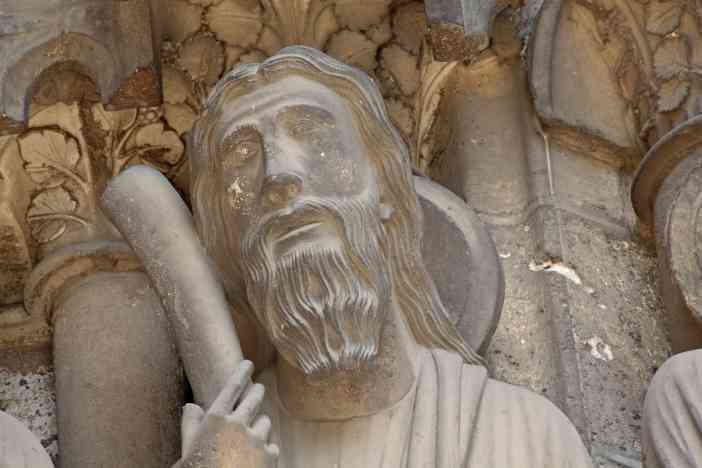 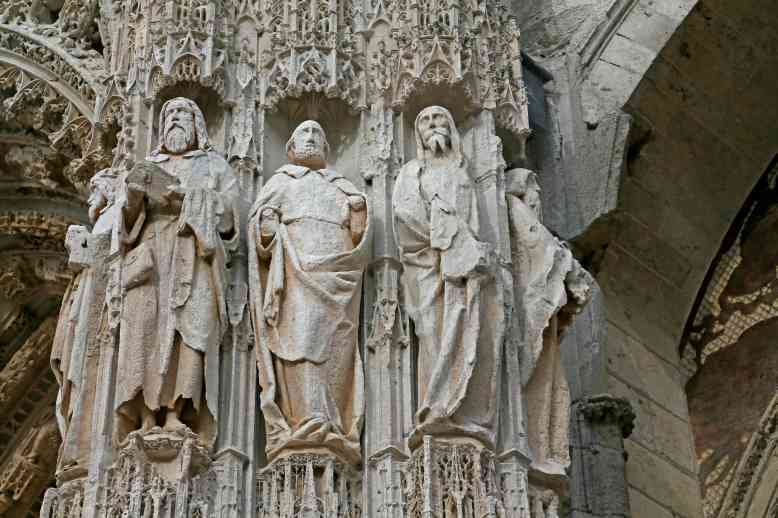 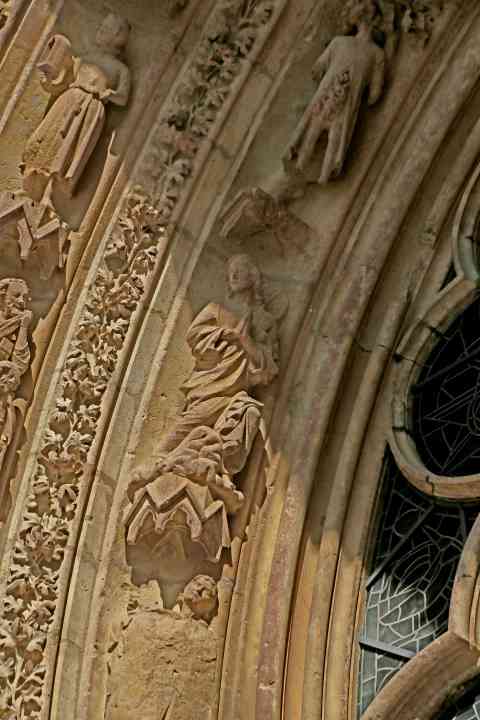 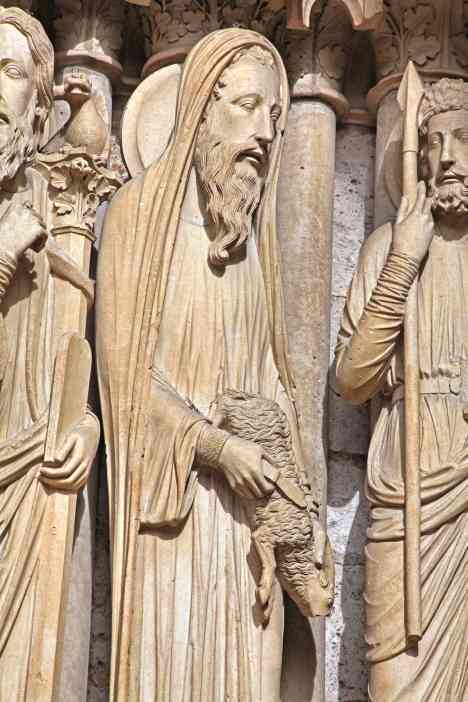 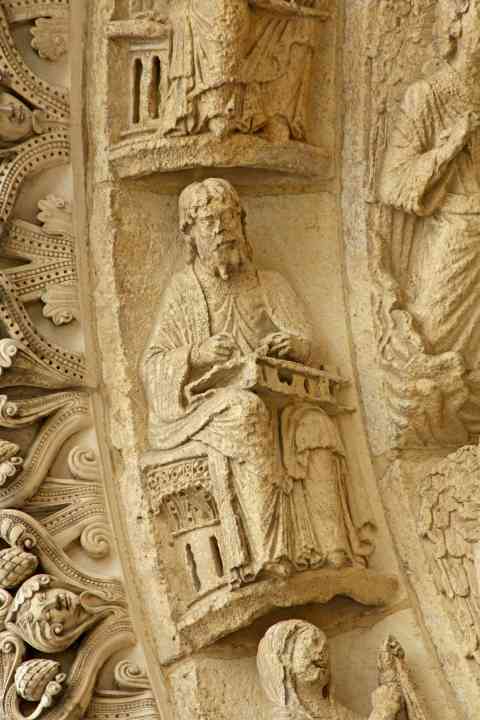 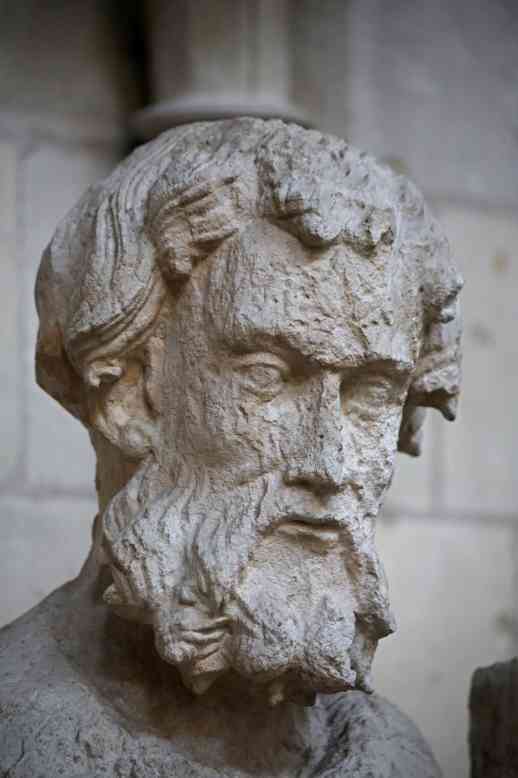 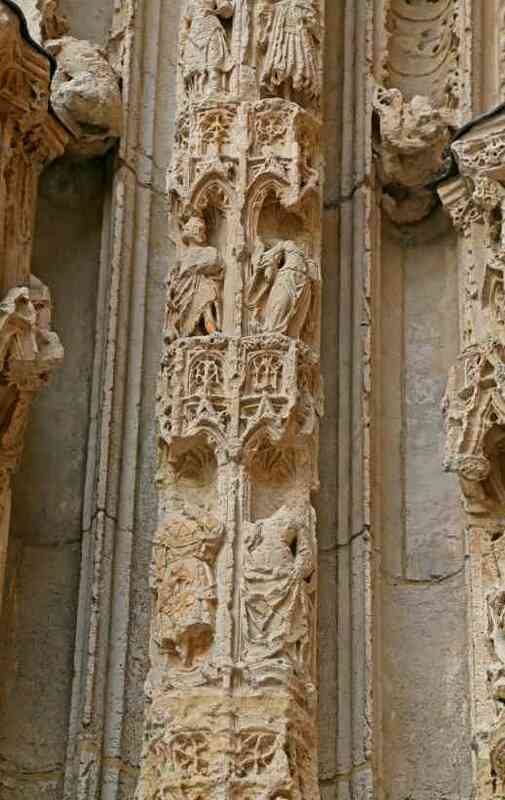 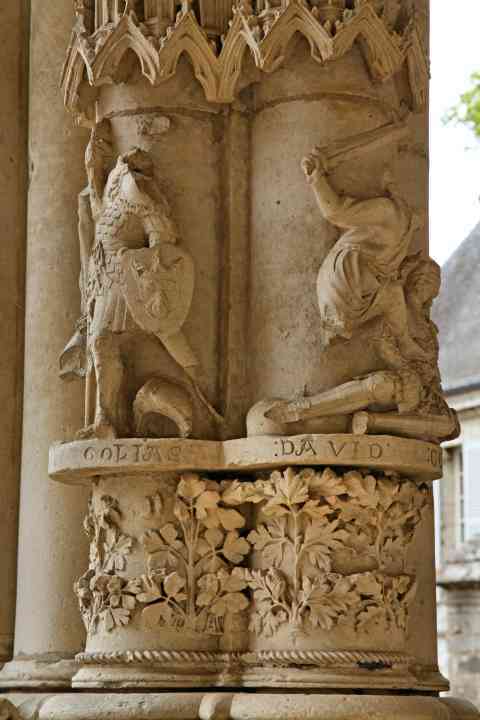 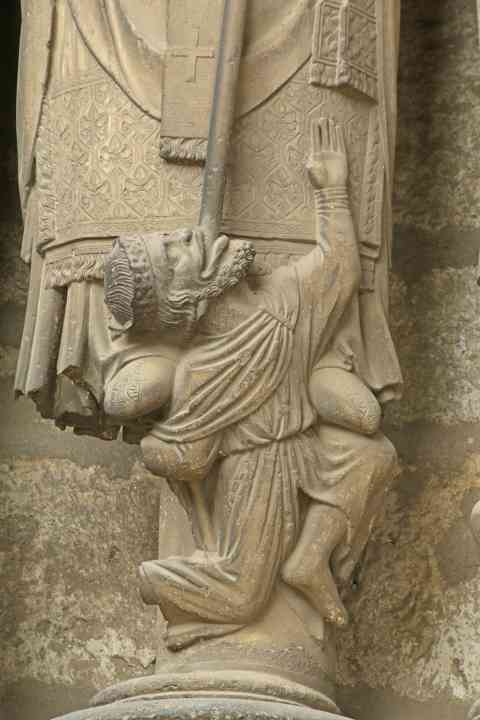 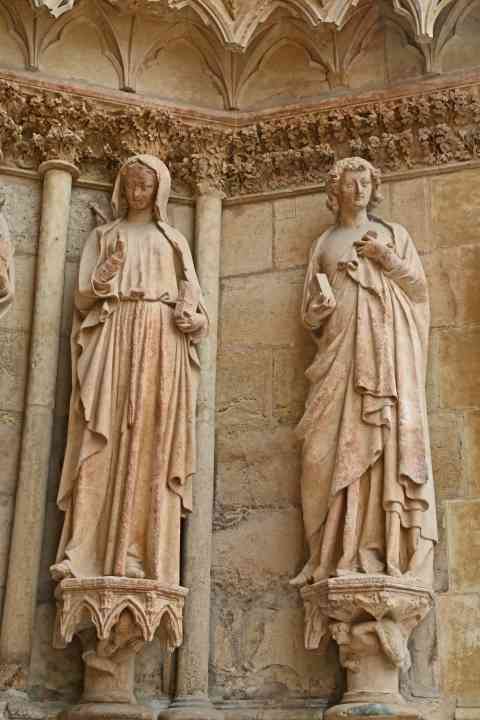 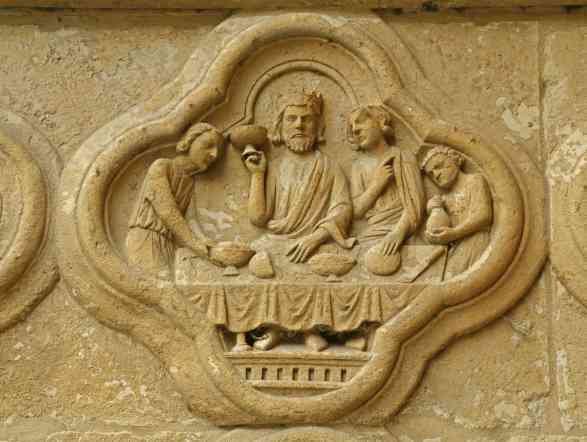 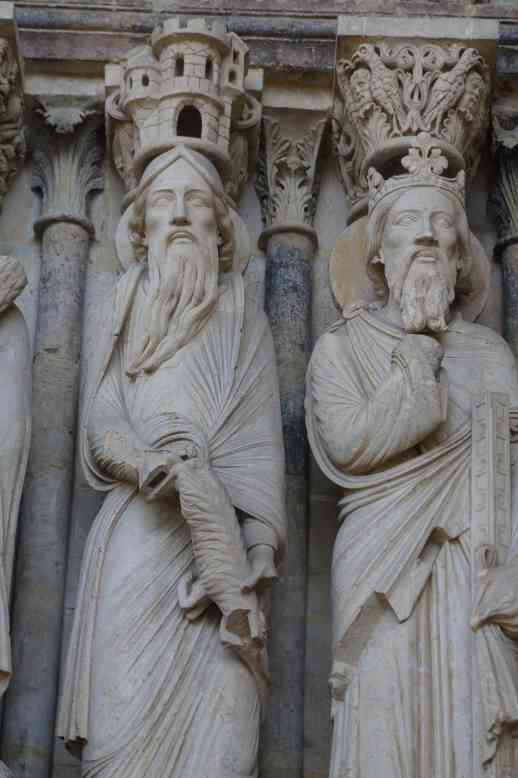 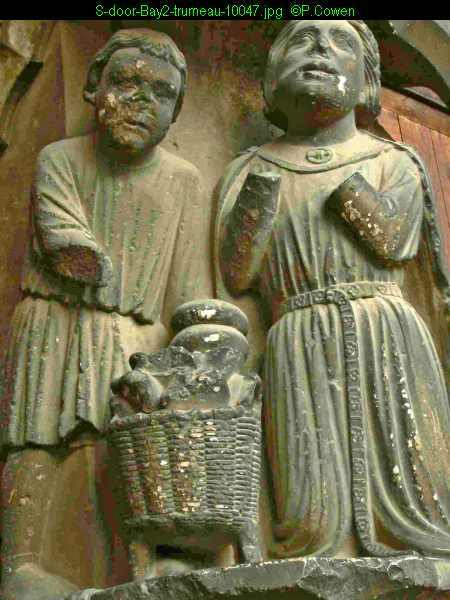 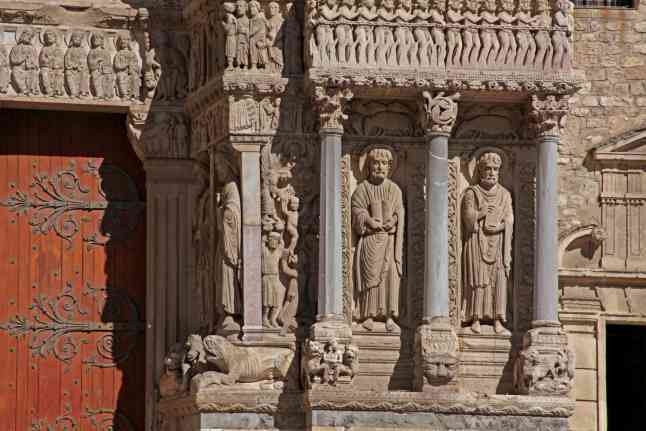 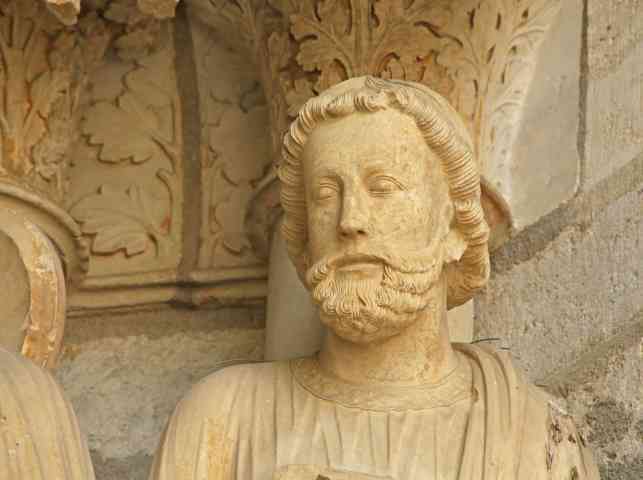 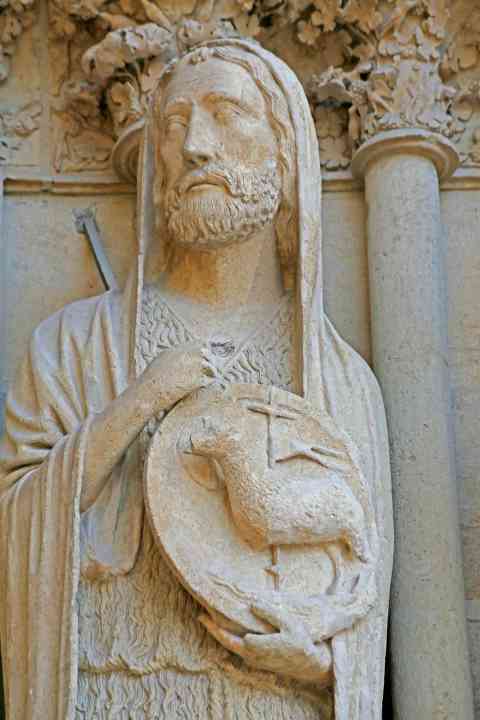 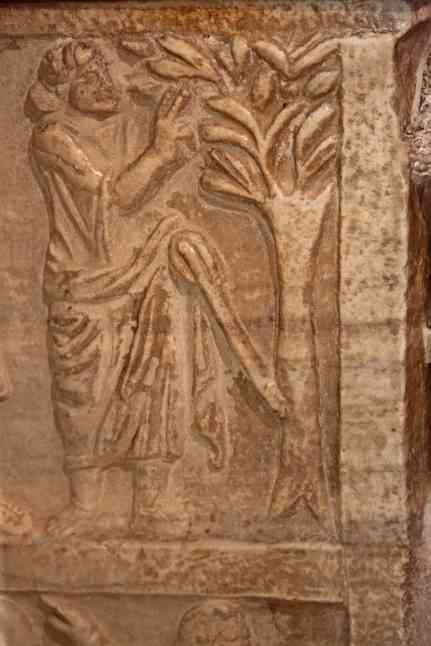 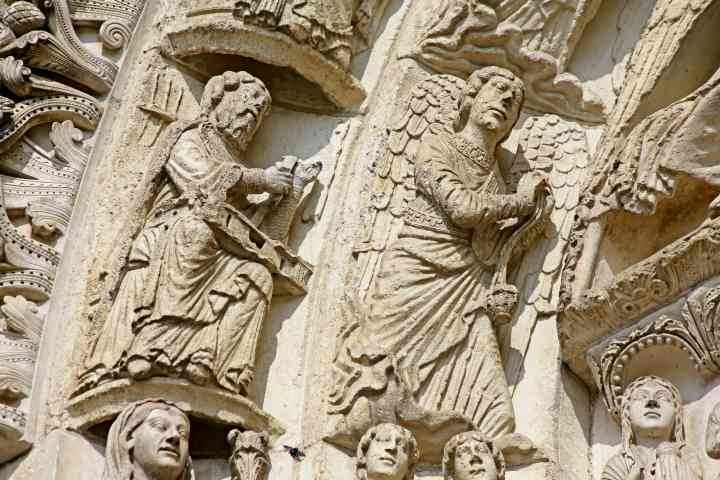 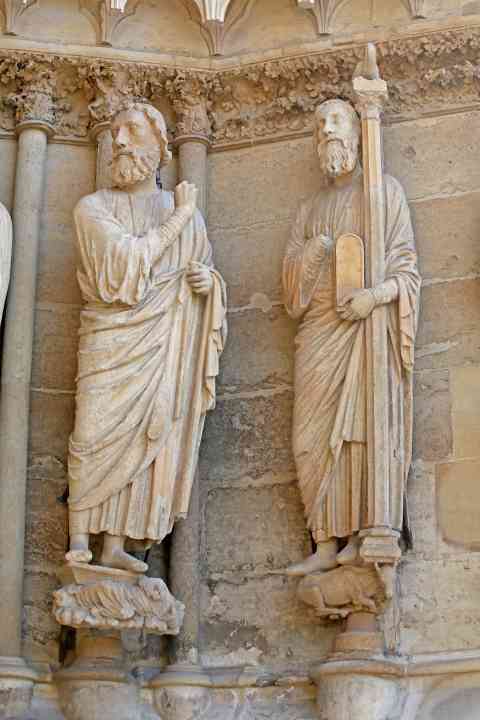 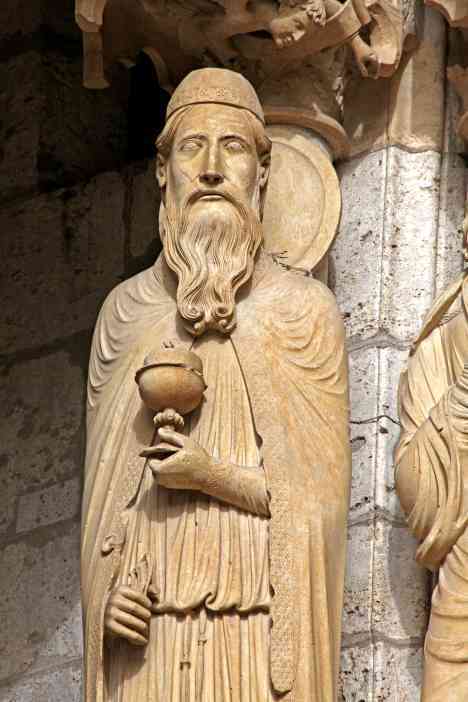 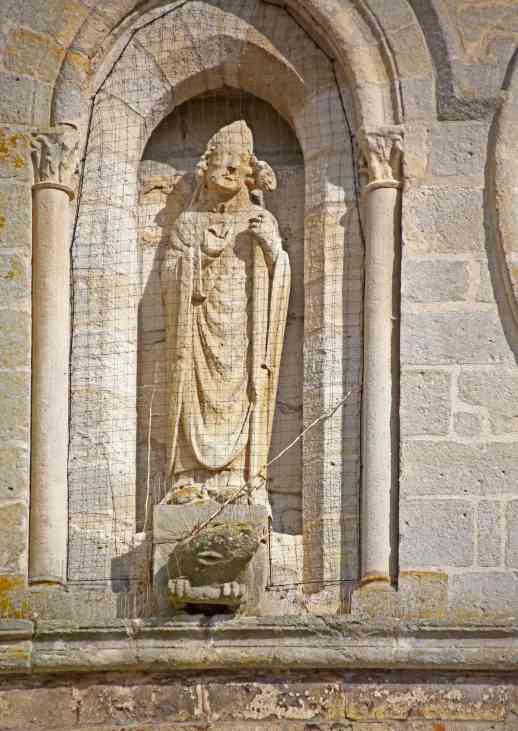 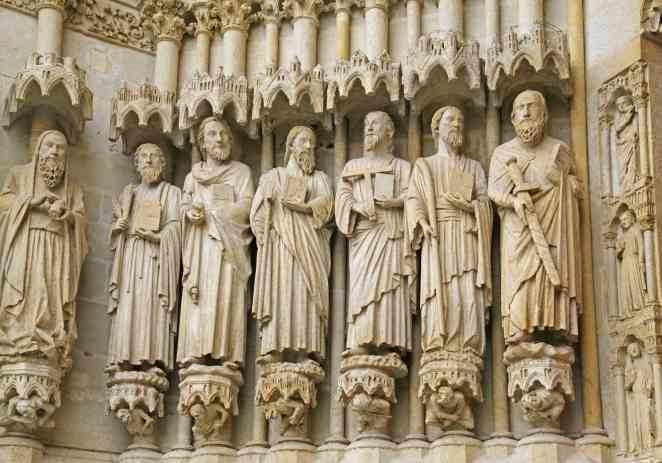 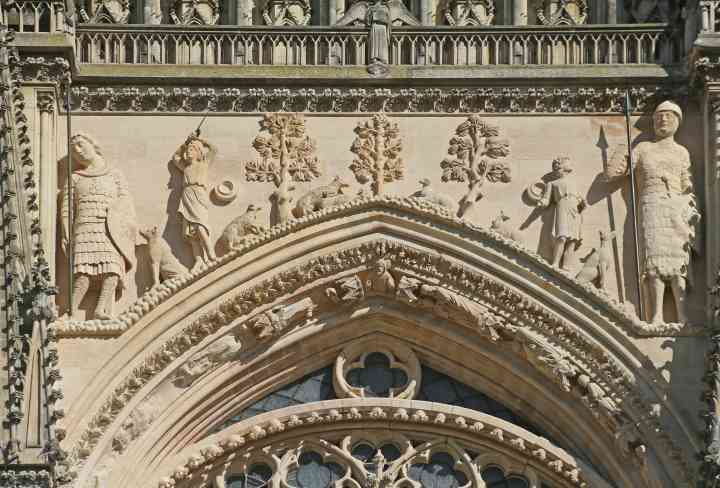 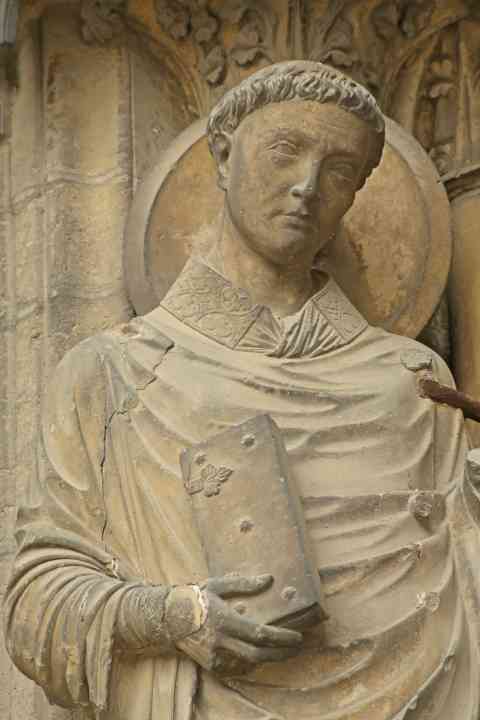 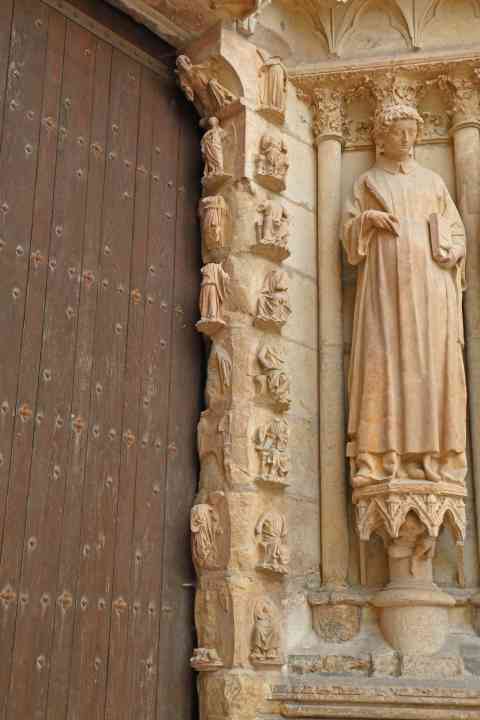 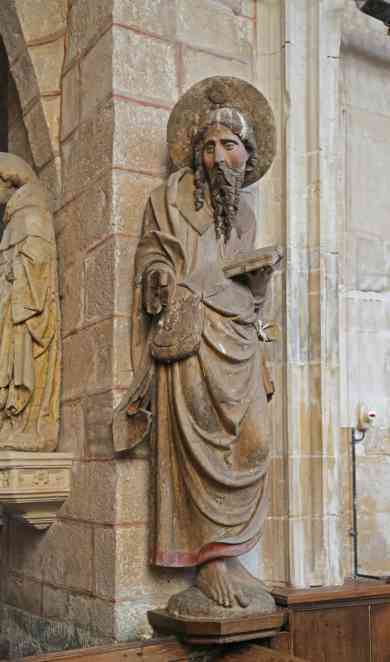 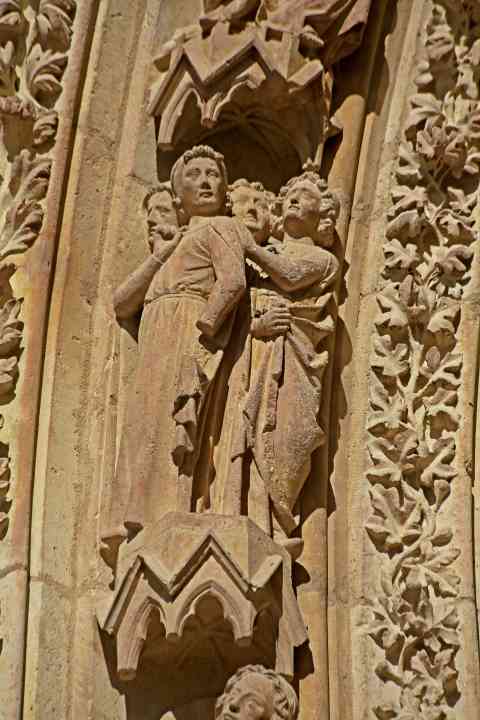 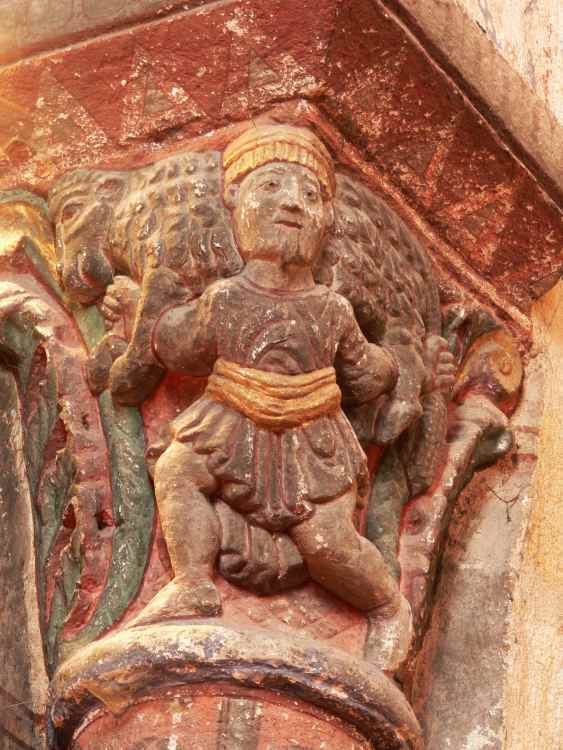 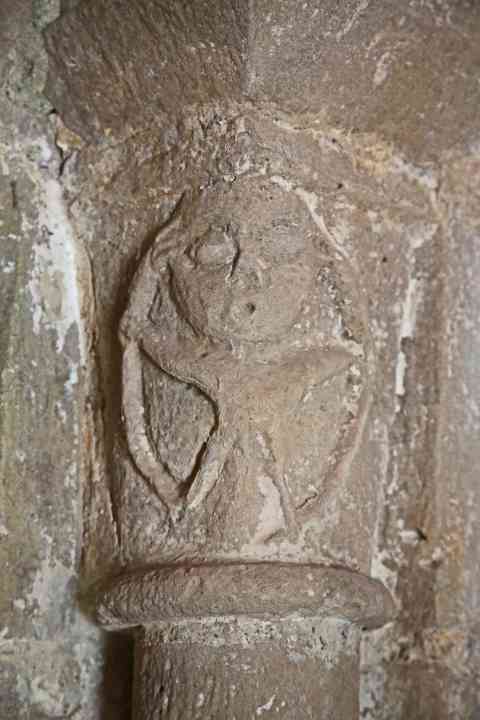 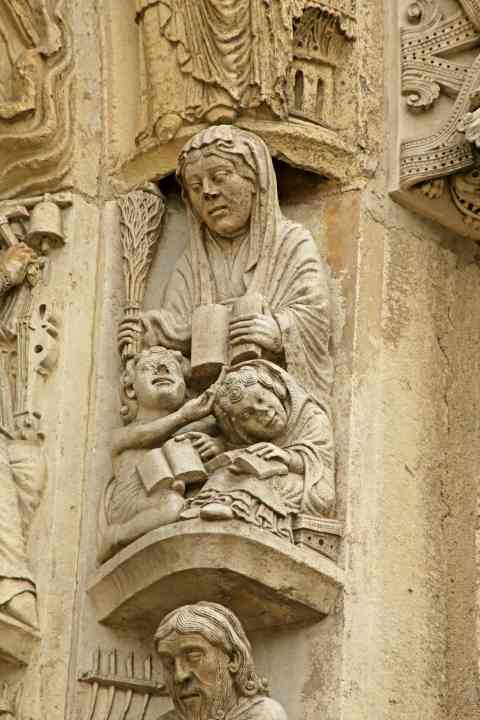 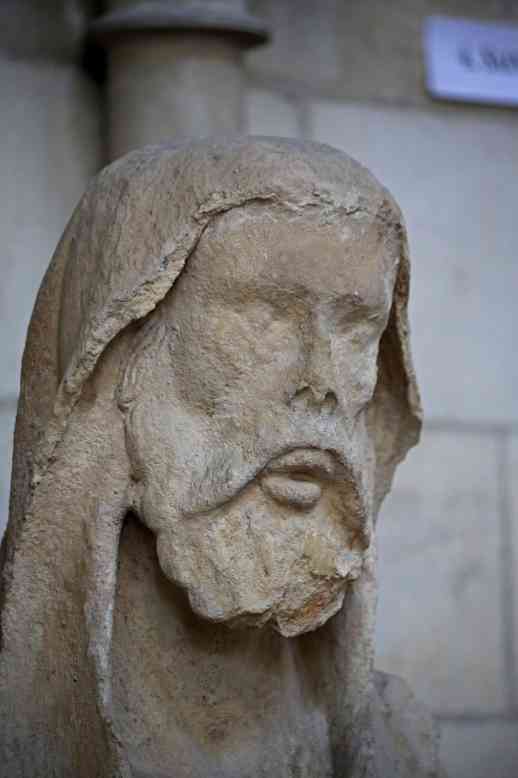 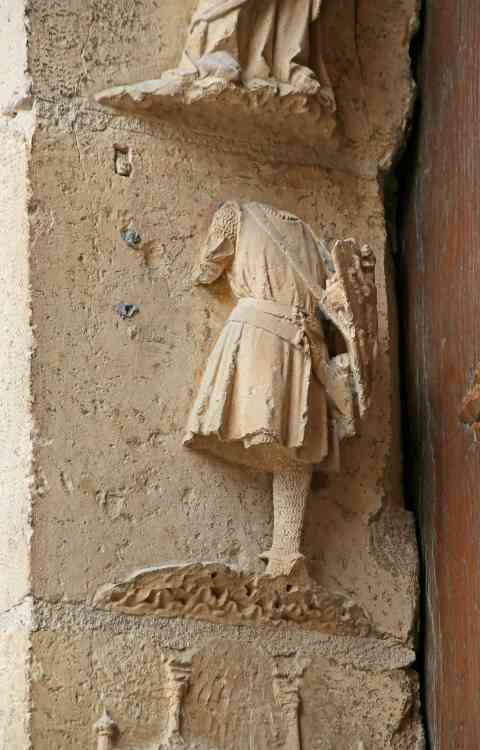 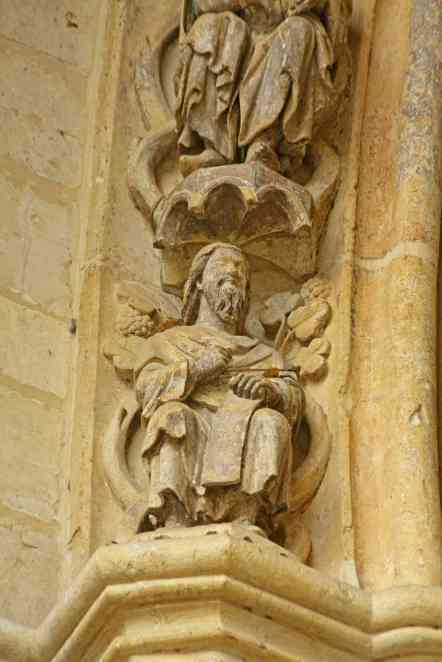 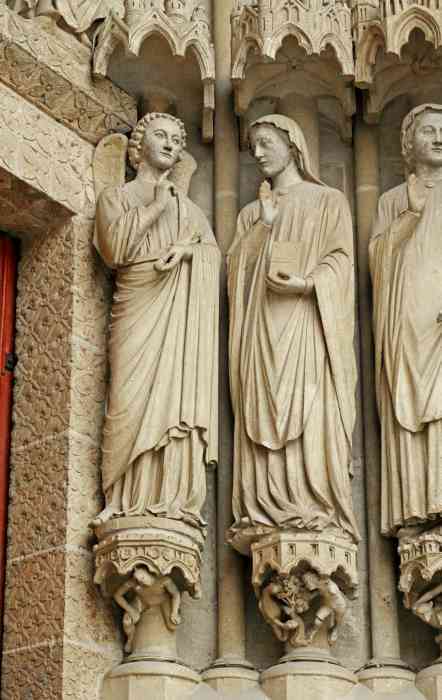 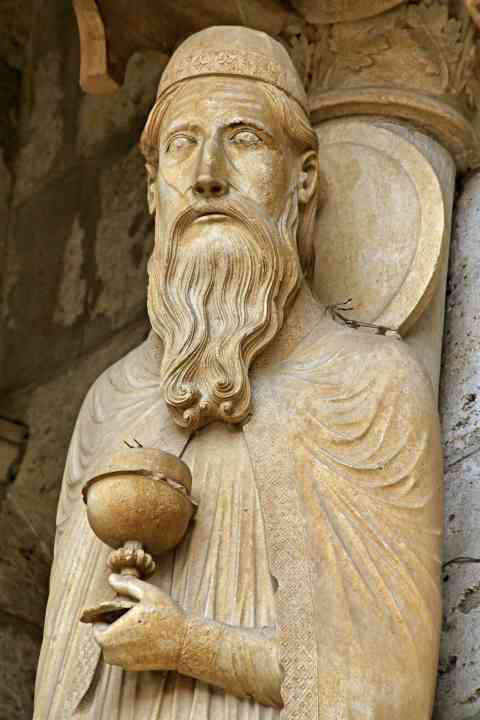 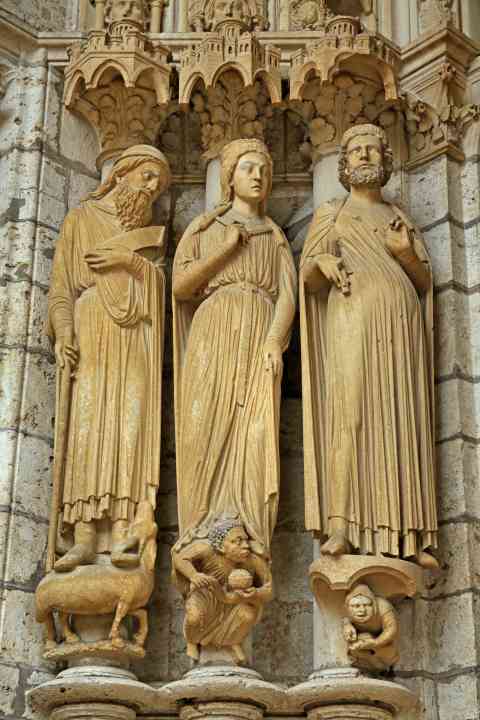 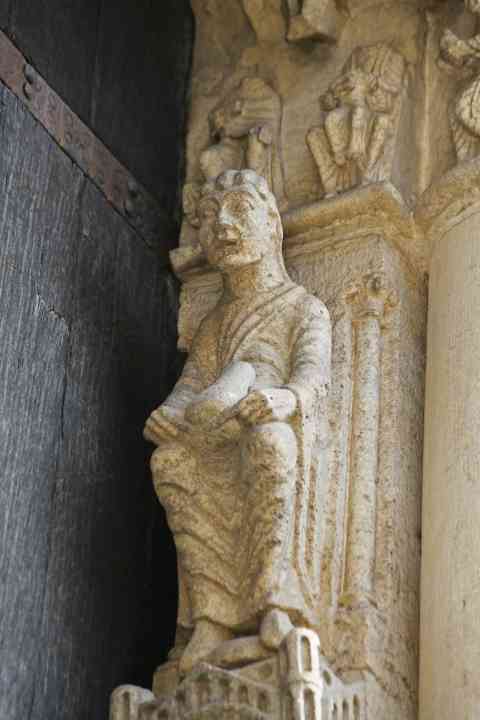 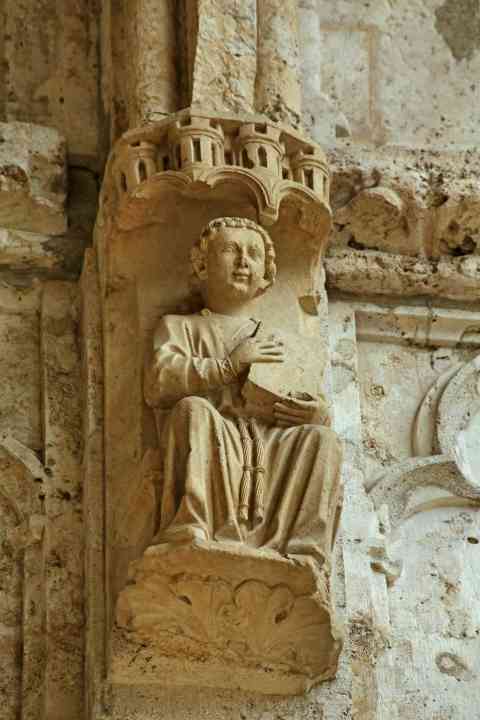 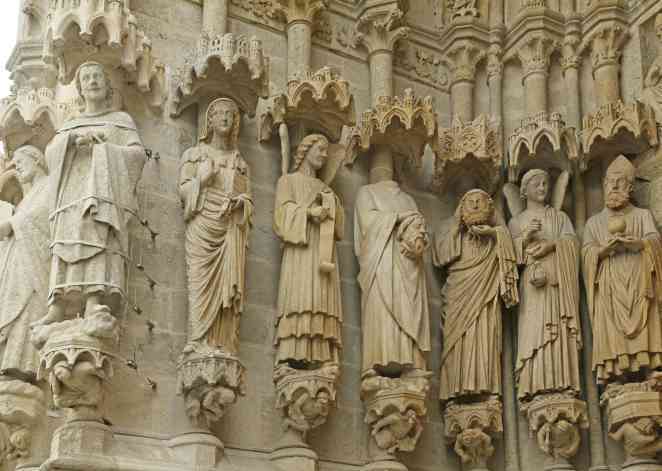 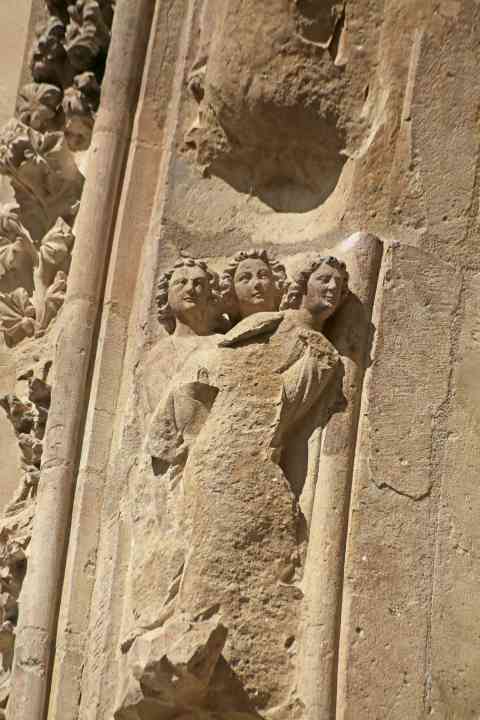 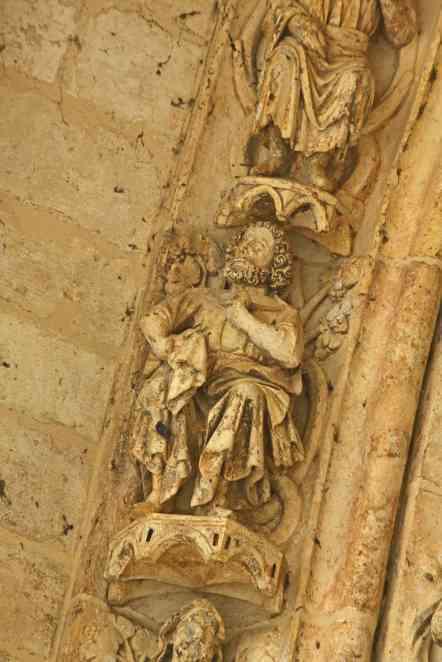 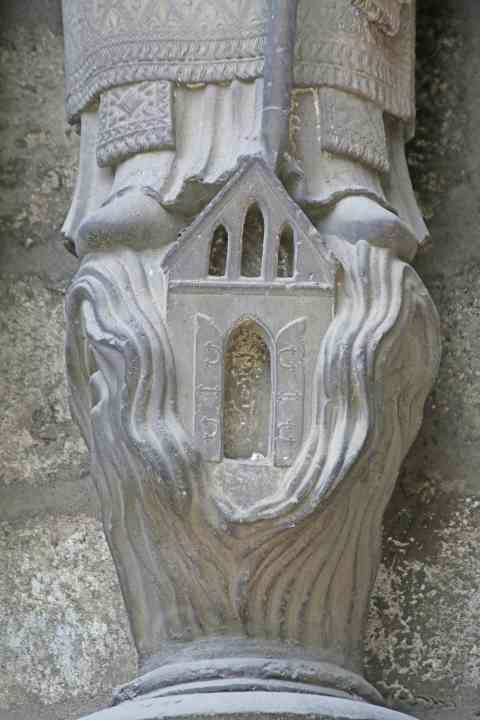 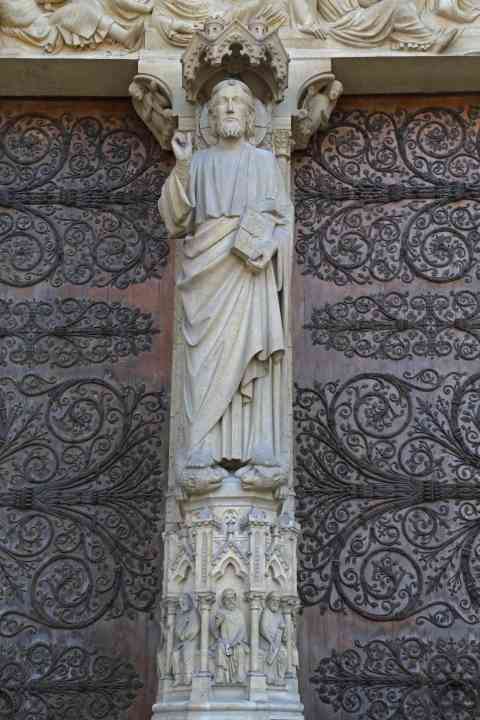 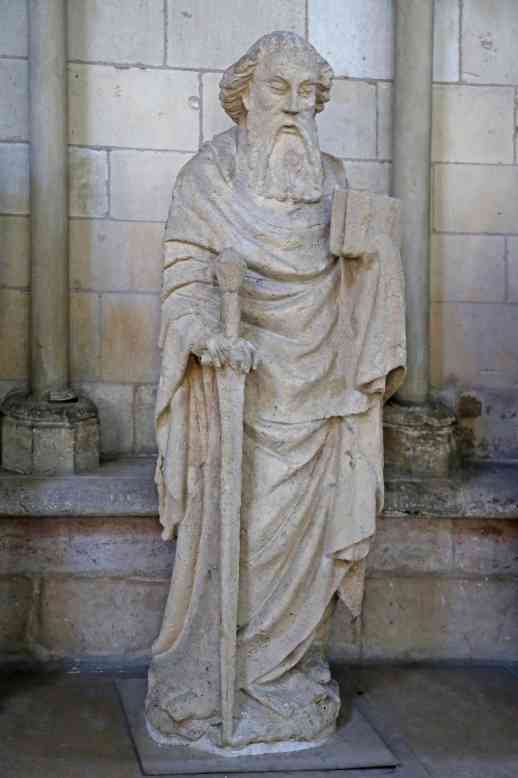 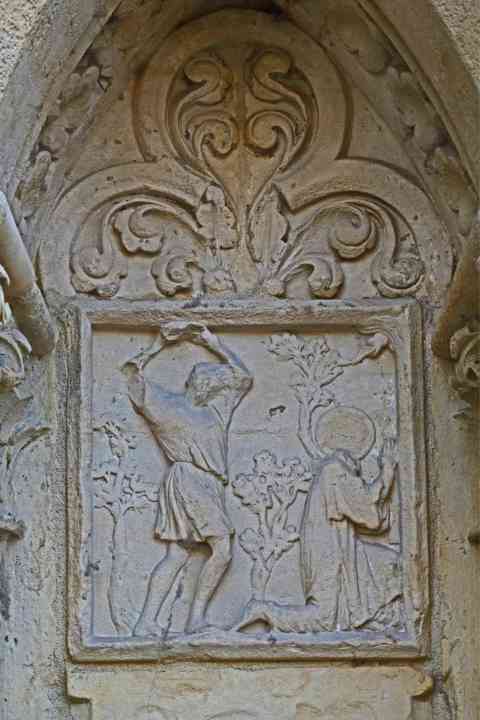 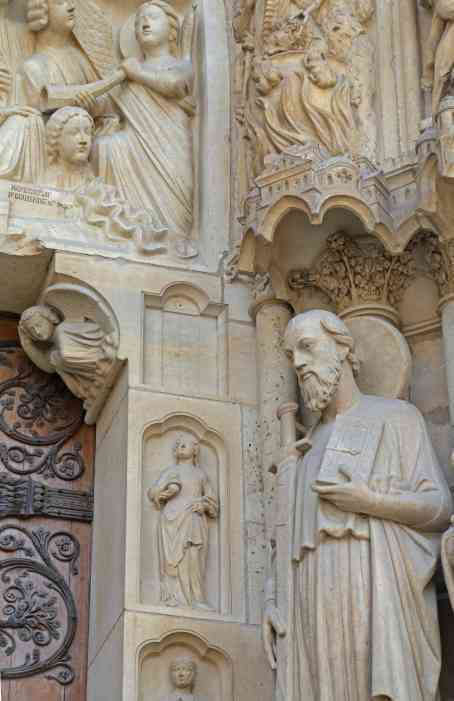 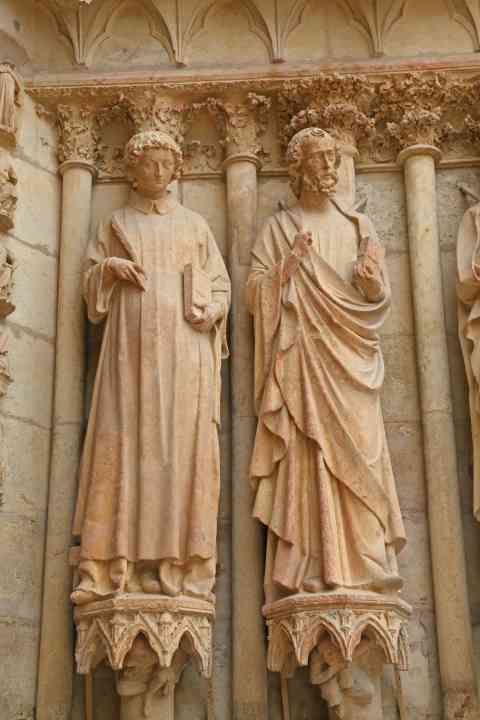 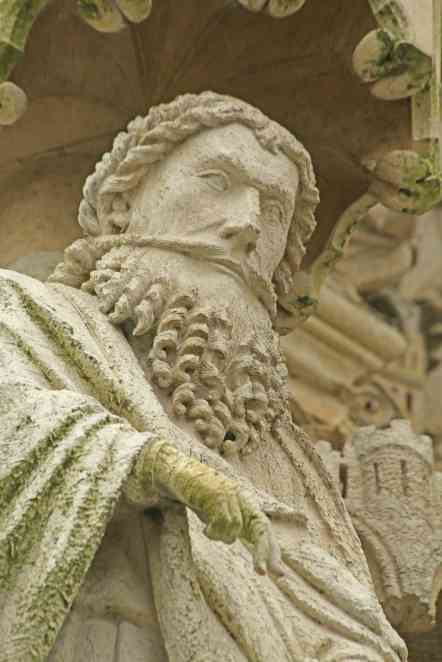 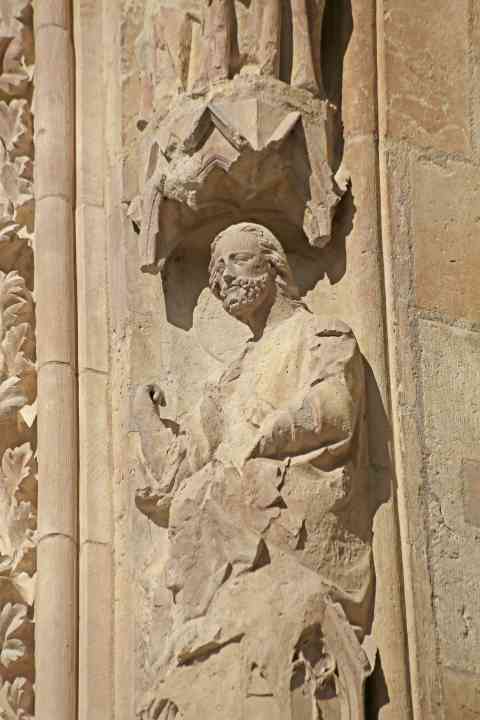 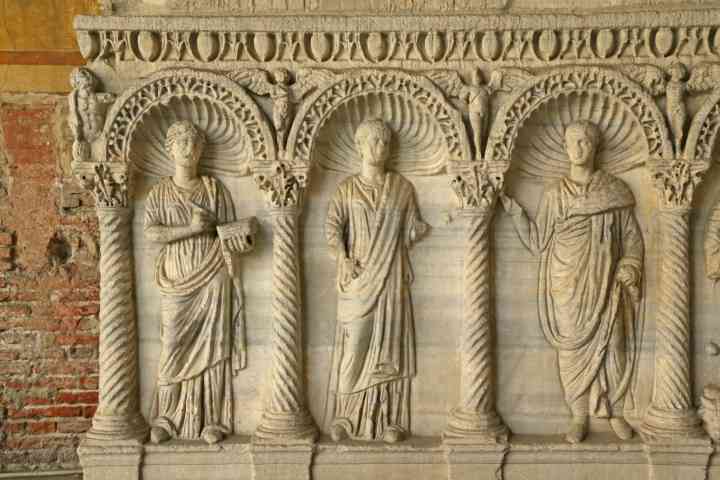 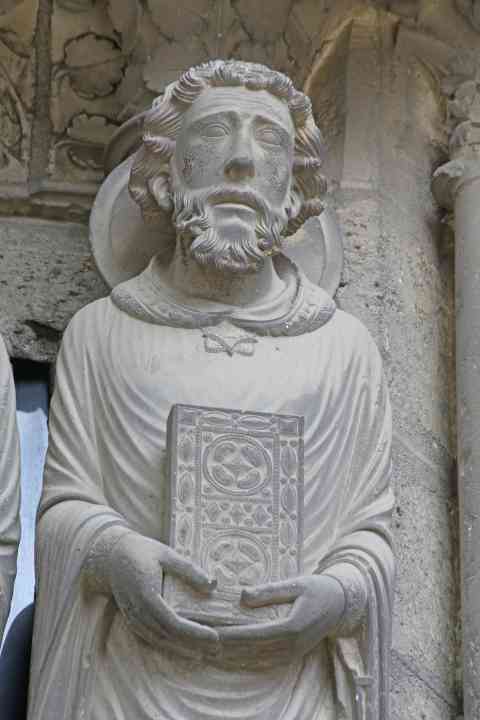 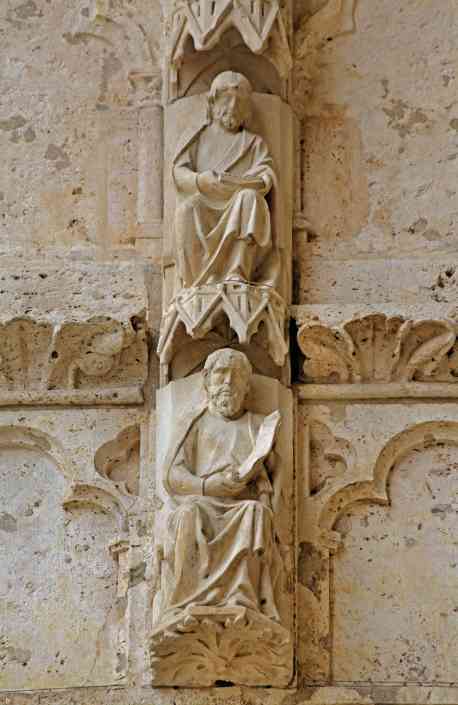 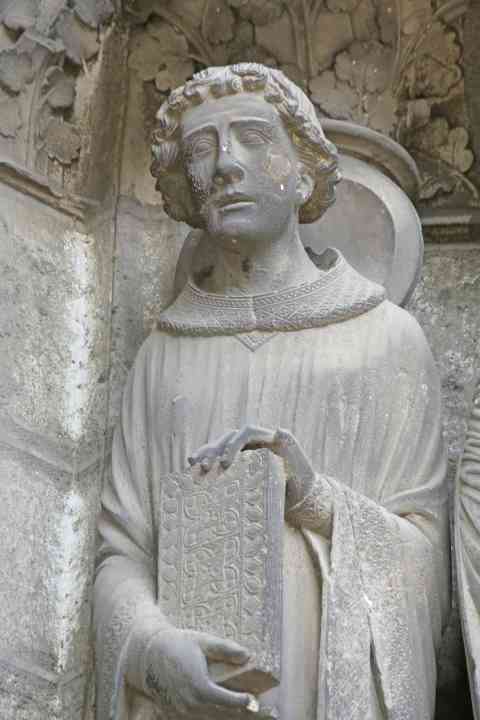 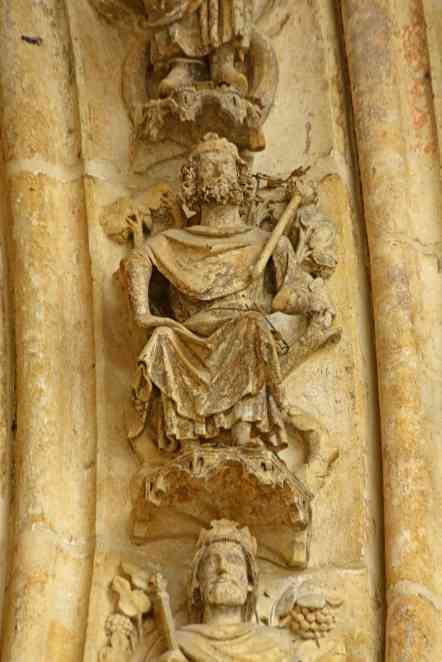 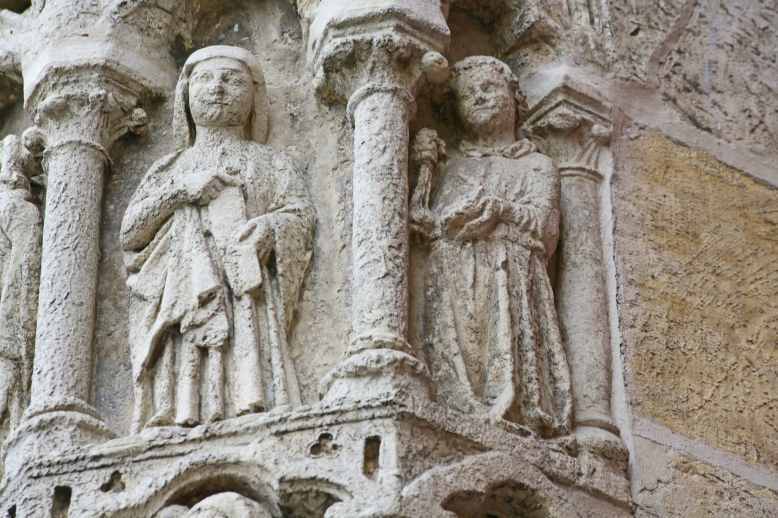 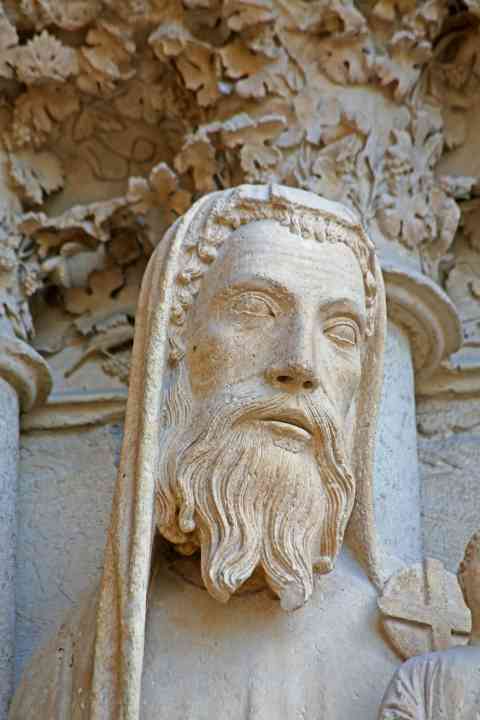 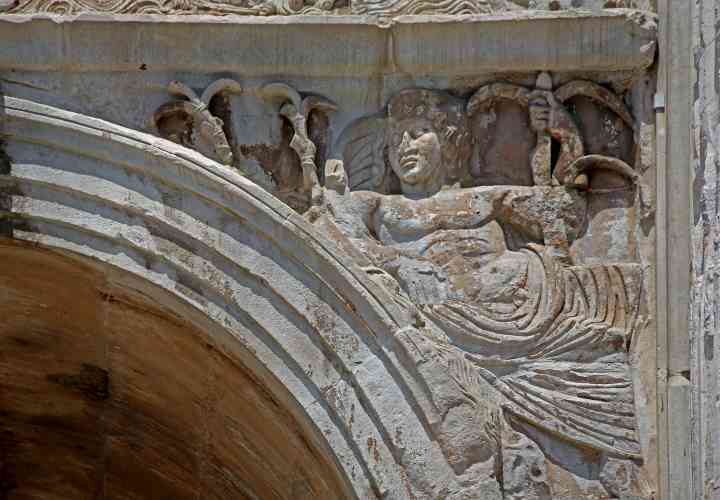 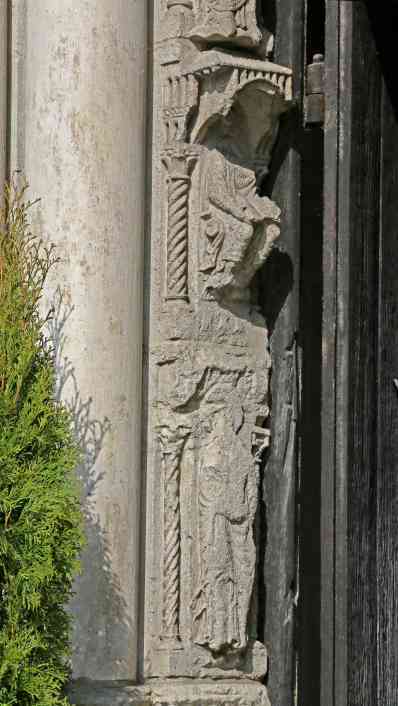 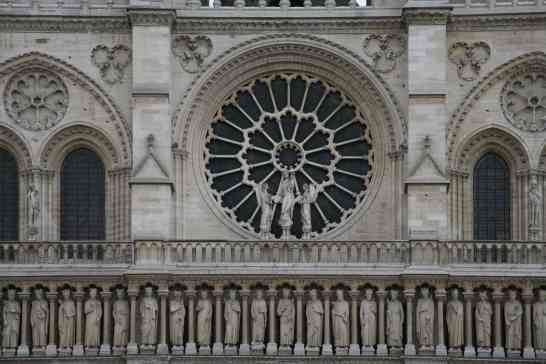 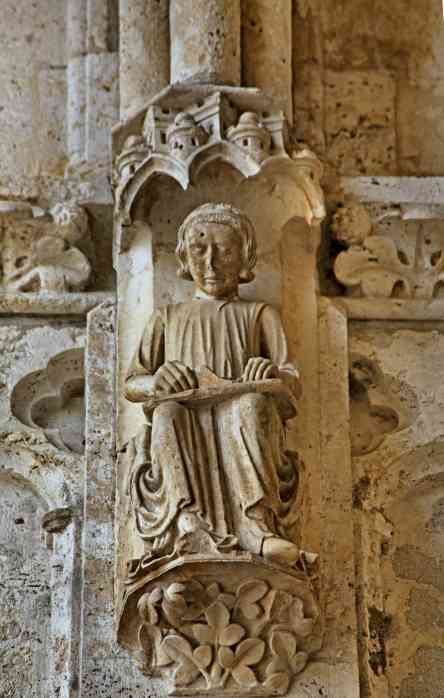 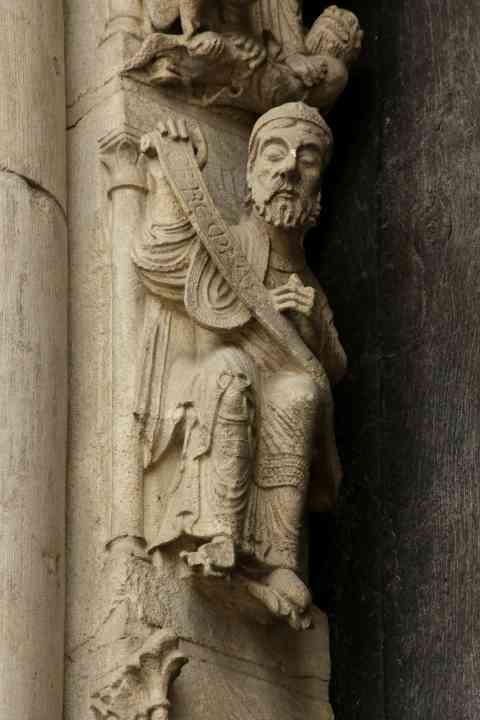 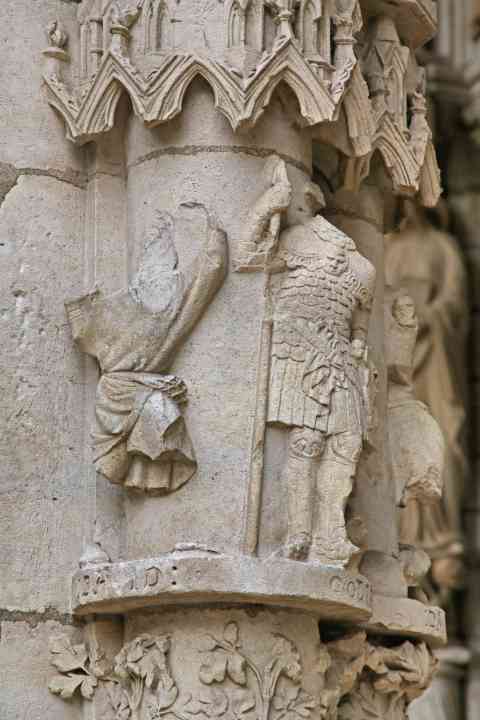 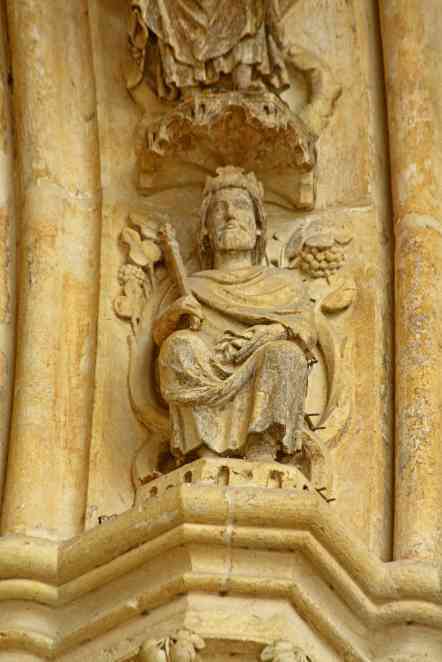 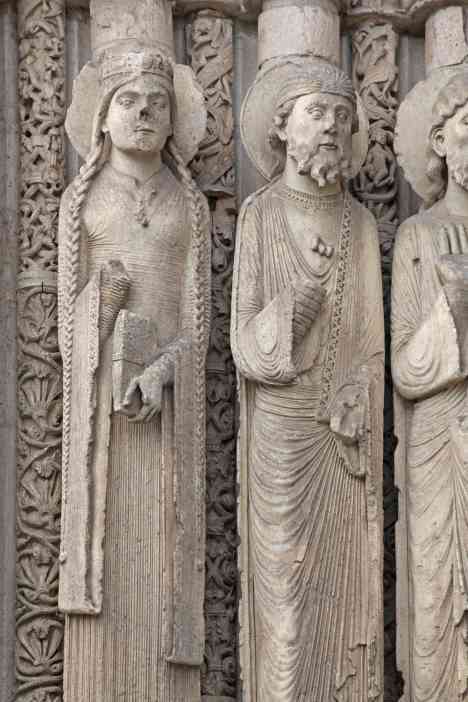 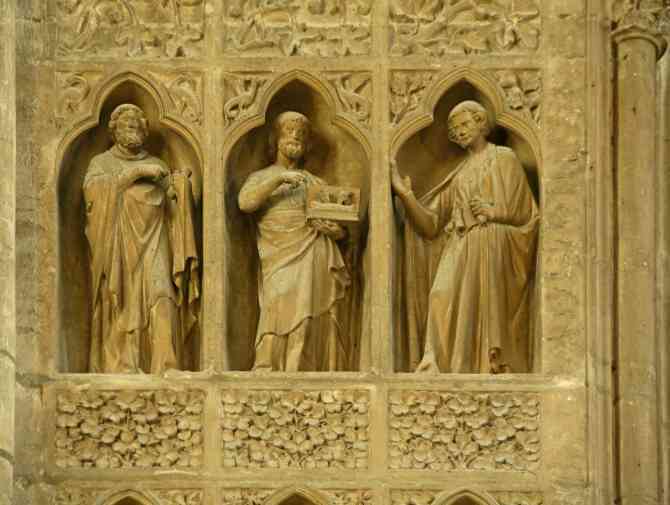 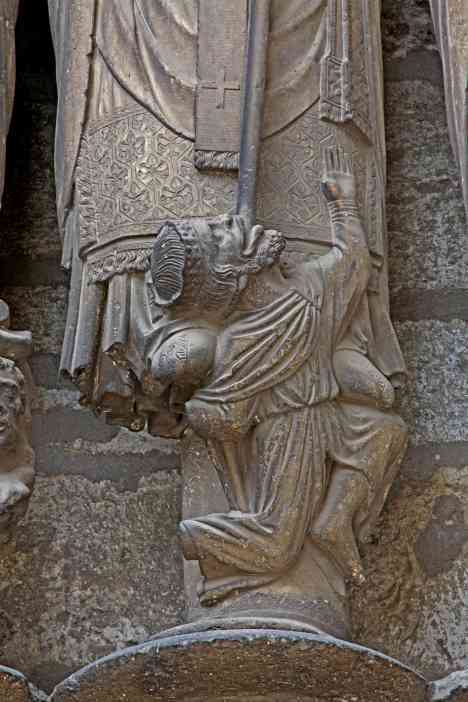 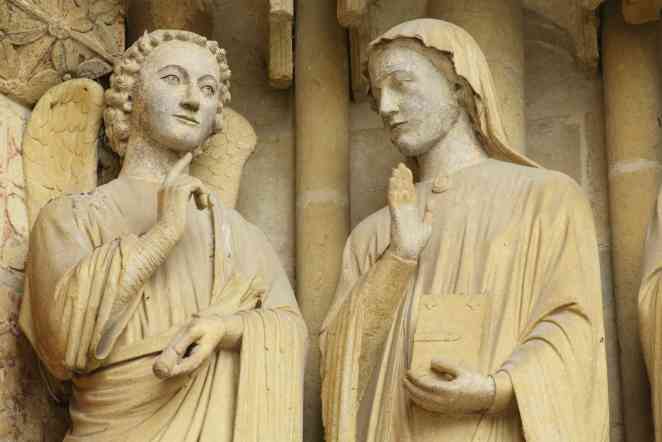 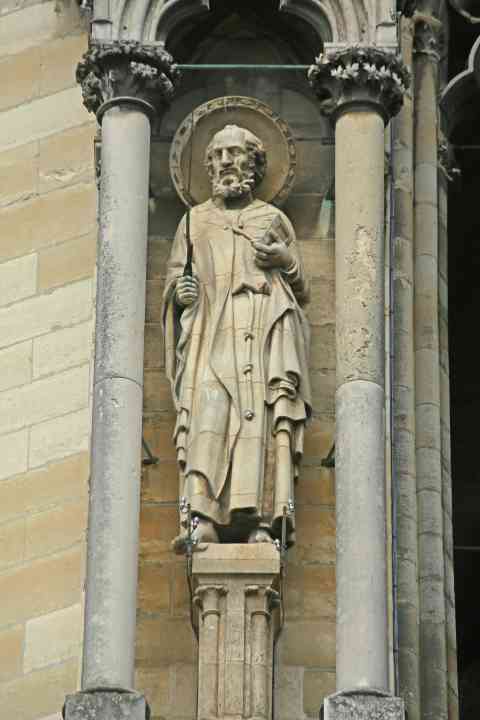 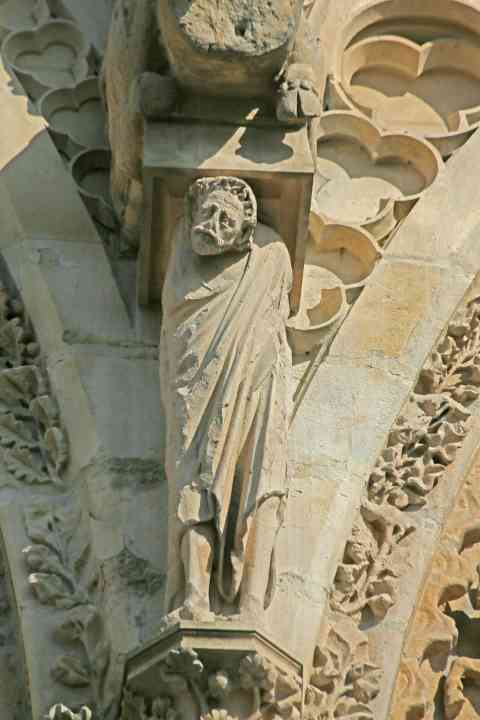 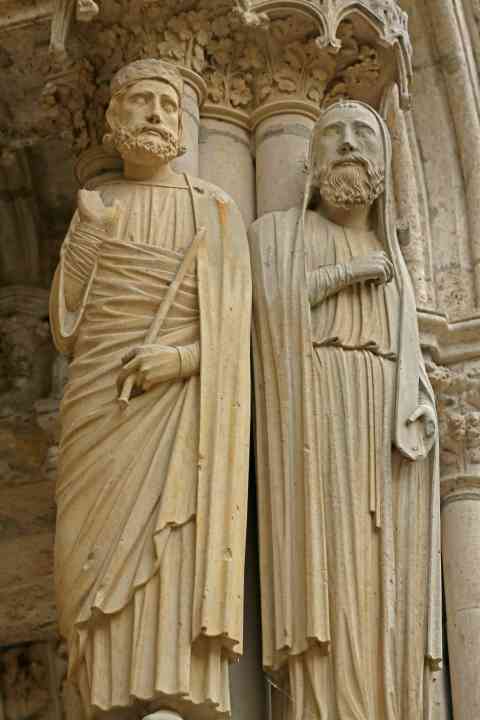 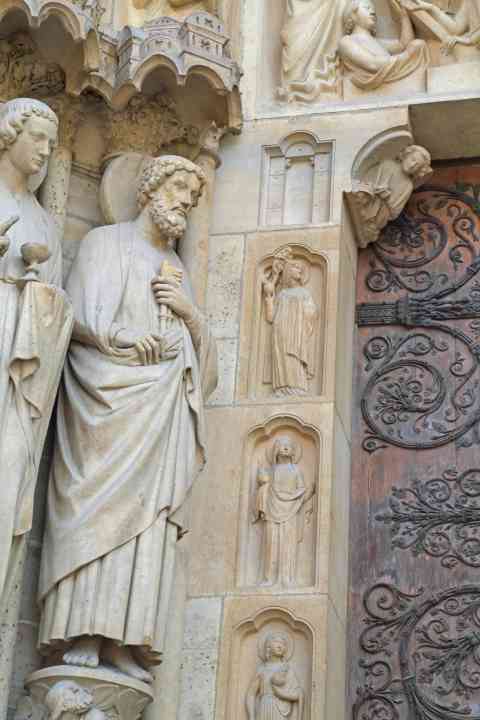 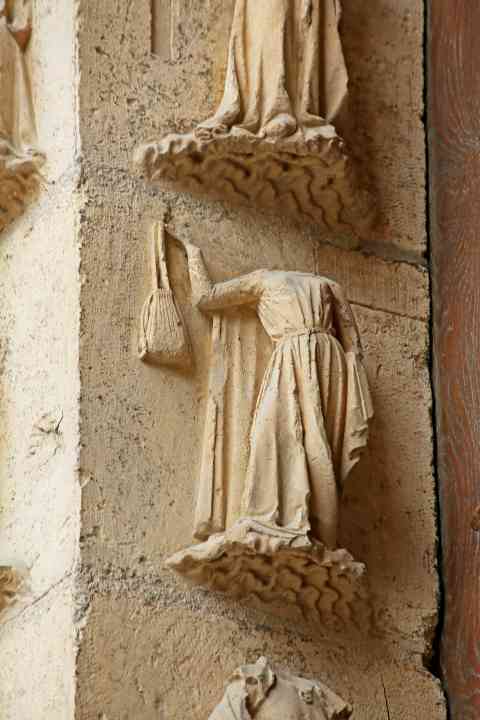 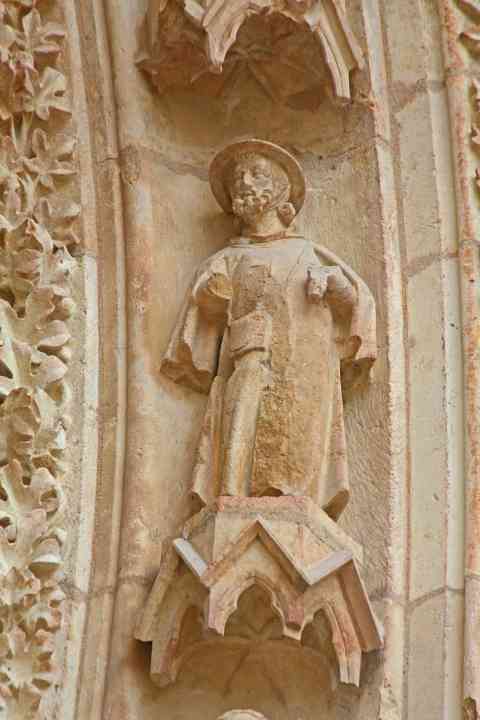 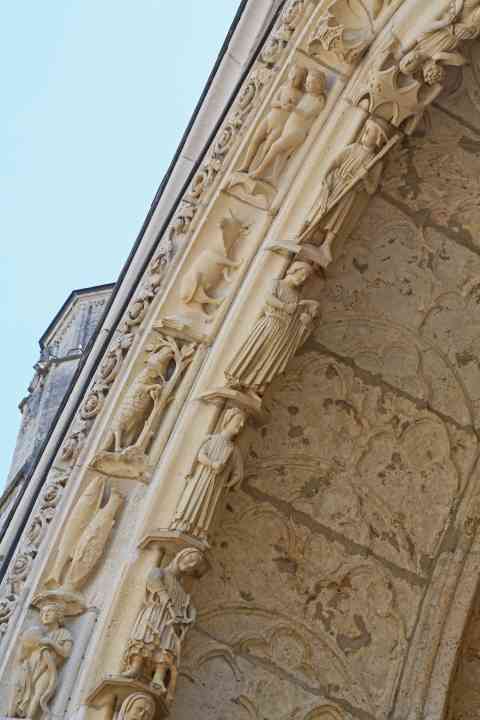 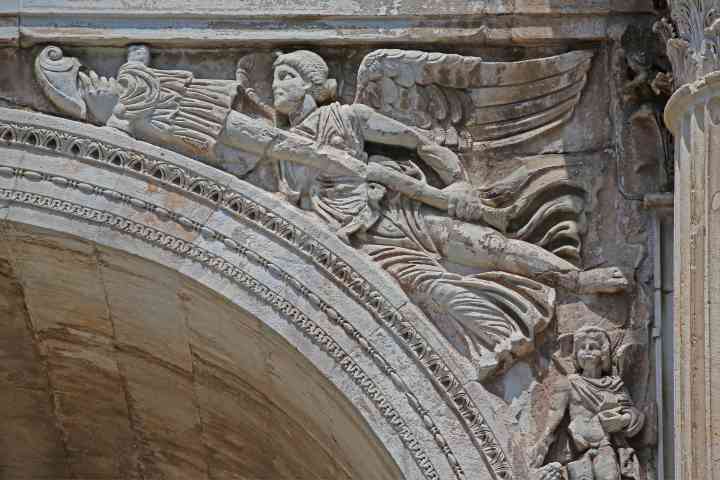 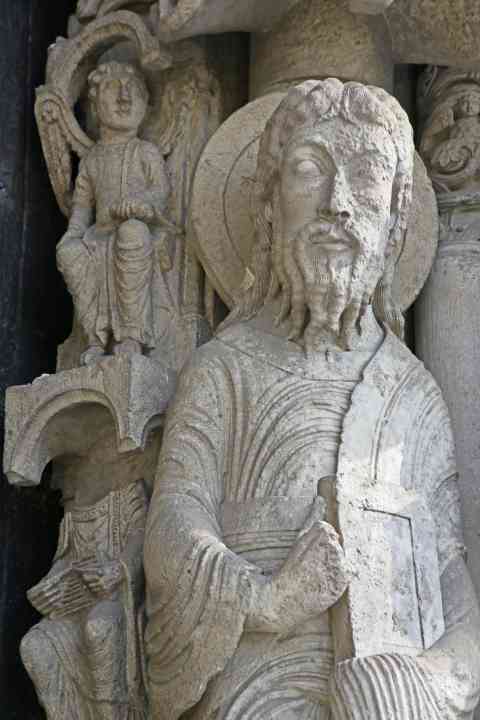 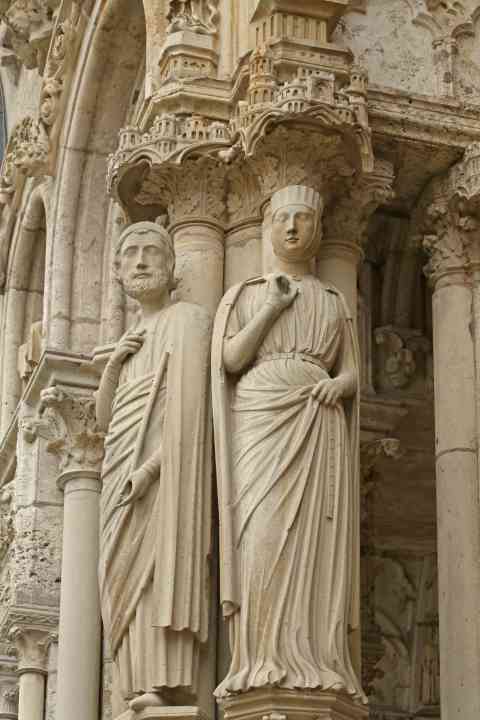 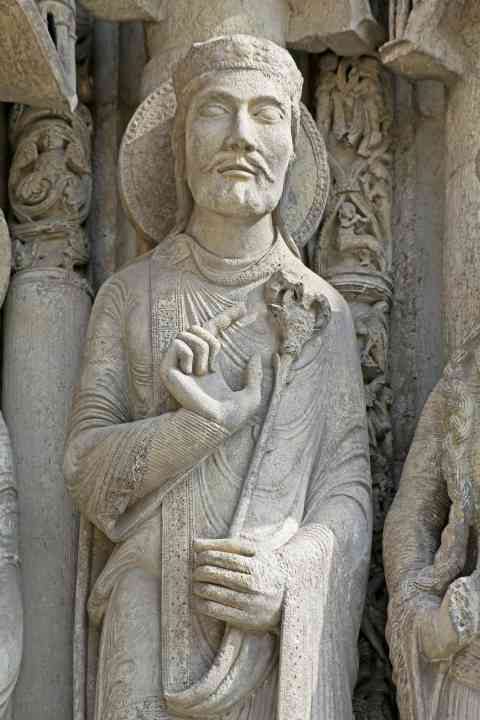 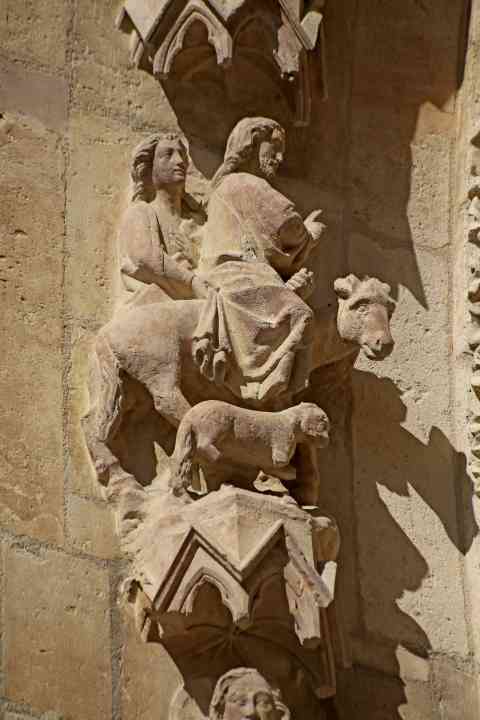 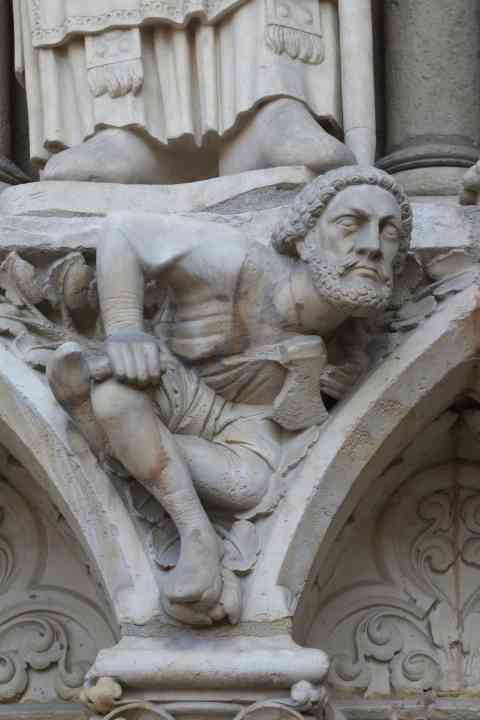 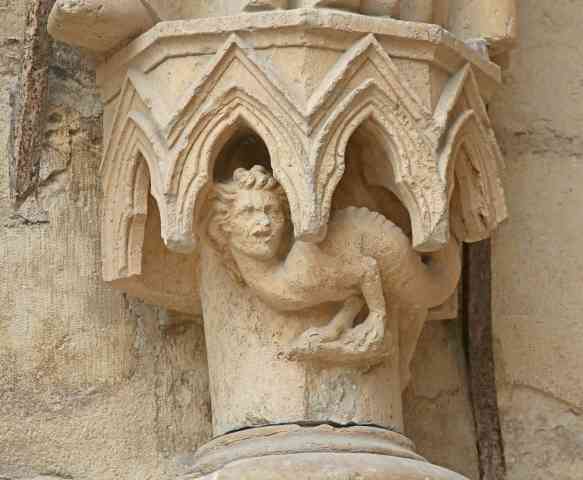 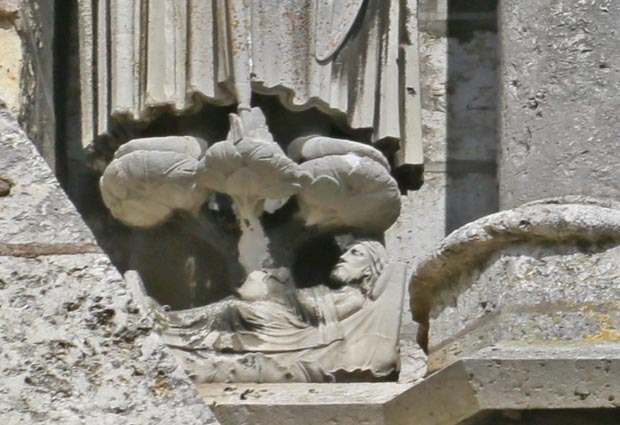 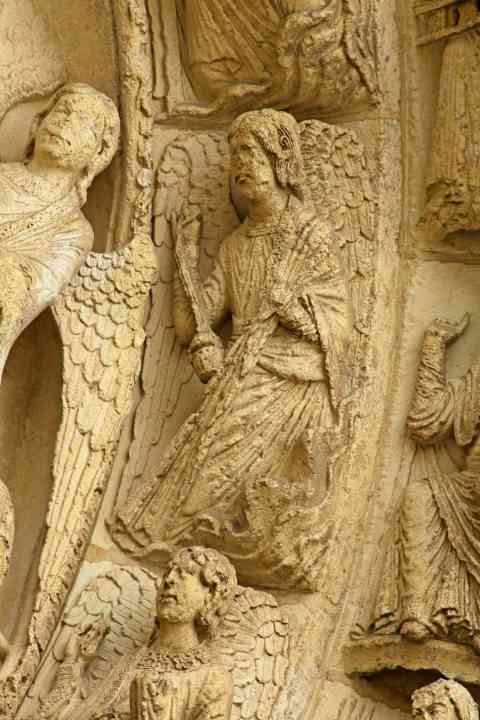 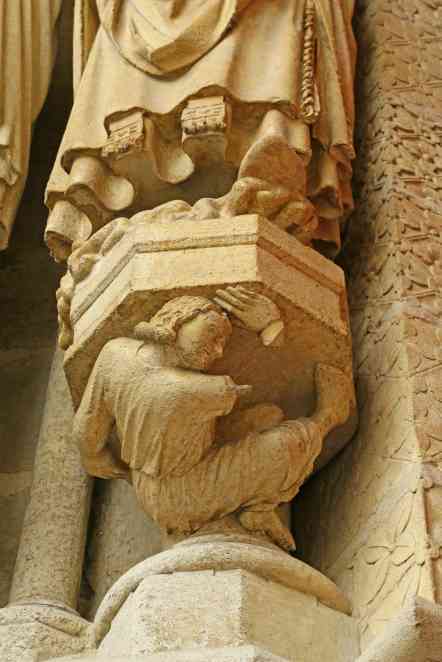 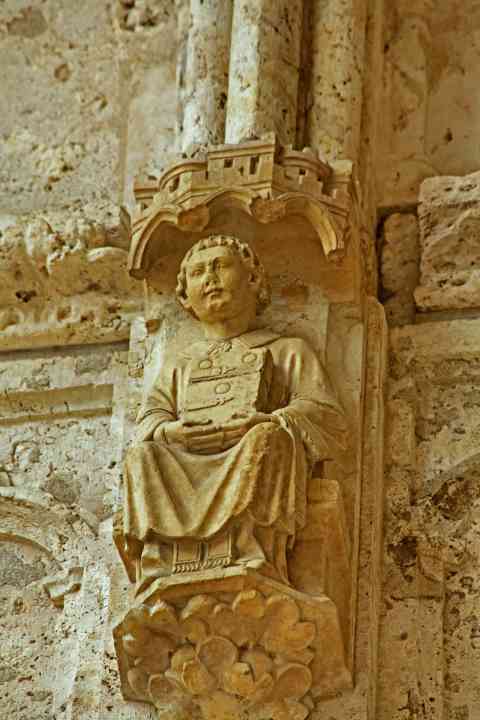 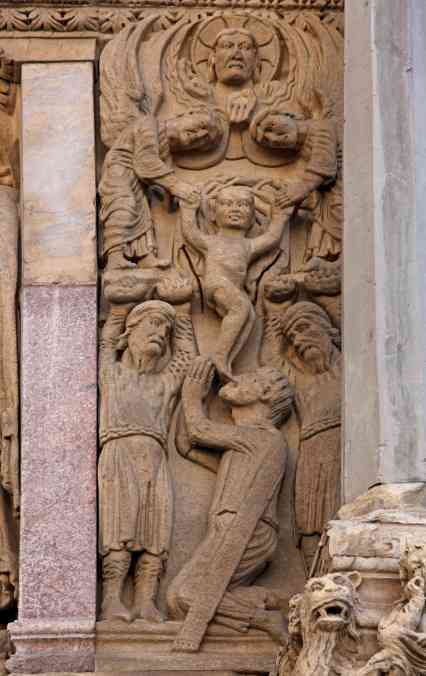 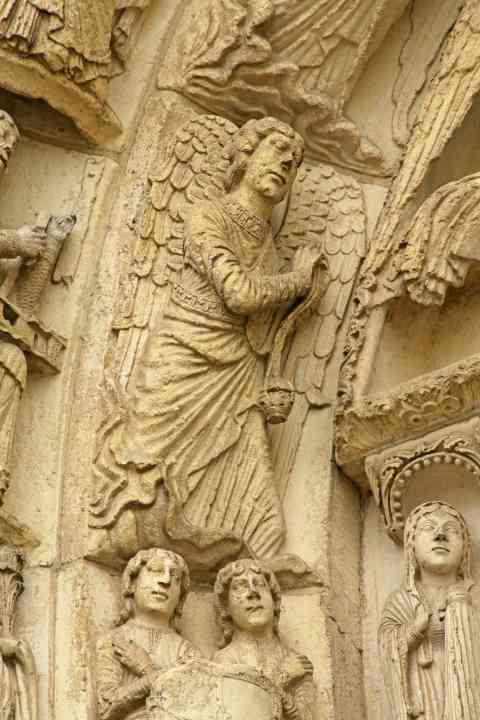 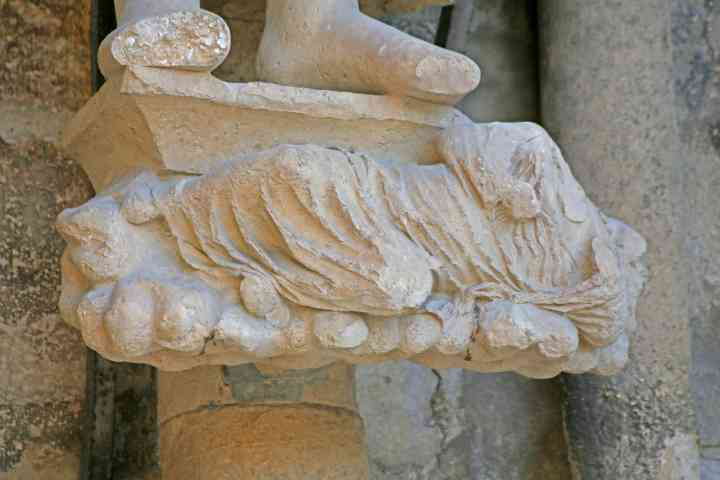 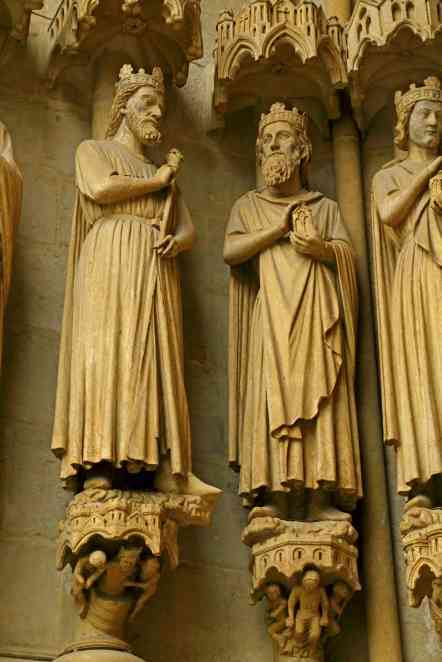 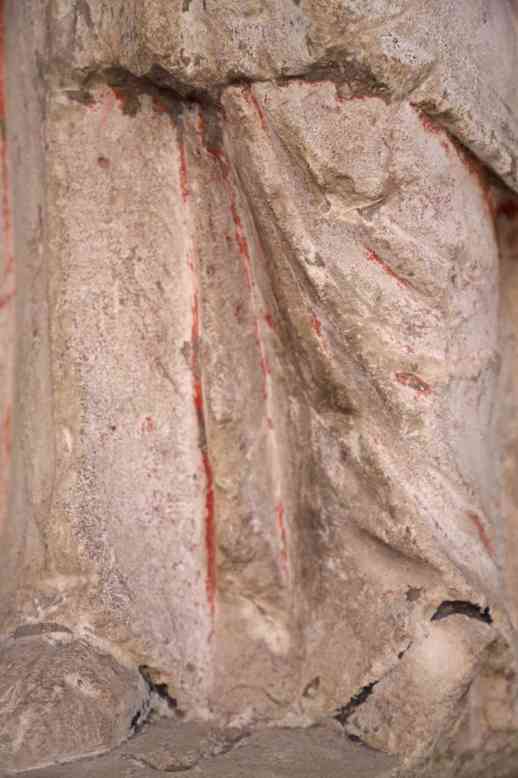 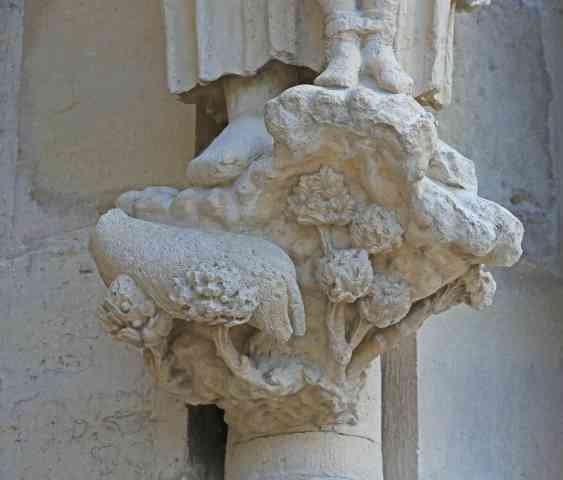 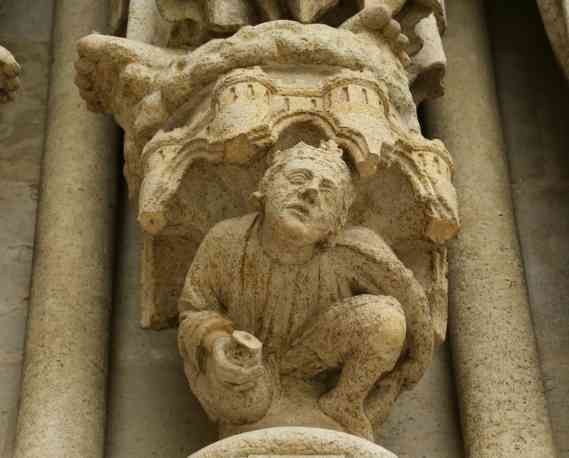 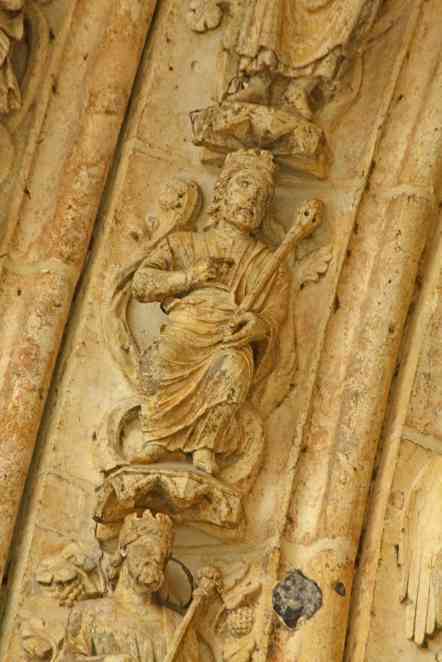 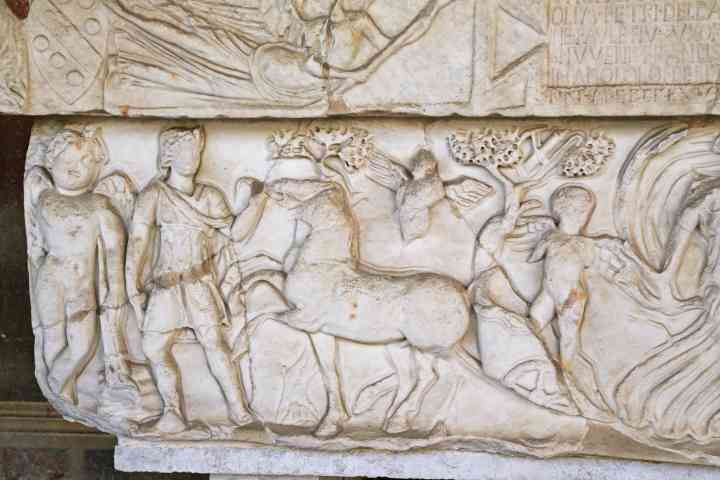 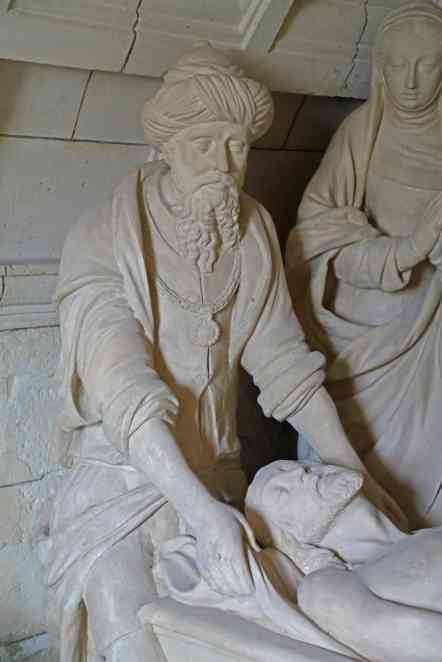 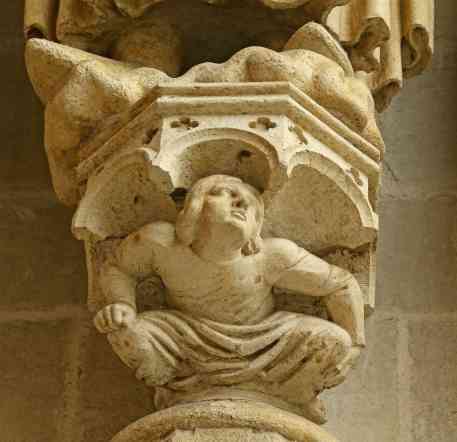 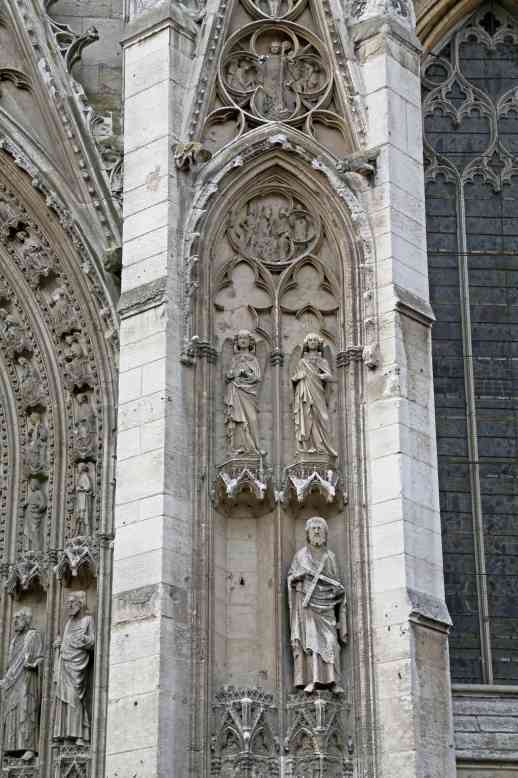 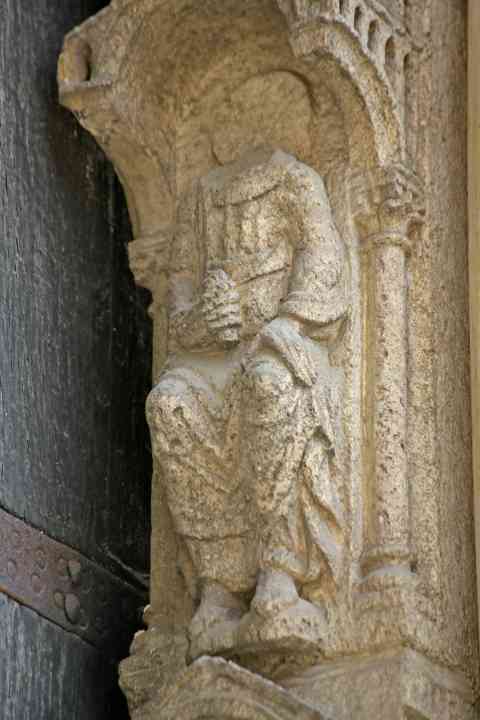 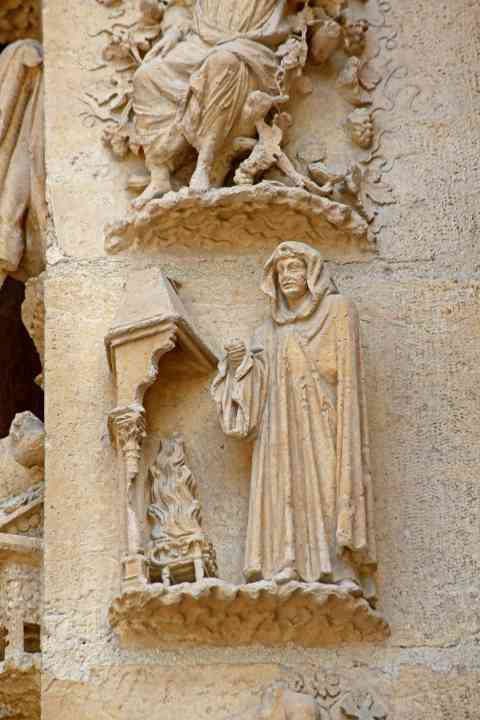 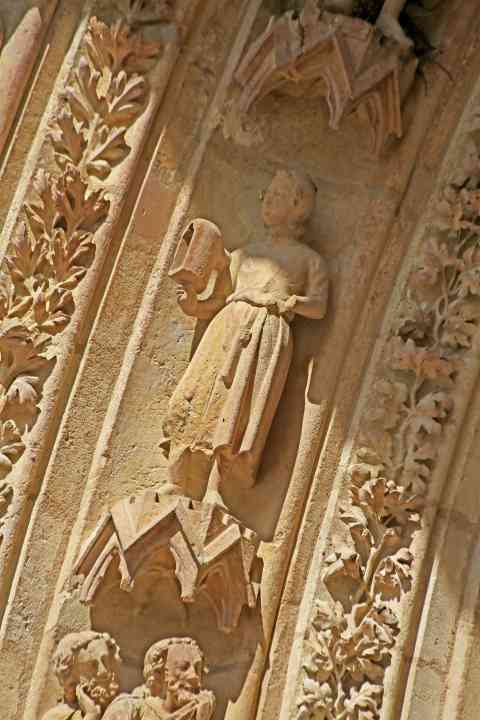 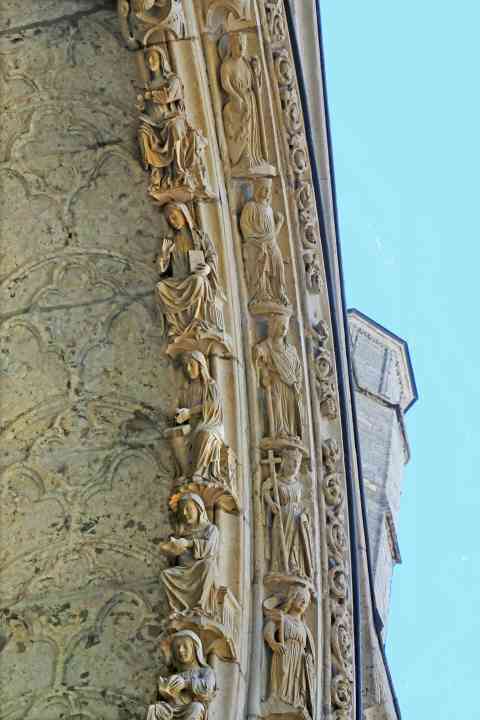 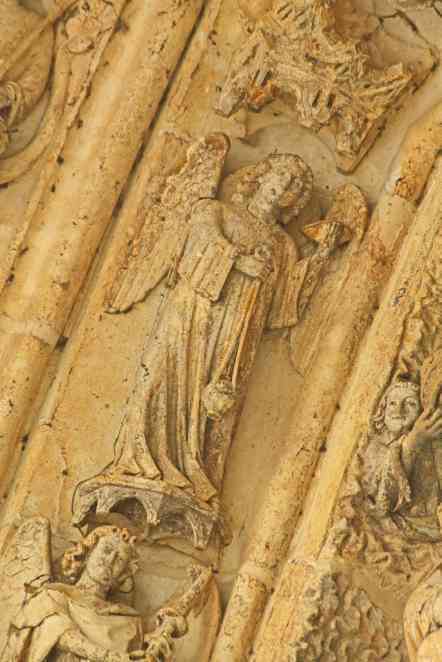 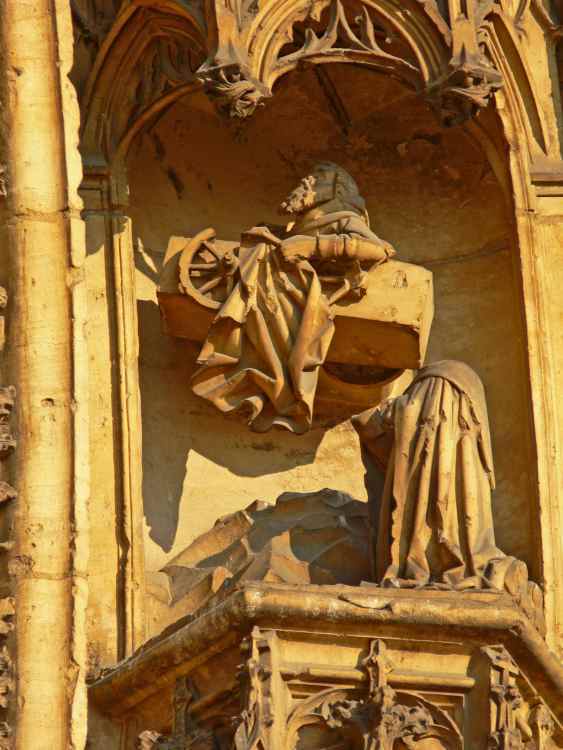 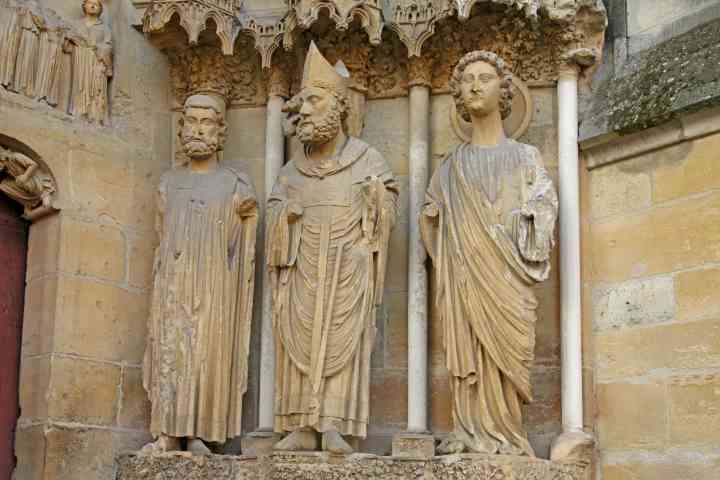 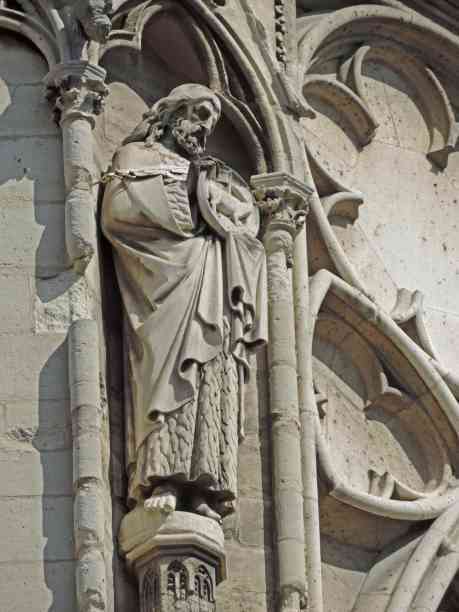 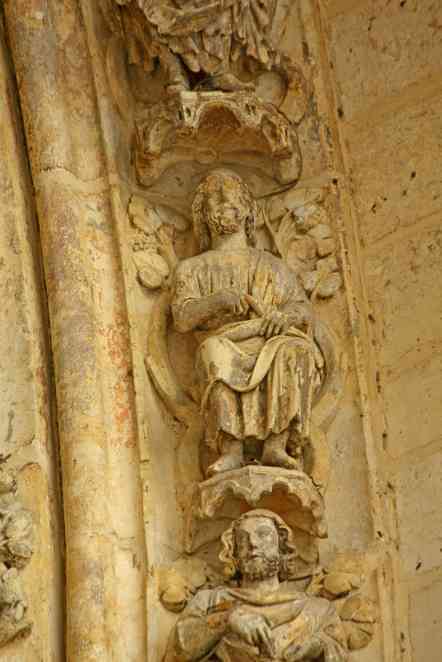 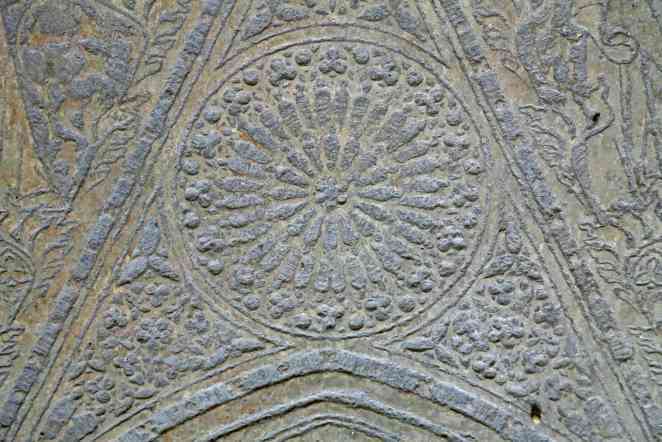 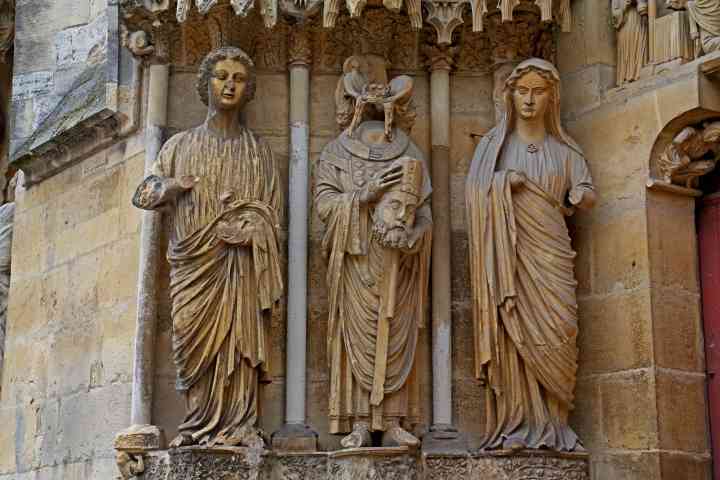 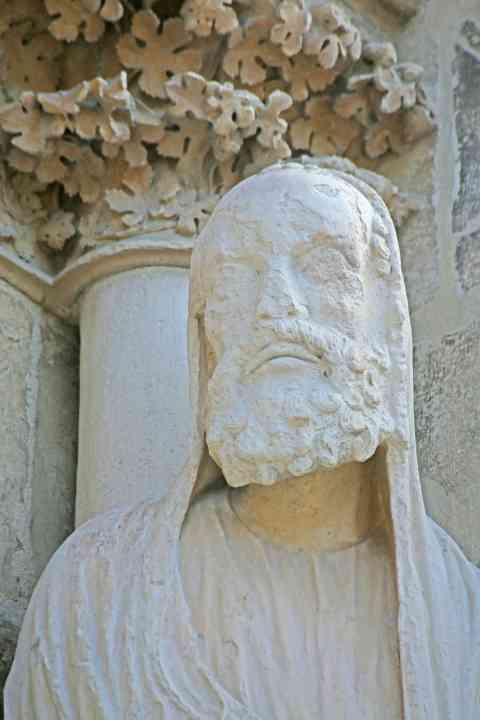 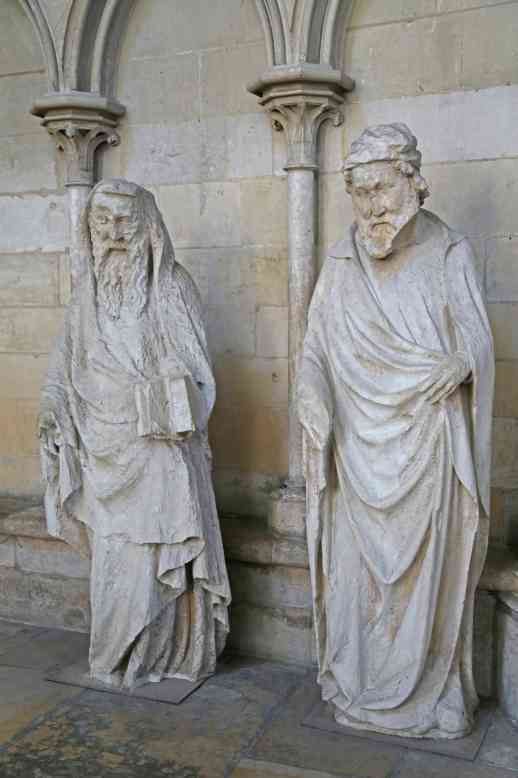 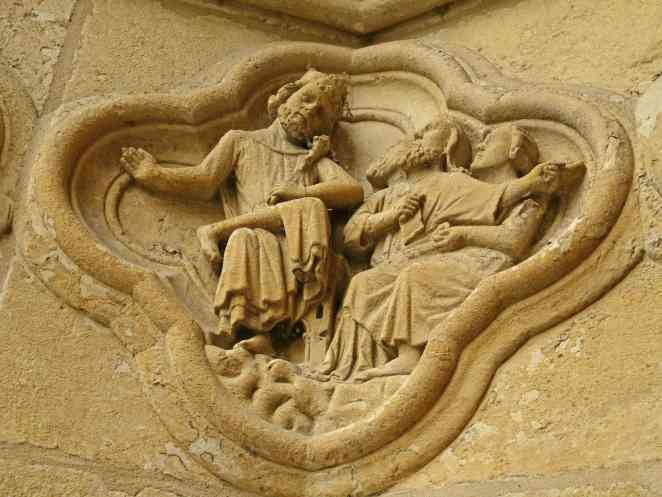 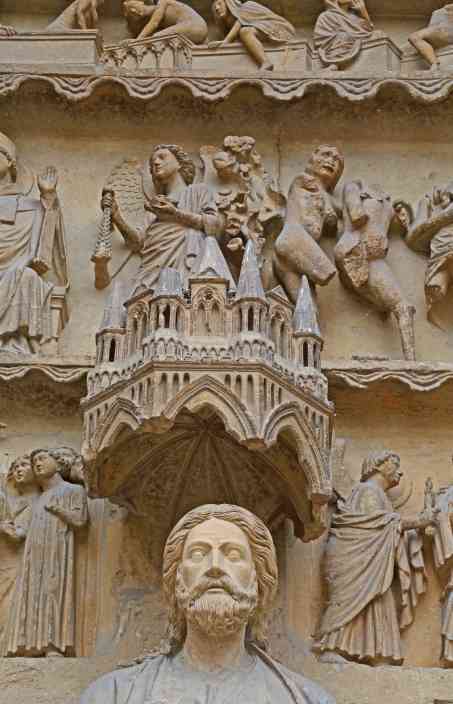 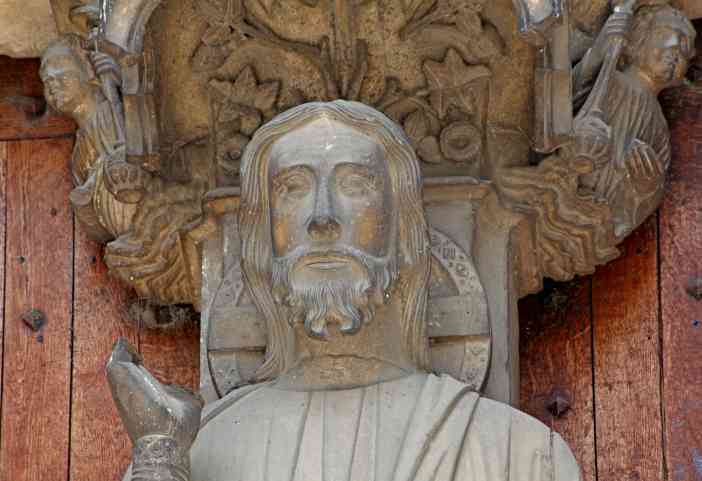 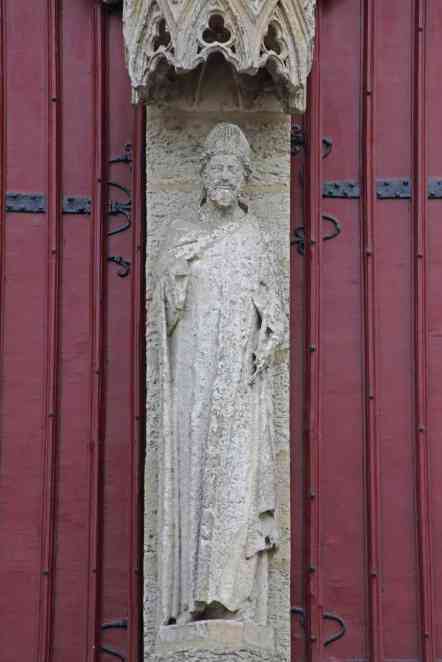 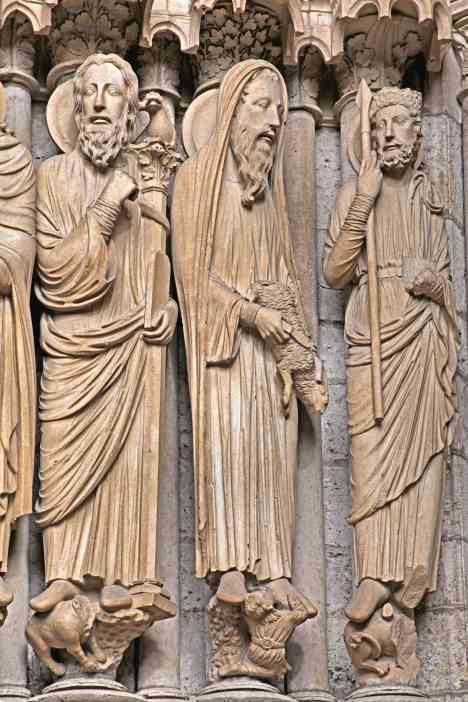 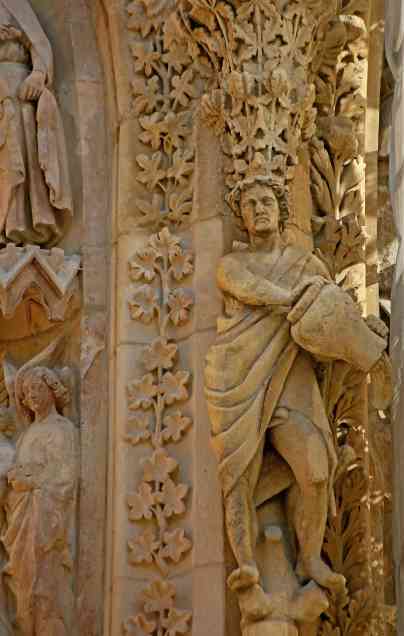 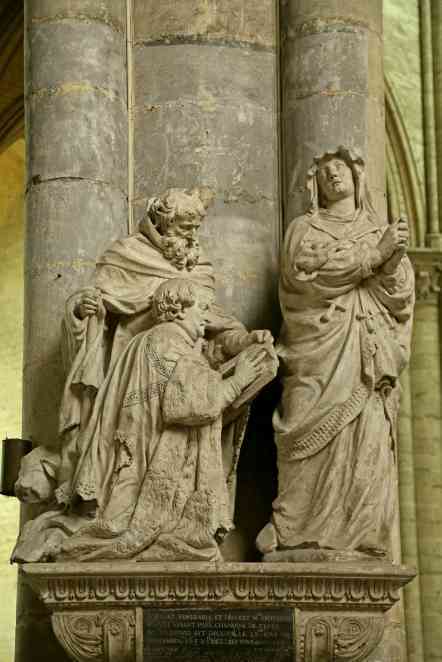 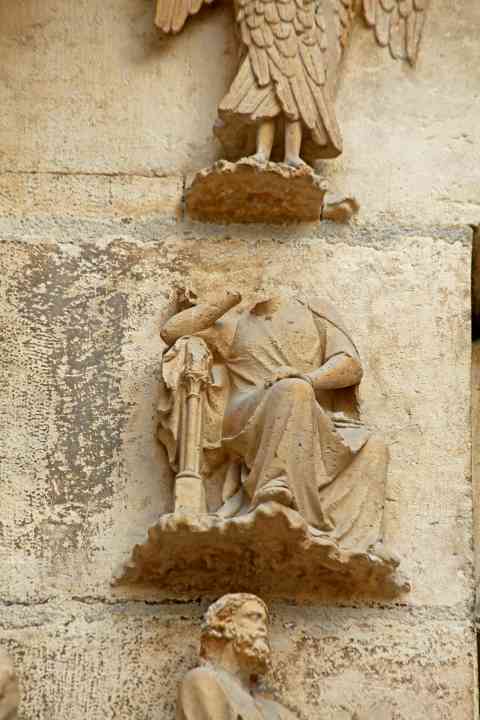 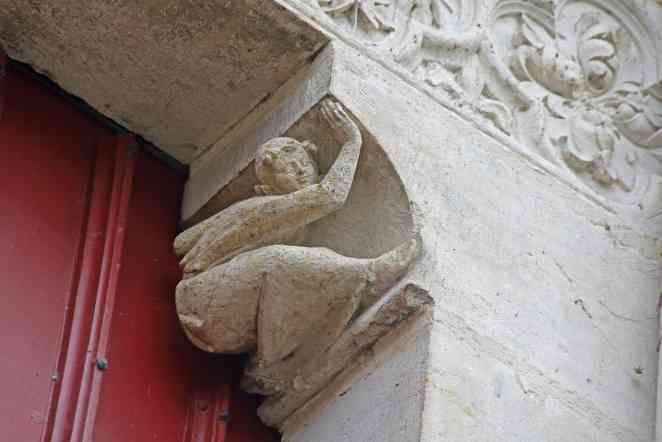 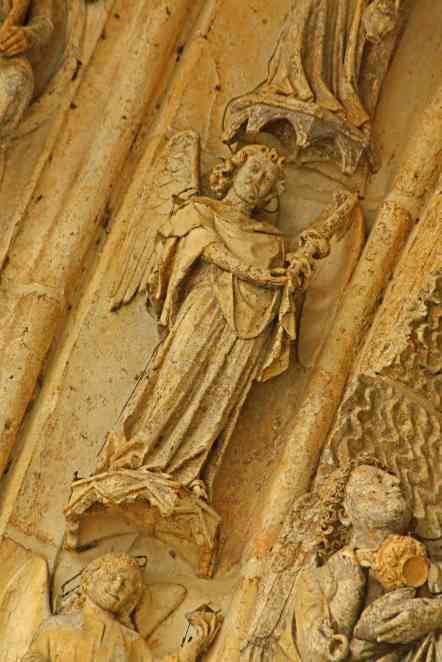 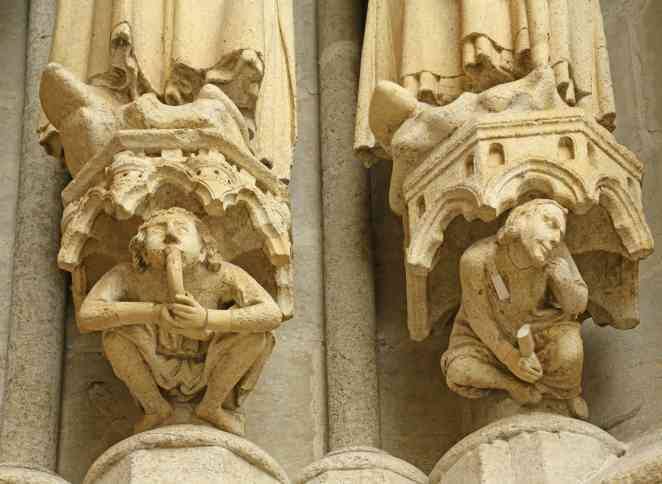 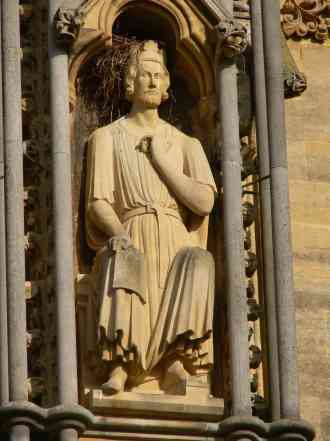 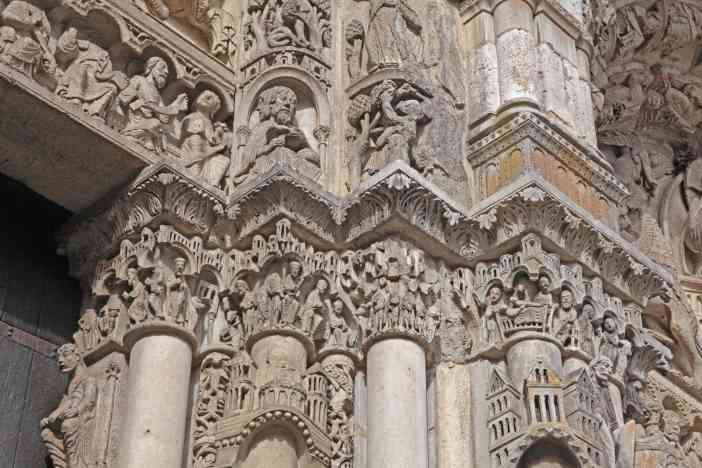 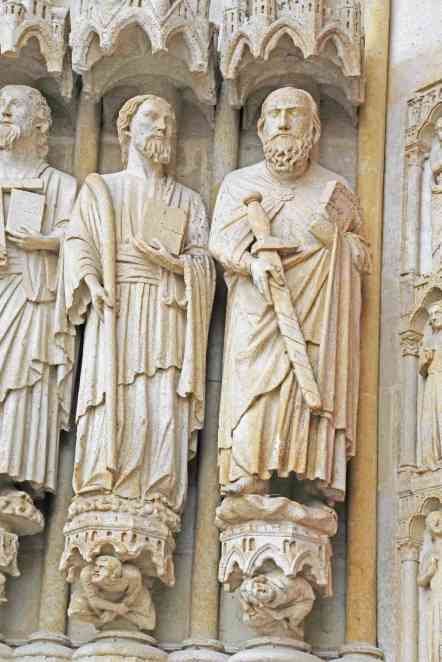 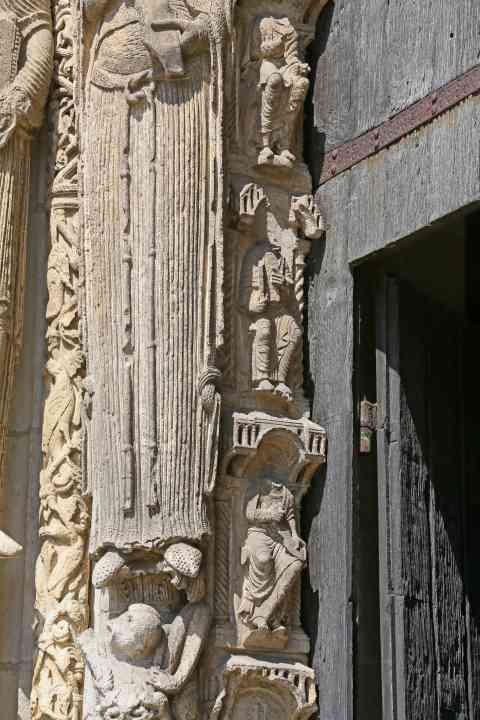 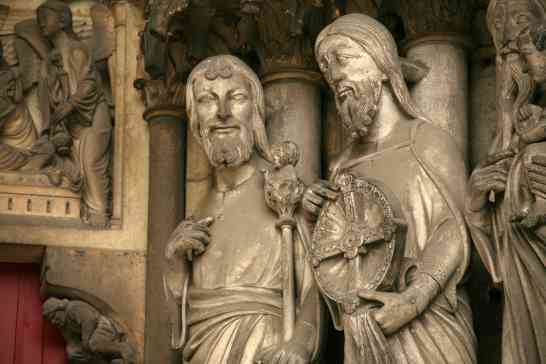 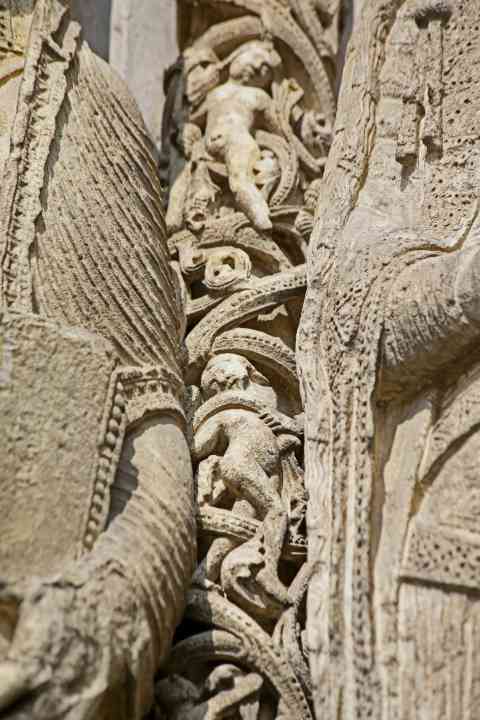 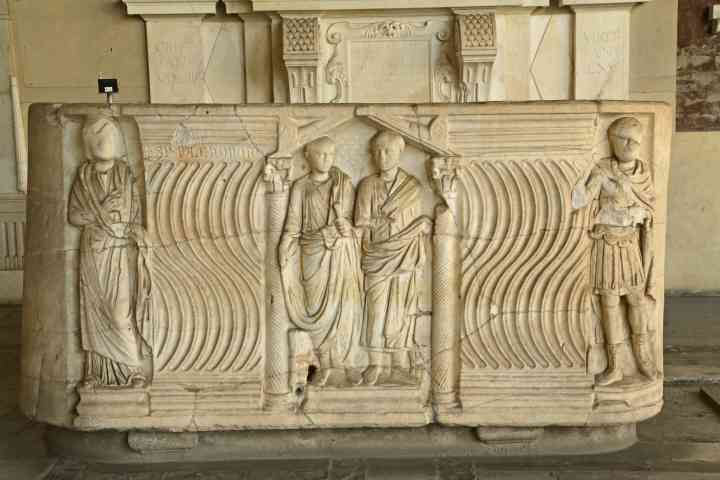 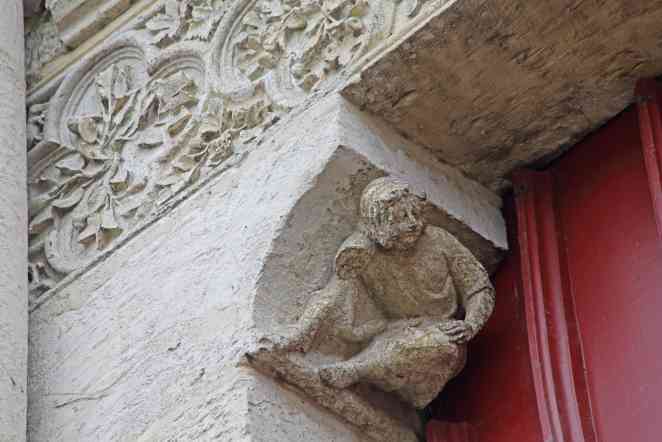 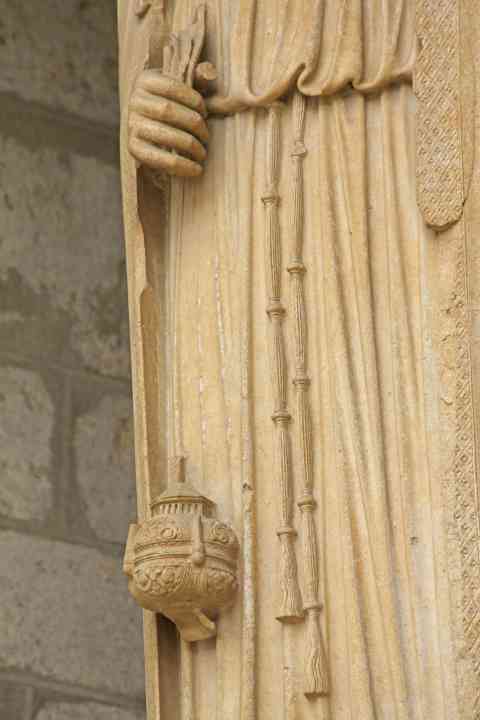 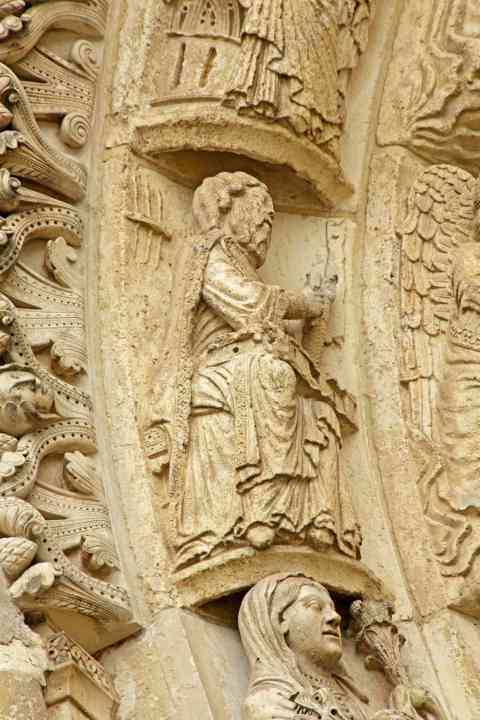 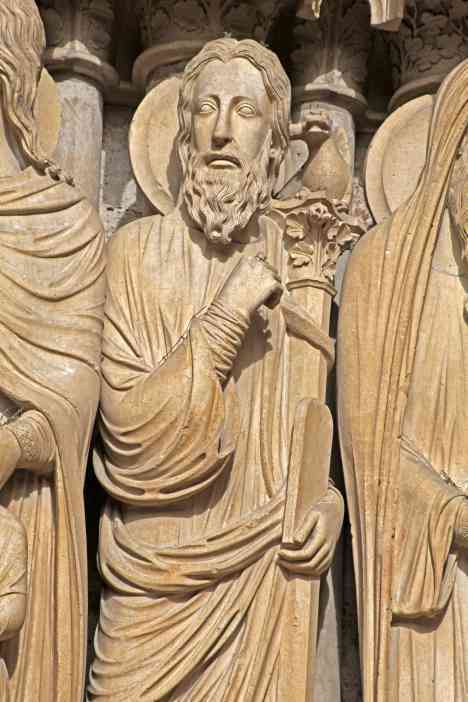 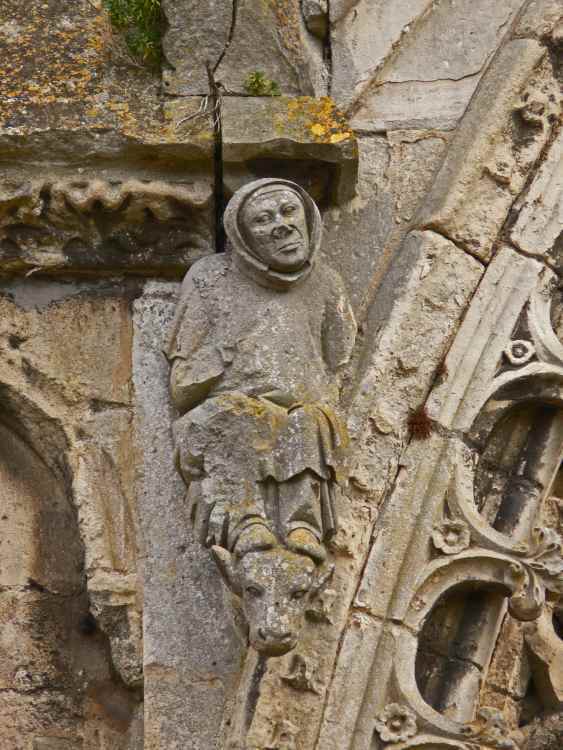 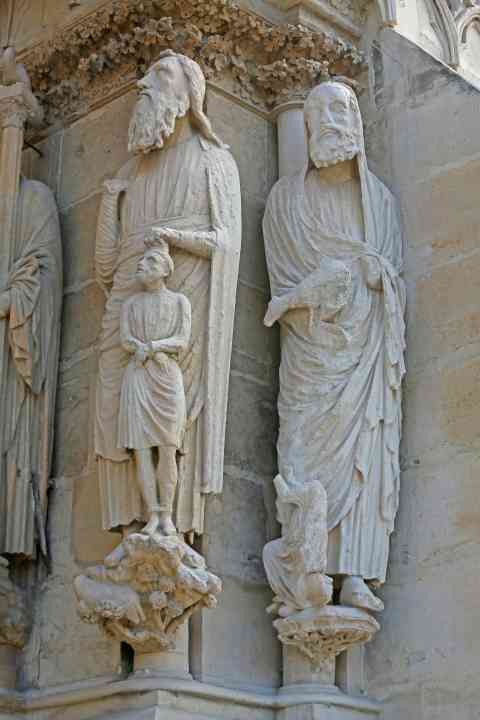 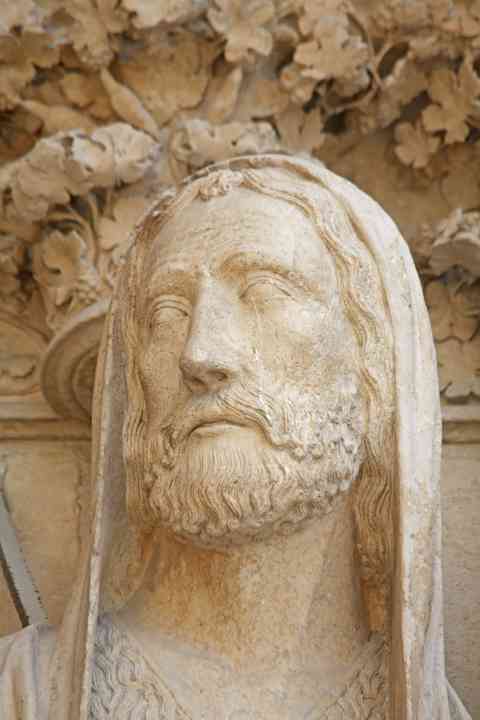 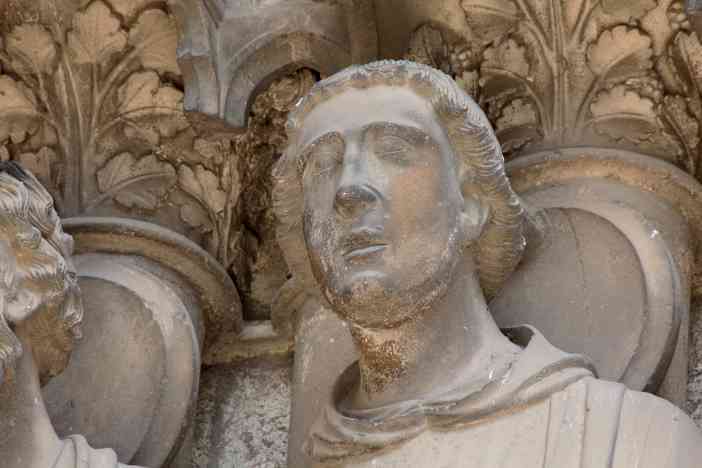 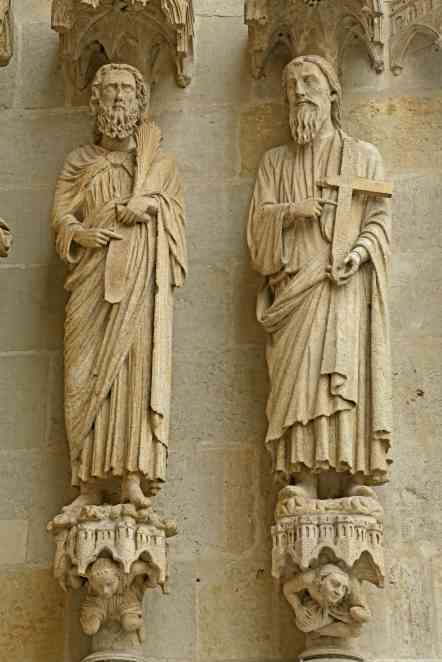 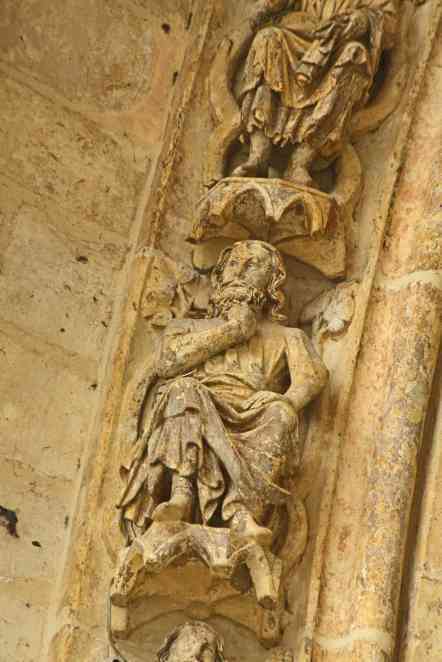 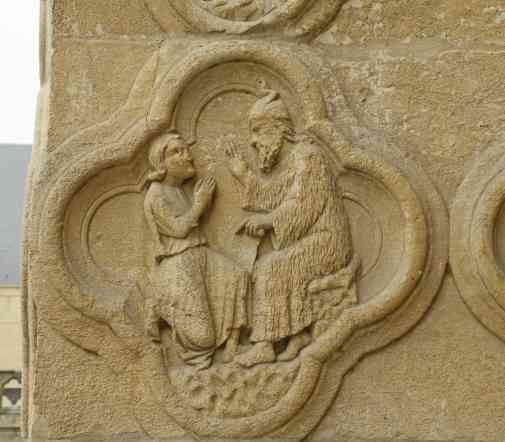 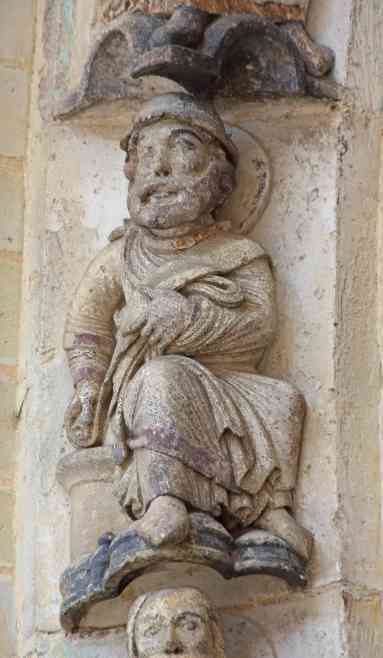 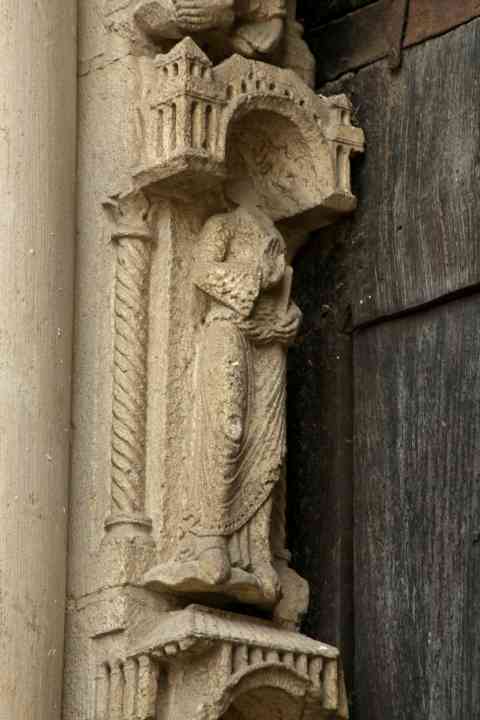 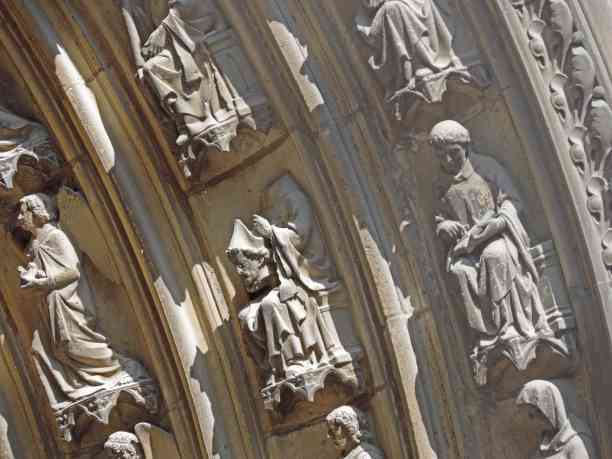 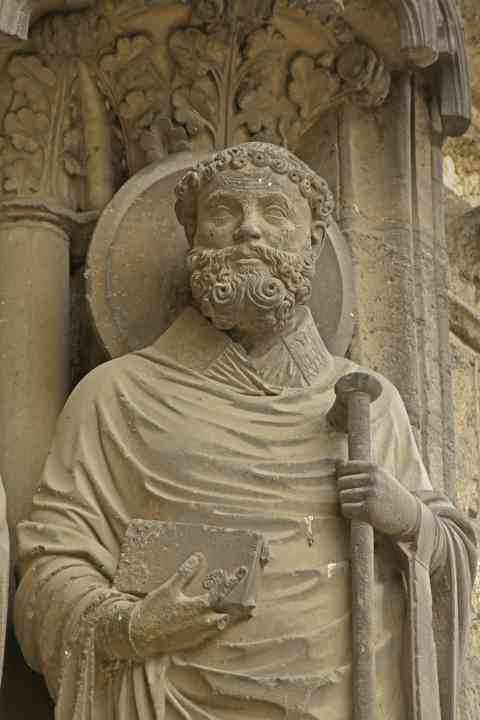 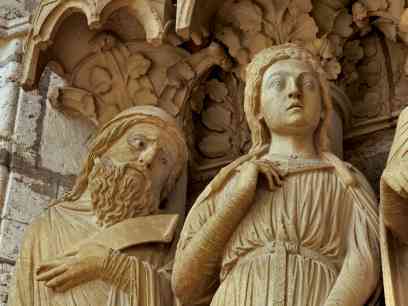 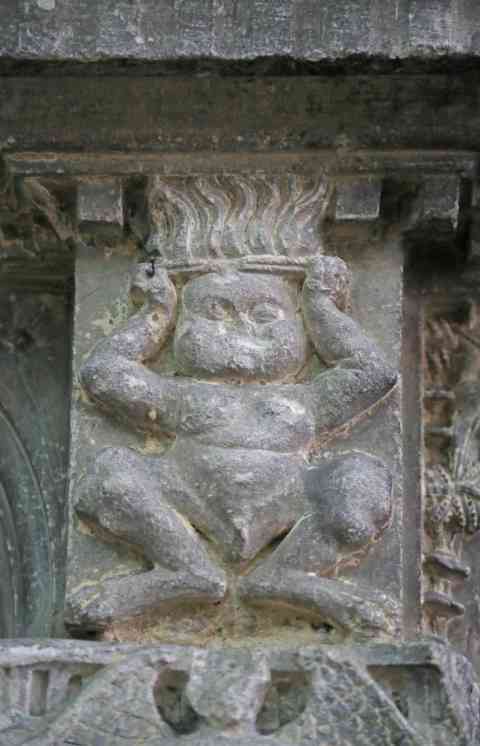 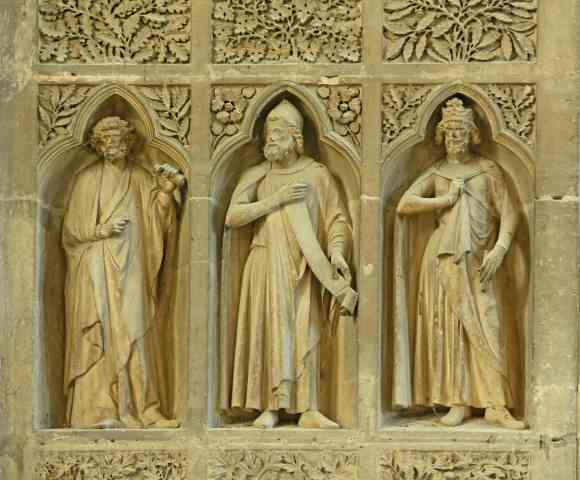 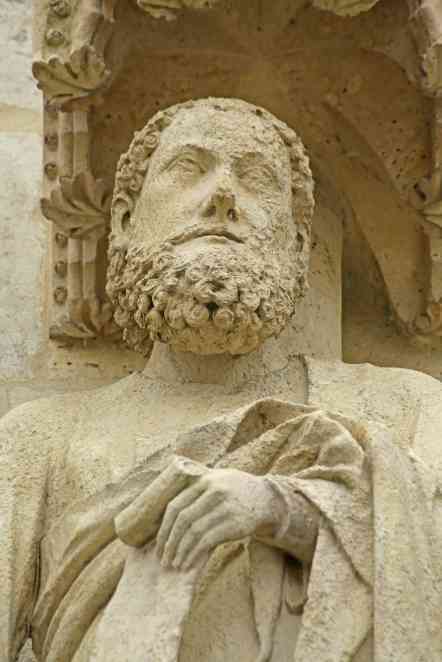 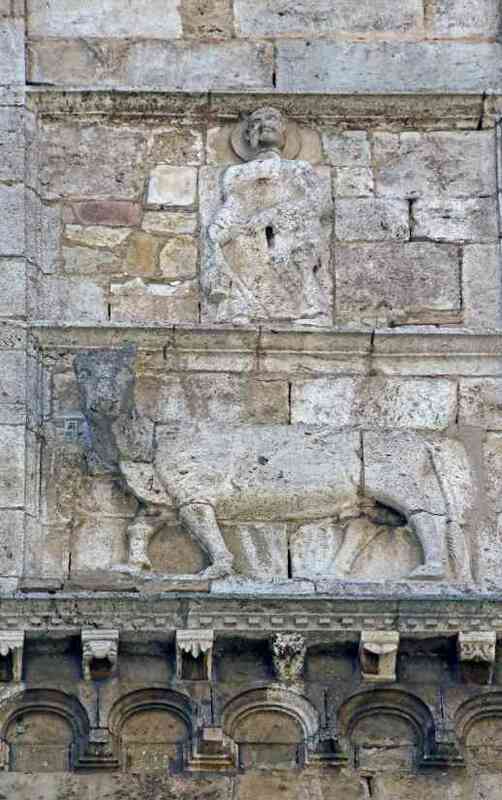 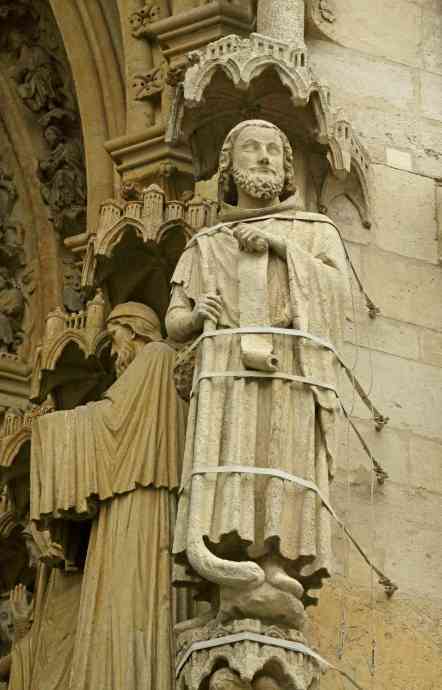 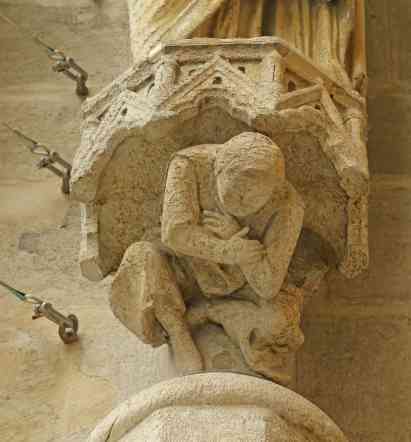 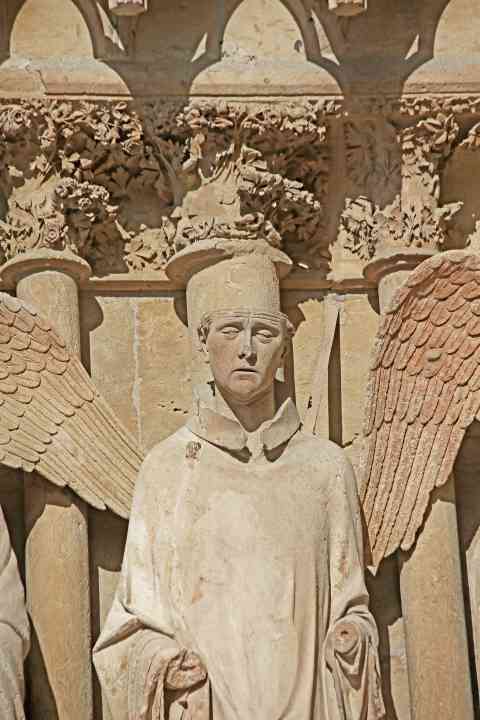 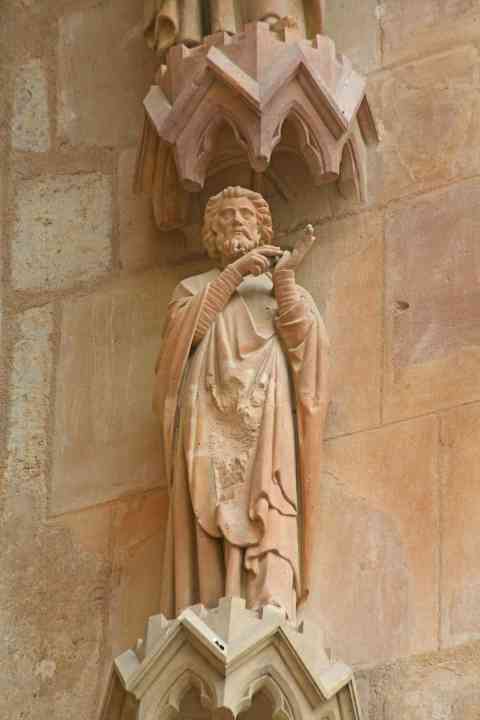 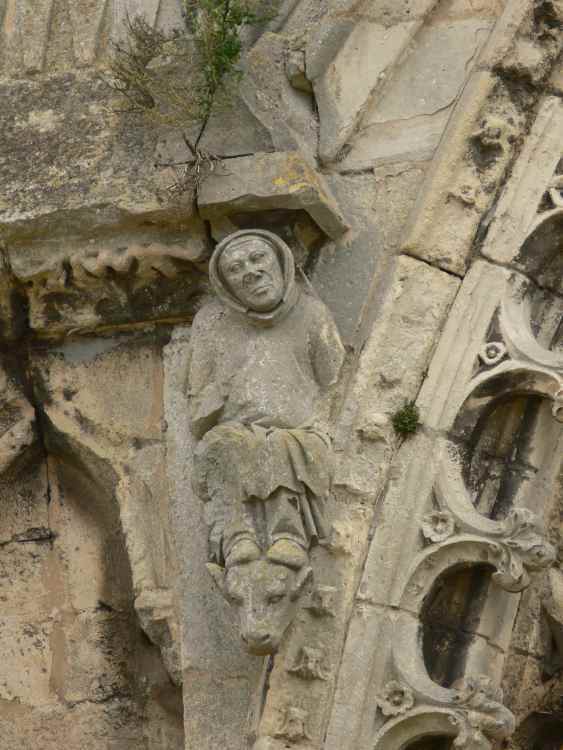 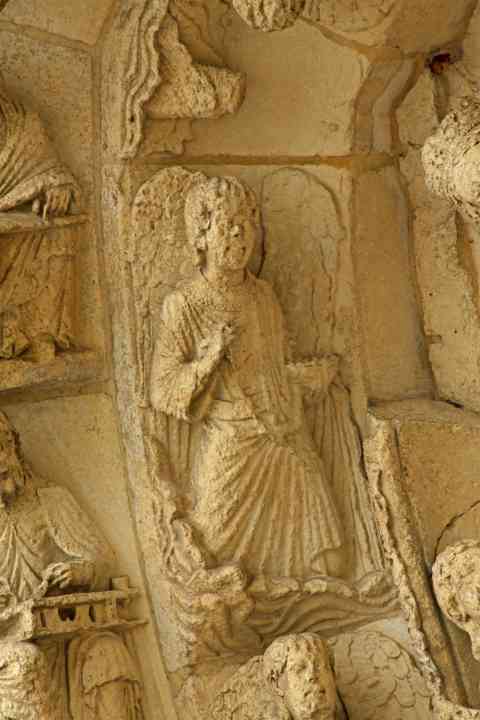 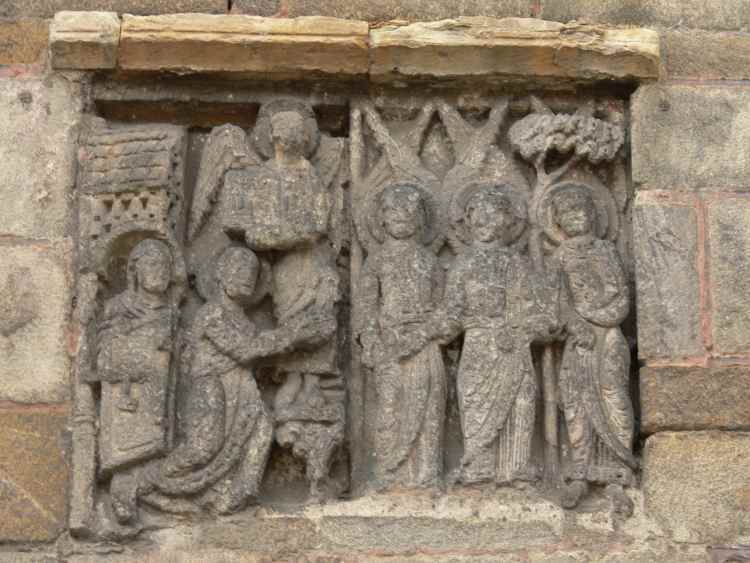 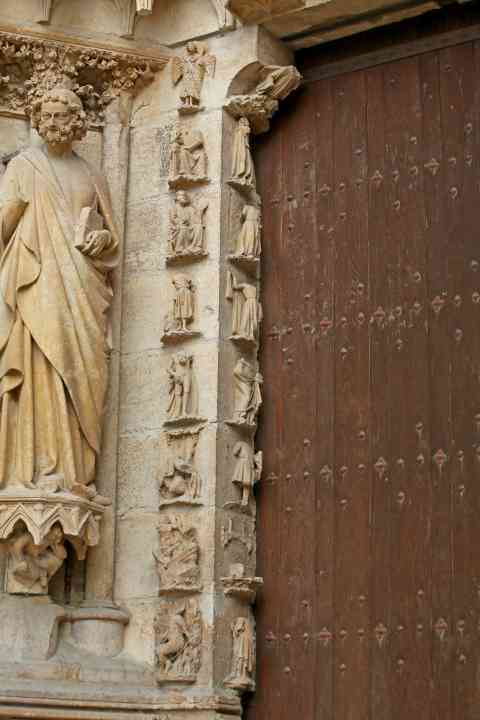 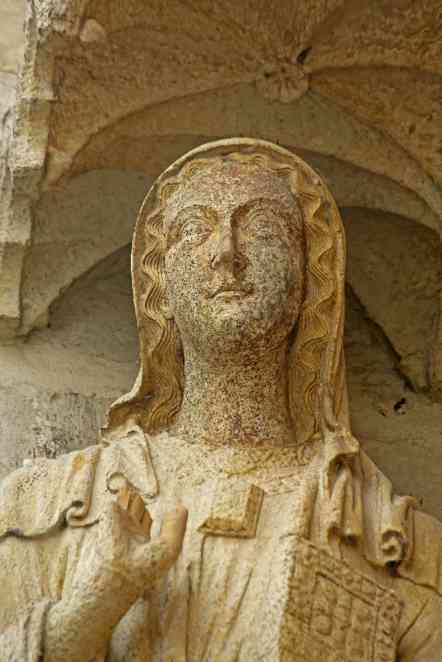 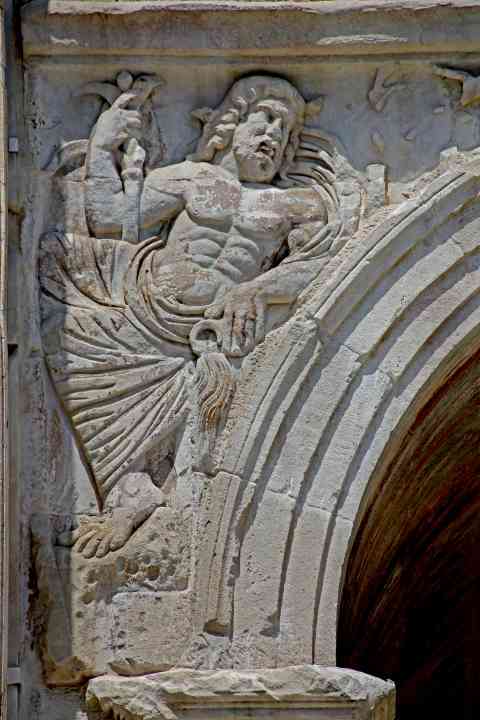 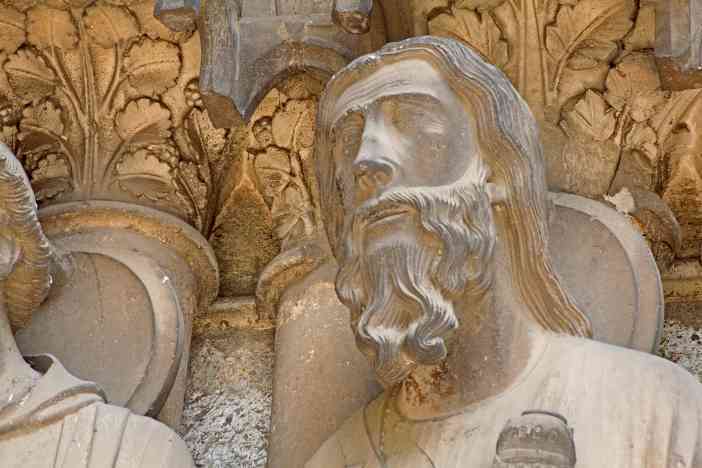 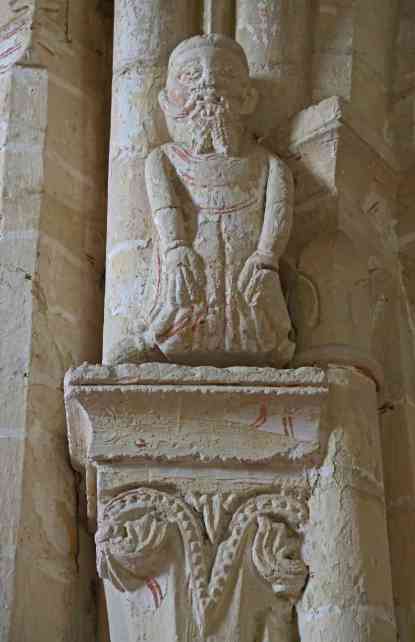 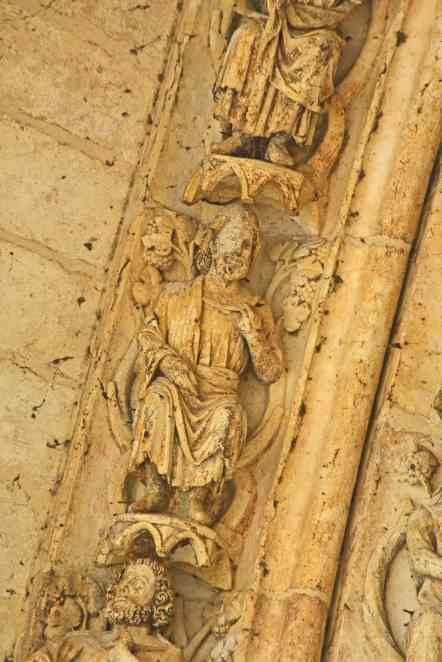 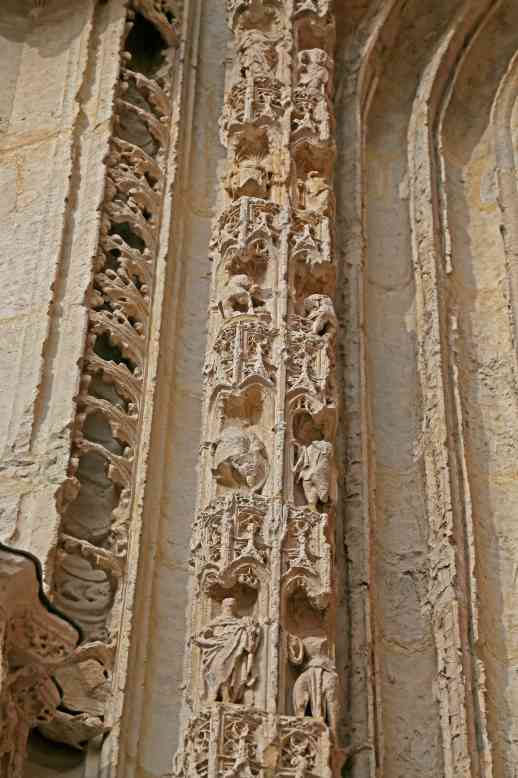 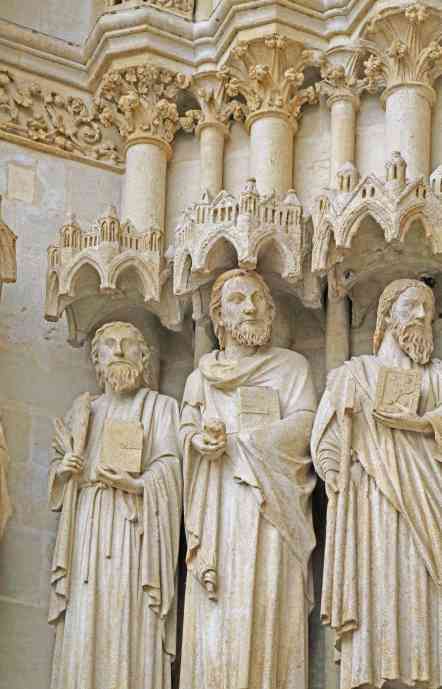 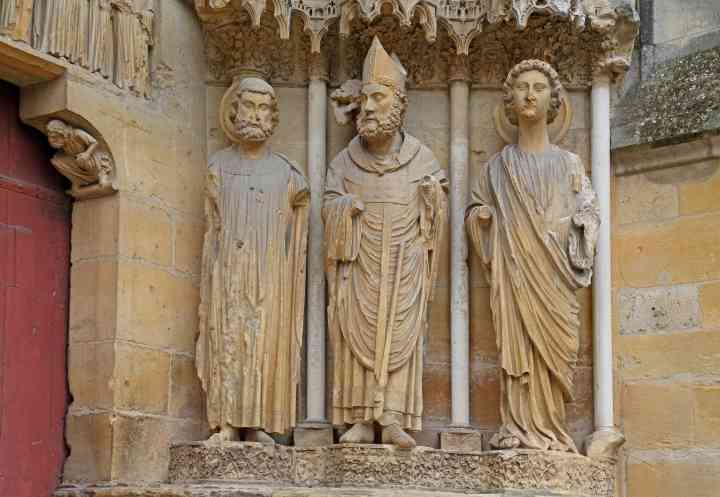 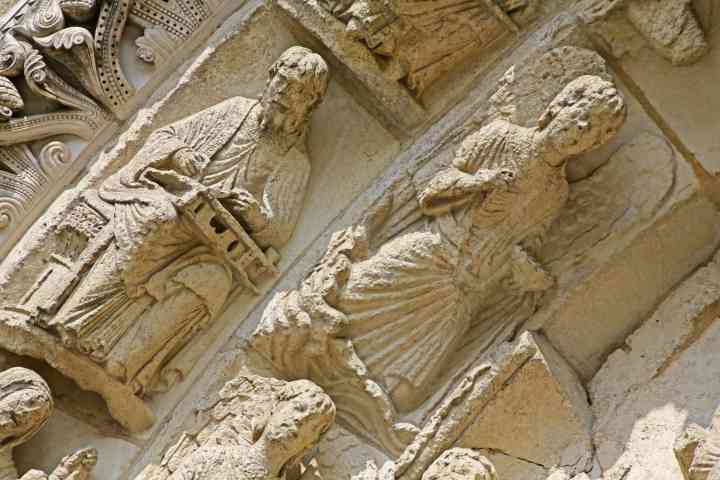 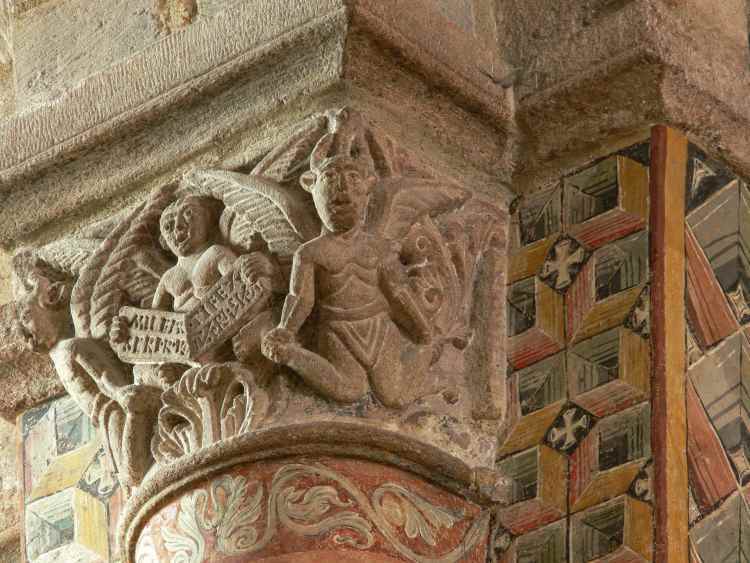 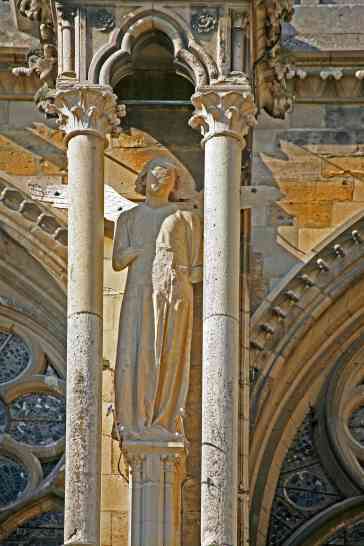 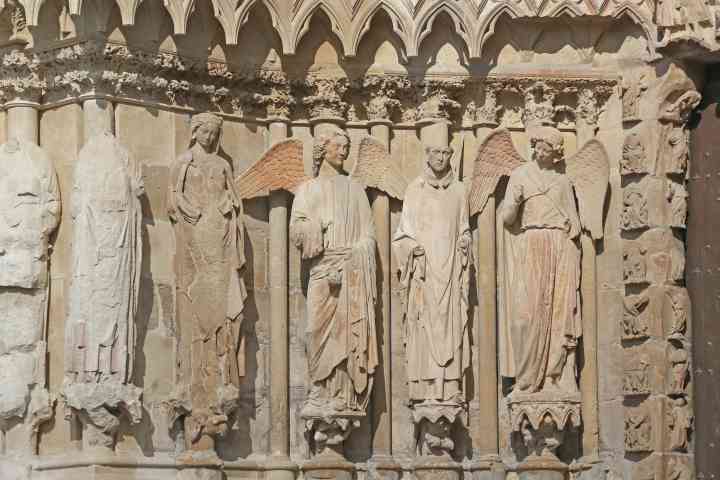 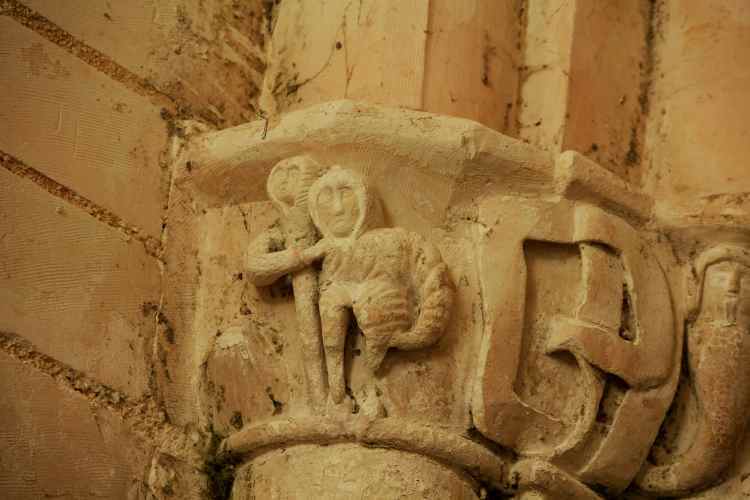 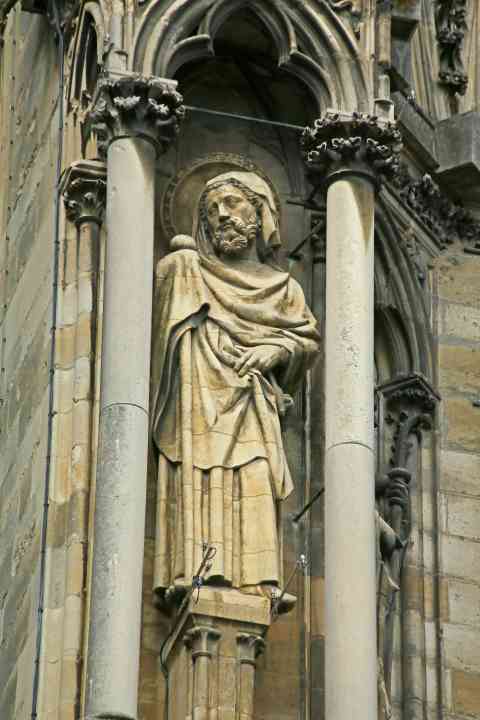 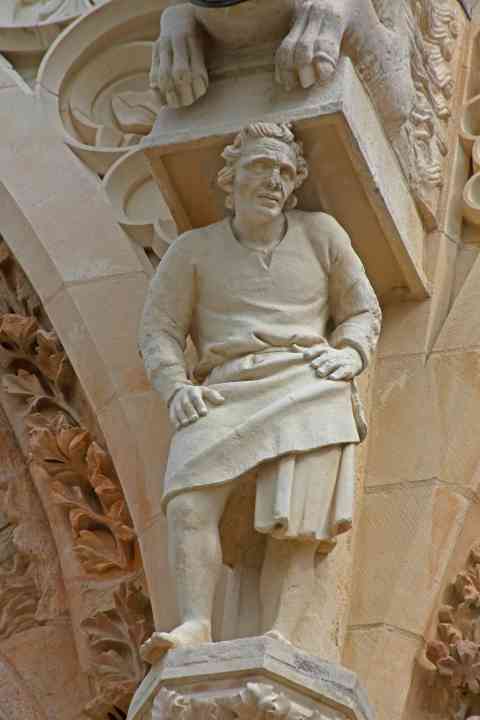 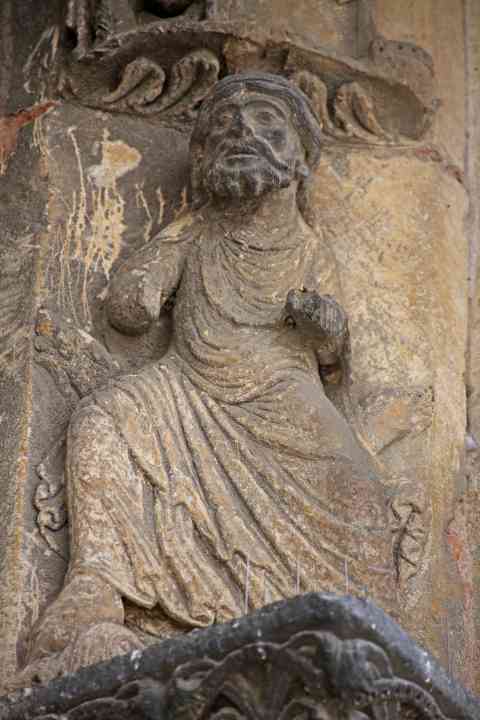 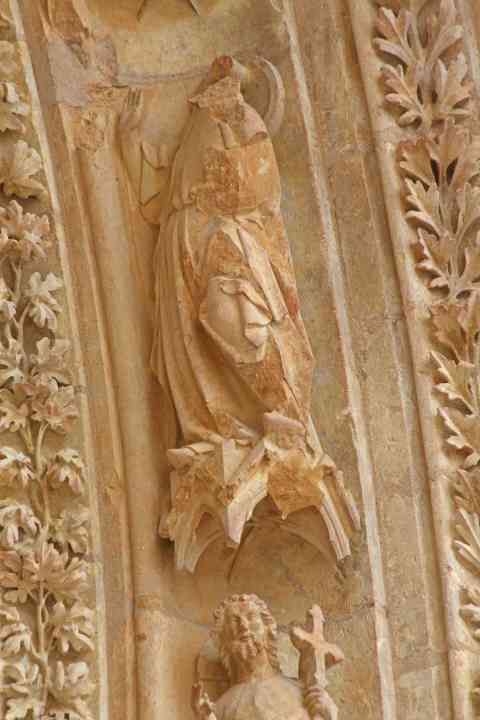 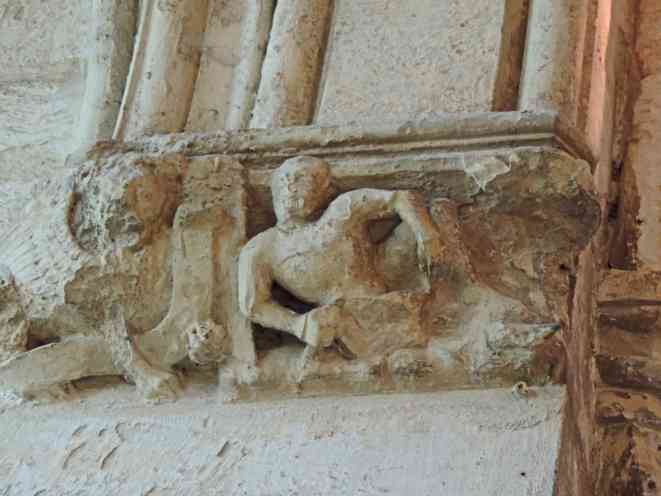 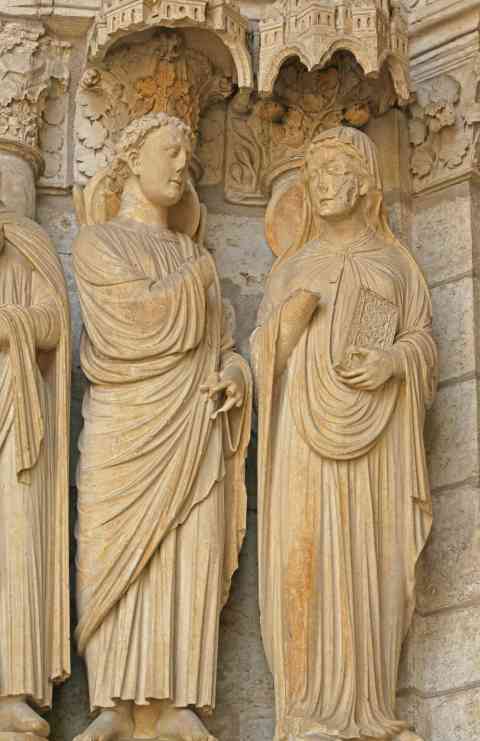 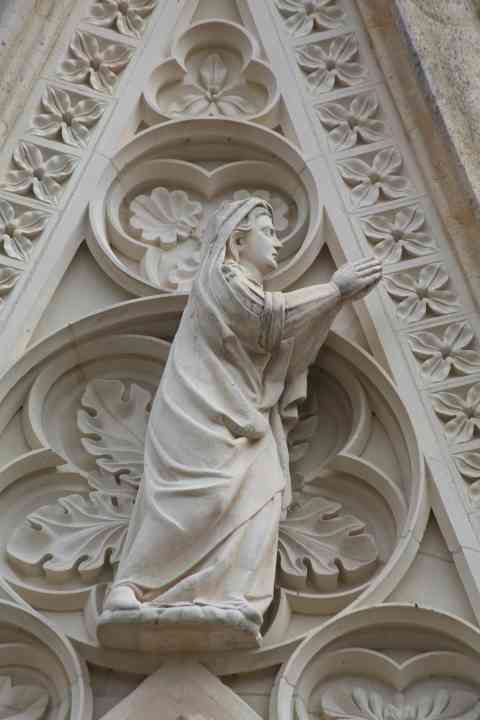 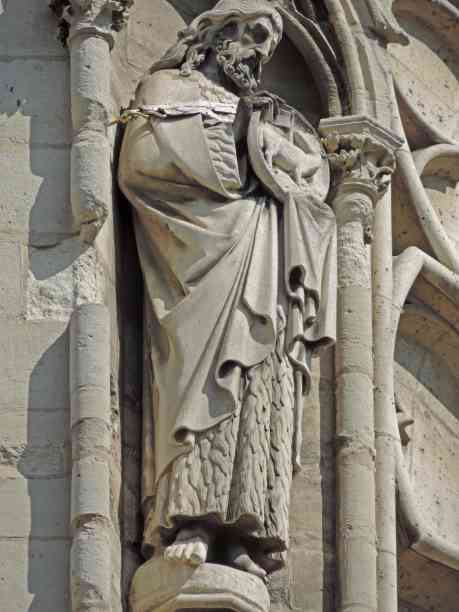 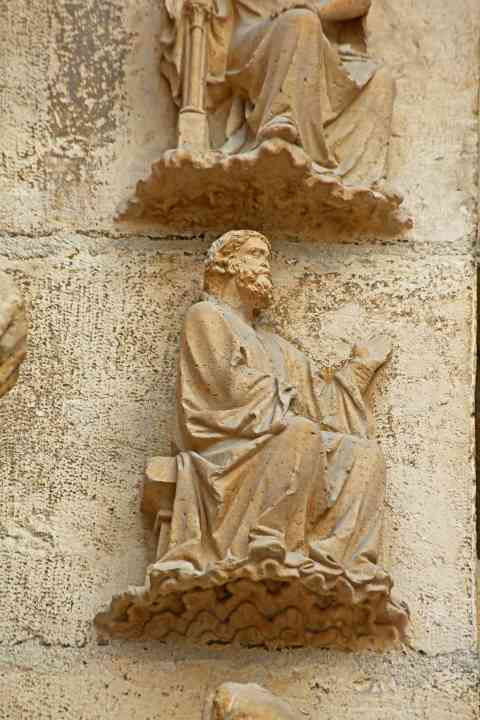 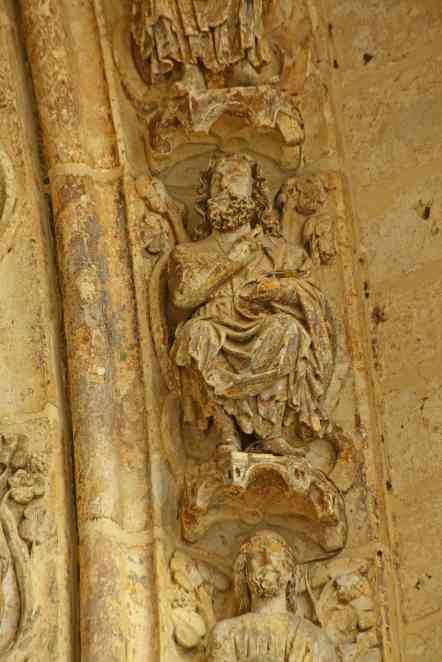 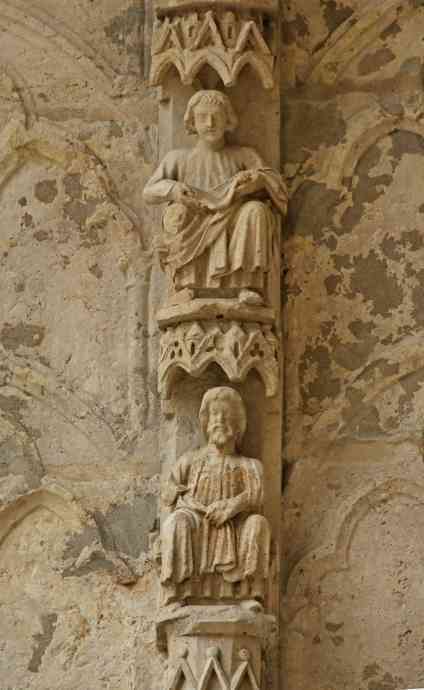 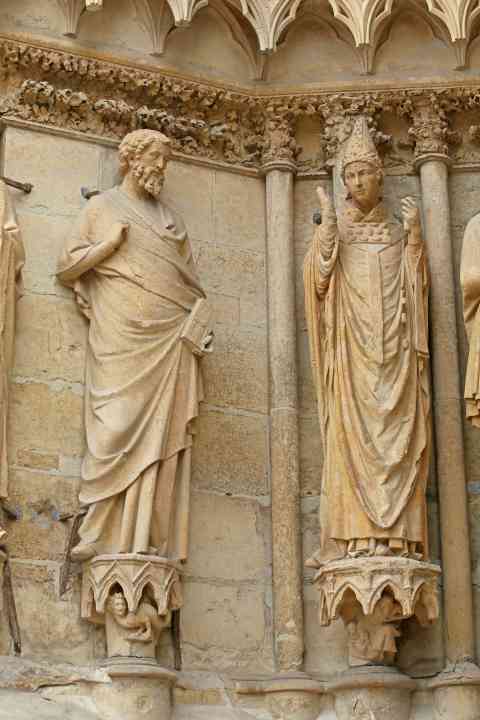 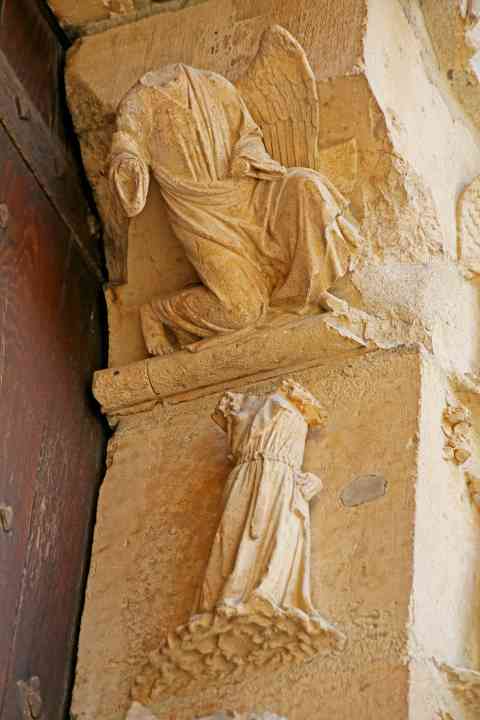 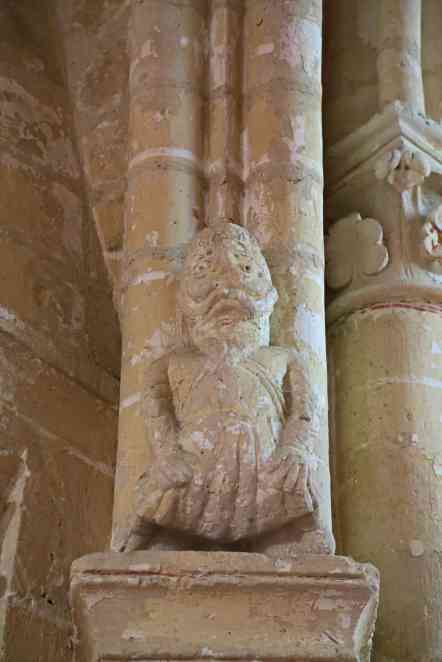 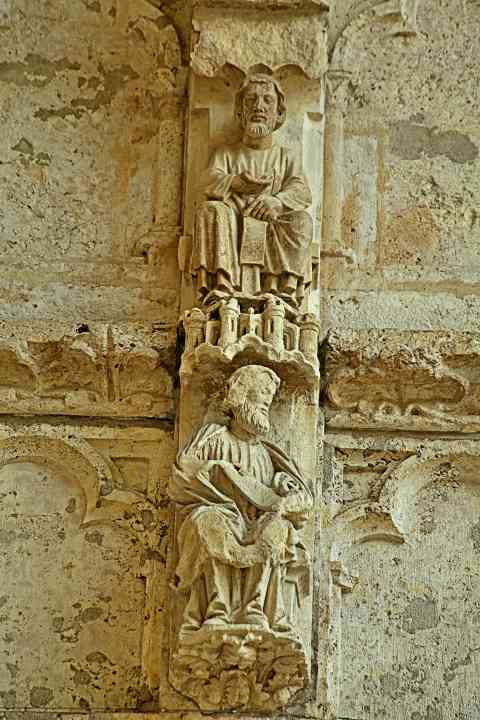 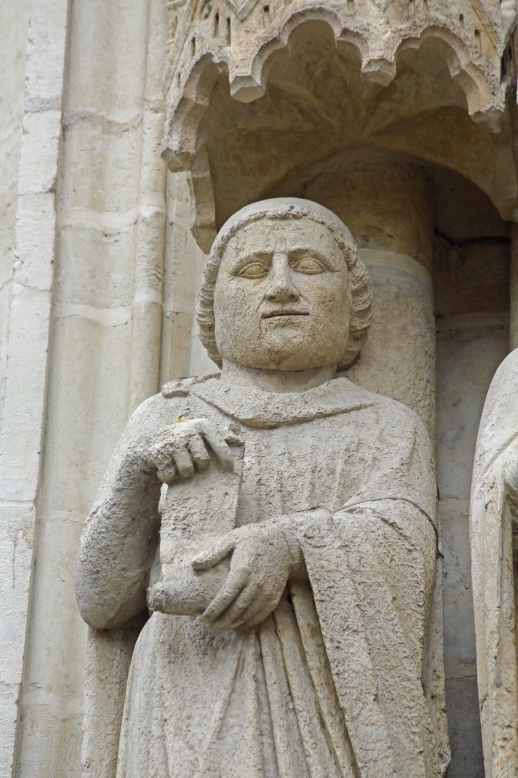 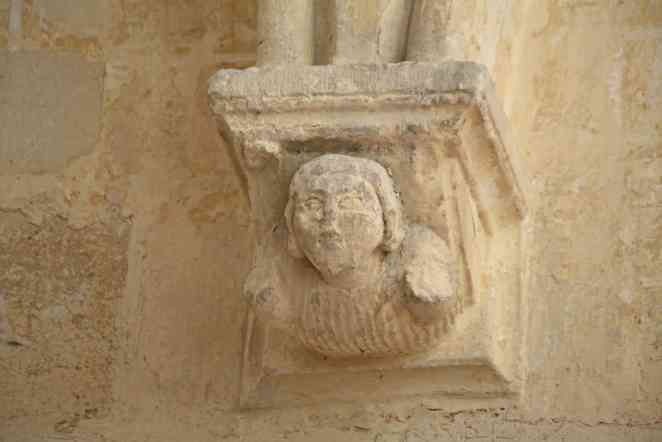 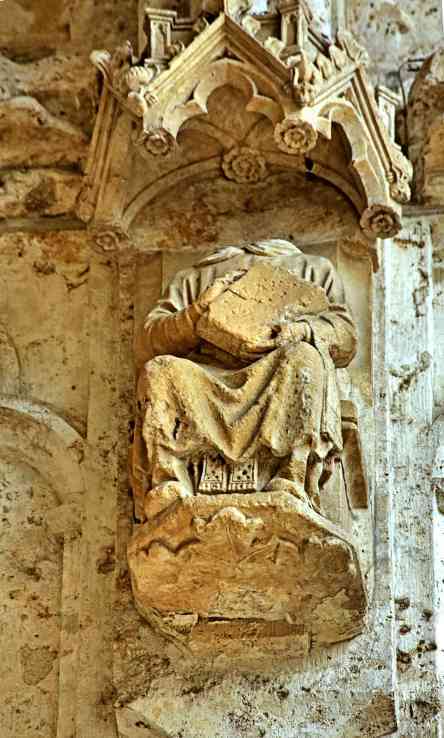 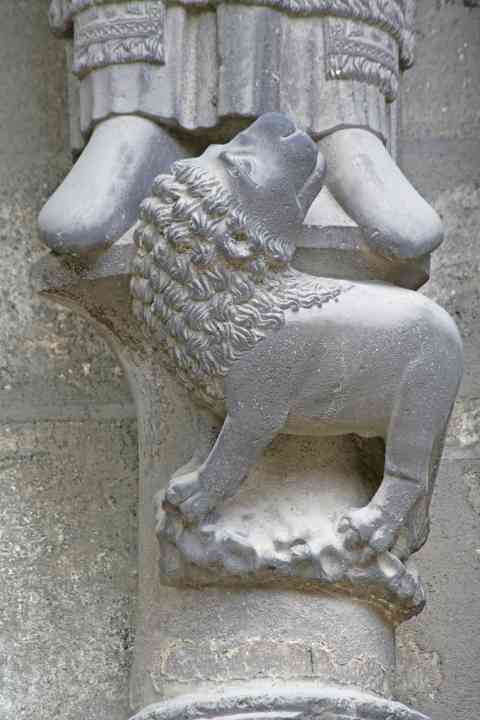 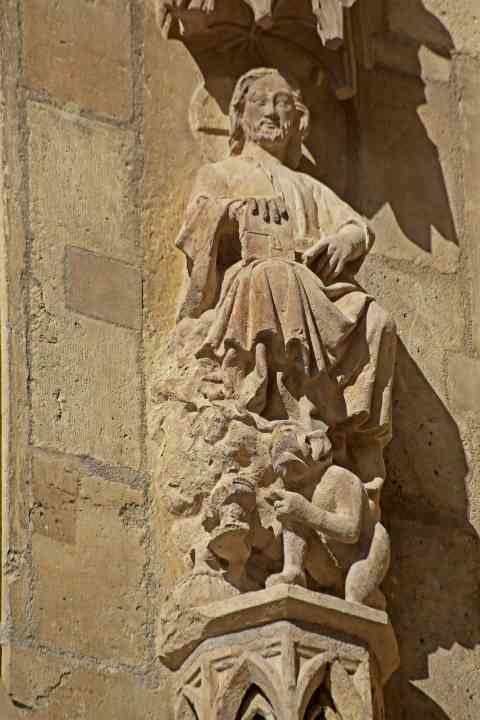 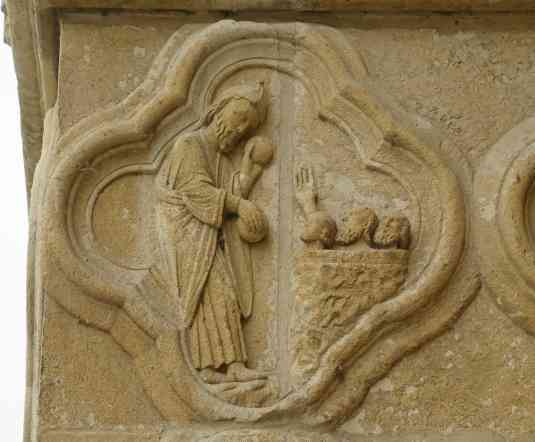 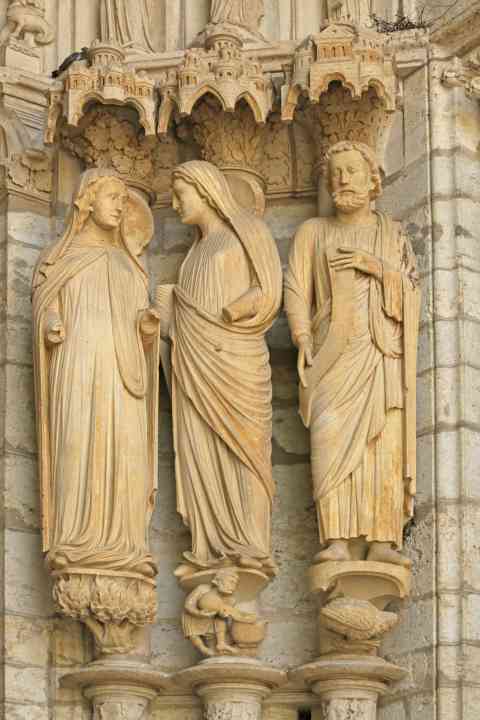 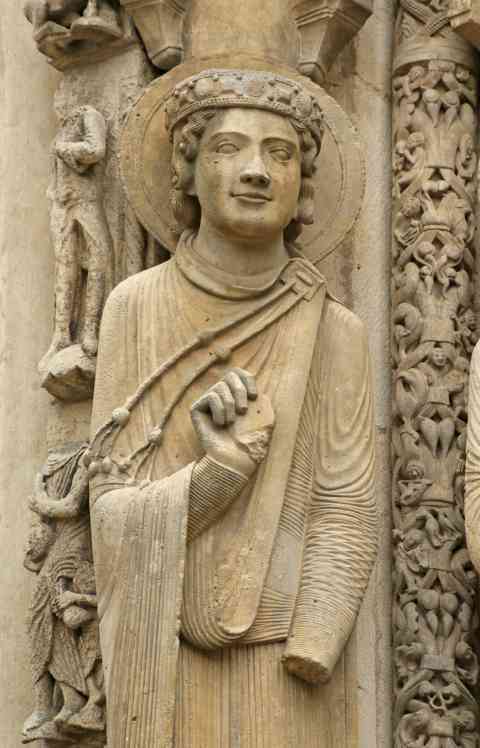 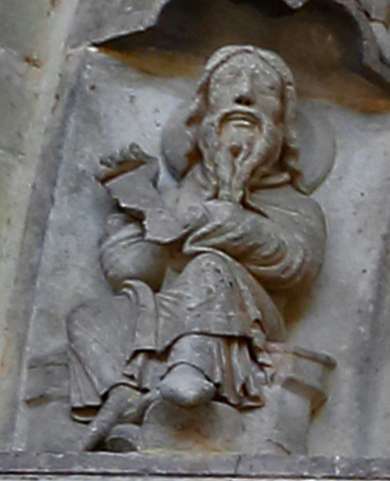 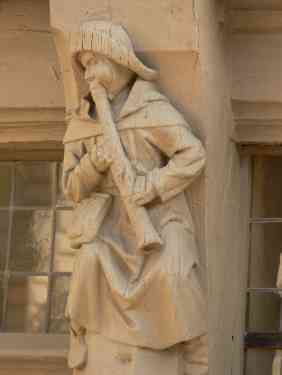 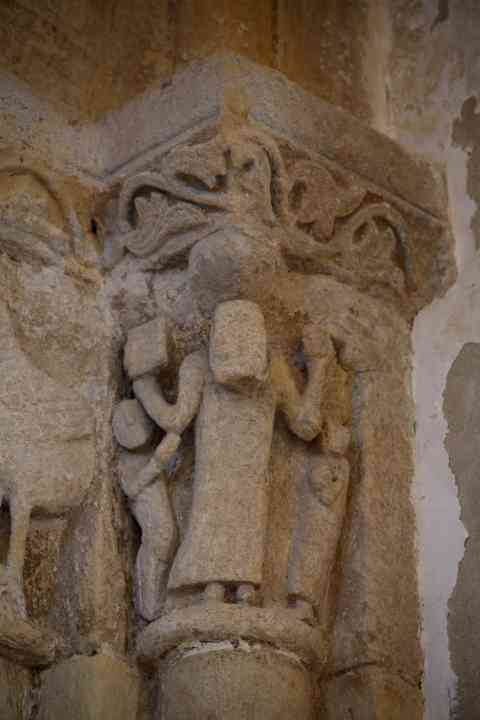 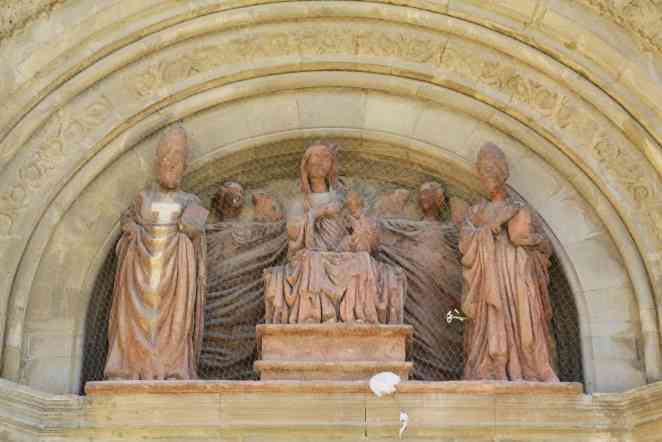 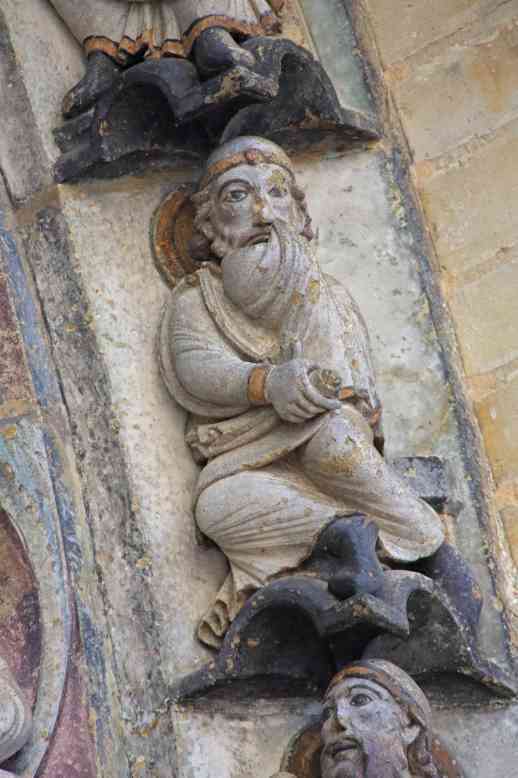 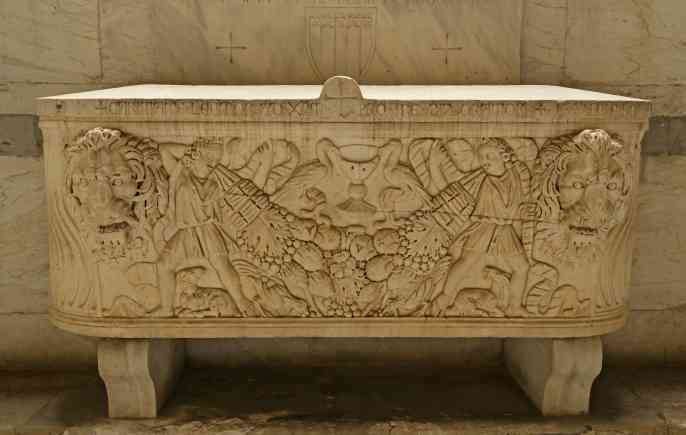 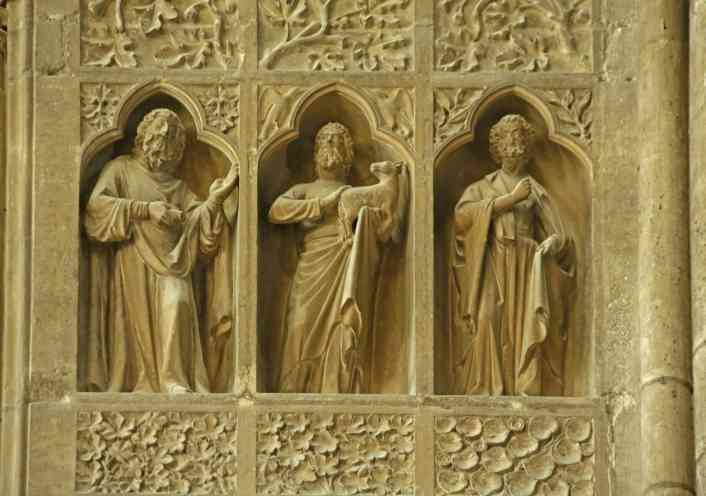 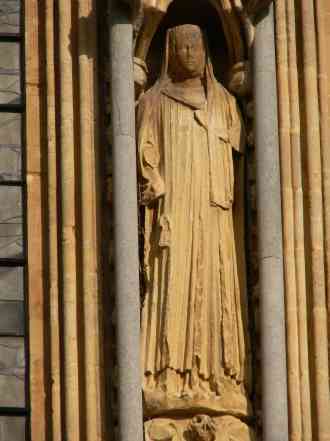 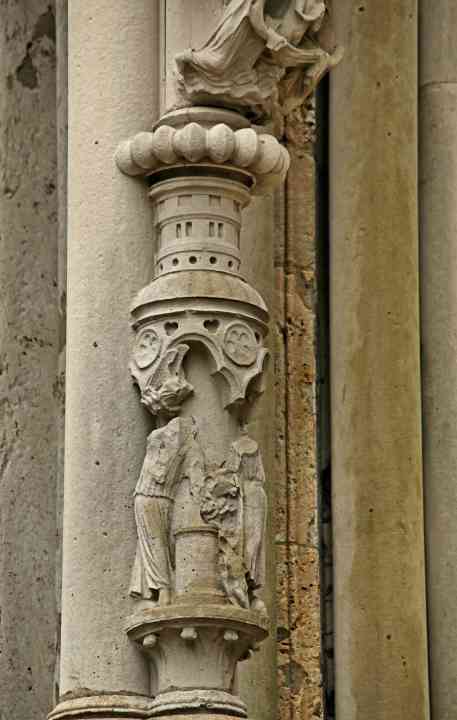 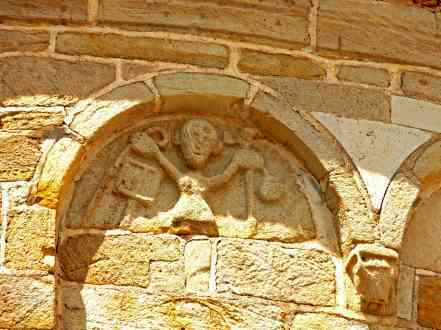 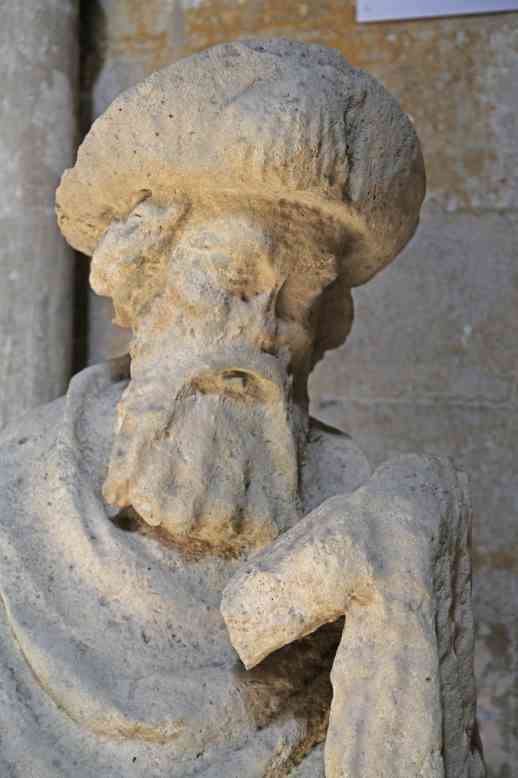 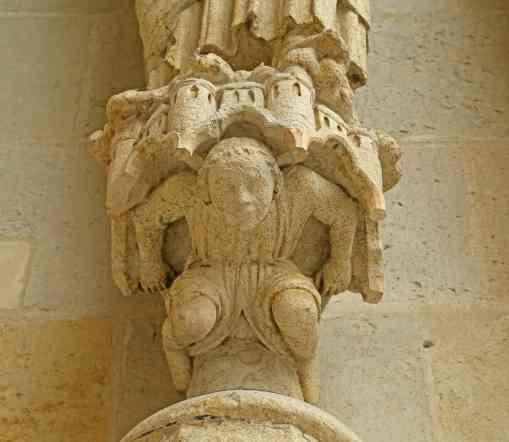 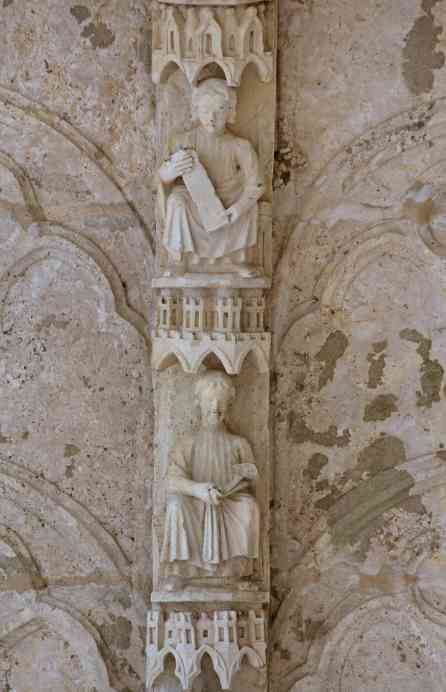 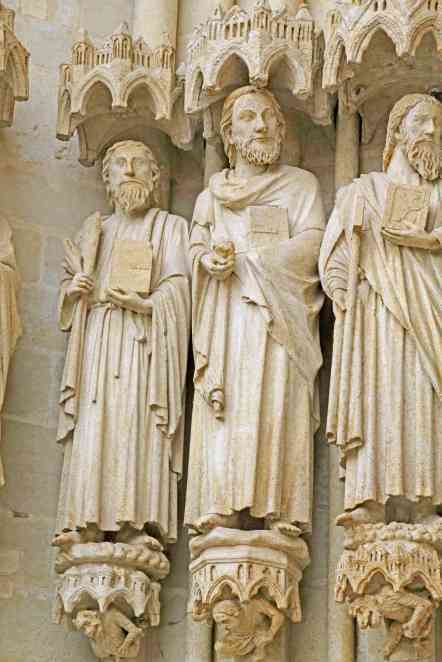 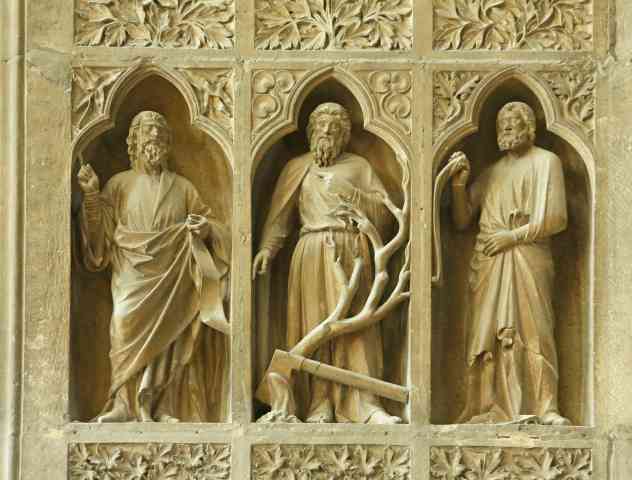 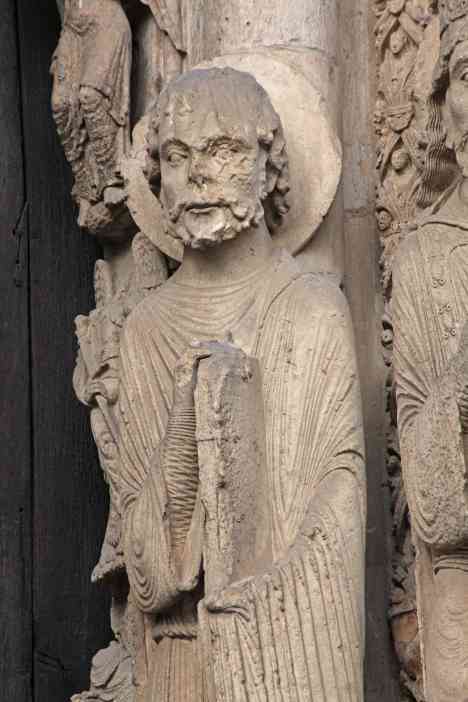 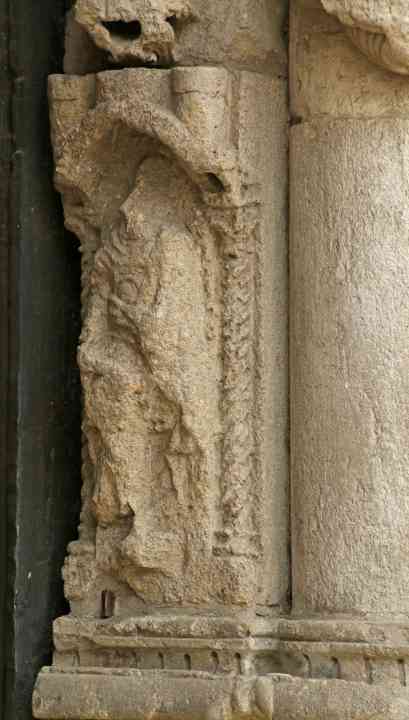 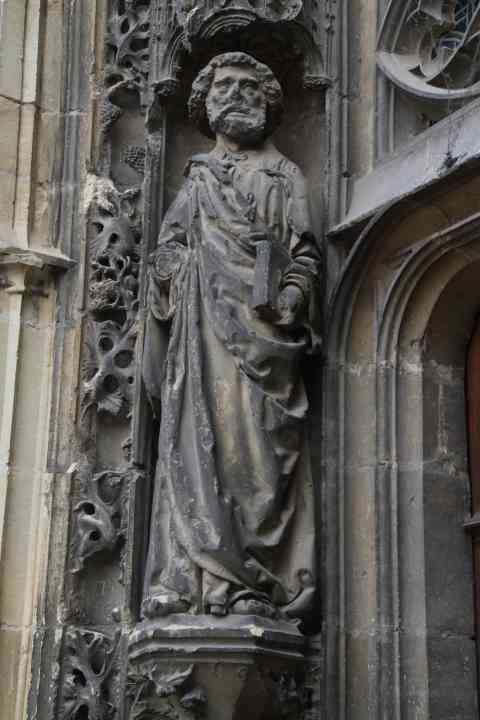 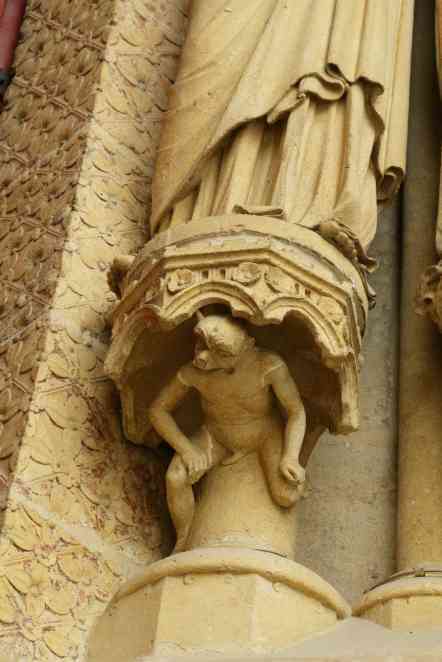 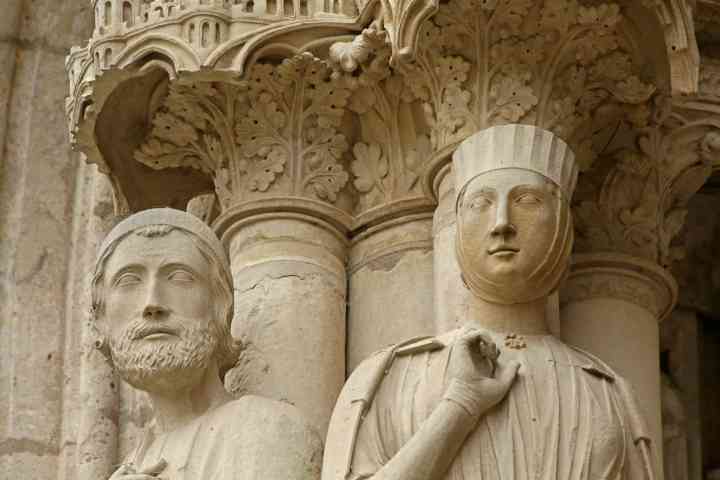 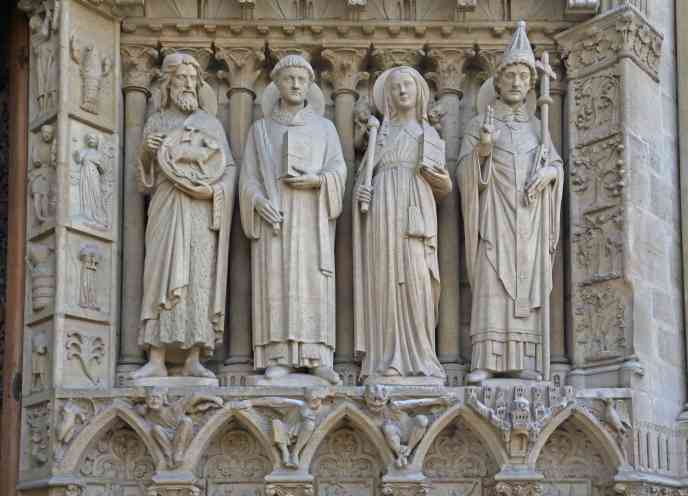 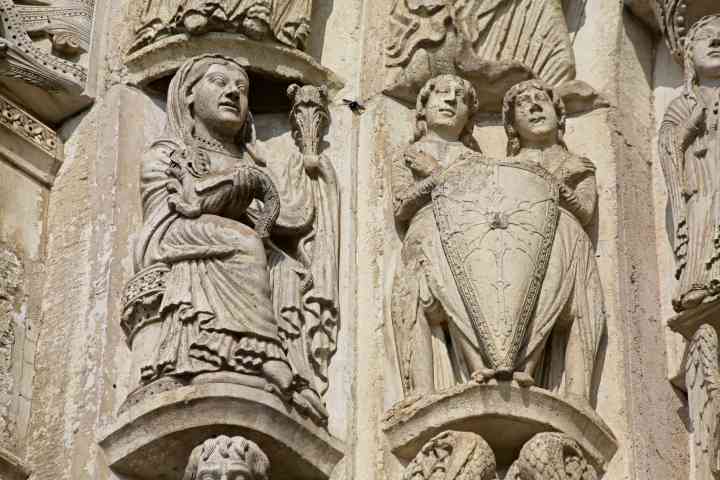 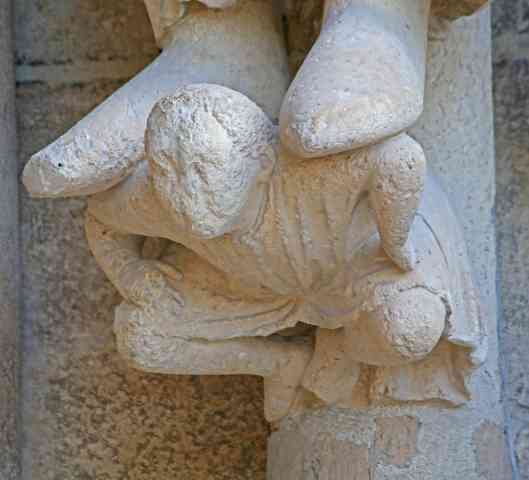 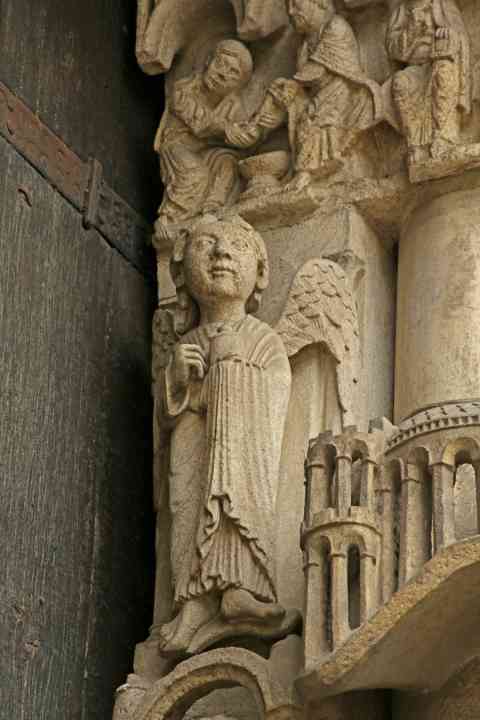 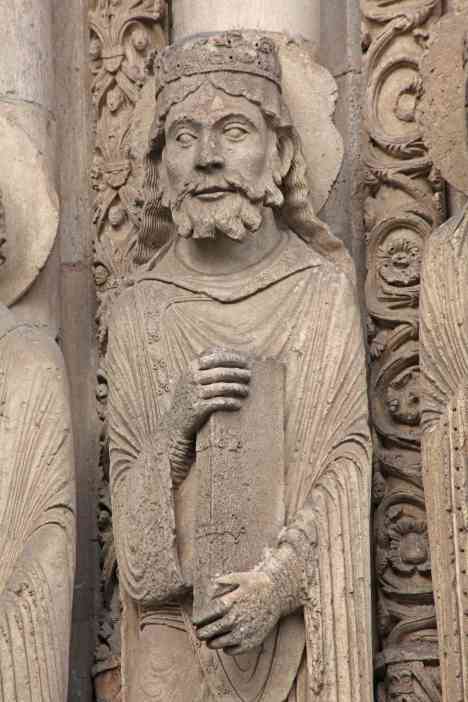 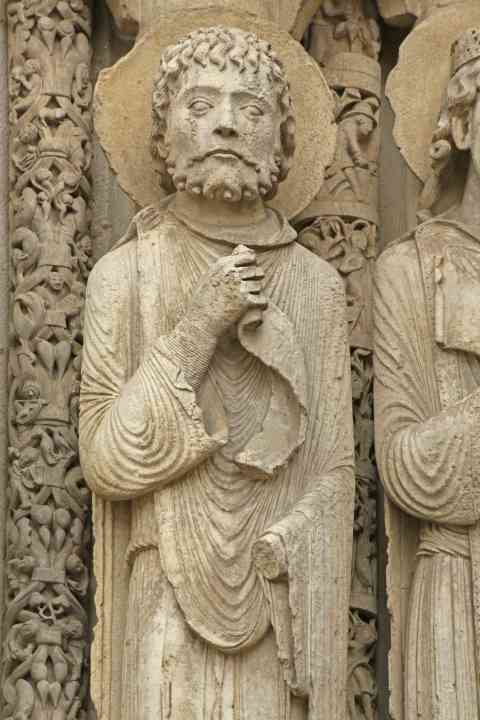 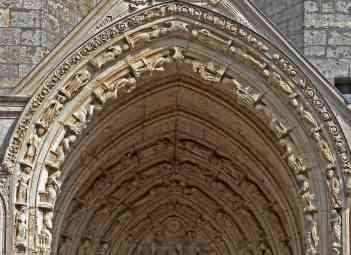 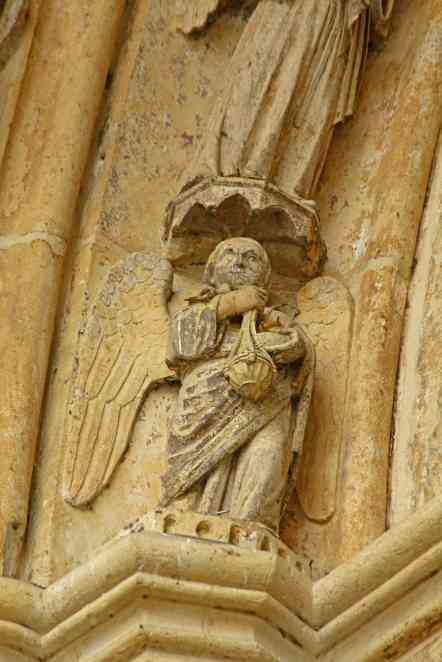 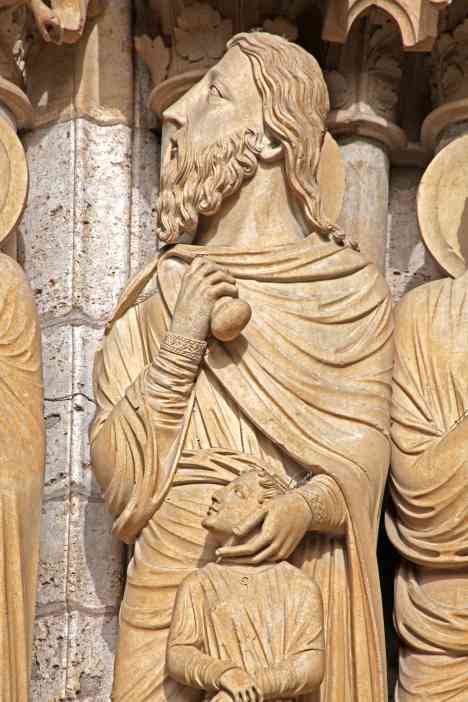 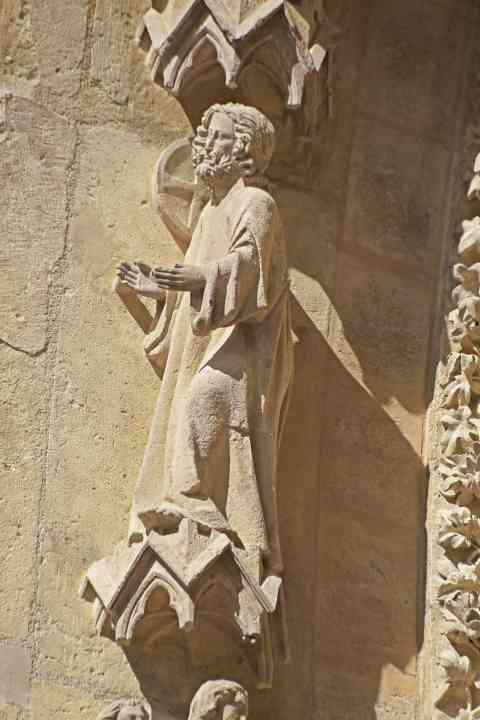 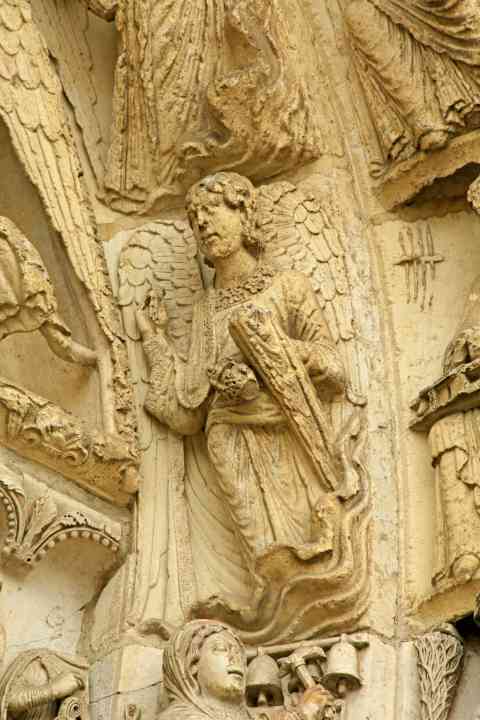 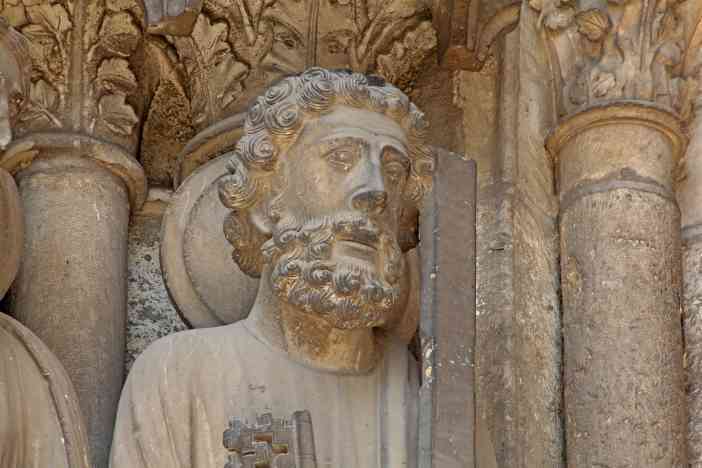 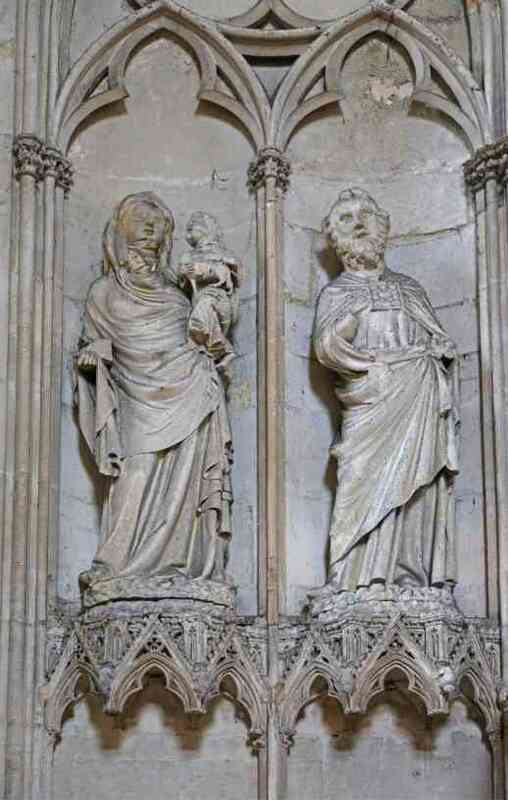 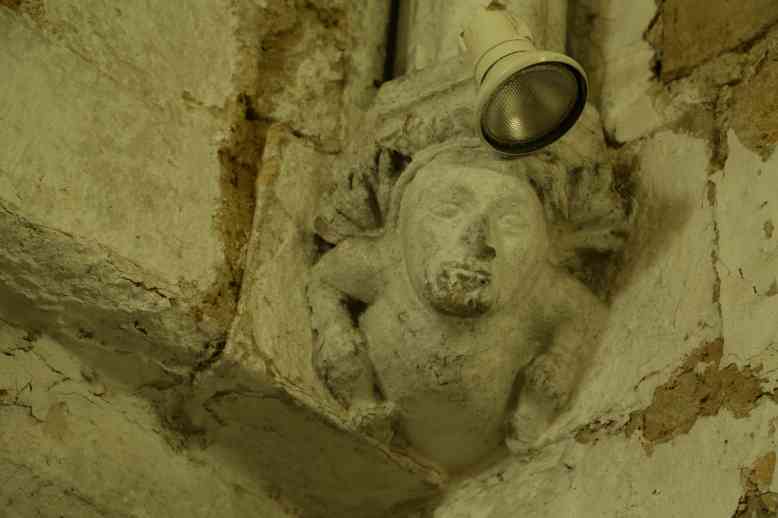 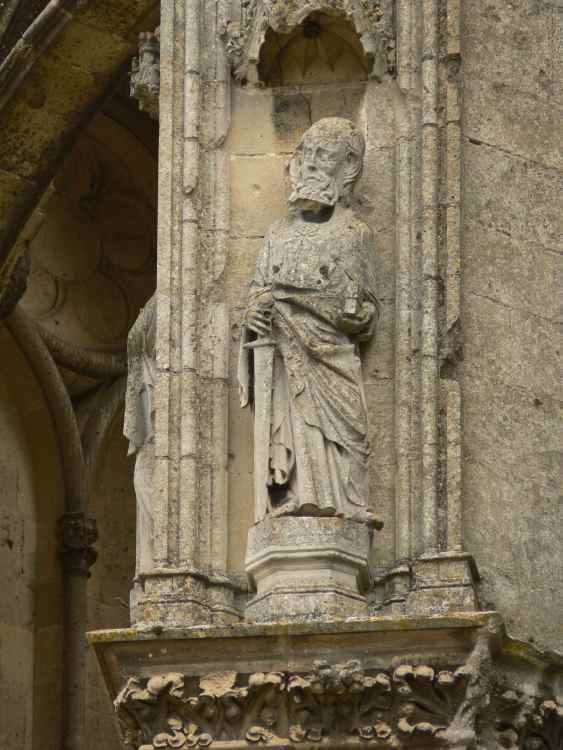 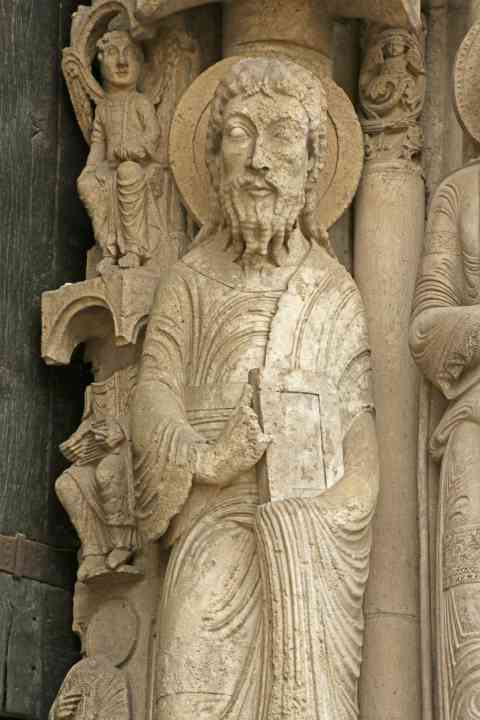 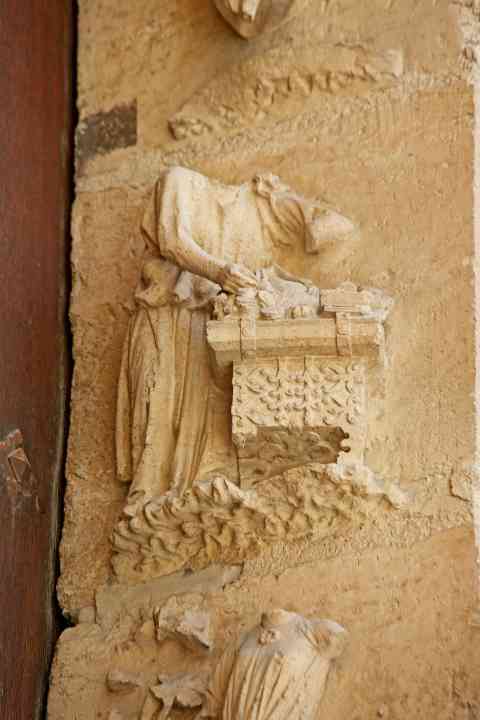 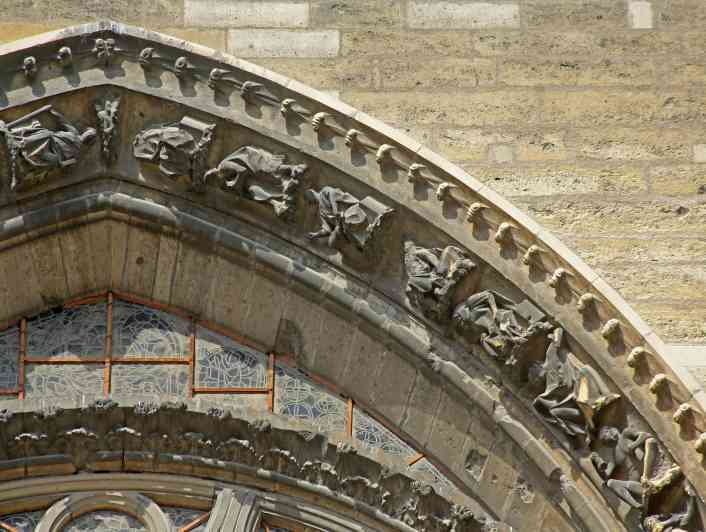 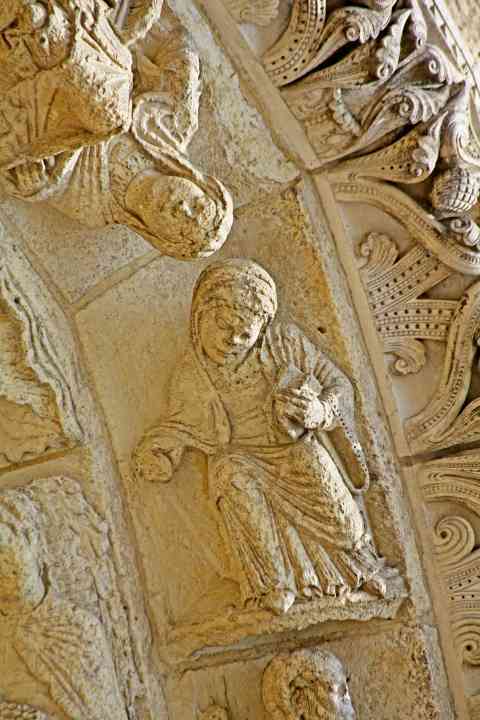 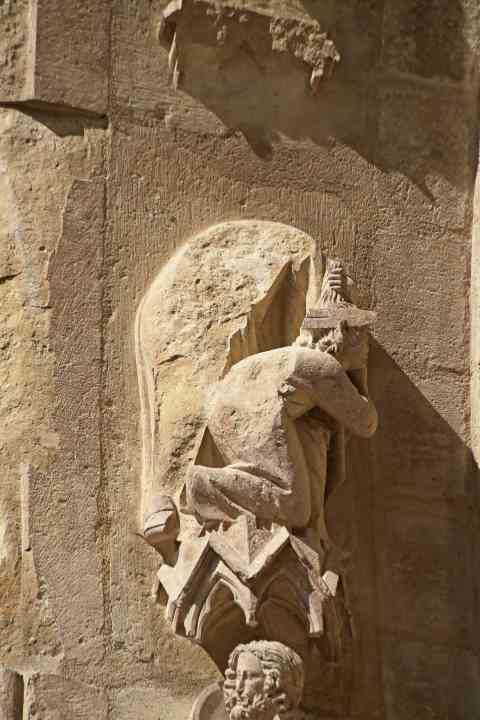 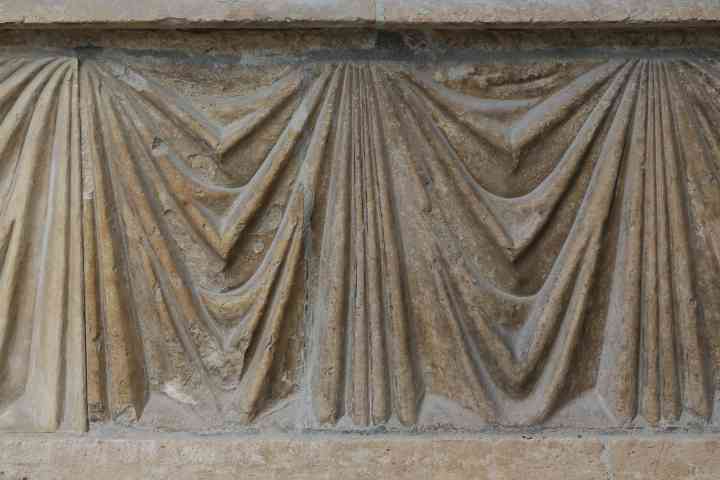 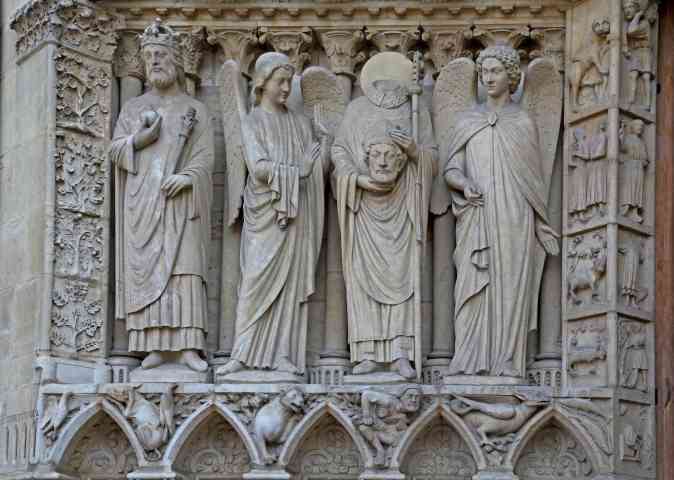 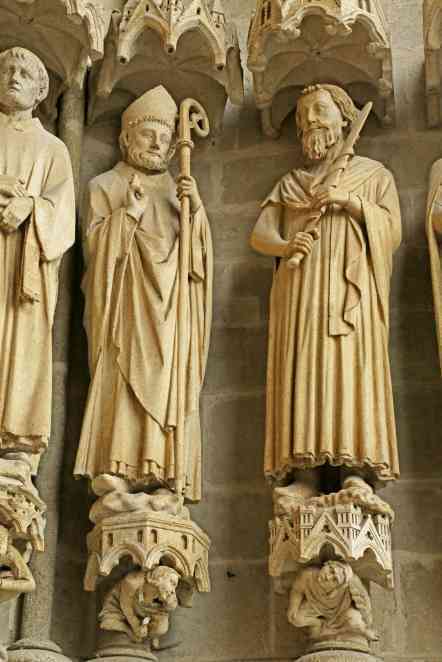 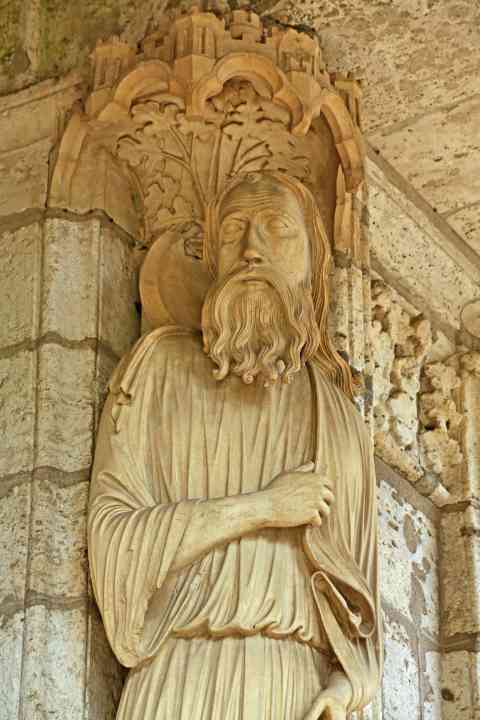 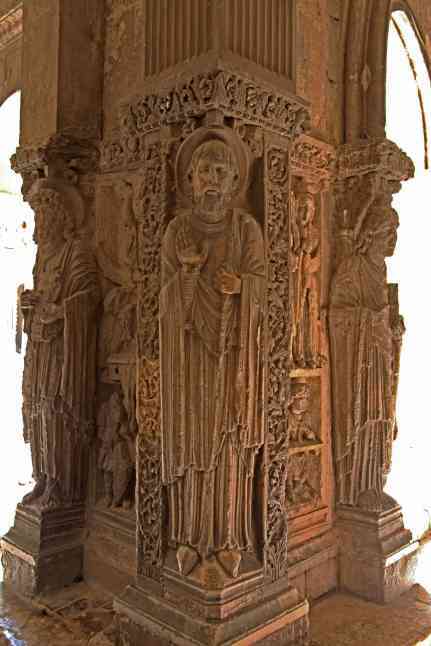 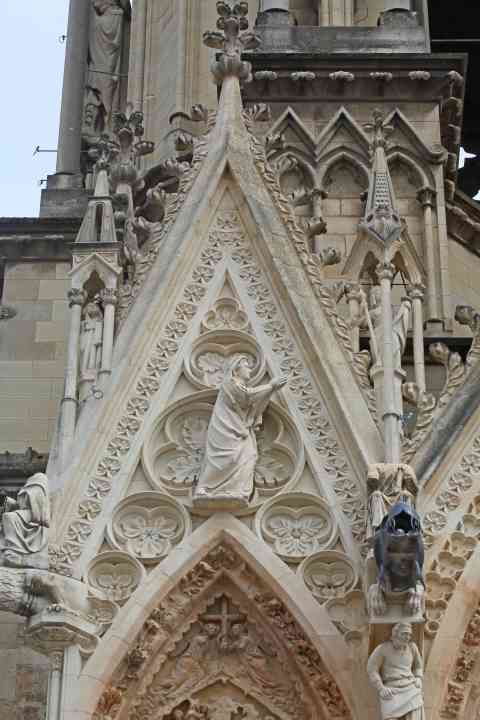 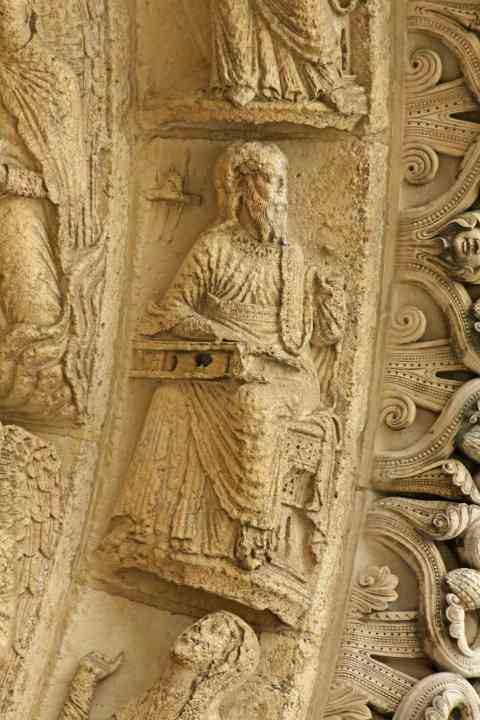 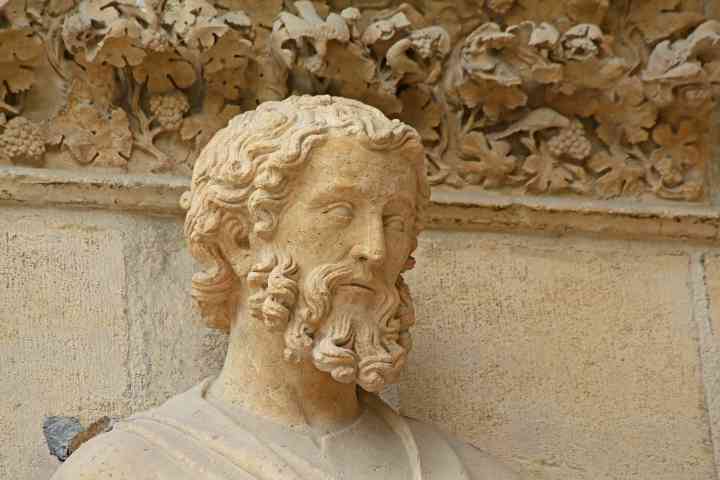 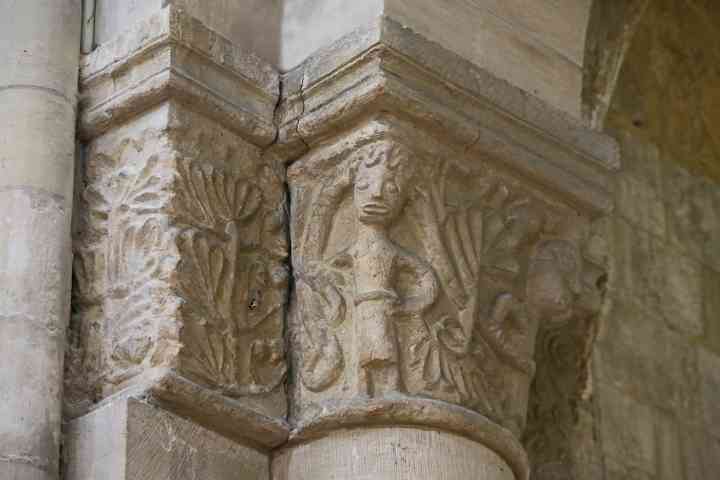 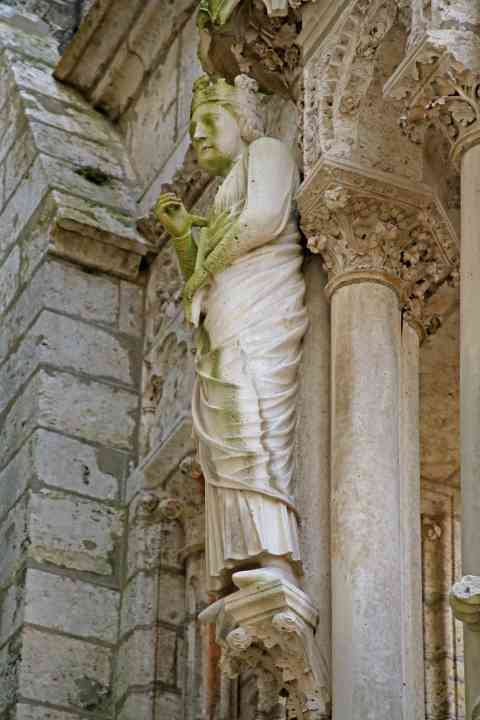 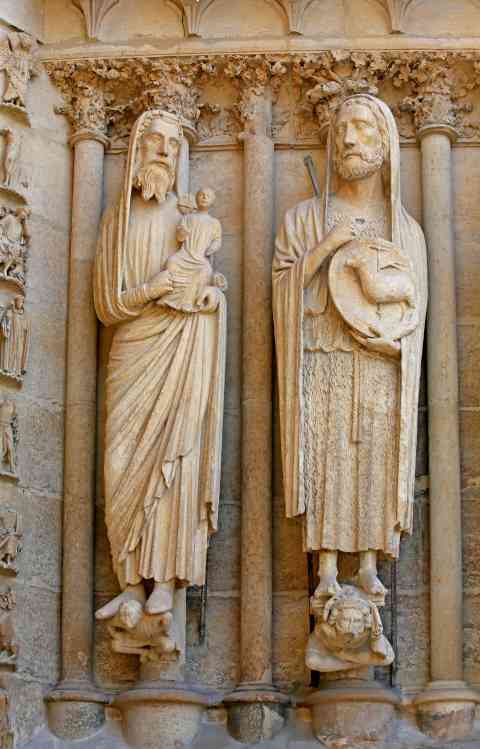 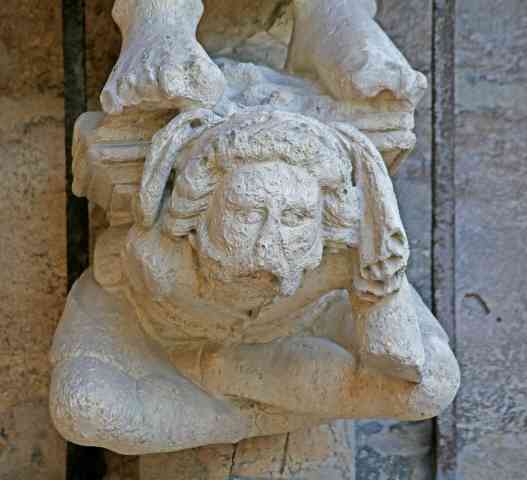 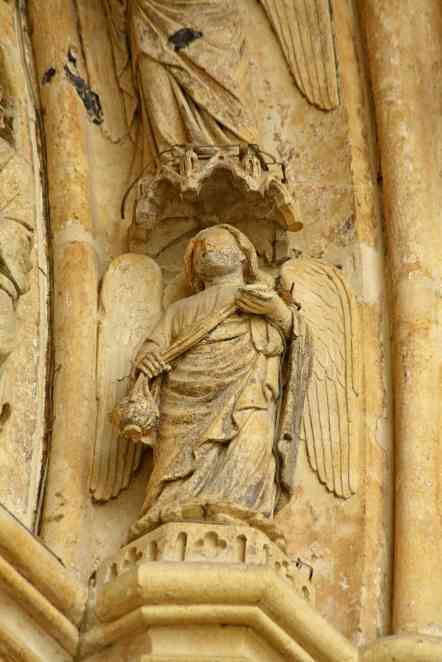 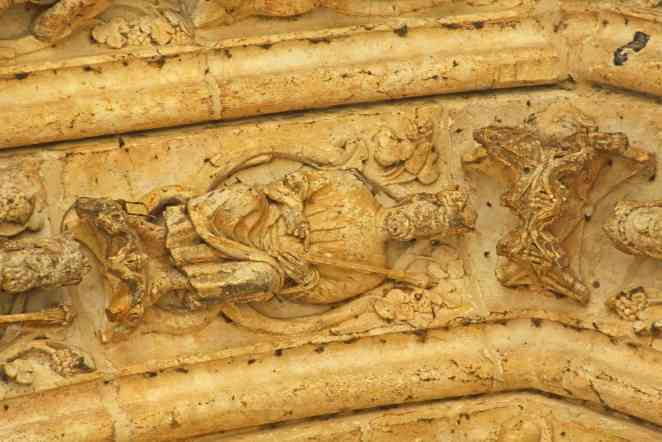 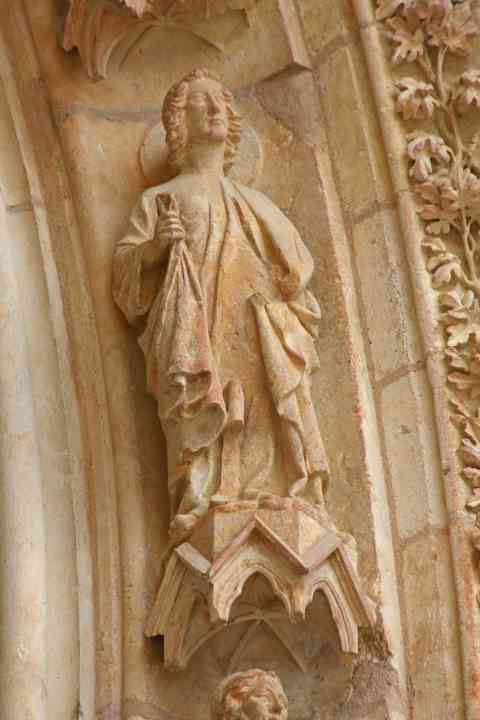 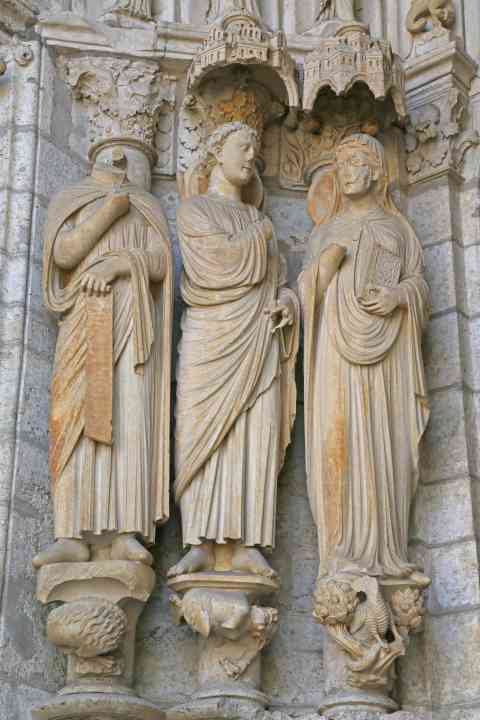 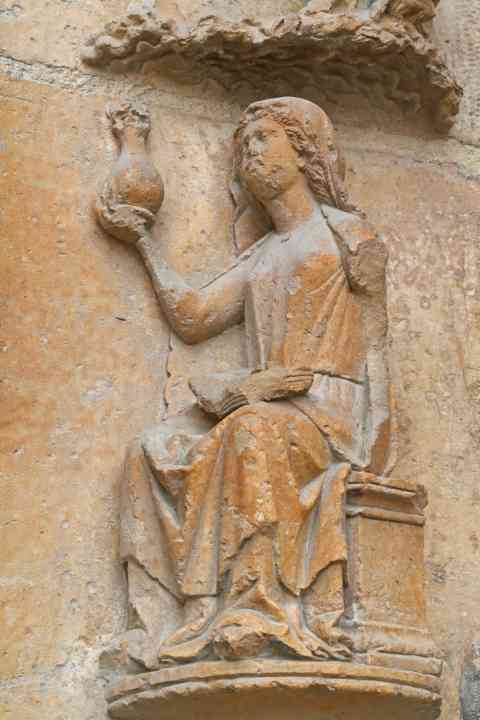 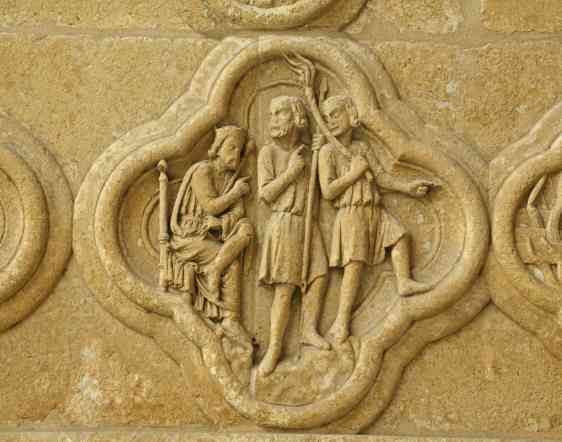 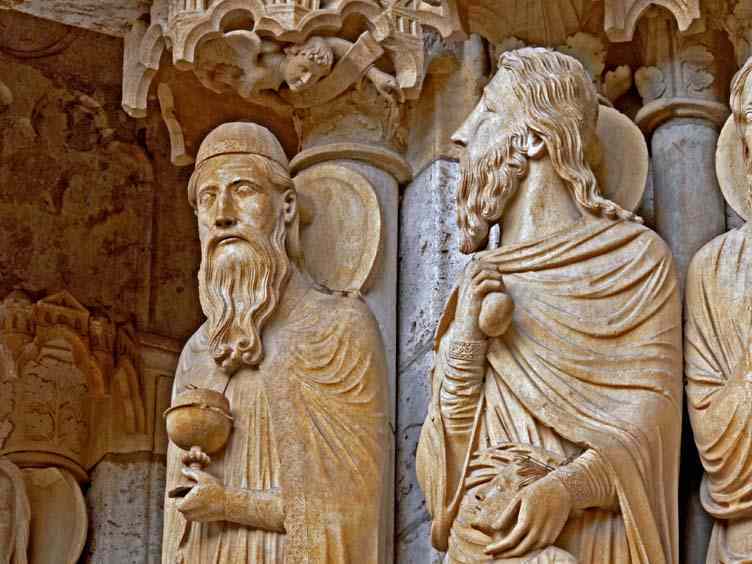 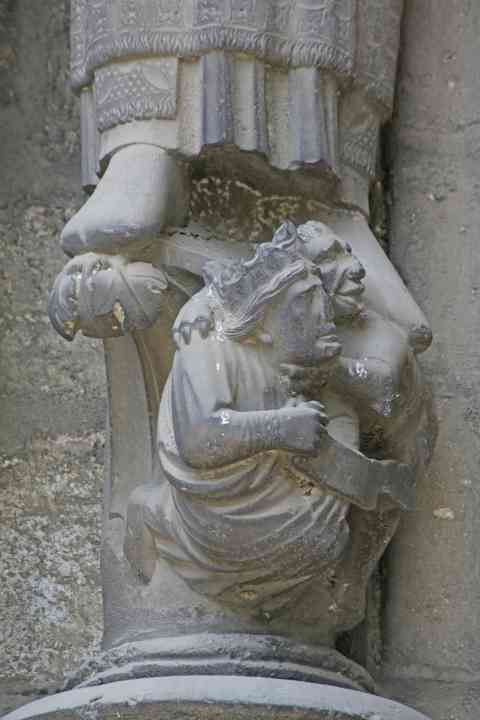 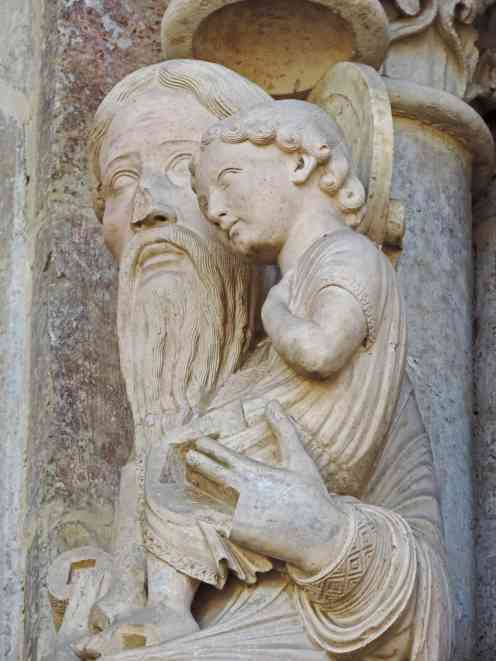 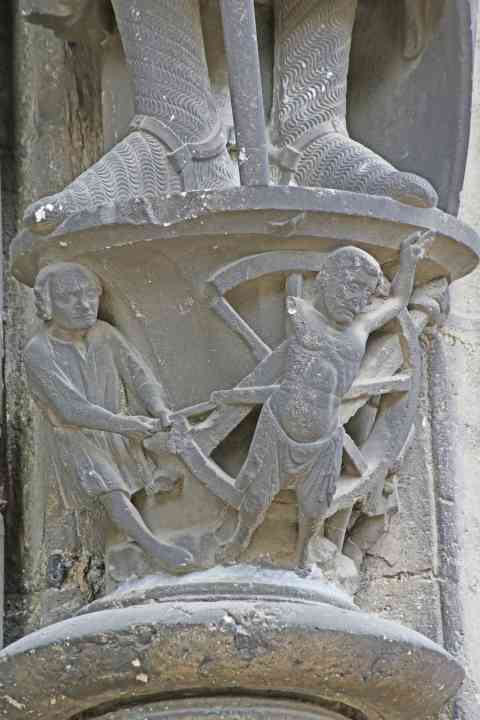 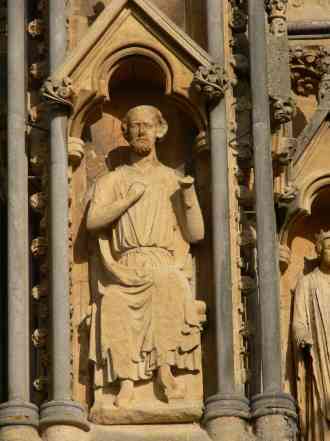 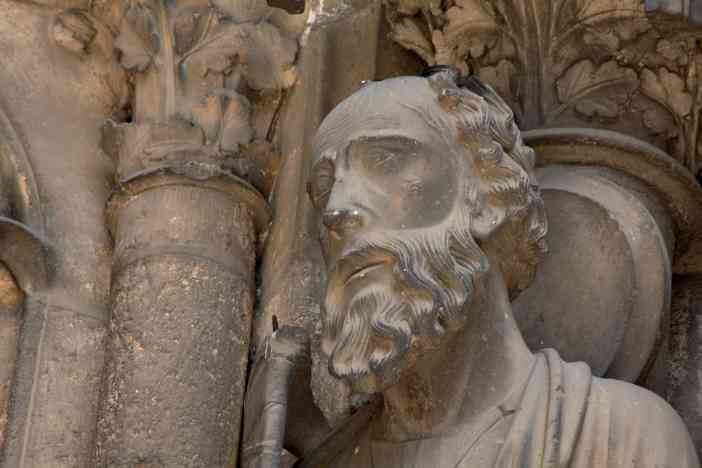 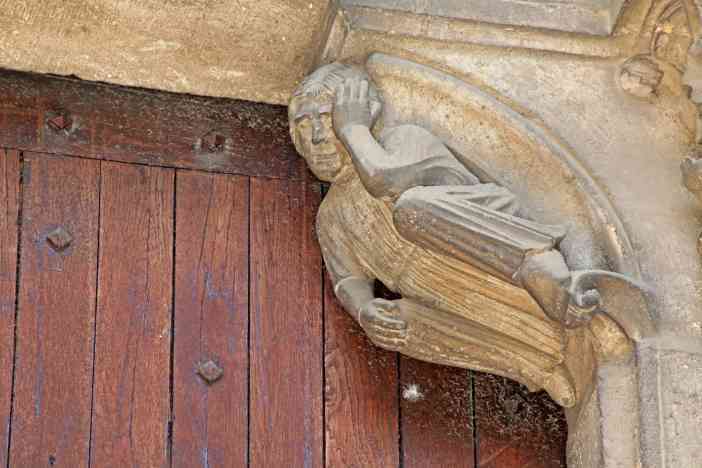 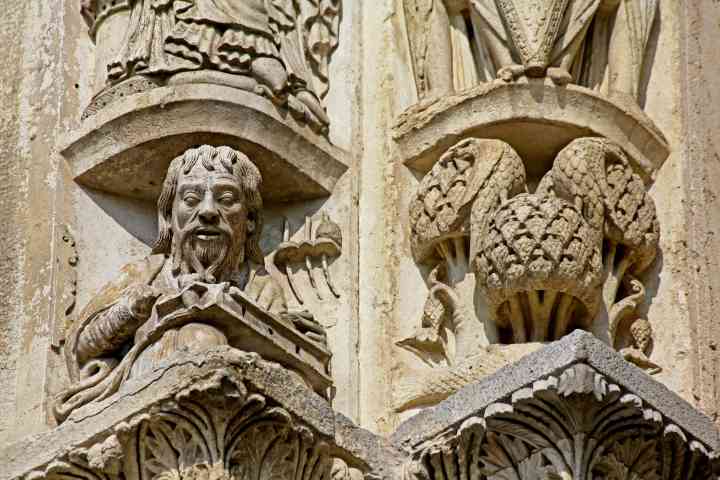 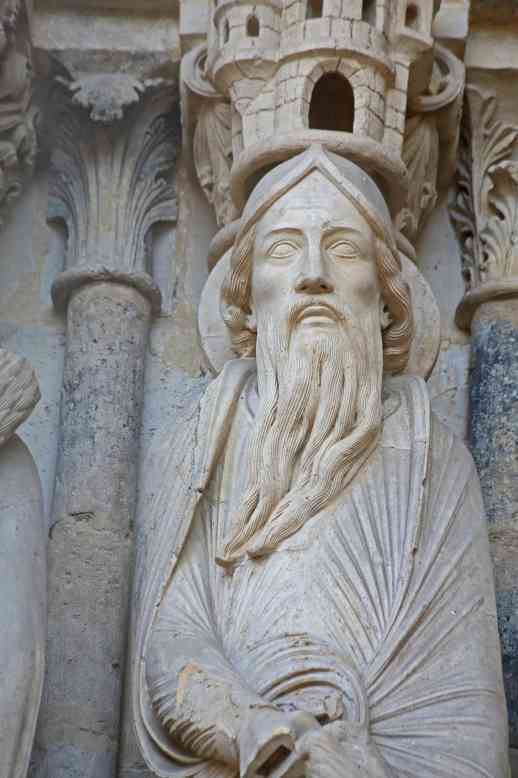 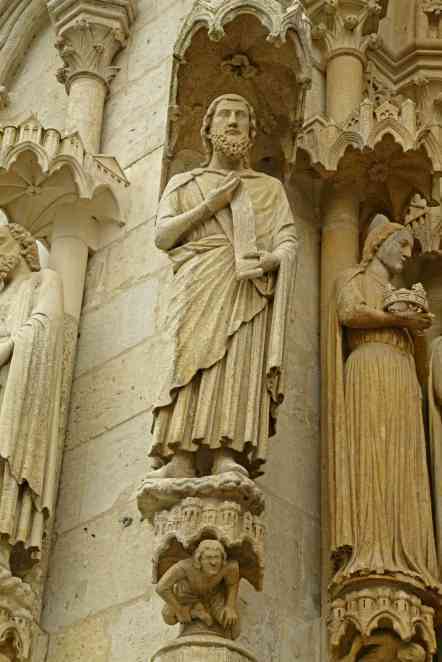 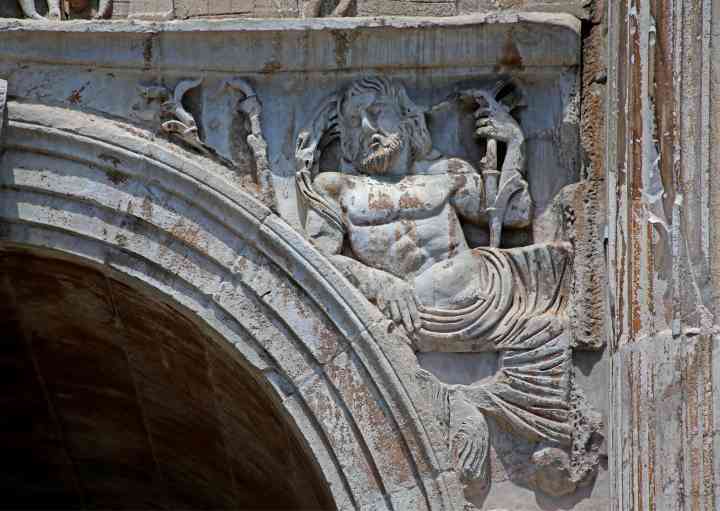 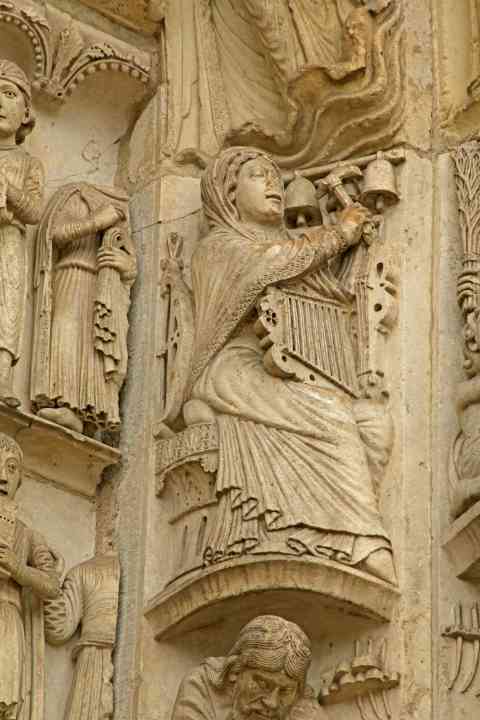 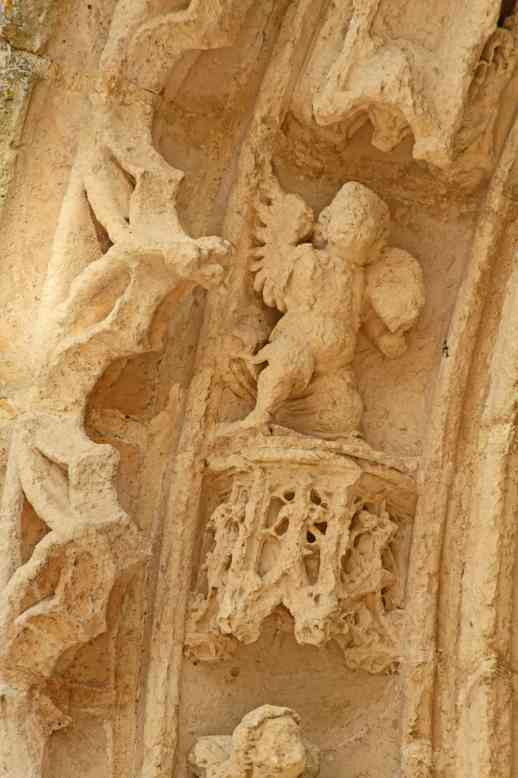 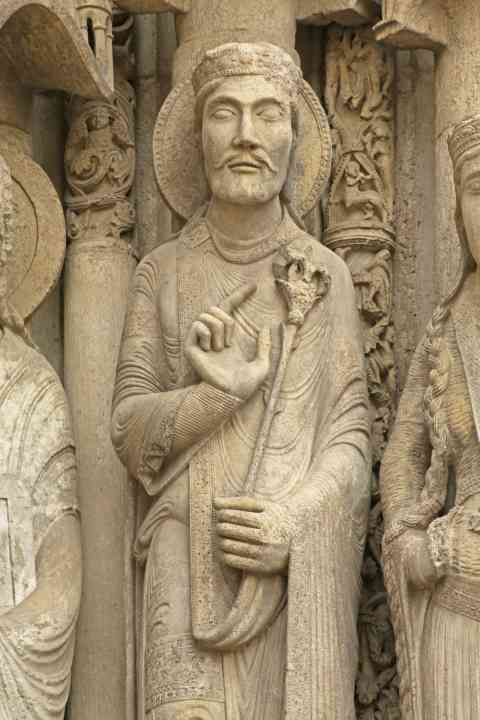 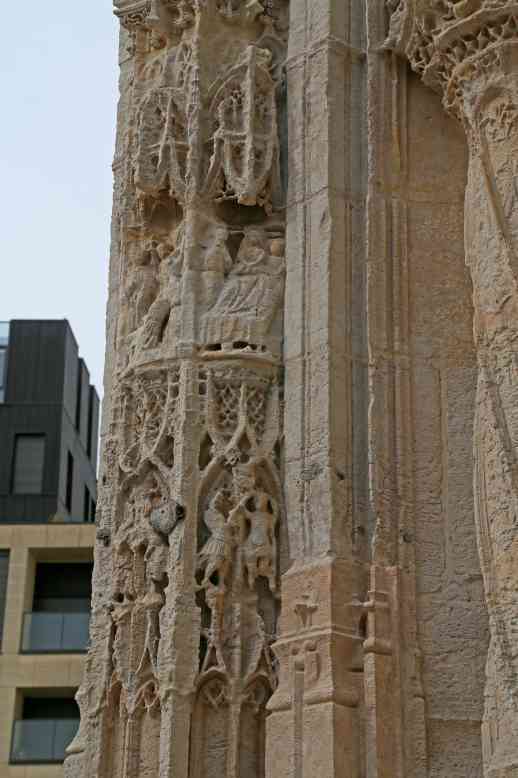 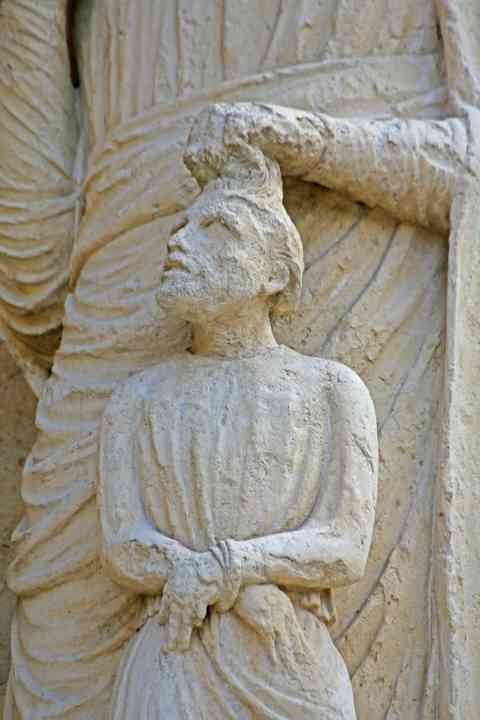 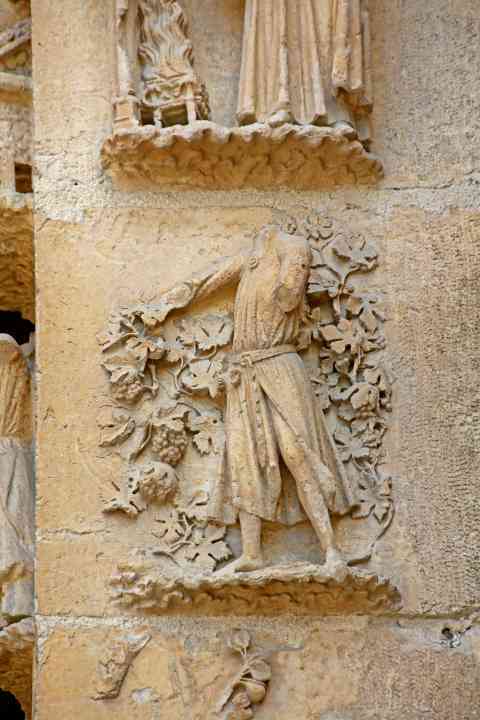 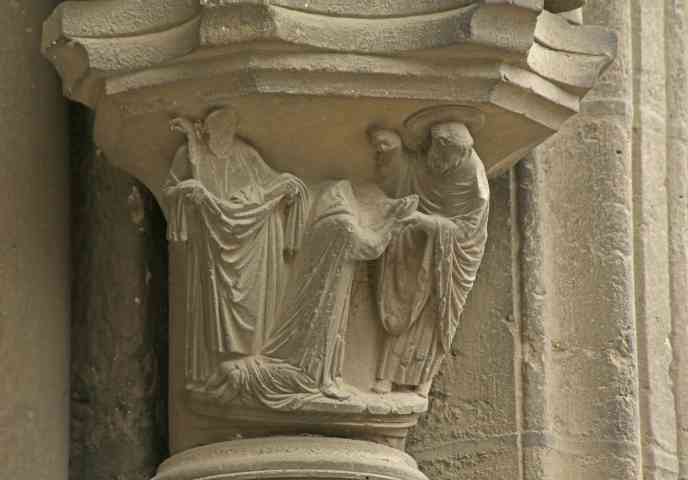 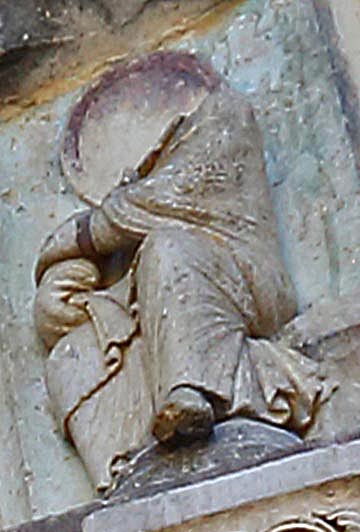 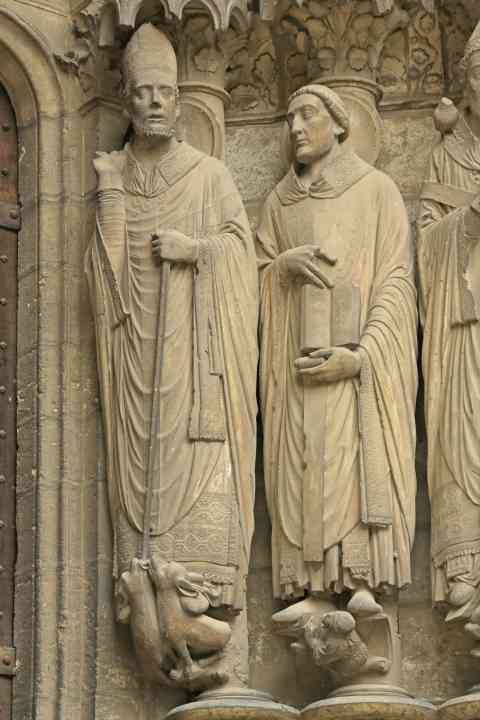 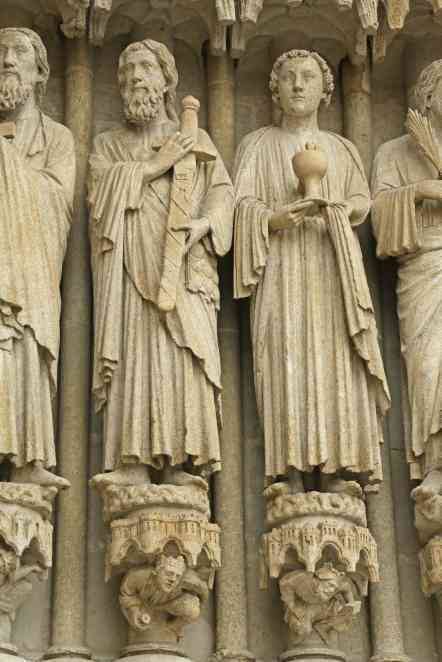 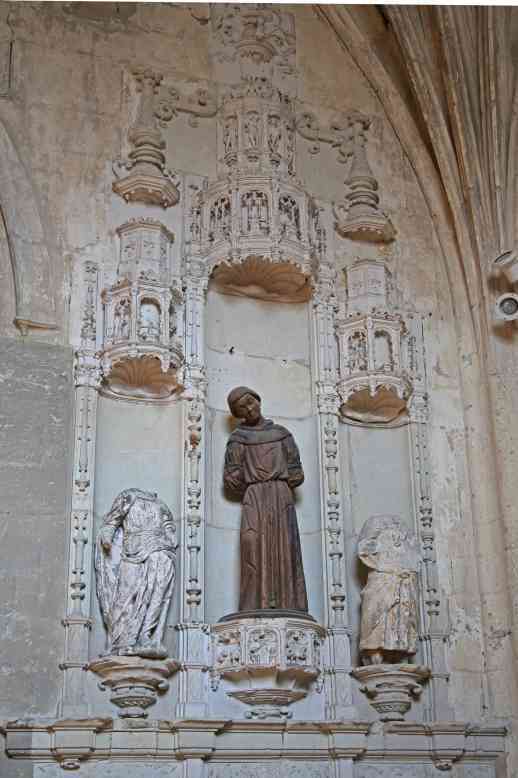 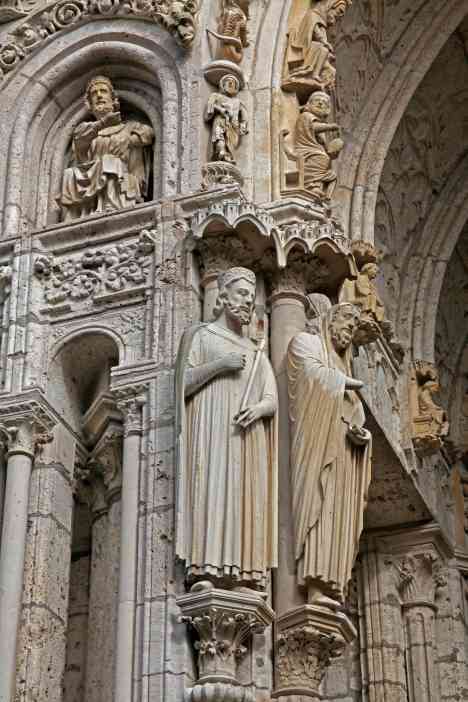 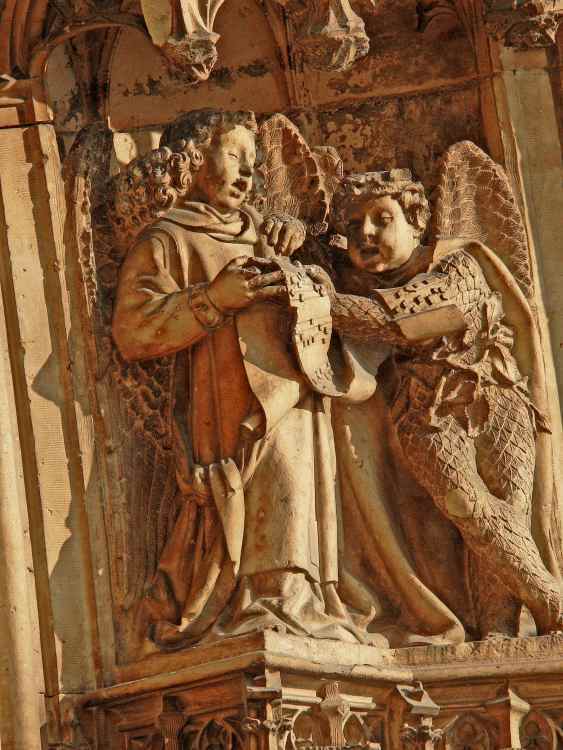 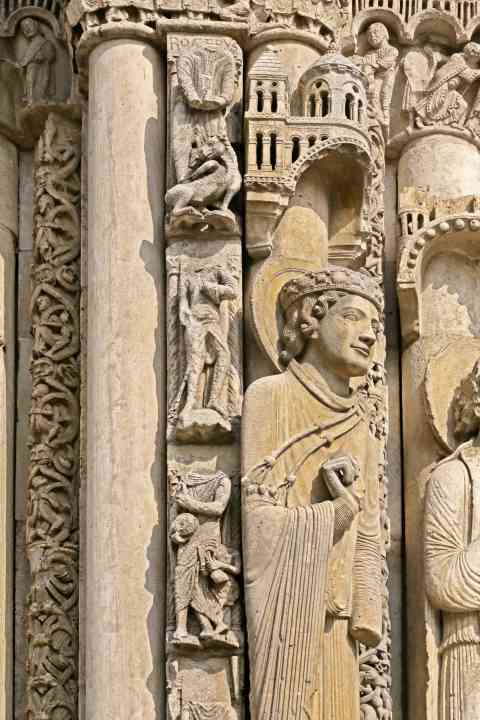 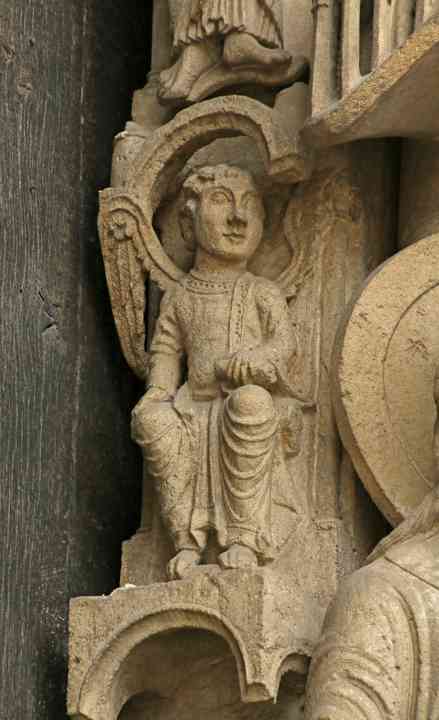 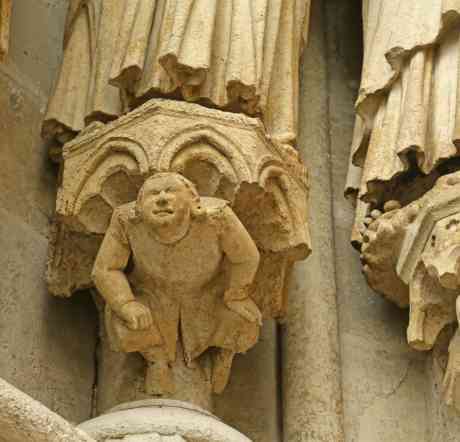 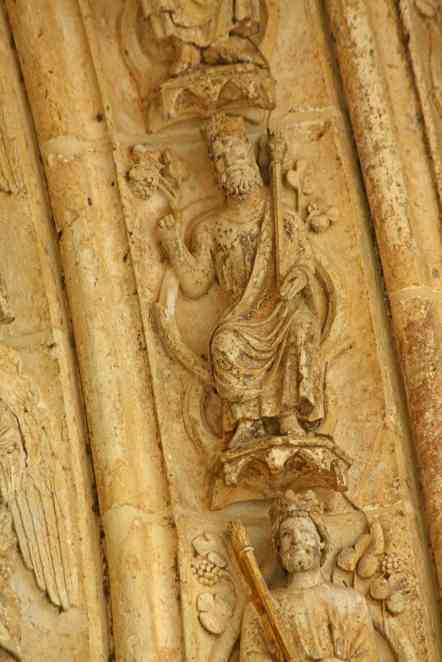 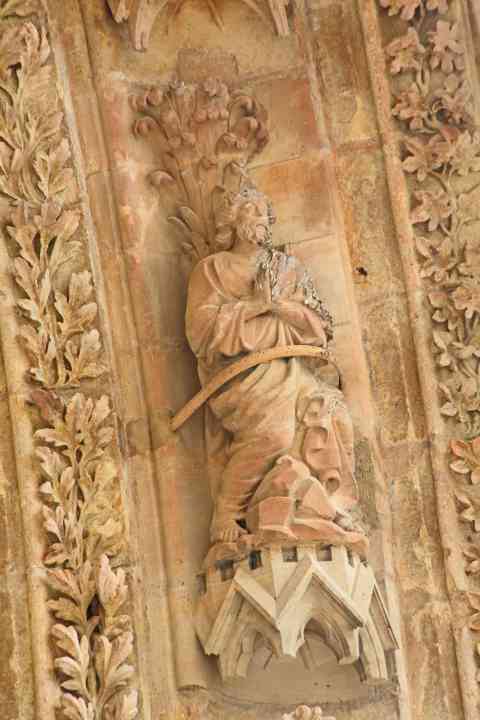 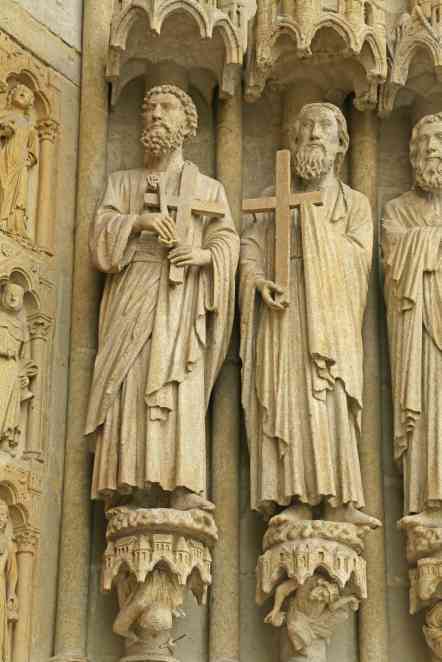 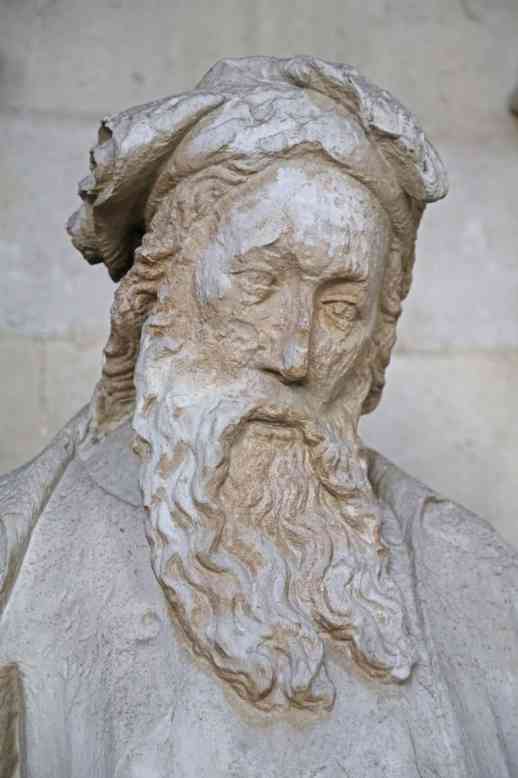 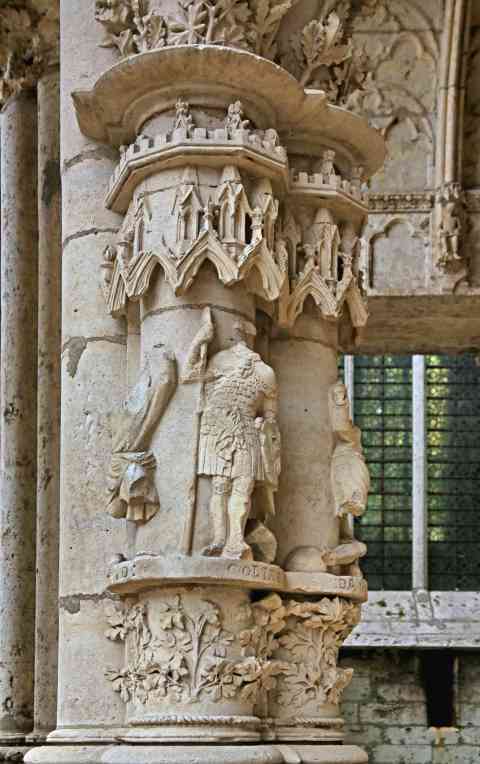 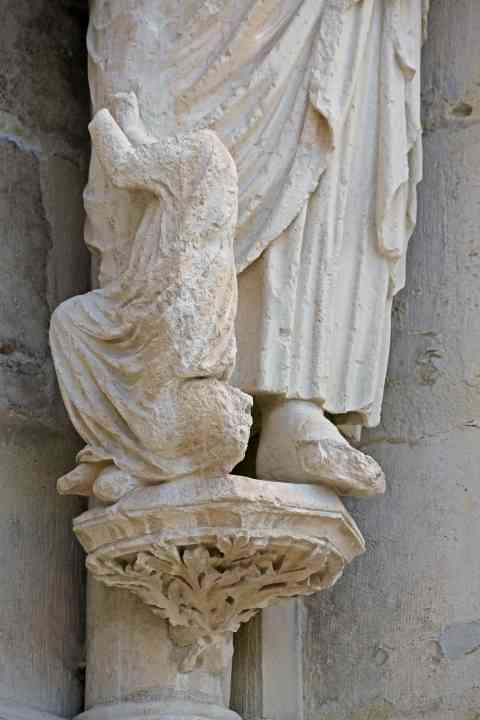 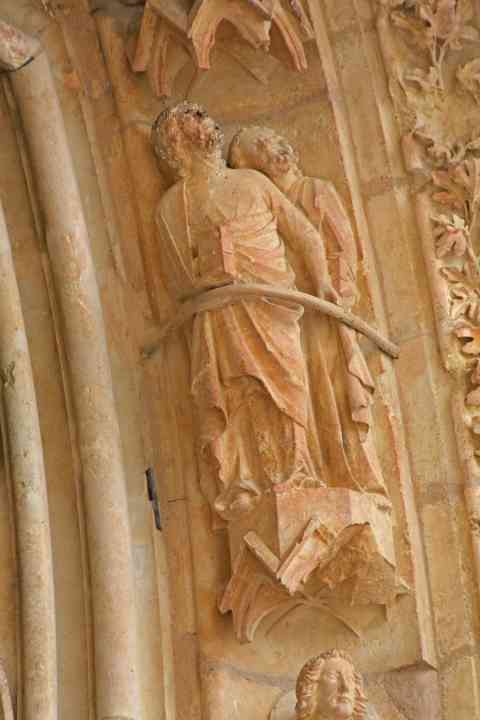 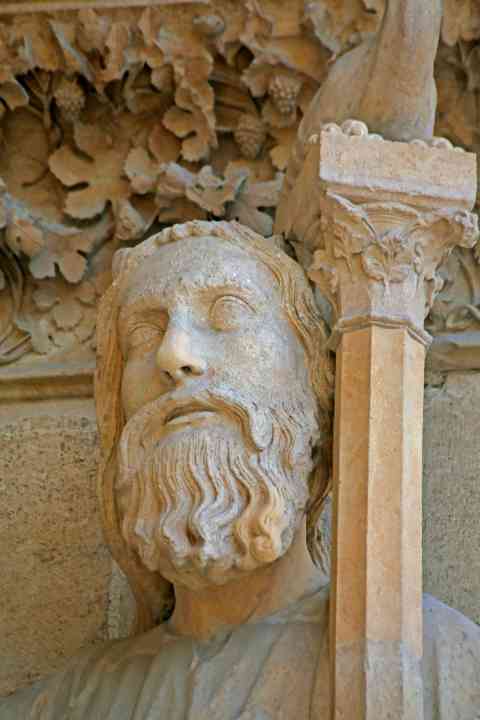 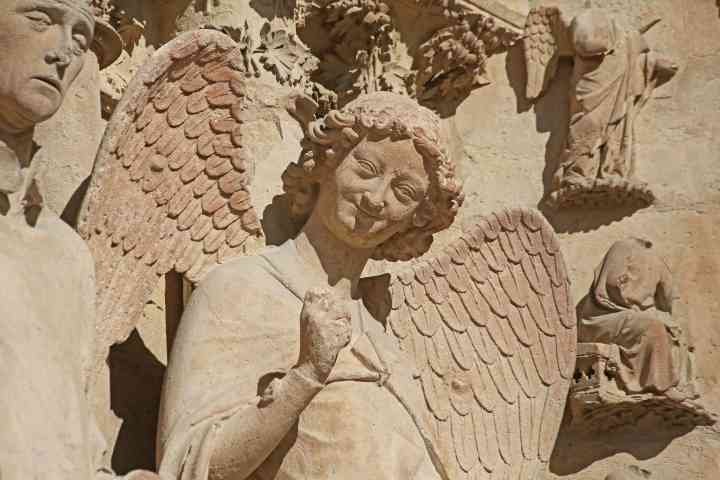 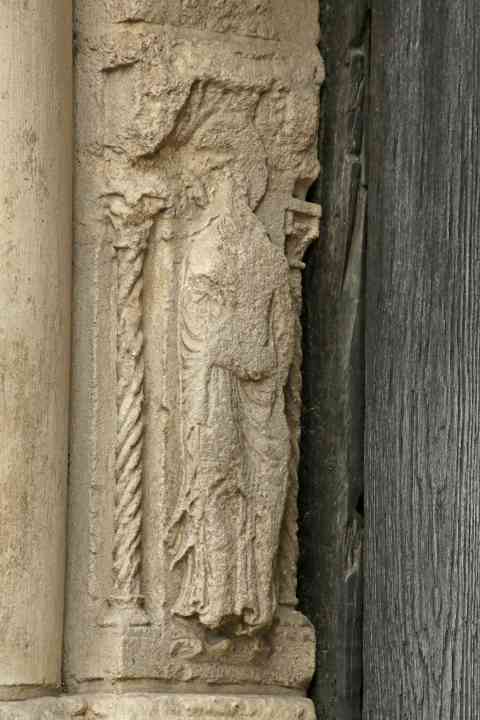 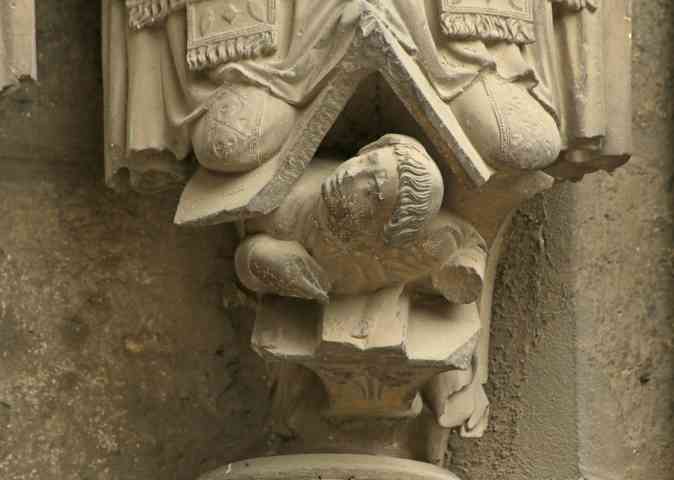 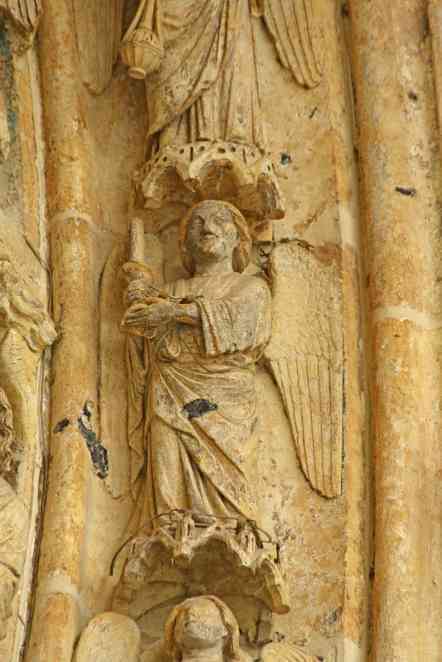 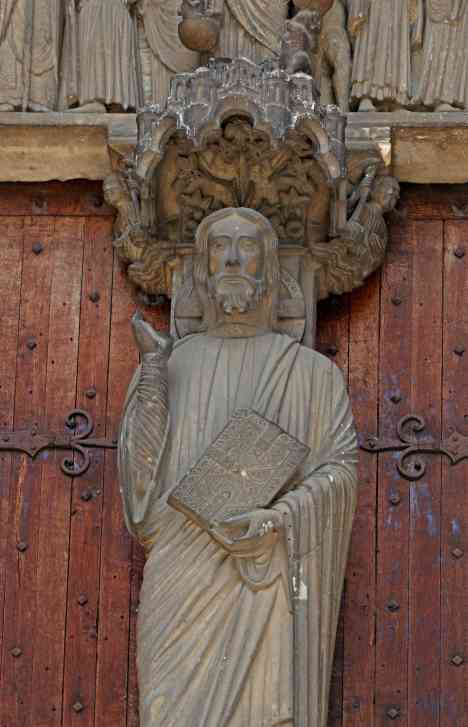 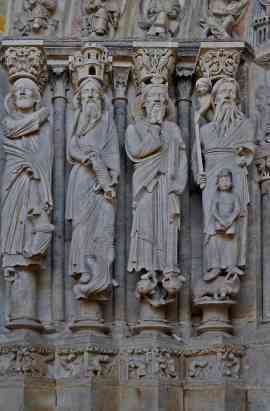 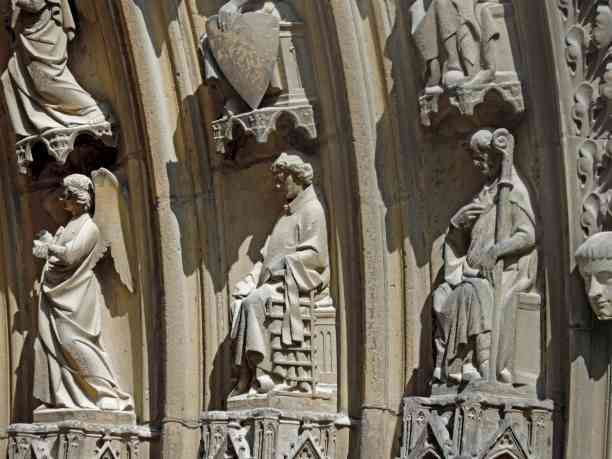 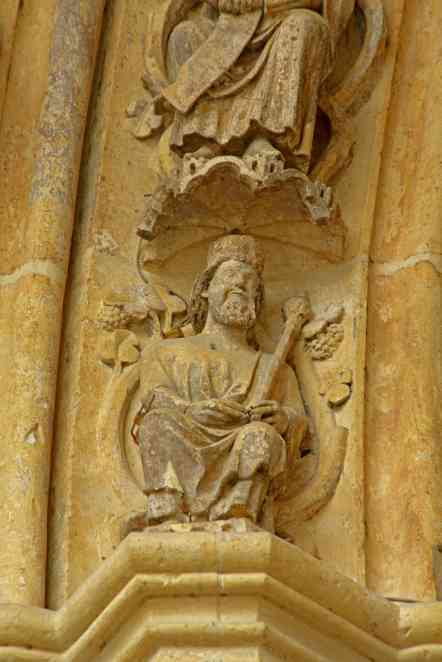 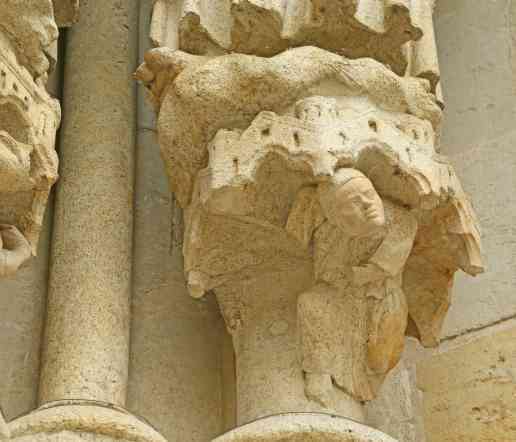 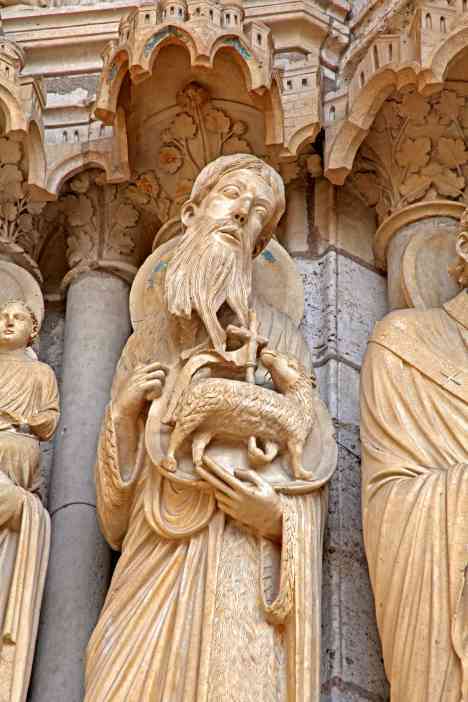 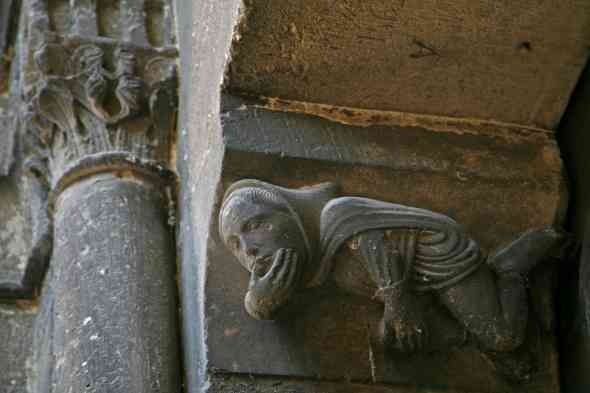 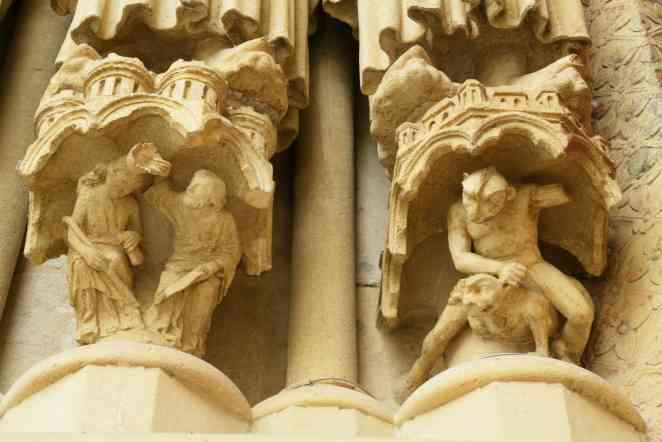 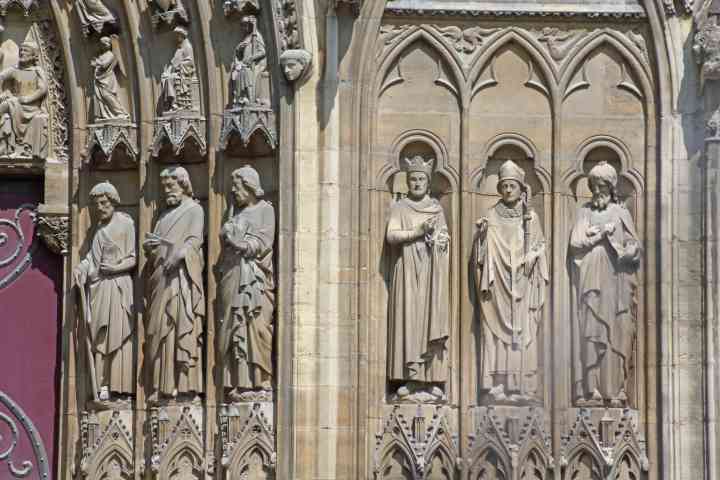 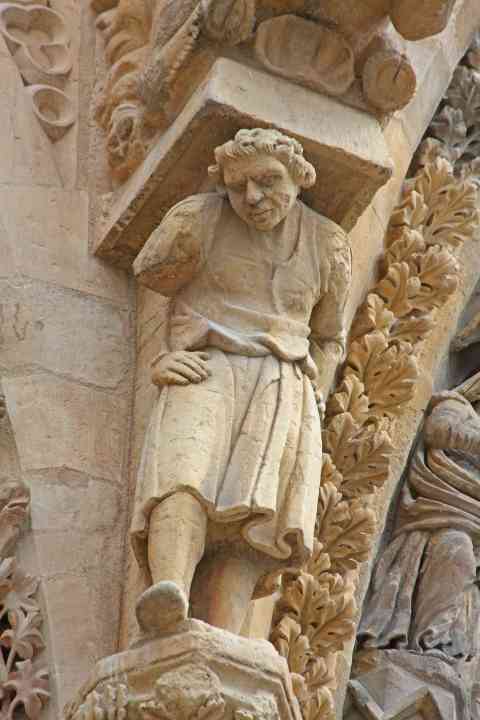 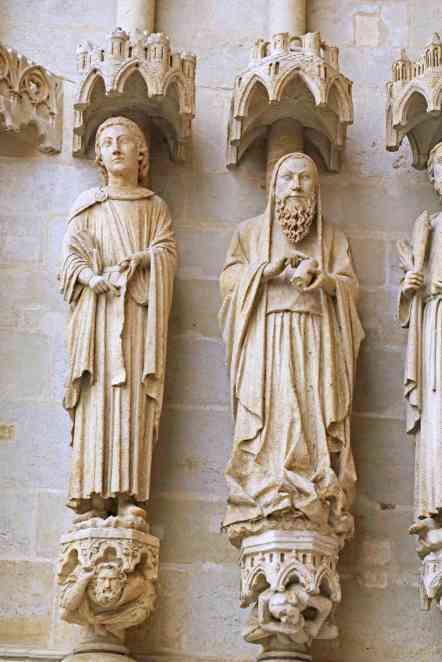 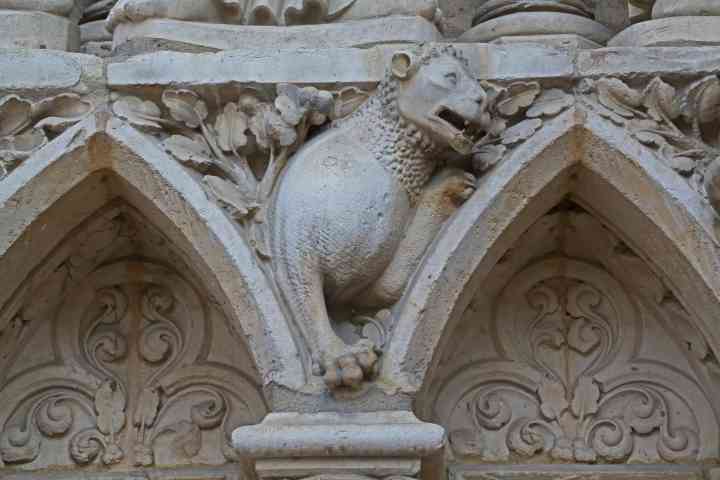 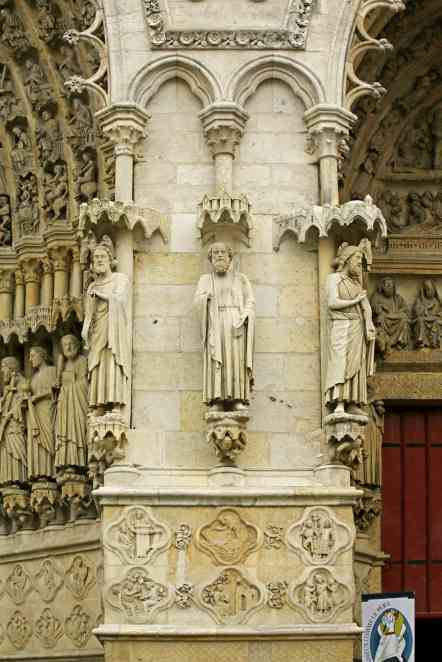 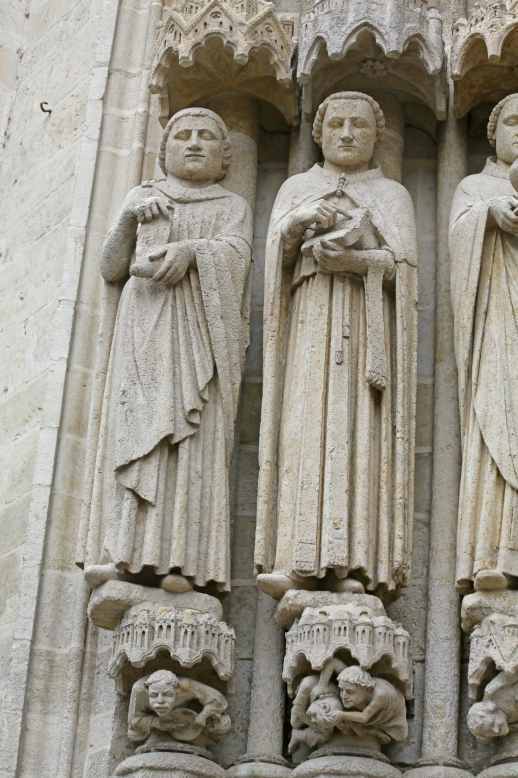 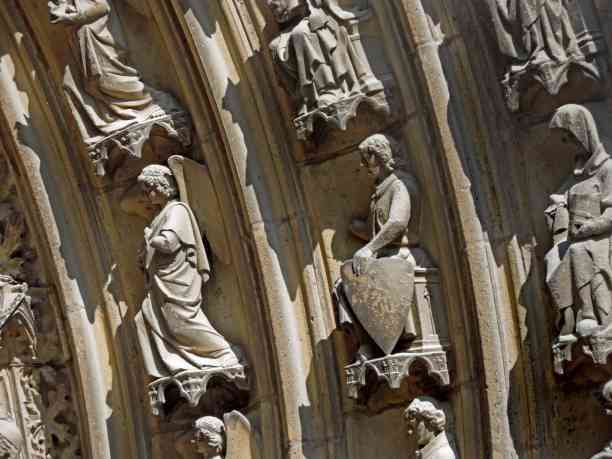 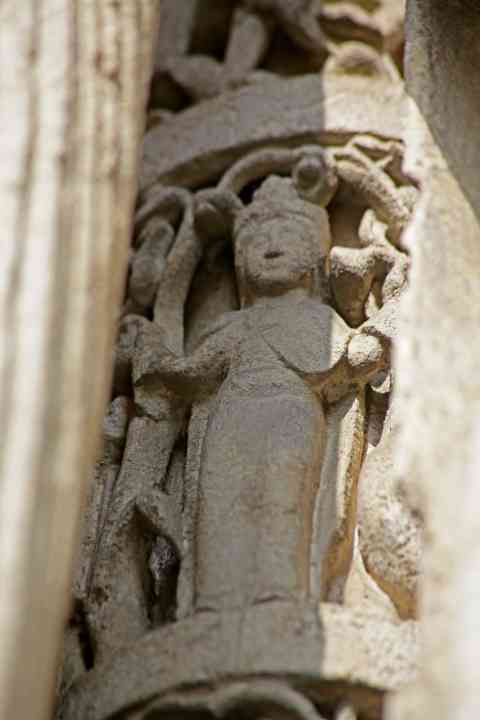 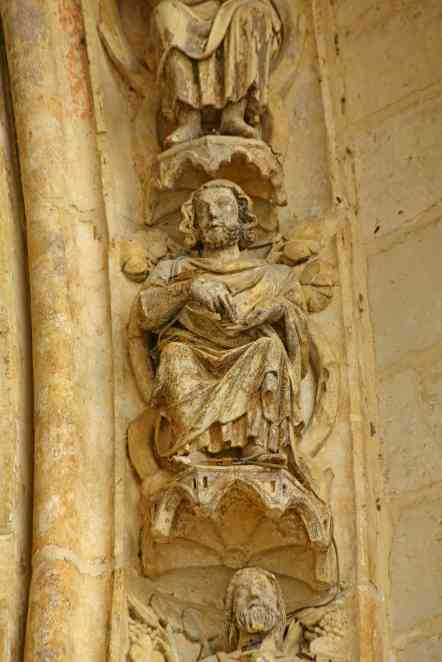 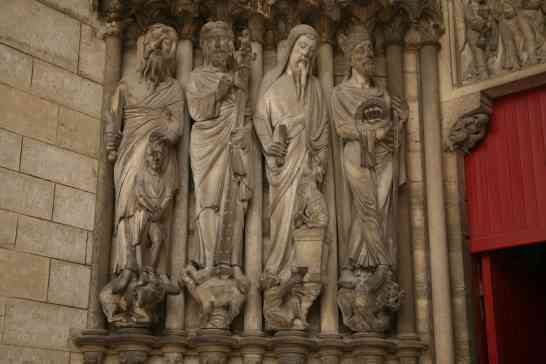 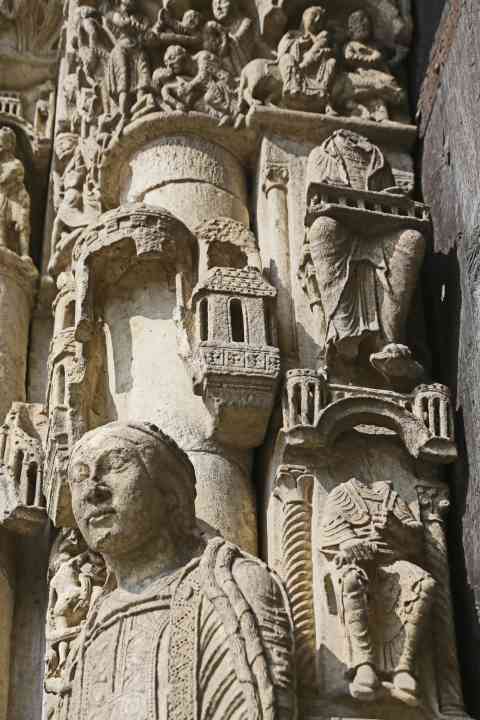 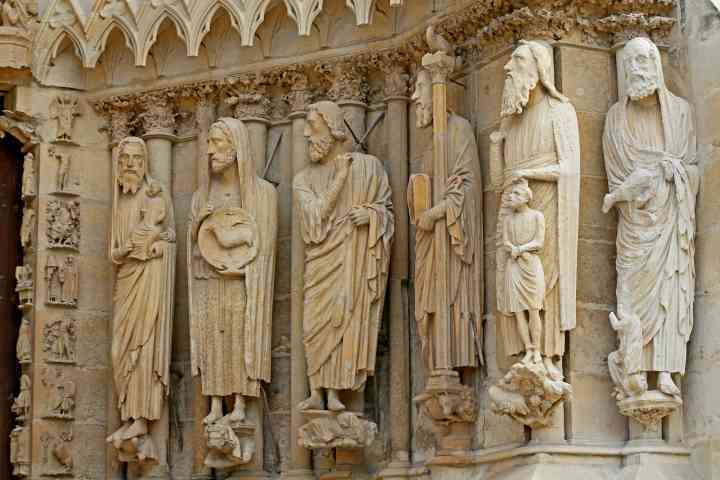 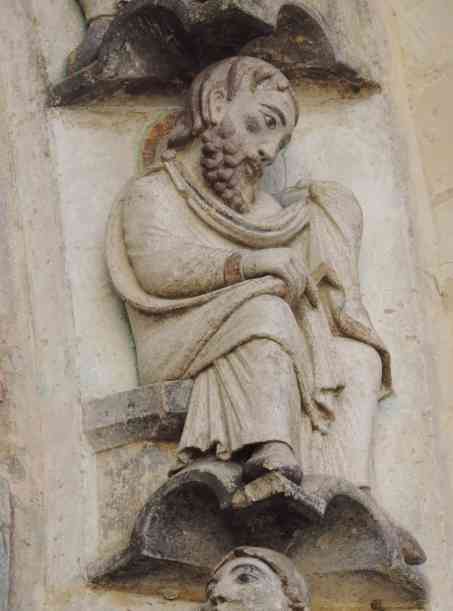 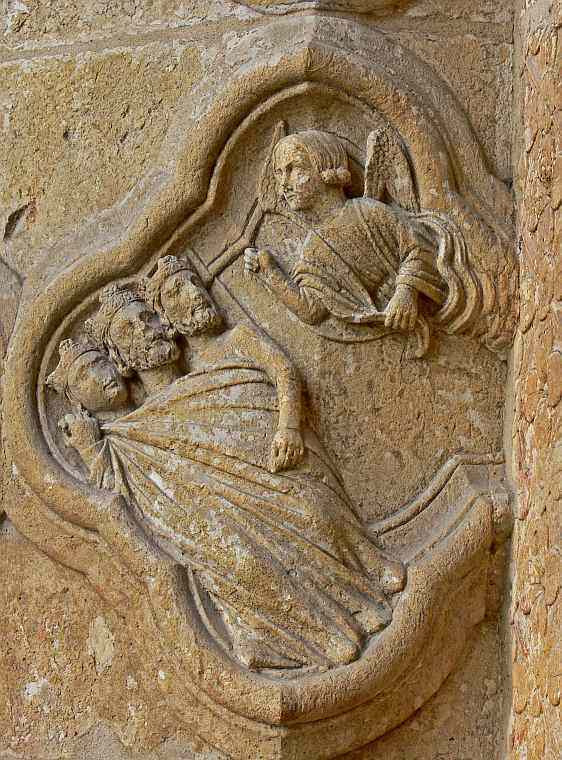 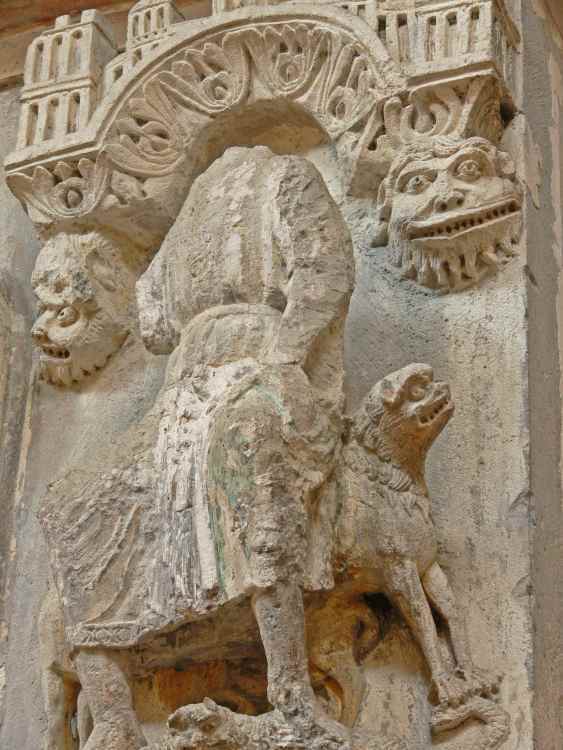 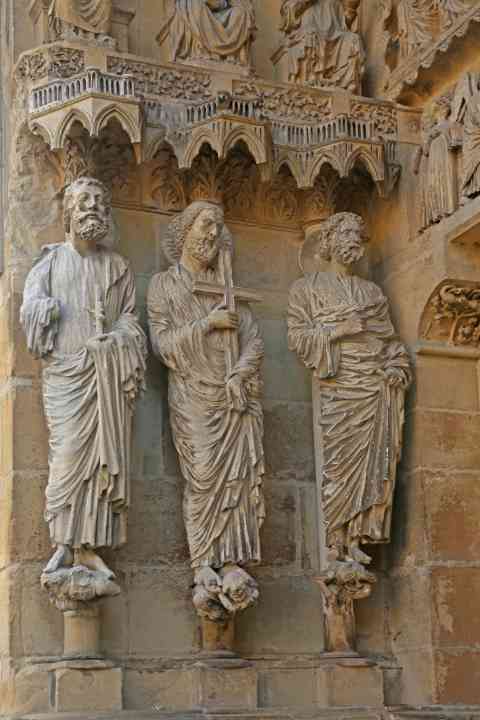 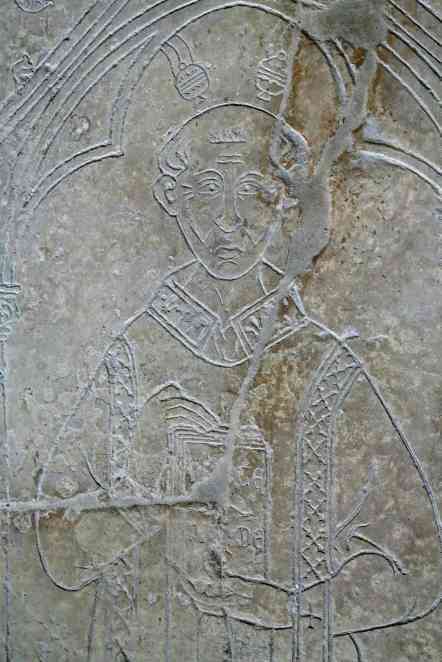 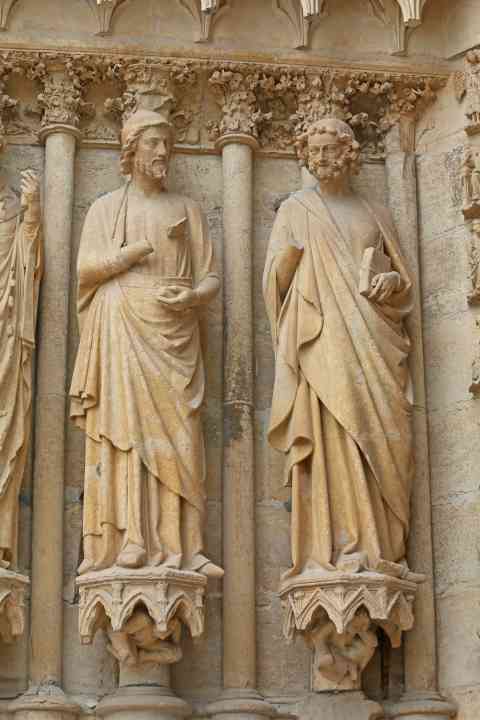 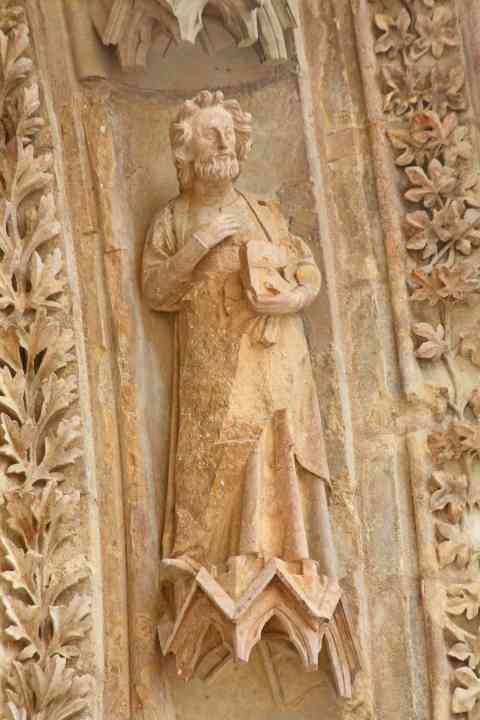 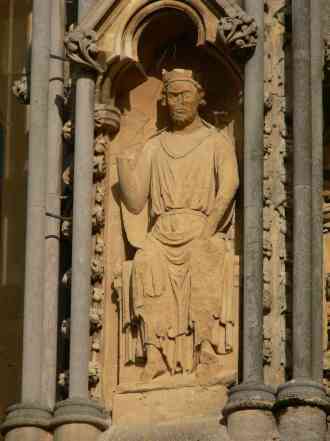 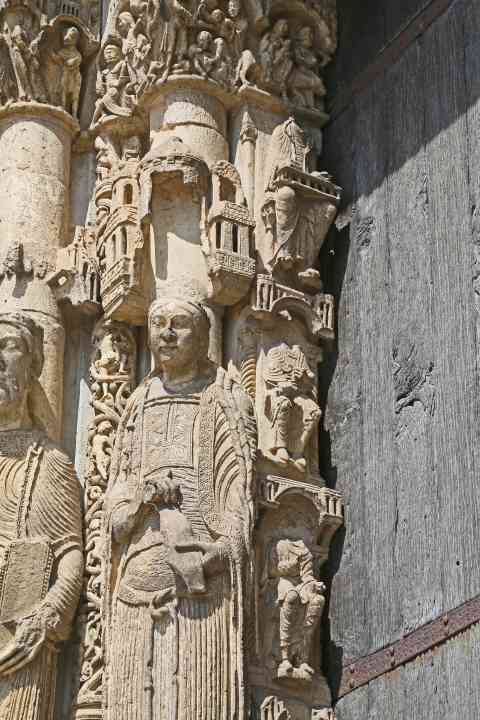 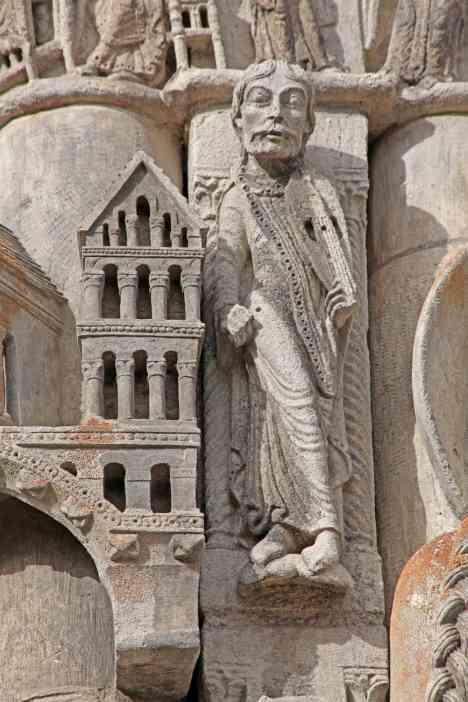 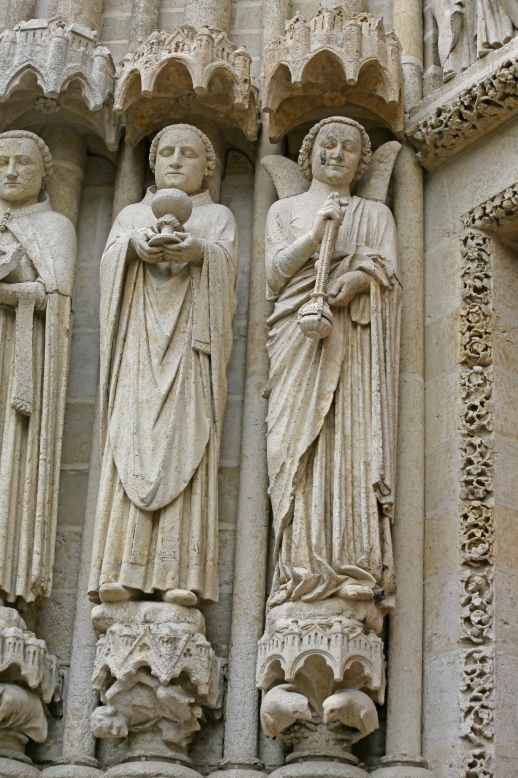 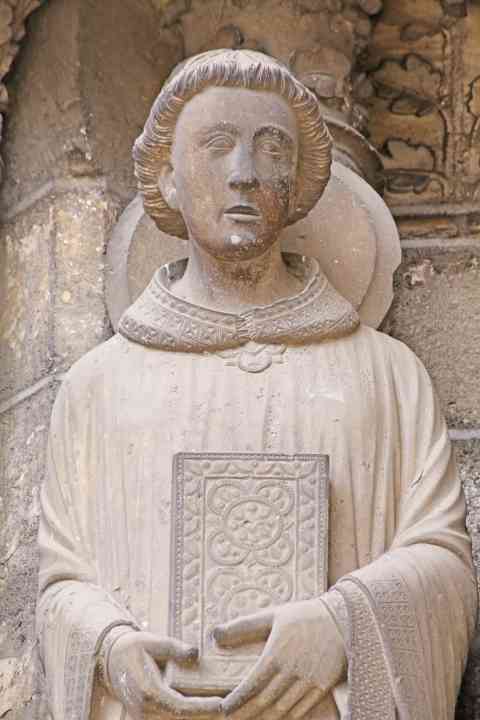 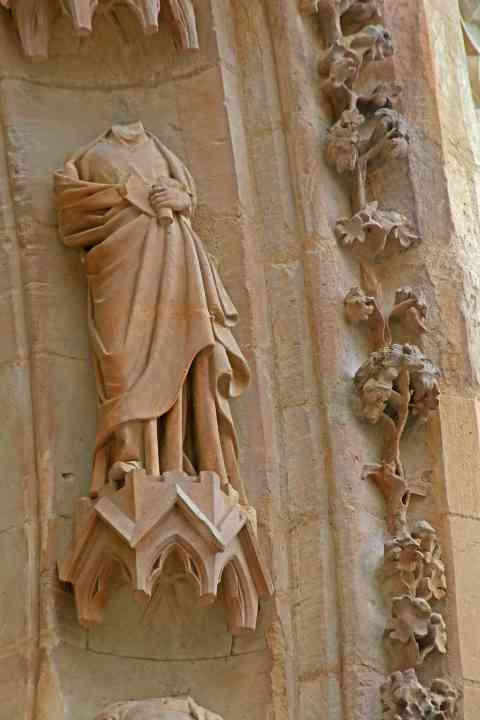 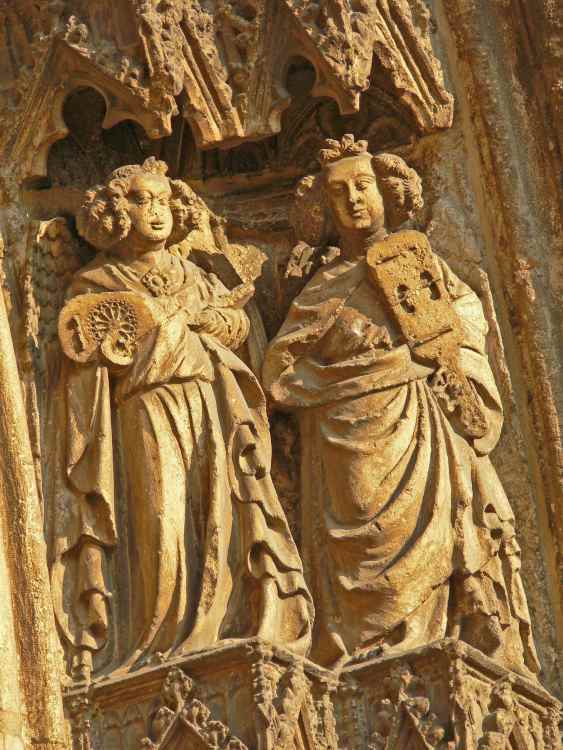 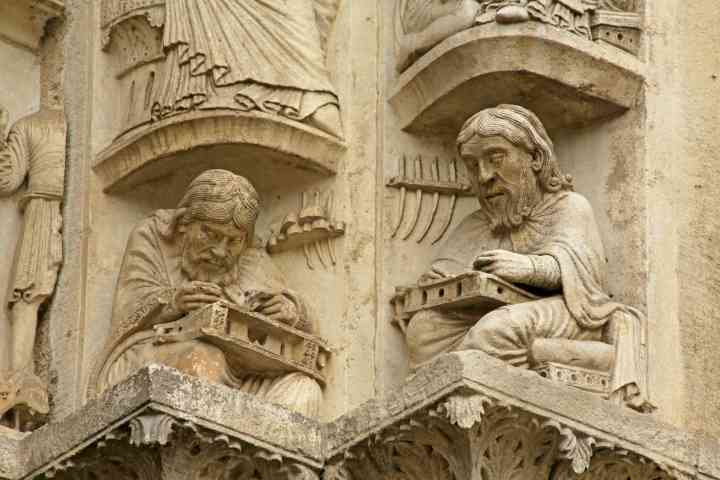 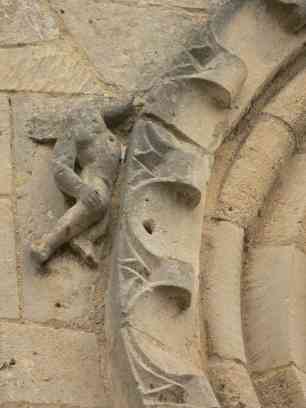 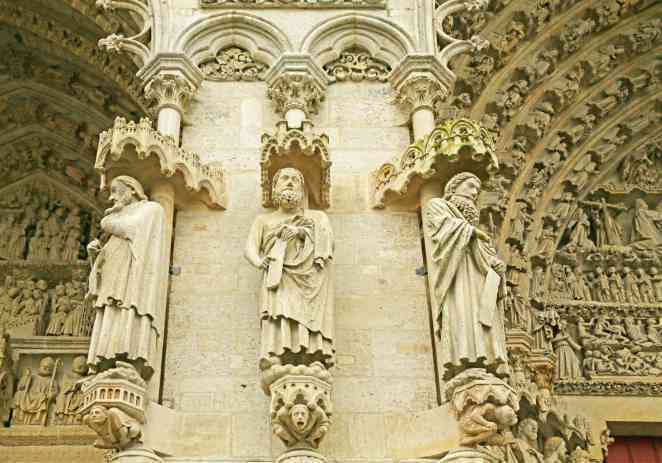 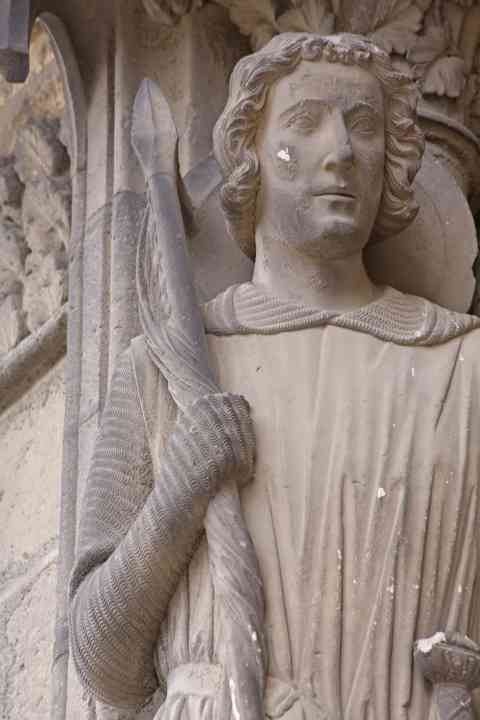 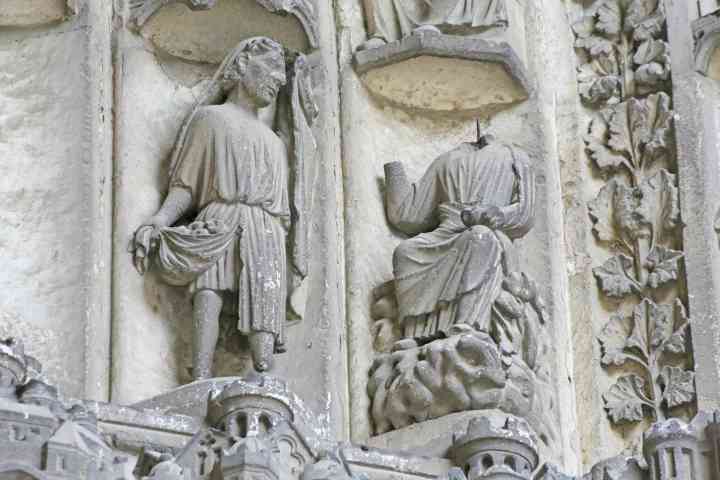 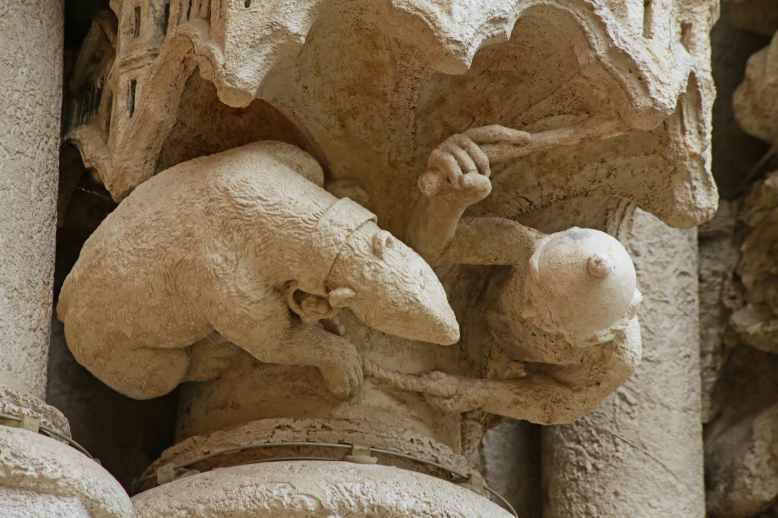 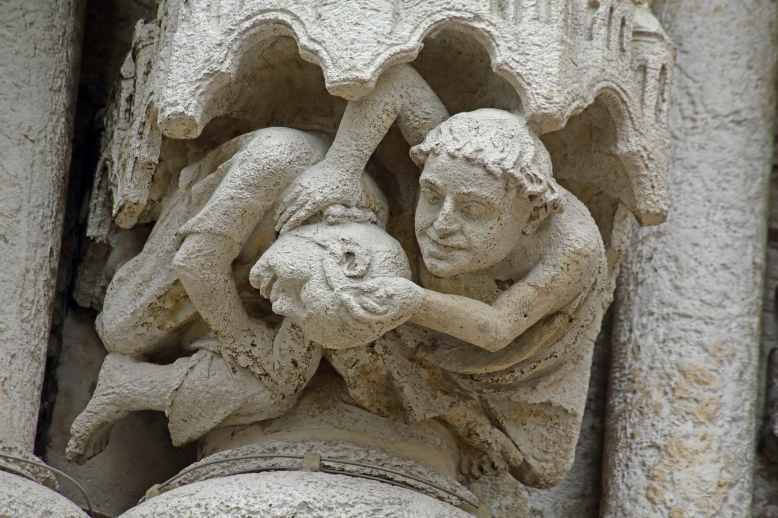 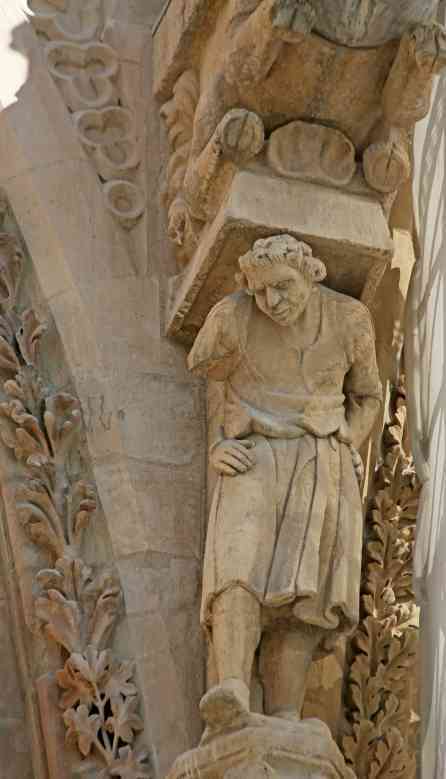 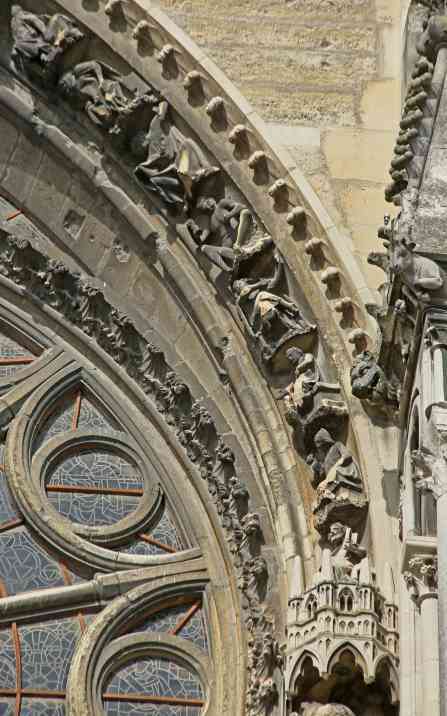 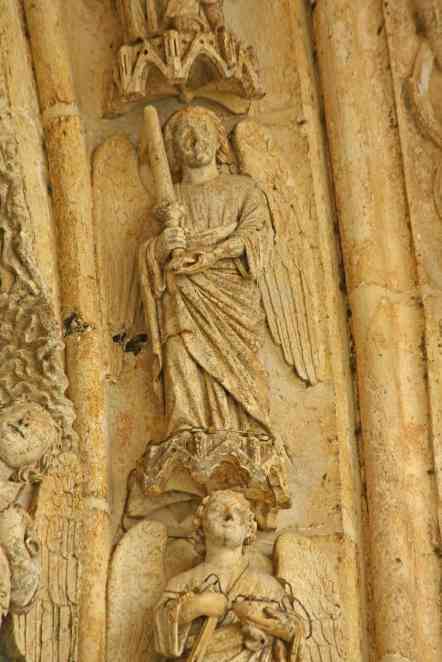 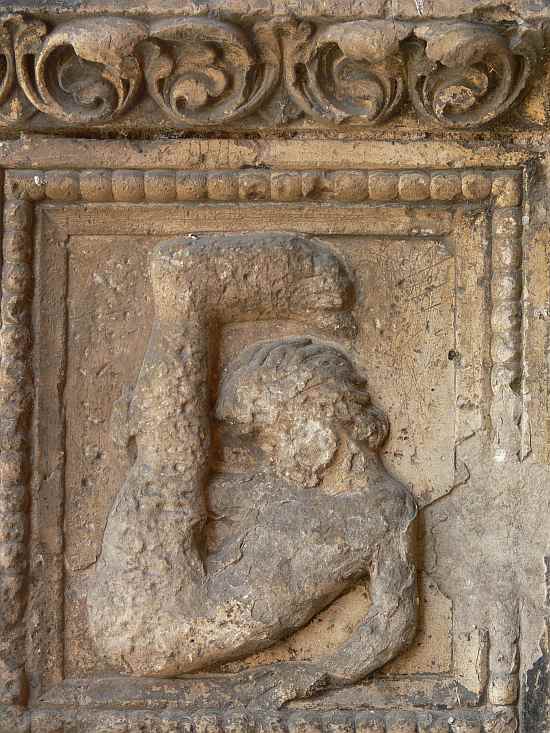 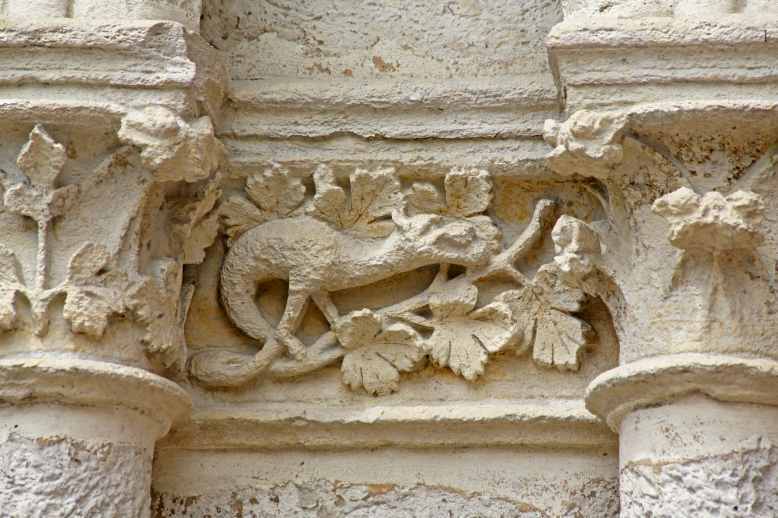 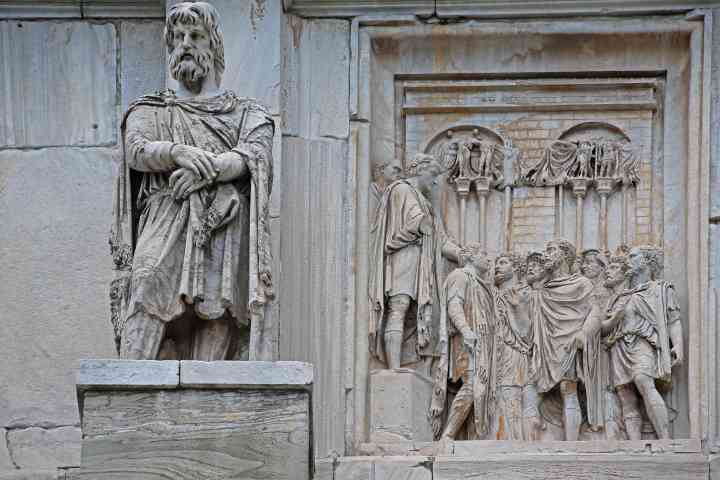 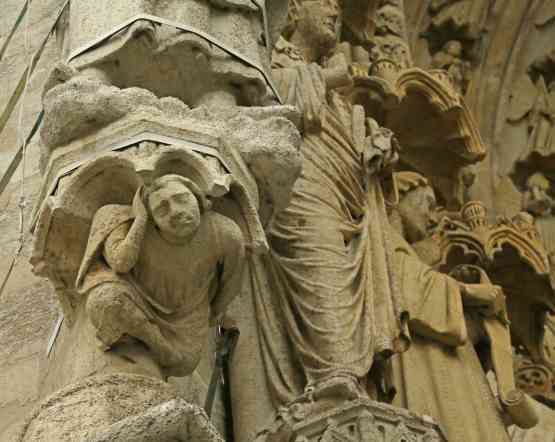 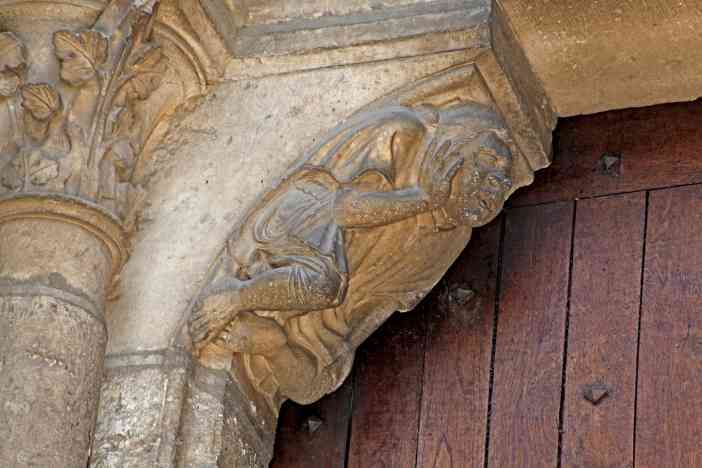 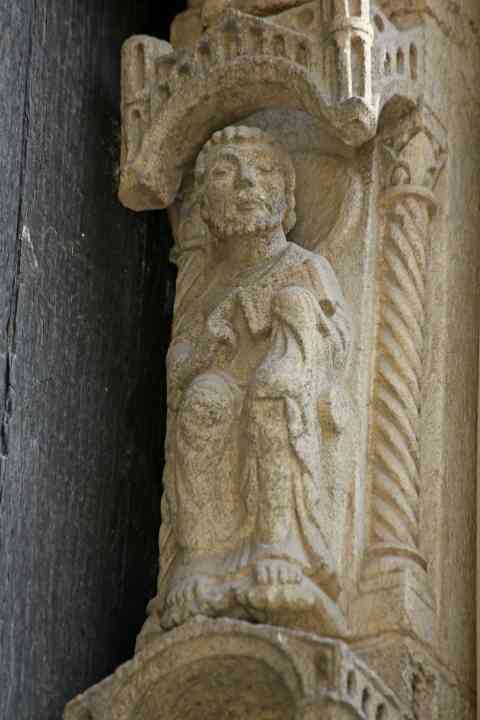 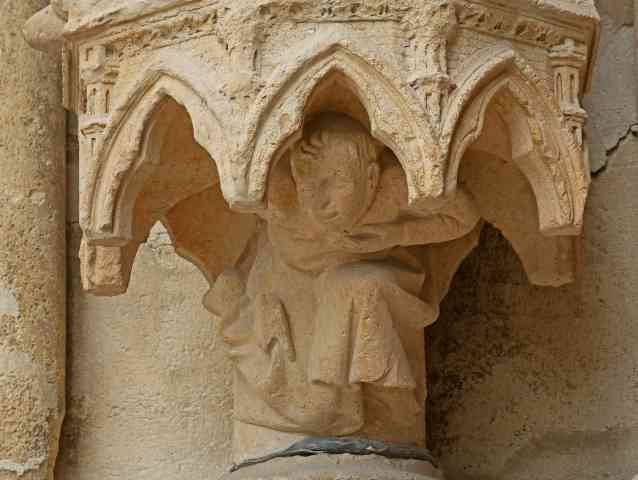 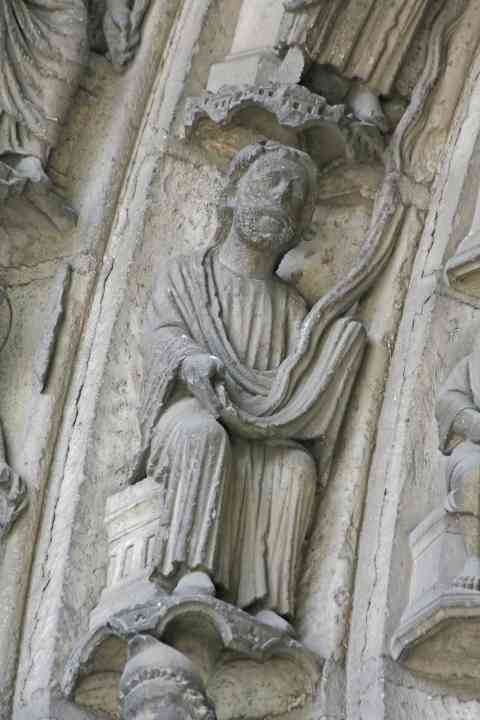 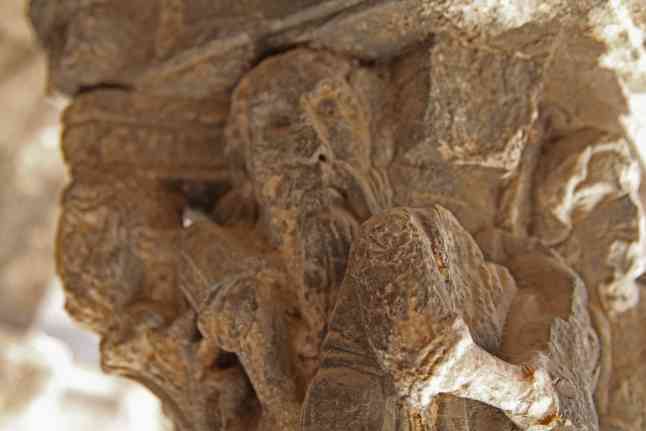 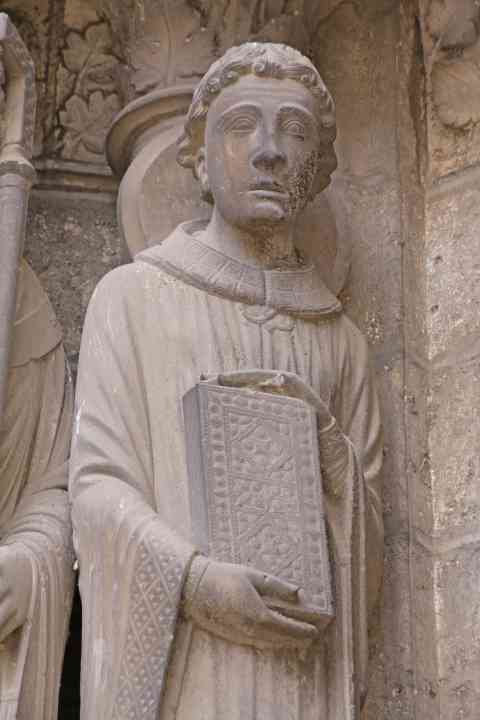 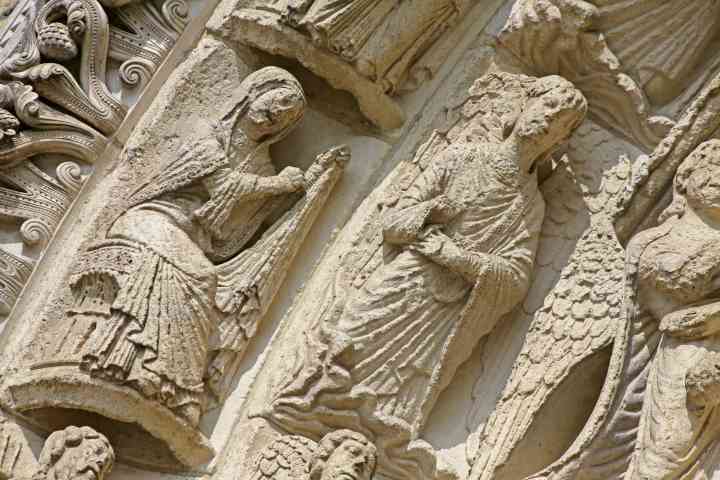 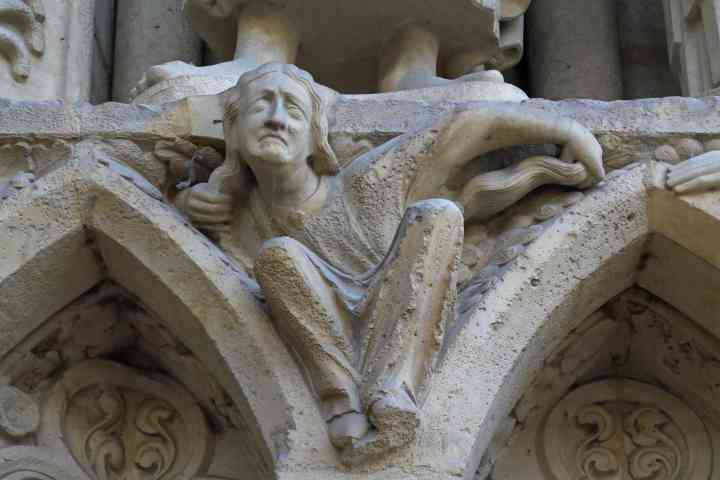 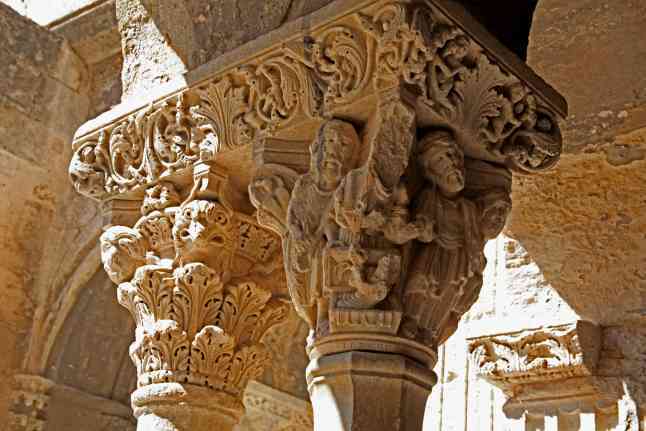 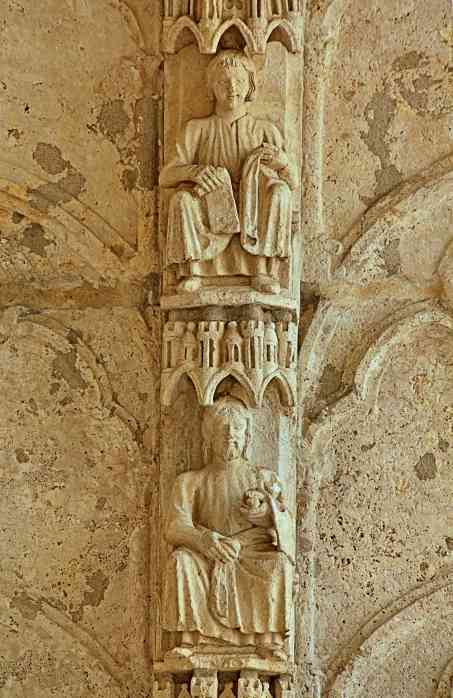 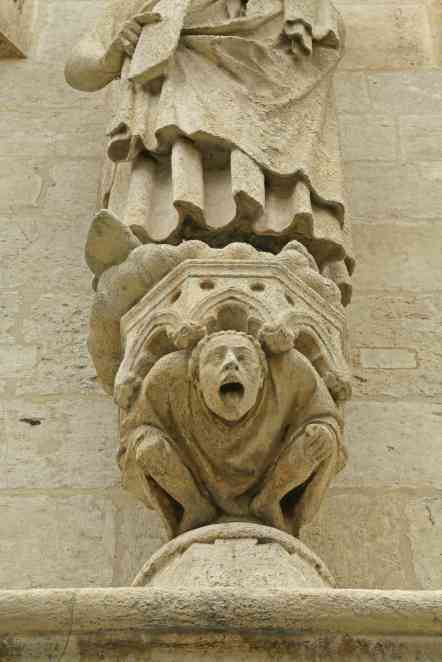 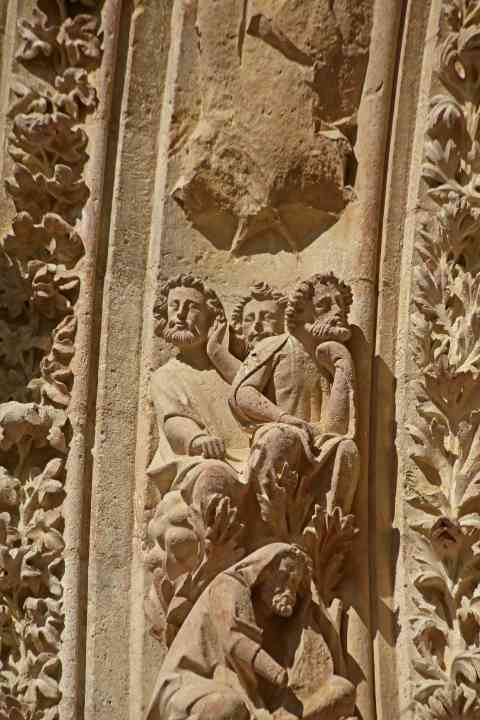 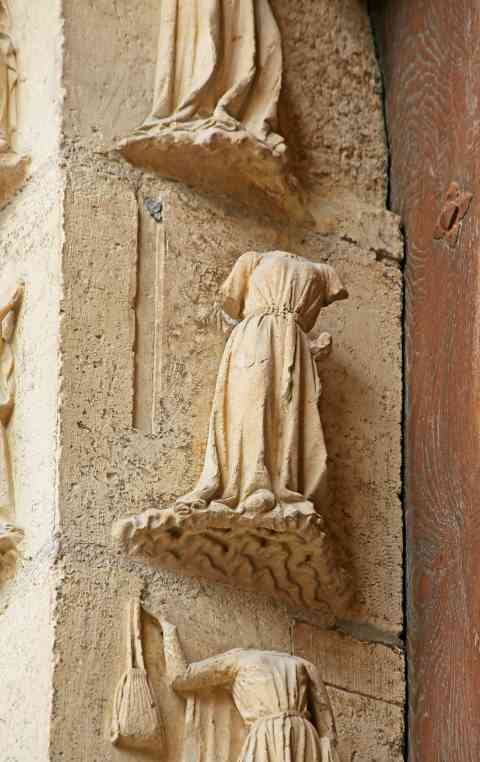 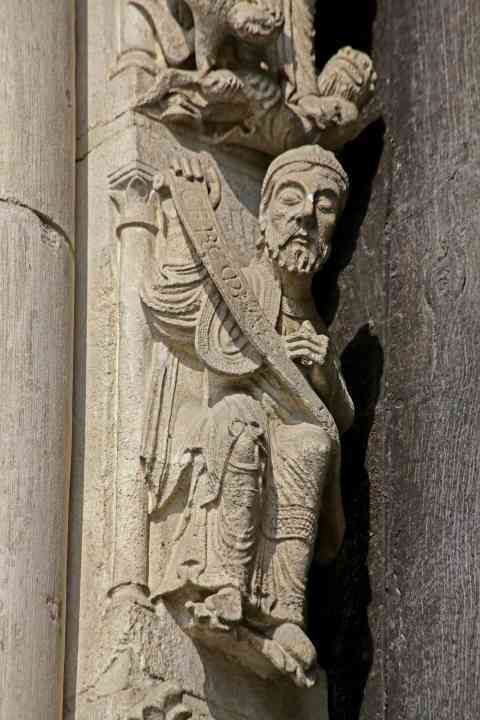 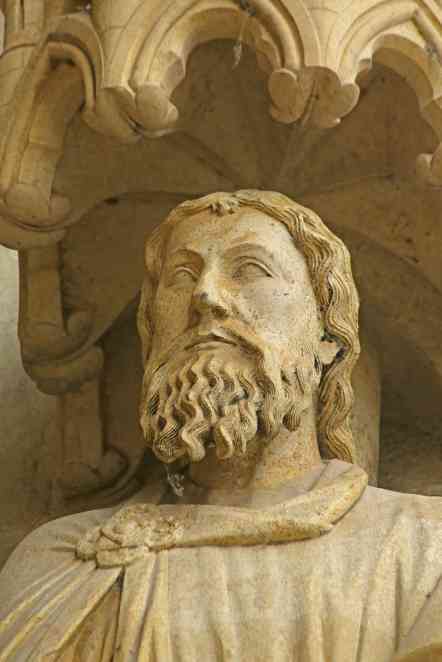 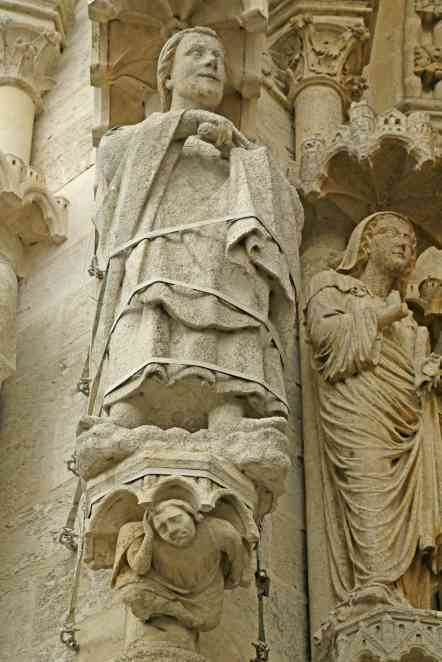 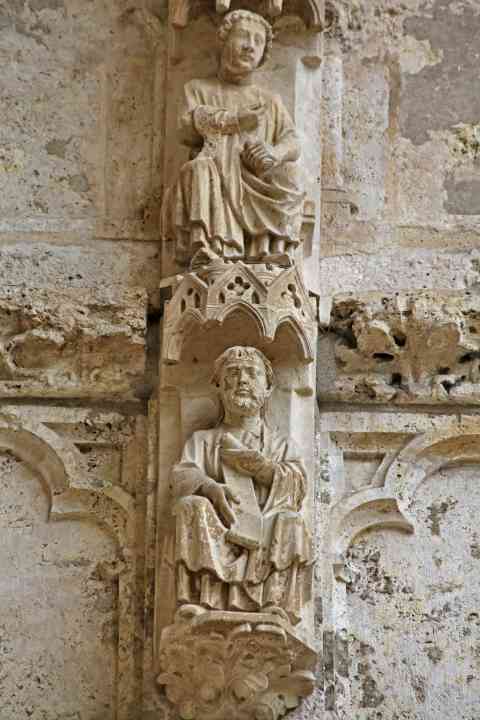 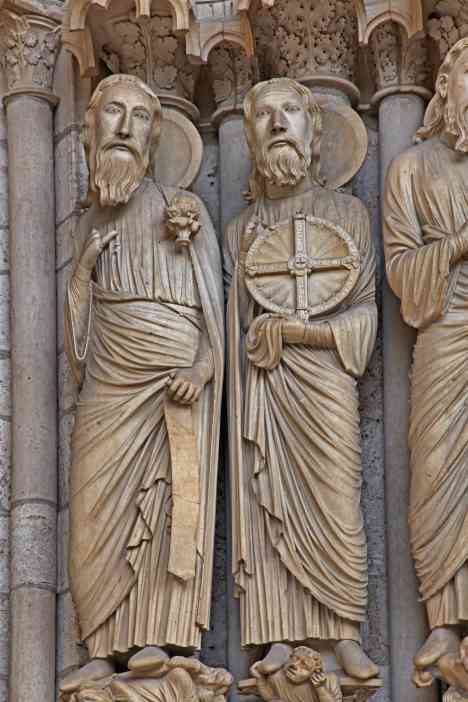 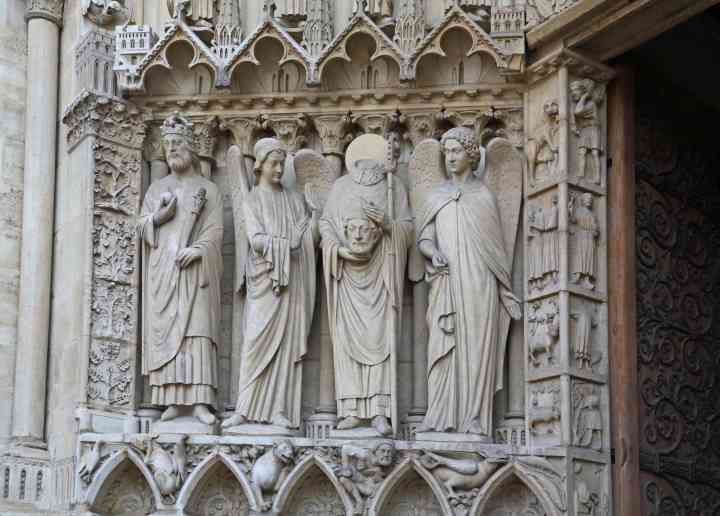 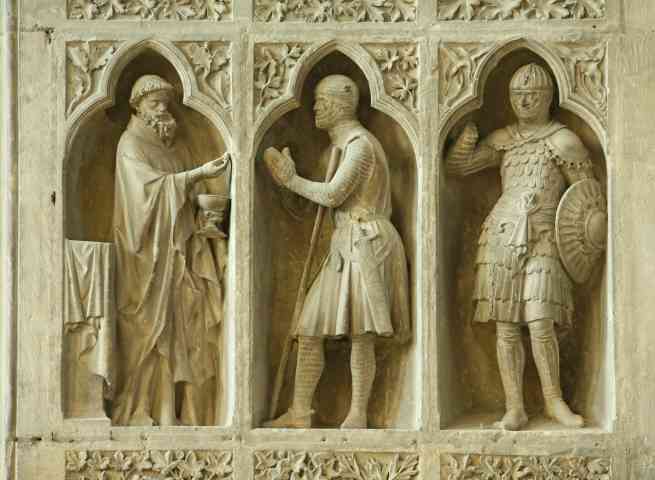 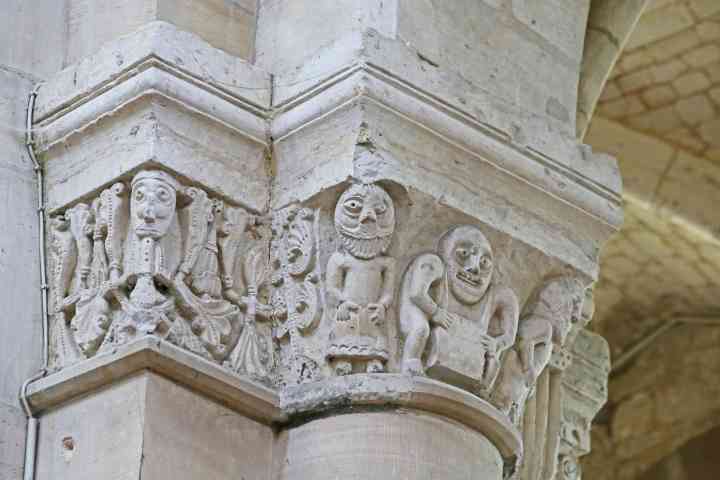 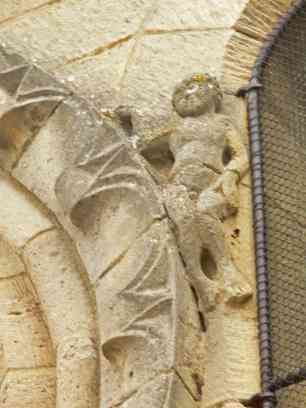 France Sens Cathedral West façade right door right hand bas relief figure with scroll - prophet? 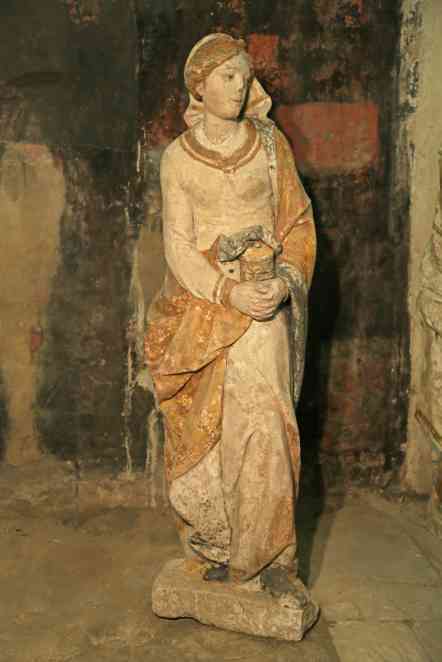 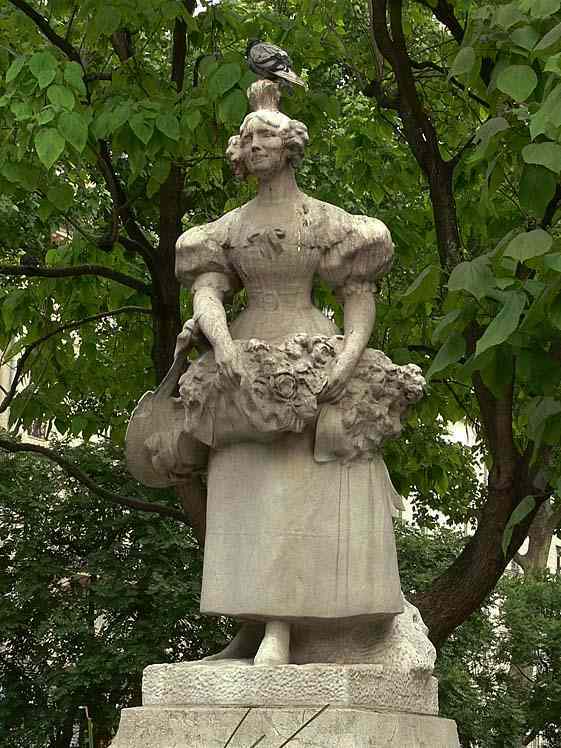 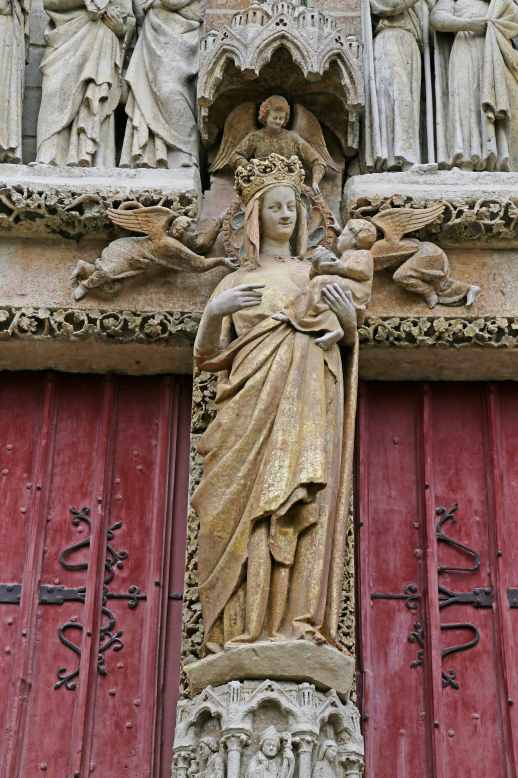 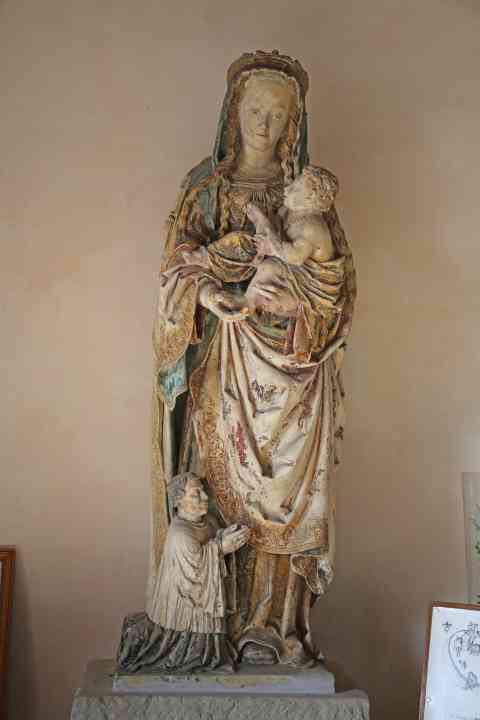 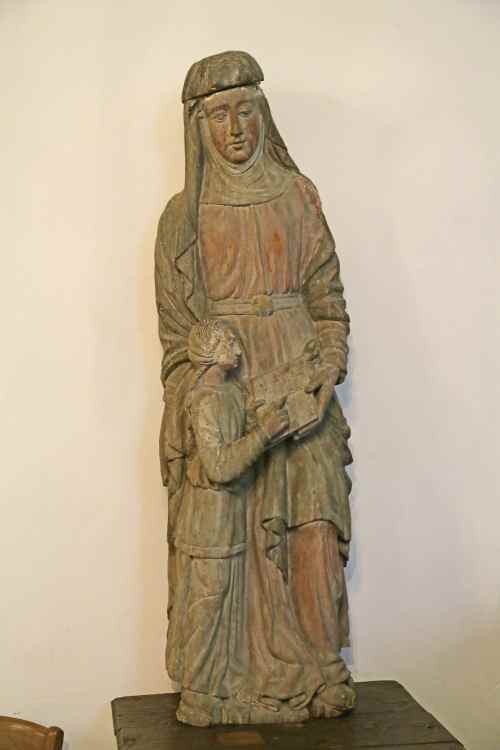 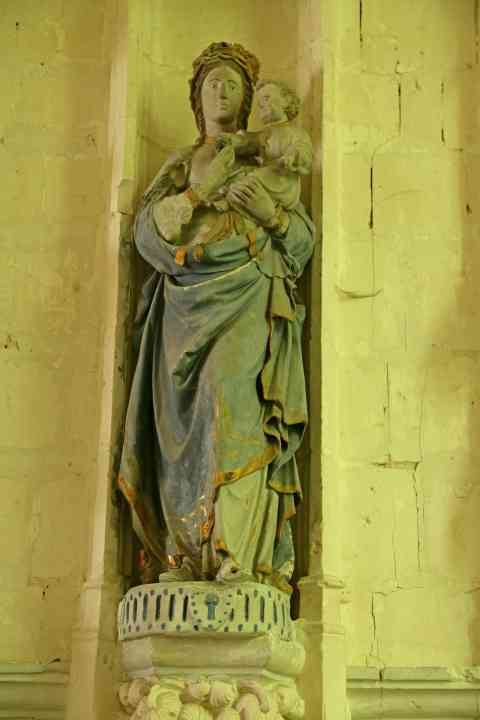 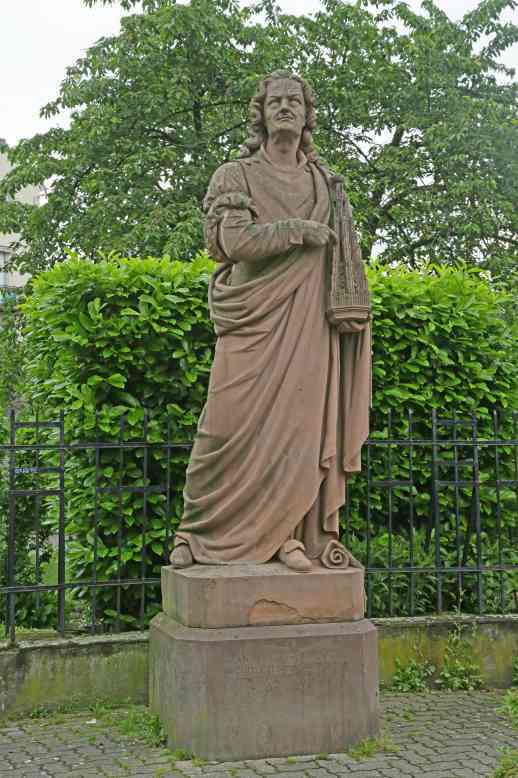 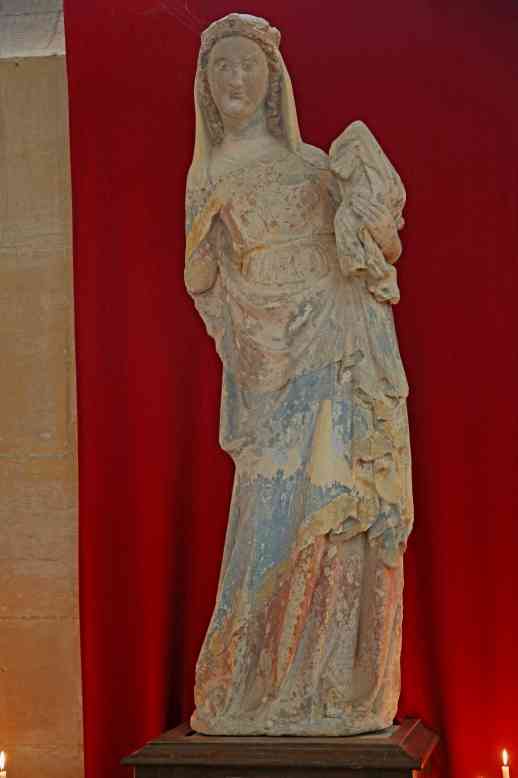 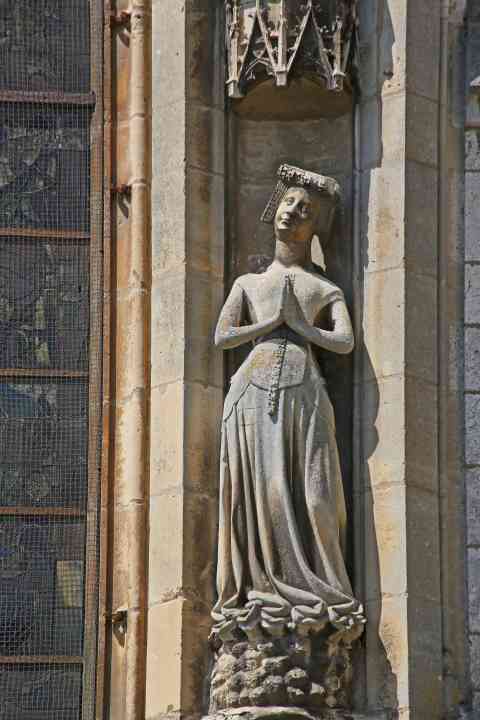 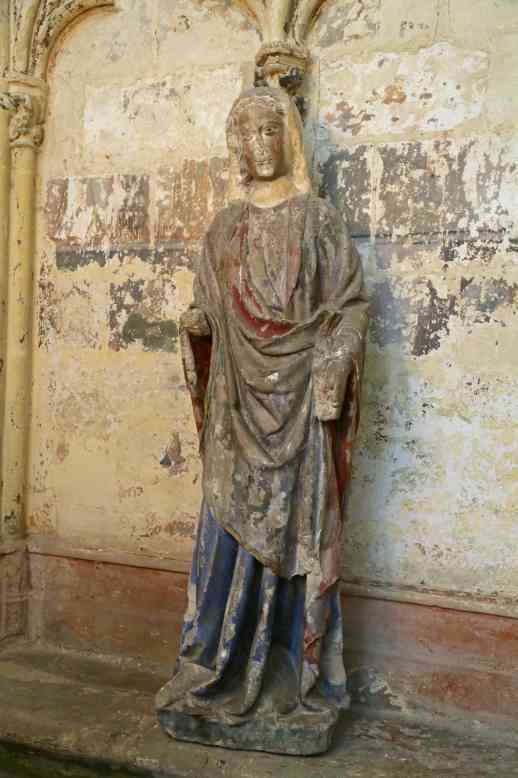 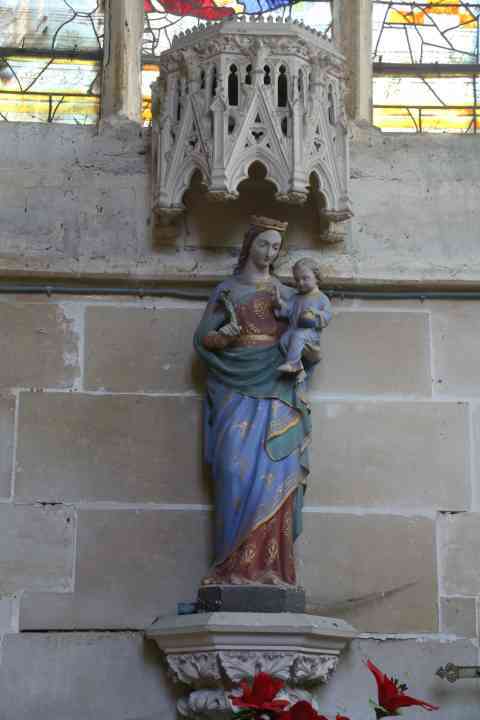 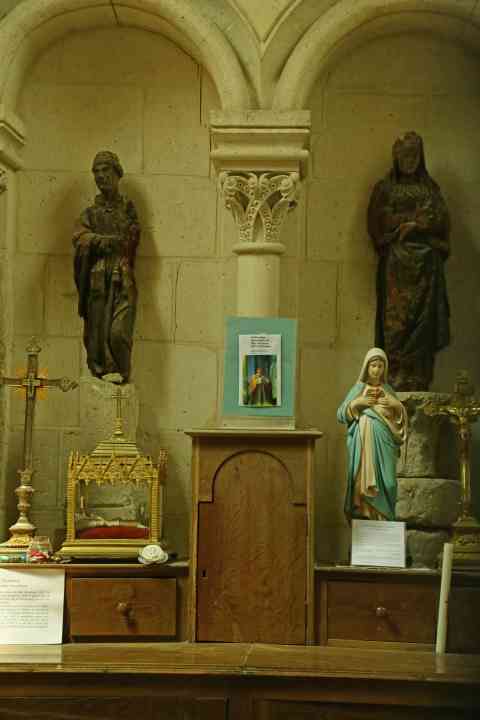 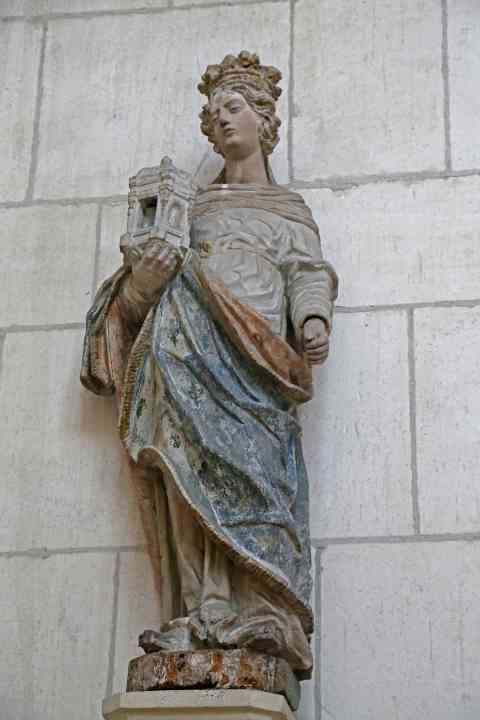 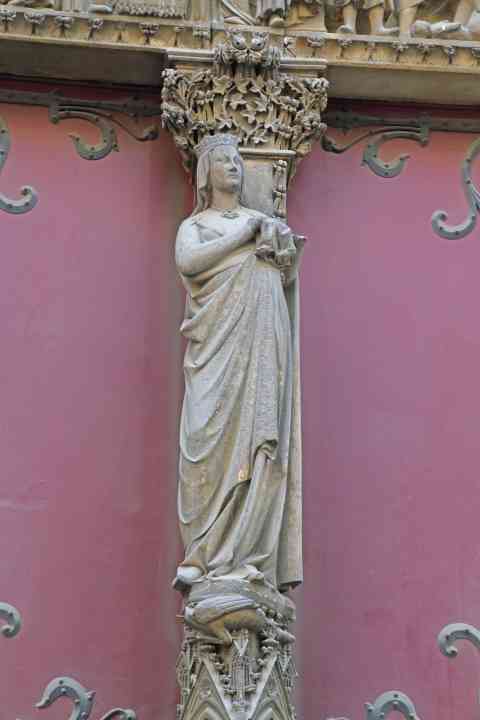 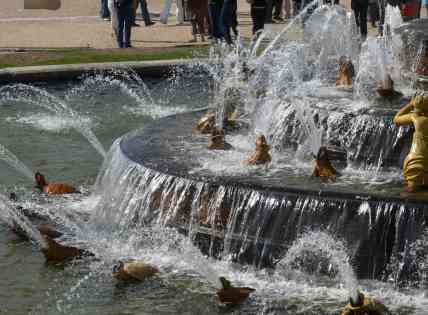 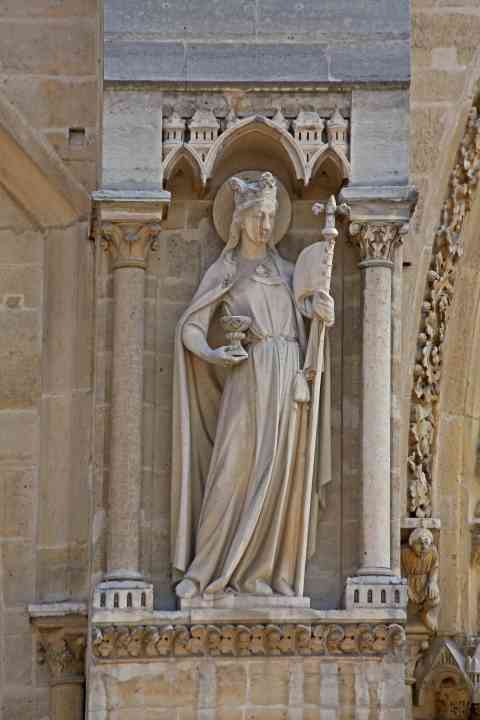 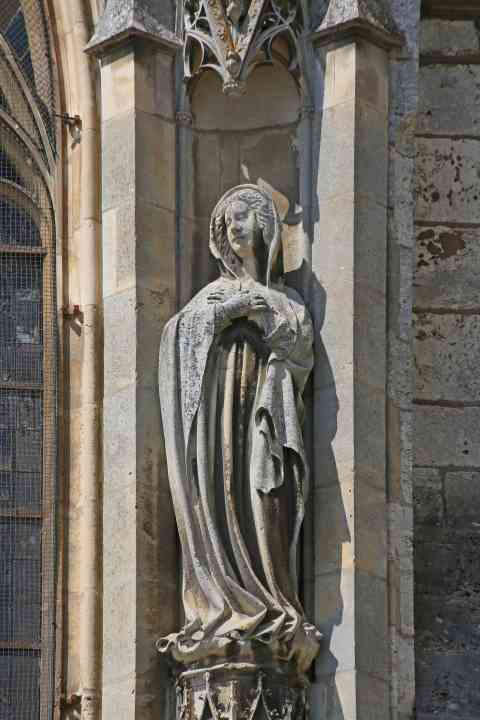 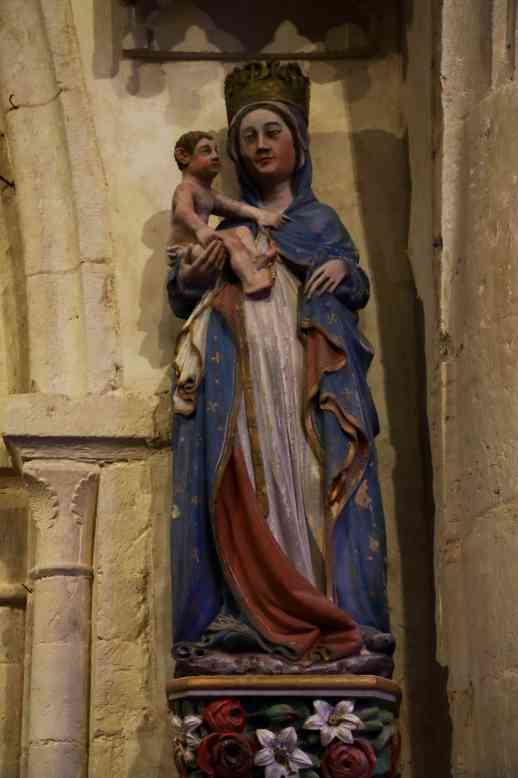 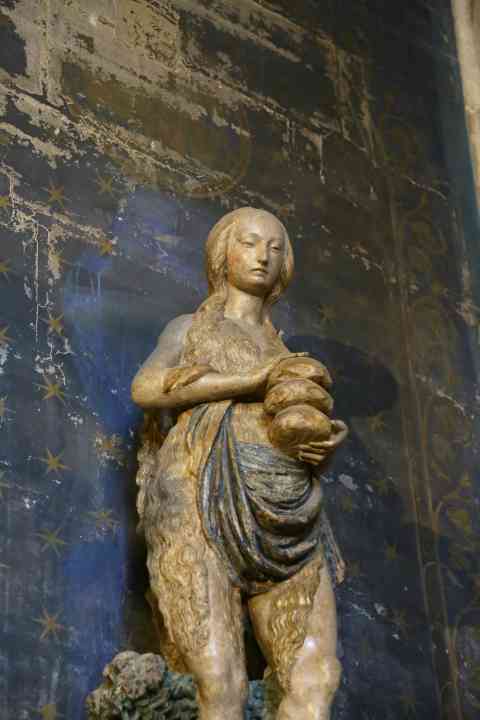 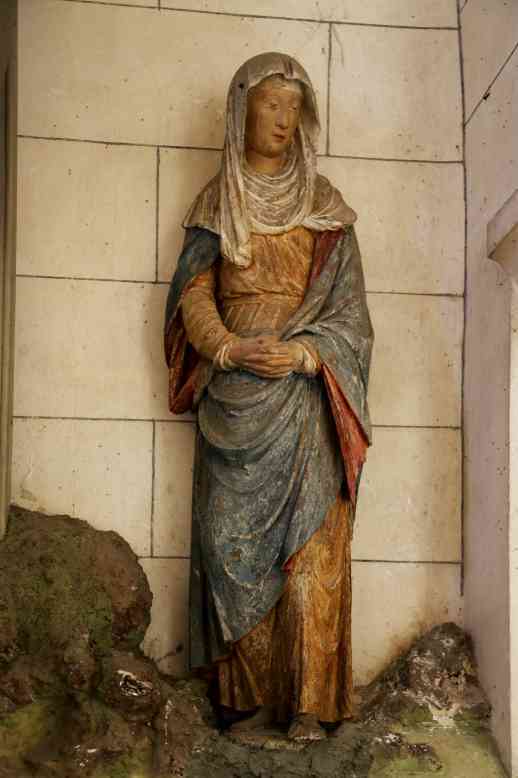 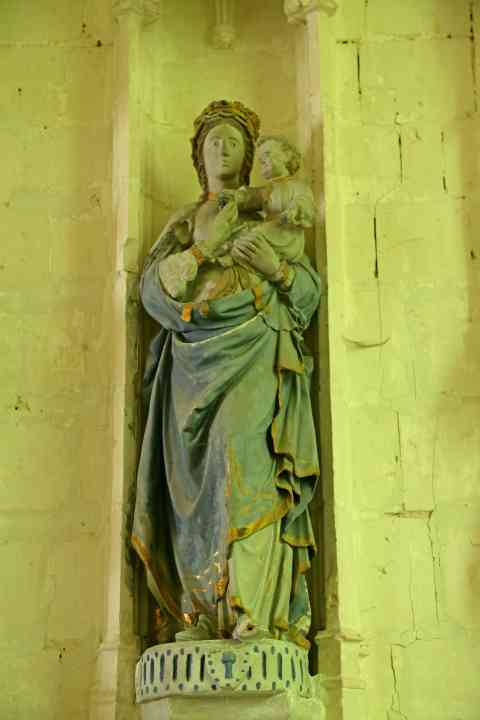 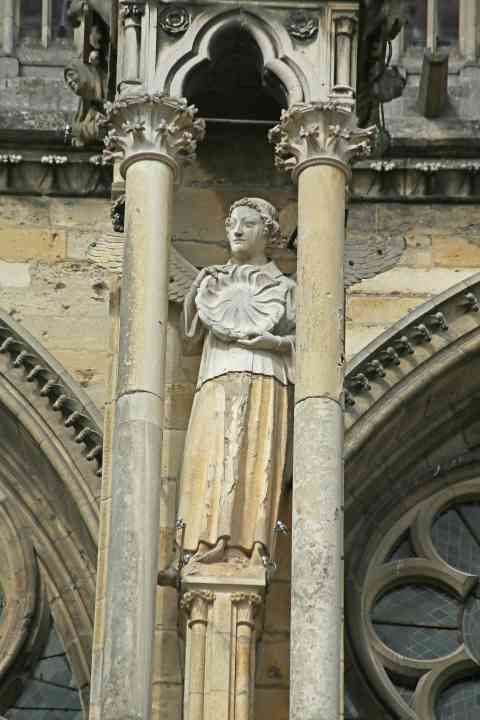 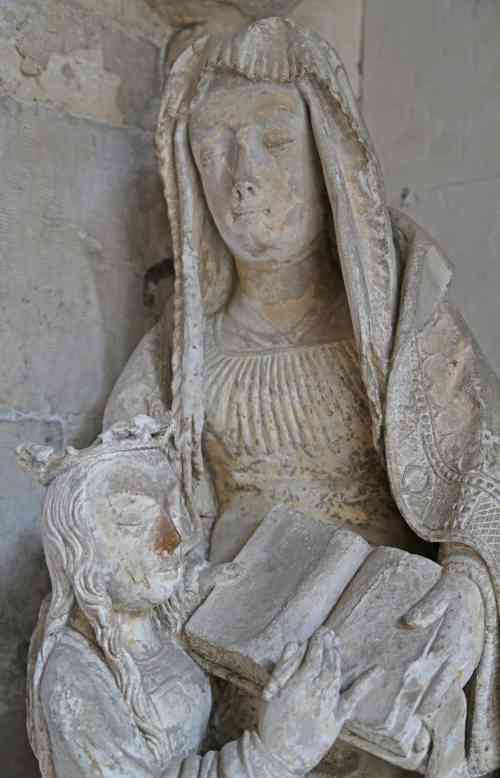 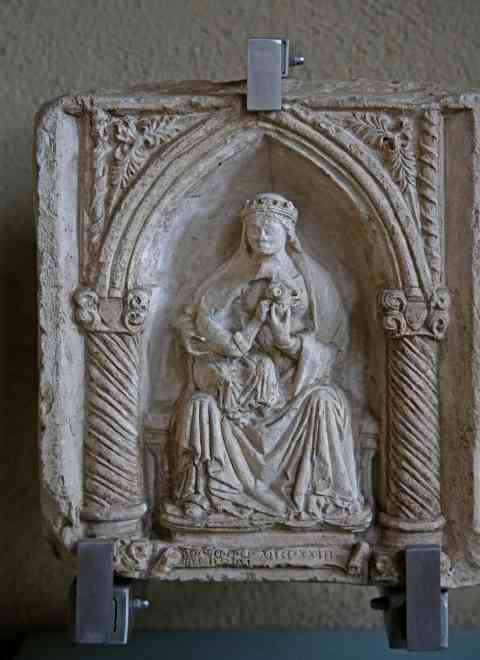 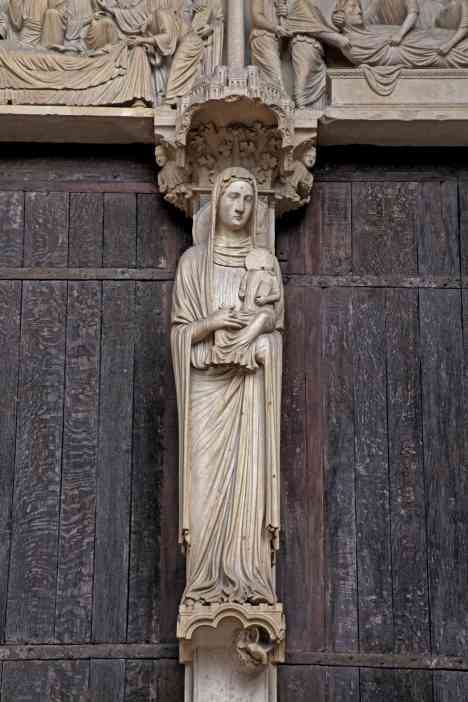 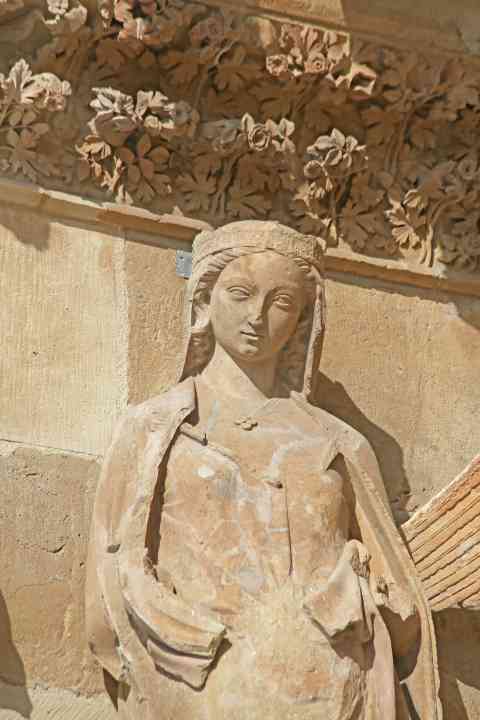 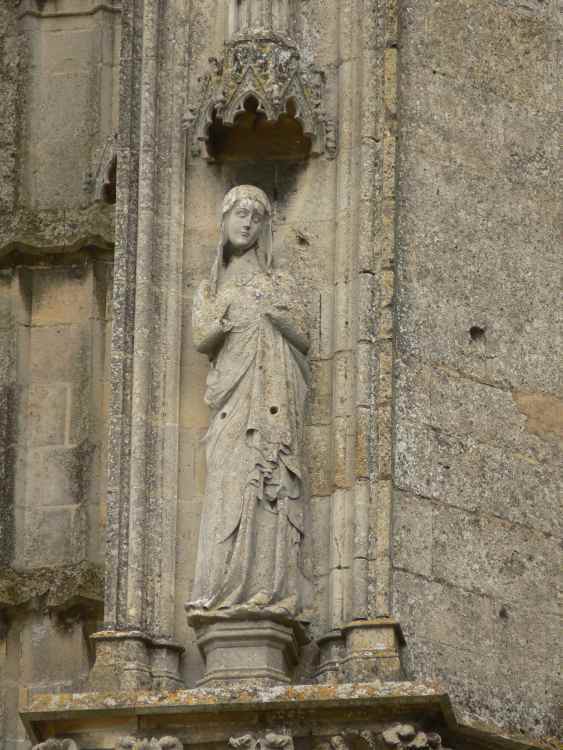 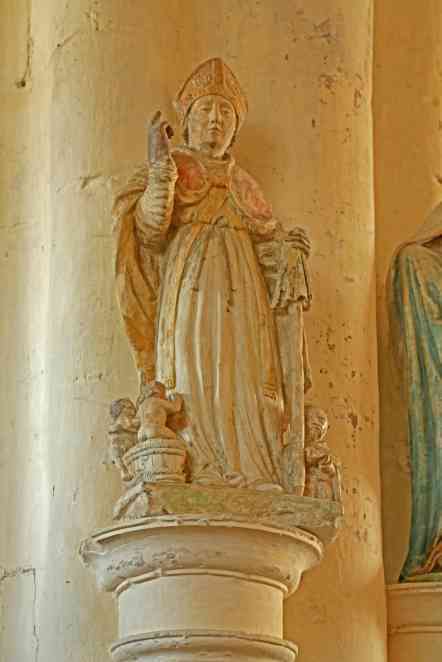 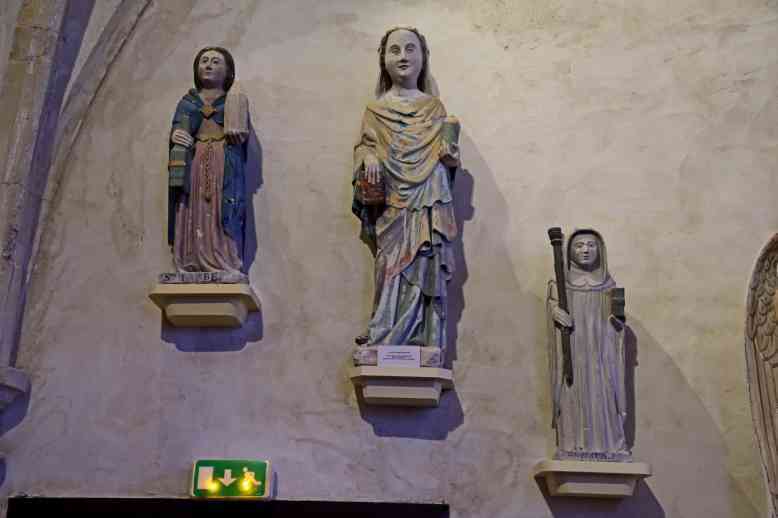 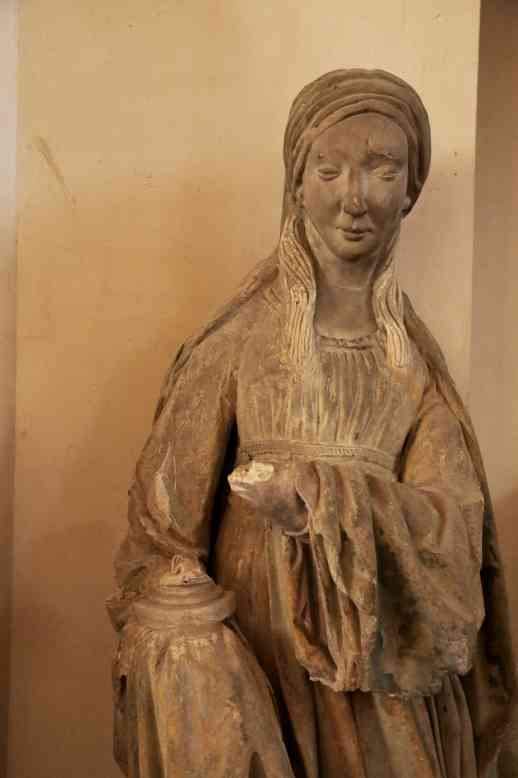 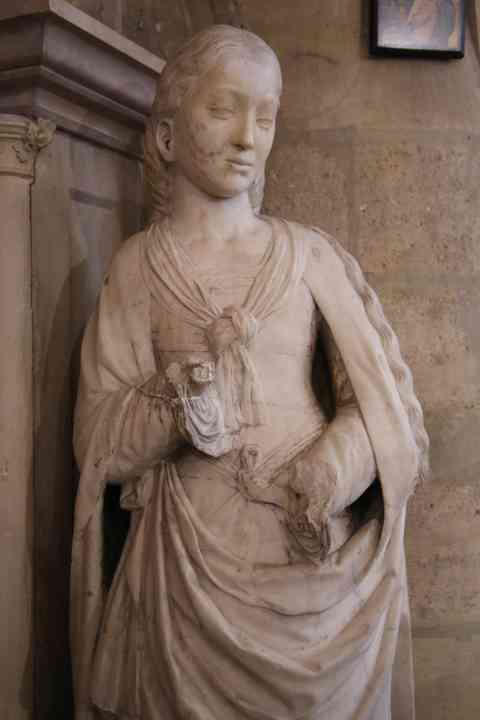 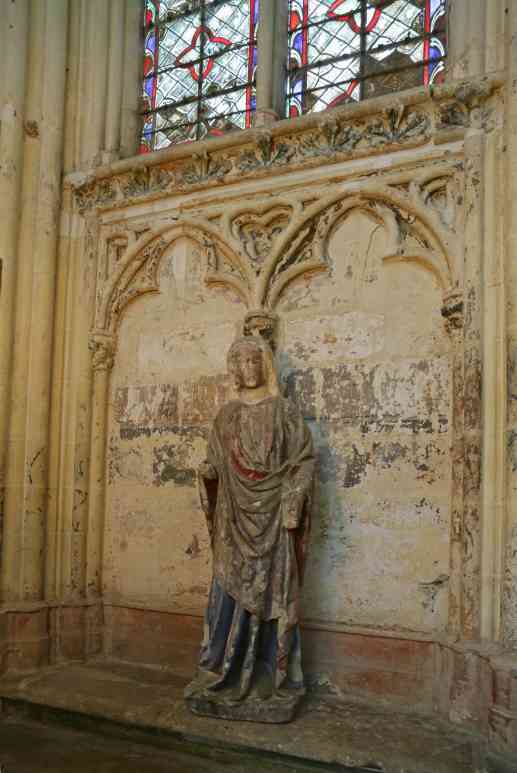 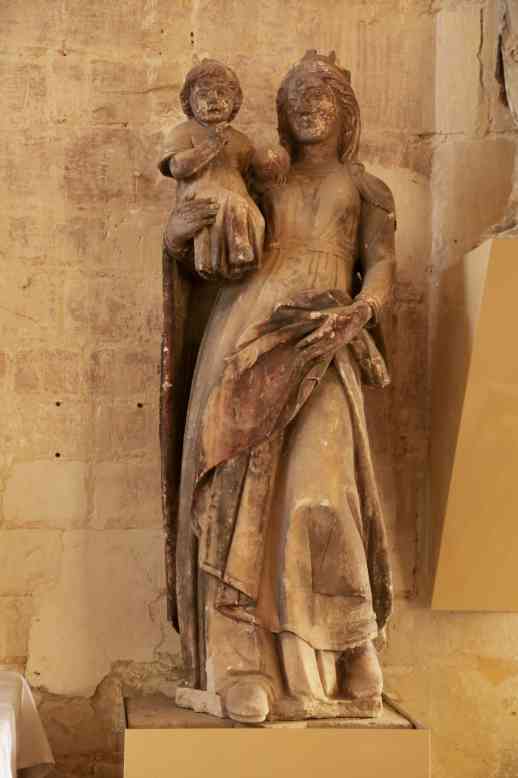 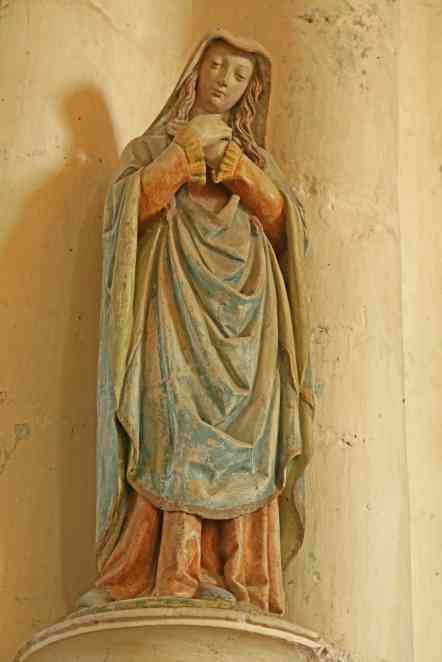 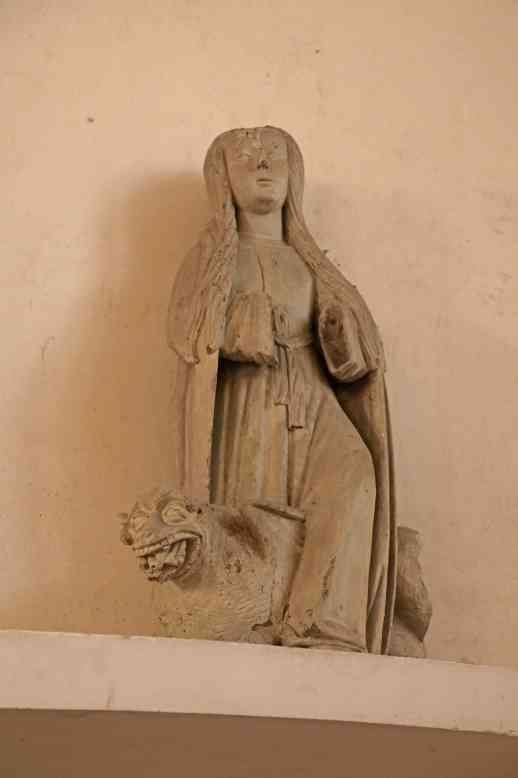 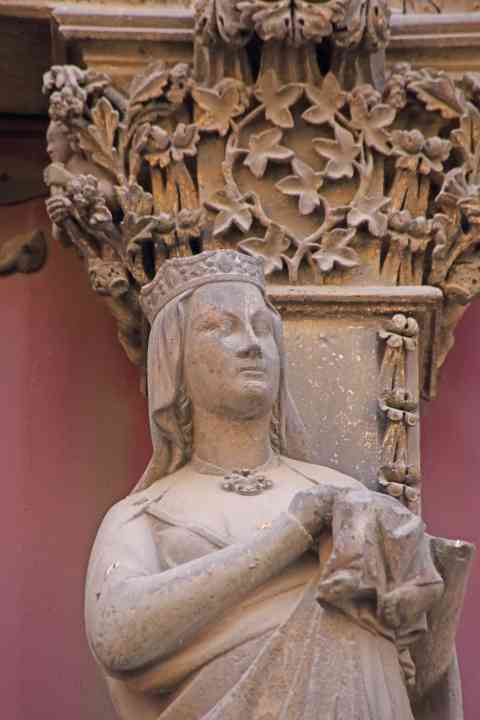 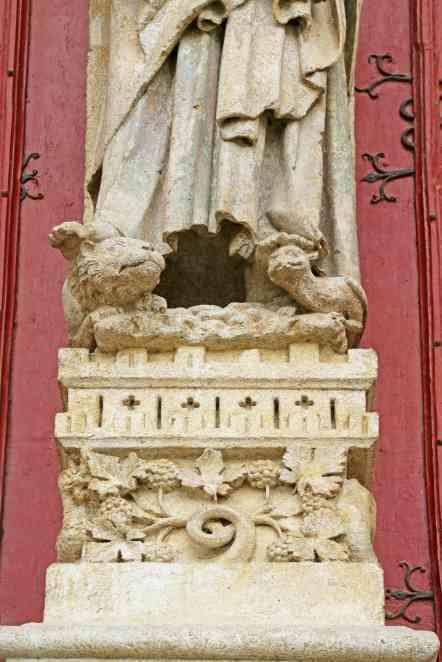 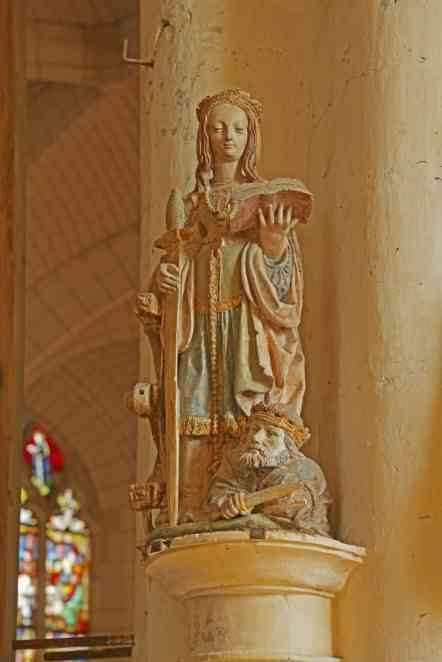 France Troyes St-Germain Statue of St Mary Madeleine? 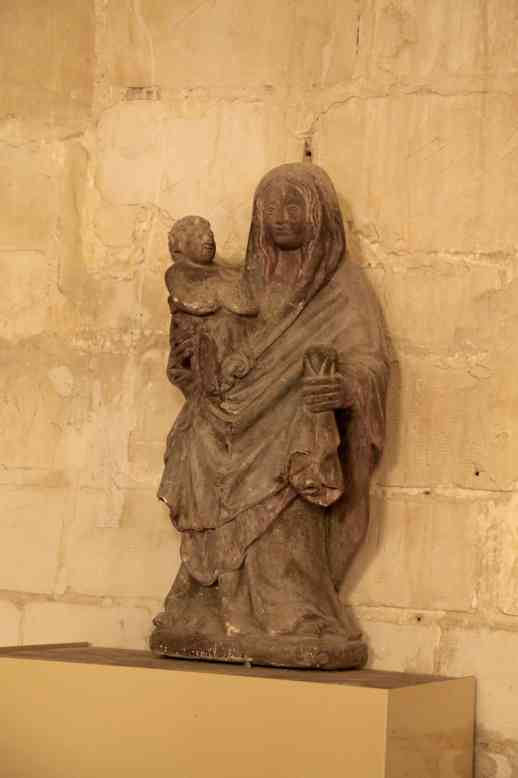 France Troyes St-Germain Statue of a Virgin and child? 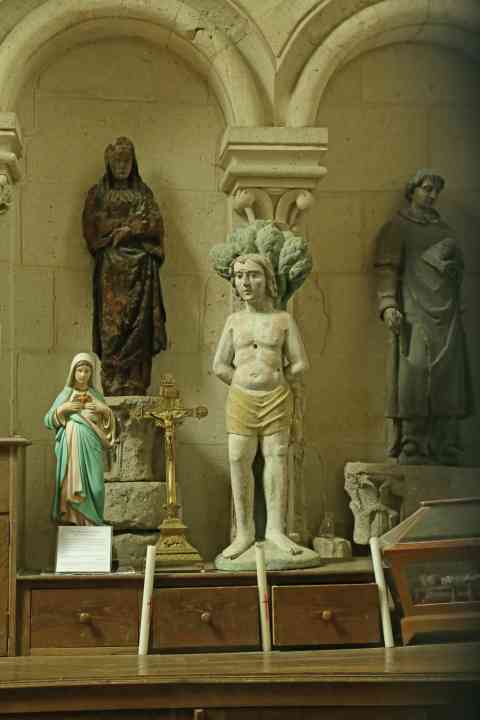 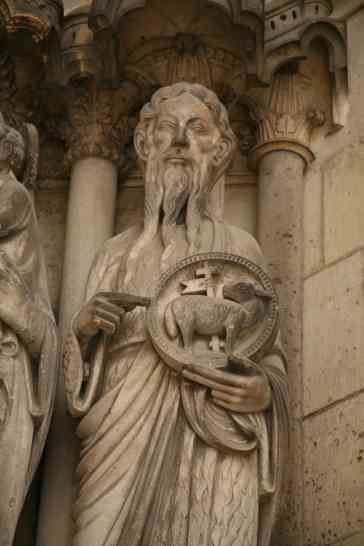 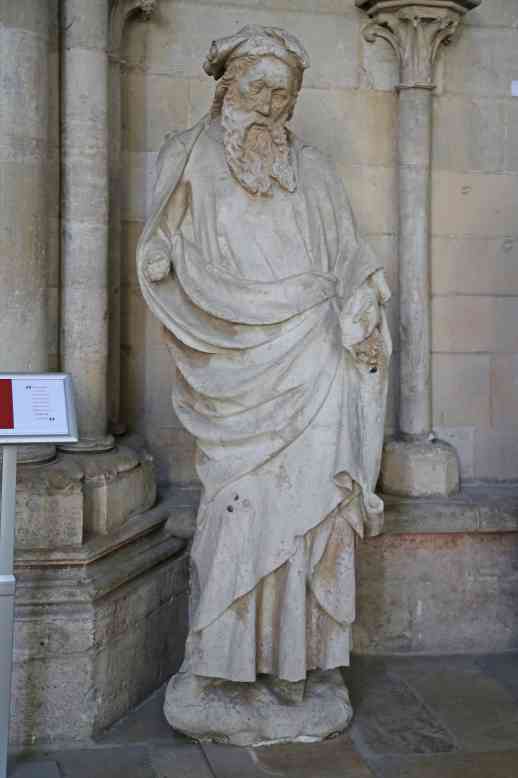 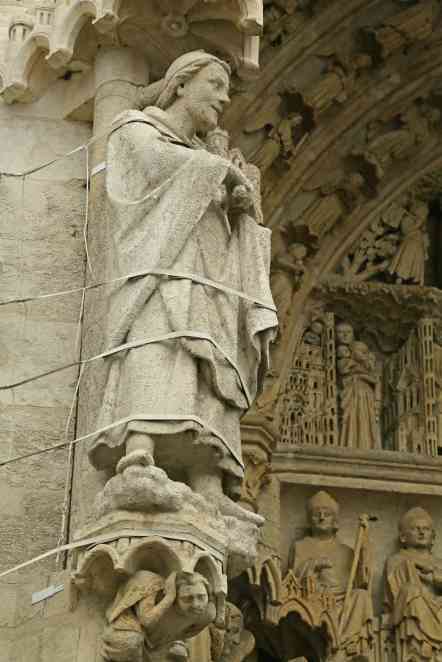 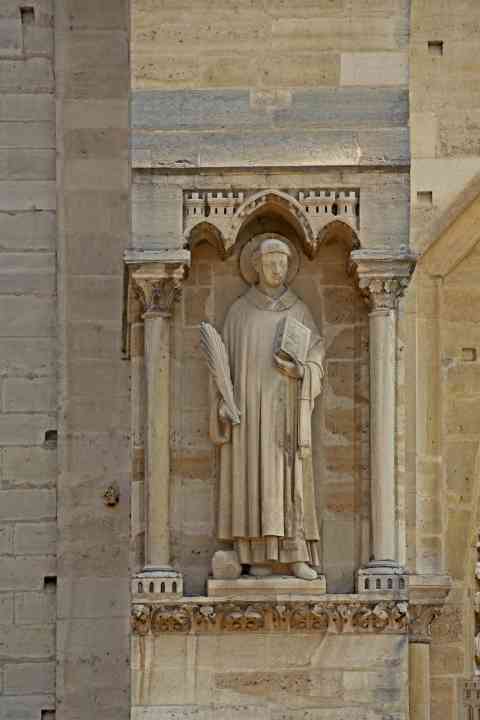 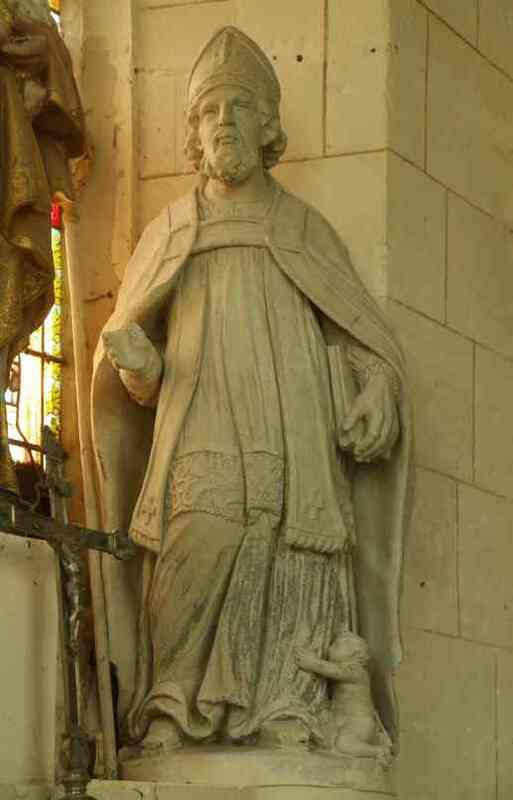 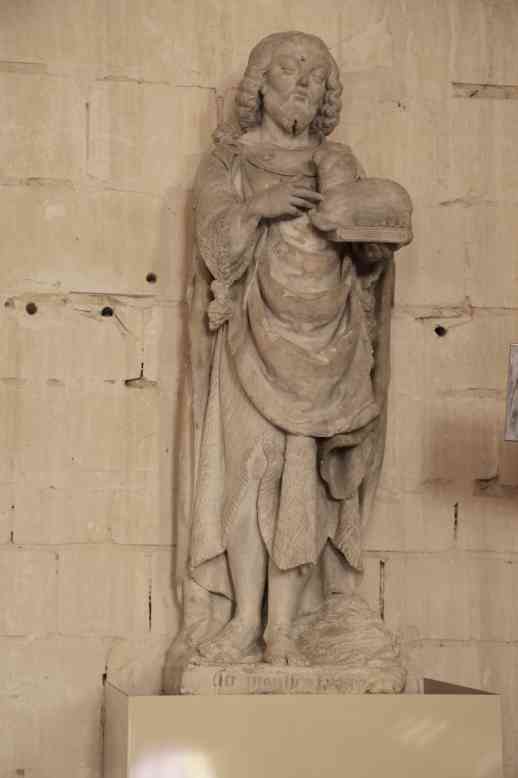 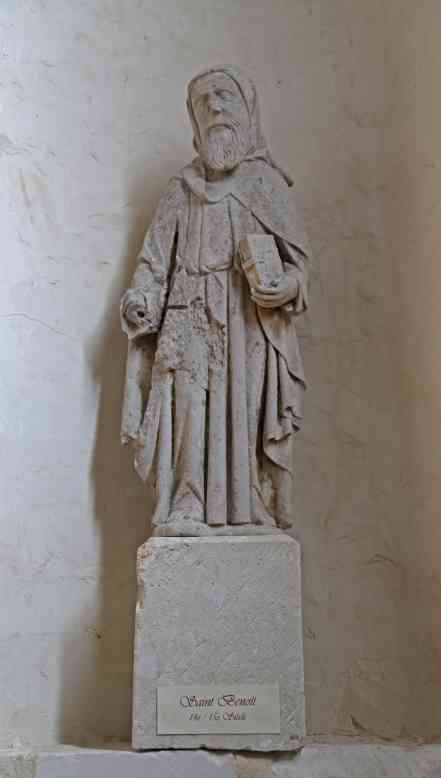 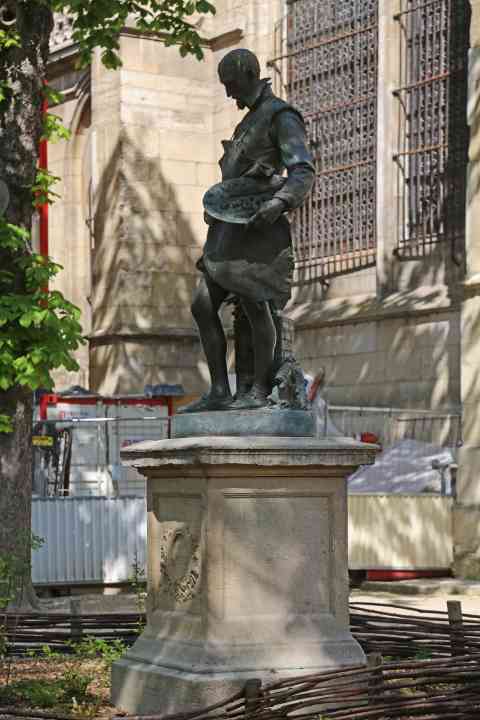 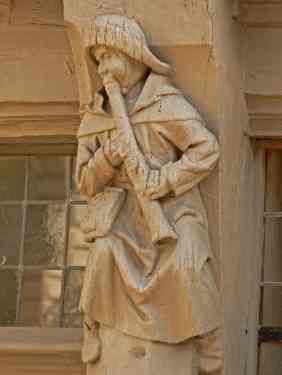 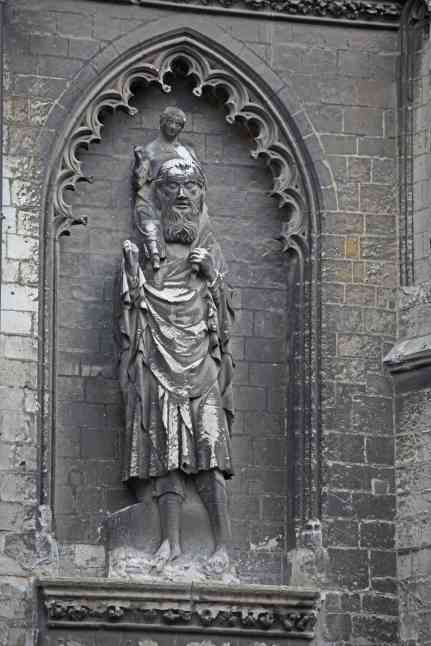 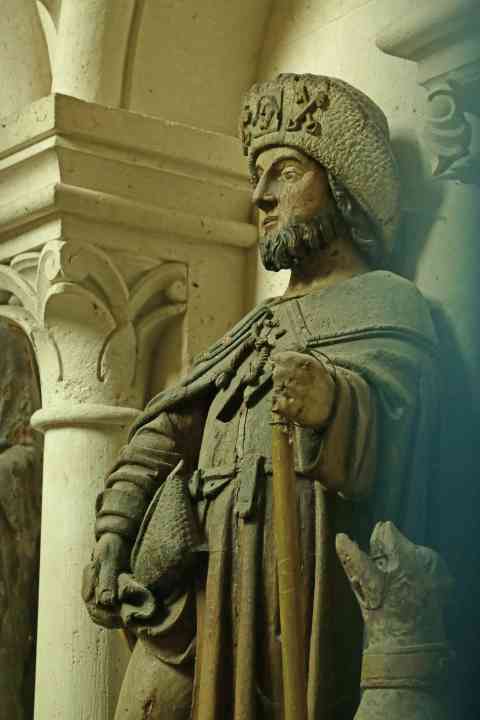 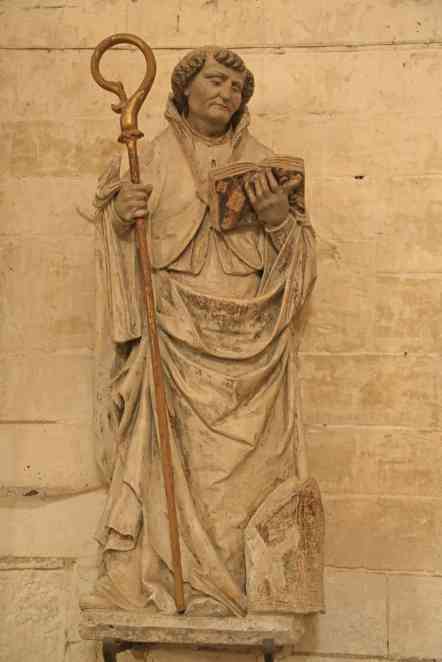 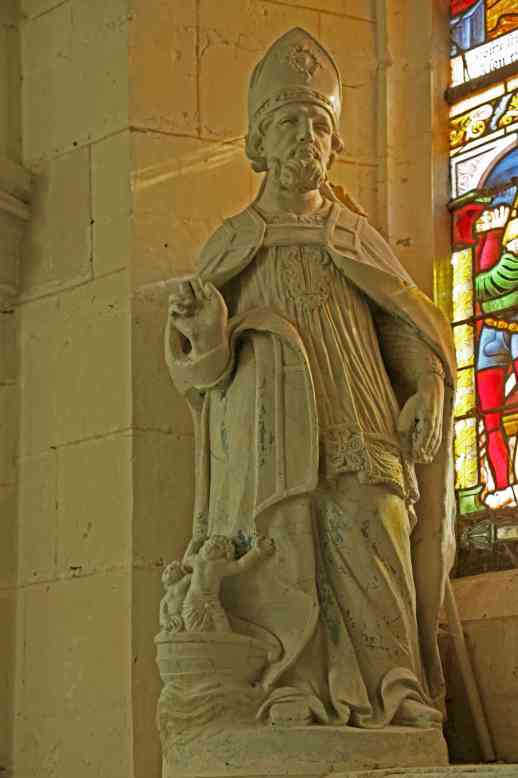 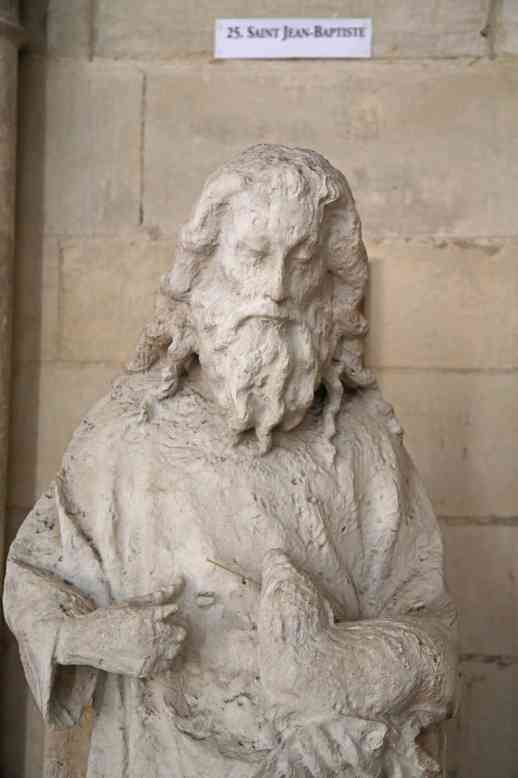 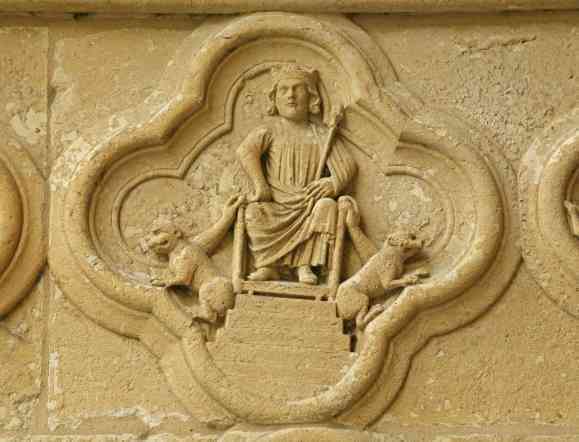 France Troyes St-Germain Statue of male saint with a sheep and book John Baptist? 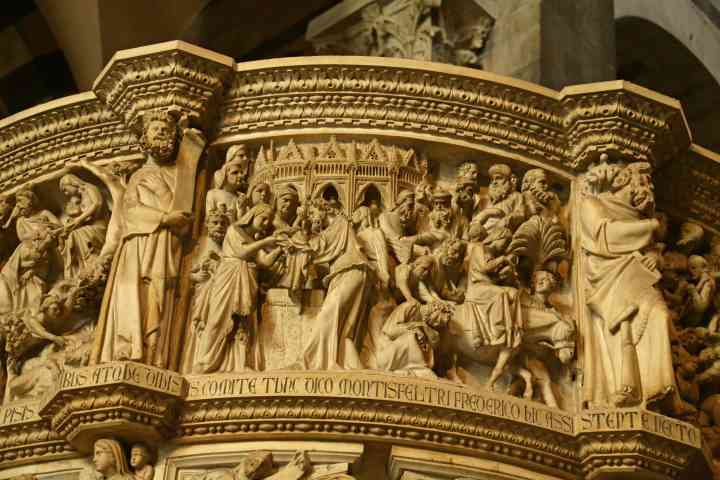 Italy Pisa Duomo Pulpit by Pisano, 1302-11. 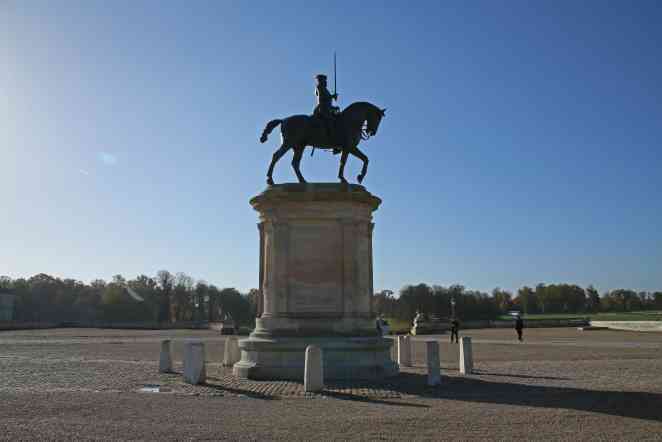 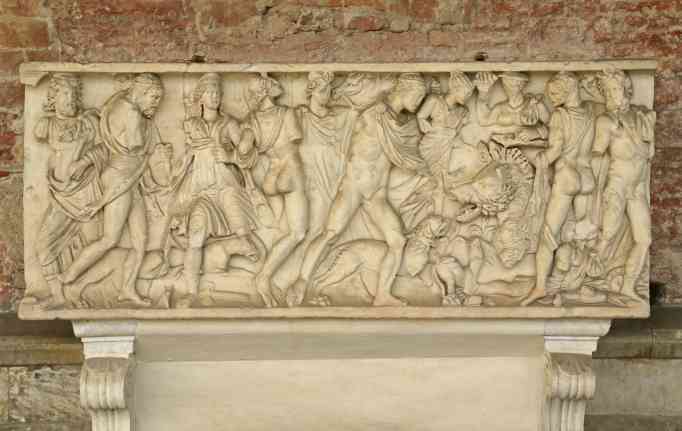 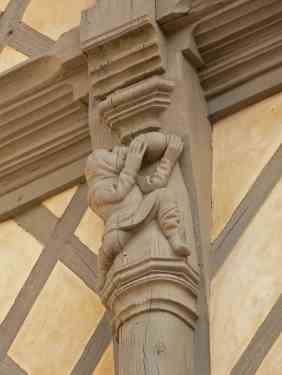 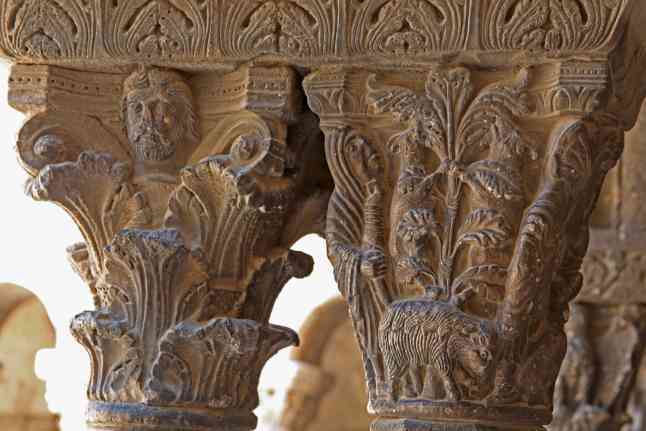 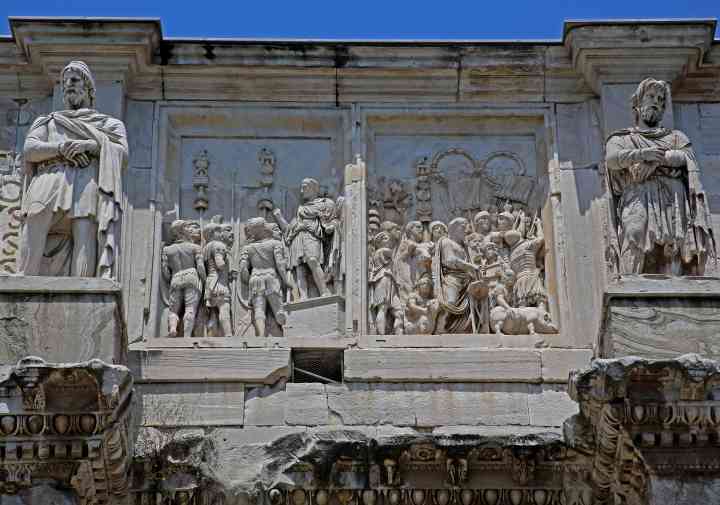 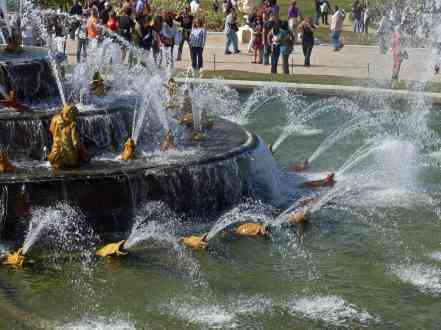 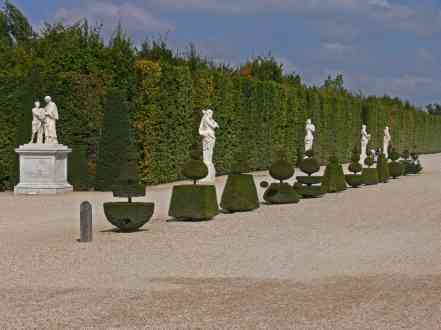 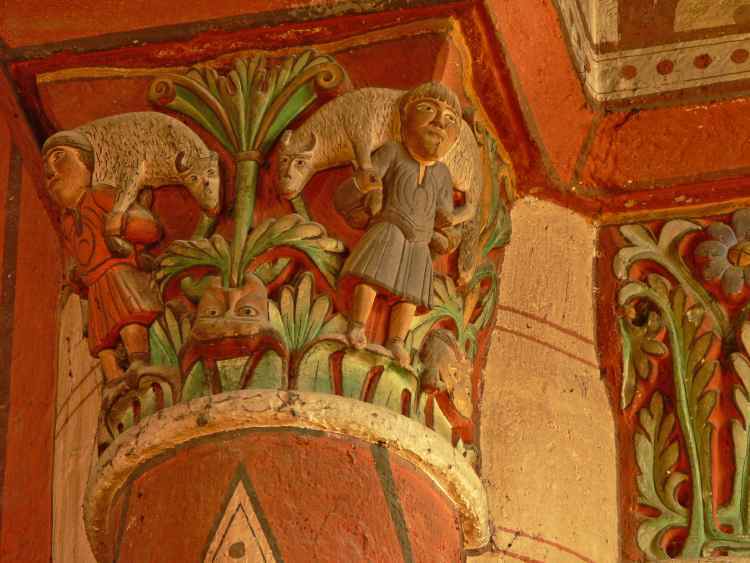 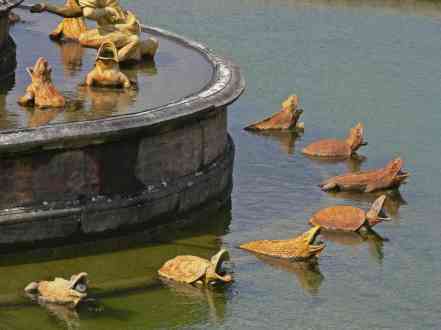 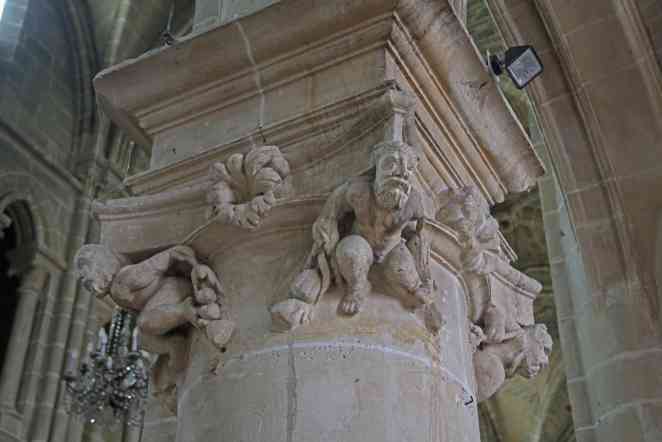 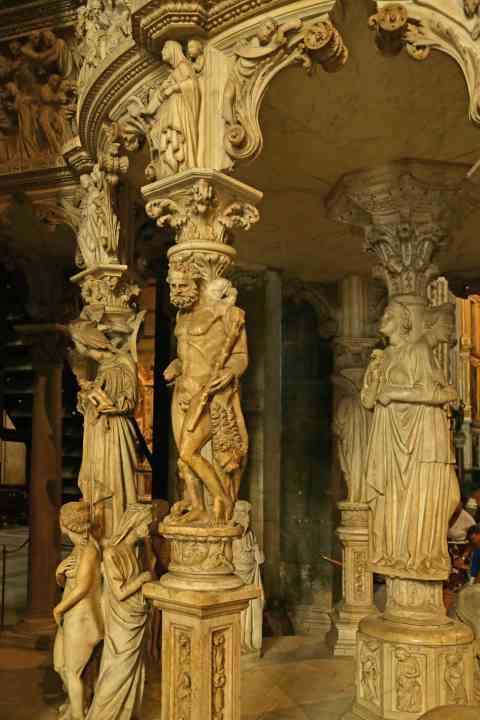 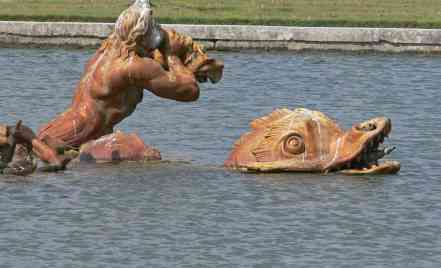 The pillars with carved figures - Hercules? 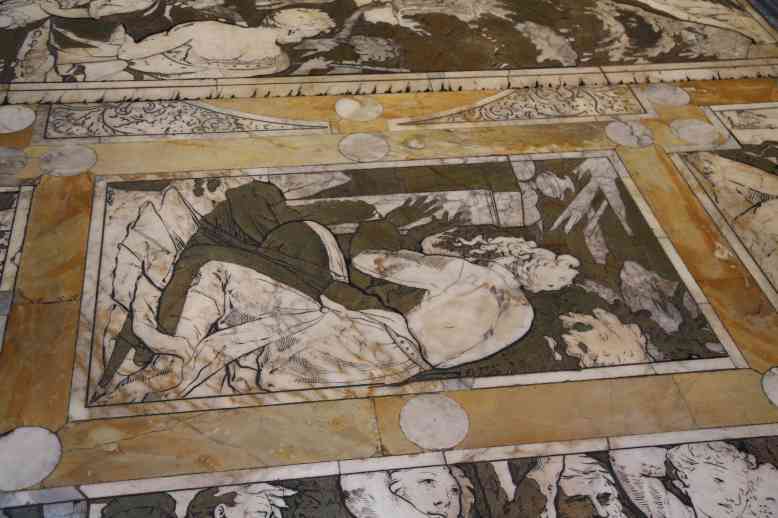 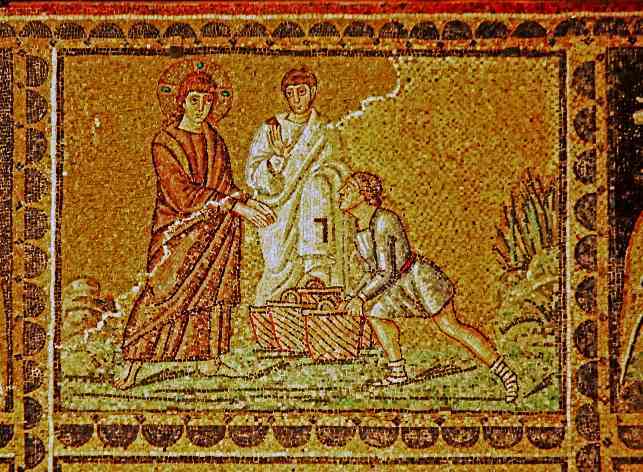 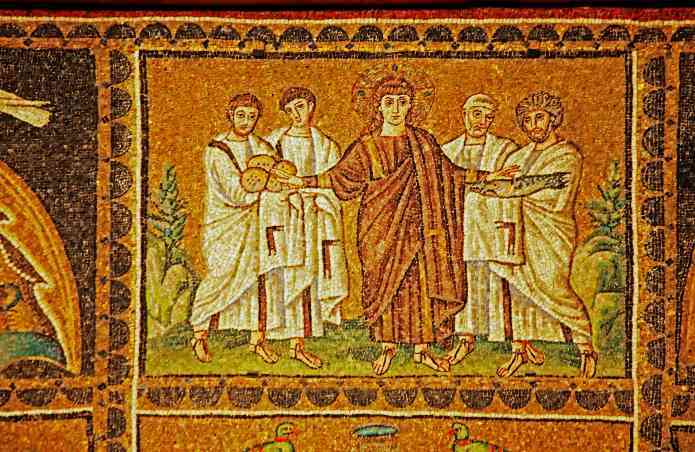 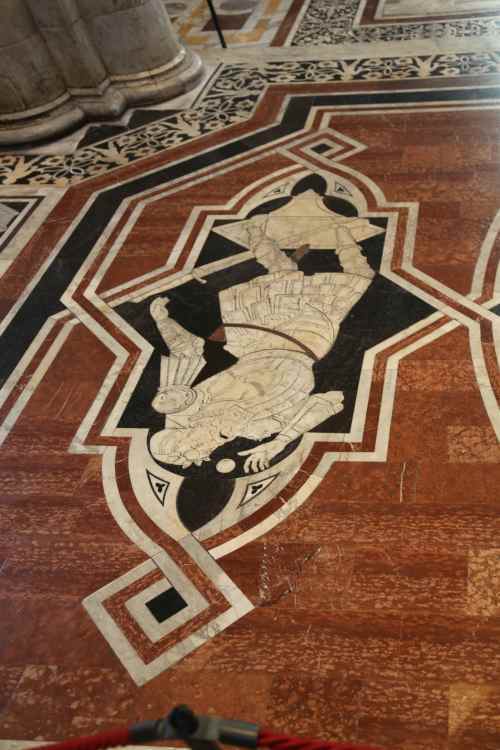 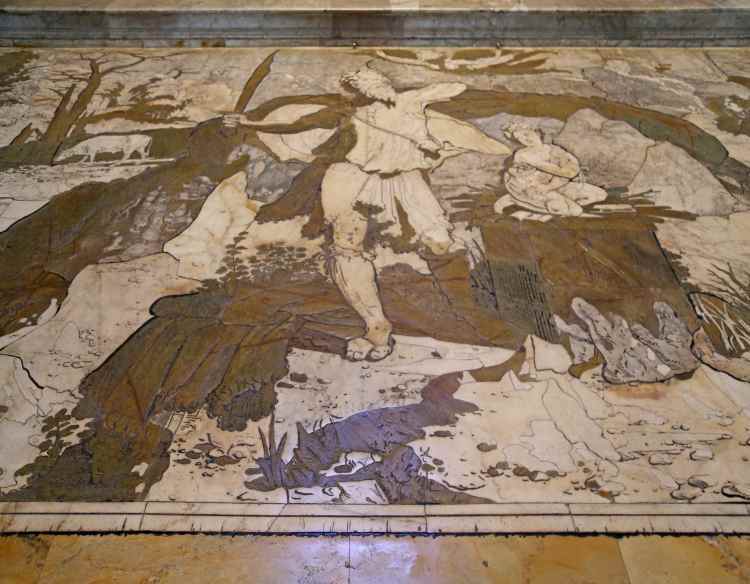 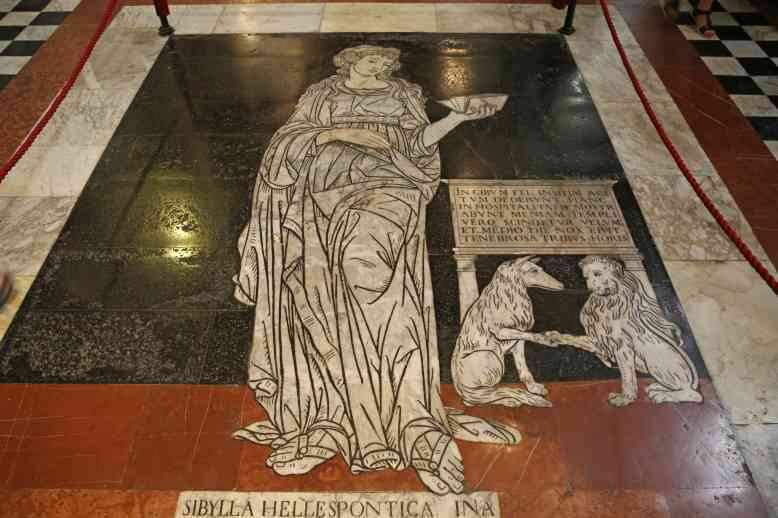 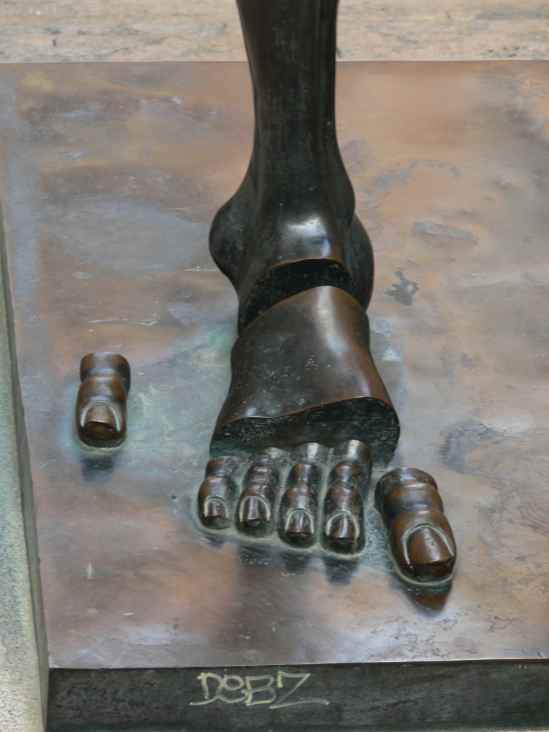 Italy Siena Duomo A pavement scene - figure receiving a revelation? 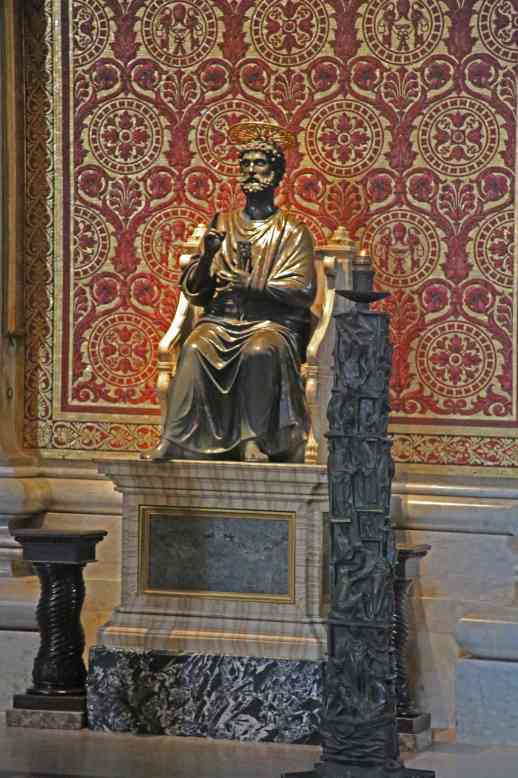 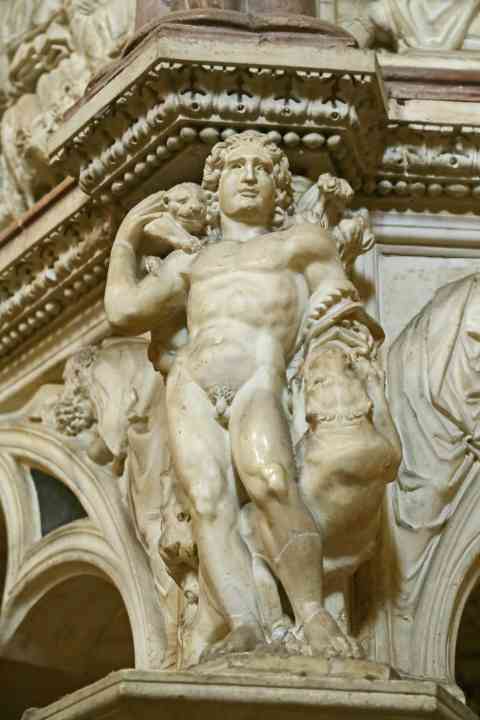 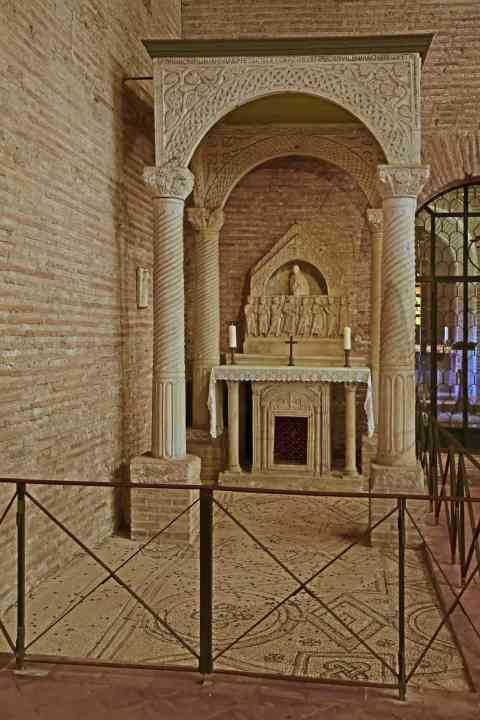 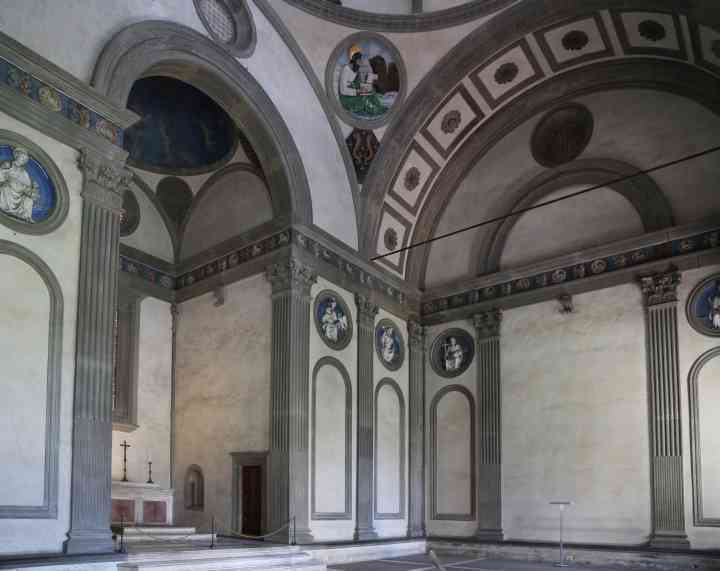 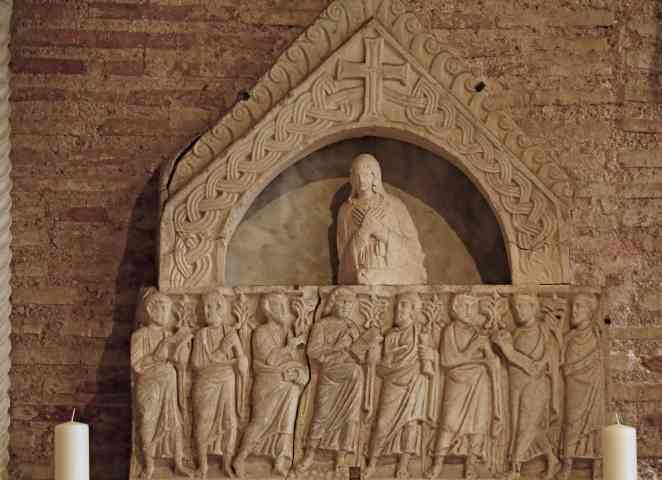 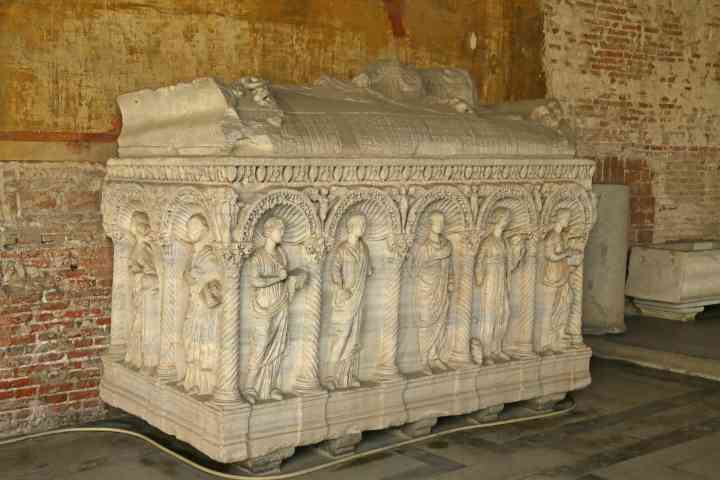 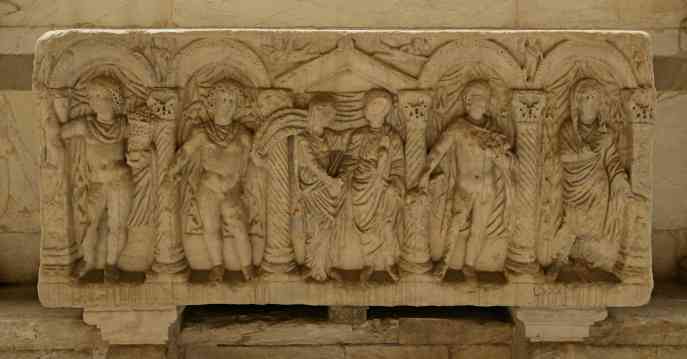 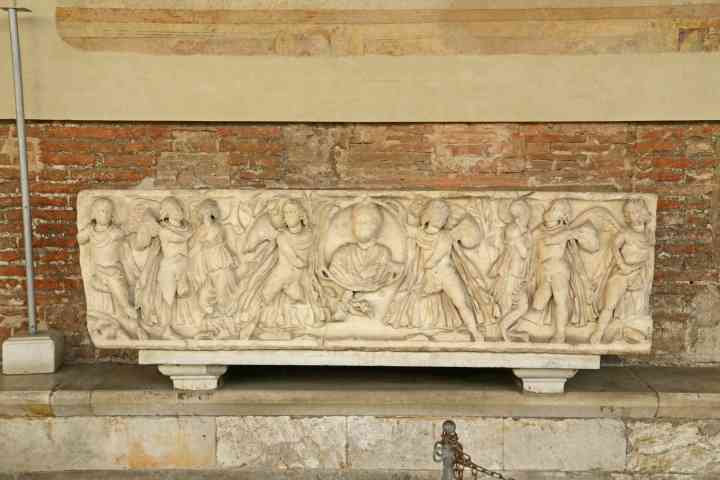 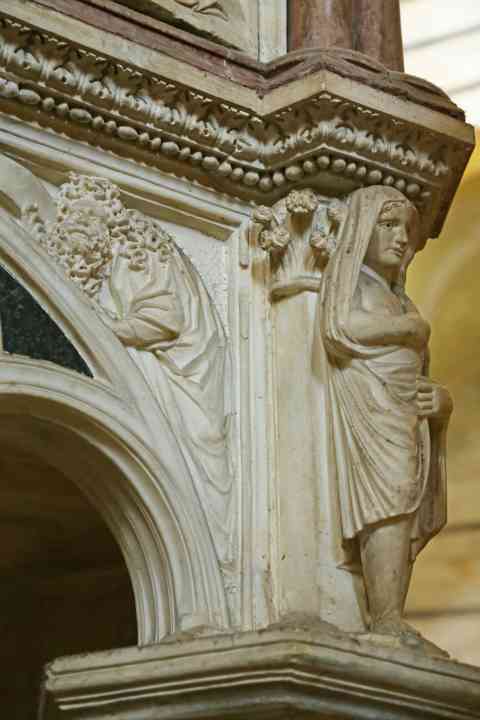 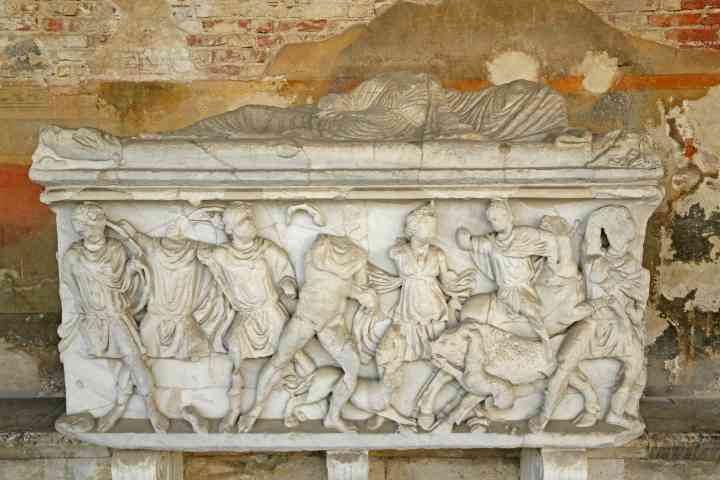 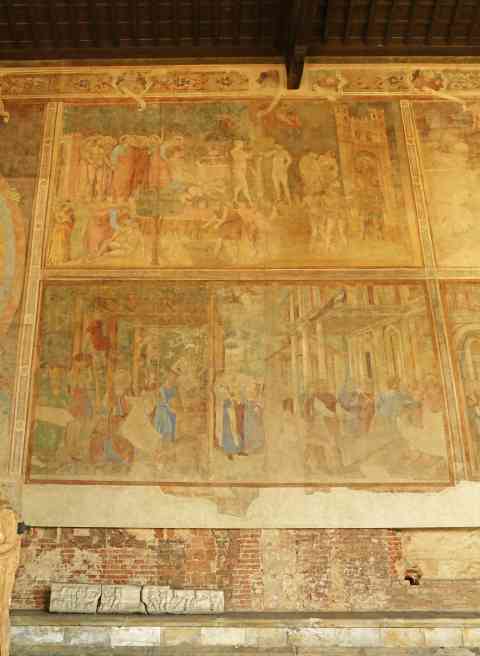 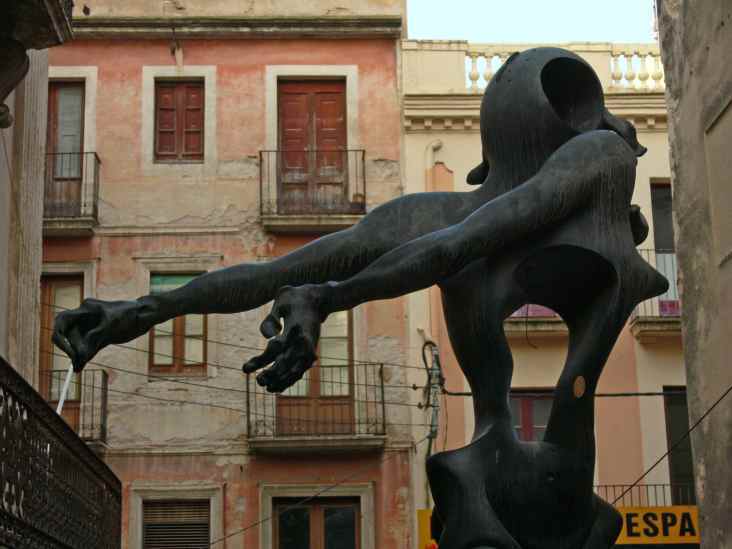 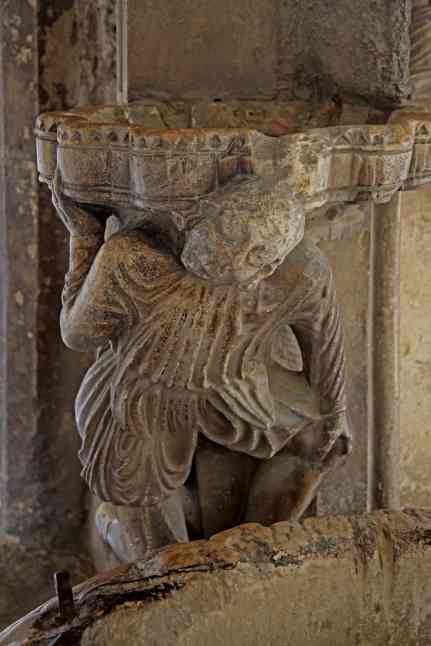 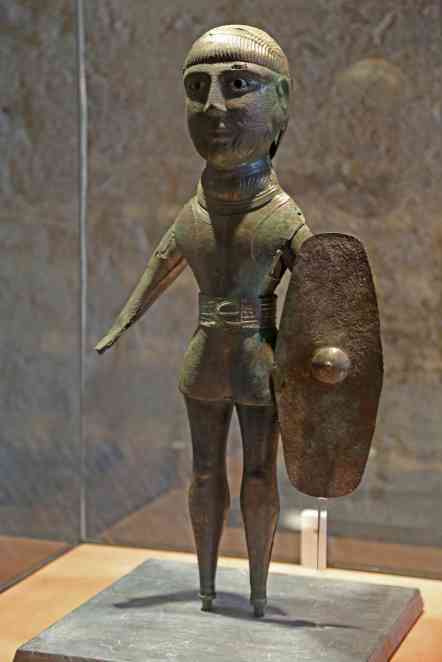 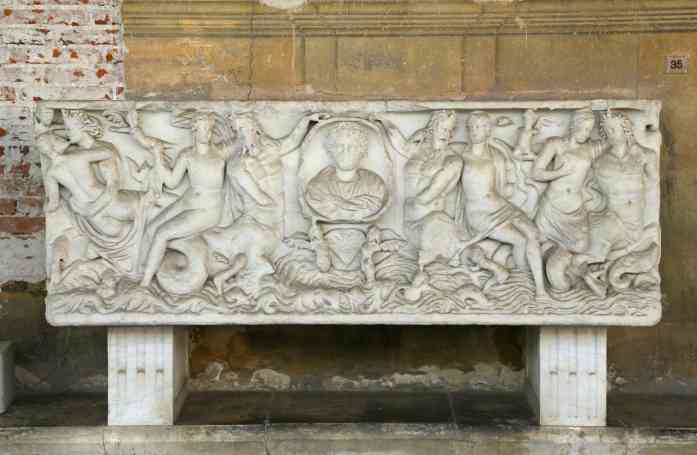 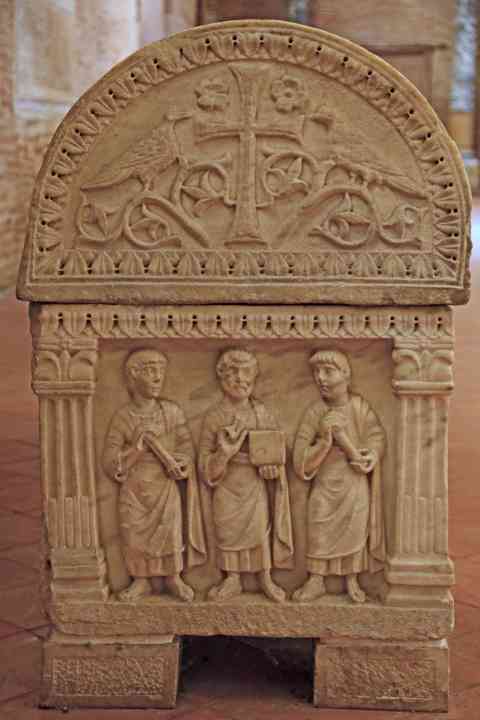 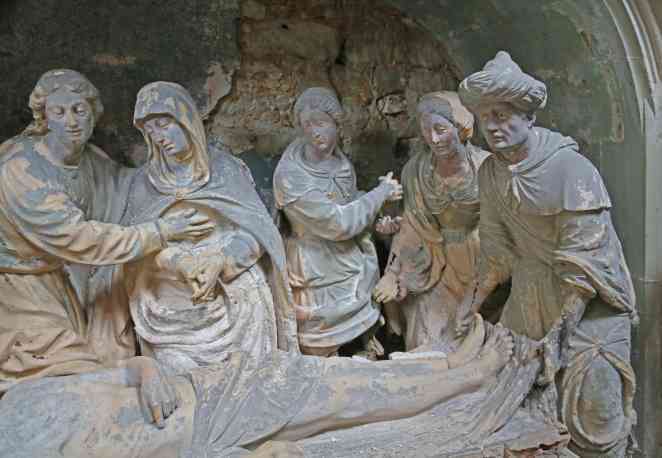 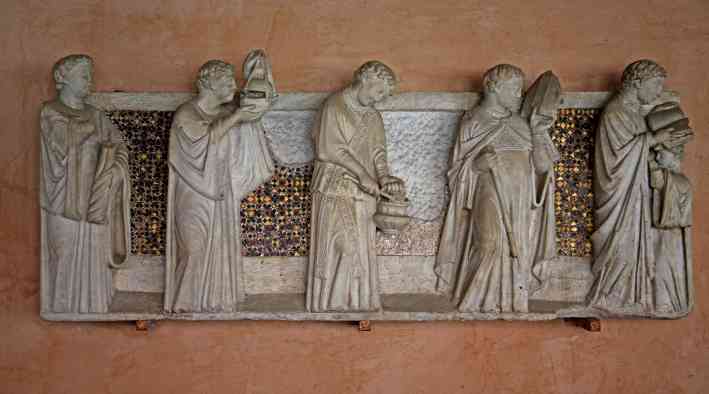 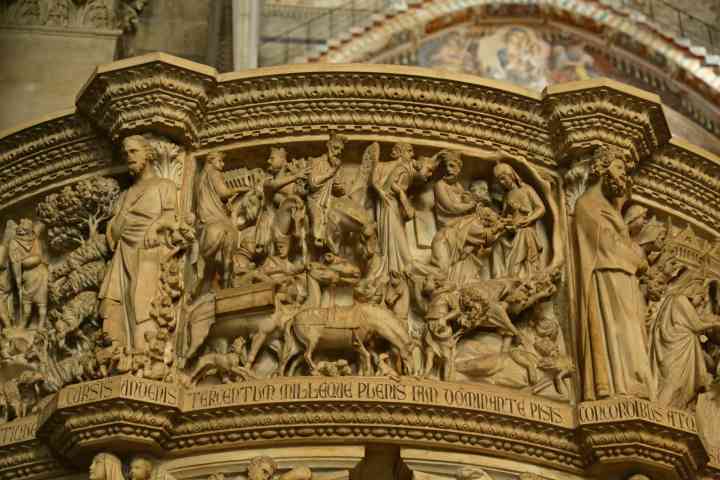 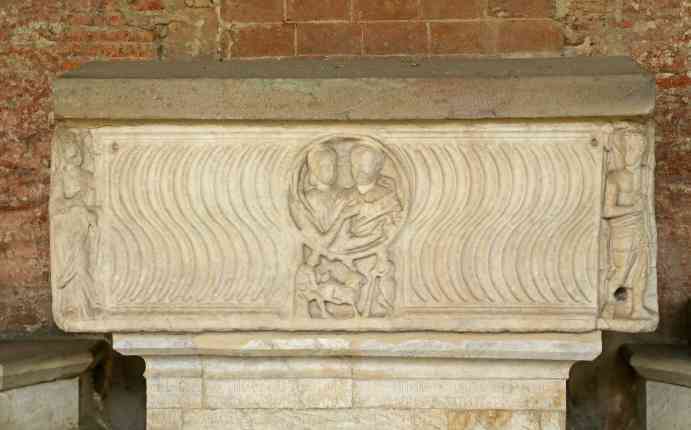 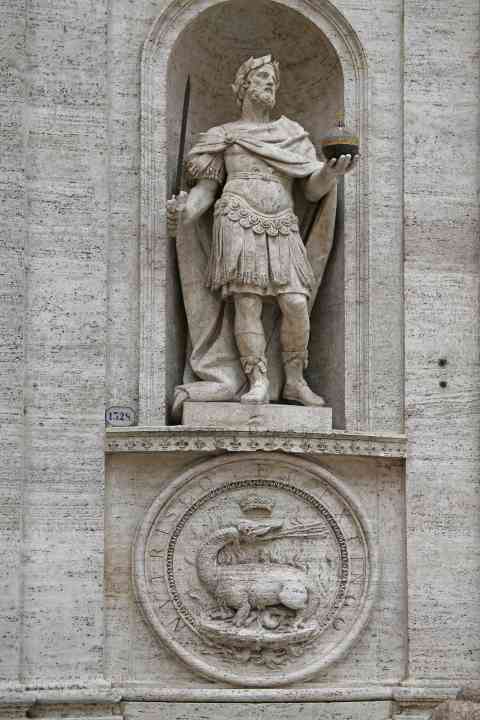 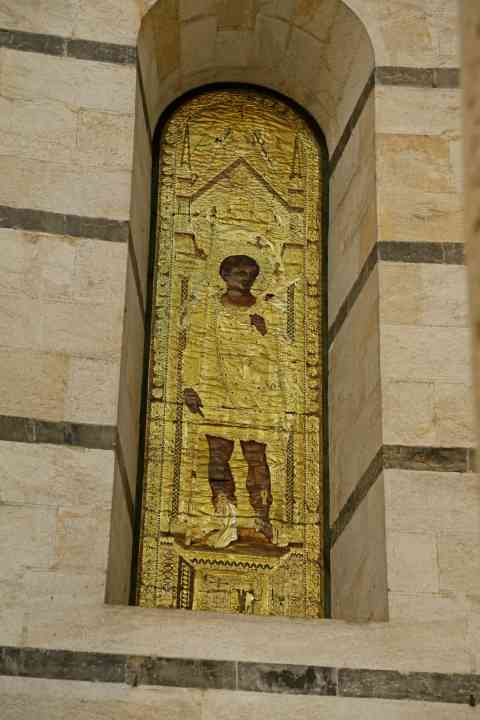 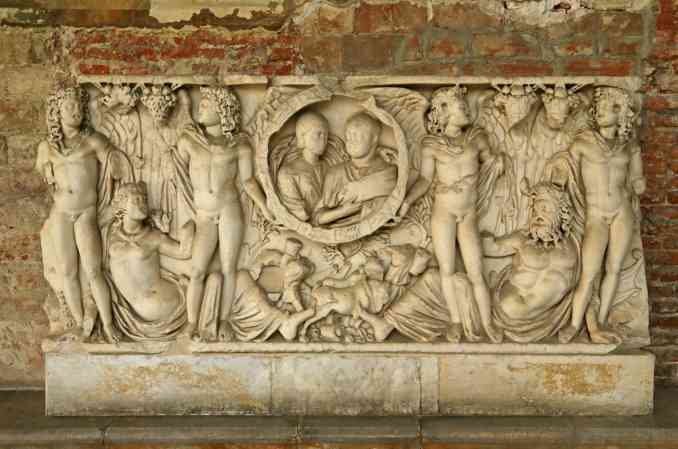 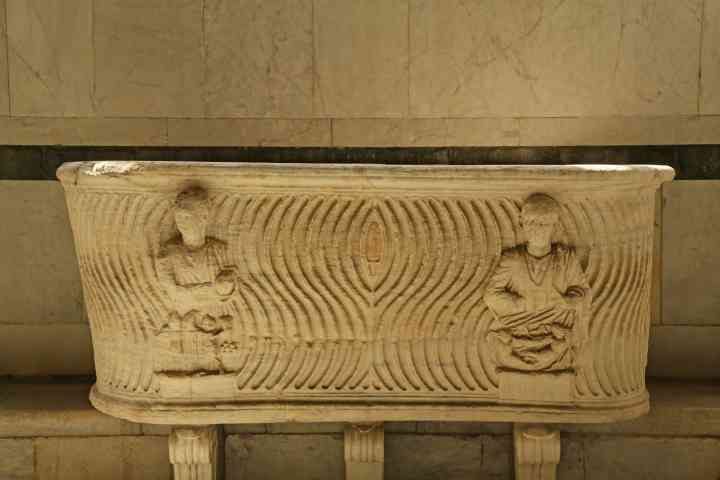 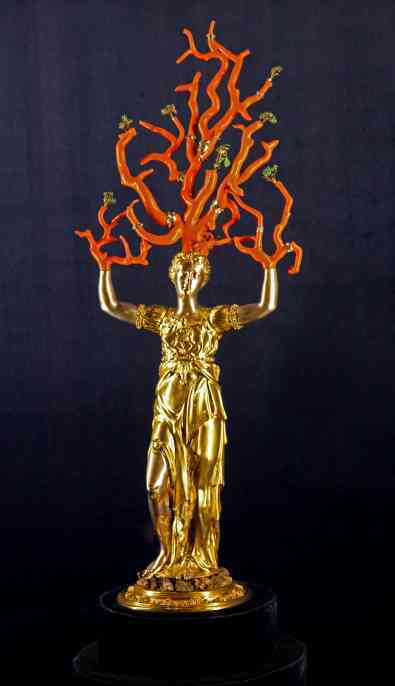 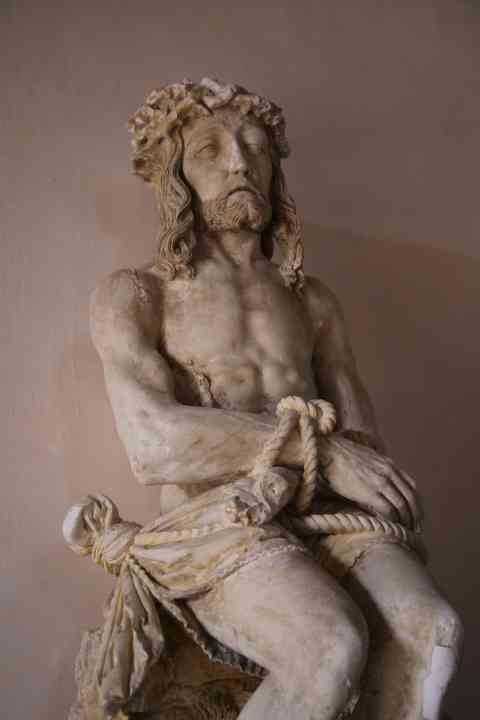 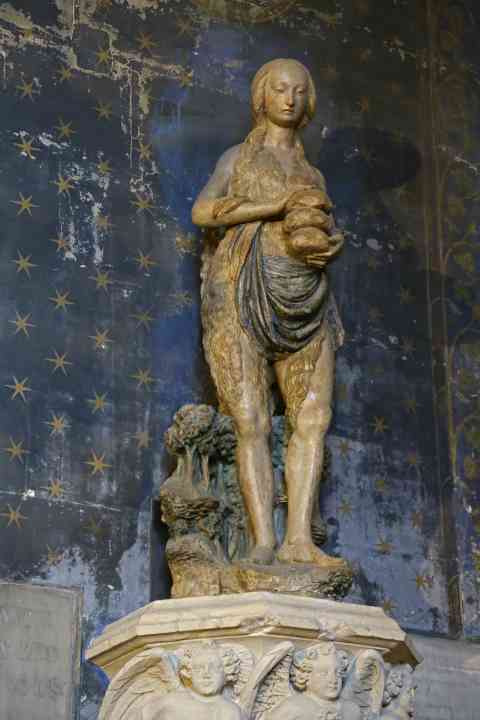 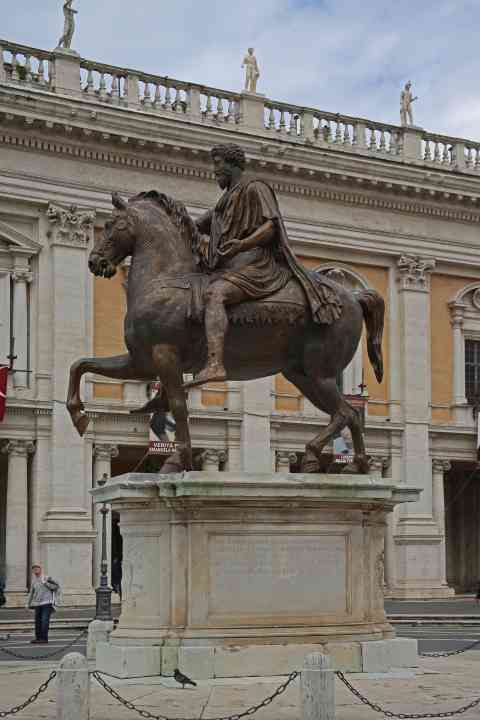 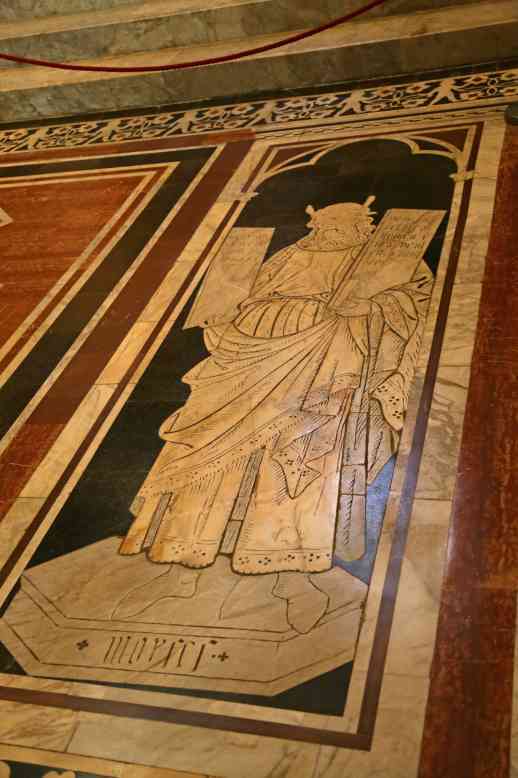 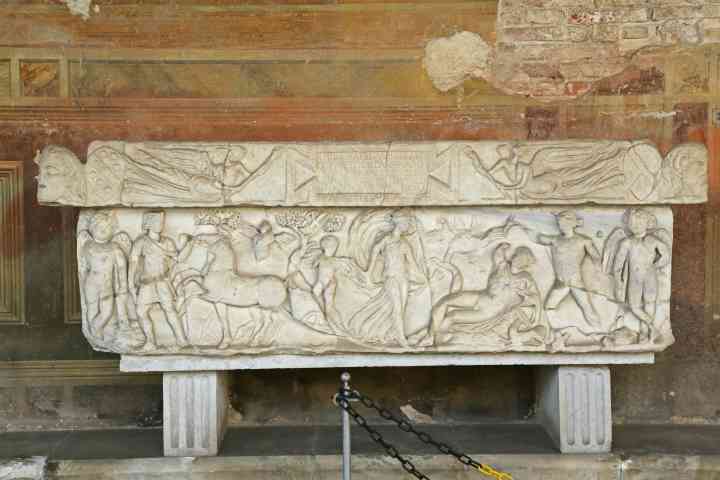 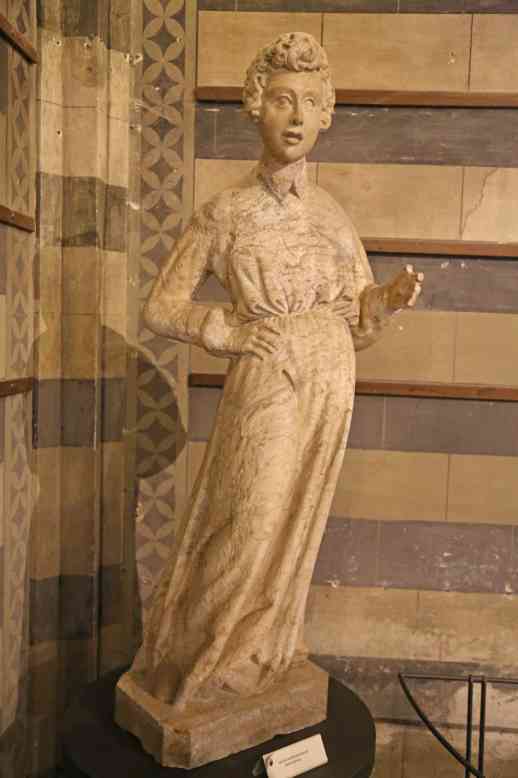 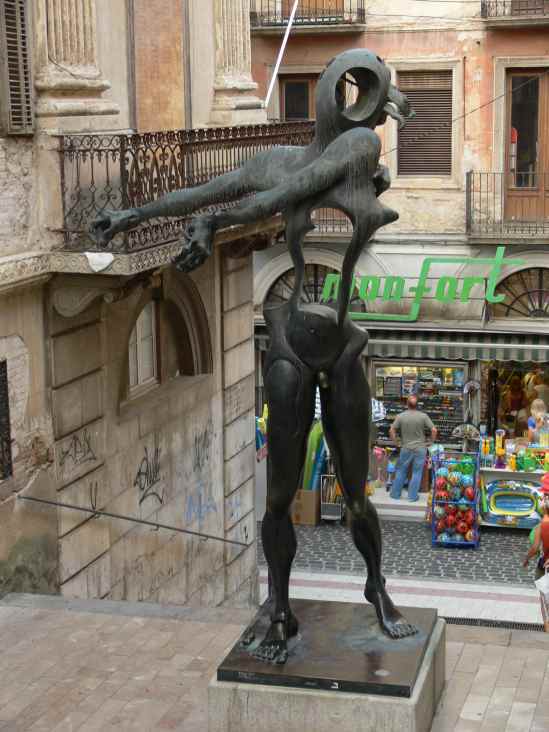 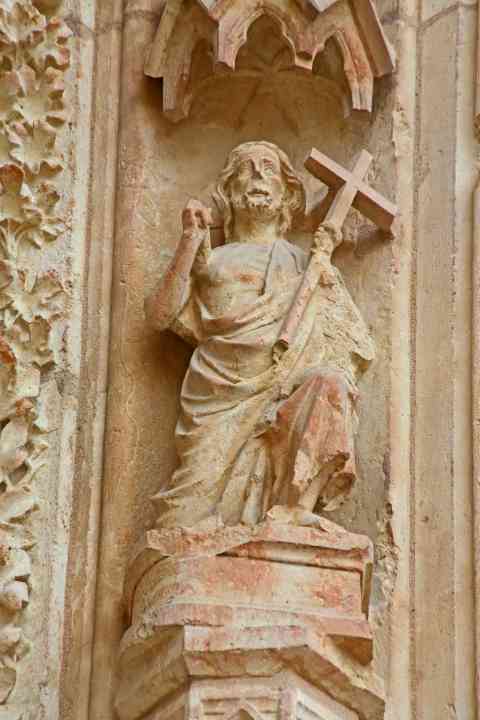 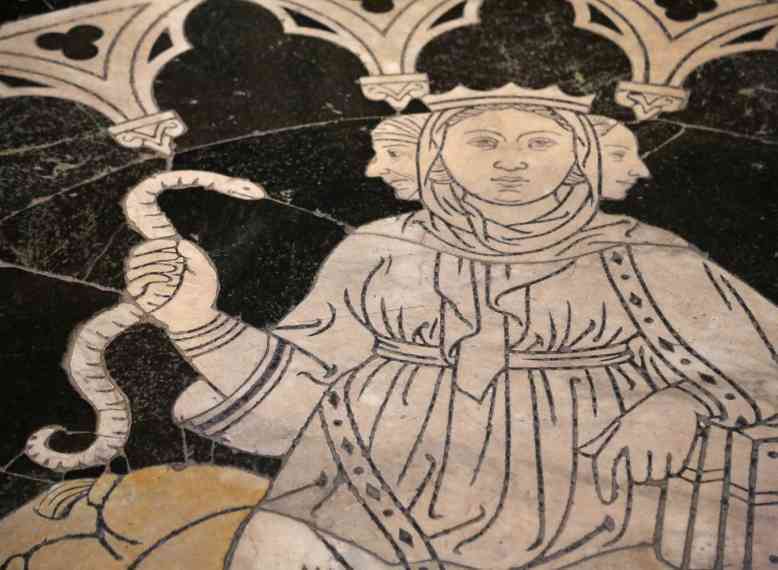 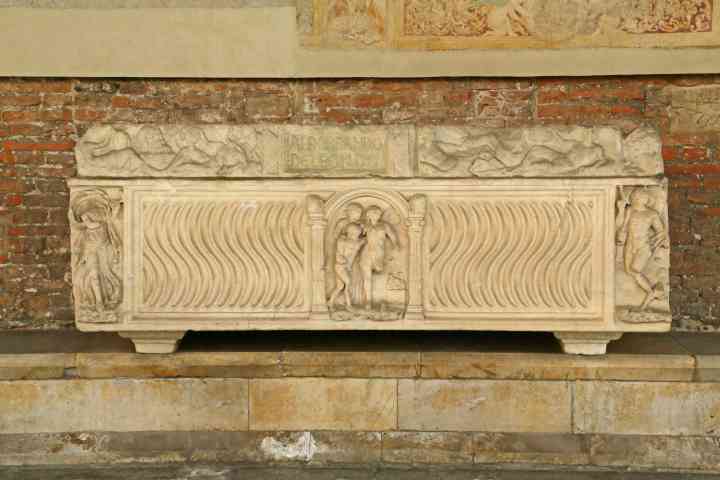 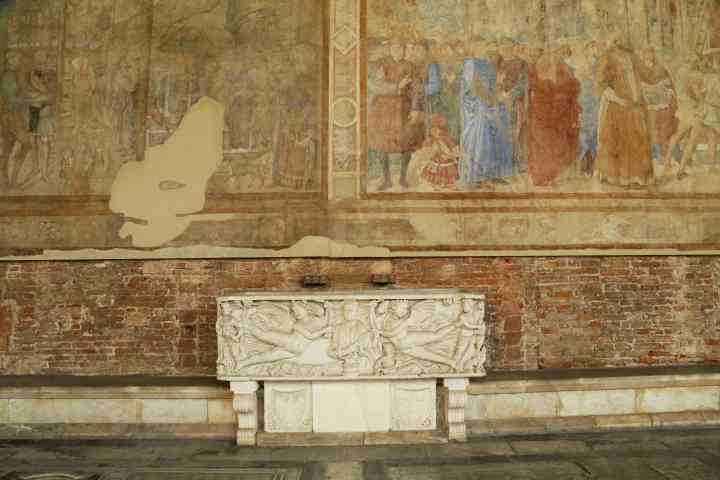 Italy Siena Baptistery Statue of ?